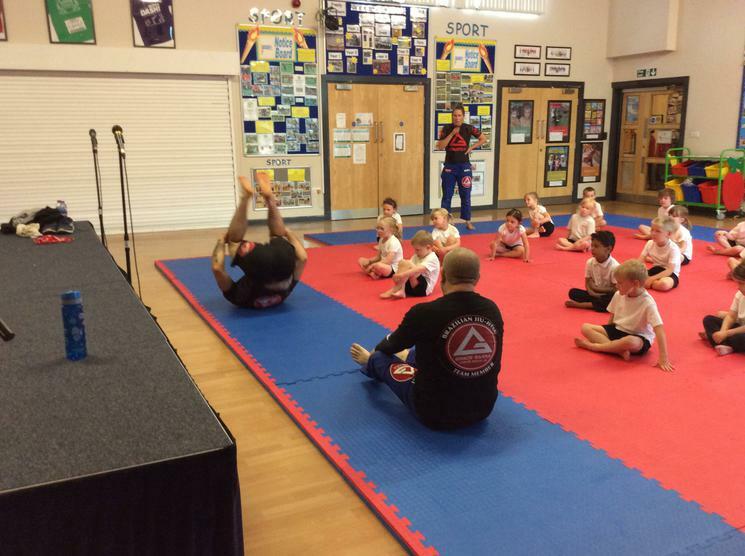 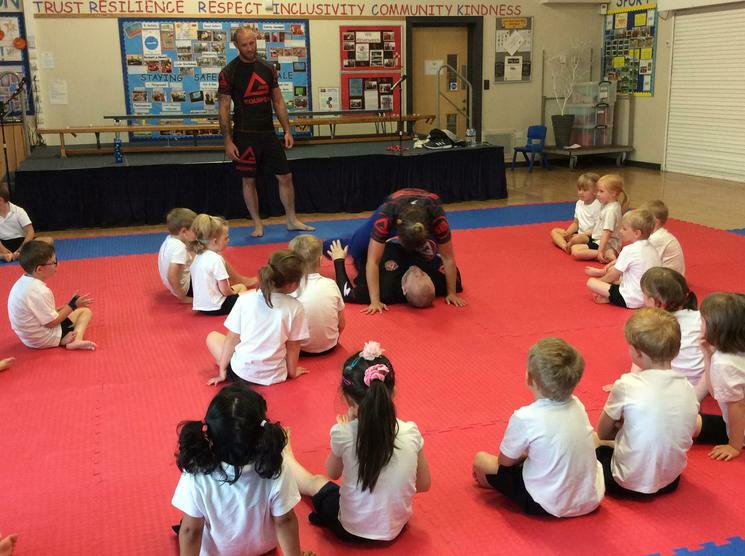 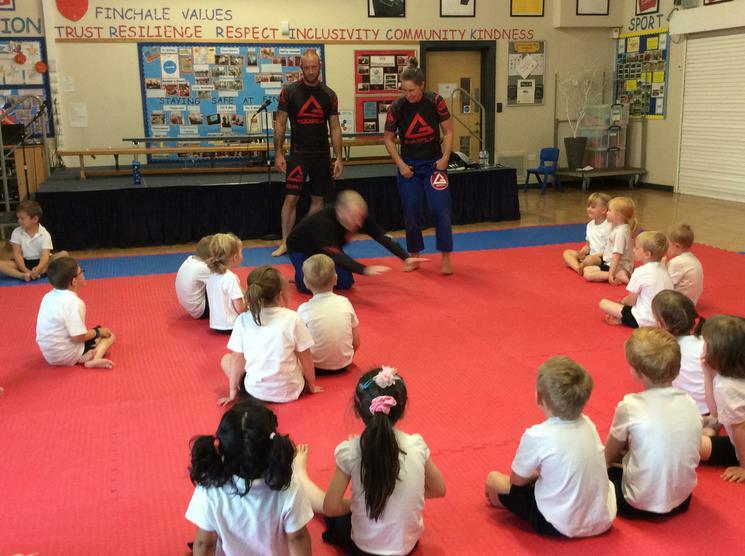 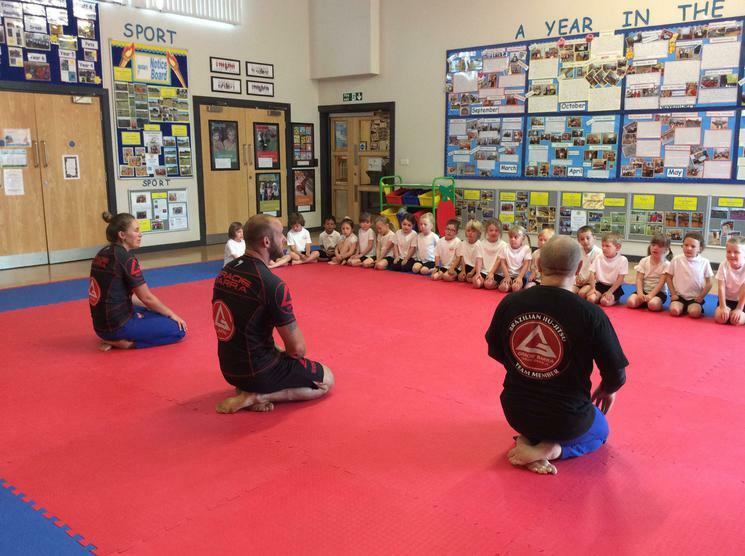 Bobby, Krissi and Pete from ‘Champions of Movement’ came into school. 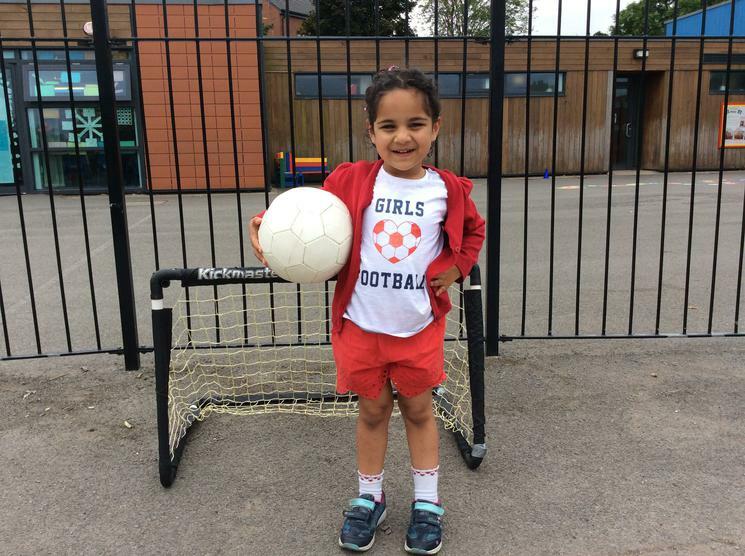 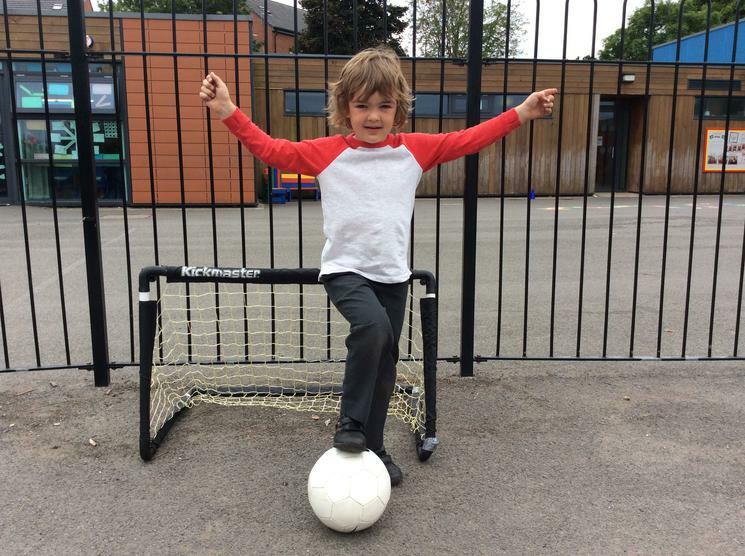 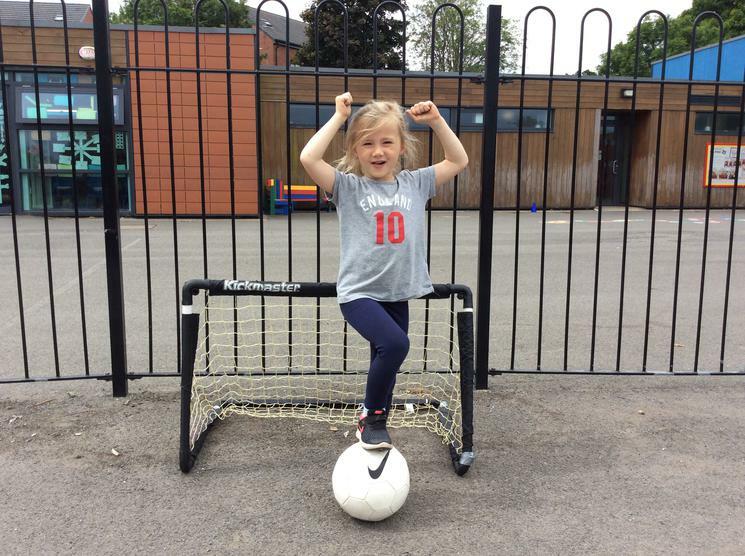 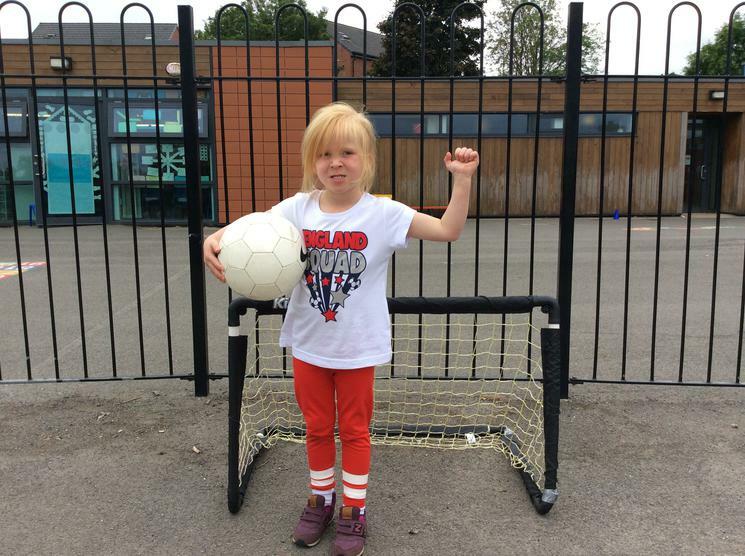 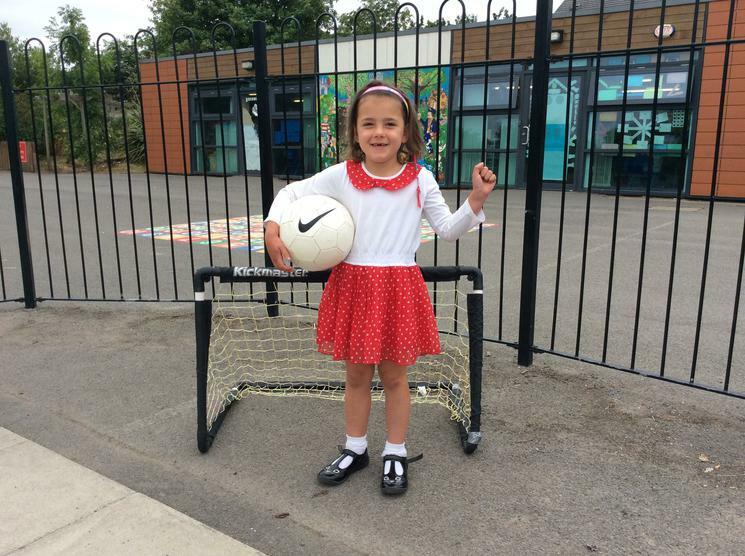 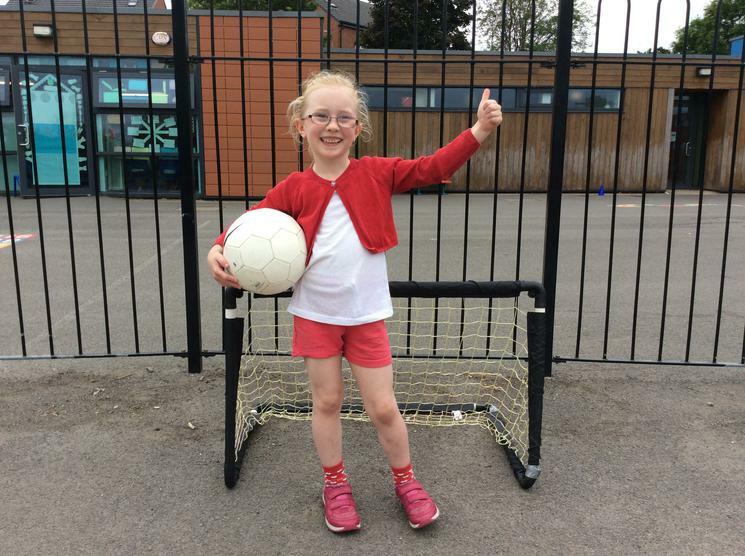 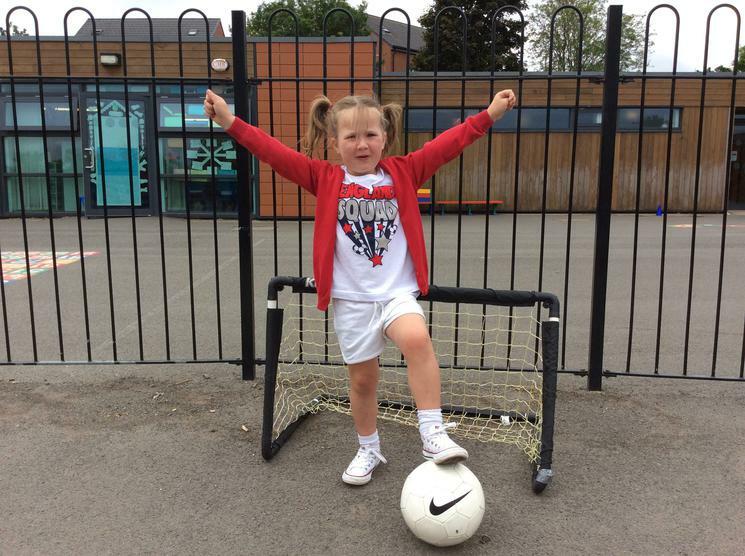 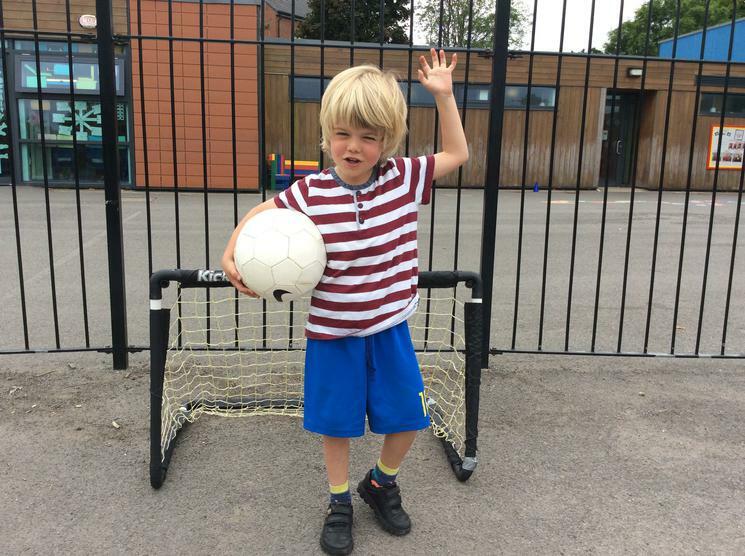 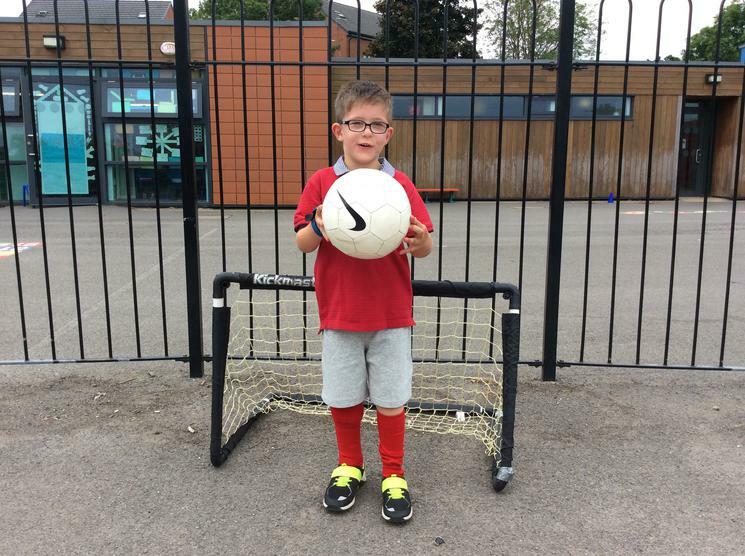 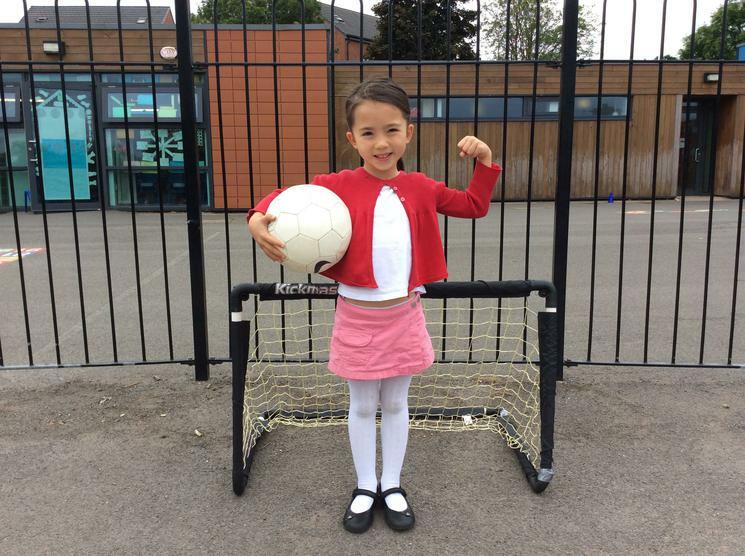 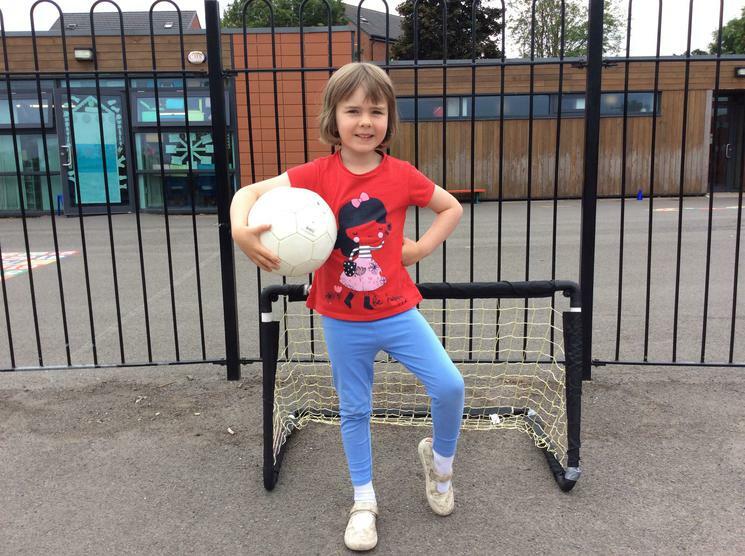 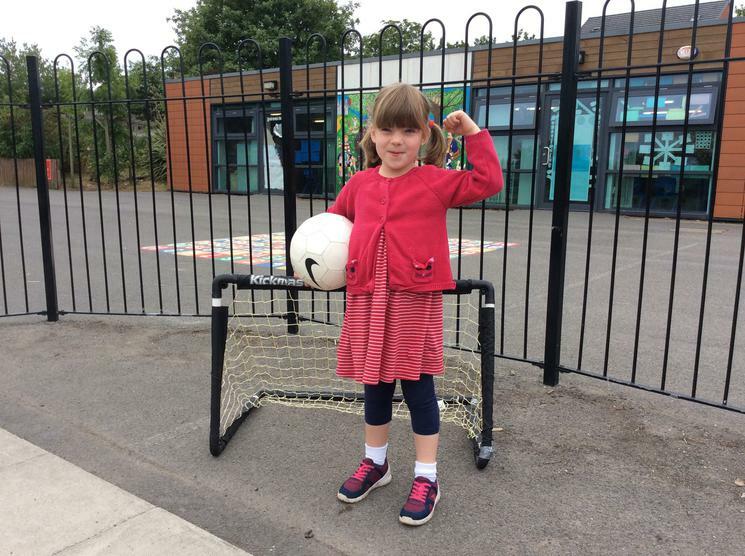 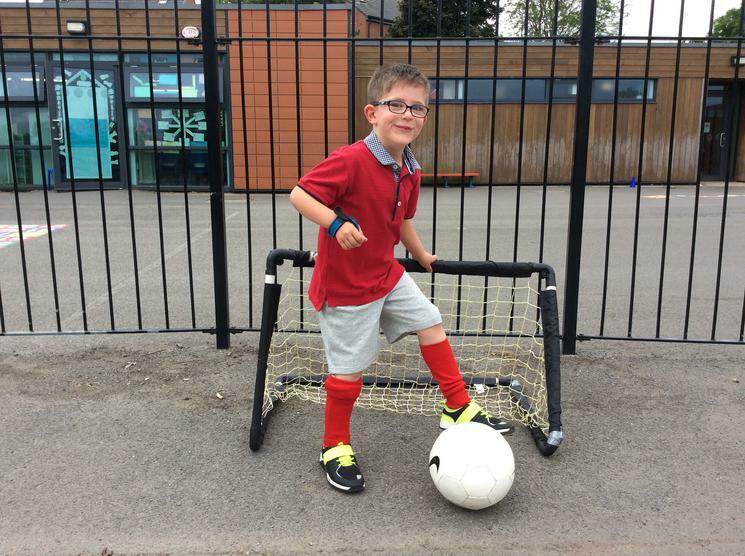 Football Fever - we came to school in red and white to wish the England team good luck! 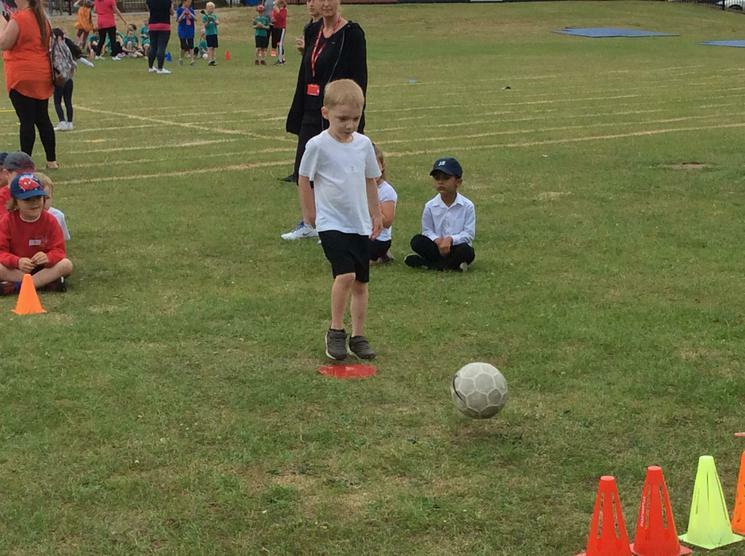 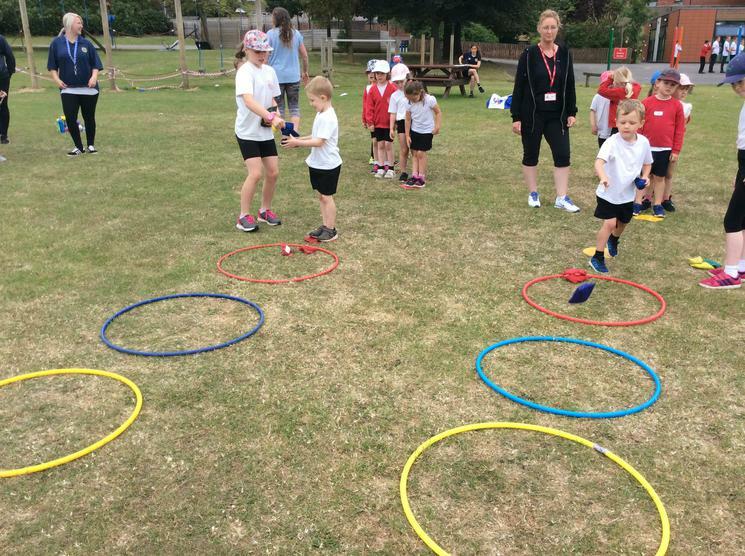 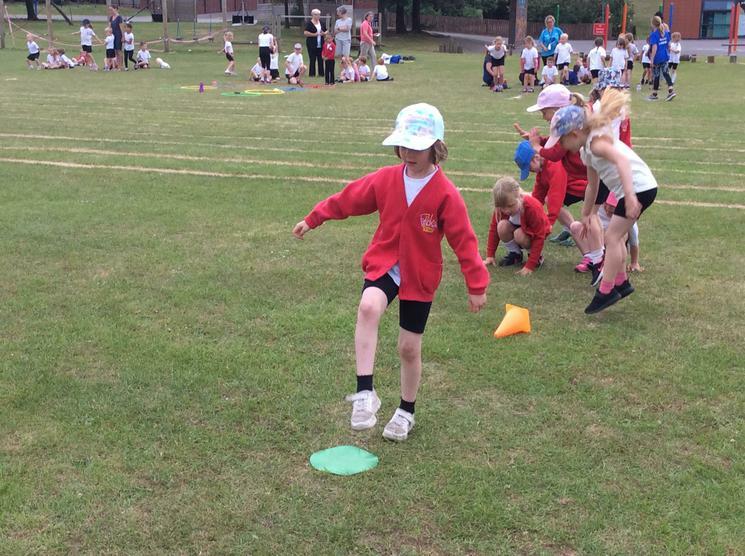 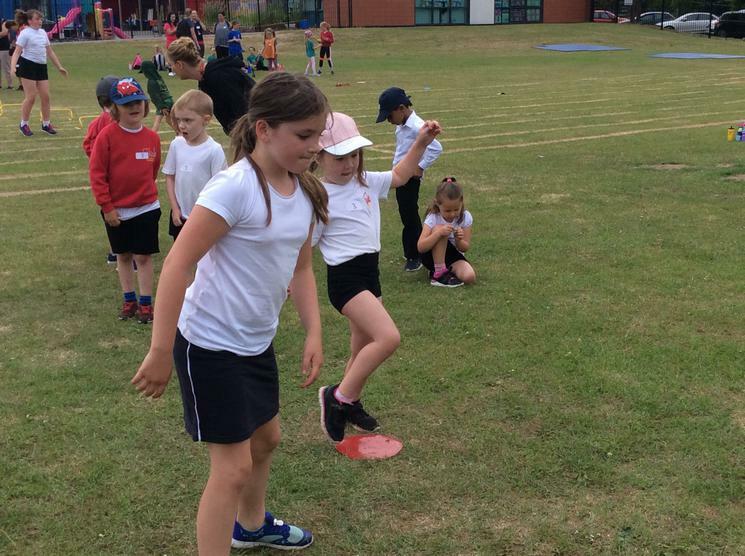 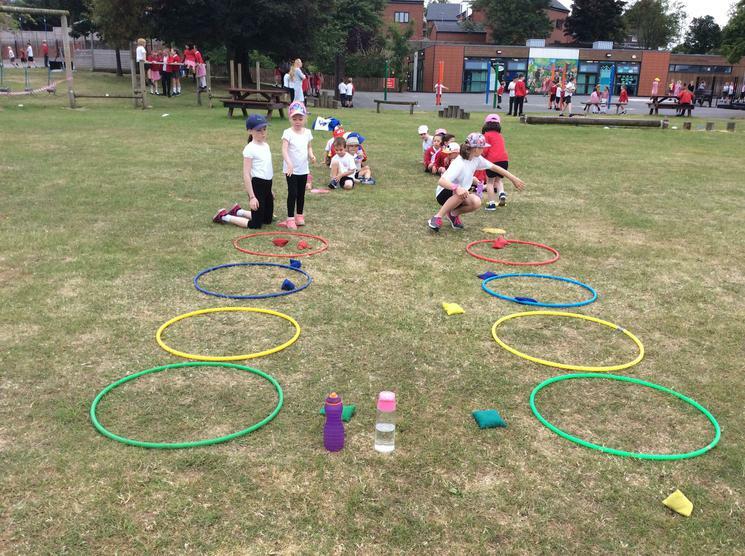 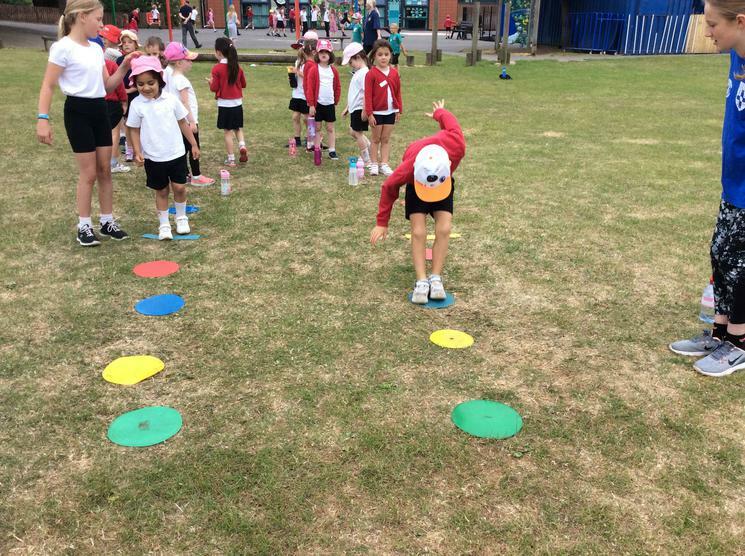 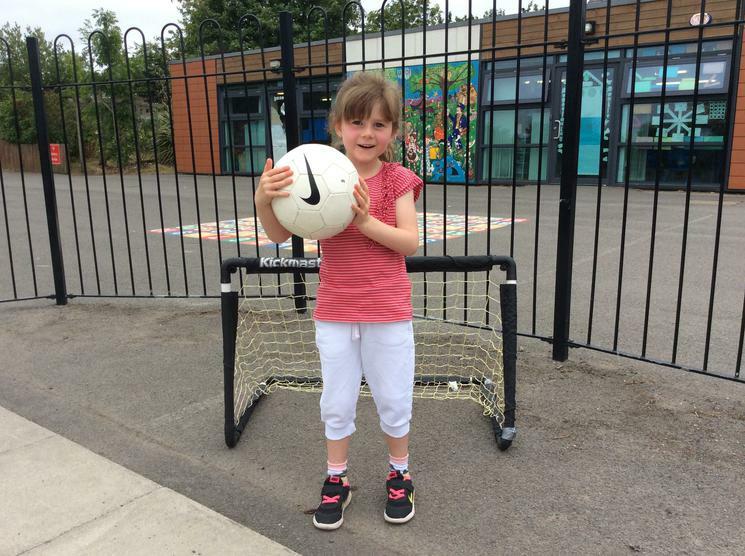 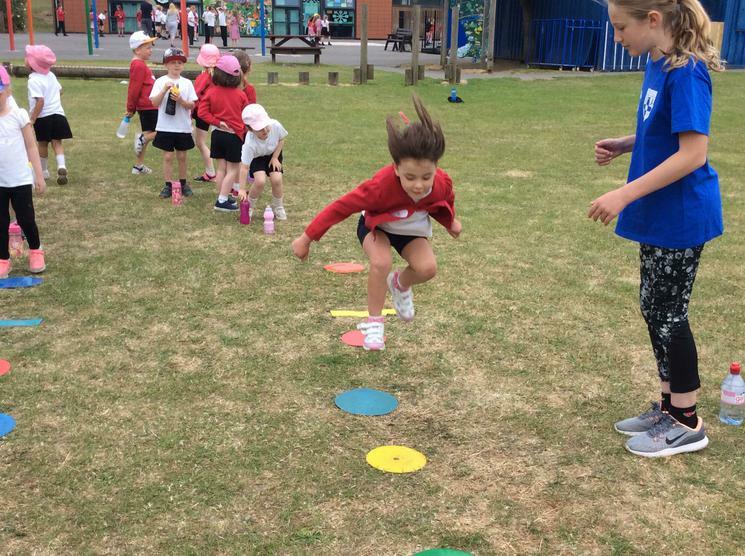 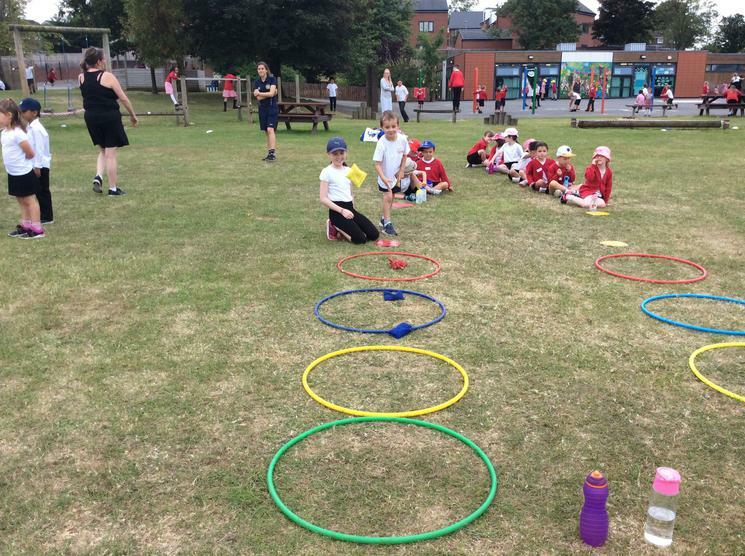 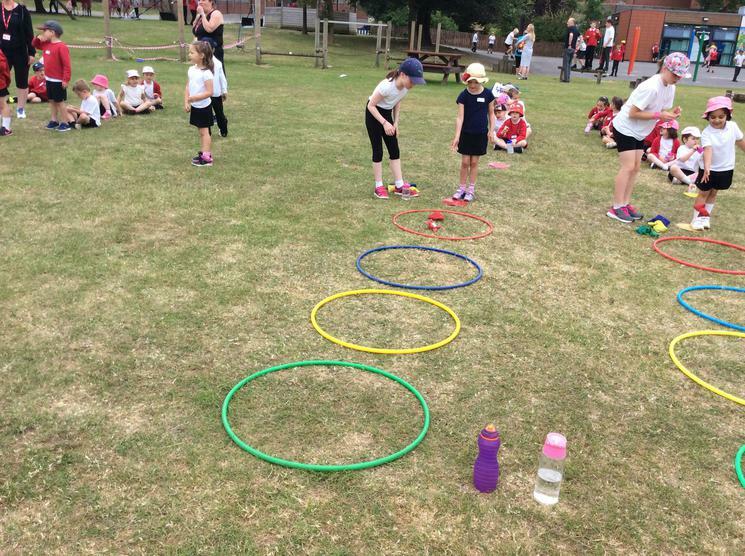 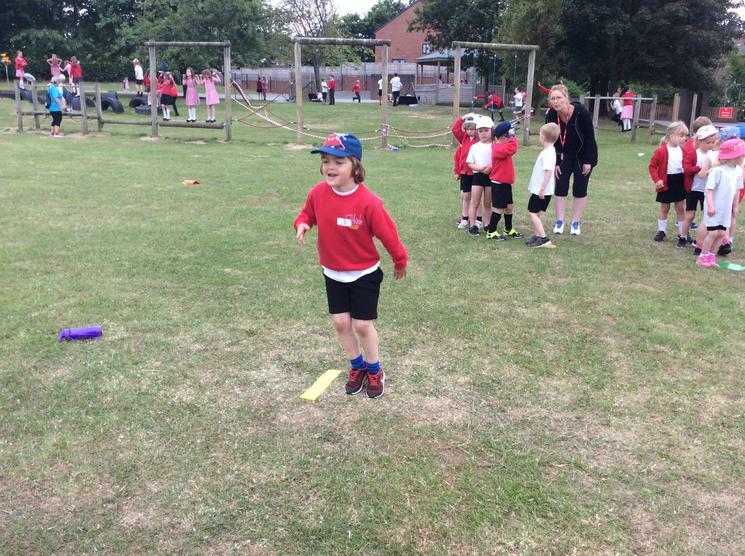 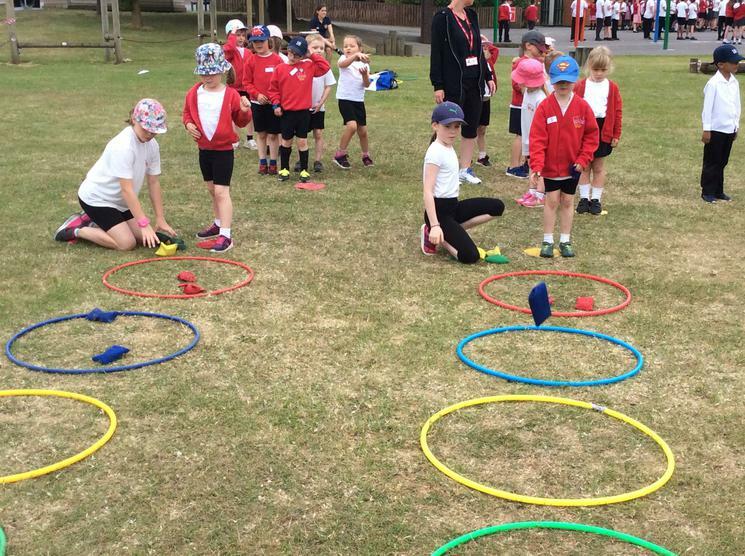 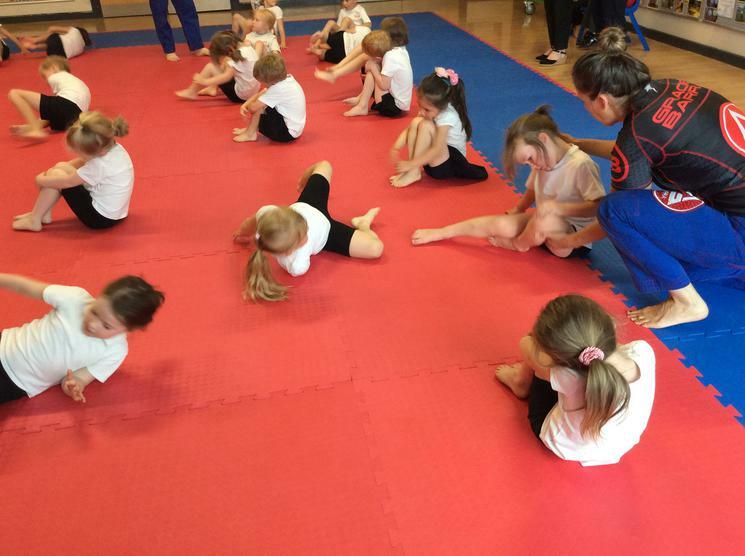 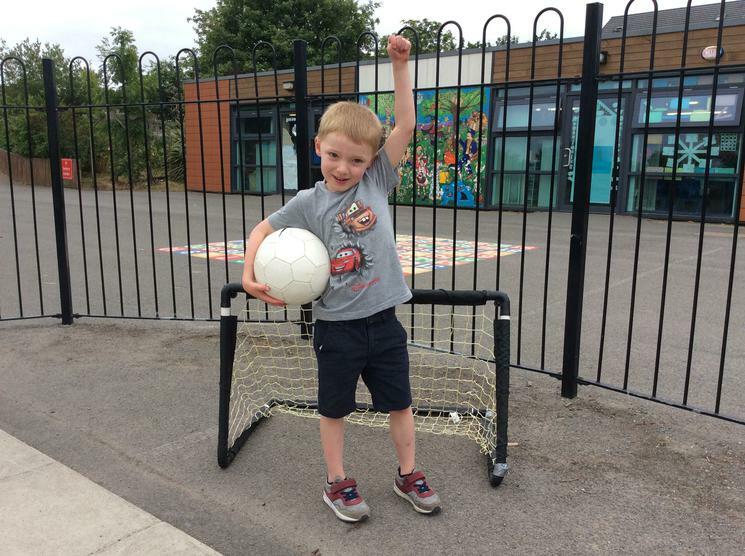 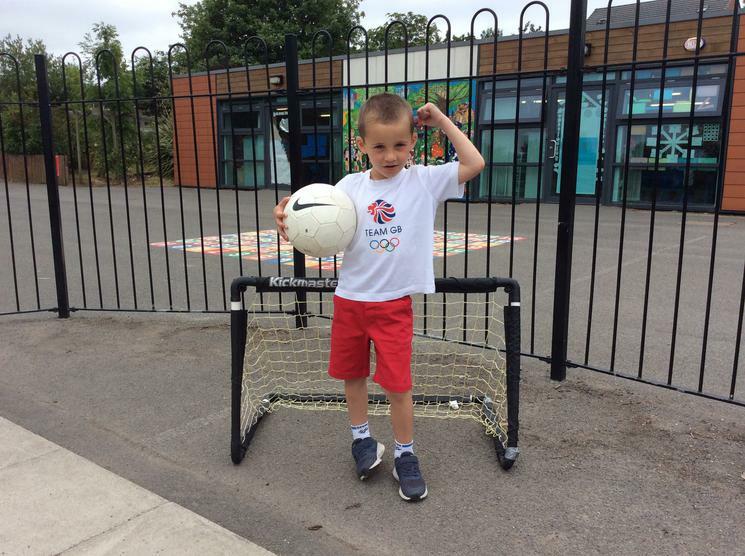 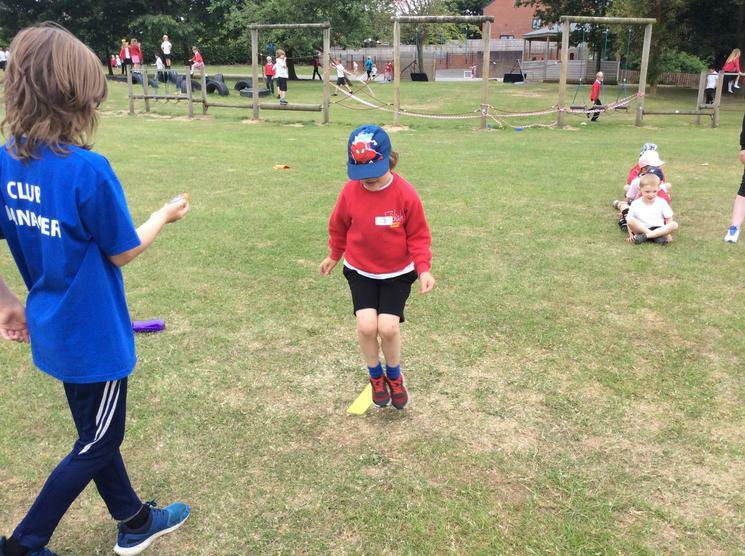 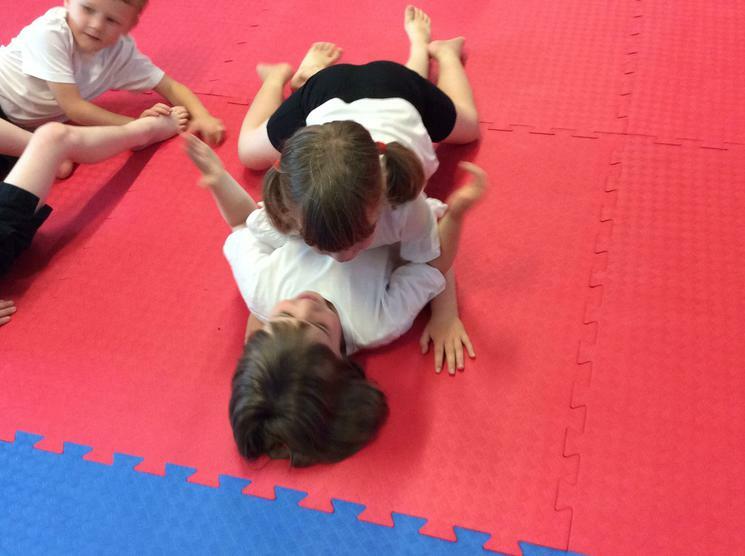 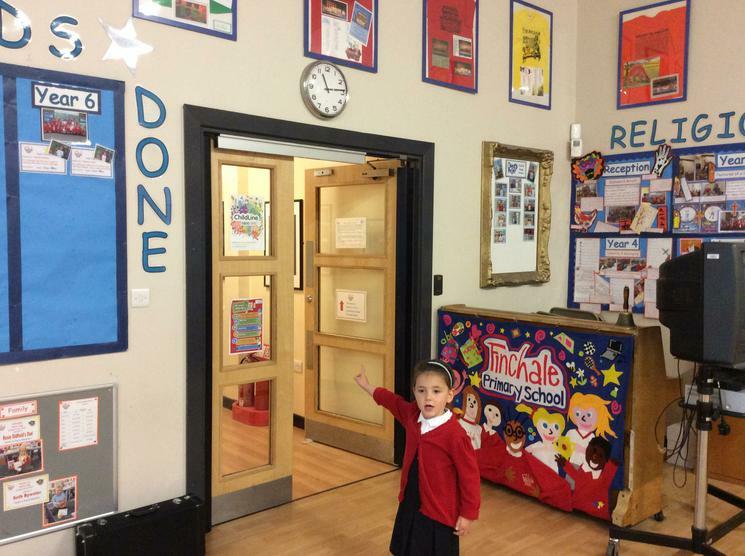 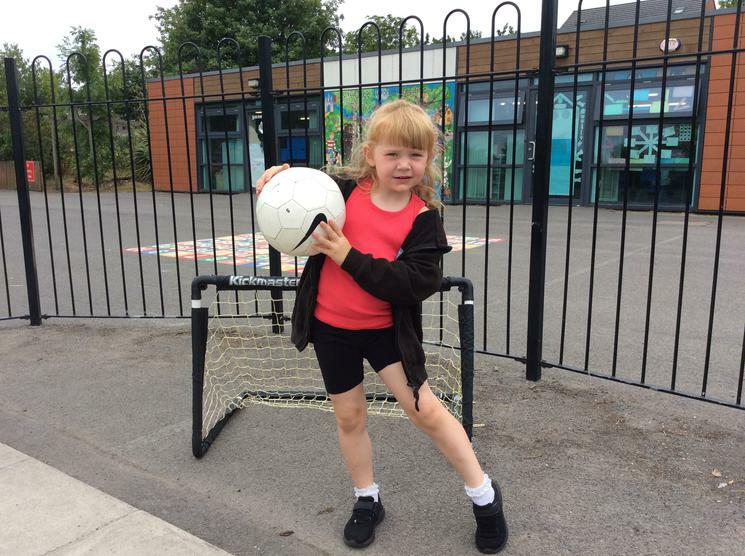 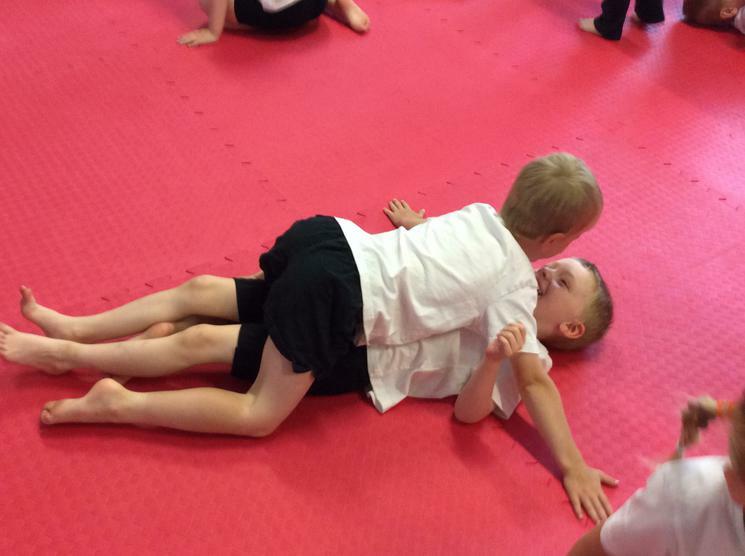 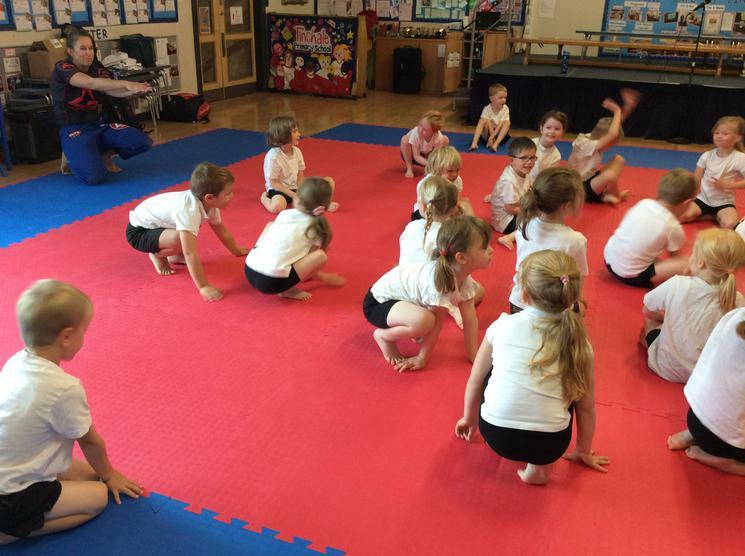 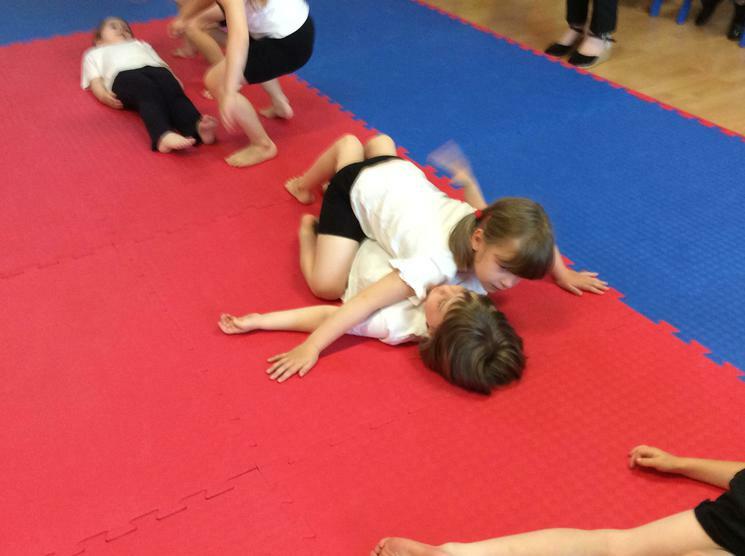 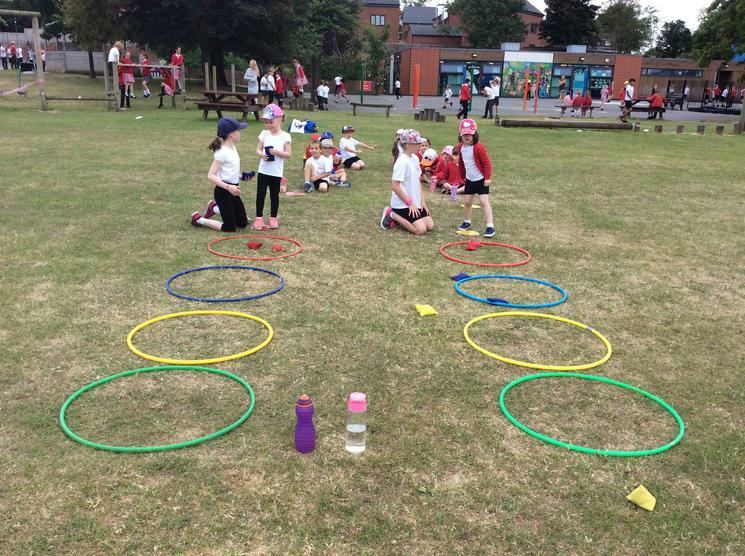 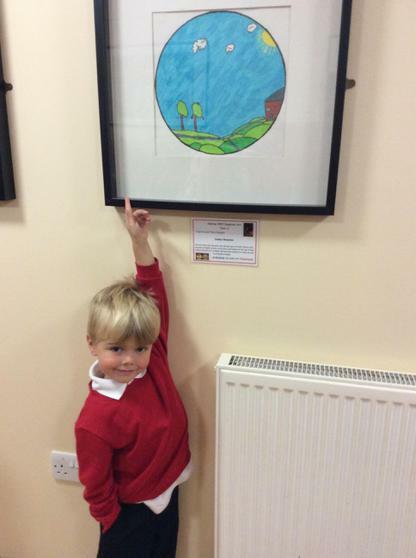 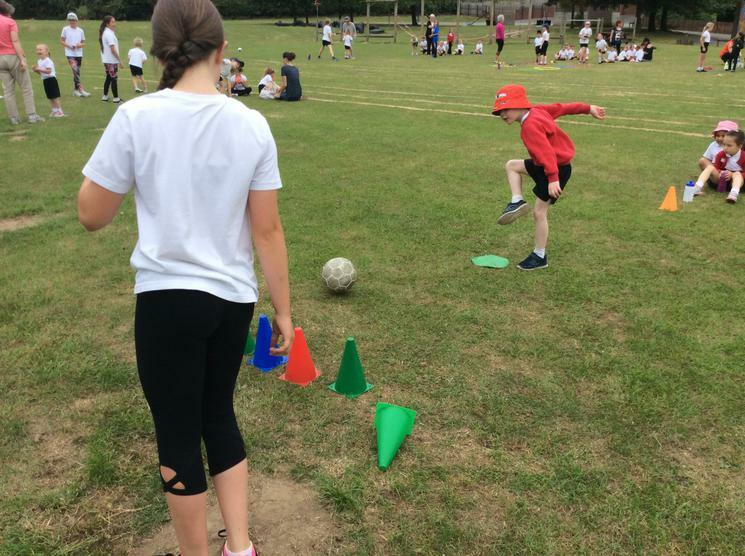 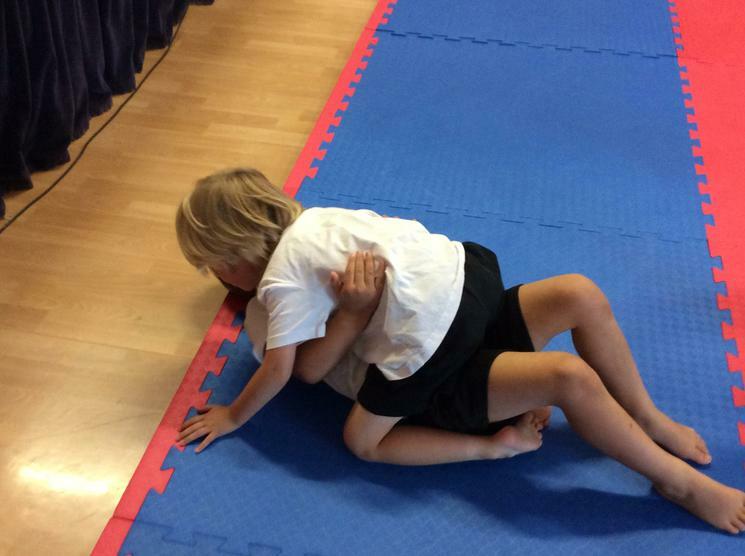 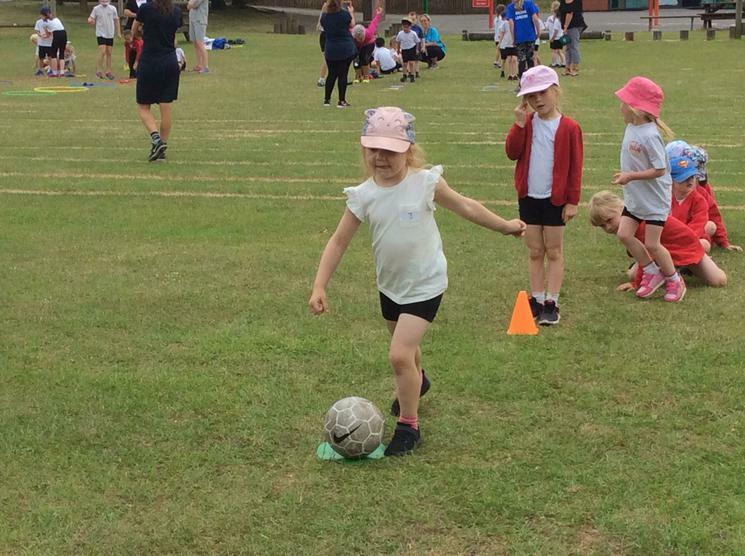 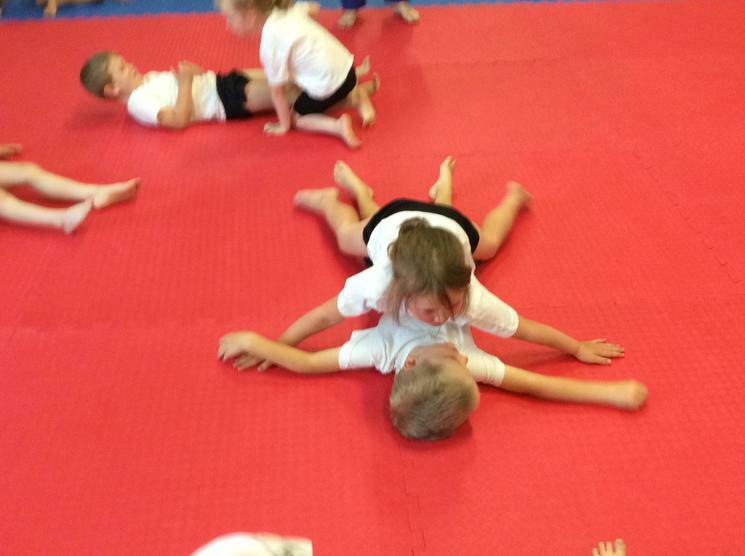 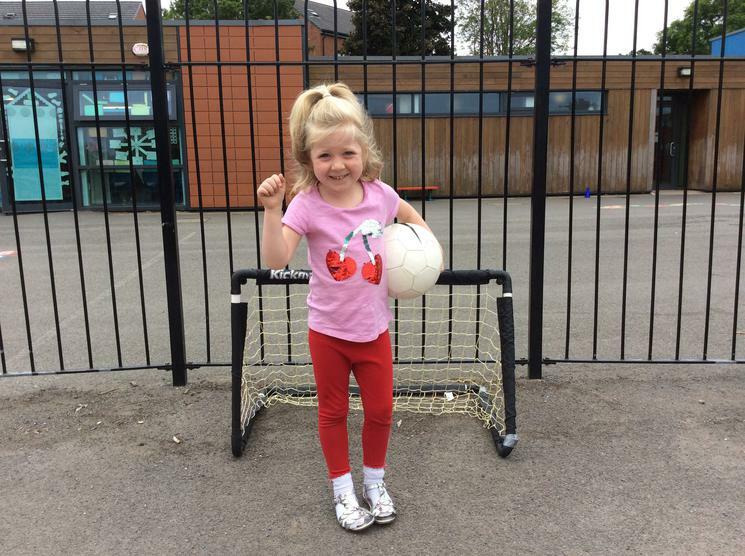 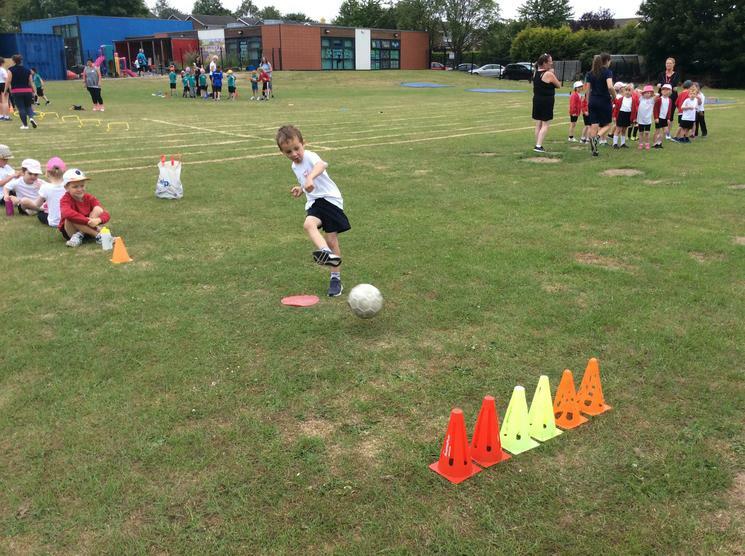 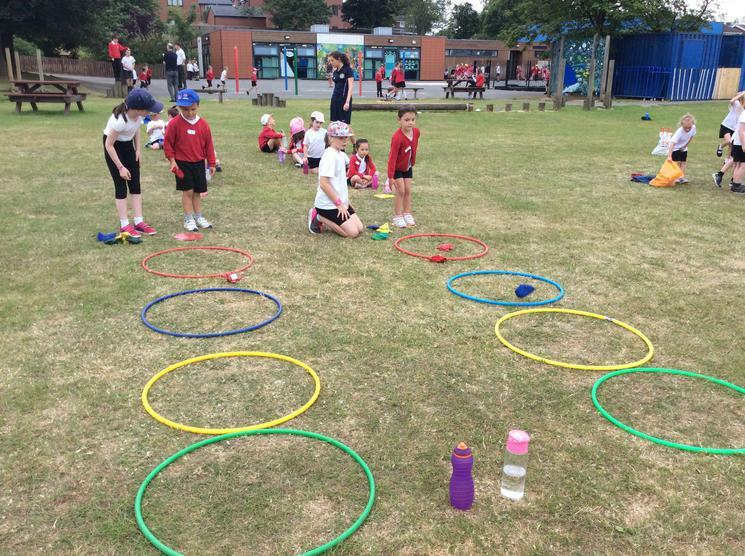 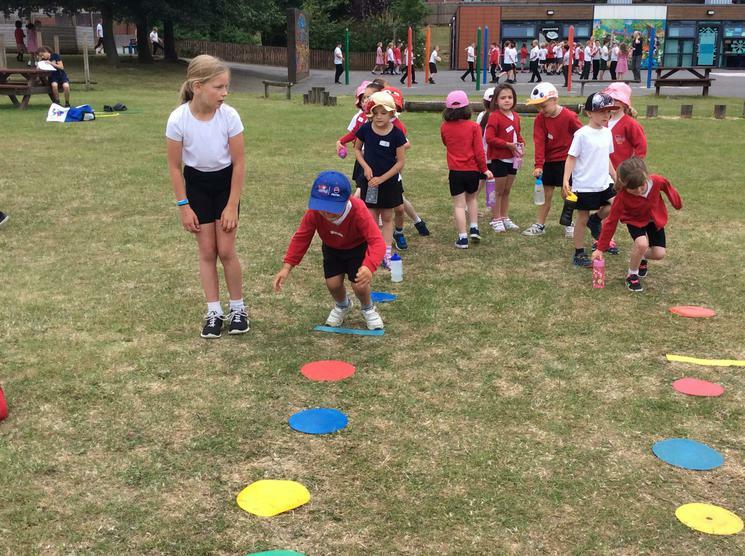 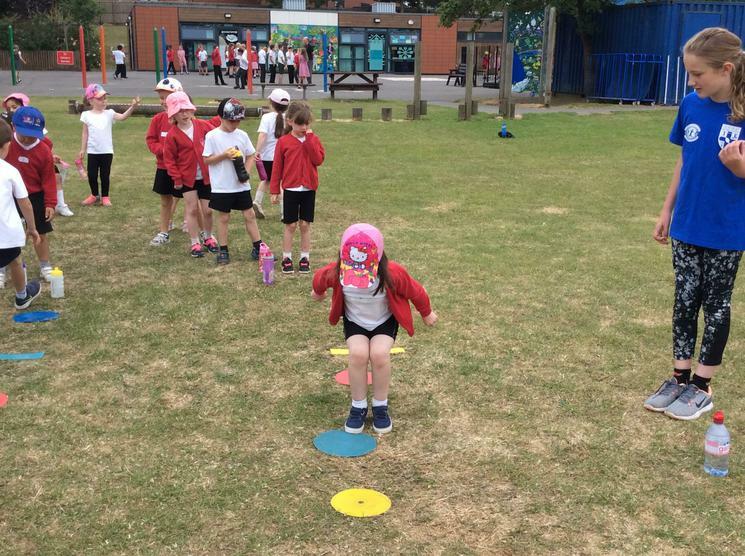 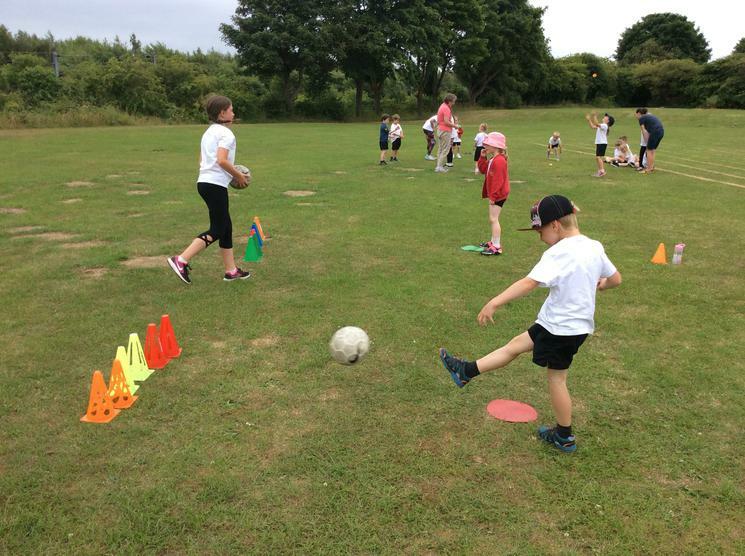 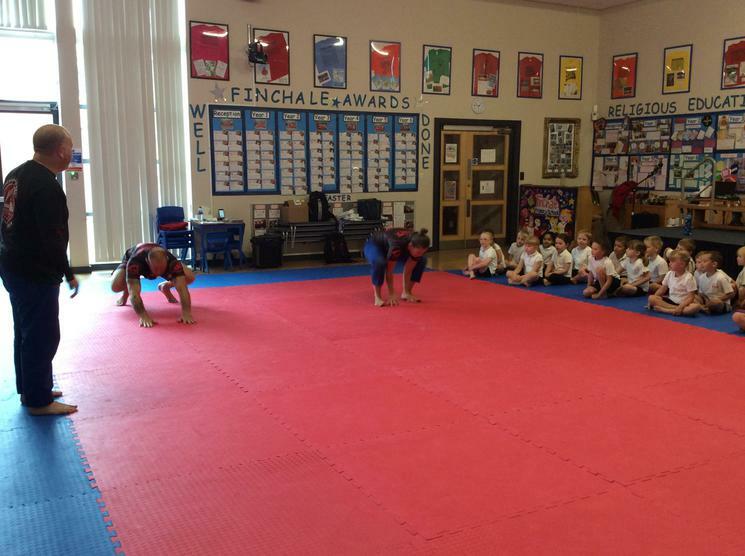 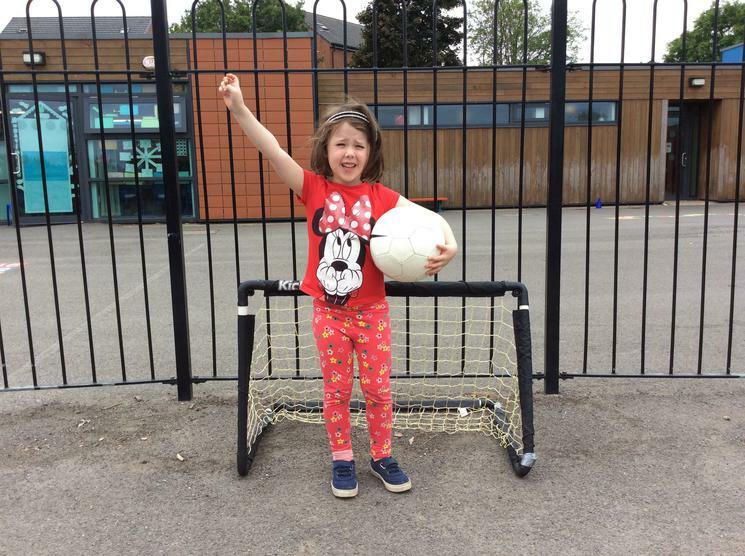 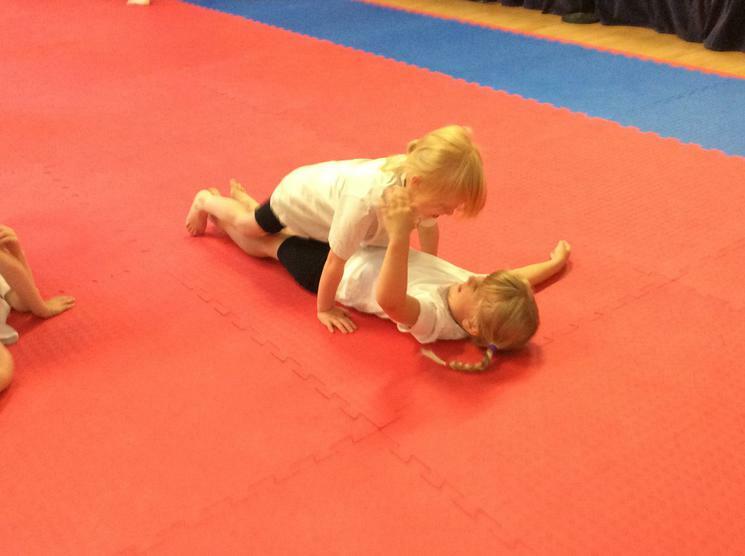 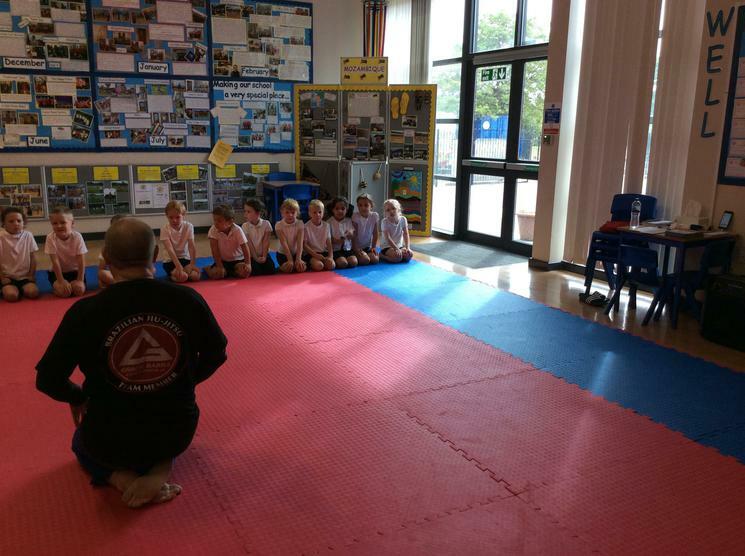 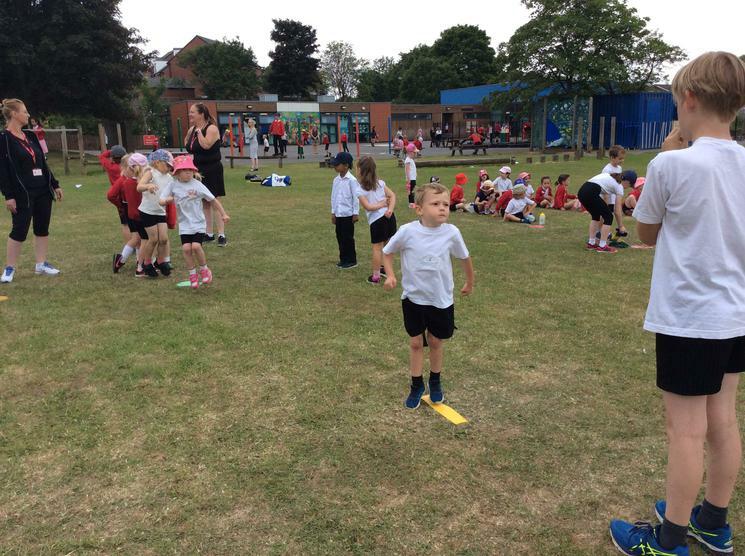 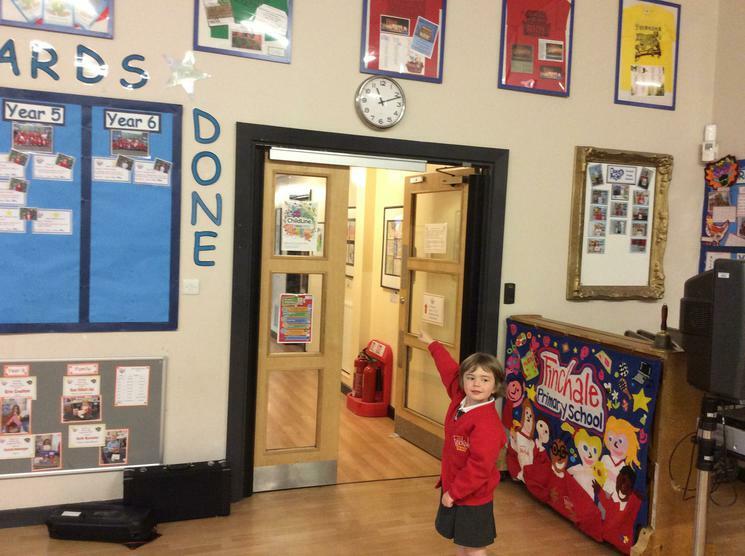 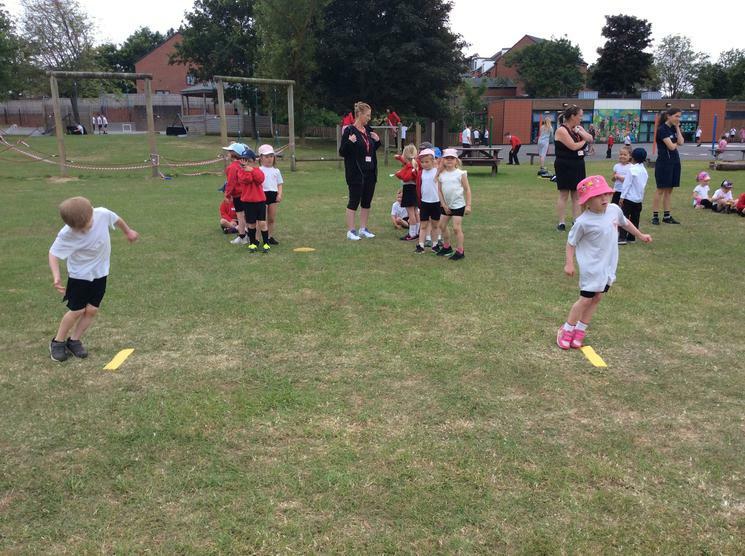 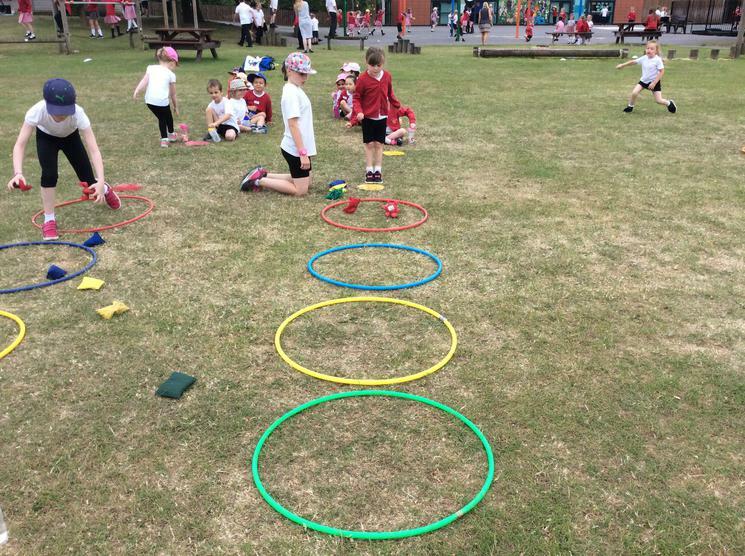 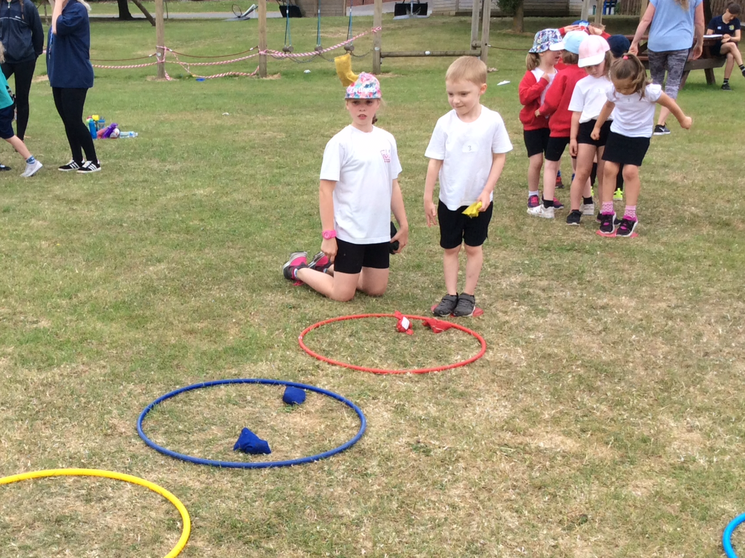 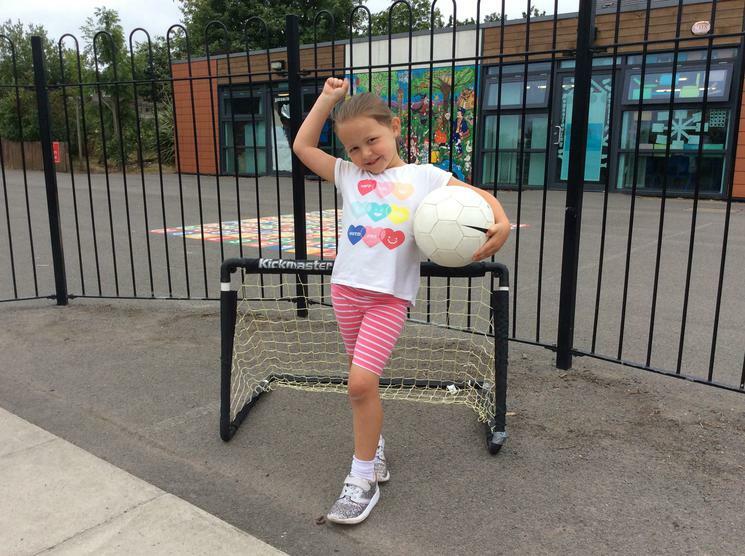 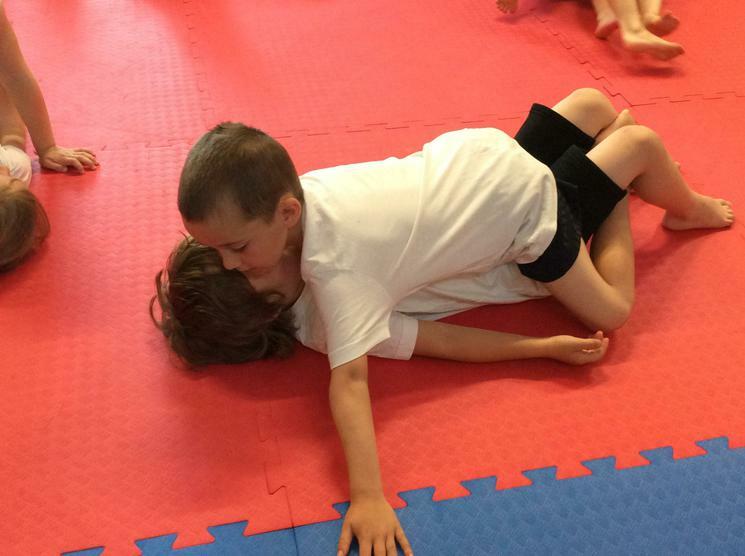 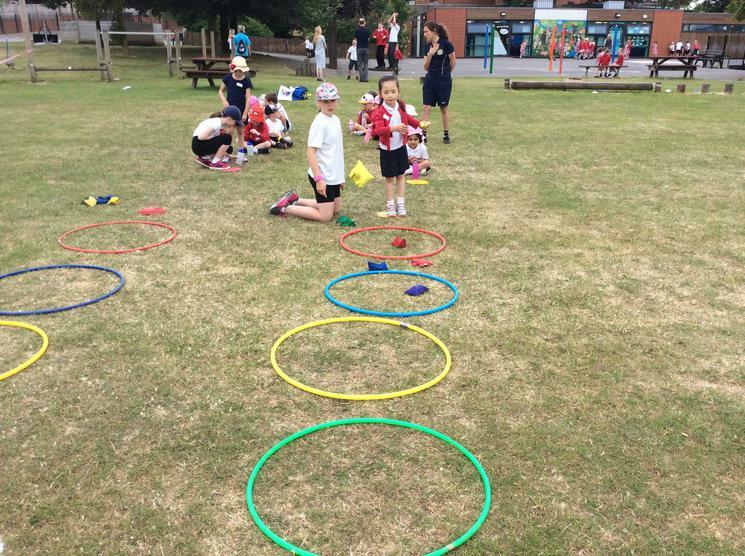 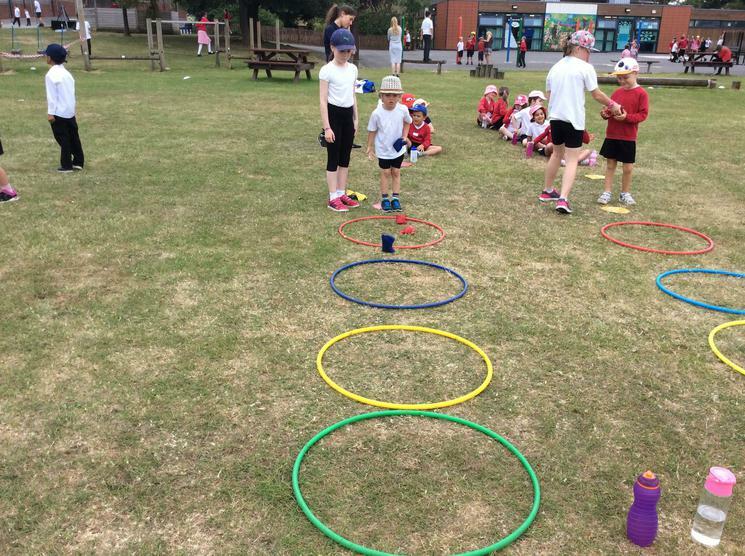 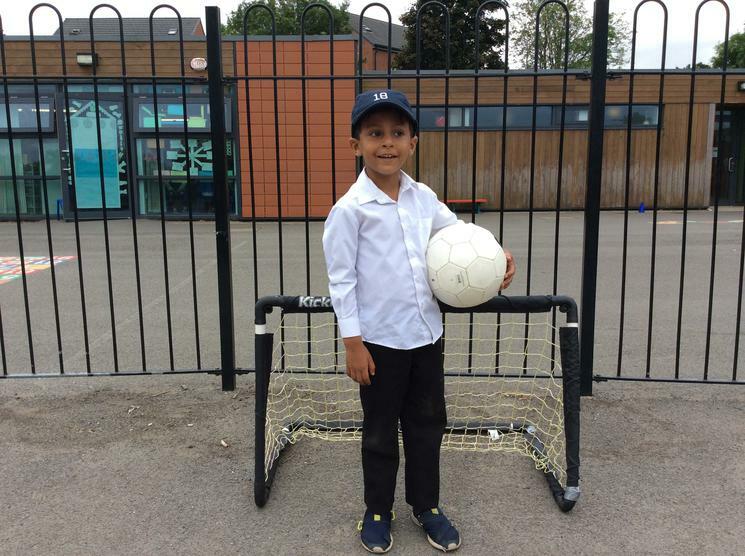 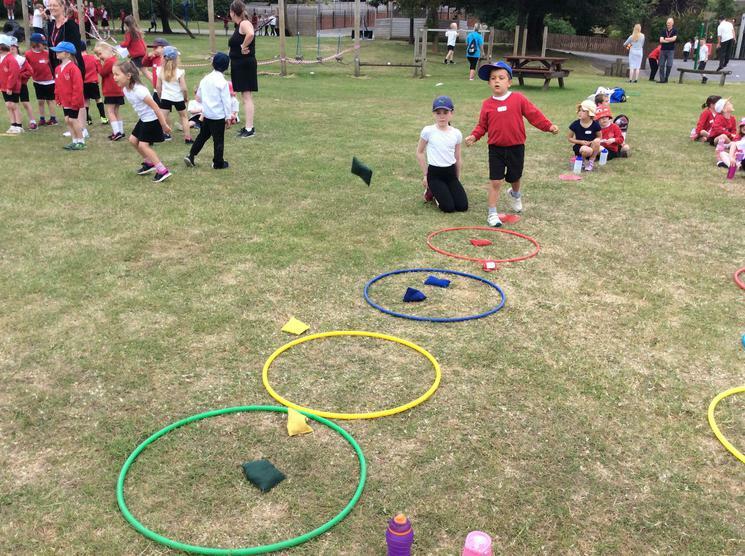 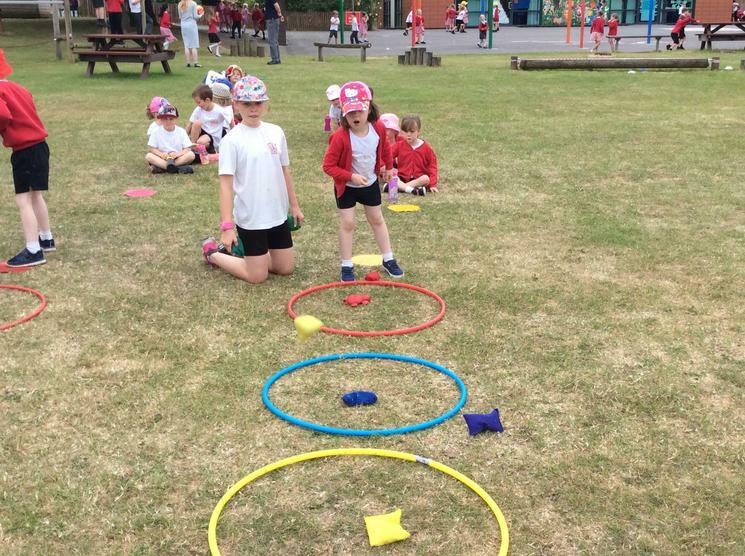 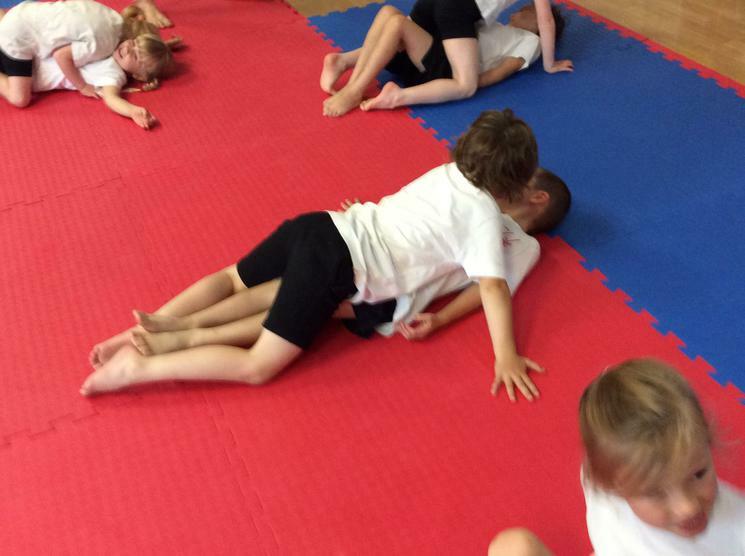 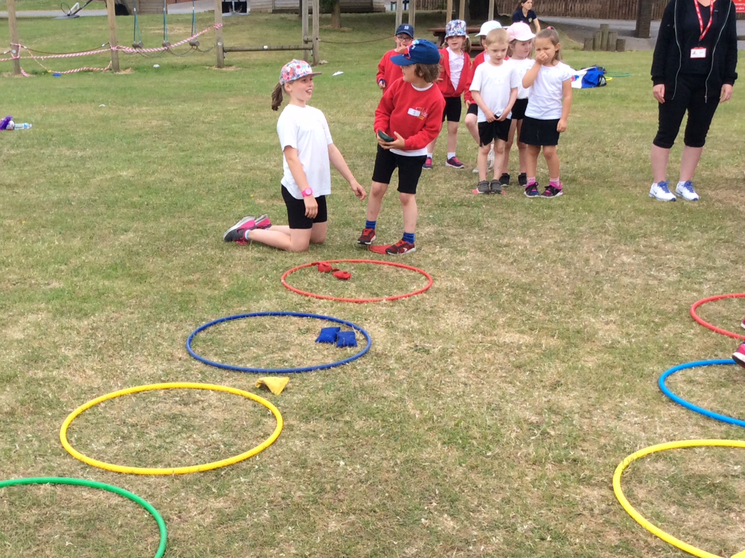 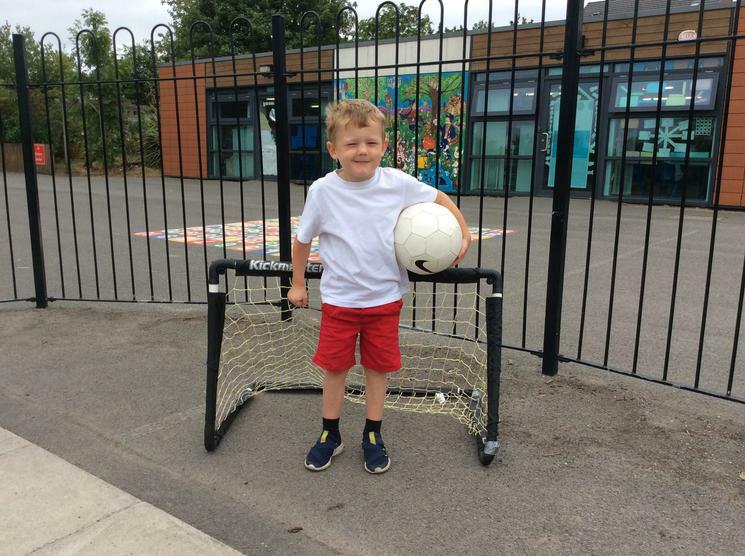 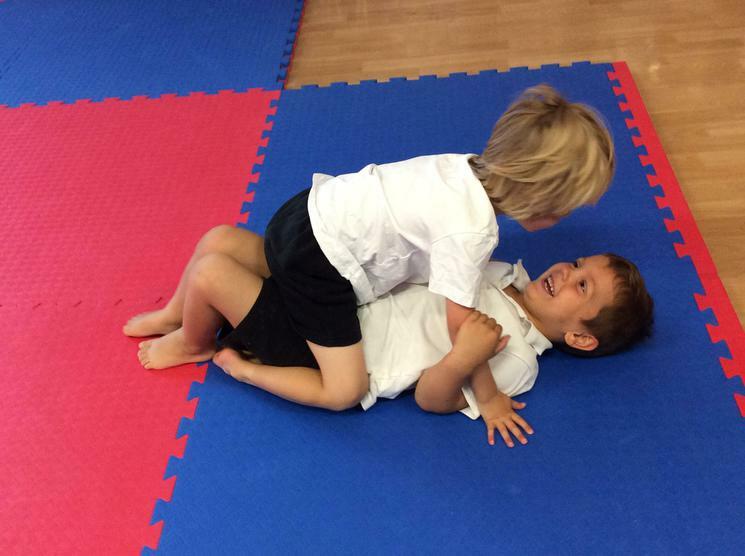 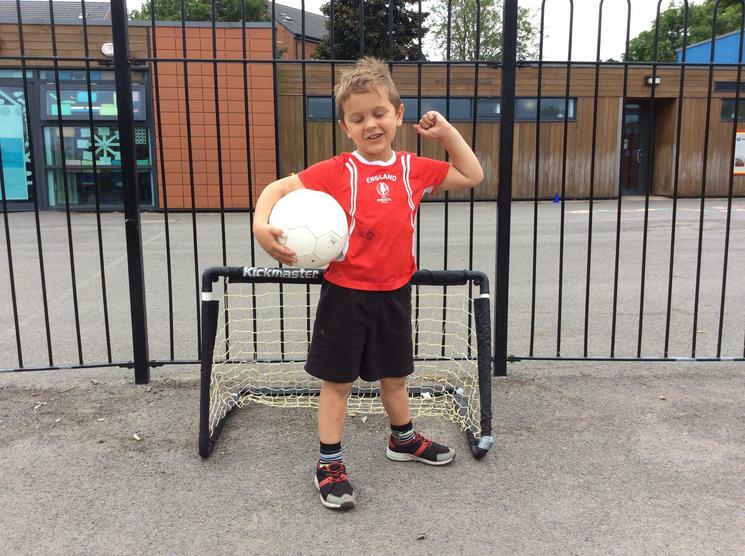 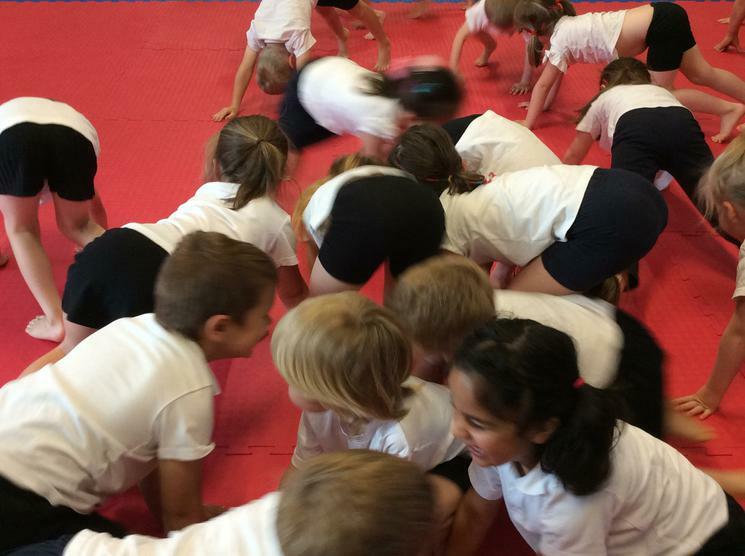 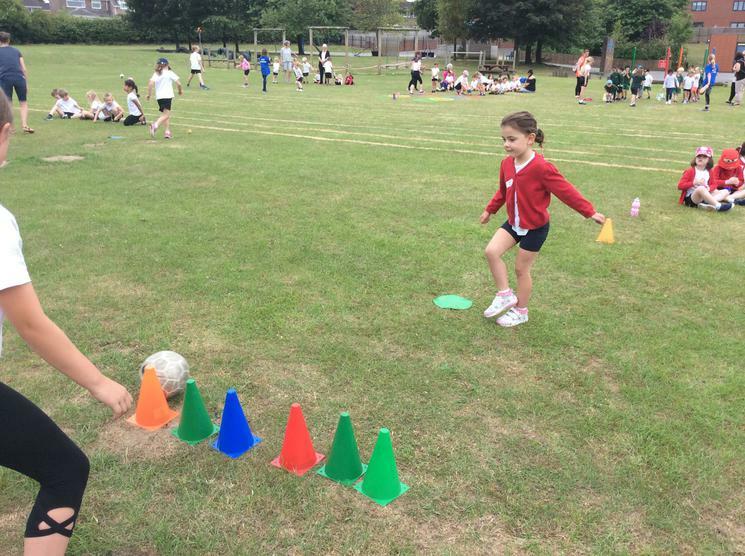 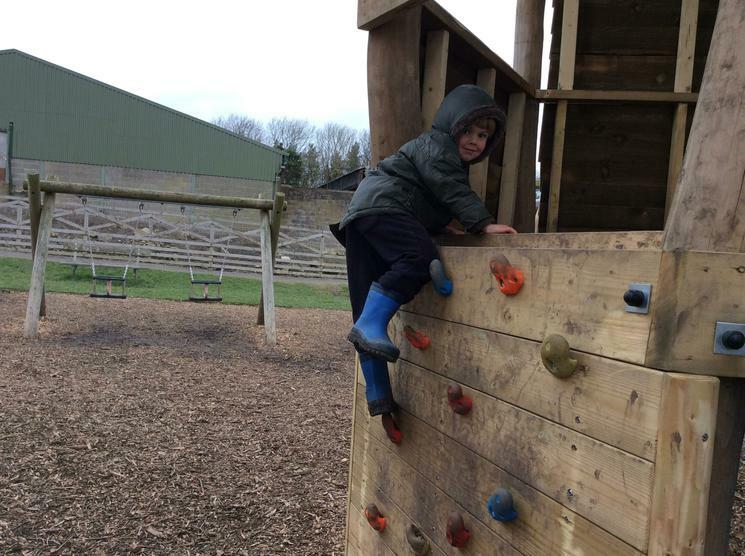 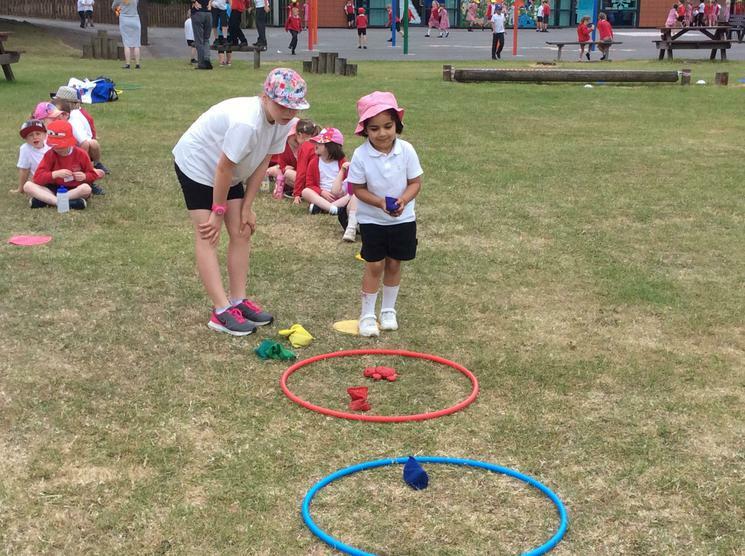 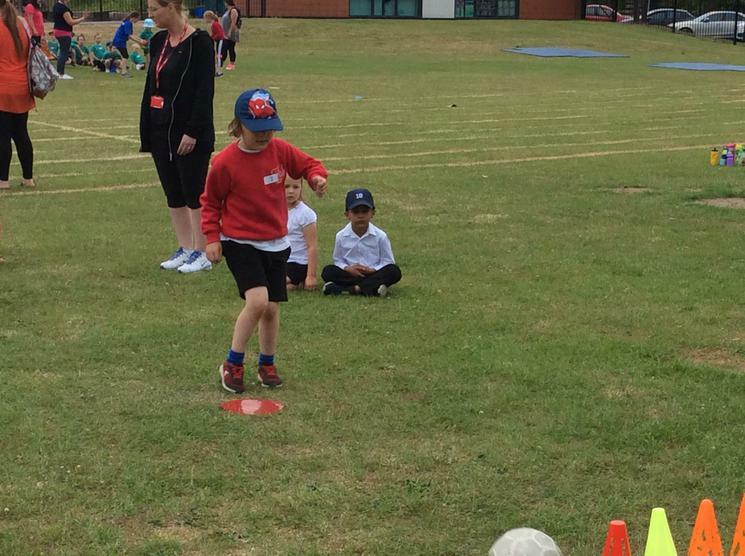 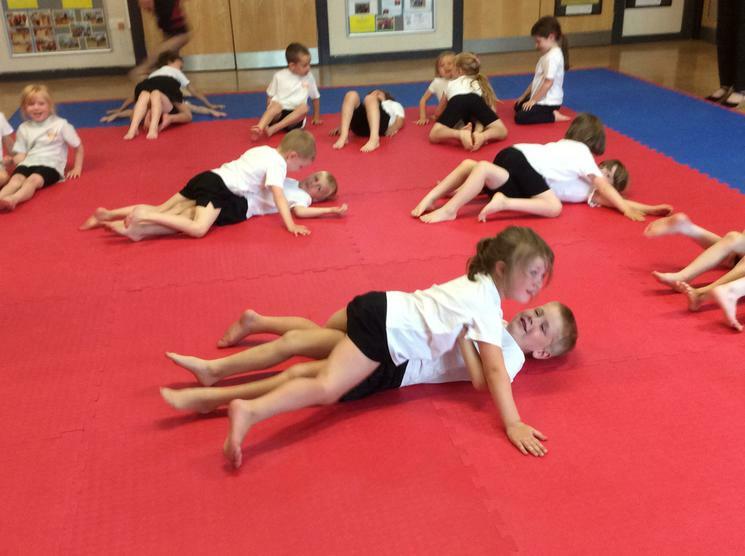 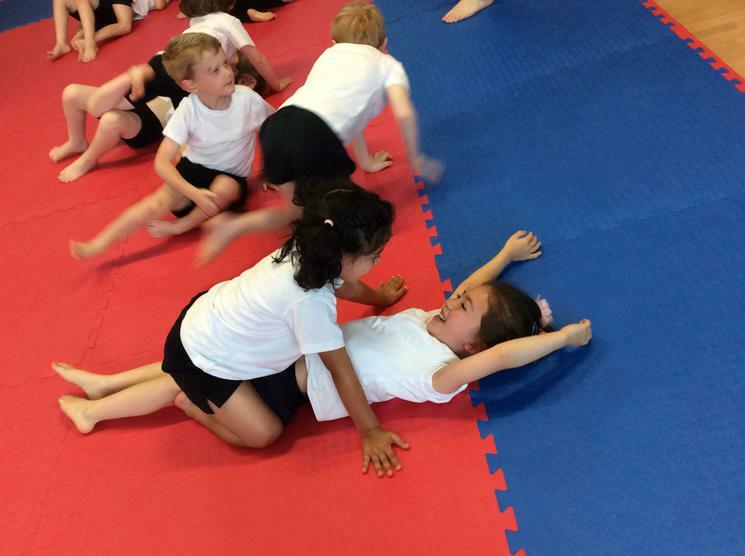 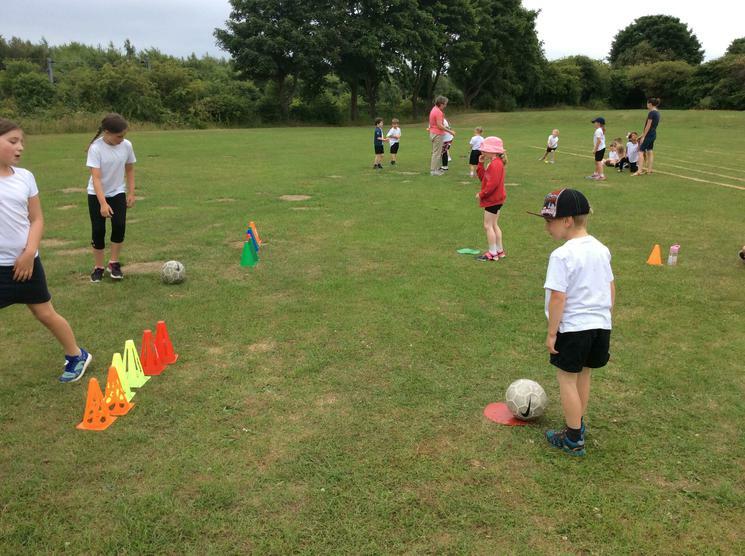 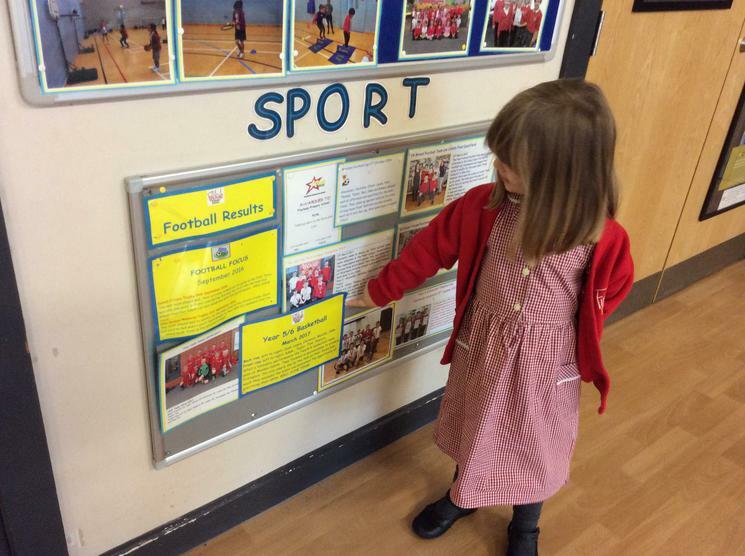 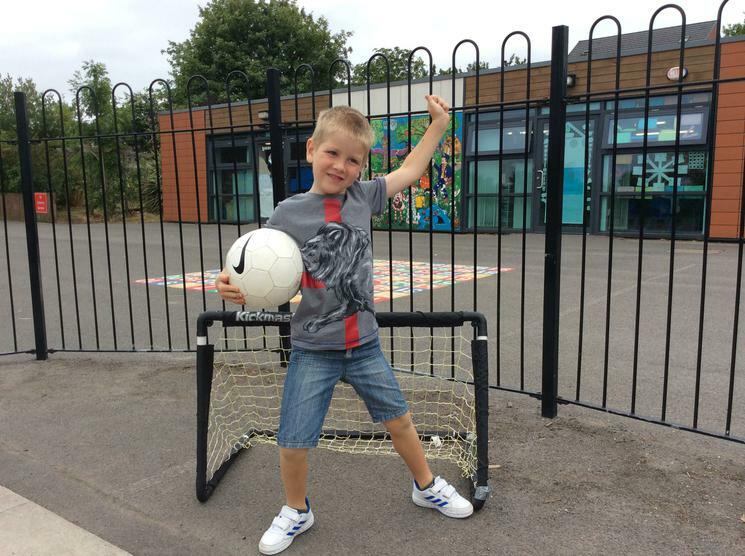 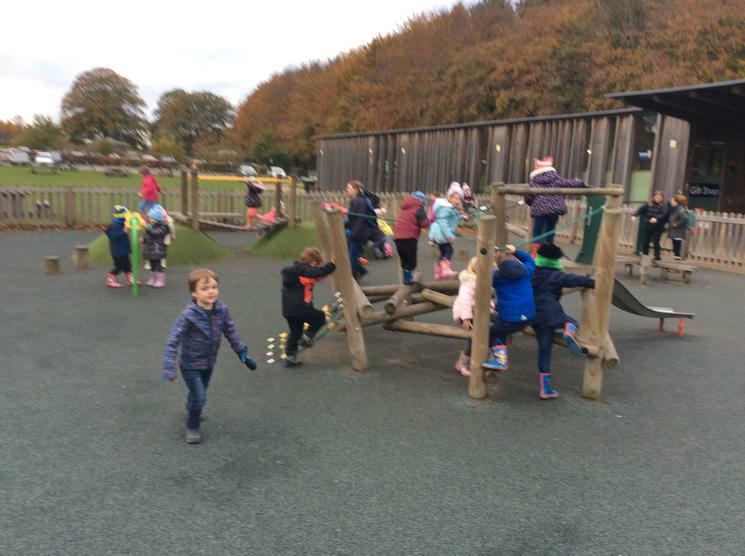 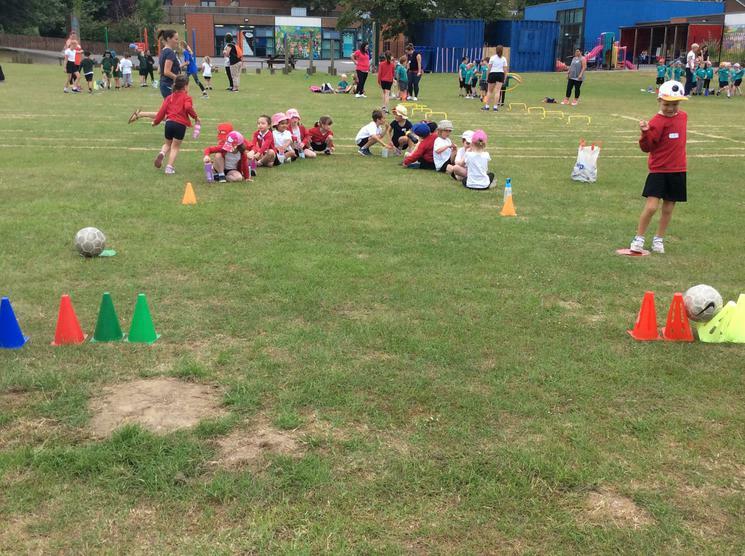 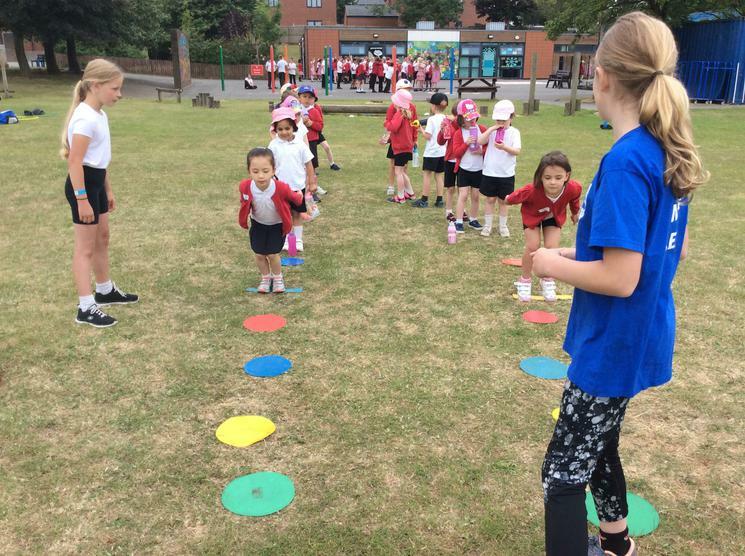 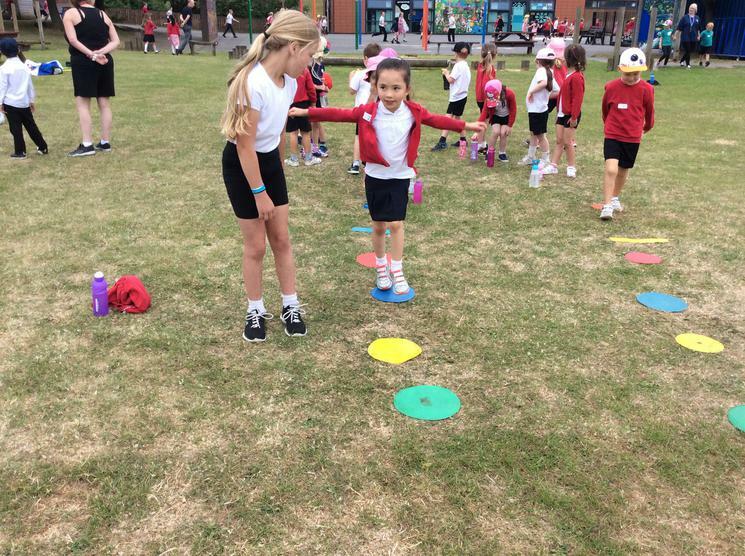 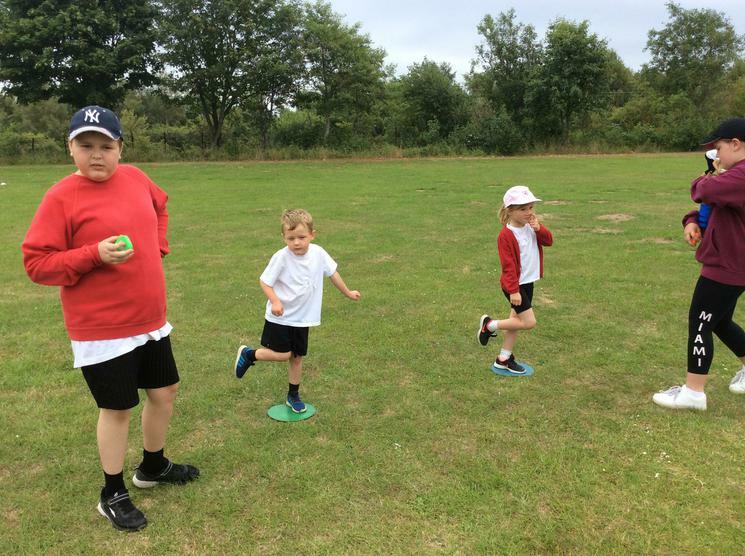 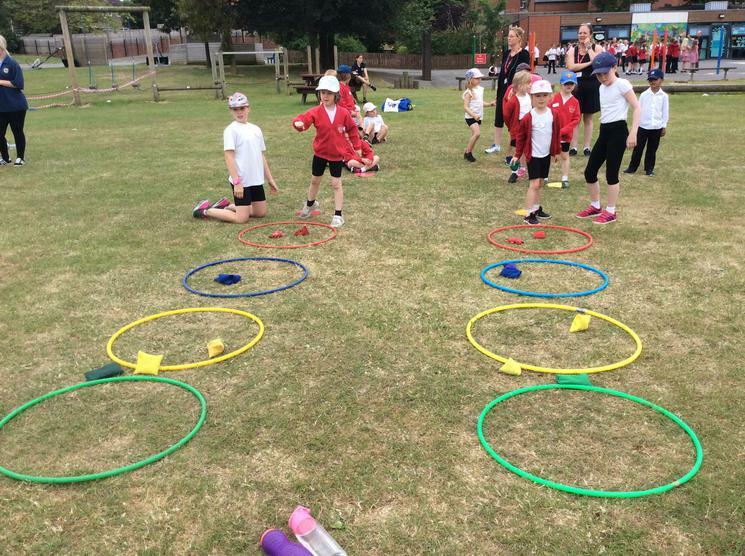 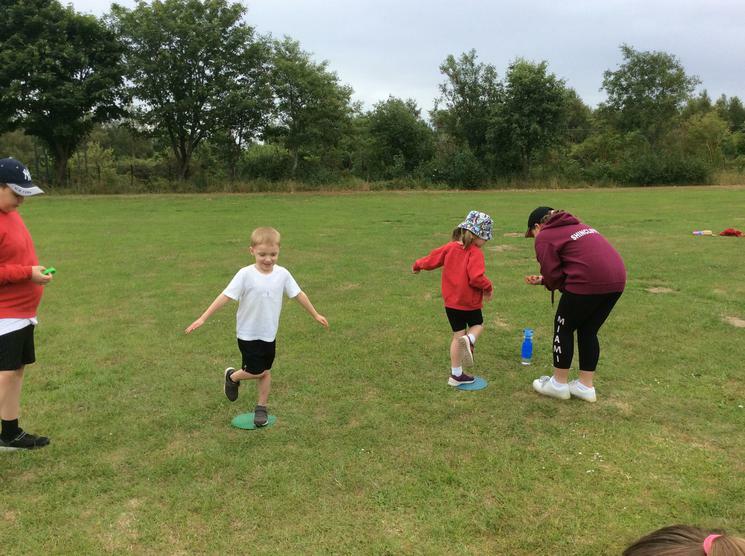 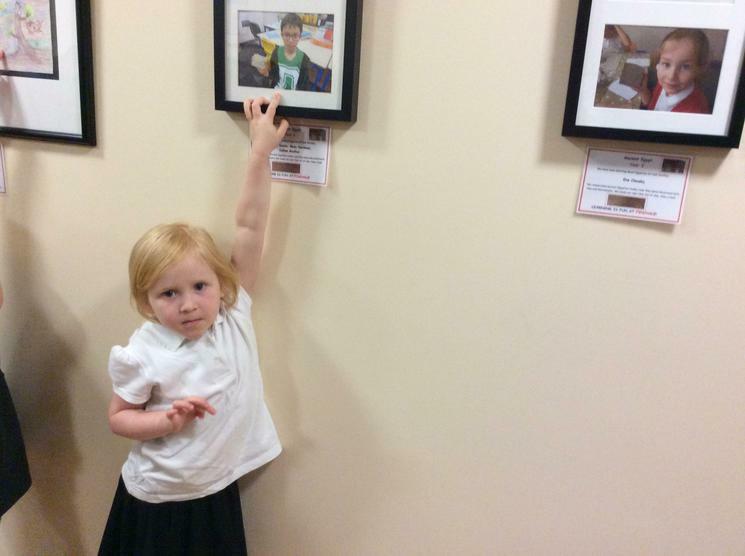 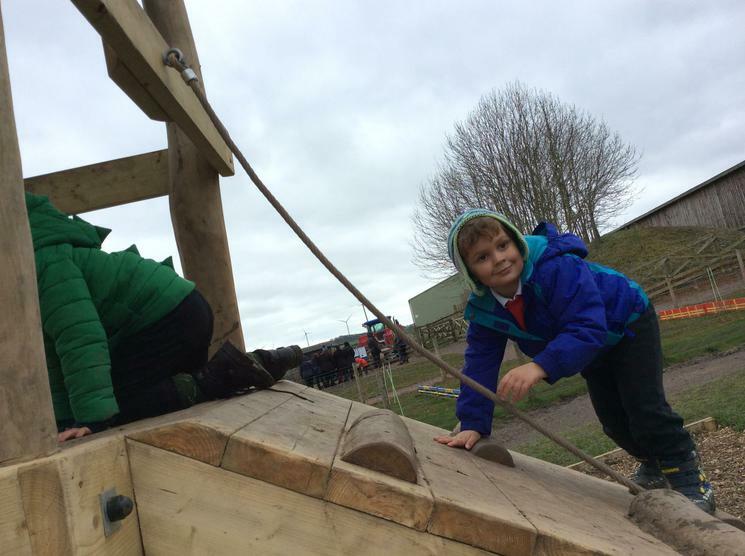 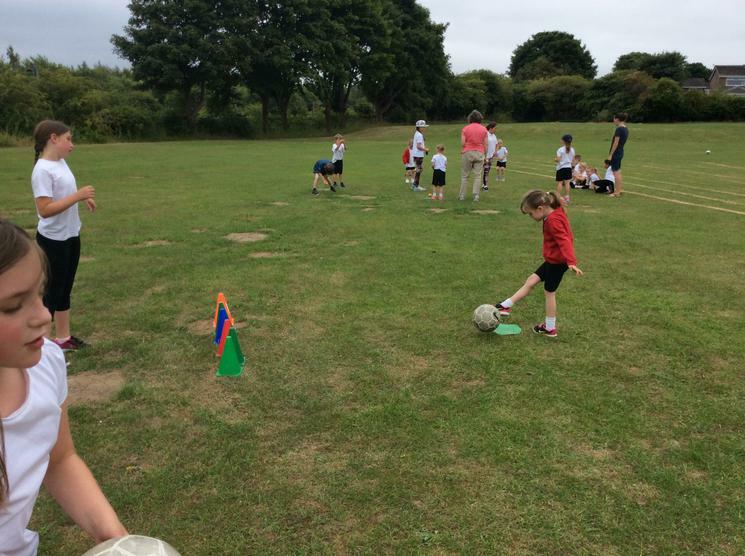 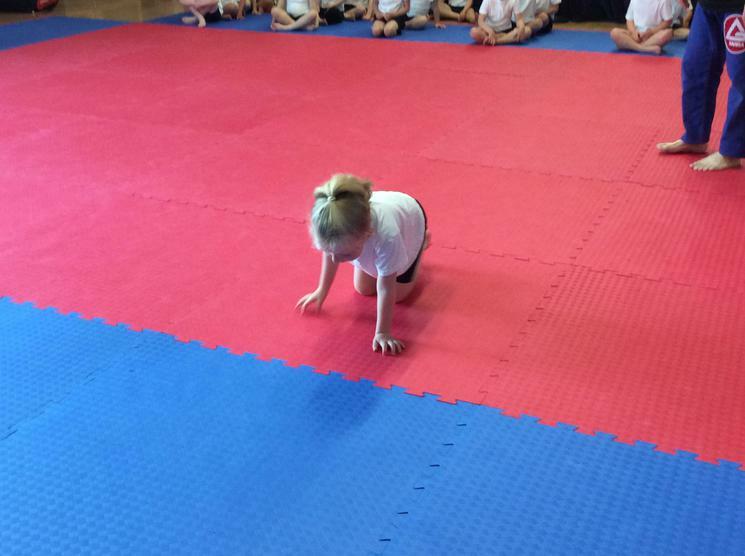 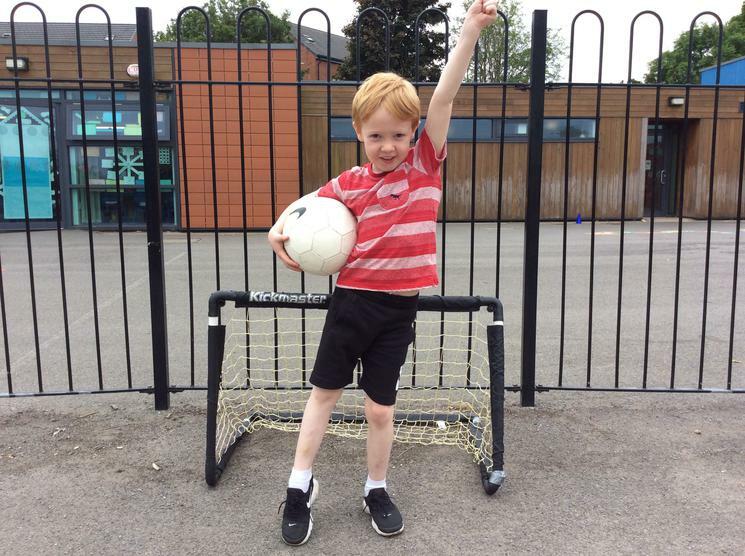 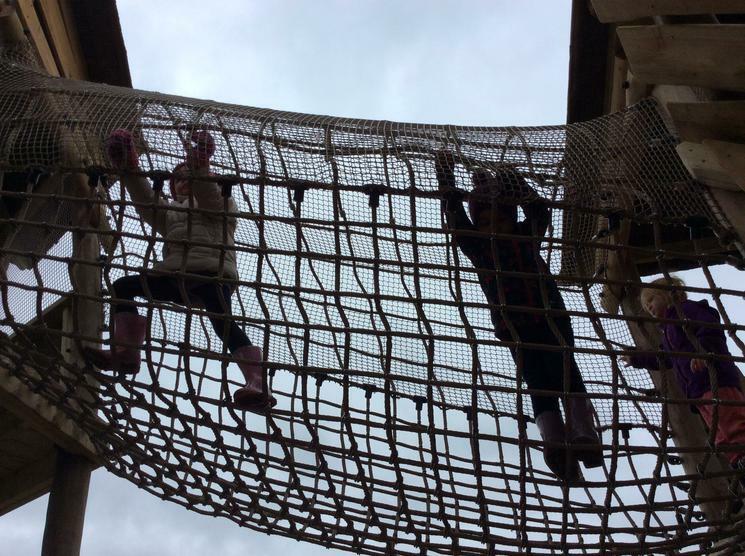 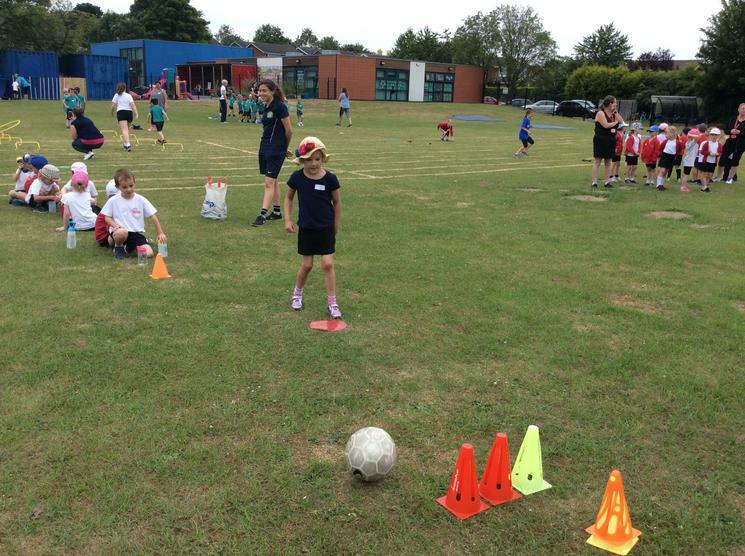 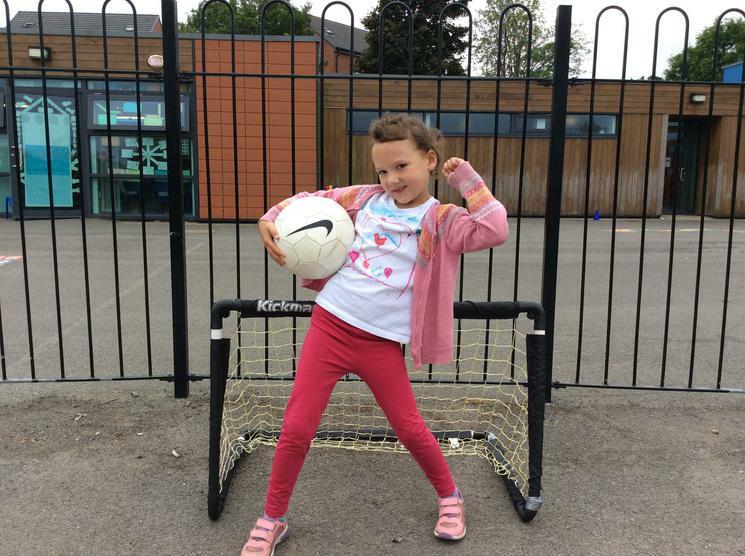 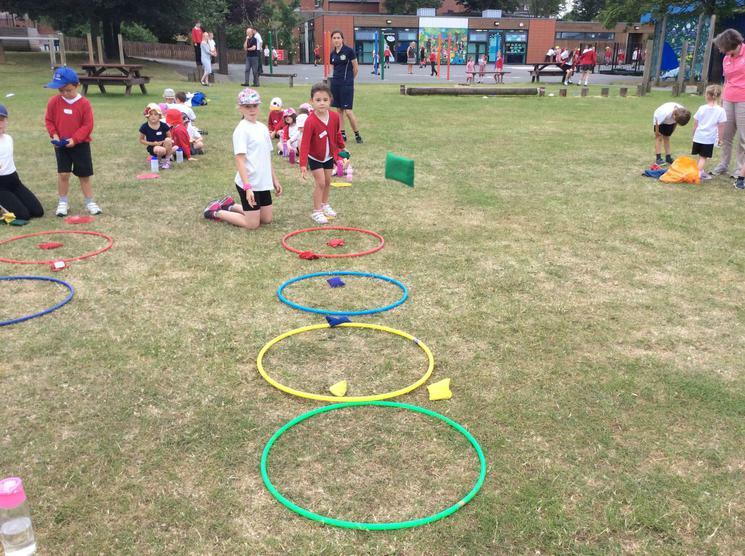 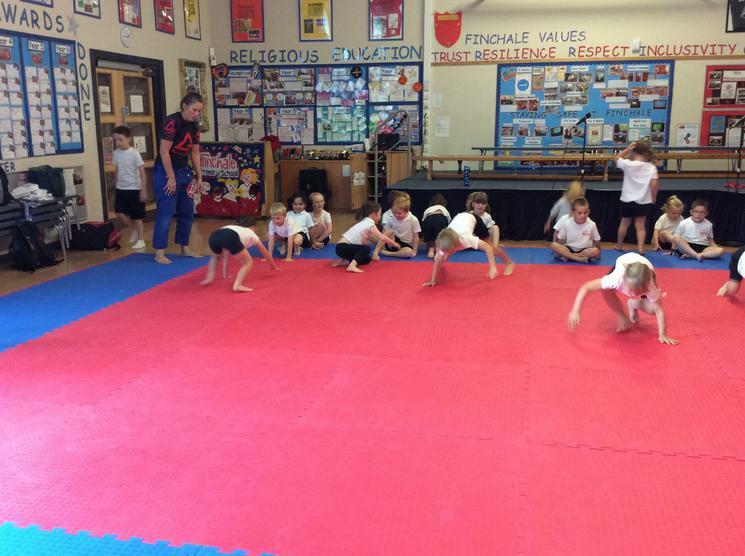 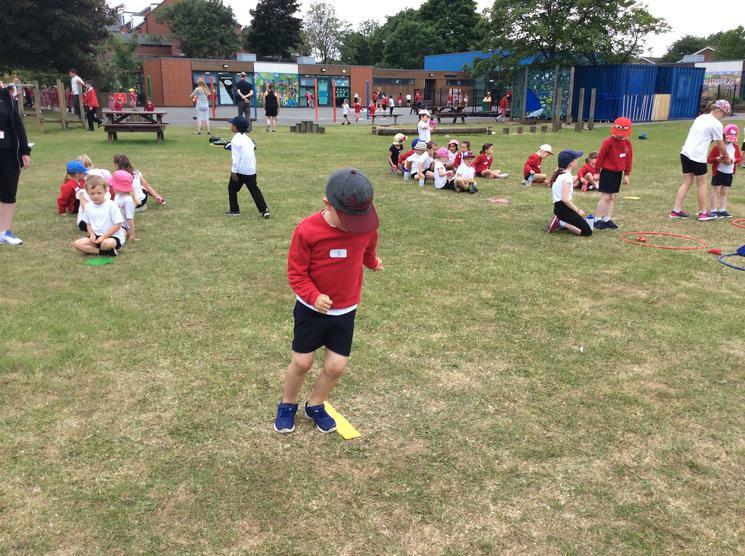 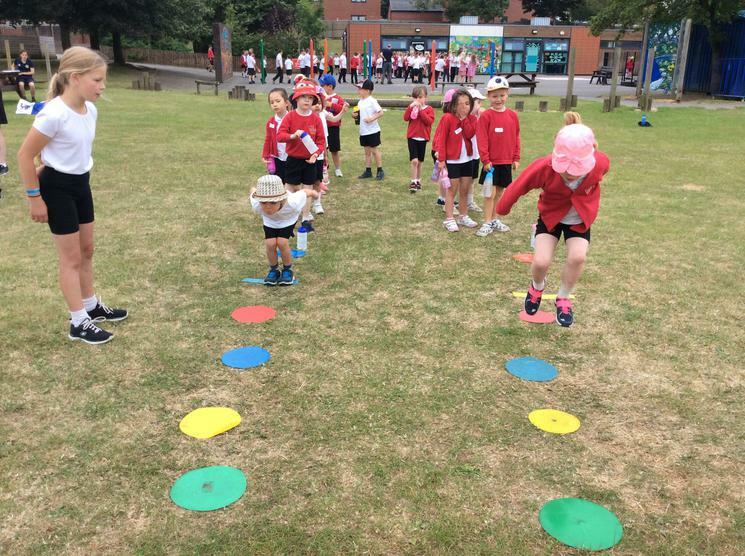 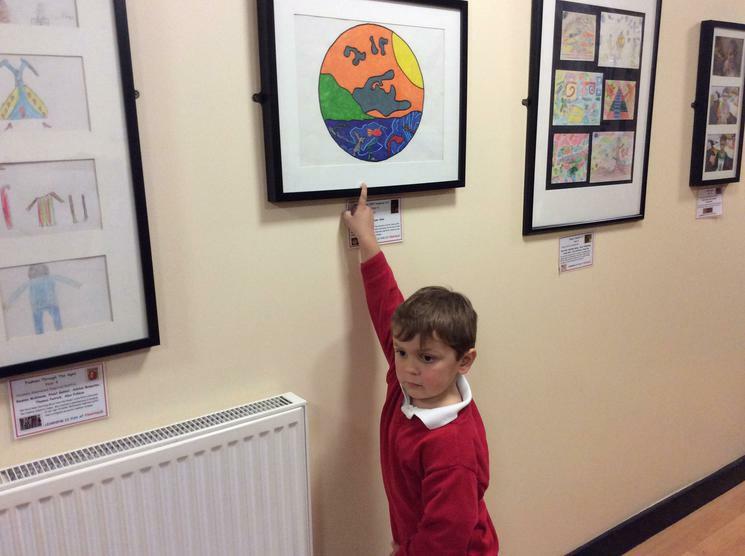 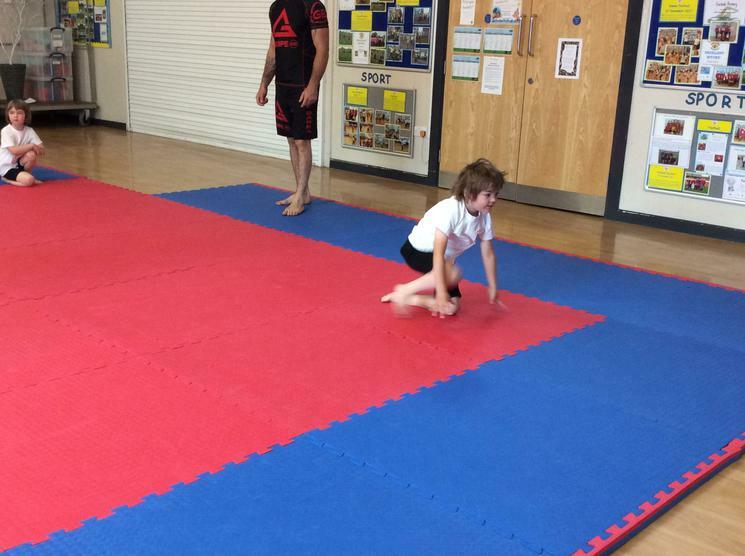 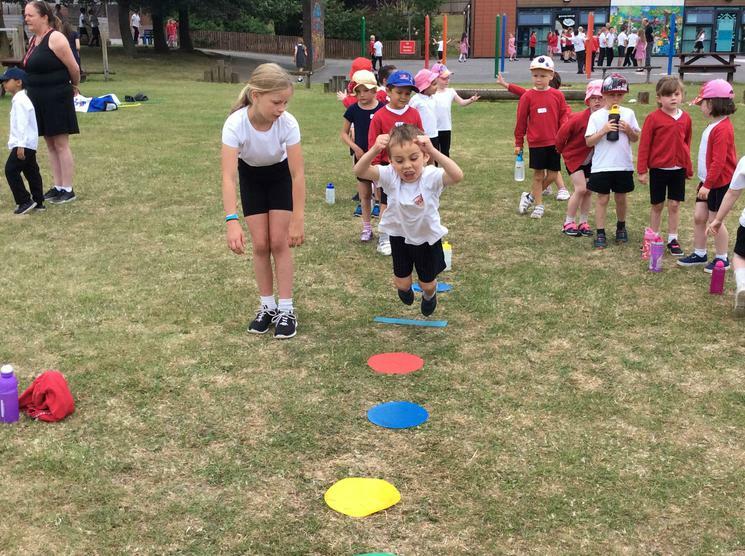 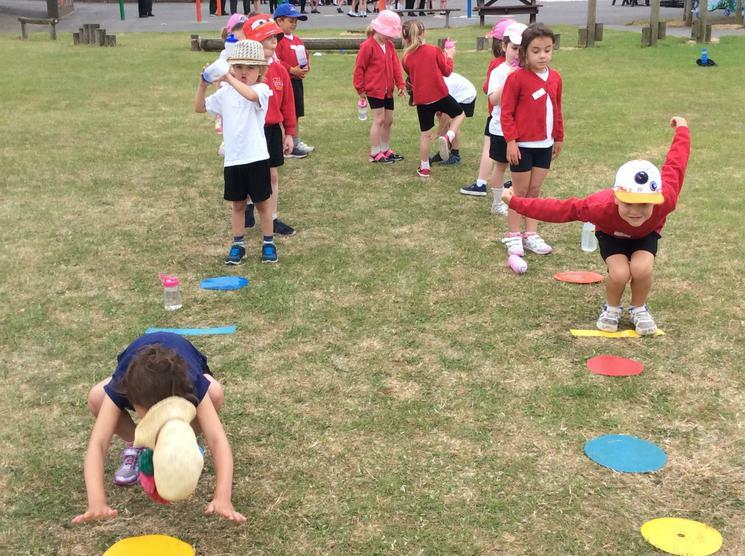 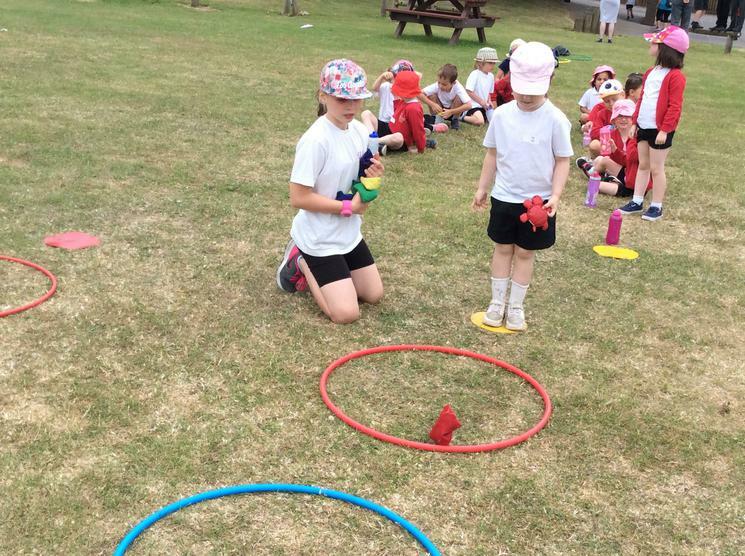 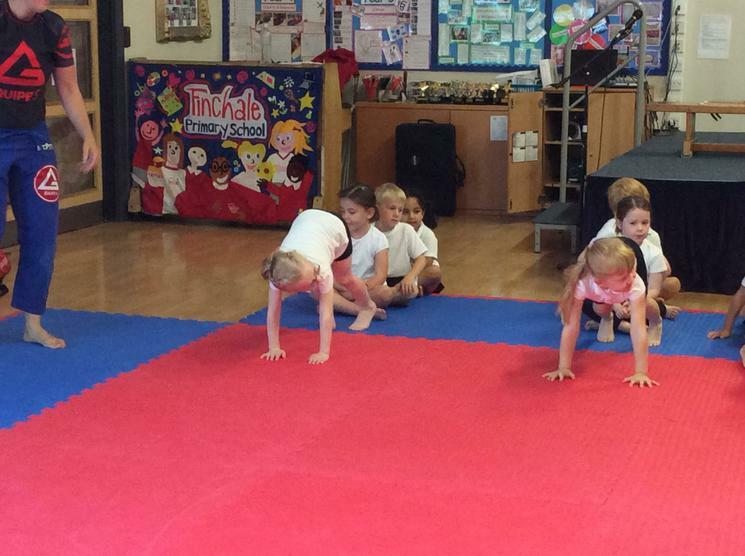 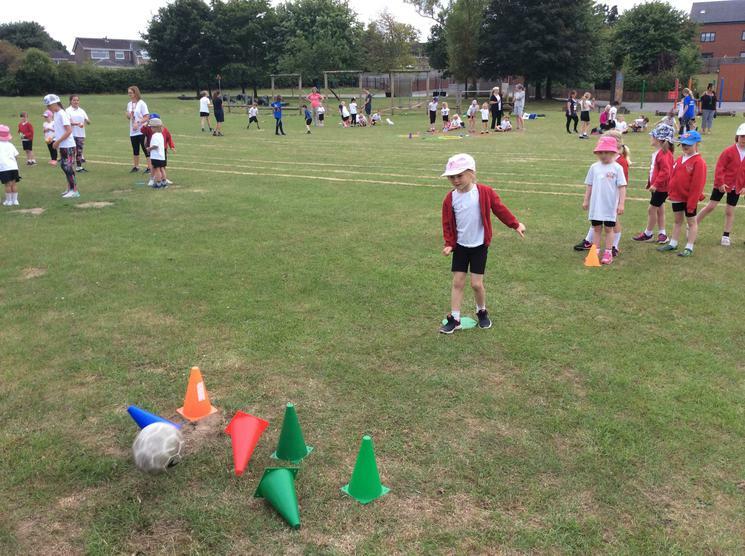 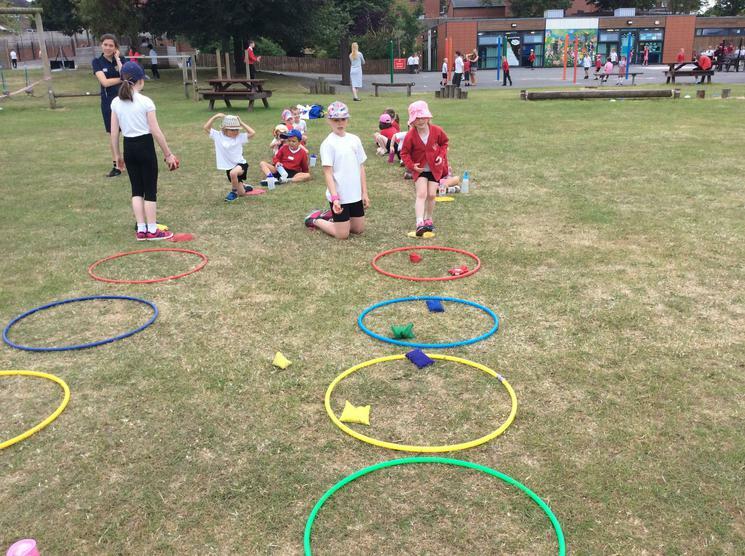 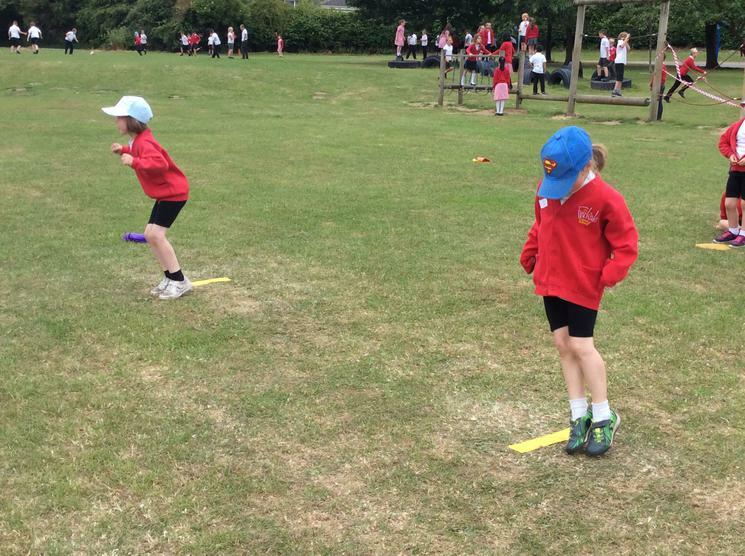 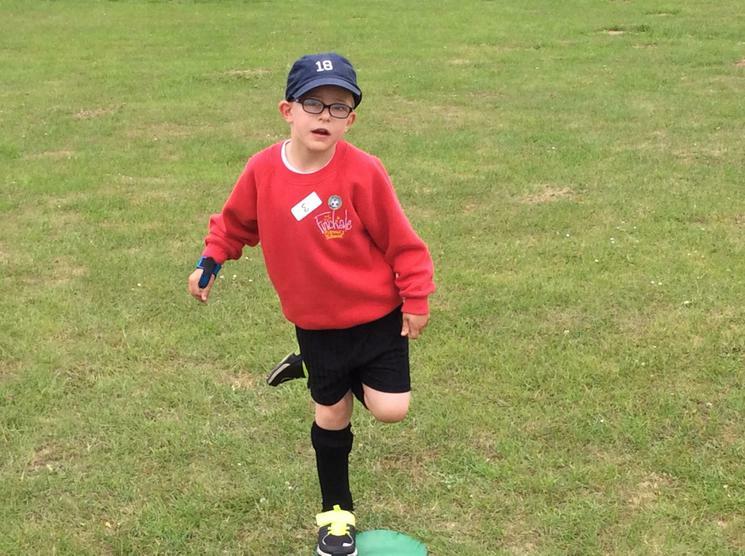 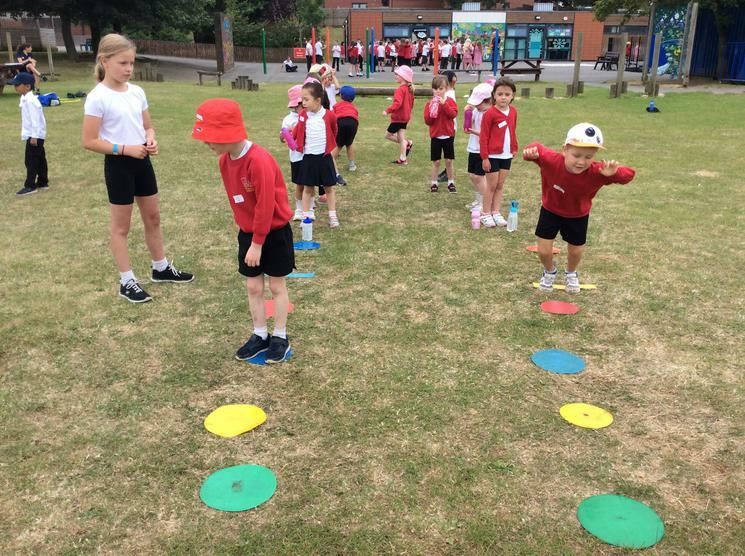 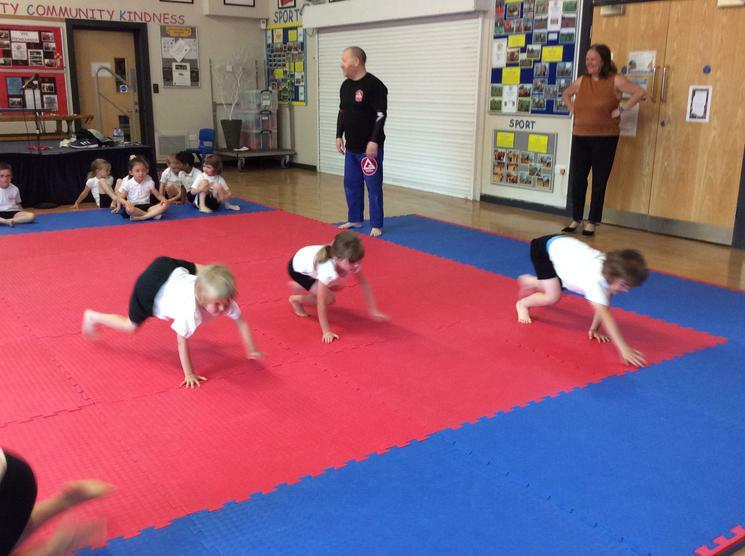 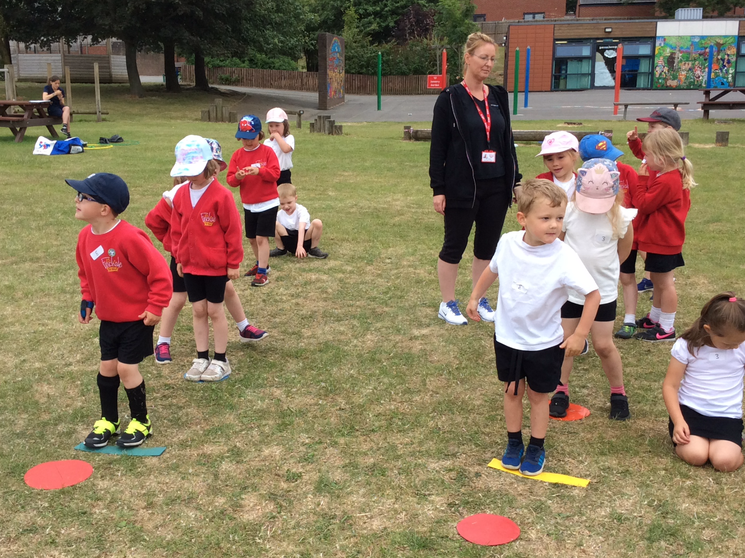 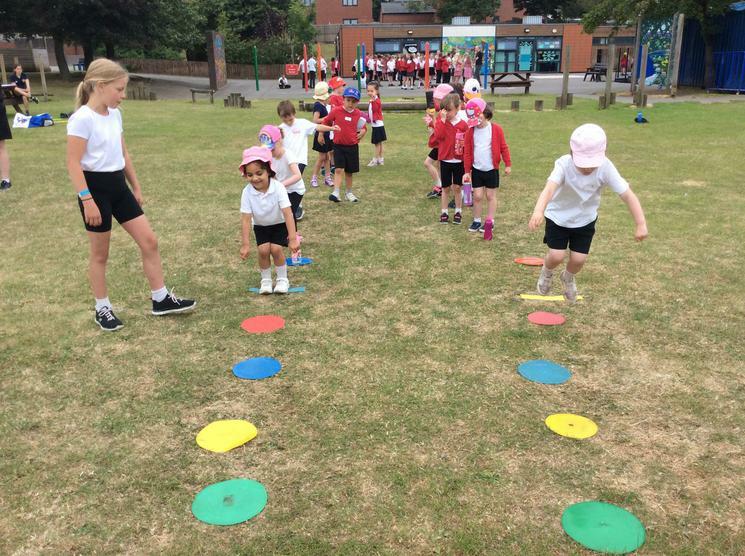 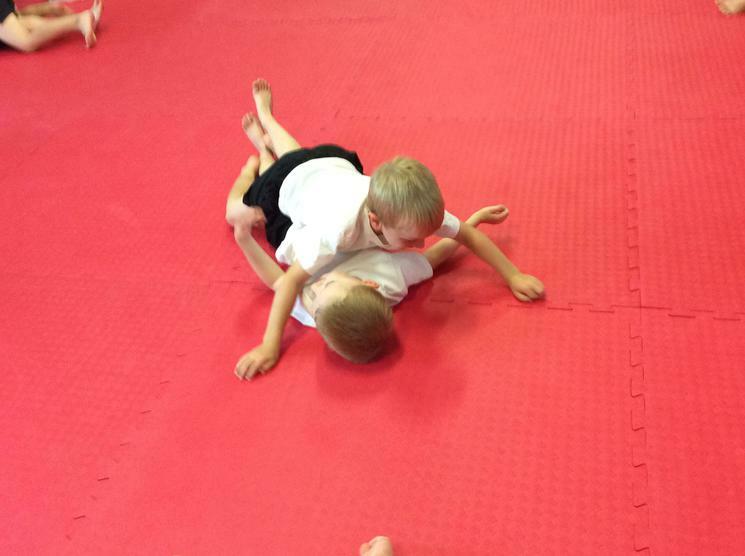 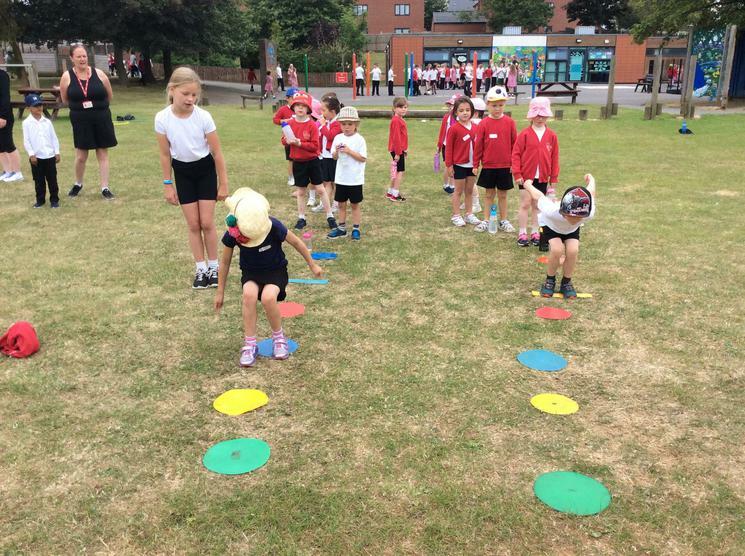 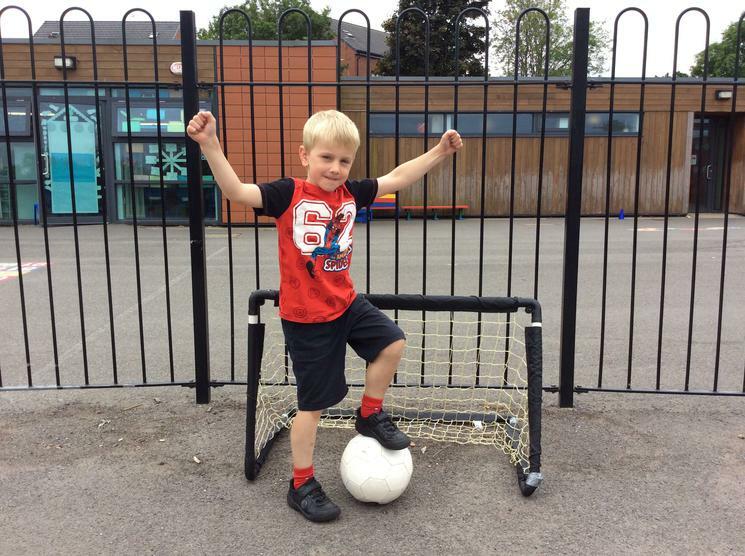 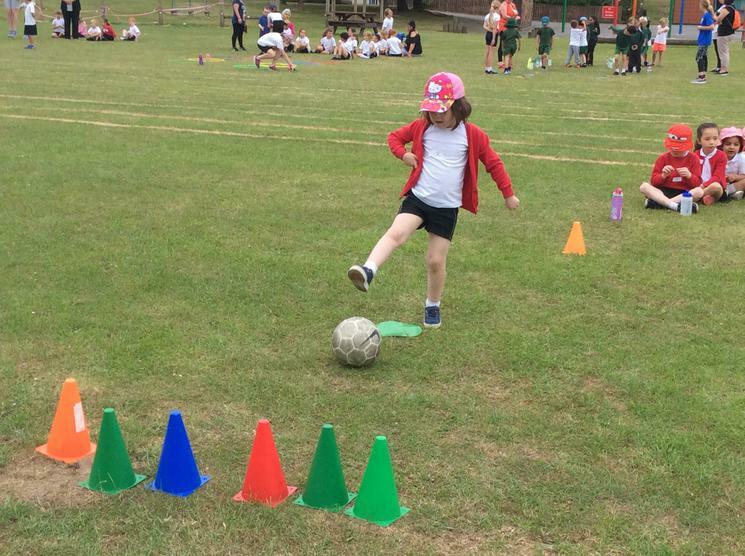 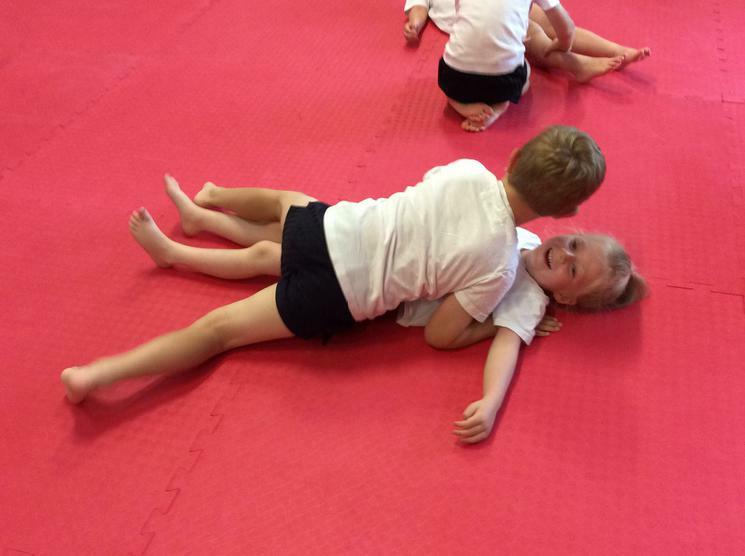 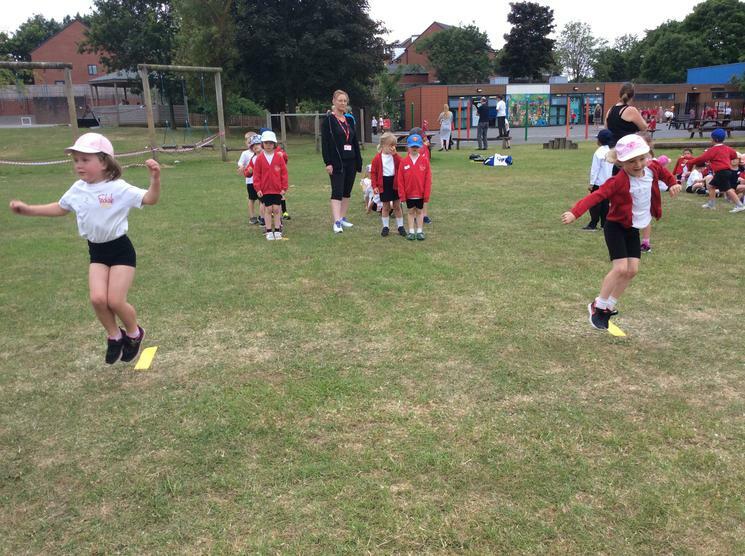 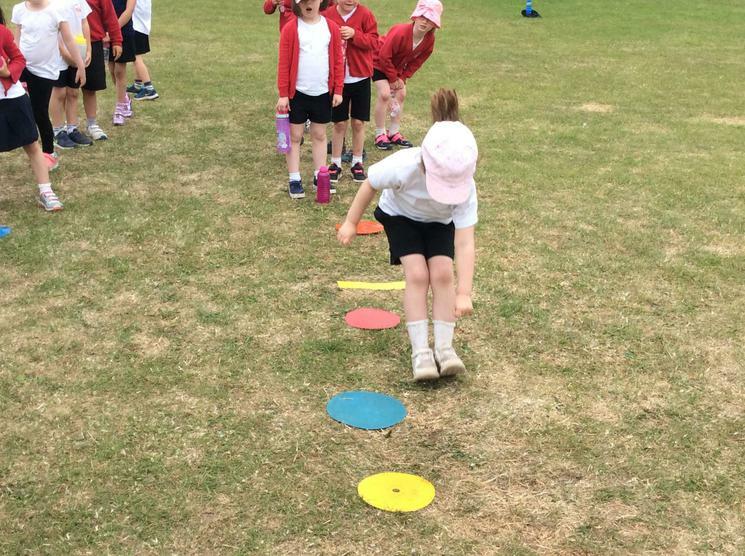 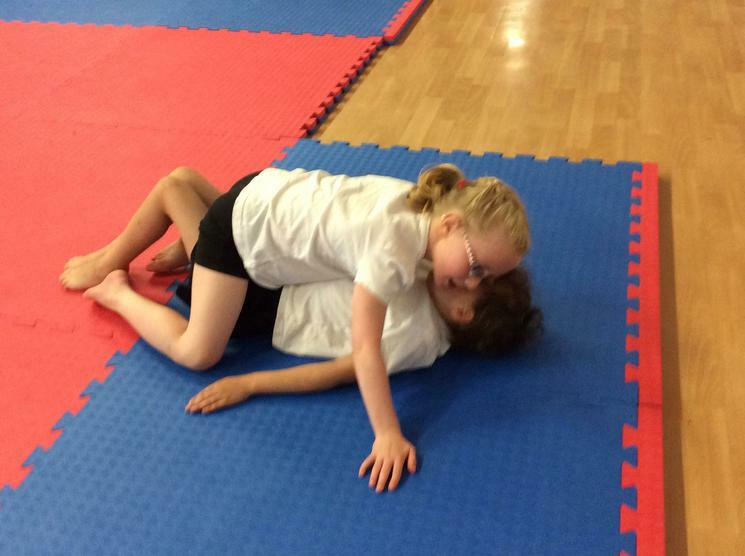 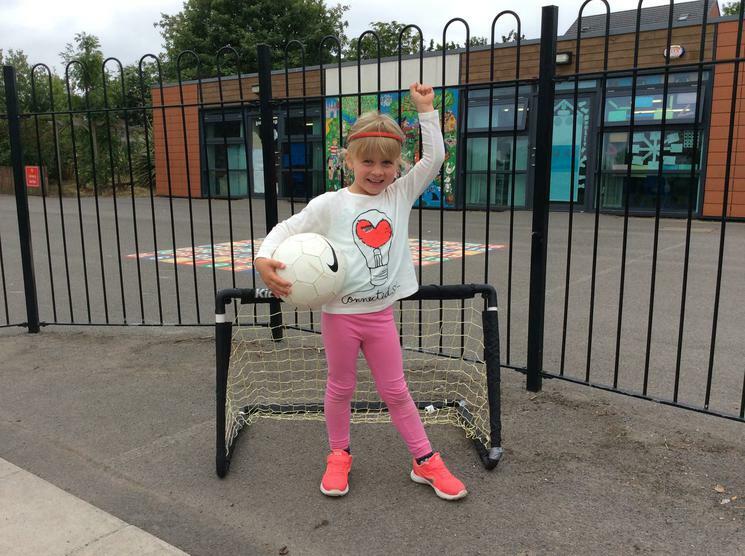 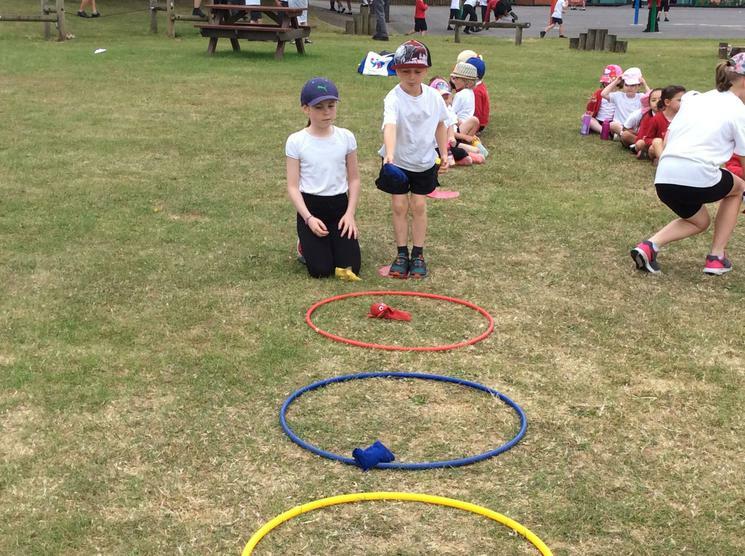 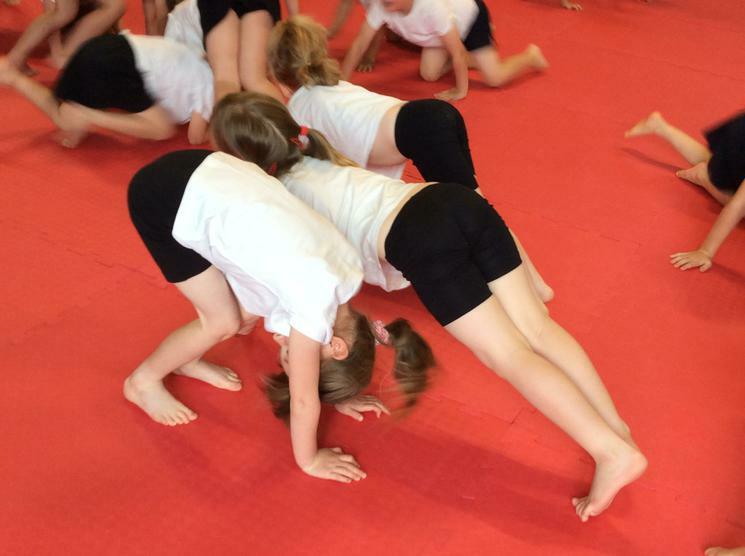 Reception children from four other schools came to Finchale to take part in a multi sports festival. 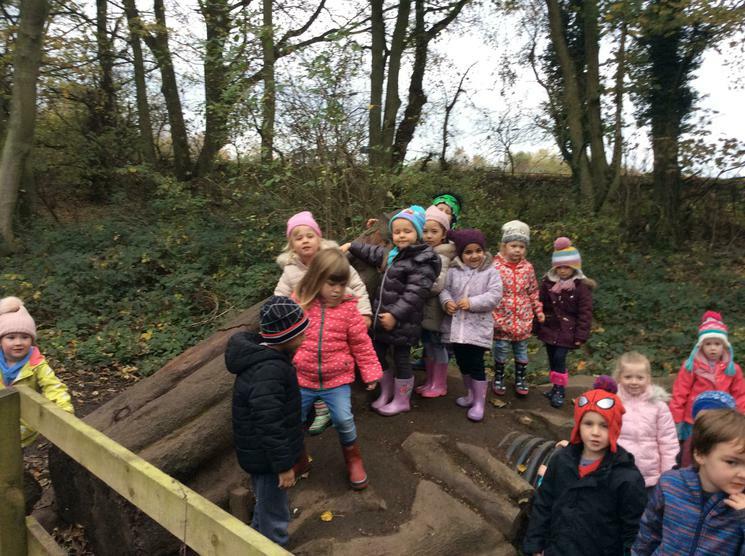 We all had great fun. 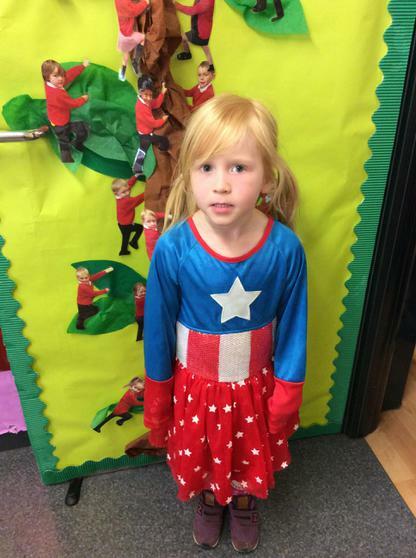 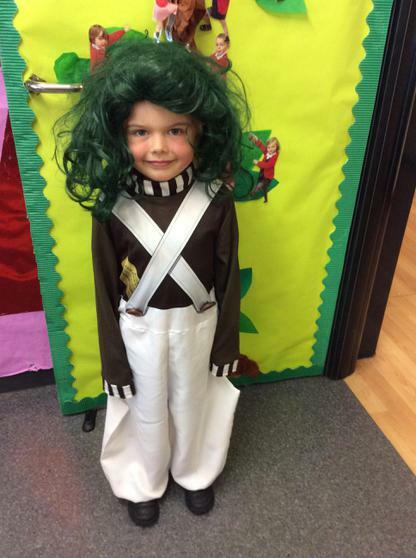 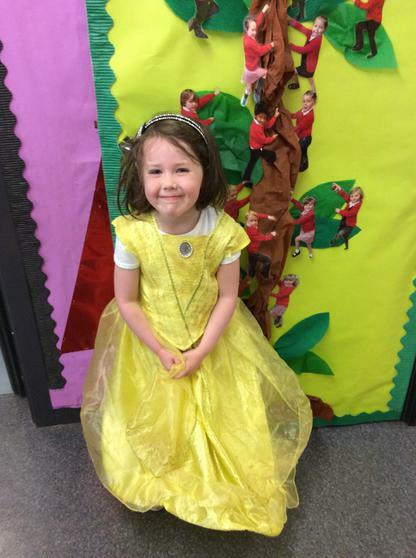 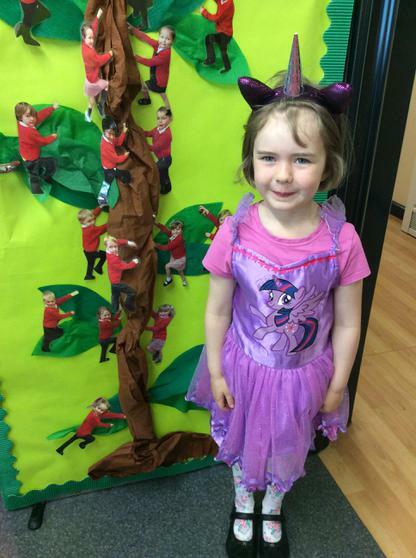 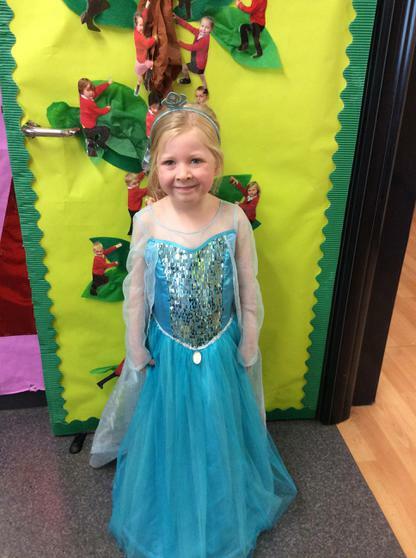 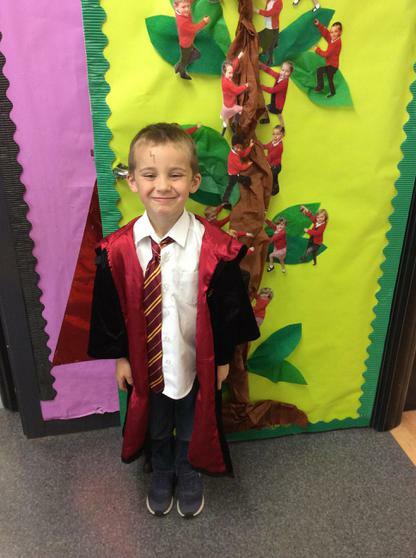 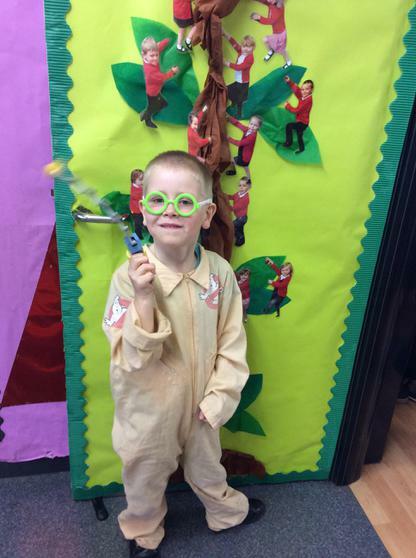 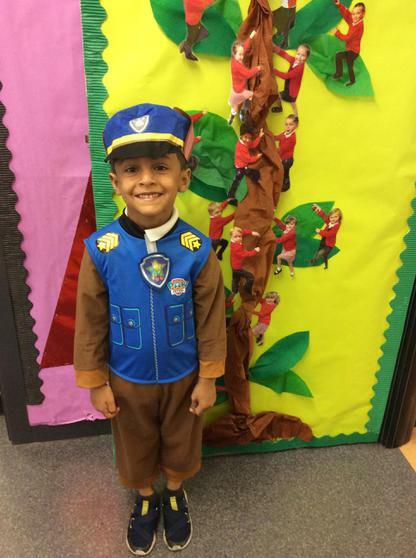 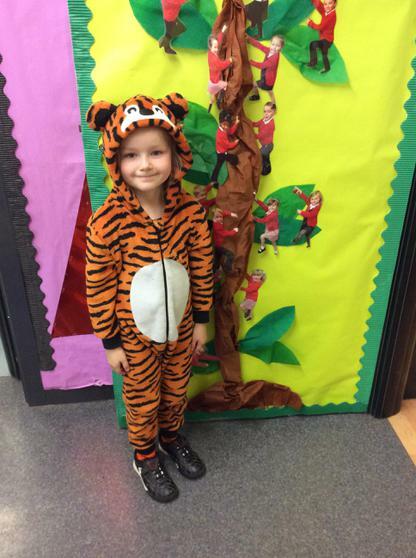 ‘Celebration od Reading Day’ - We all dressed up as a character from a book. 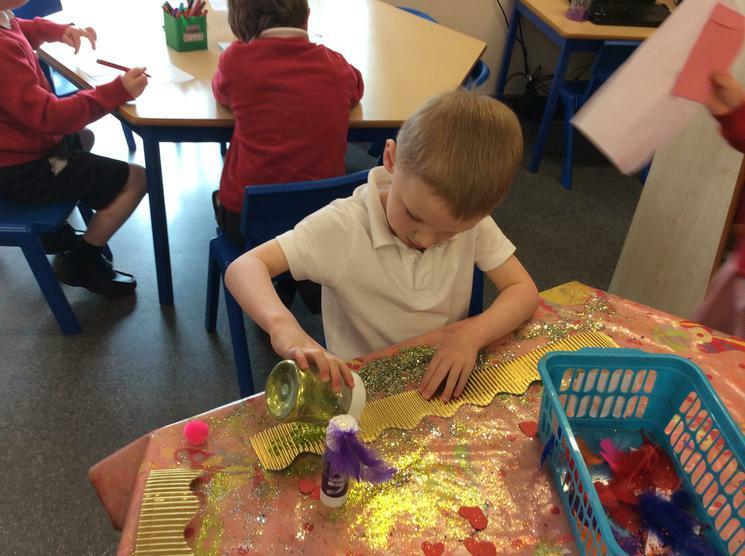 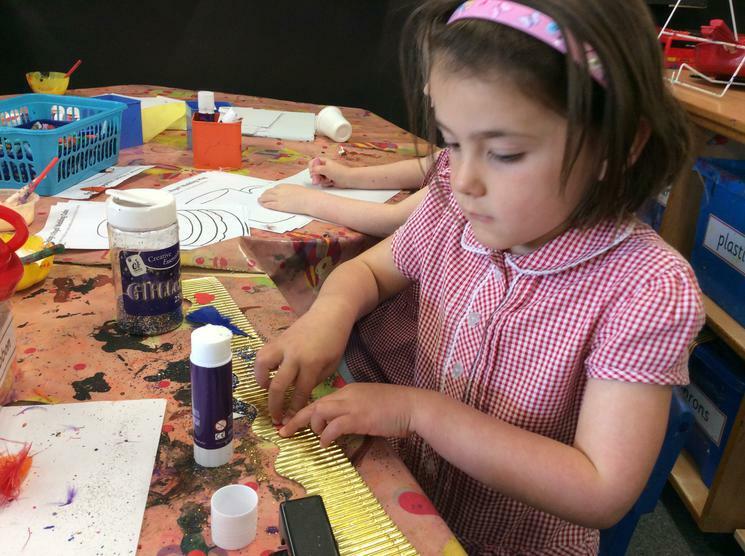 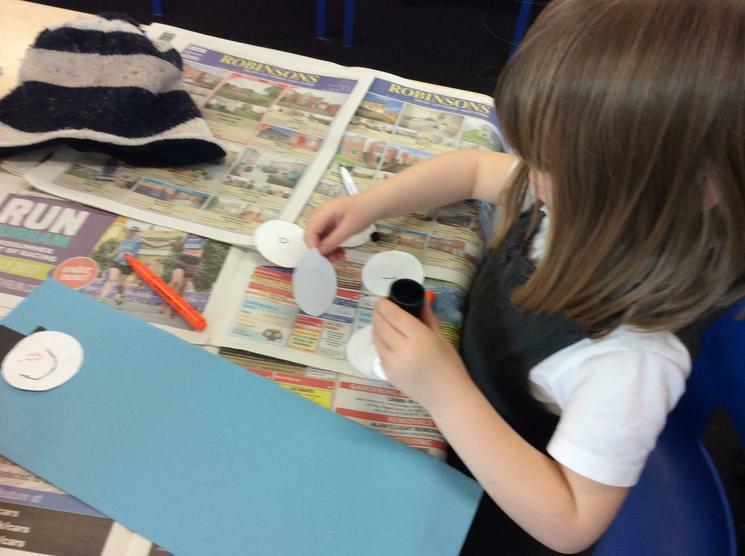 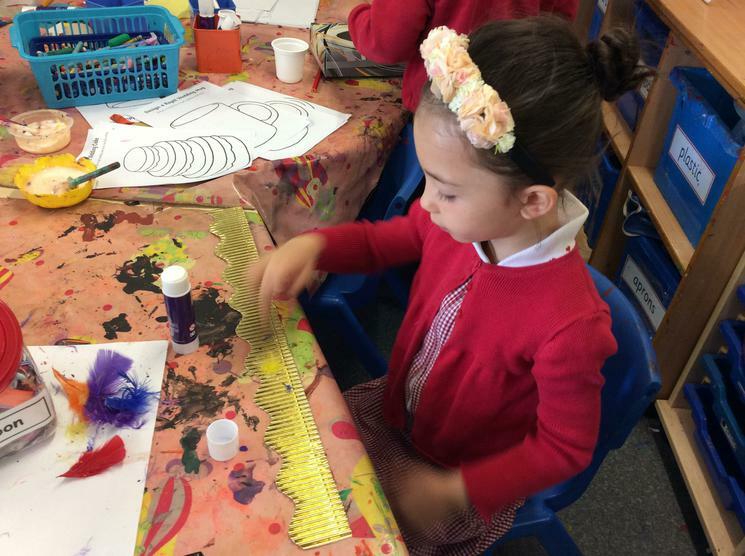 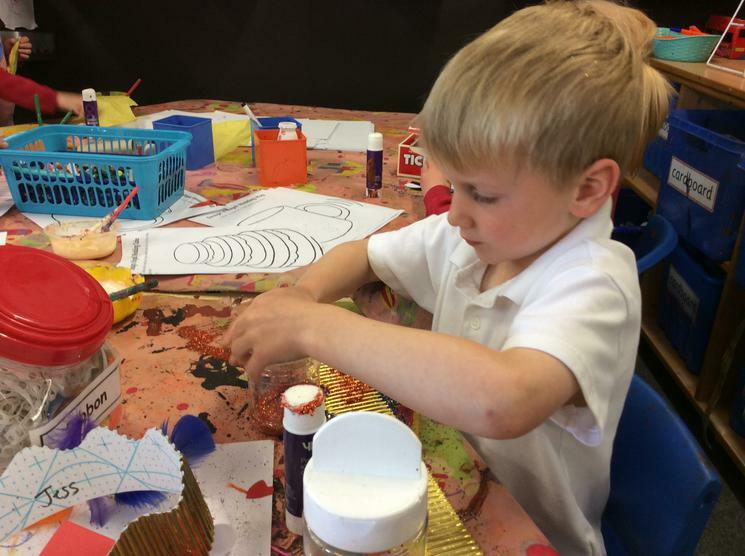 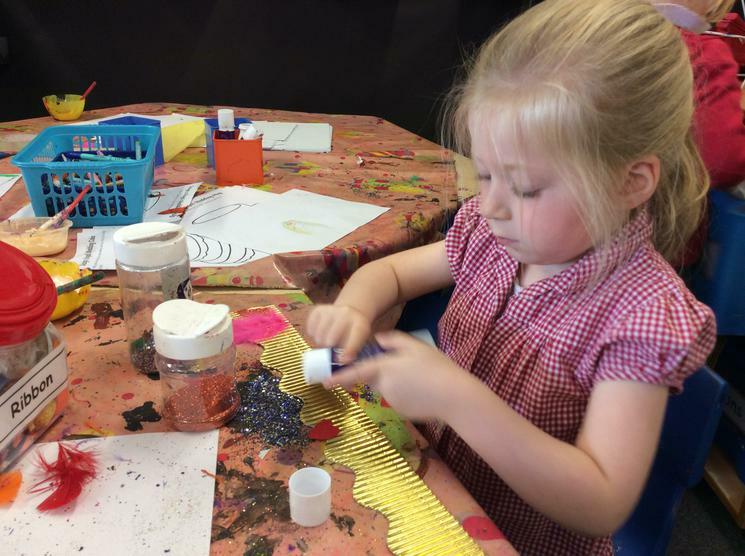 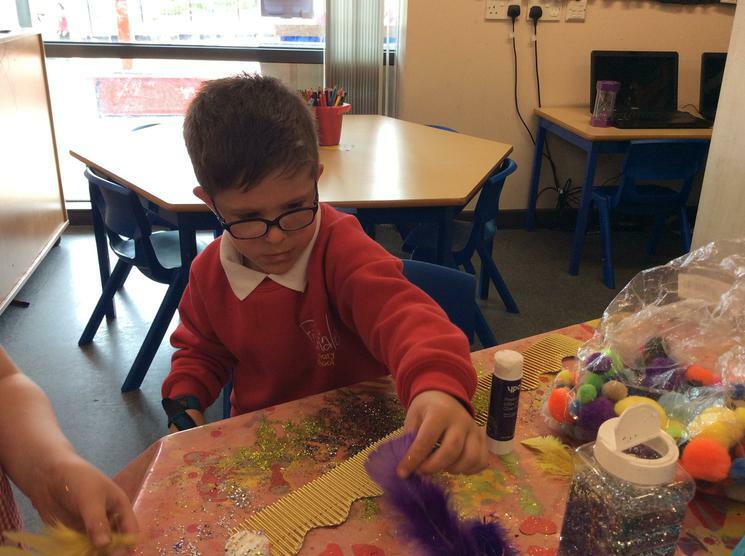 We made crowns to celebrate the royal wedding of Prince Harry and Meghan. 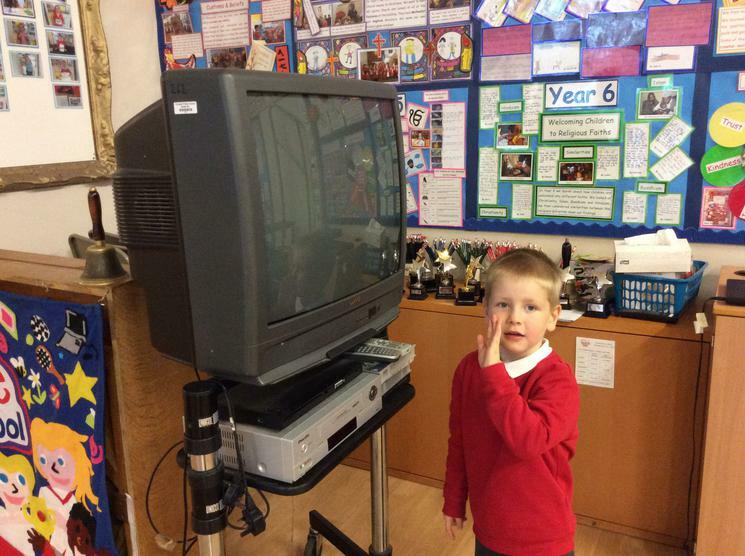 Look what appeared in our classroom this morning! 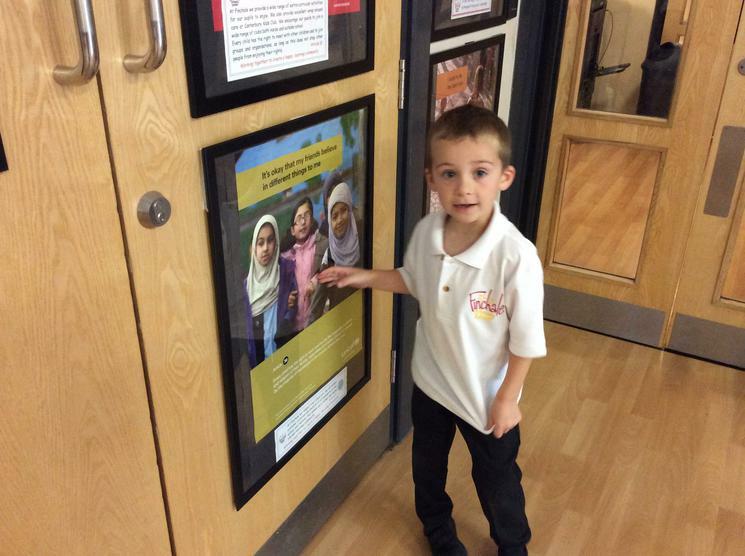 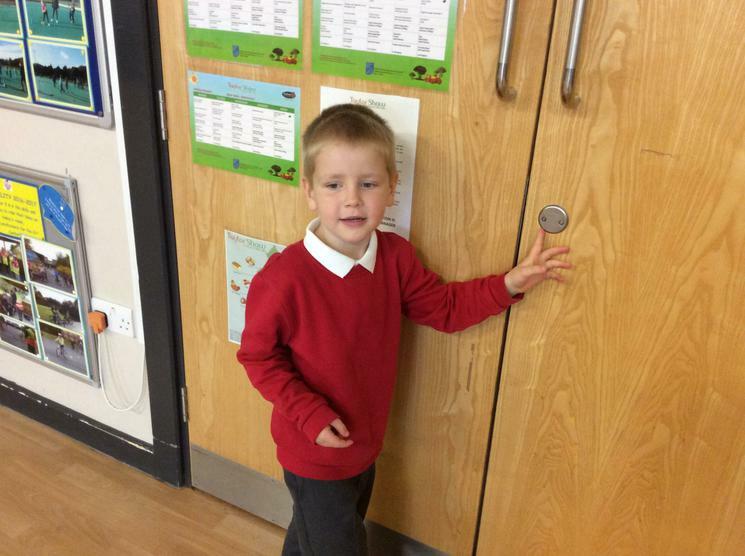 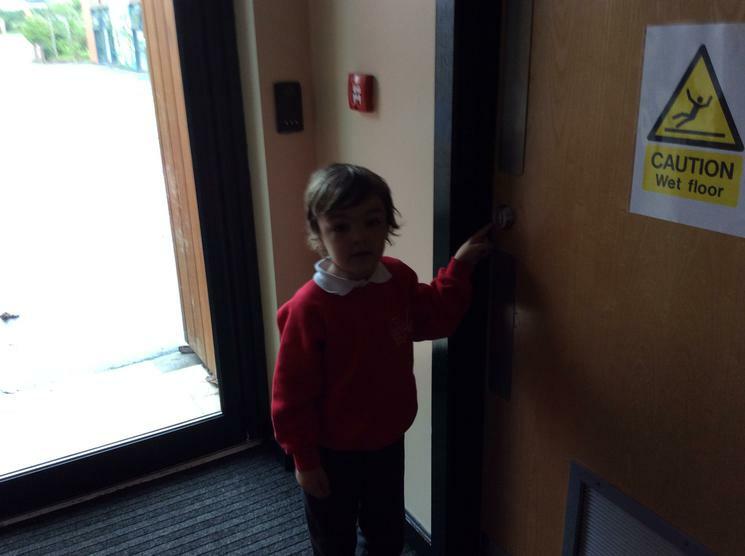 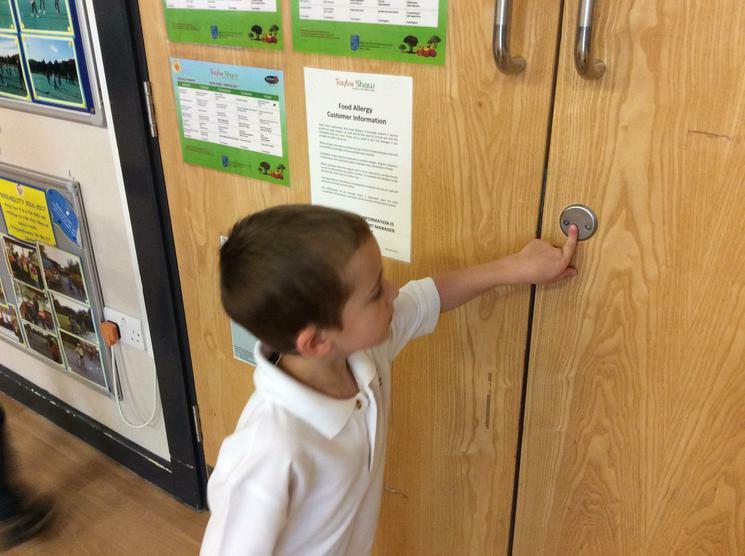 Adam Bushnell visited school and helped us plan a story about what might happen if the door opened. 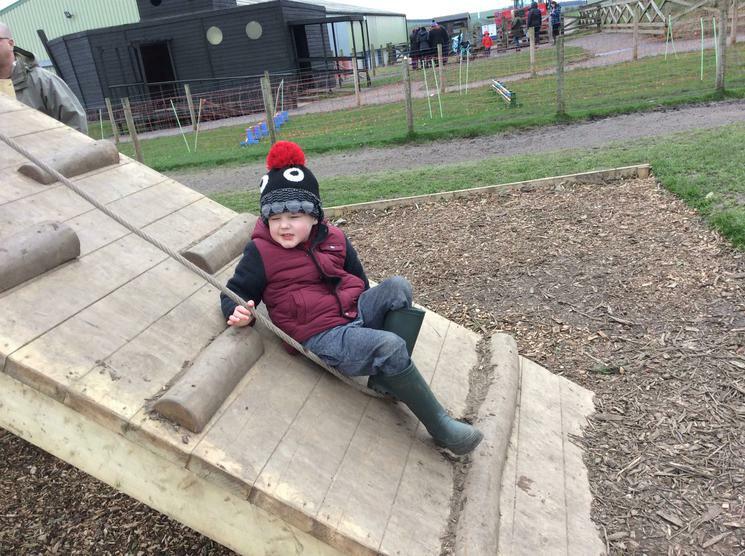 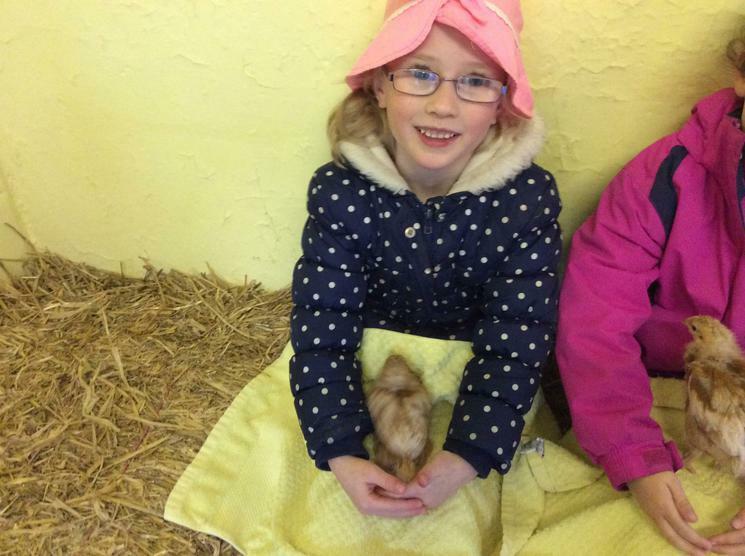 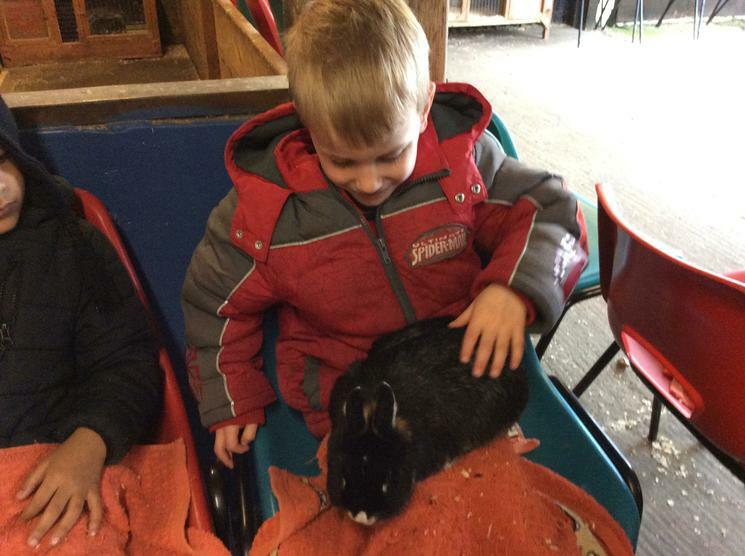 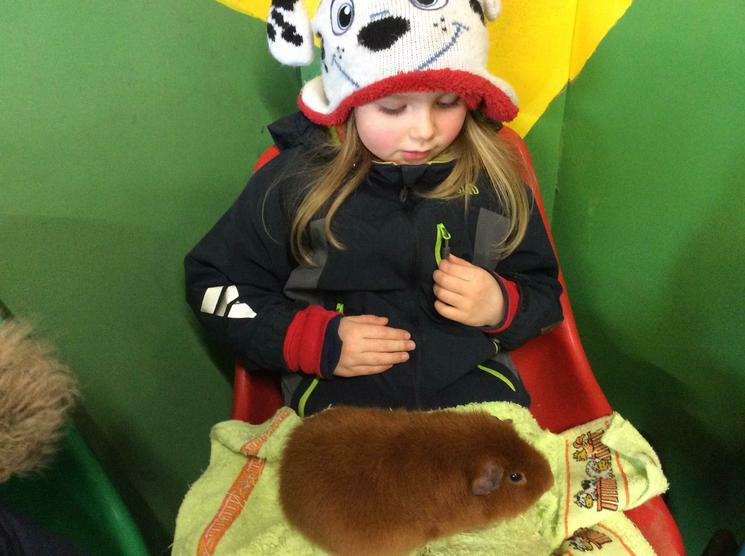 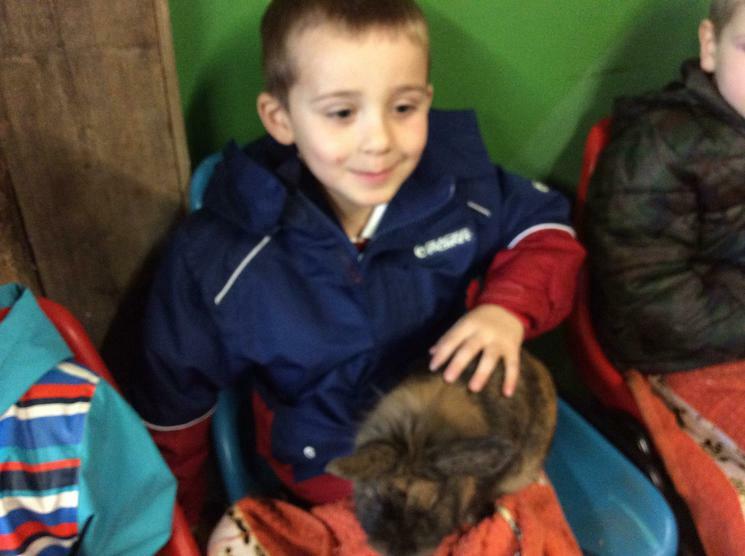 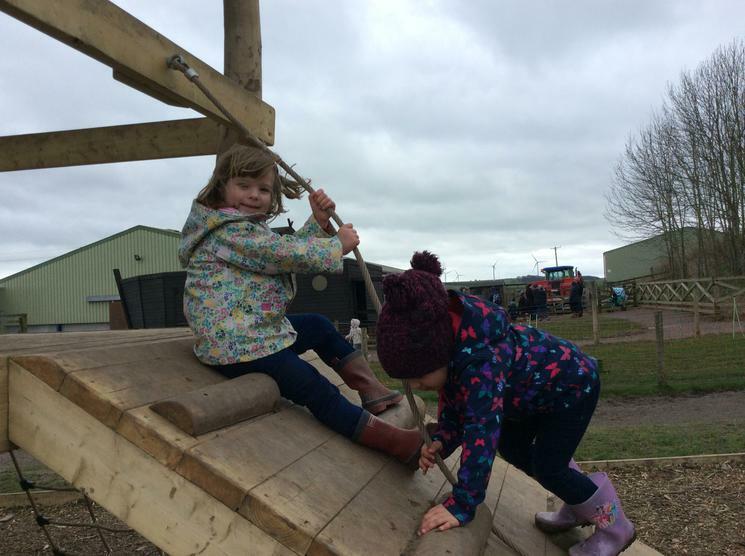 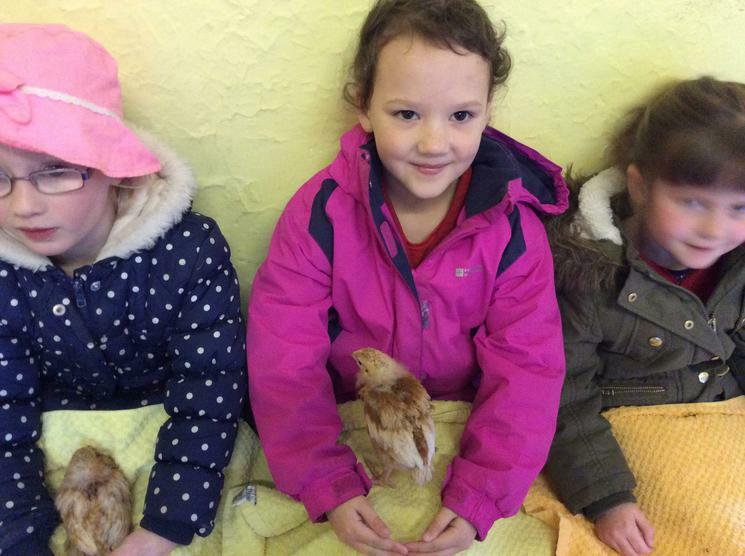 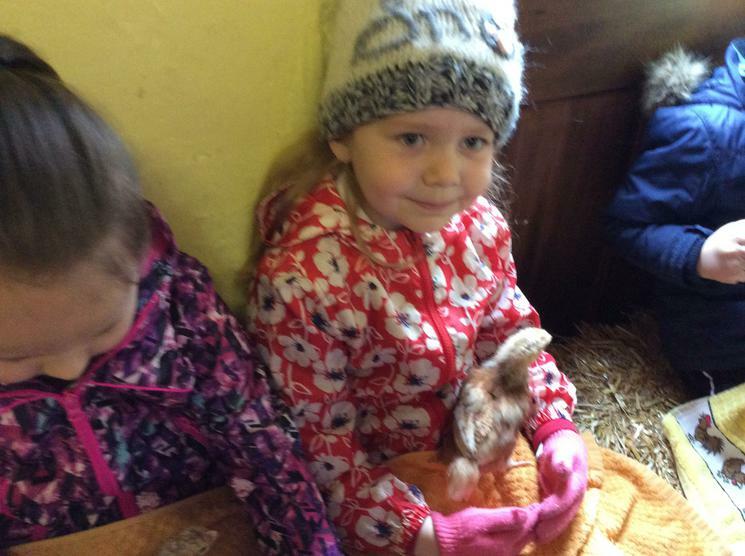 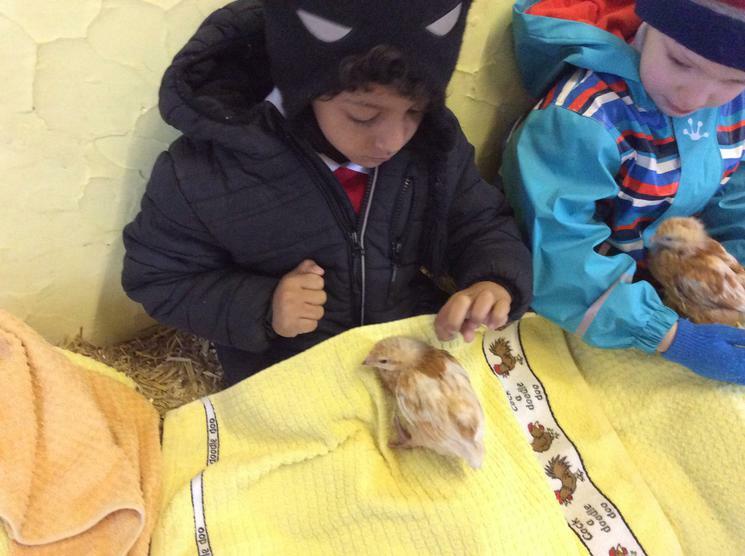 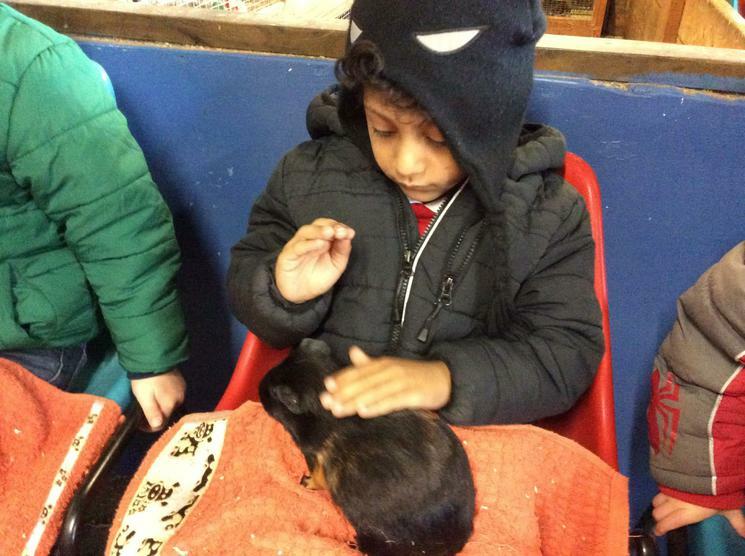 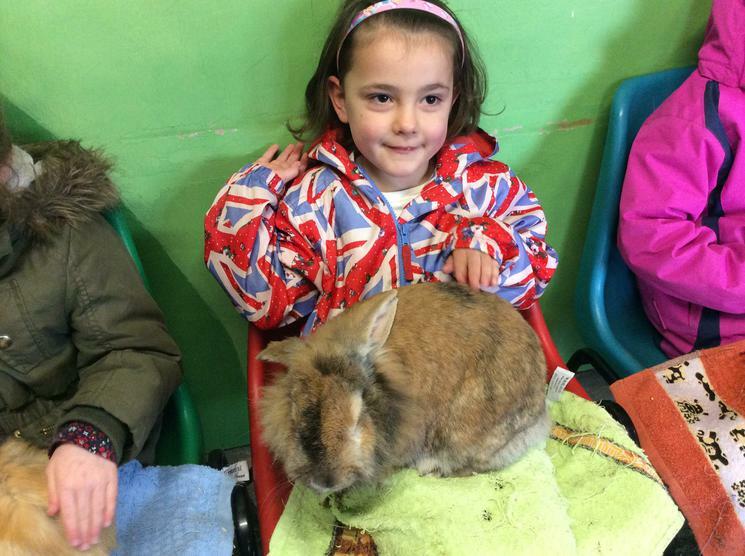 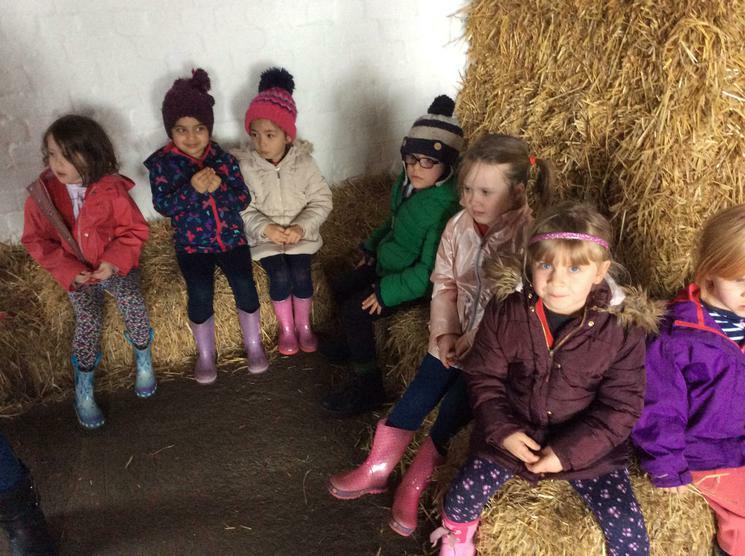 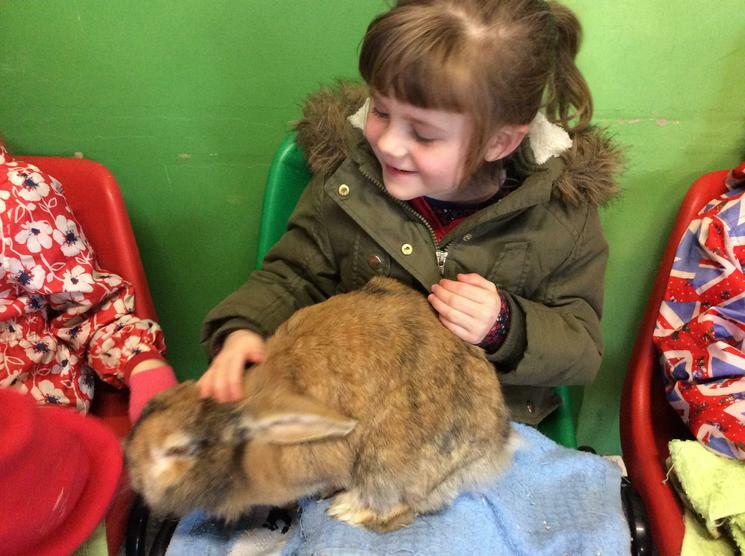 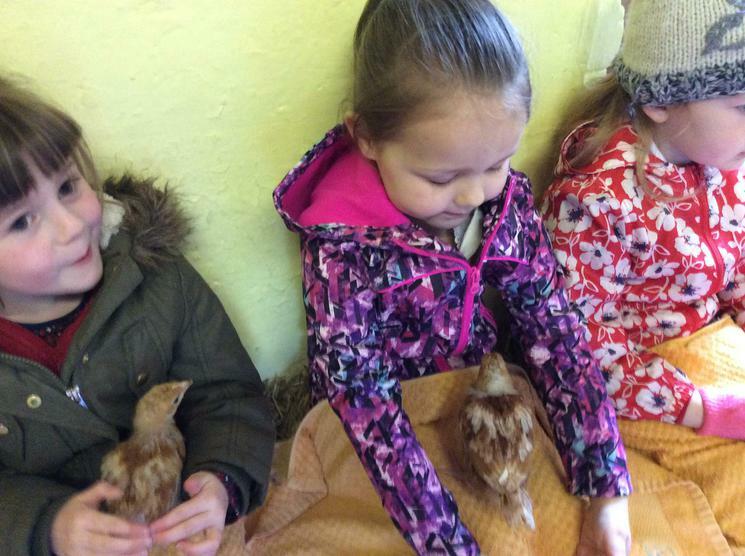 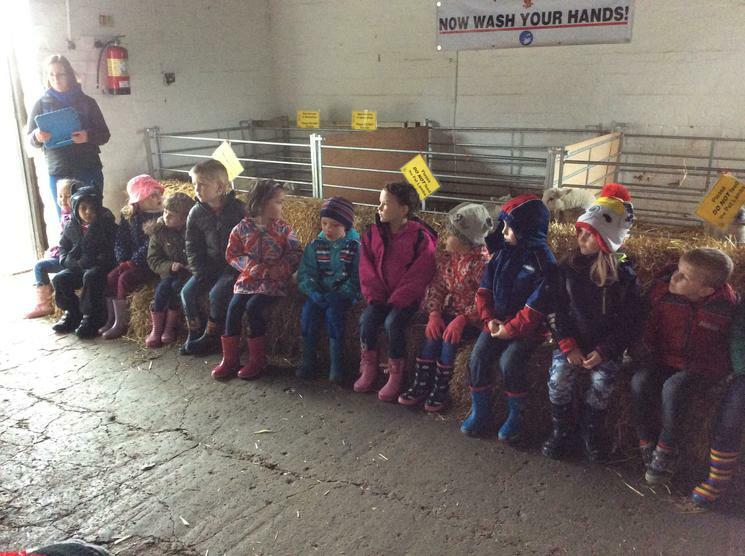 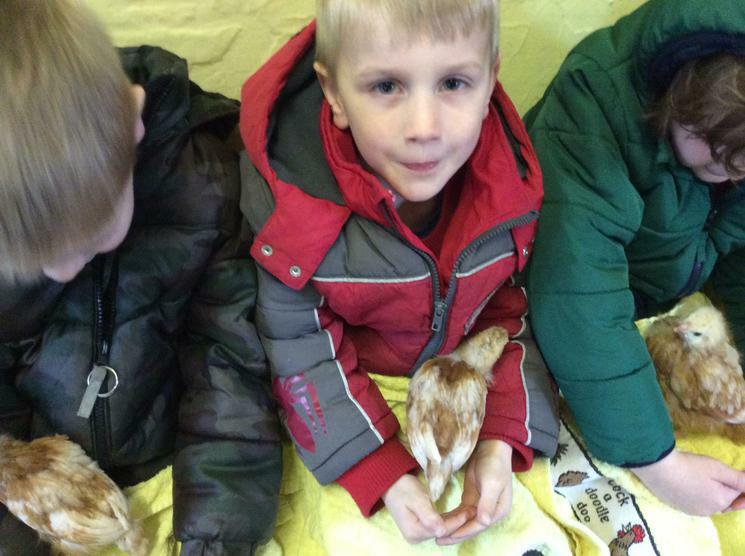 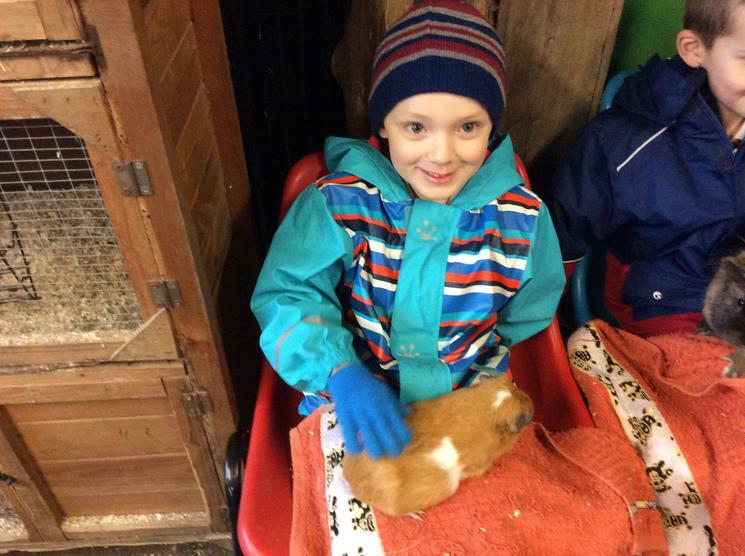 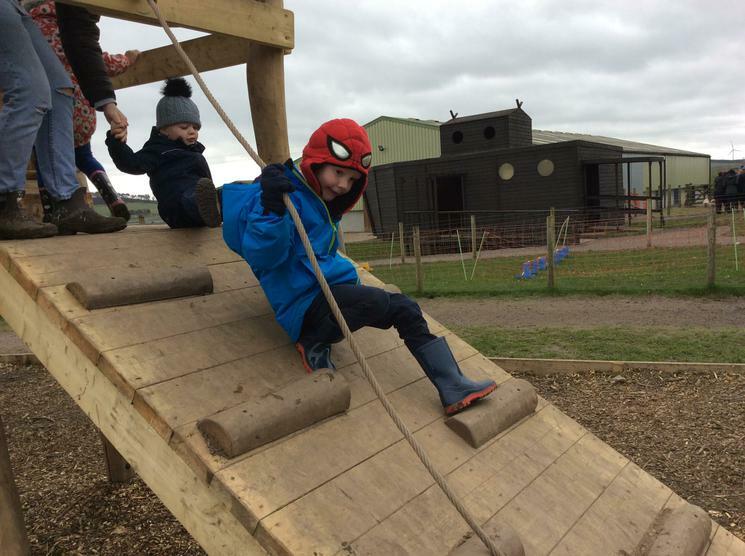 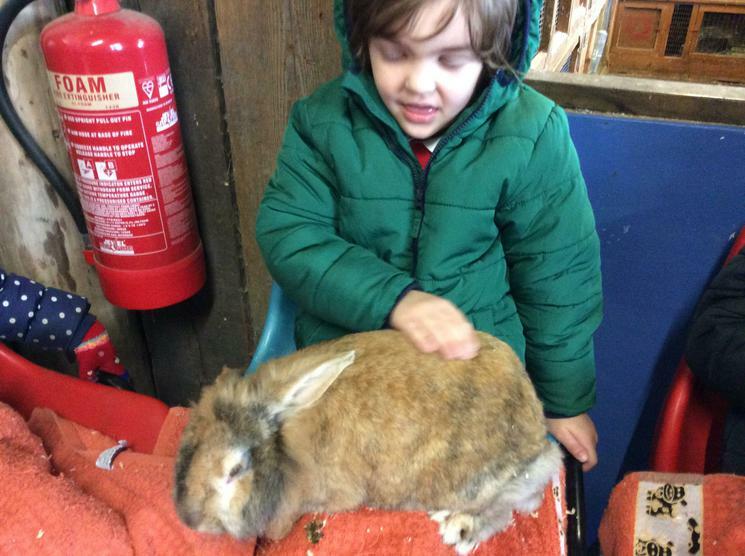 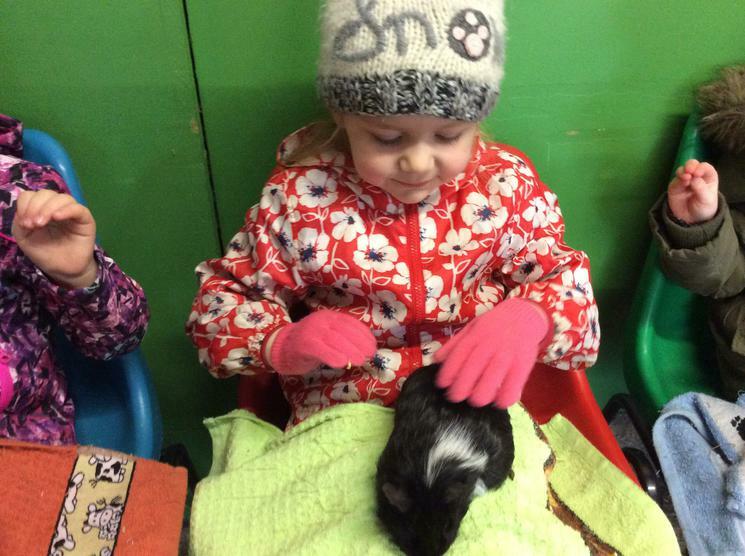 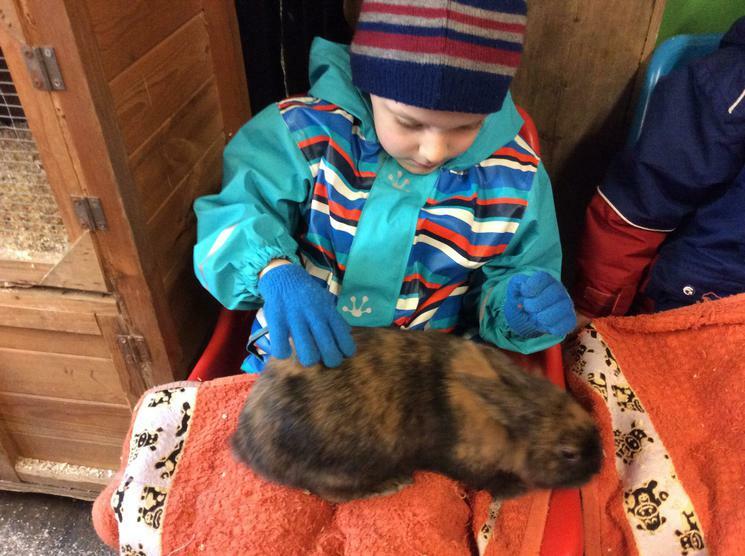 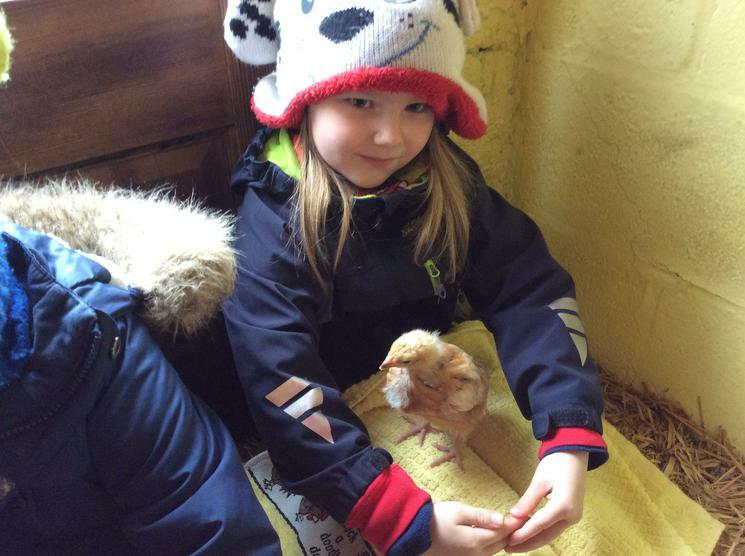 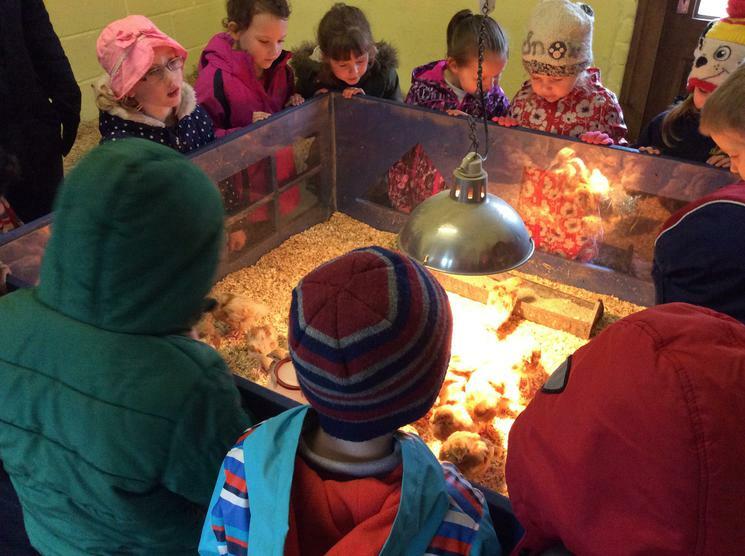 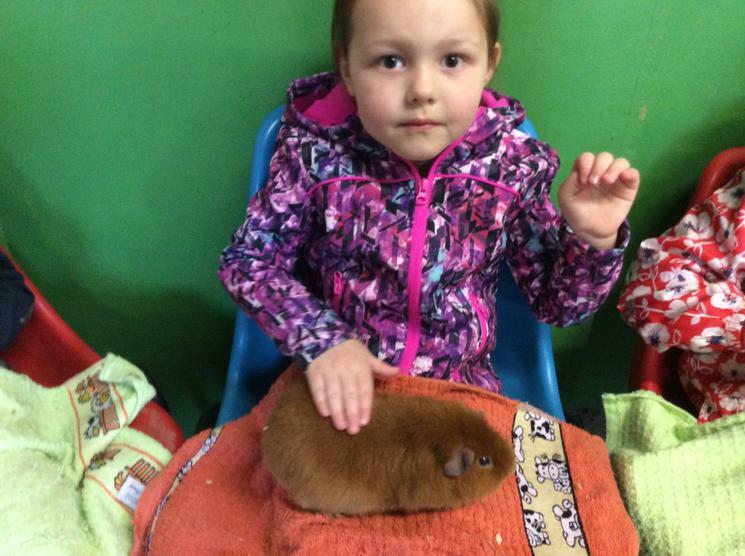 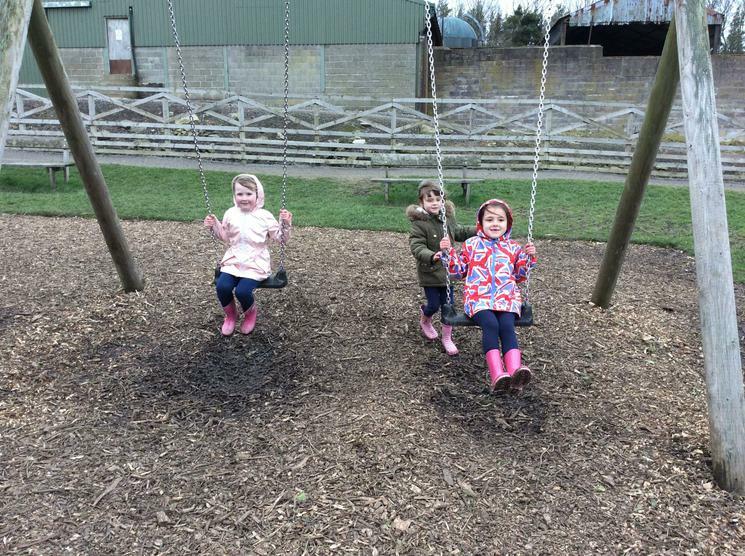 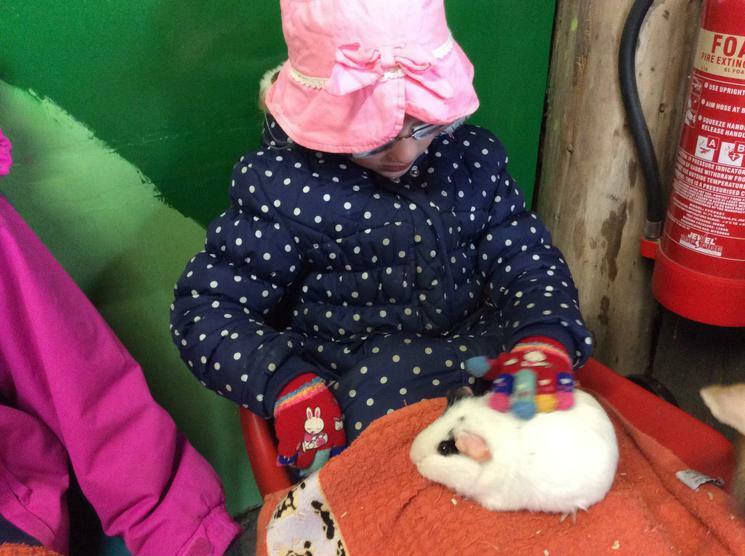 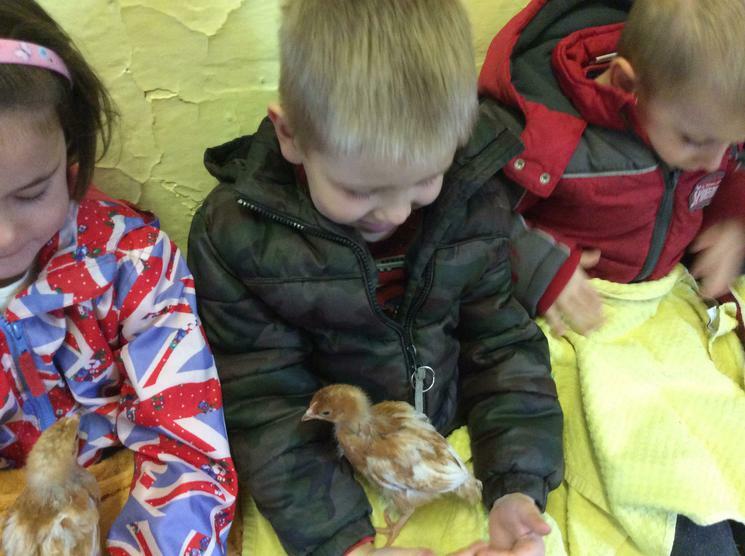 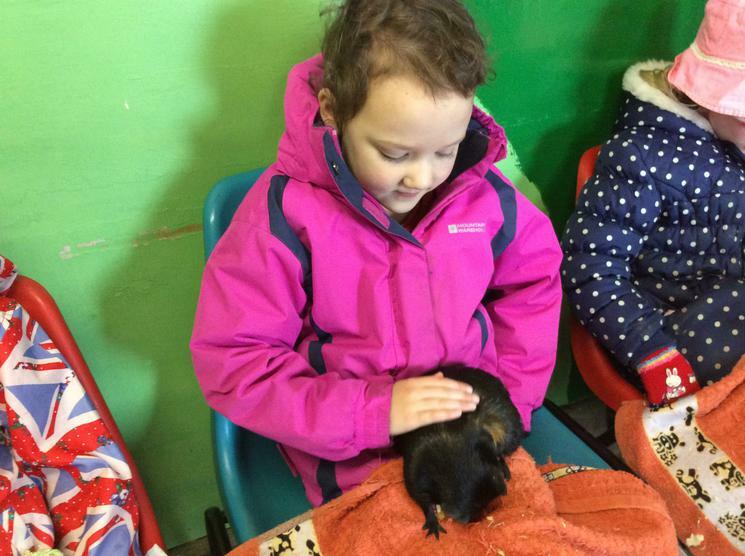 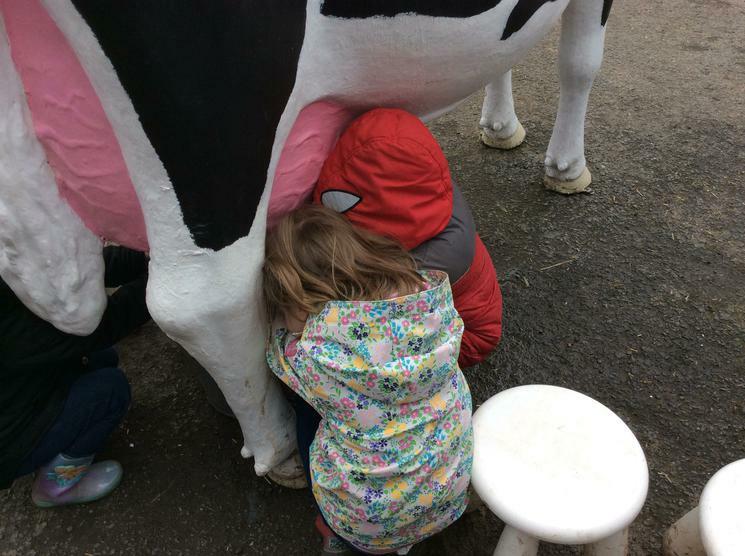 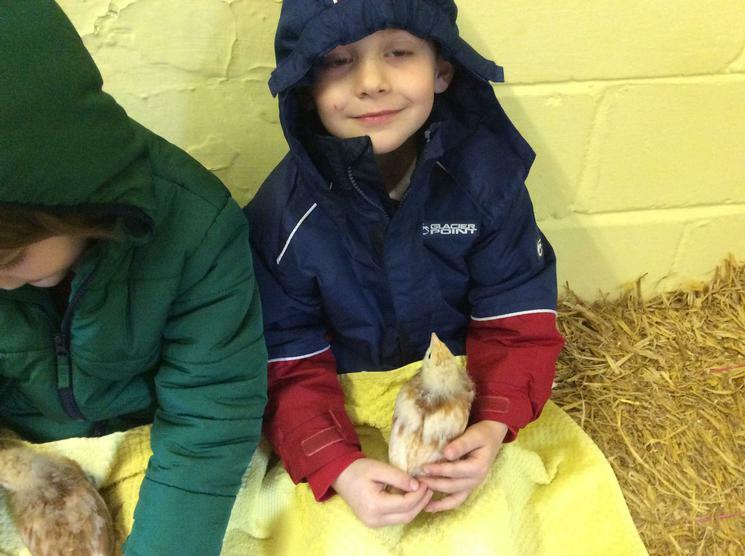 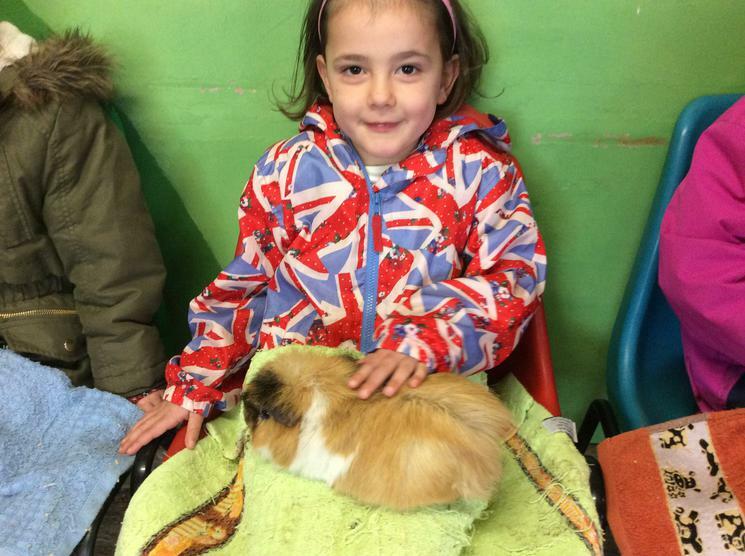 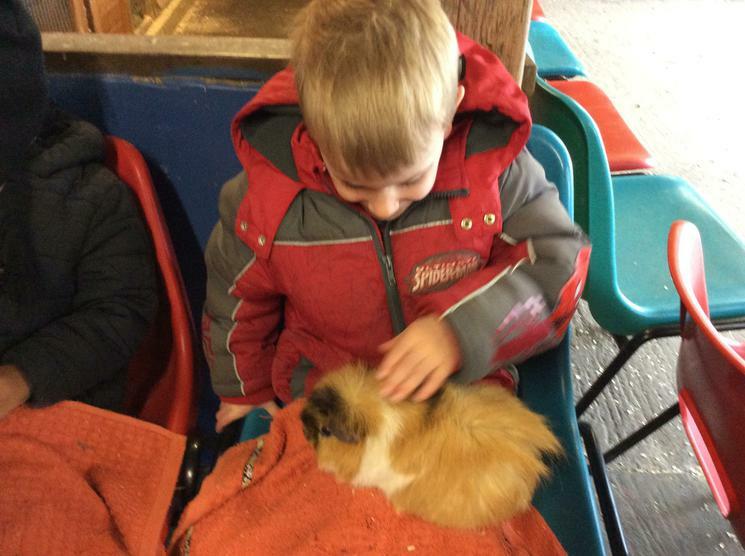 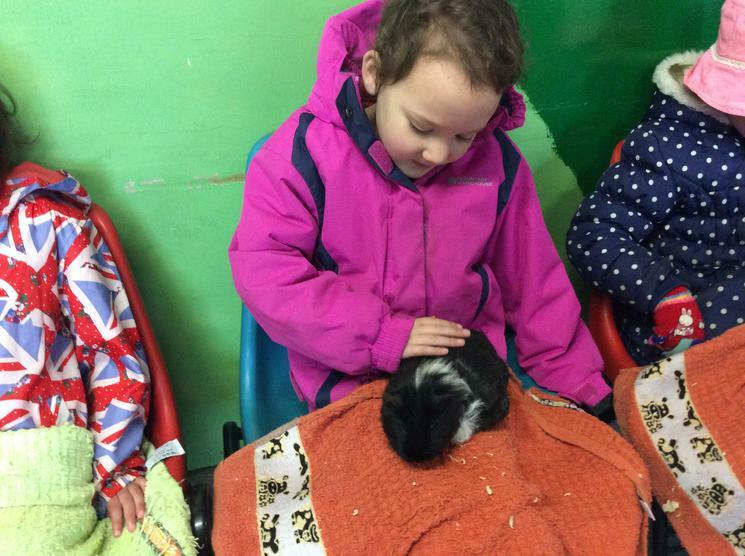 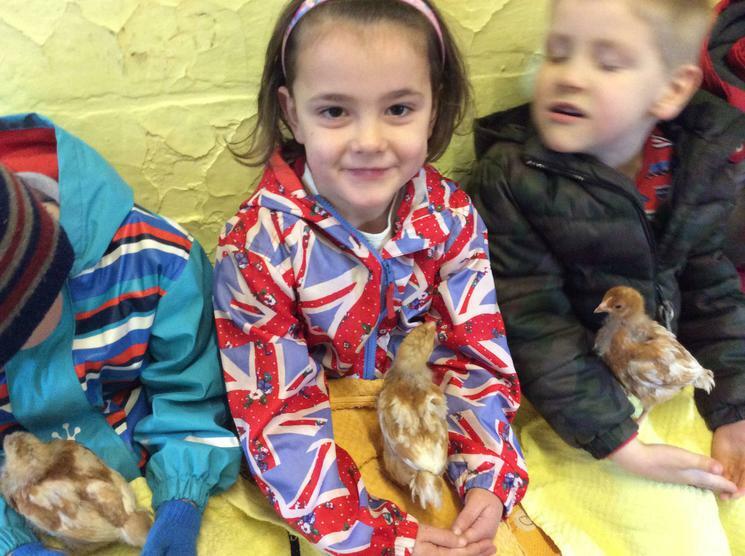 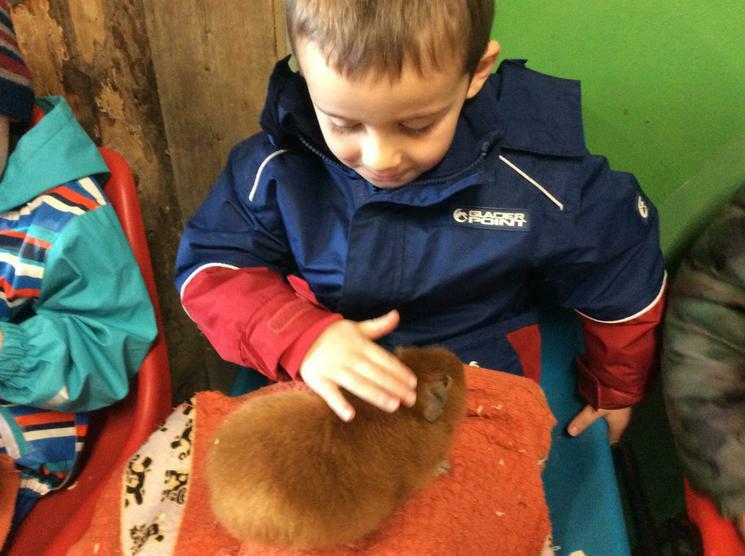 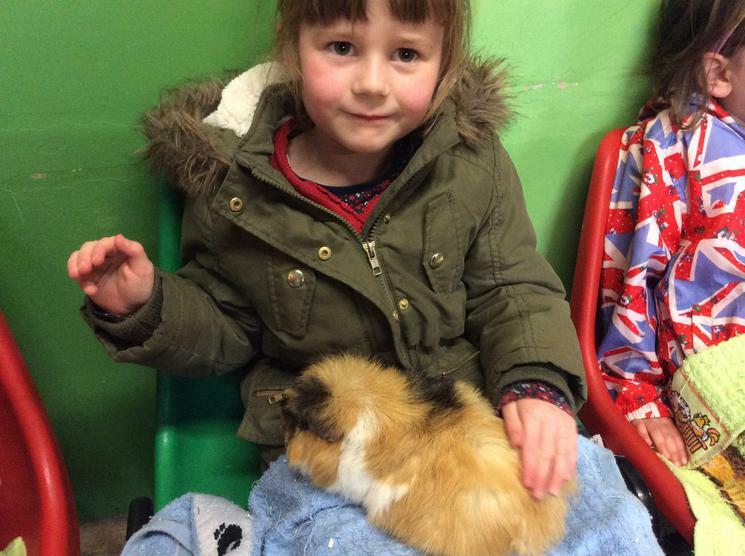 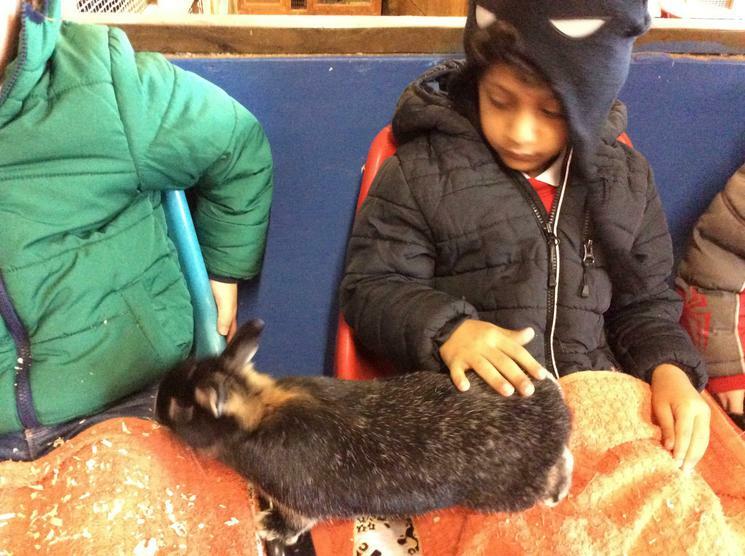 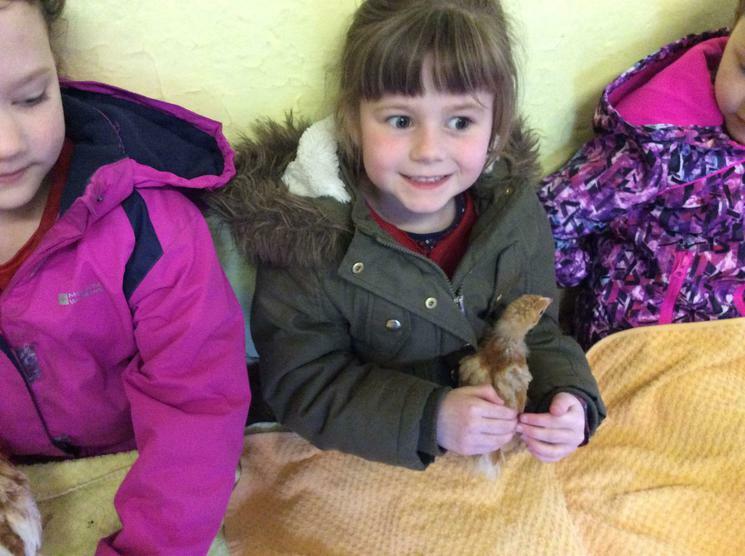 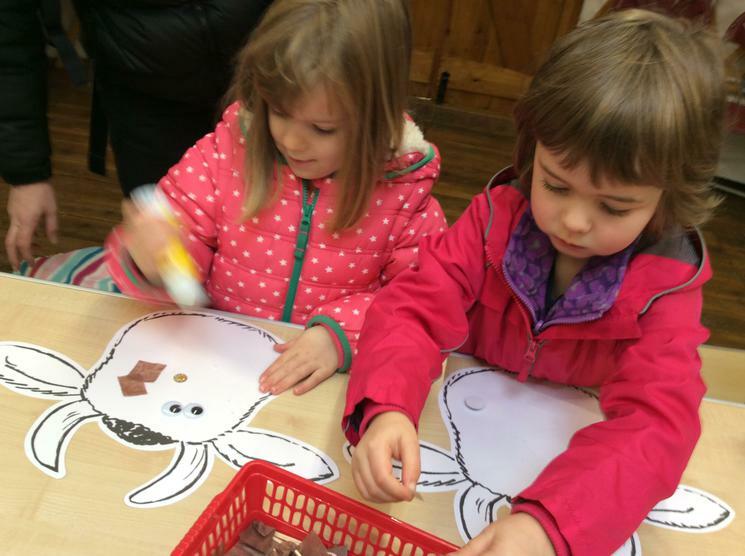 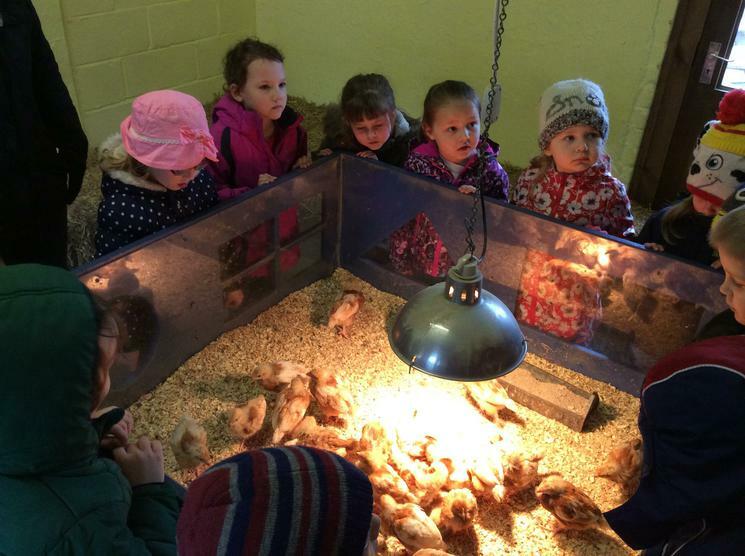 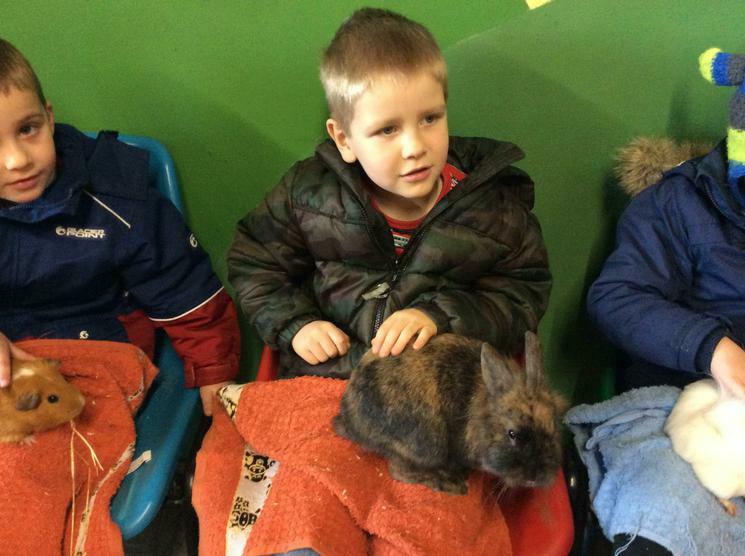 We visited Hall Hill Farm to learn about animals and their babies. 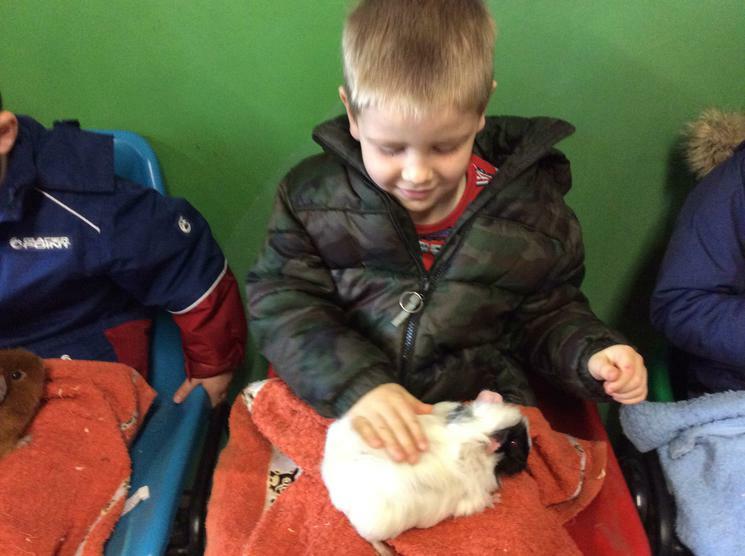 We held rabbits and guinea pigs. 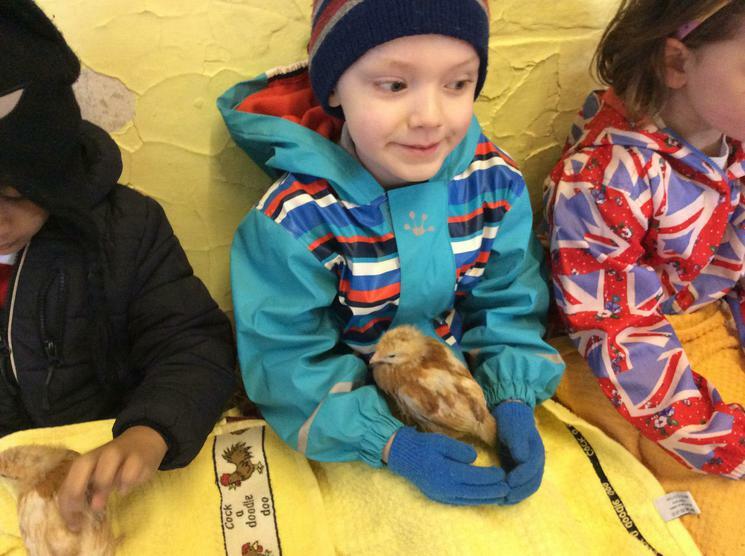 We held chicks. 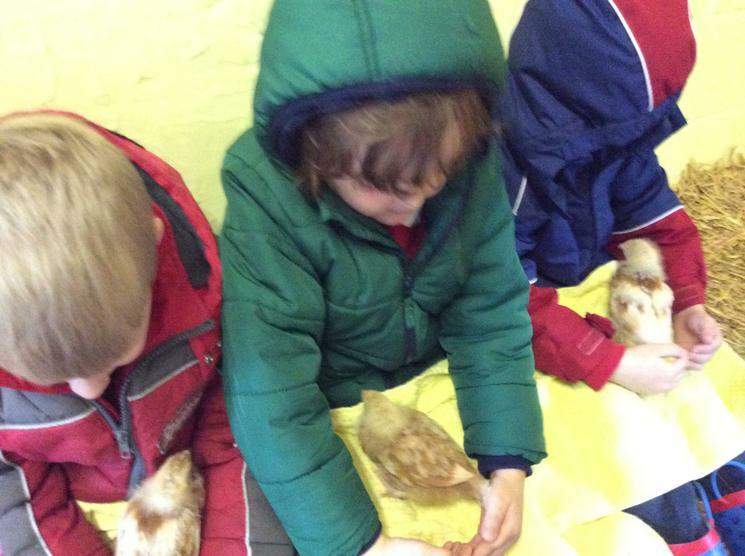 Some settled and had a little snooze, others were nosy and liked to look around. 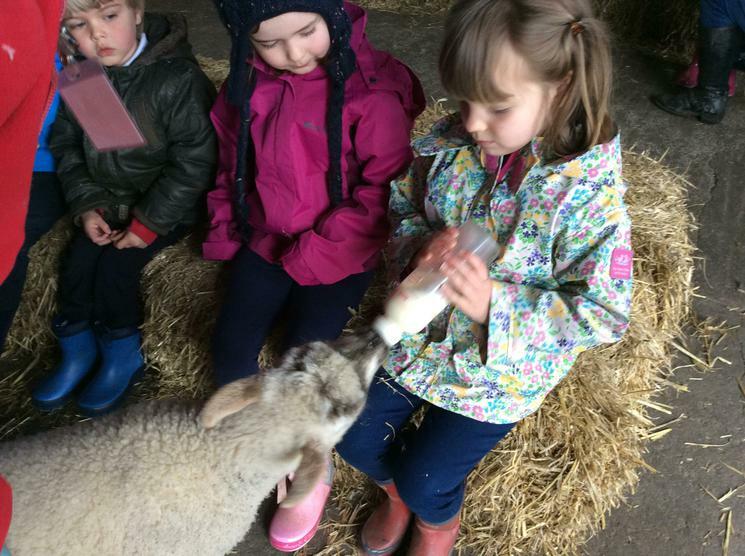 The lambs were very hungry. 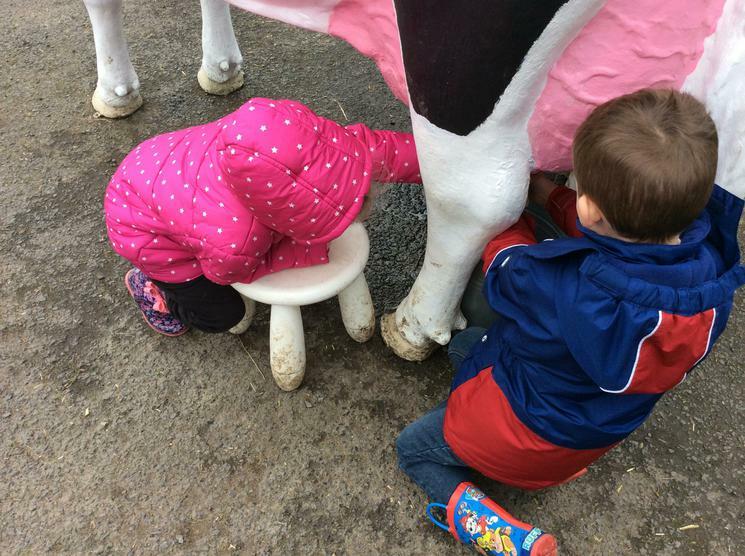 We fed one milk from a bottle. 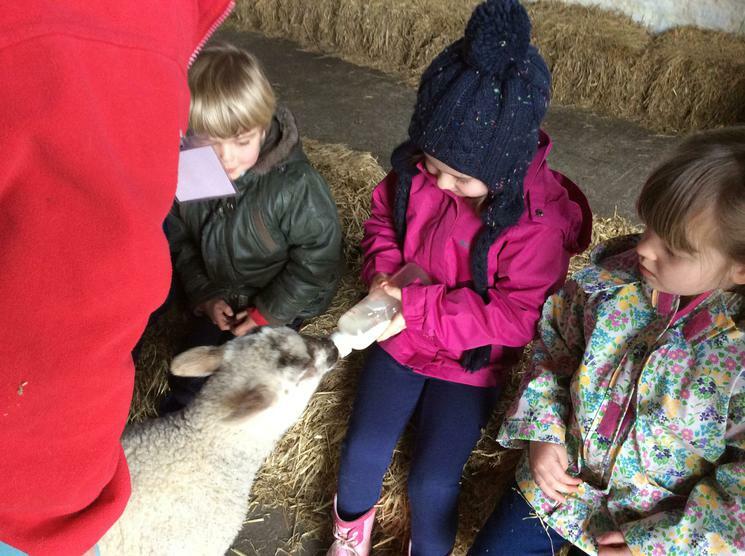 We had to hold on with two hands as the lamb was very strong. 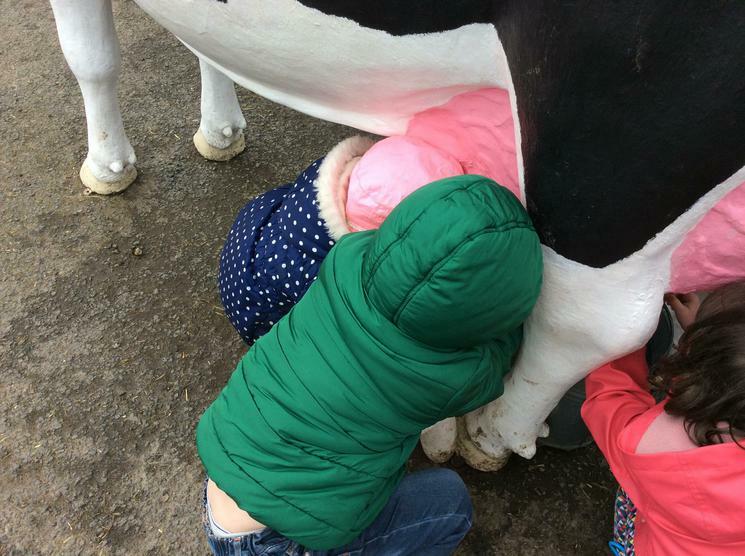 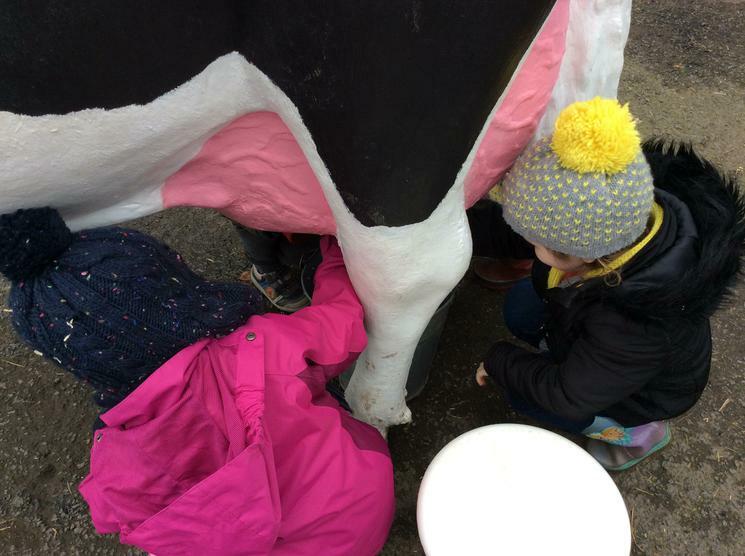 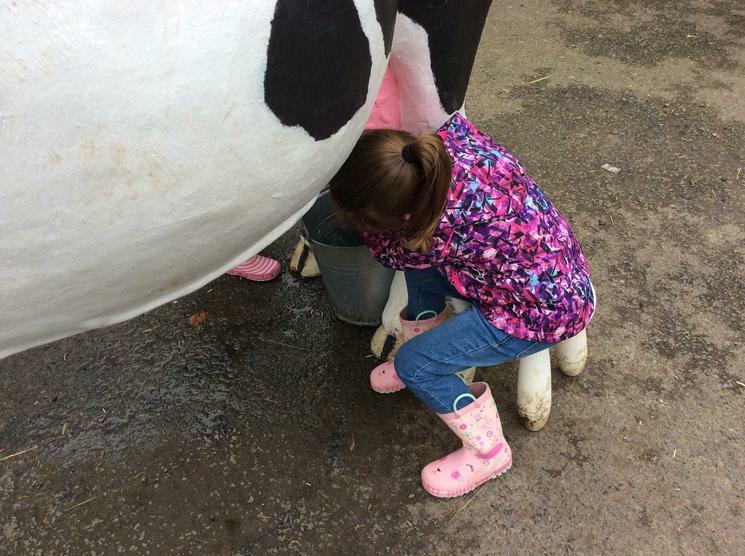 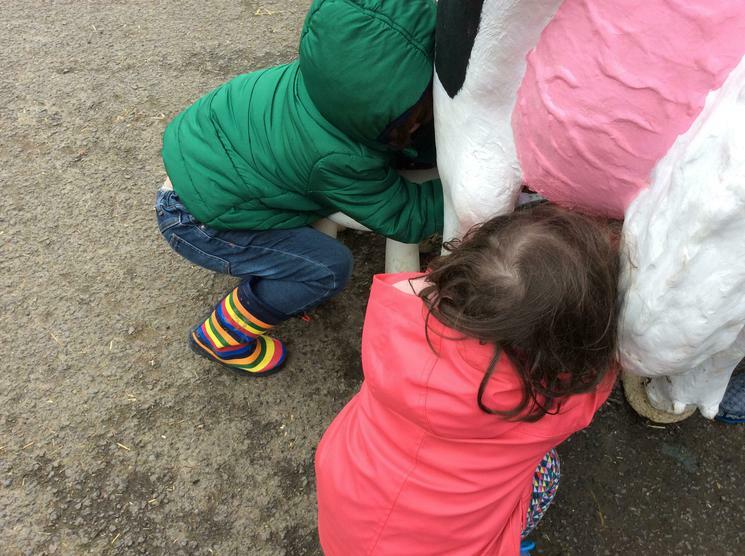 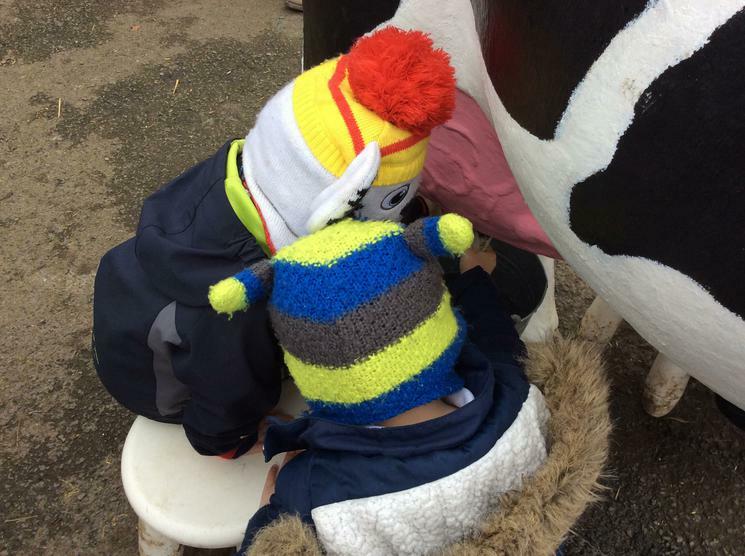 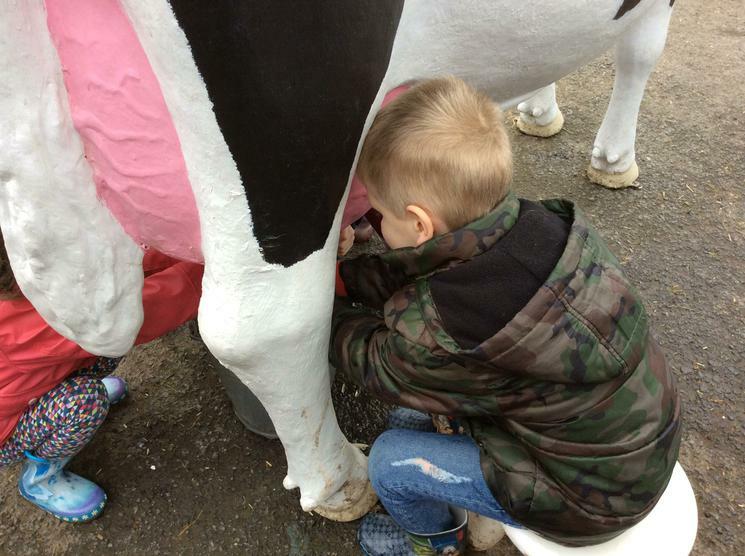 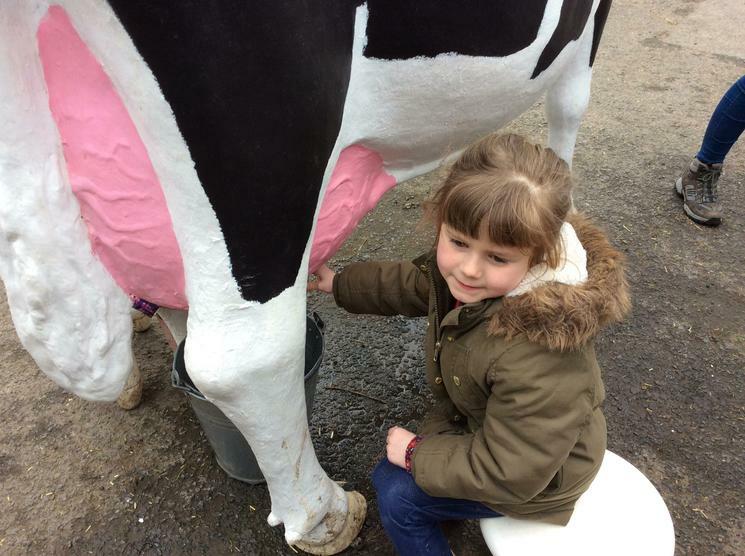 We even got a chance to milk a cow! 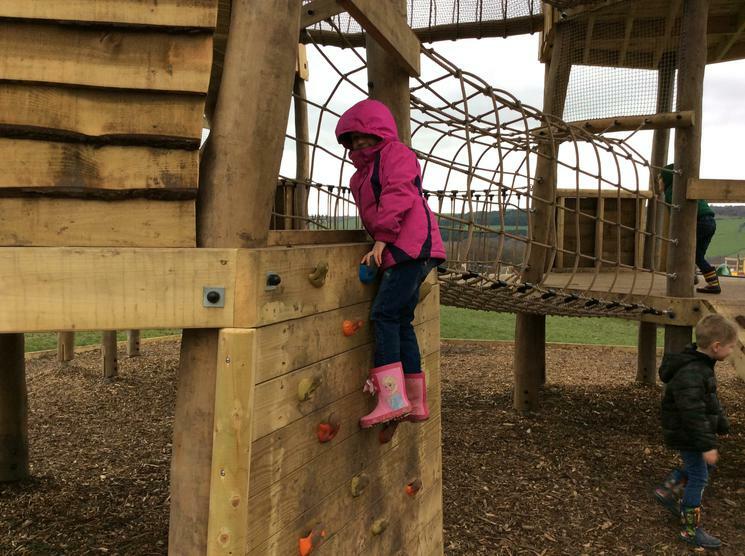 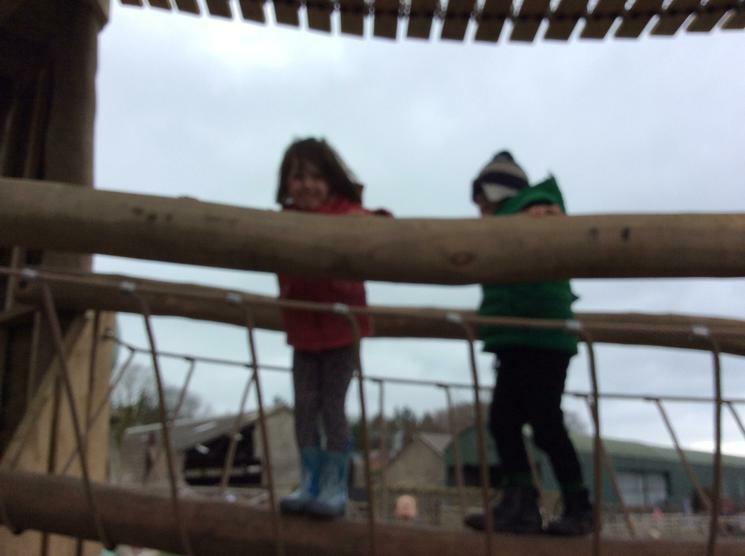 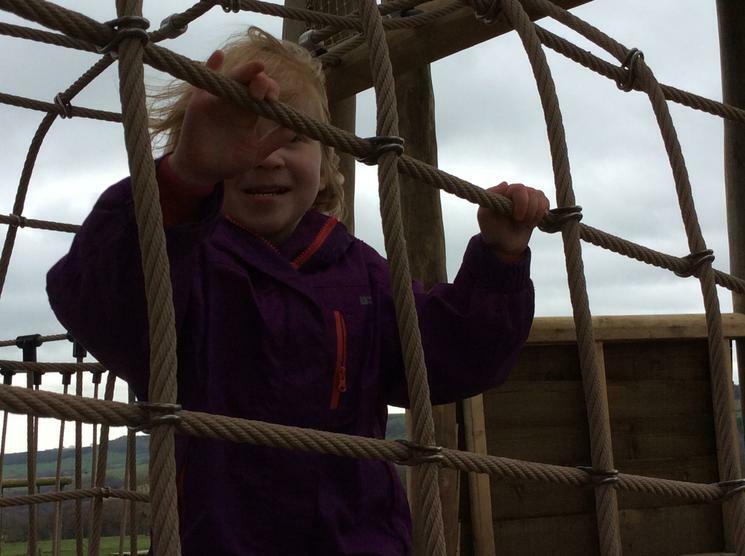 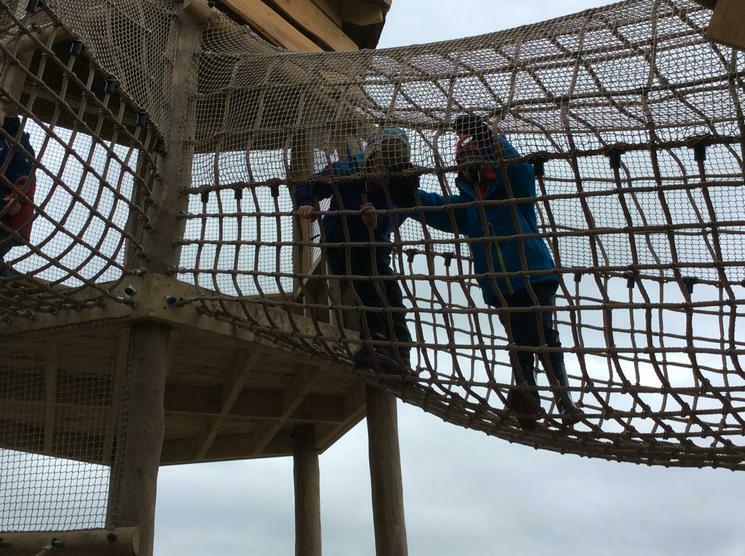 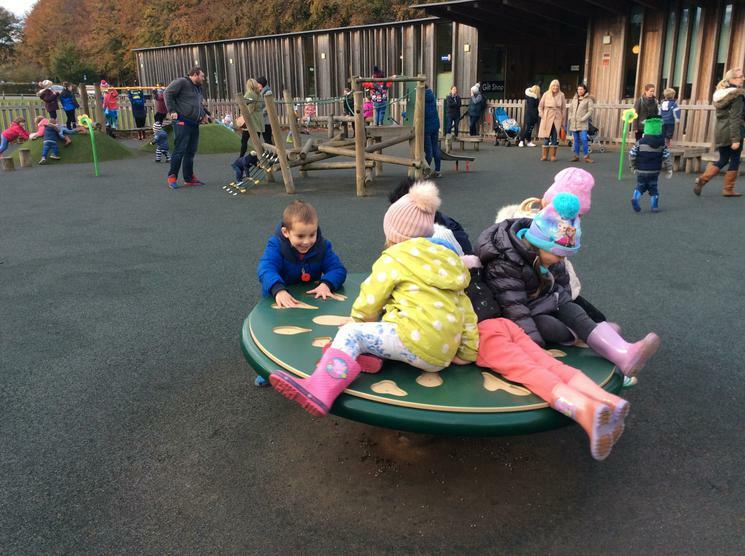 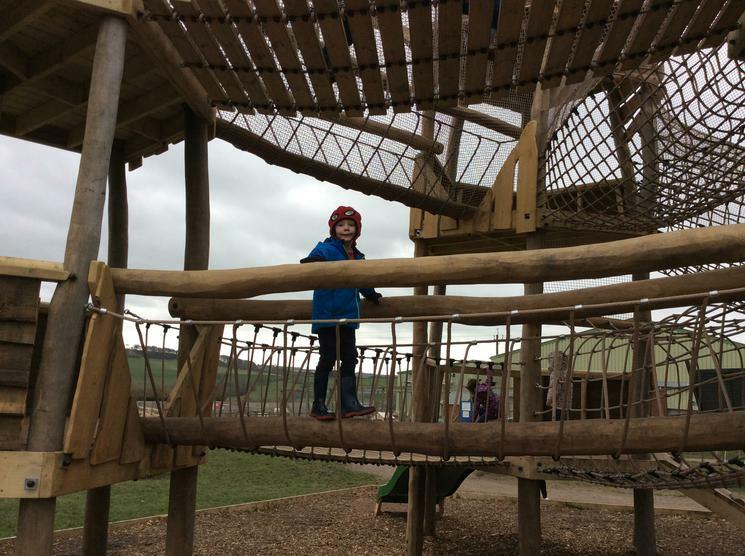 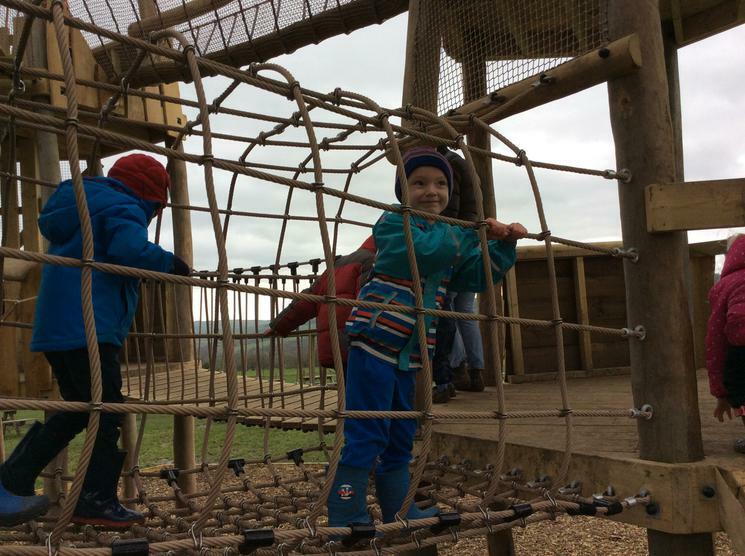 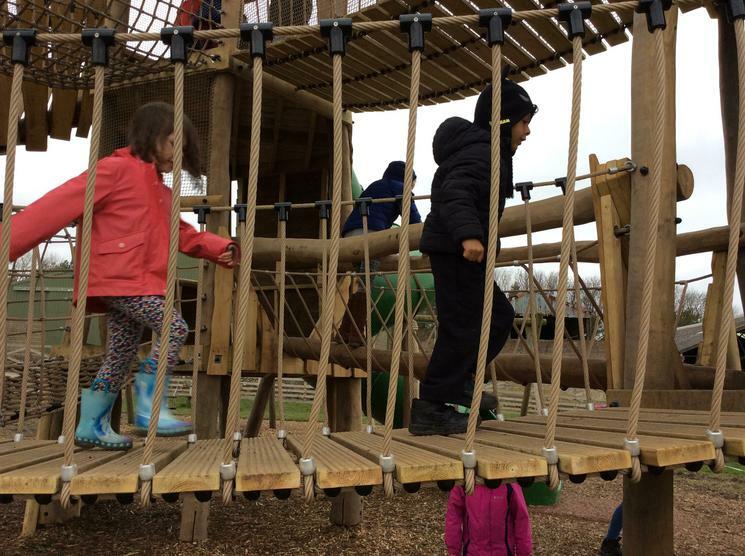 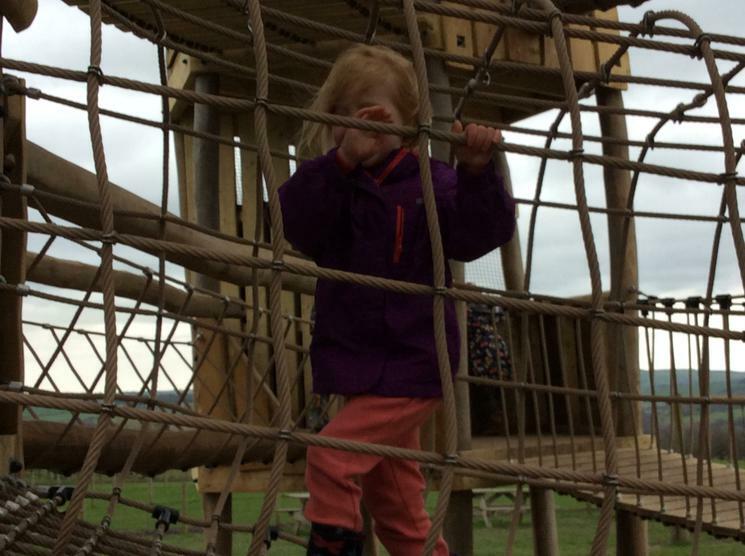 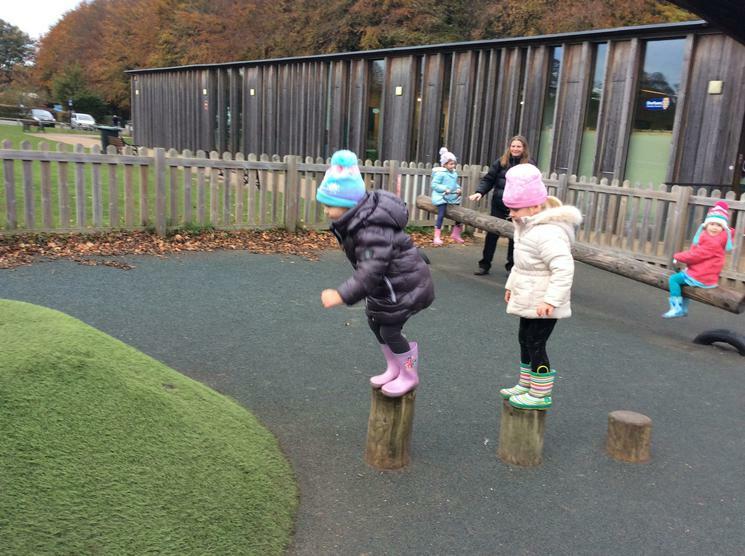 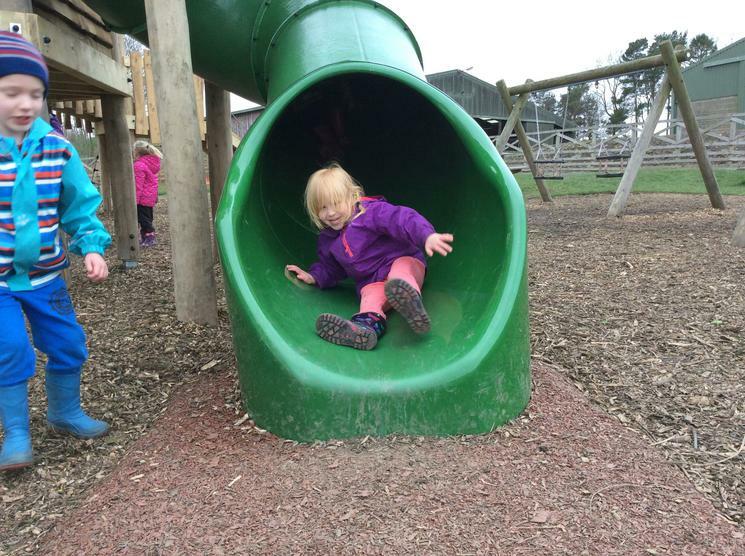 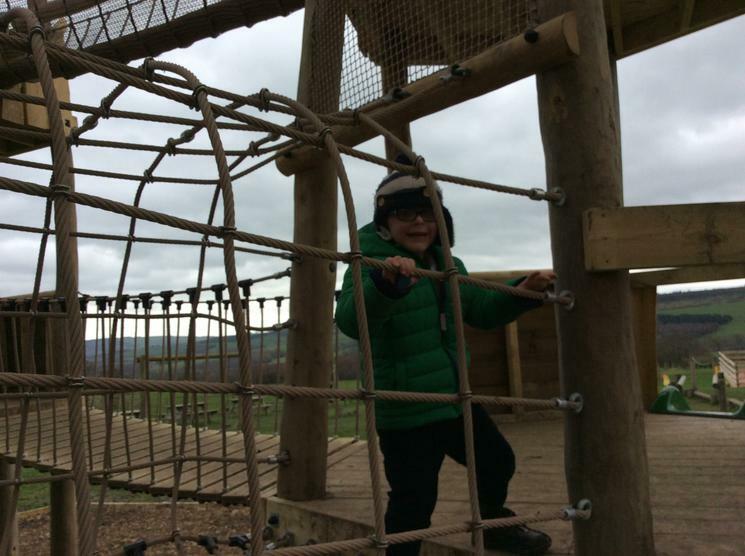 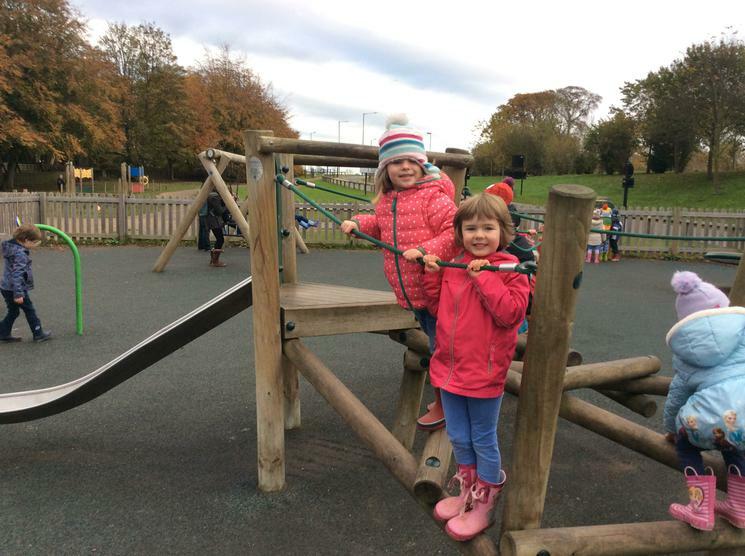 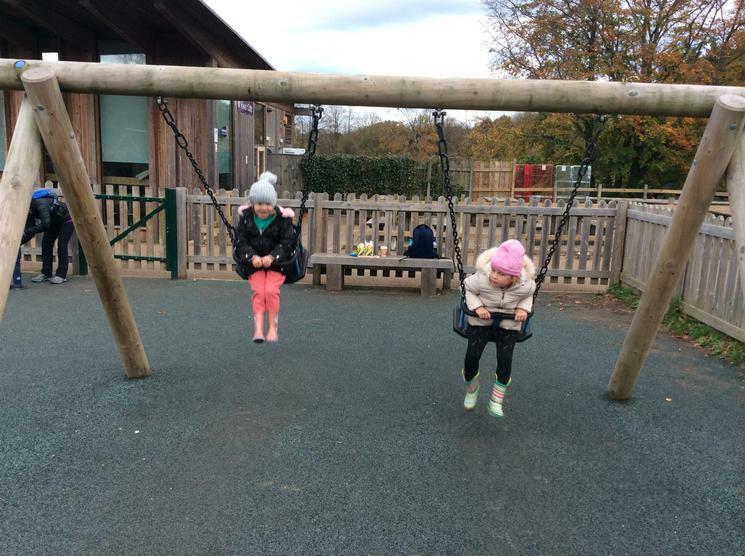 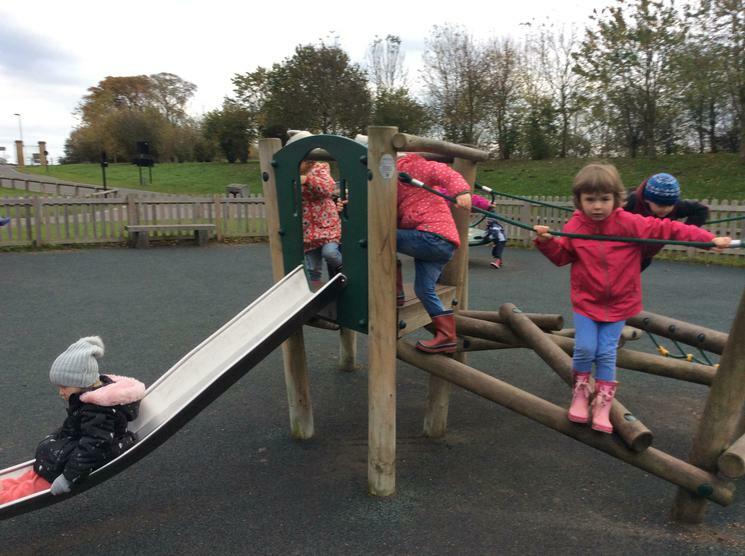 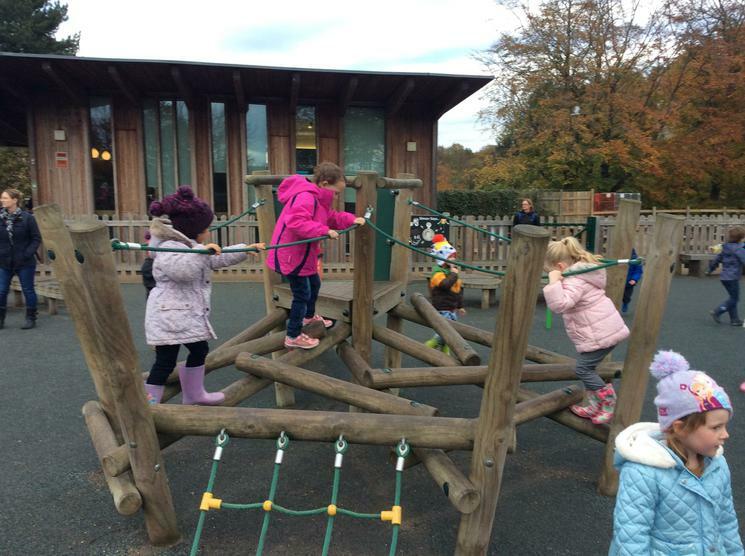 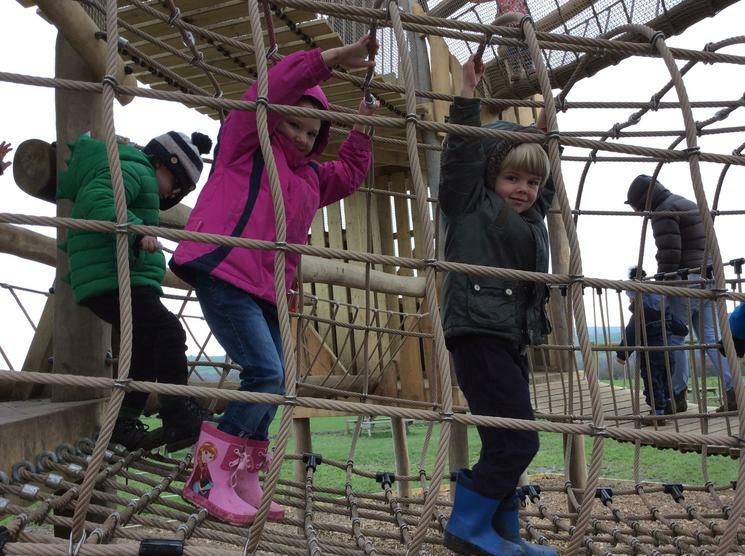 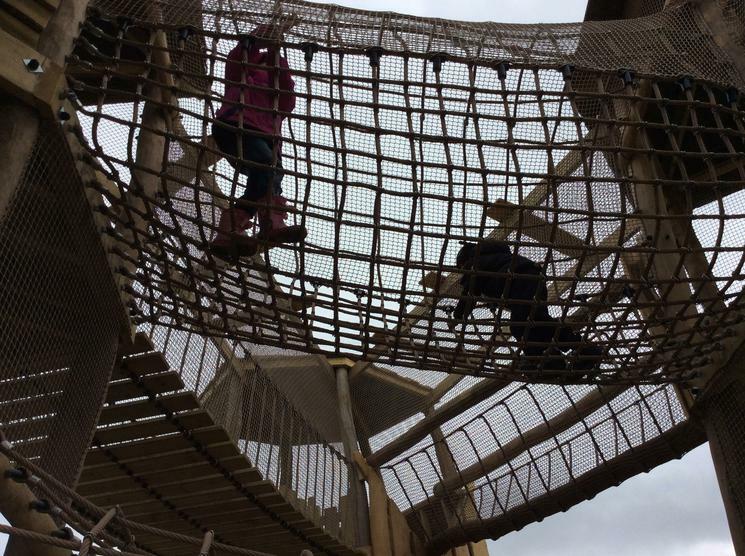 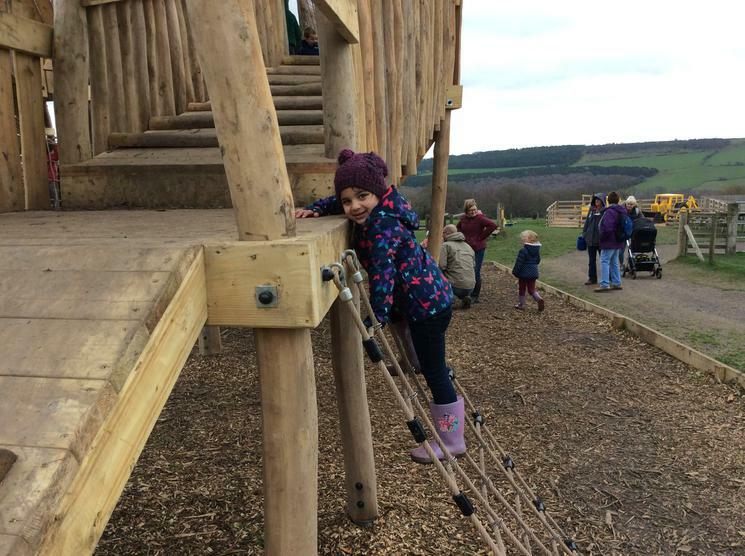 We played on the new play area. 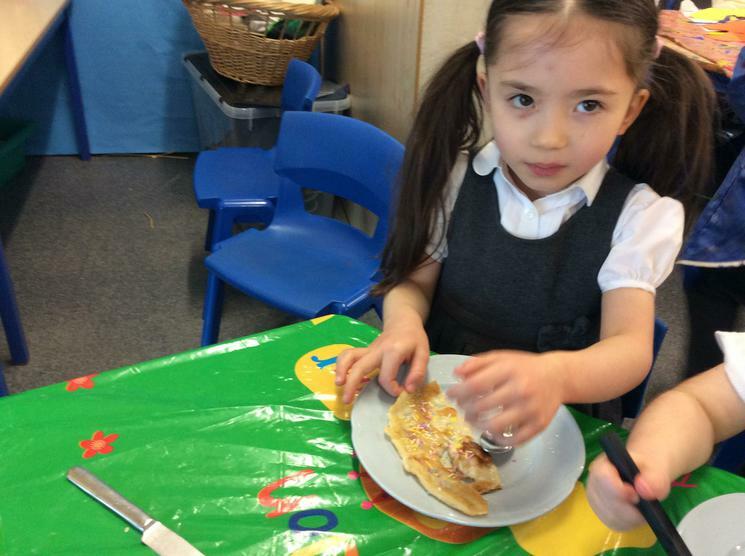 We made pancakes ahead of Shrove Tuesday. 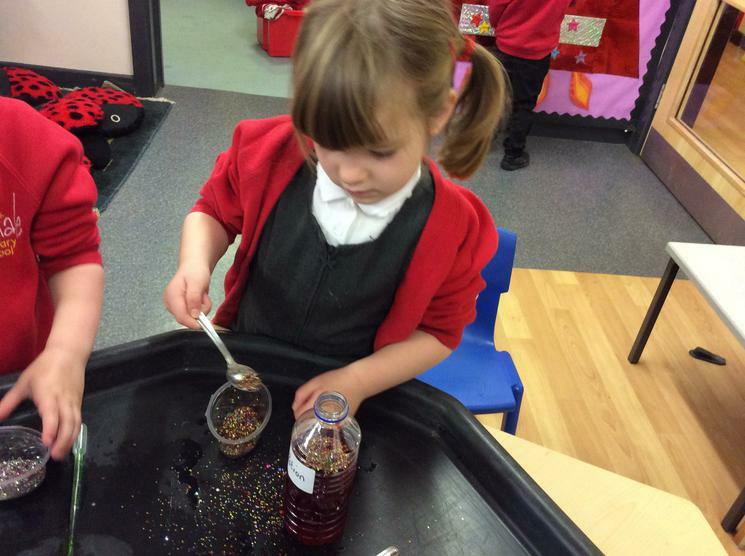 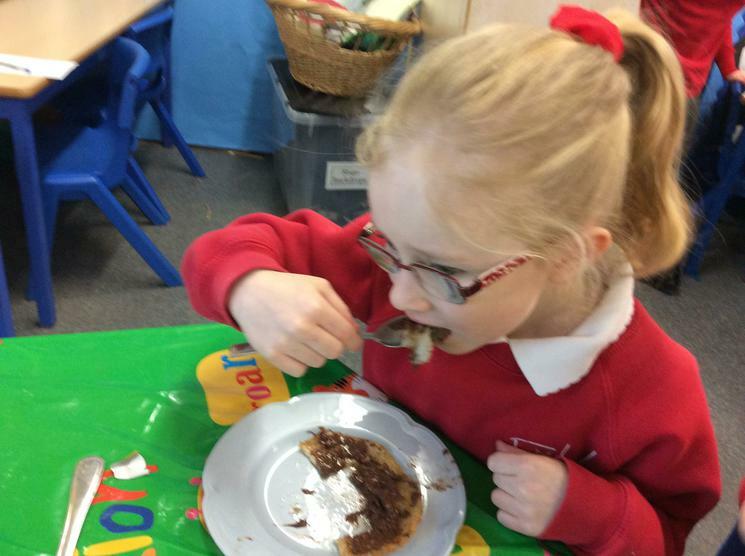 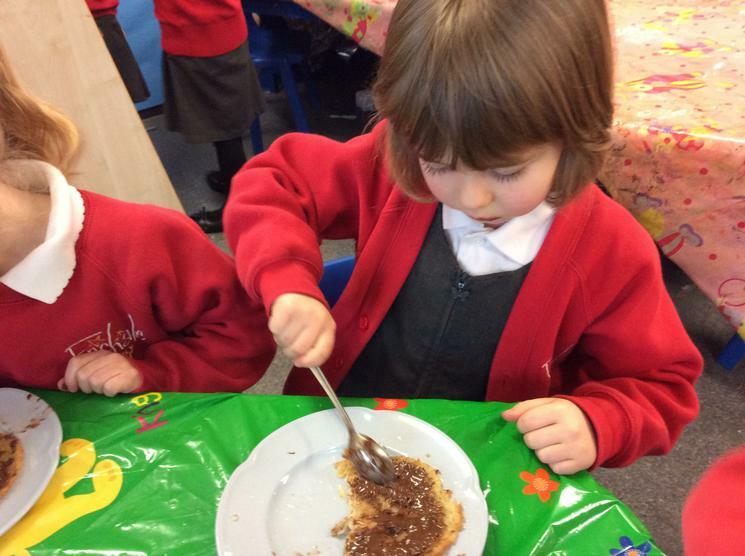 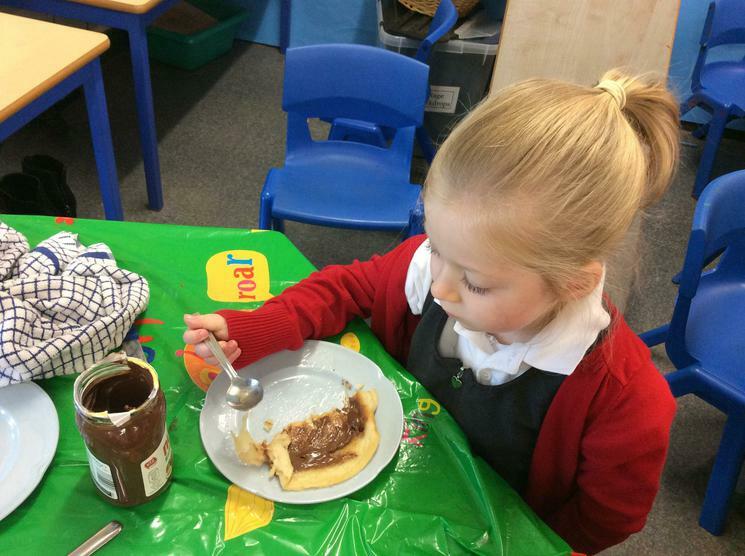 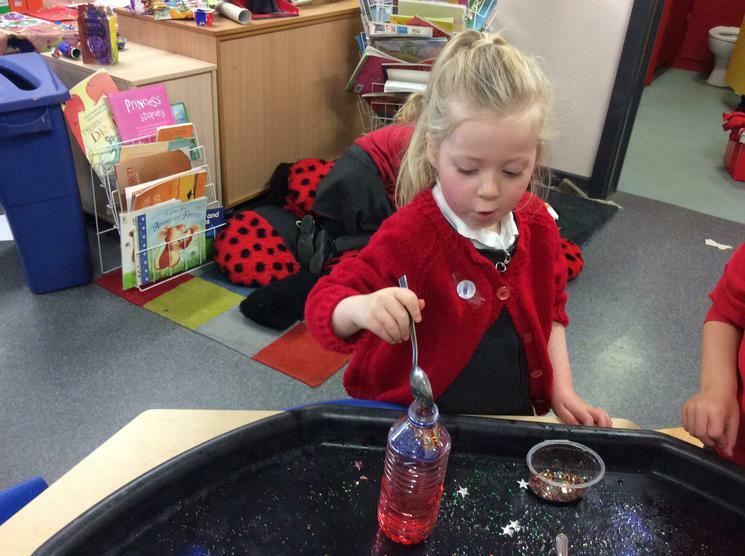 We chose from jam, honey, golden syrup, chocolate spread and sprinkles for the topping. 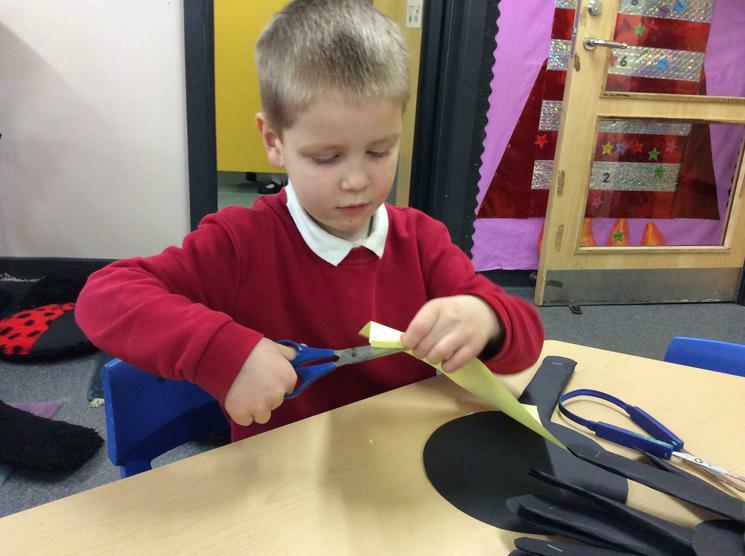 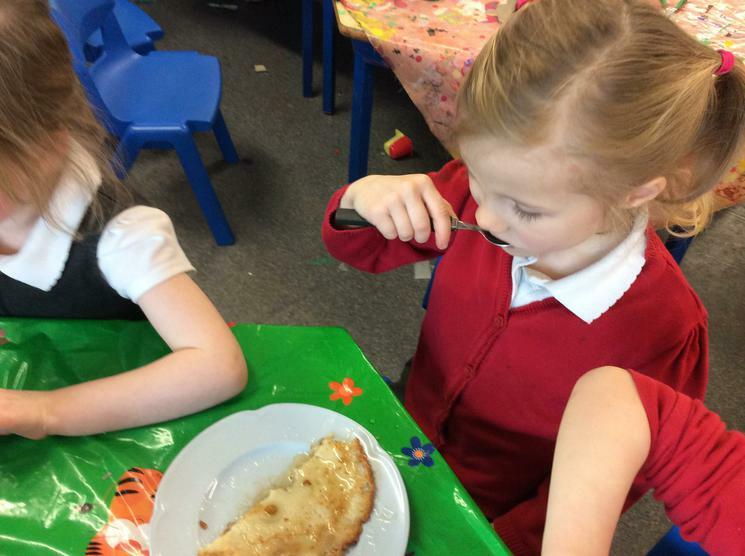 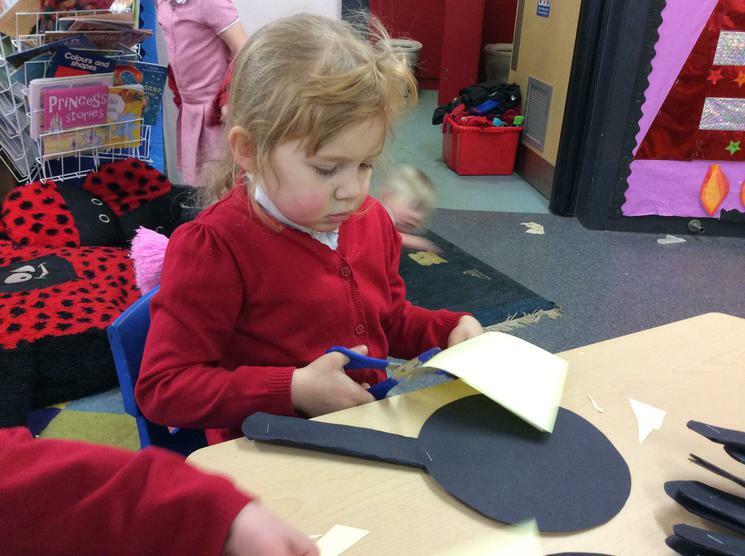 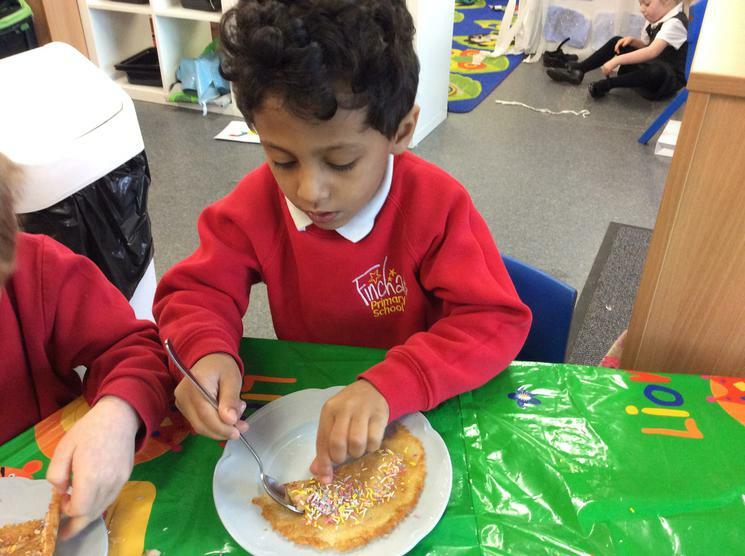 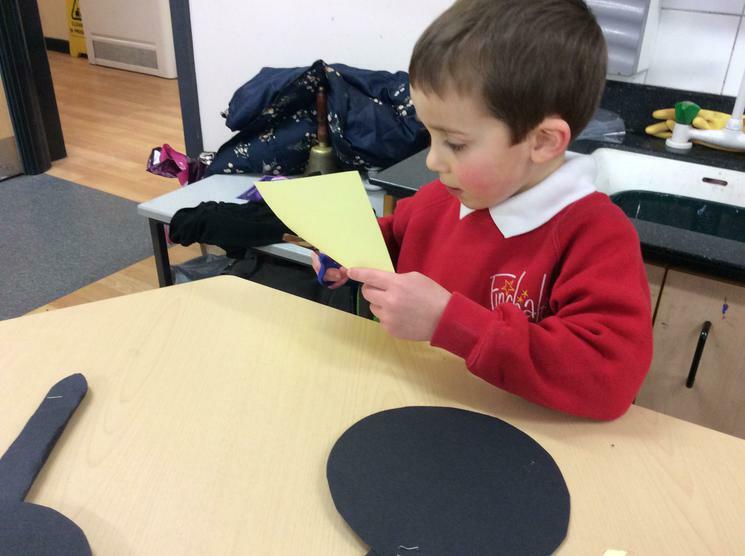 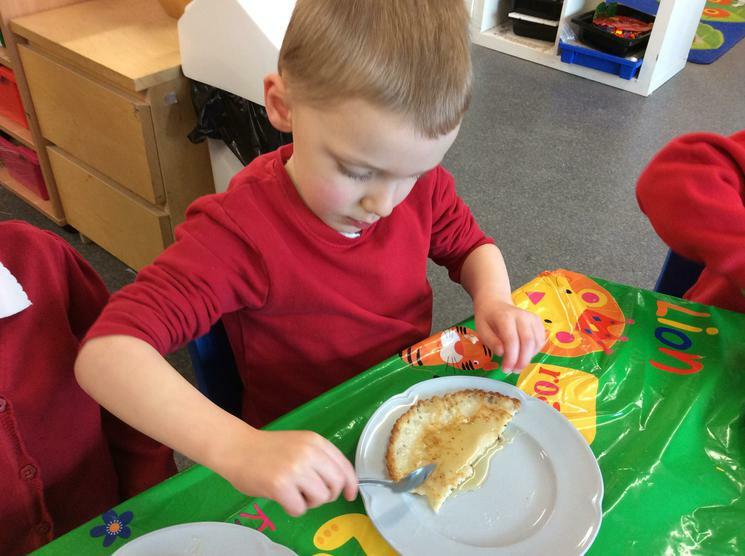 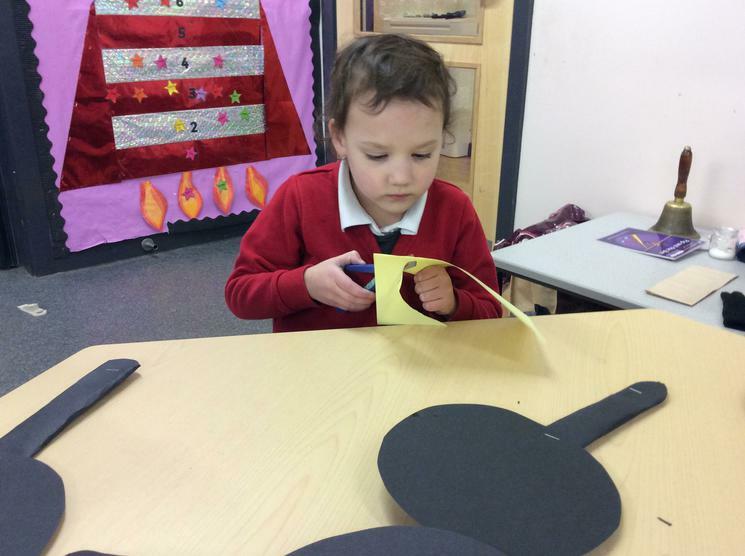 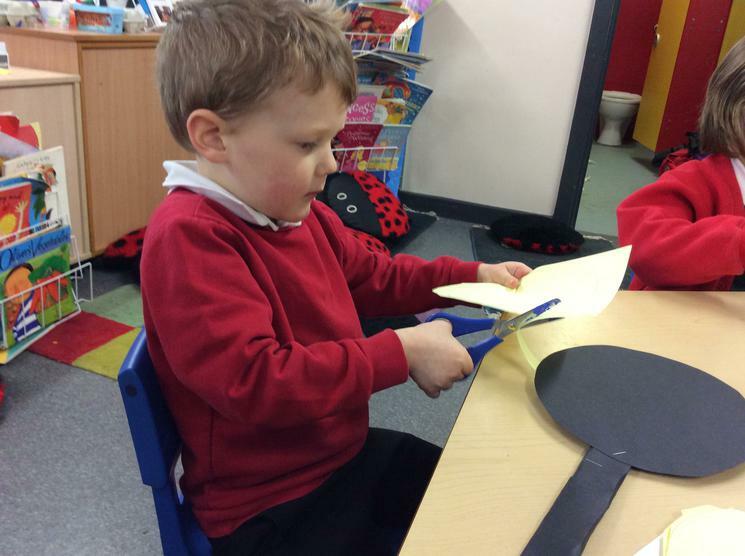 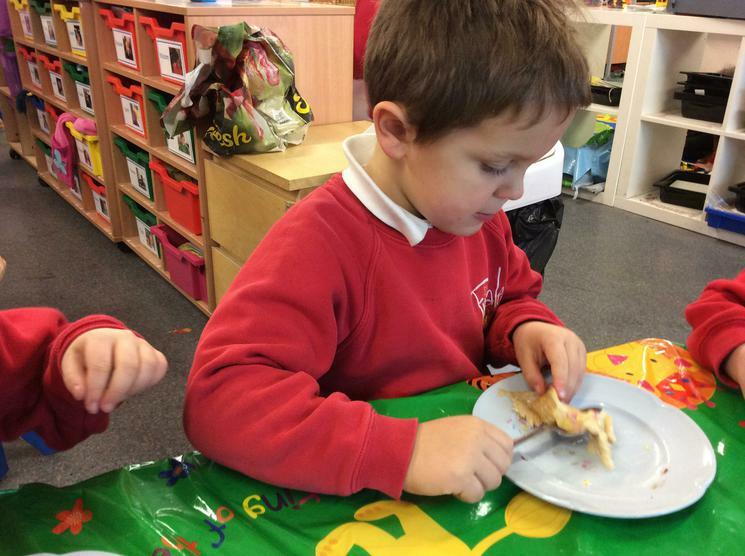 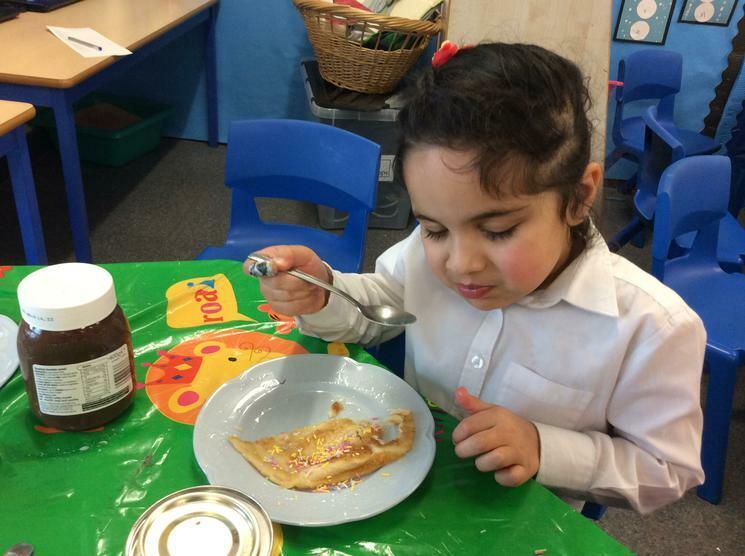 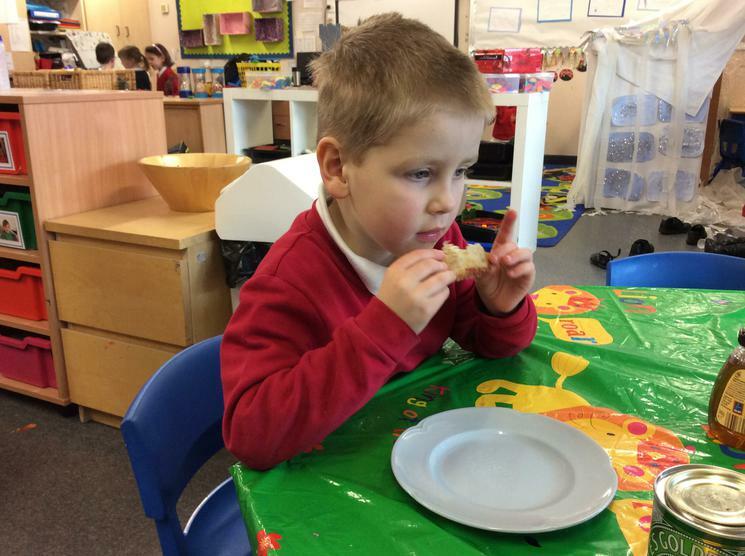 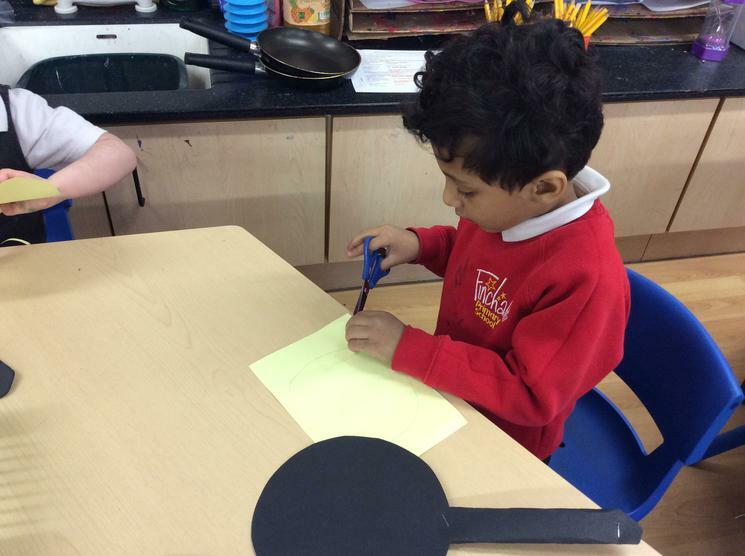 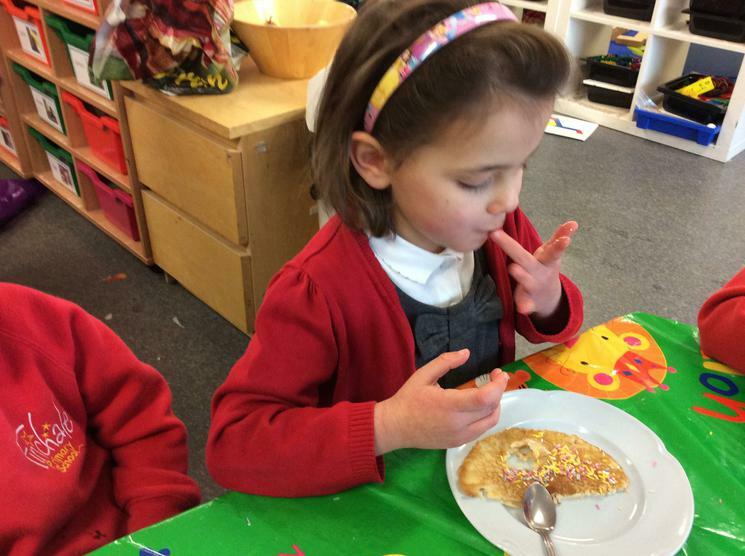 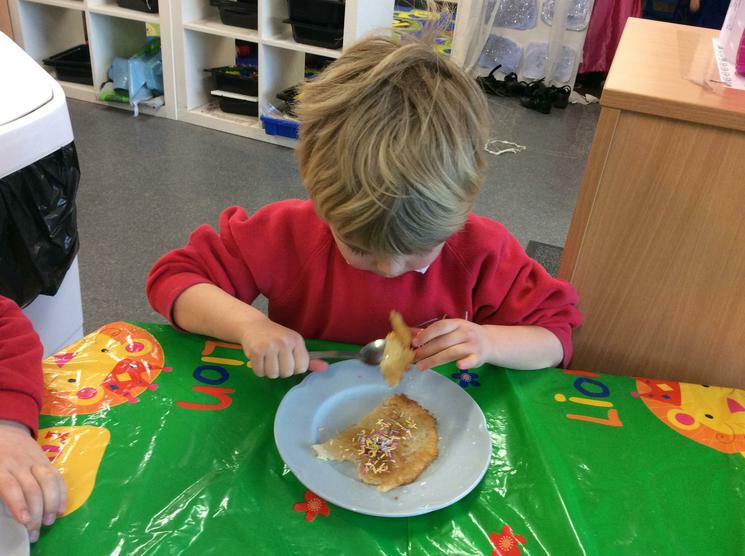 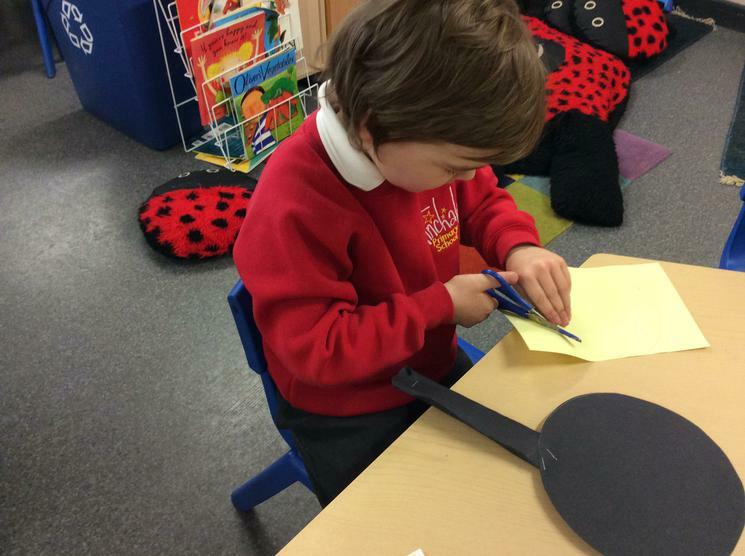 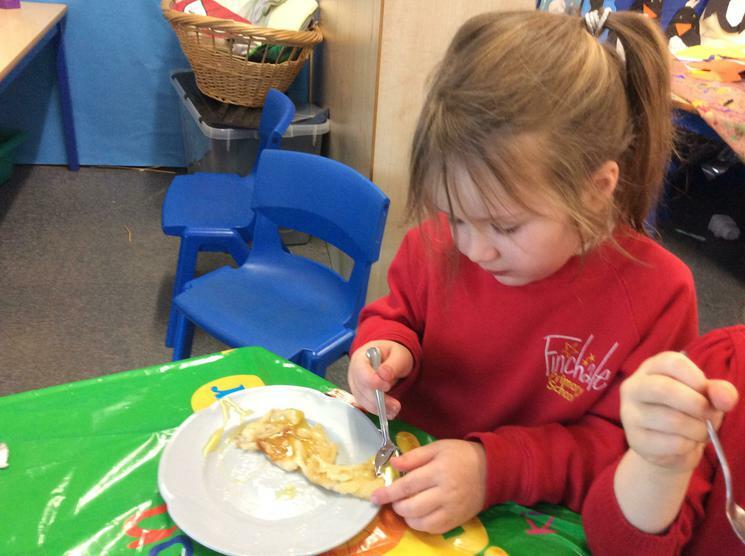 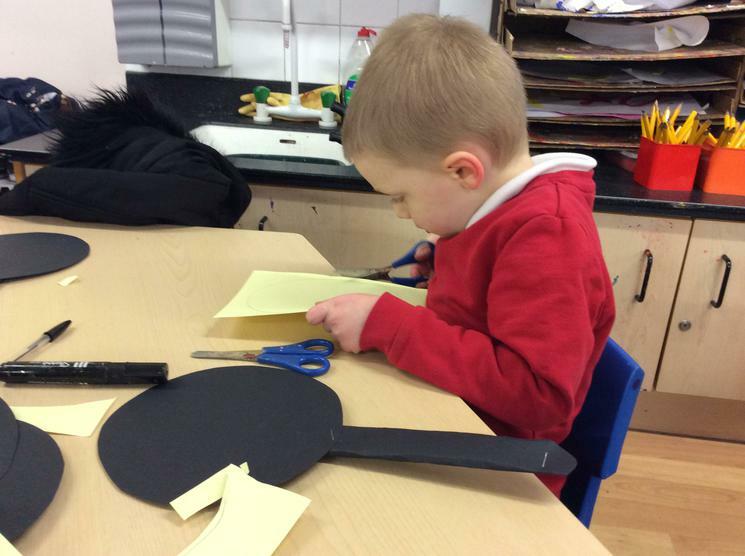 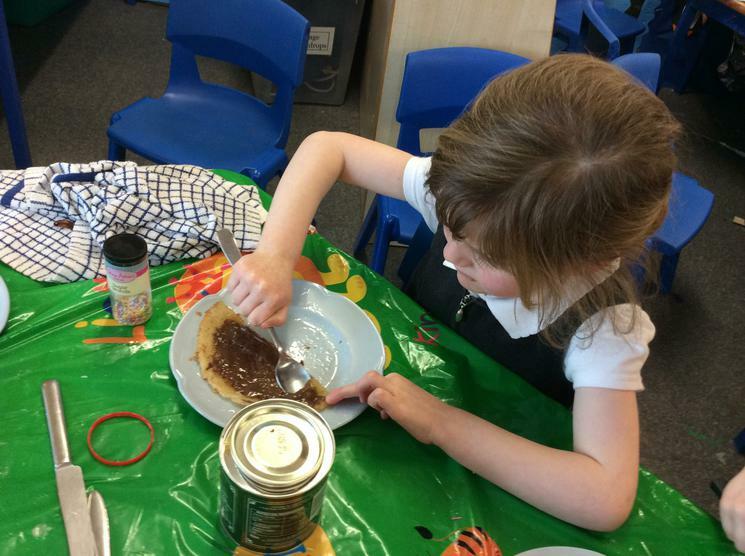 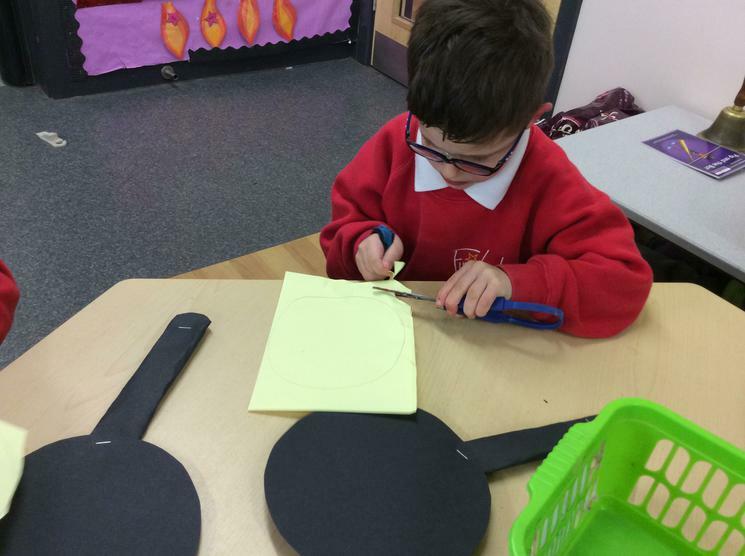 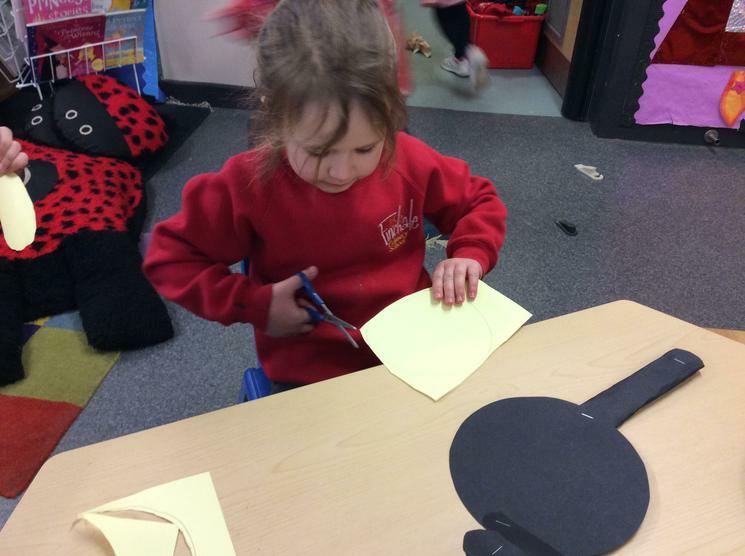 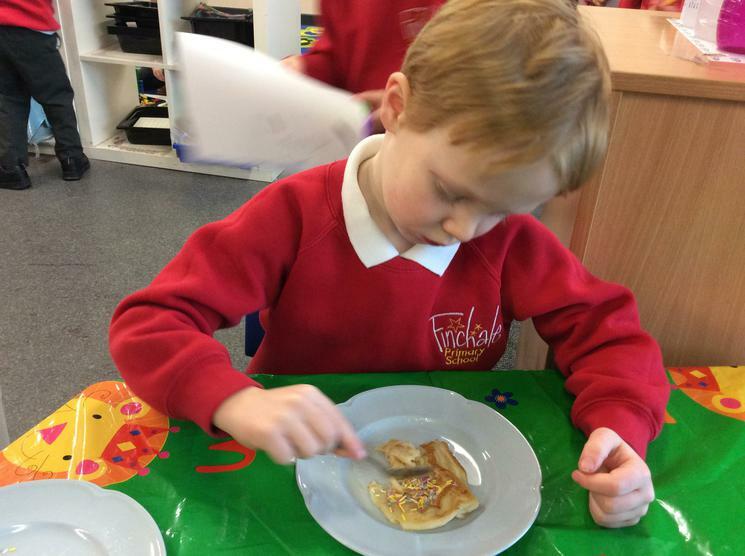 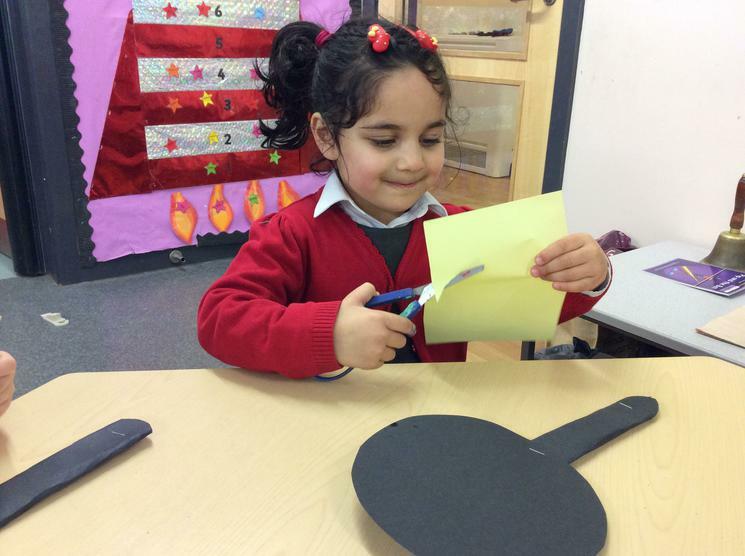 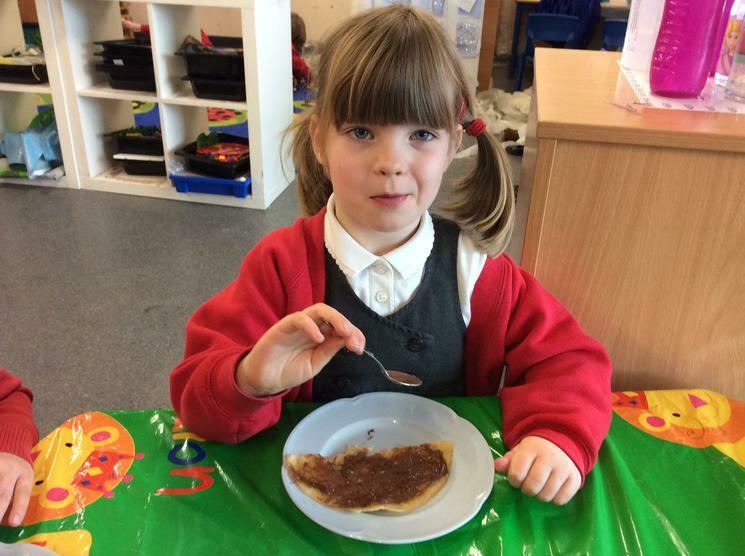 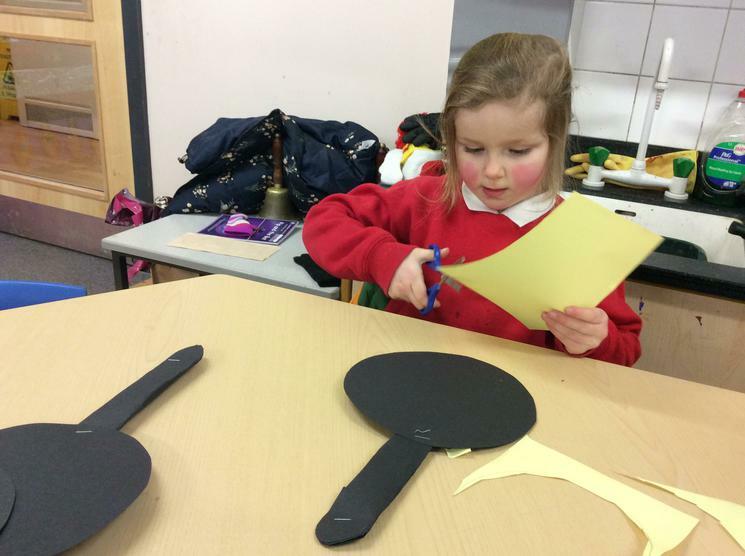 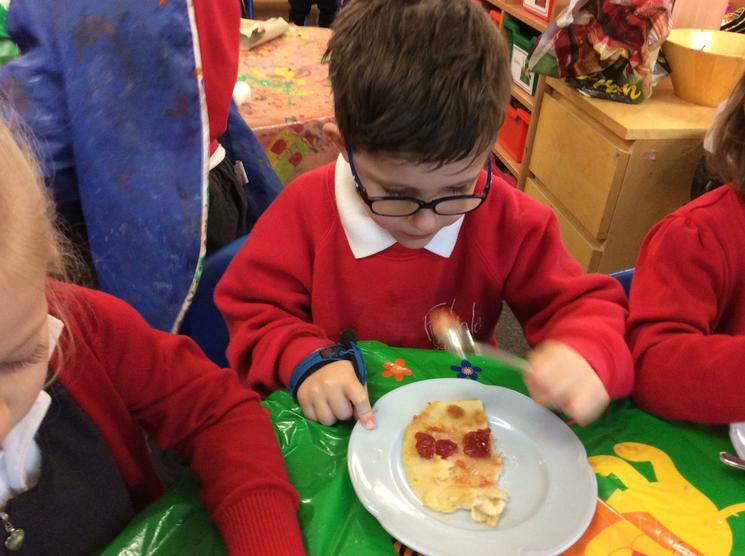 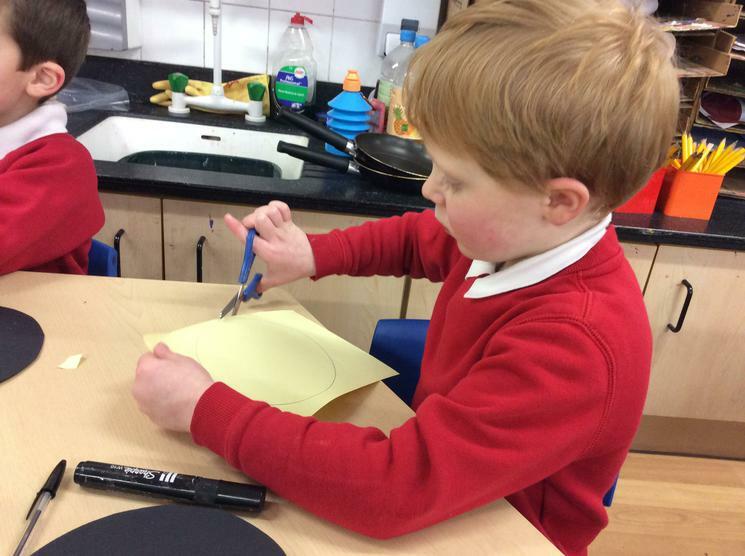 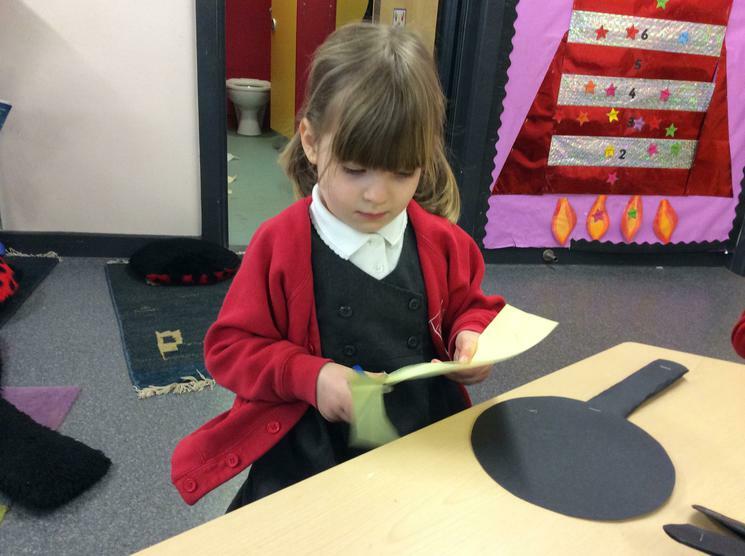 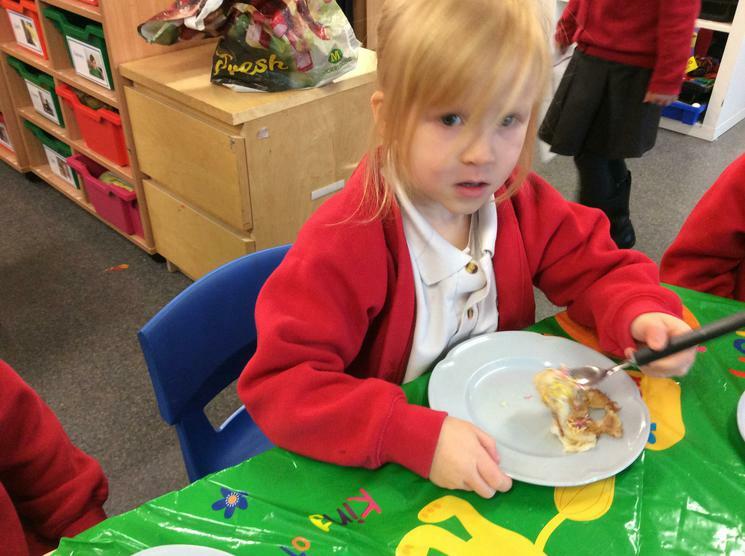 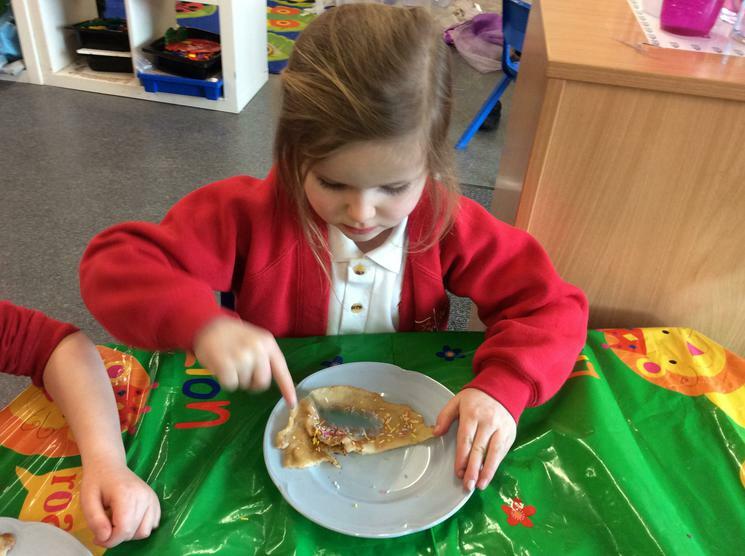 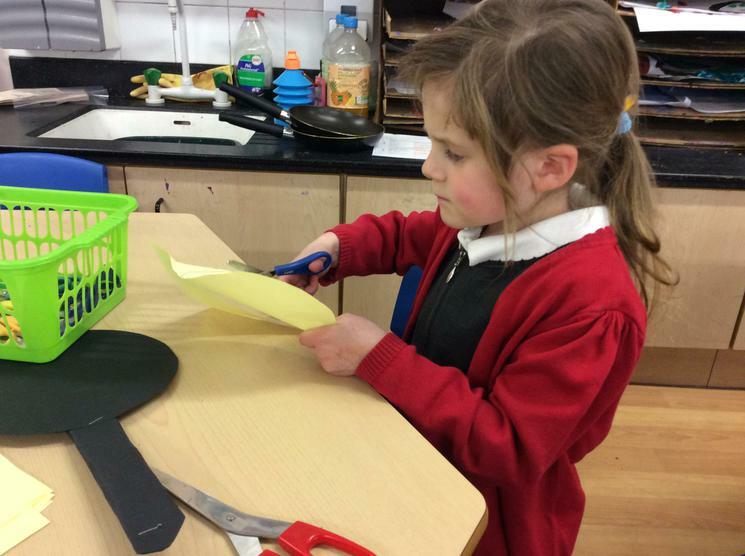 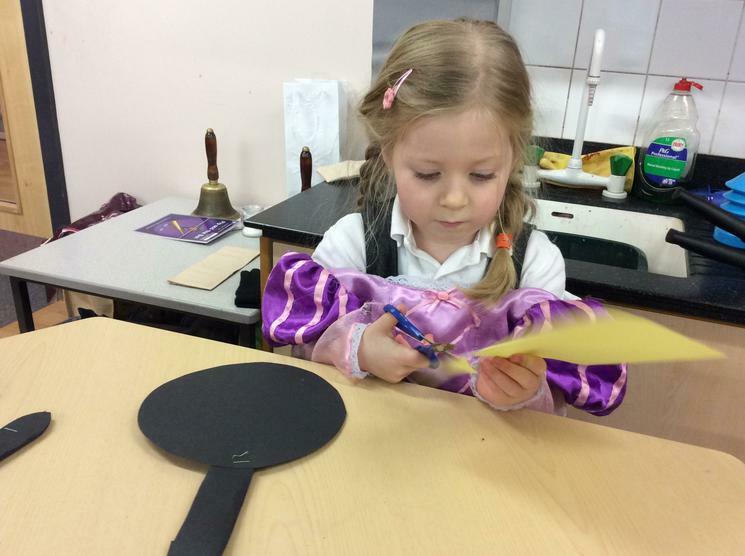 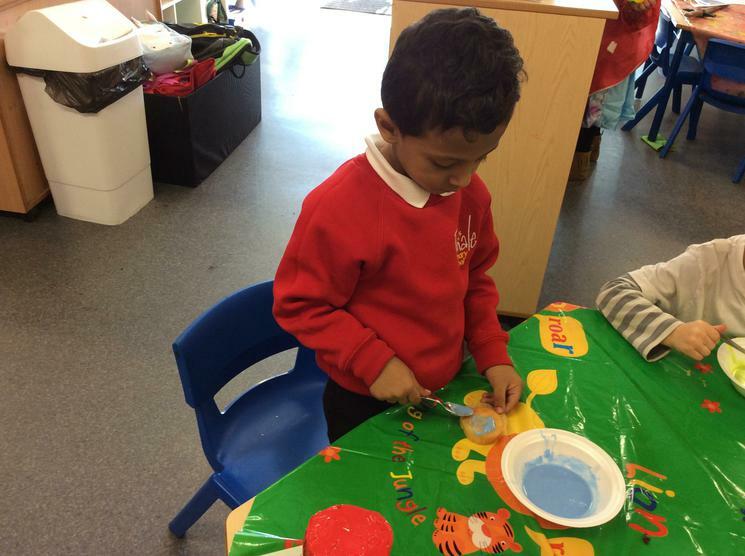 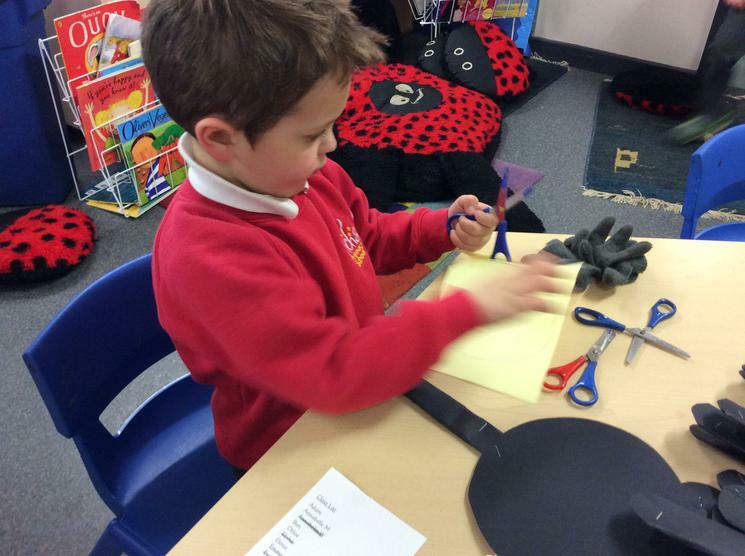 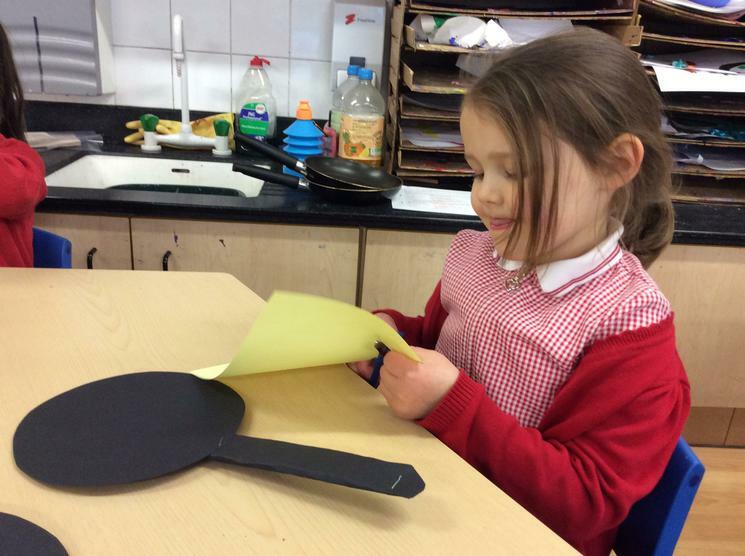 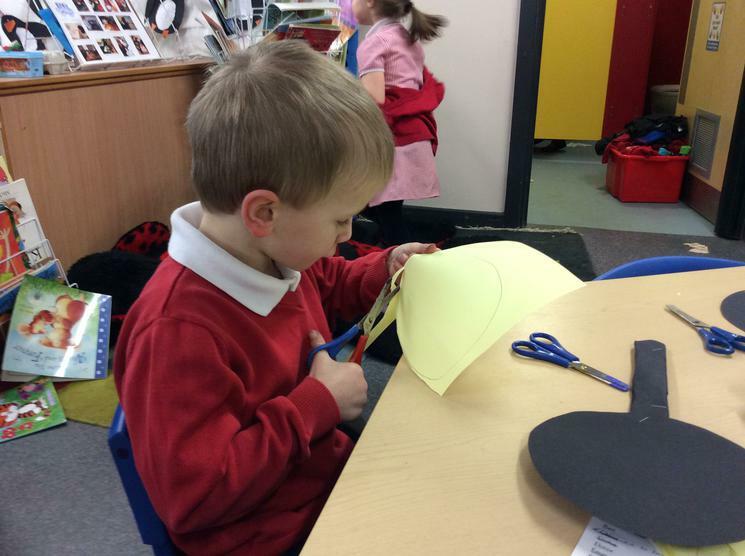 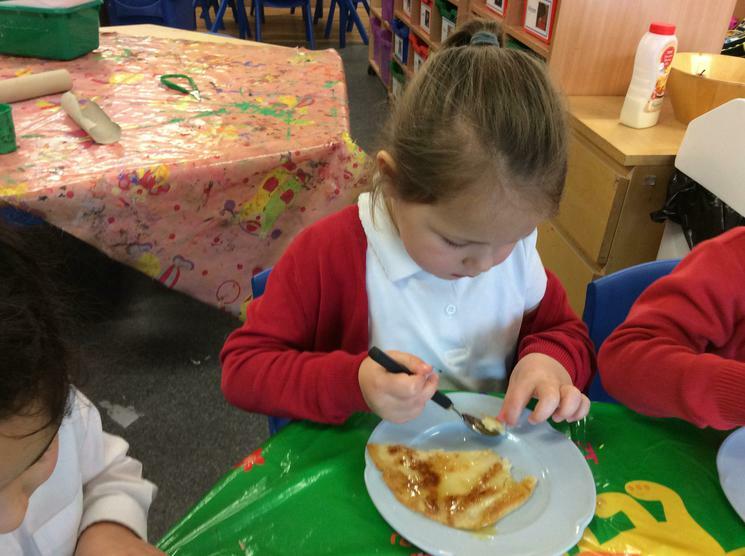 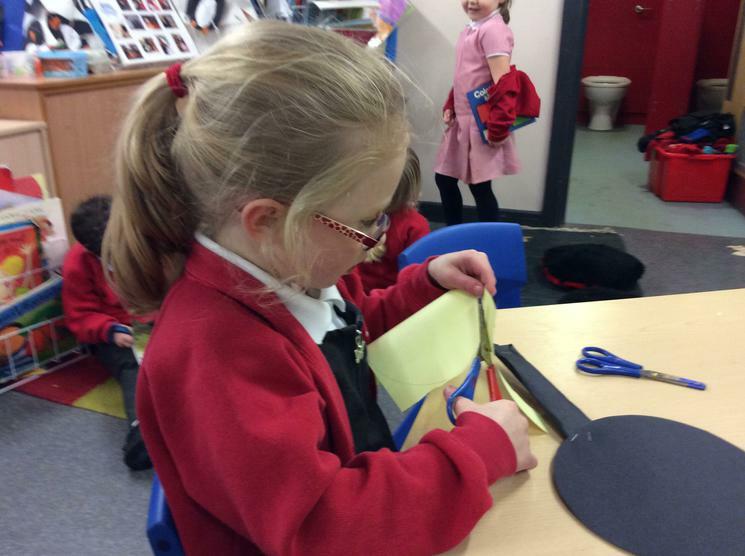 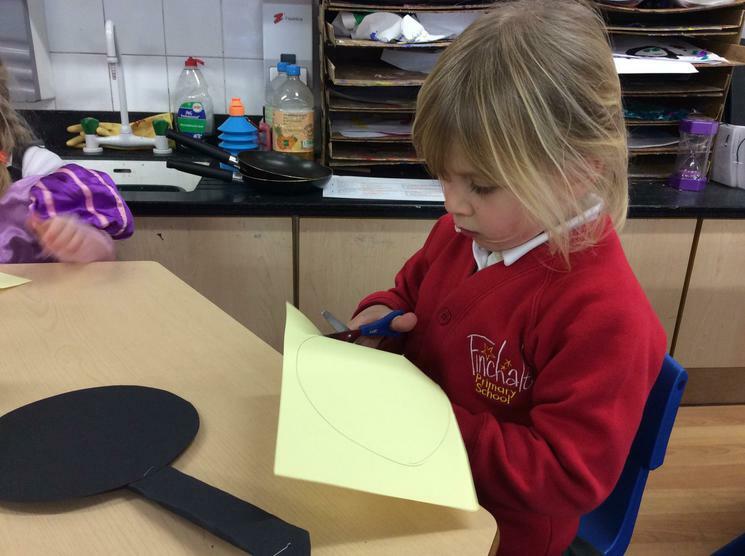 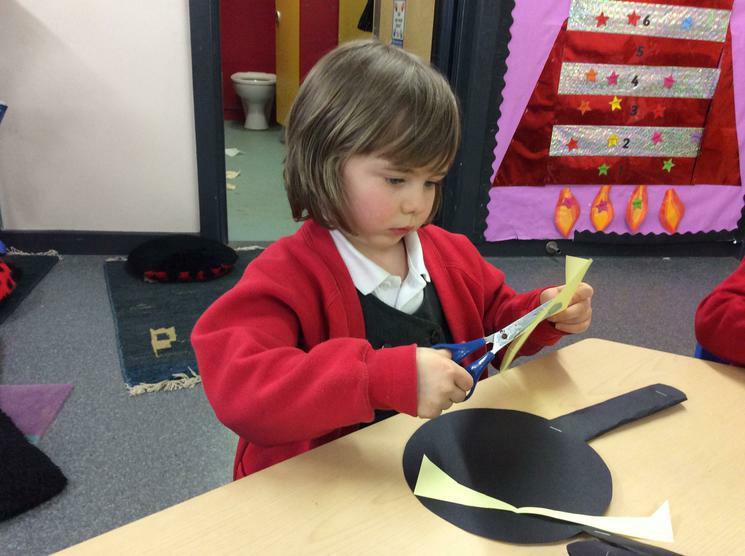 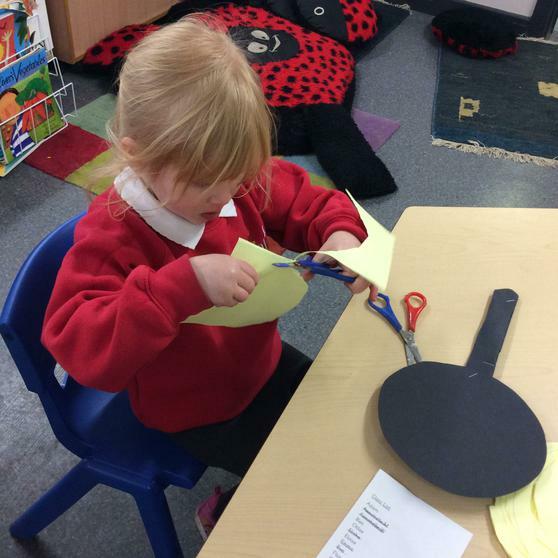 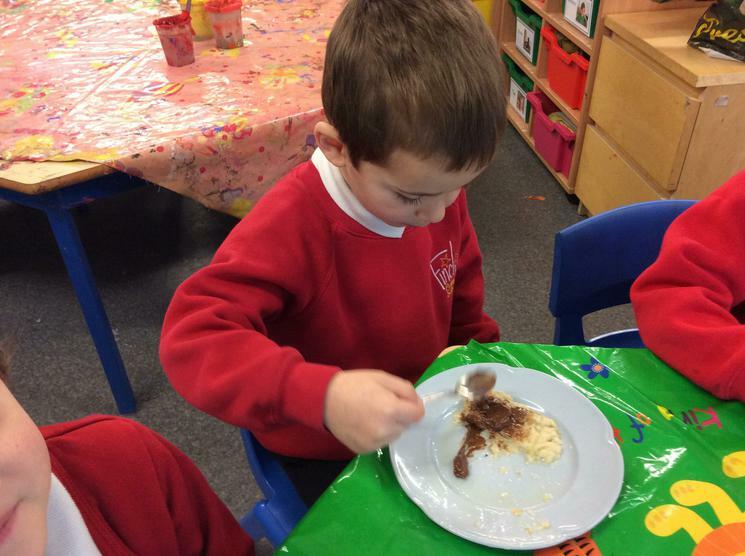 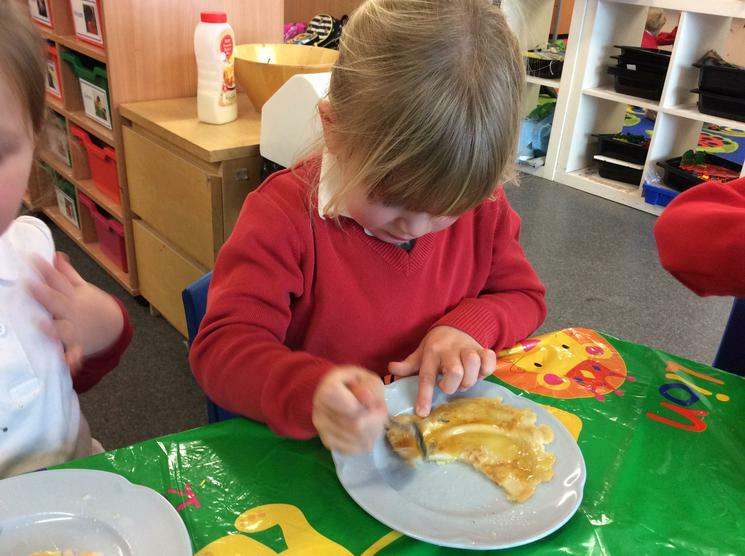 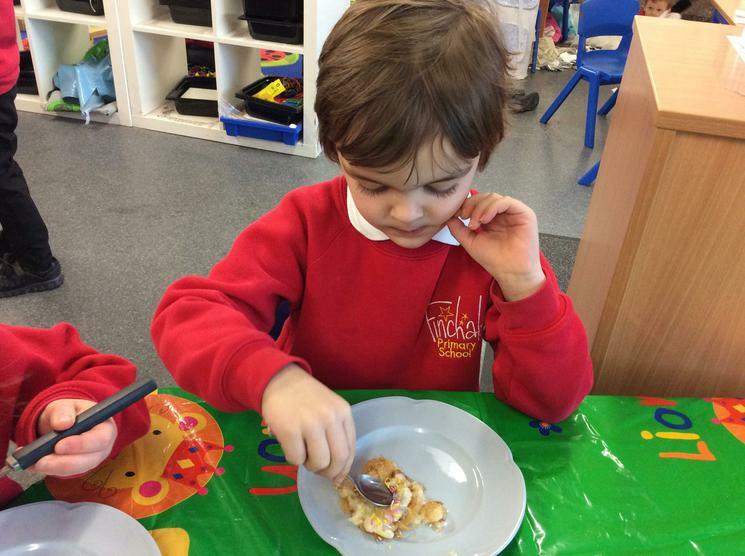 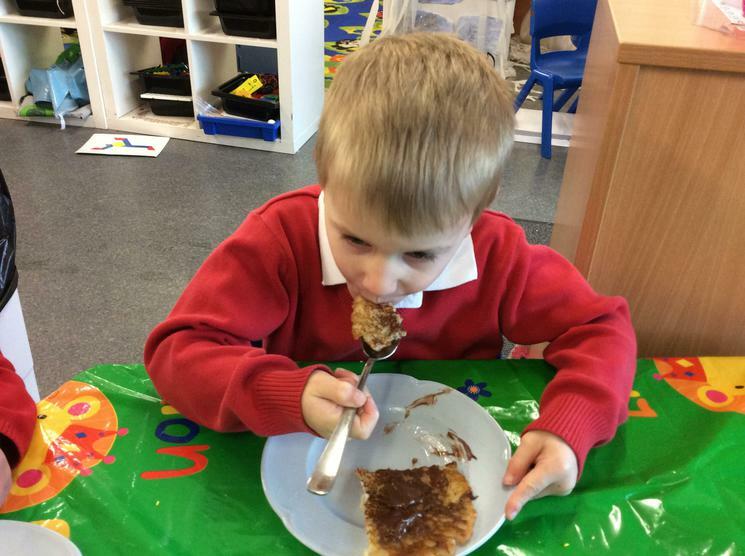 We cut out a pancake to balance on a pan ready for a pancake race. 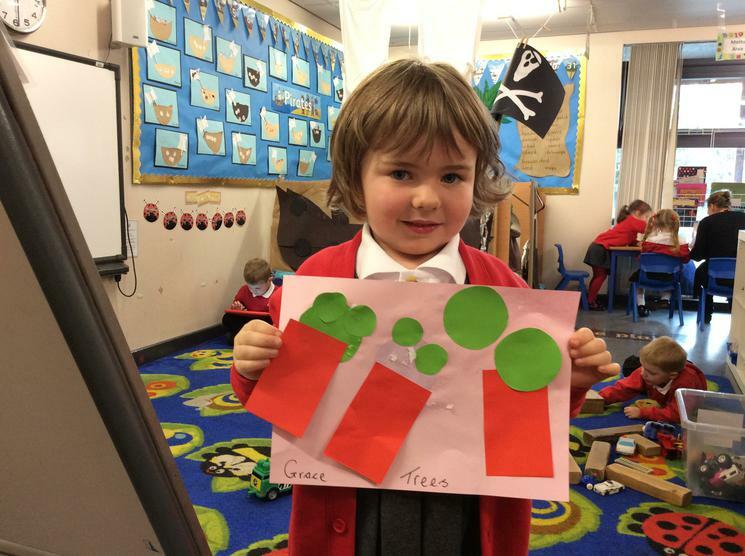 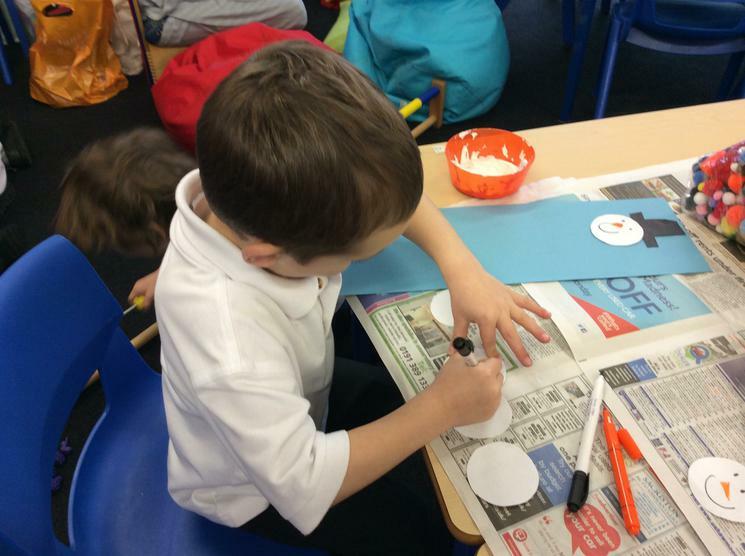 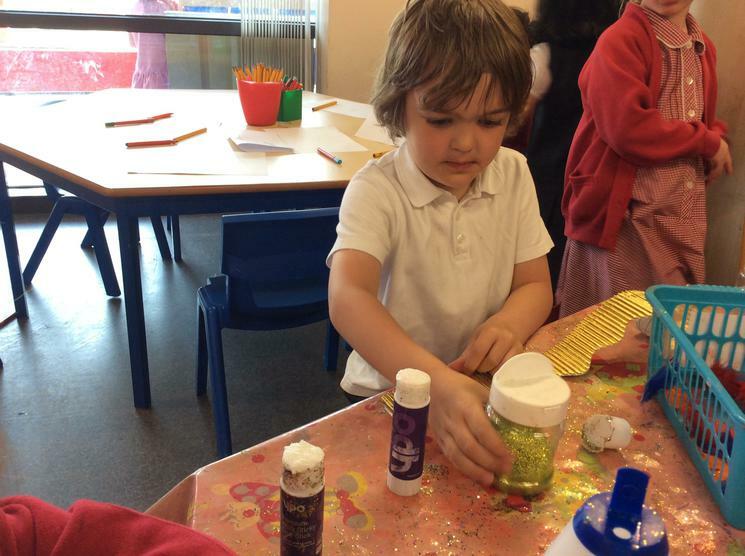 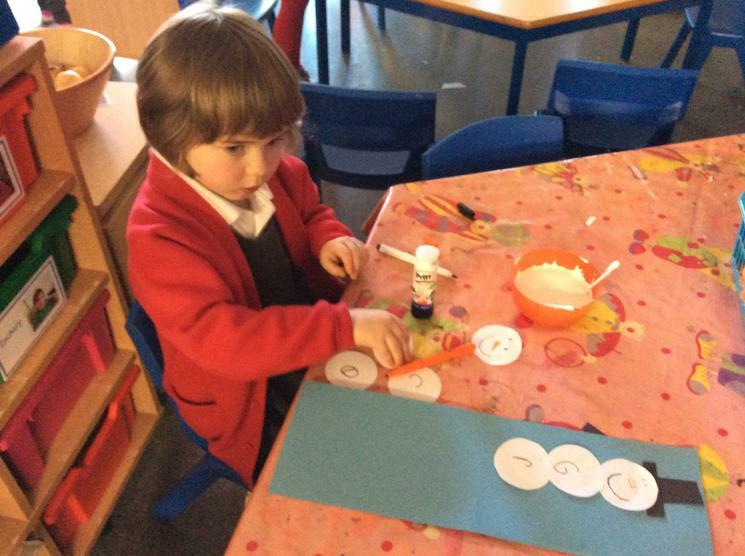 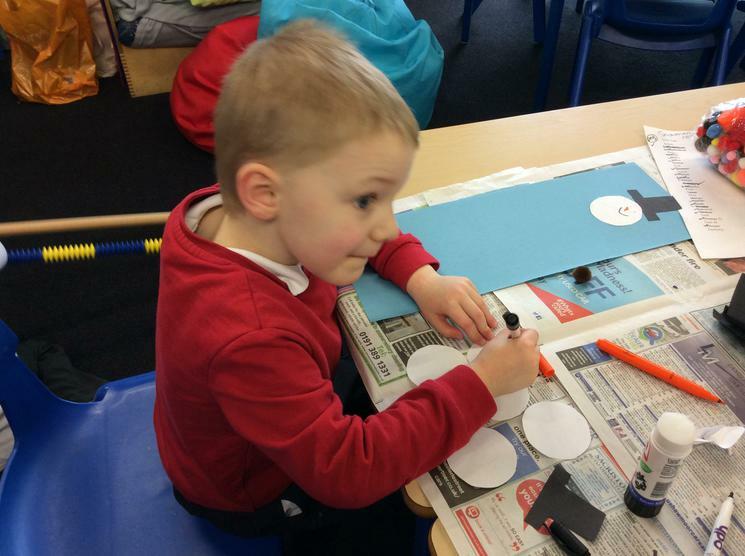 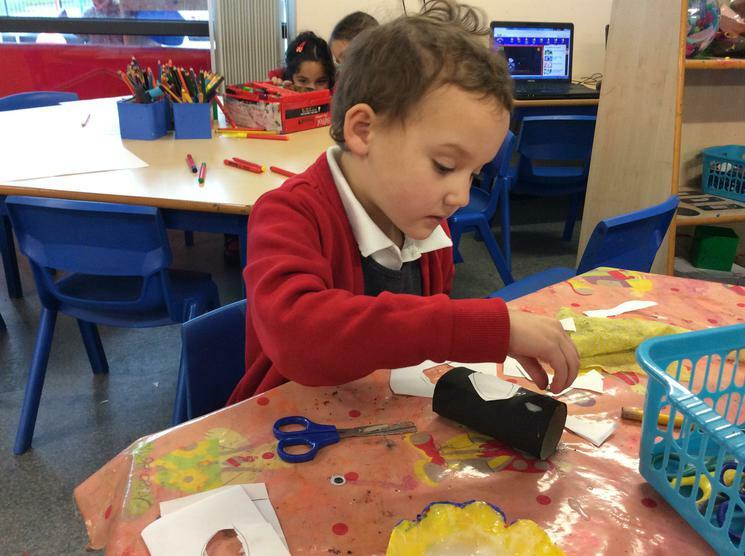 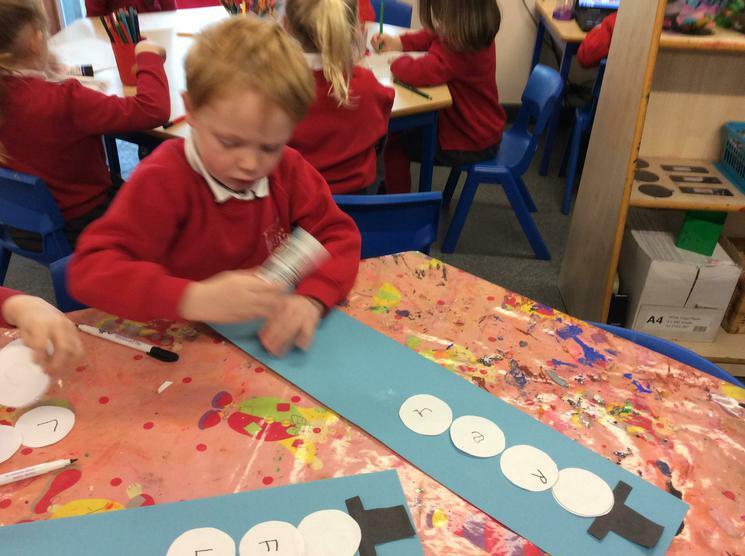 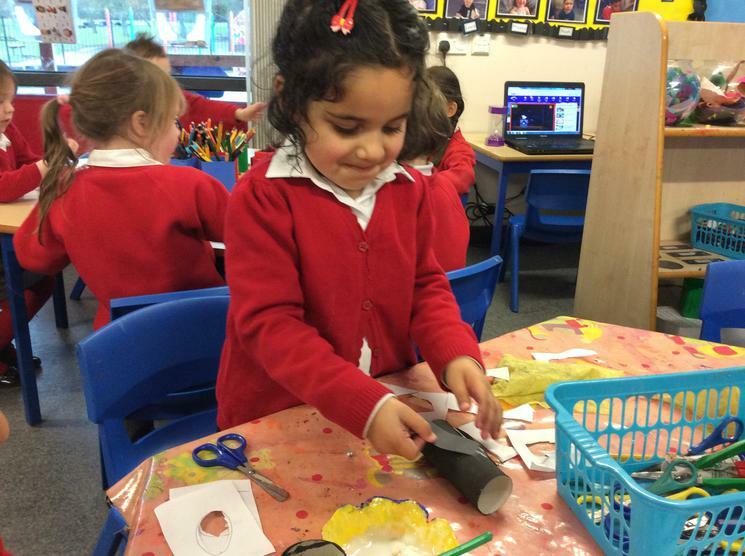 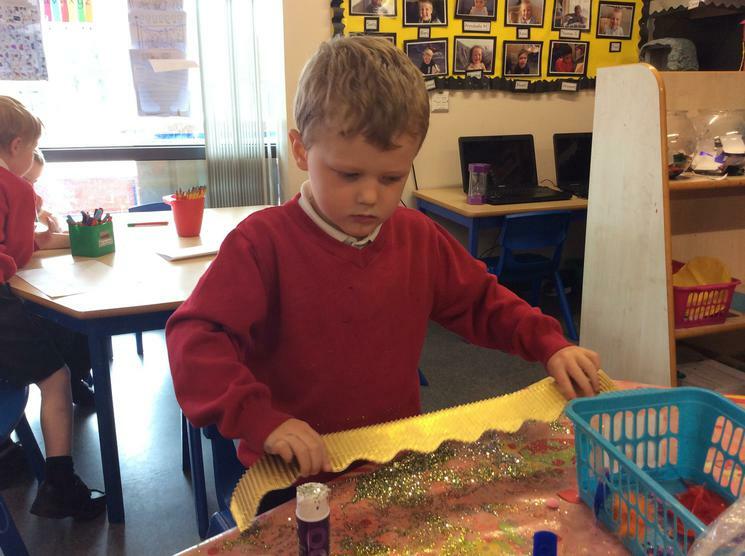 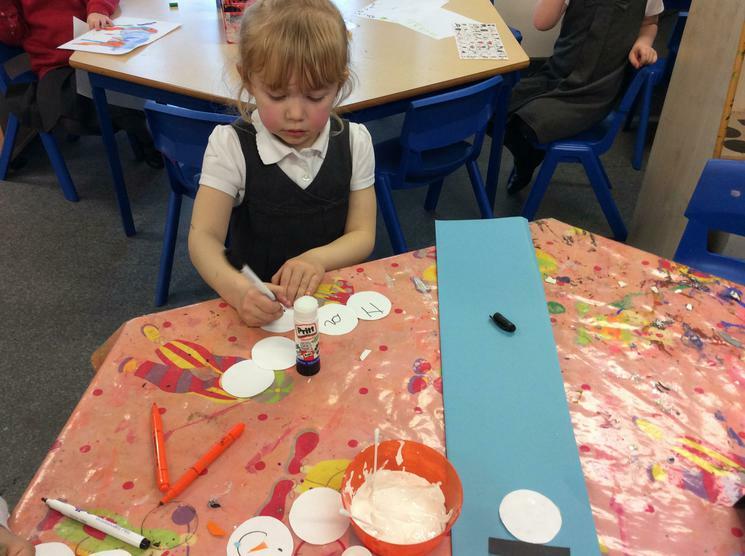 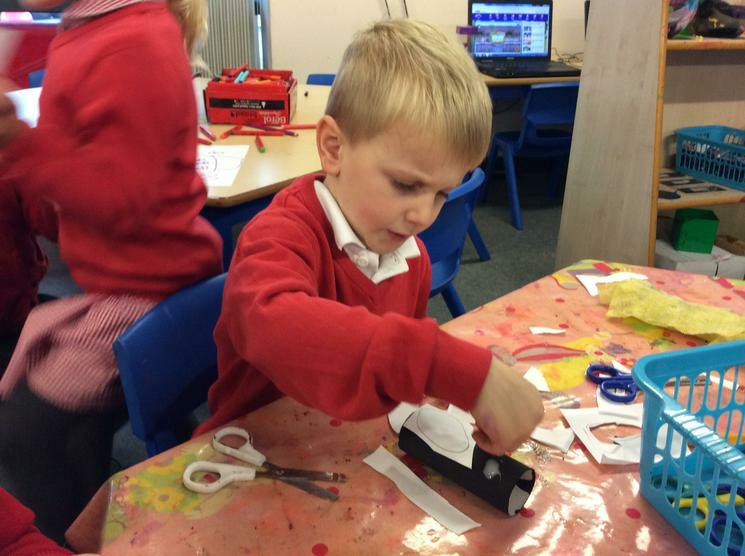 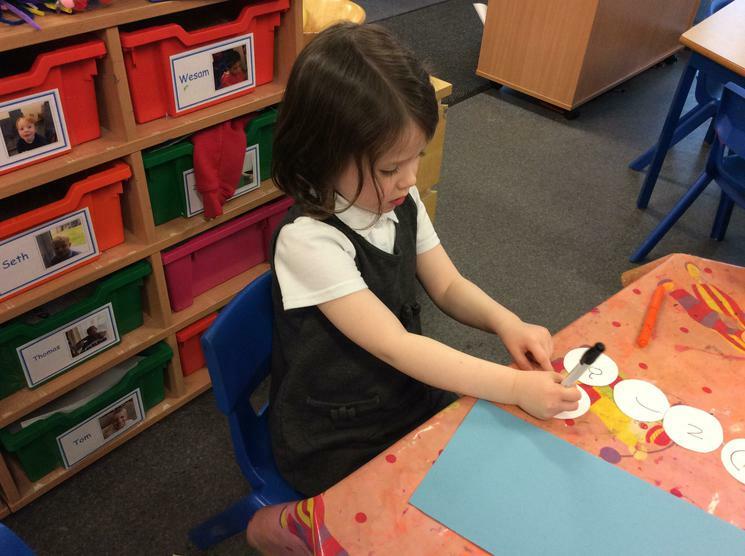 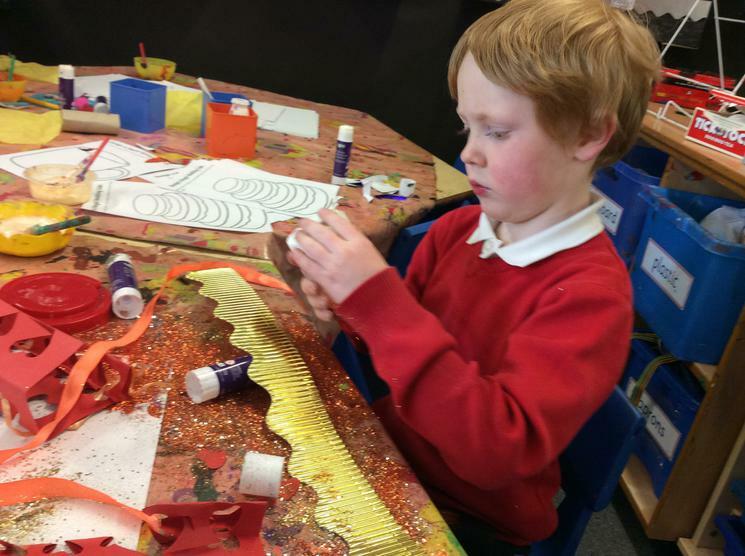 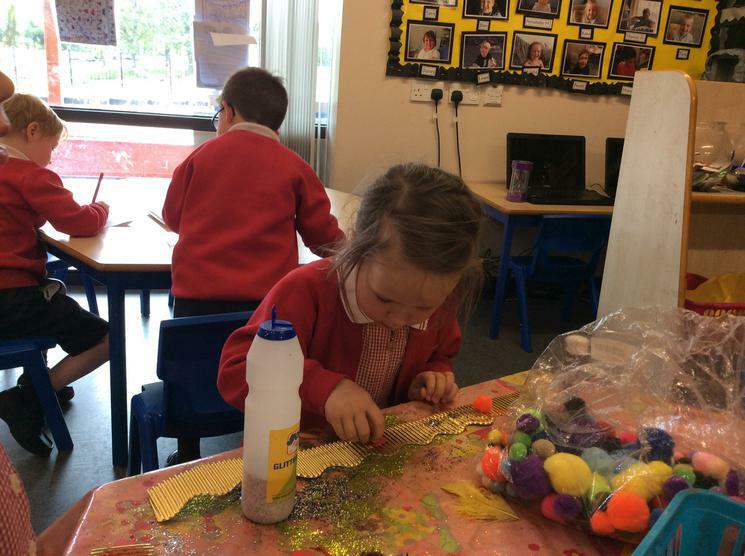 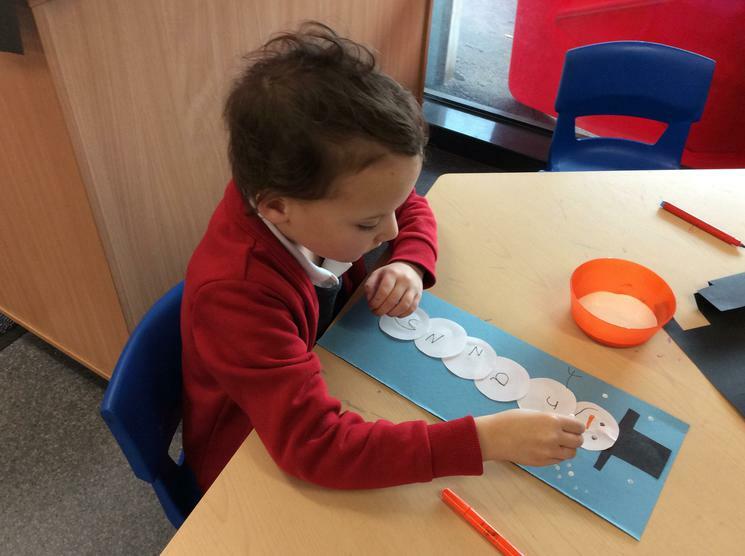 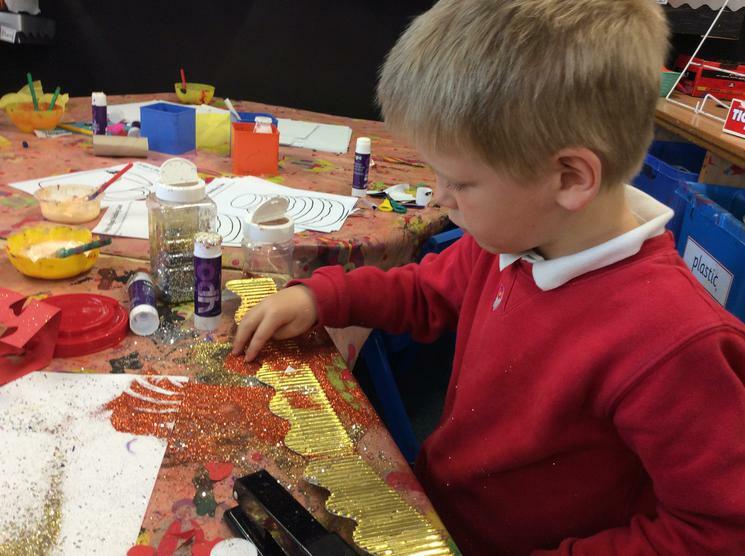 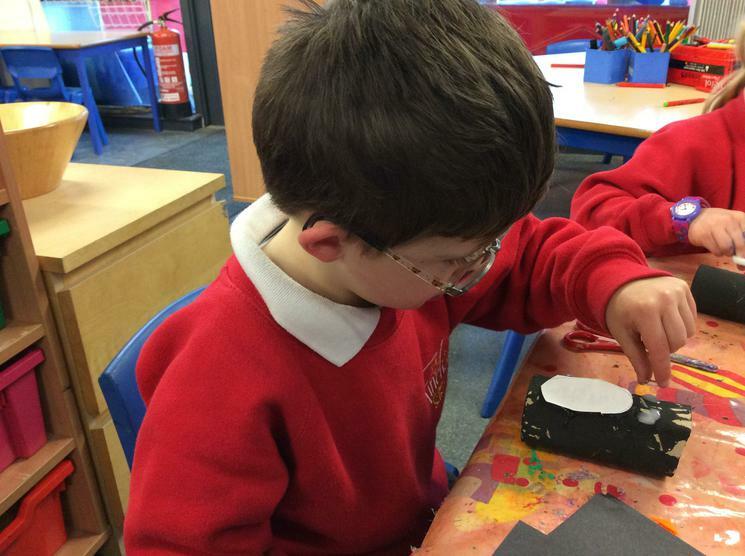 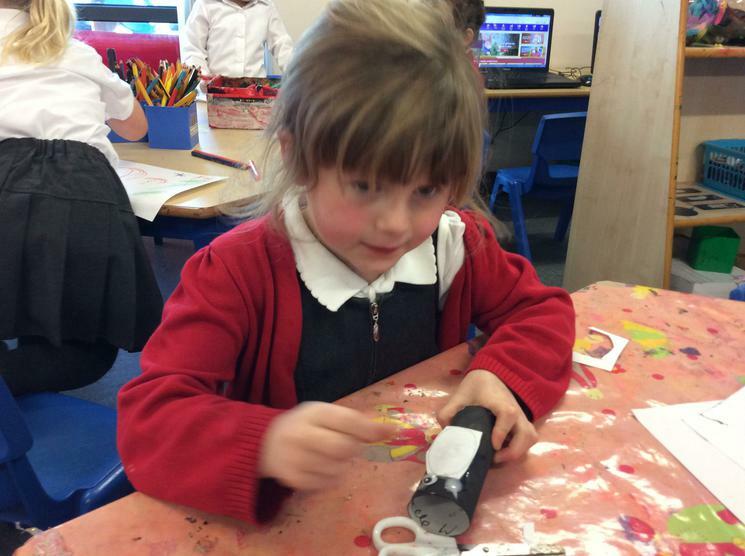 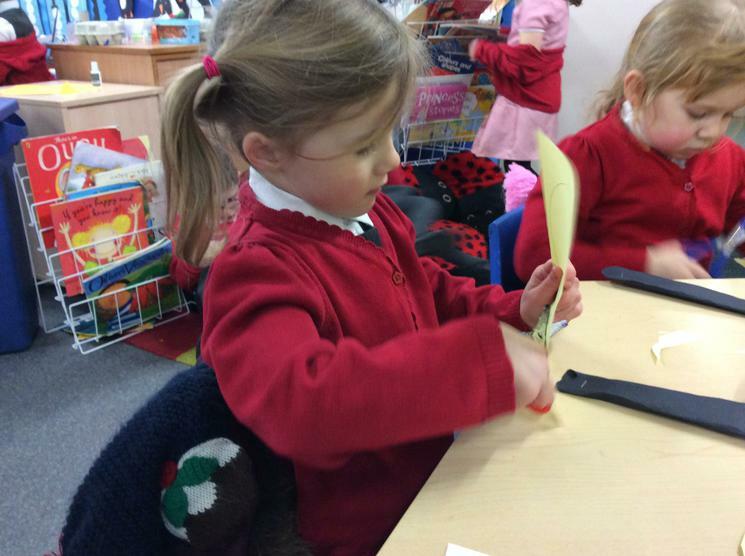 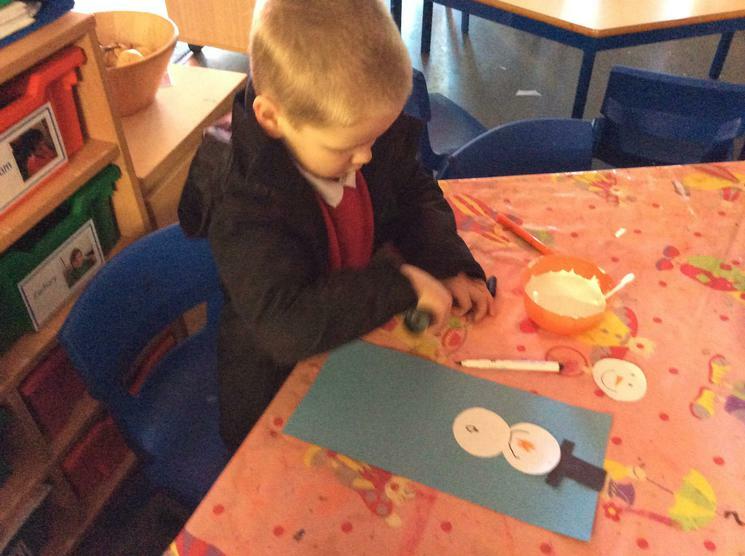 We have been very busy making seasonal cards. 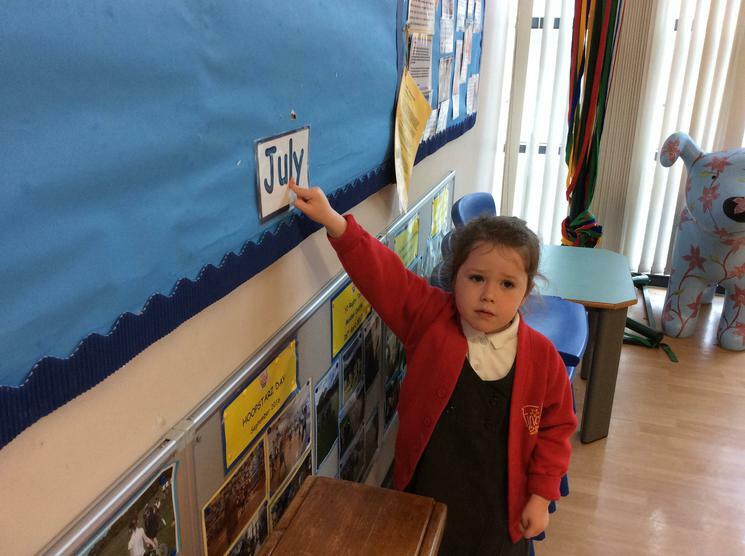 We have made a calendar for our family to use in 2018. 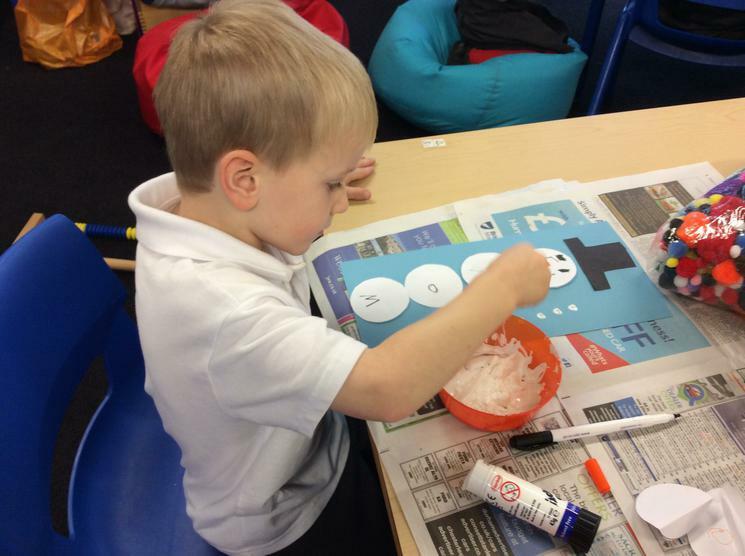 We made snowmen with our names. 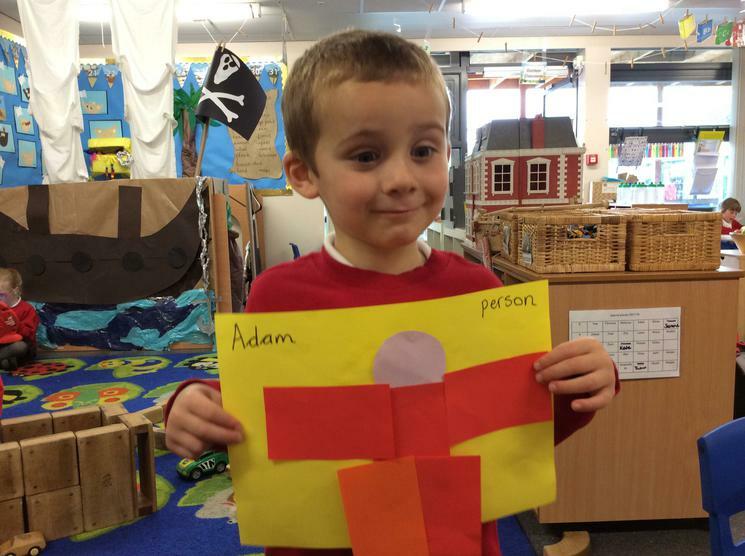 We worked out who would have the tallest and shortest. 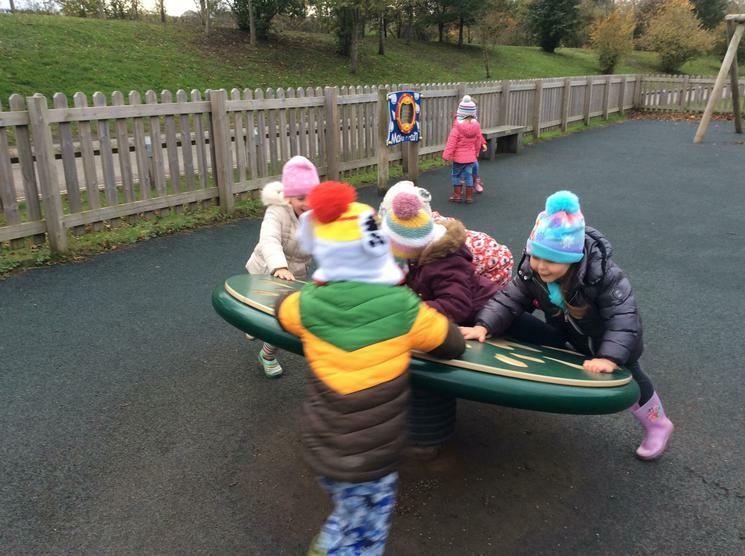 We enjoyed the first snow of the winter! 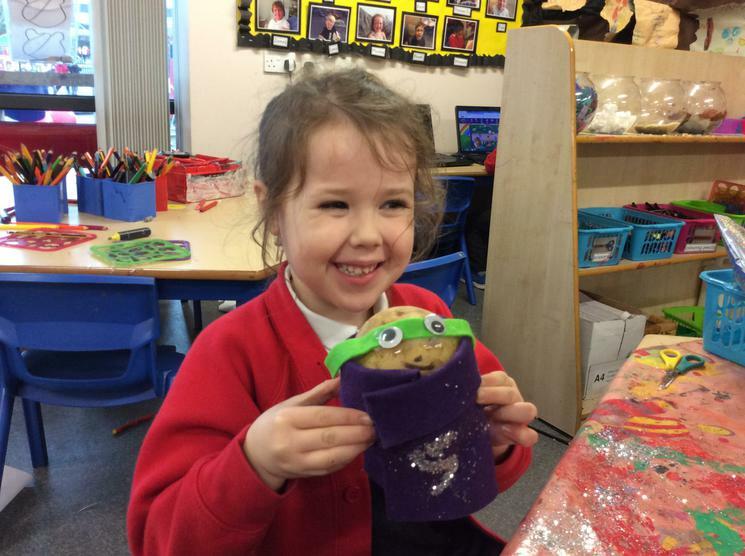 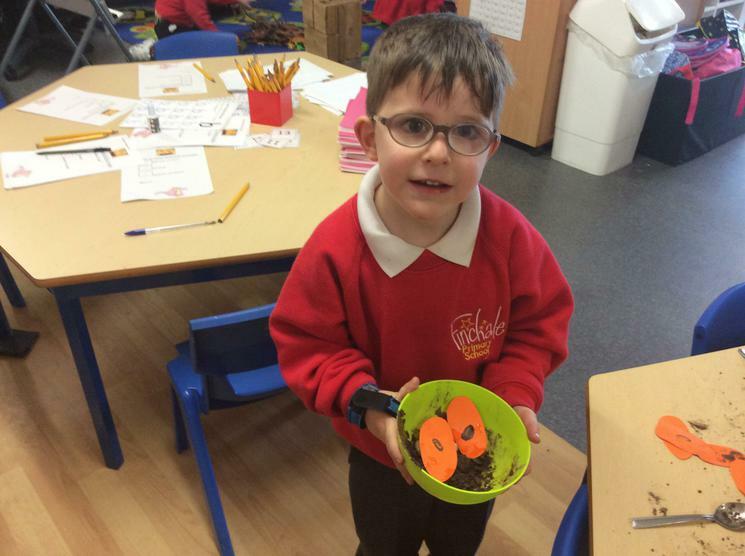 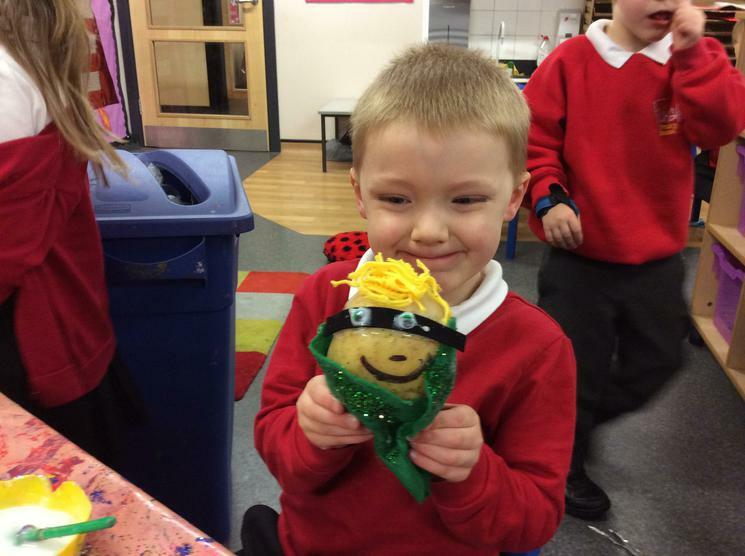 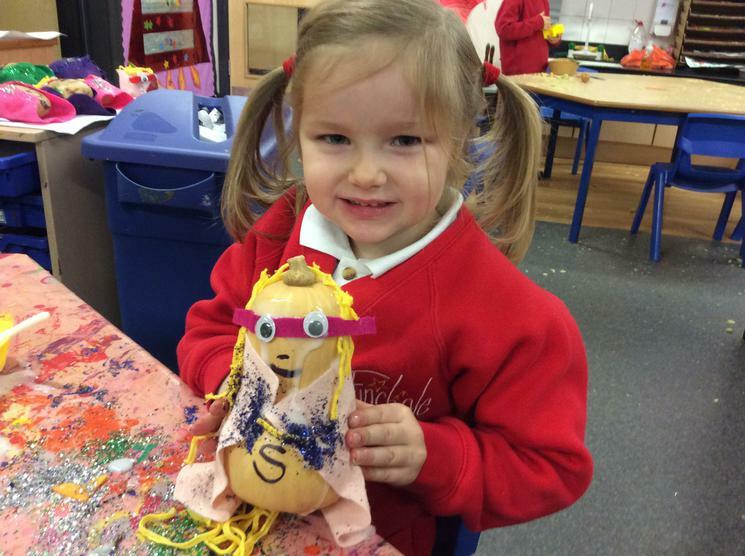 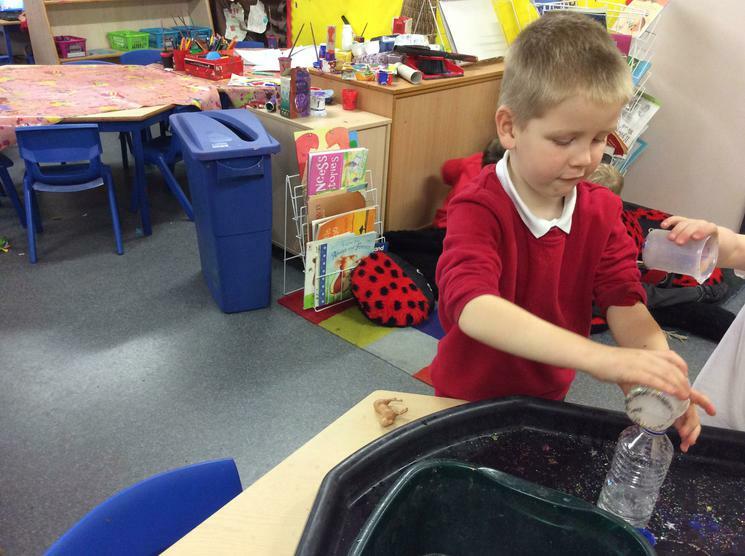 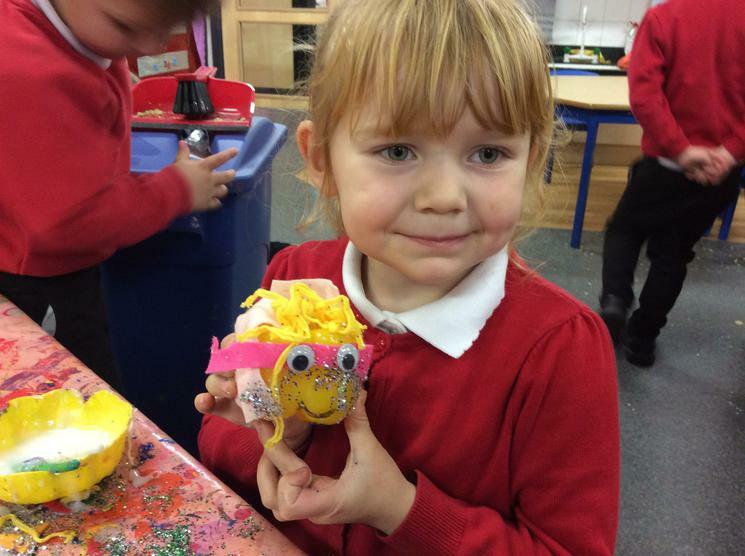 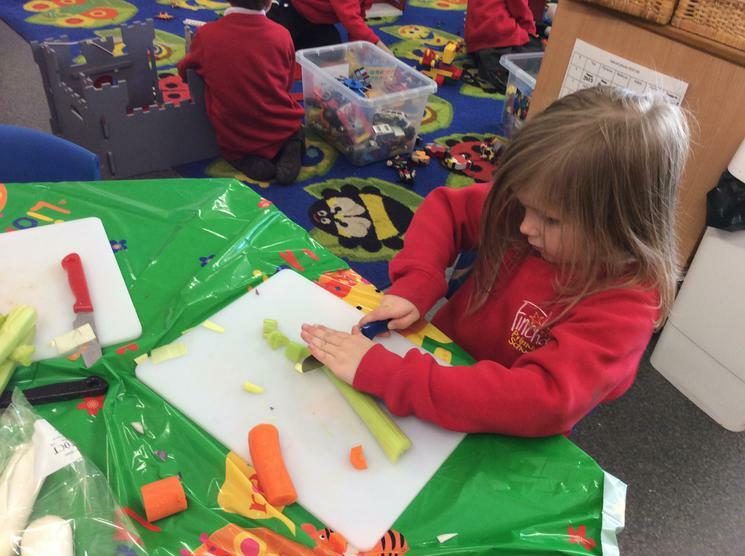 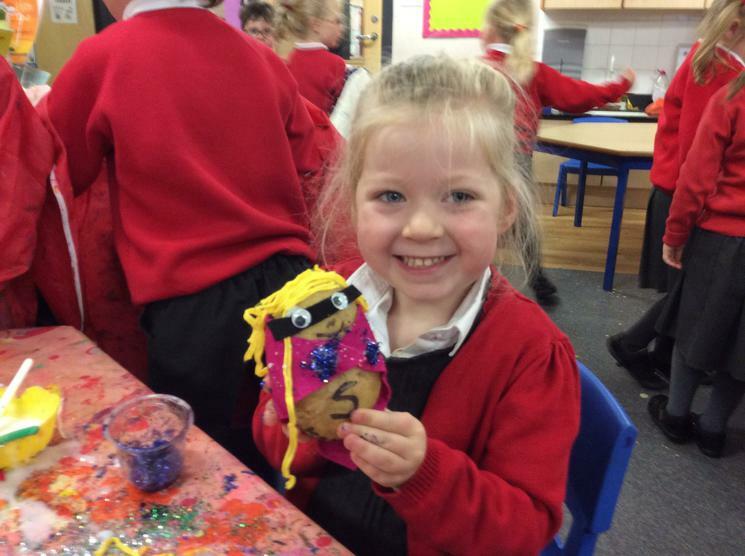 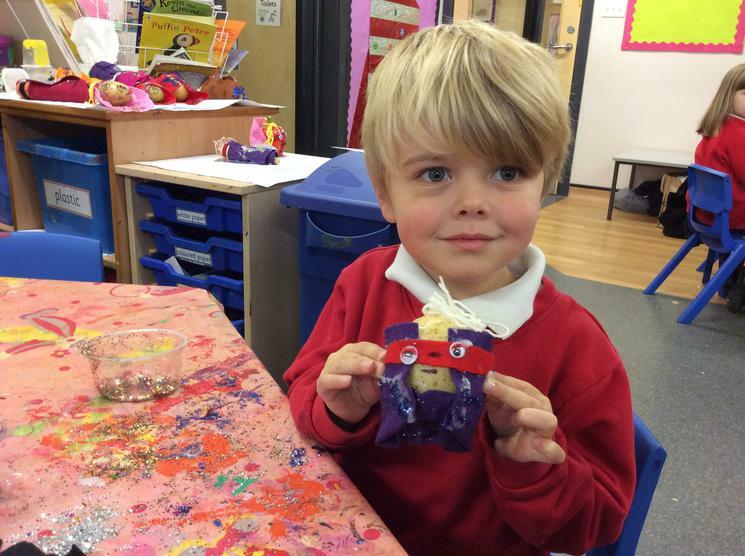 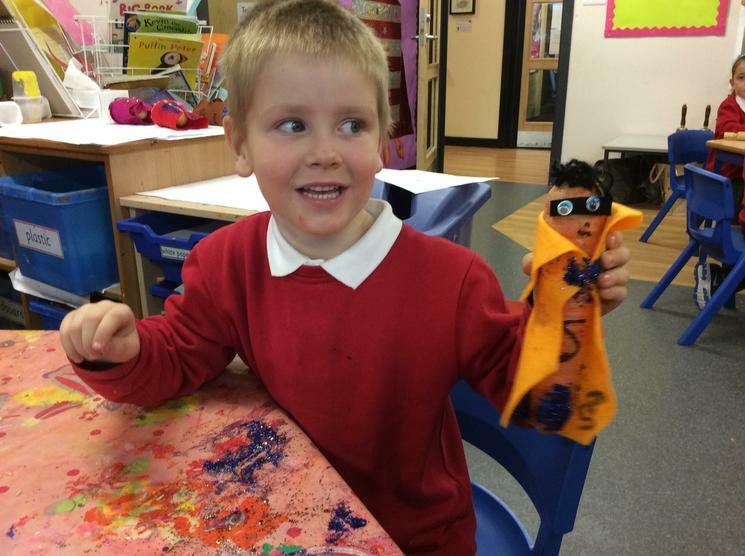 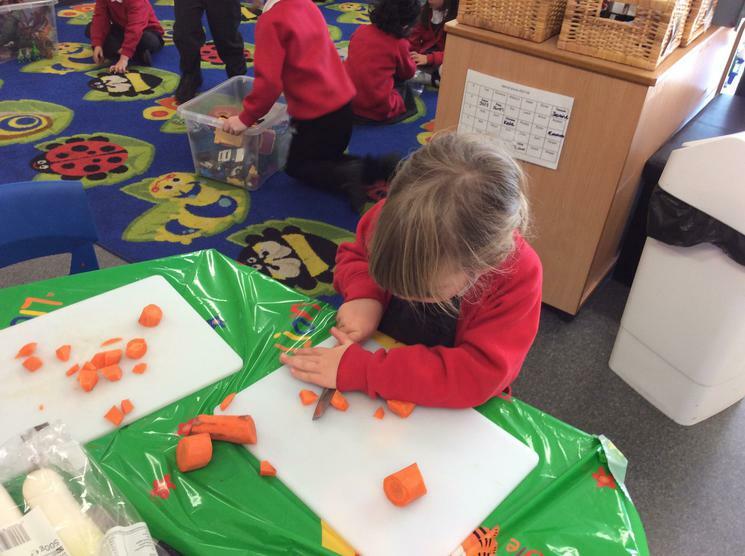 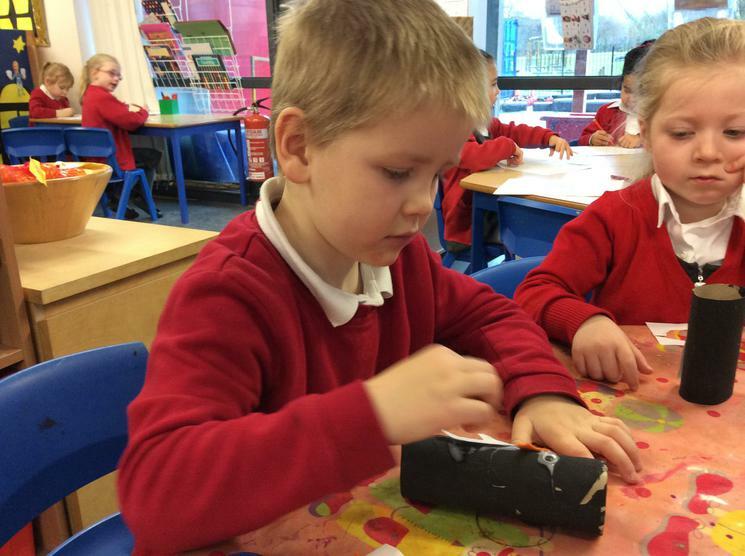 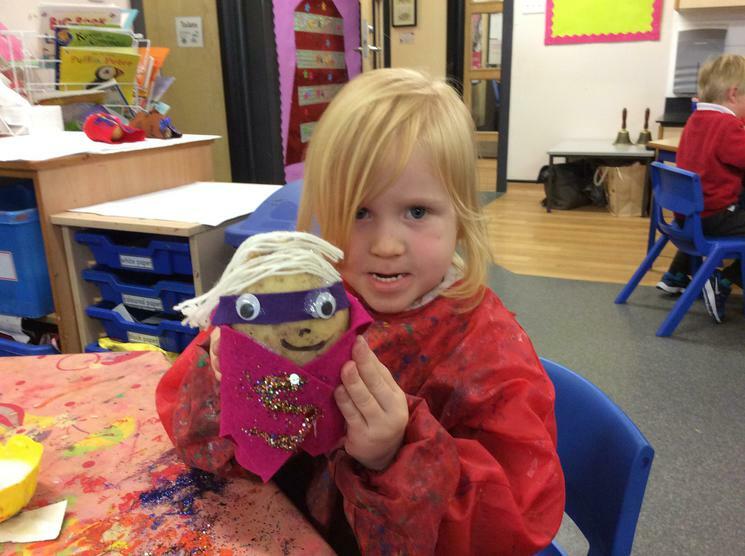 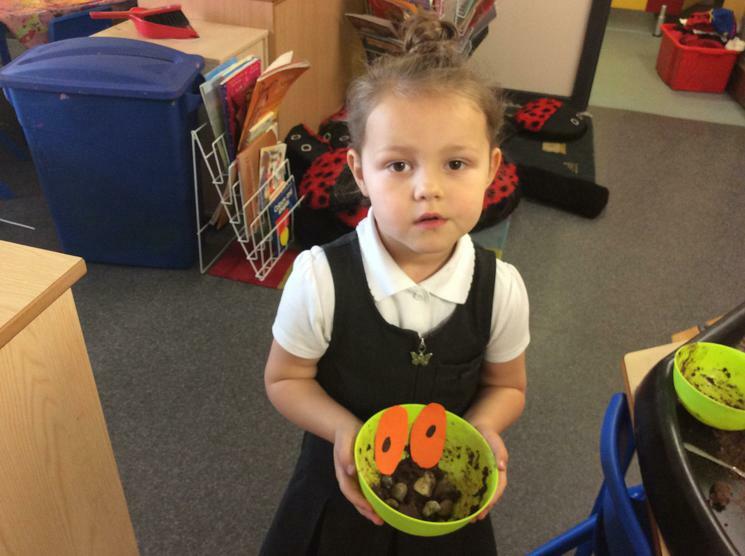 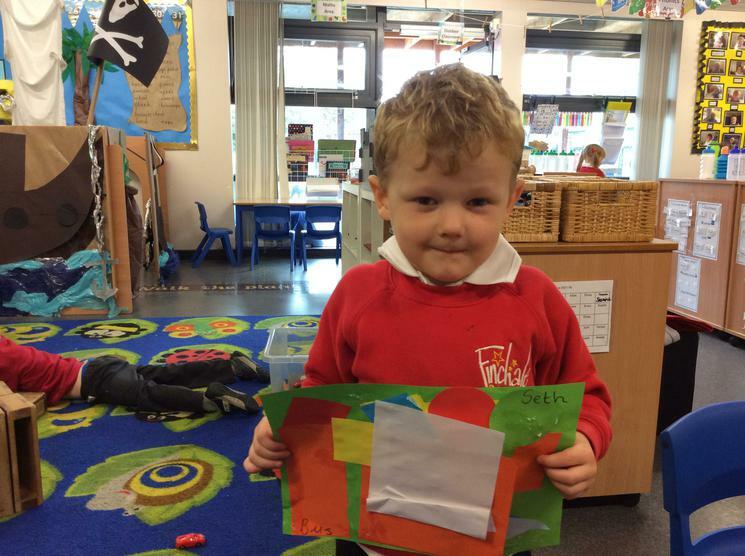 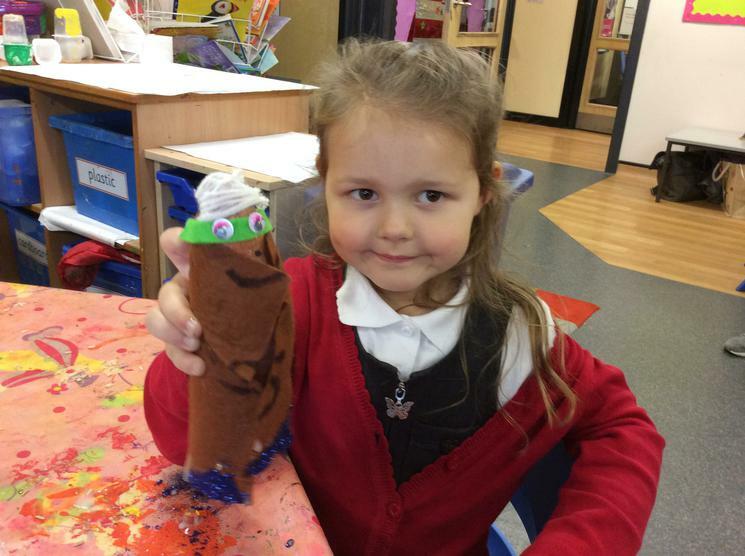 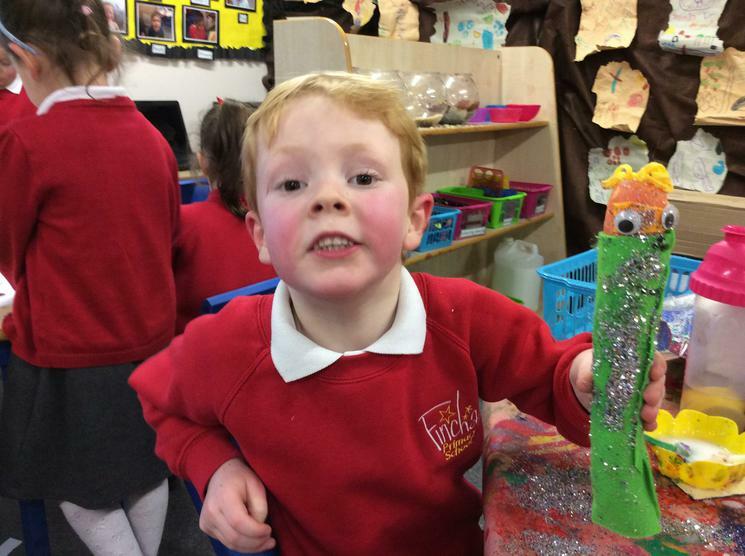 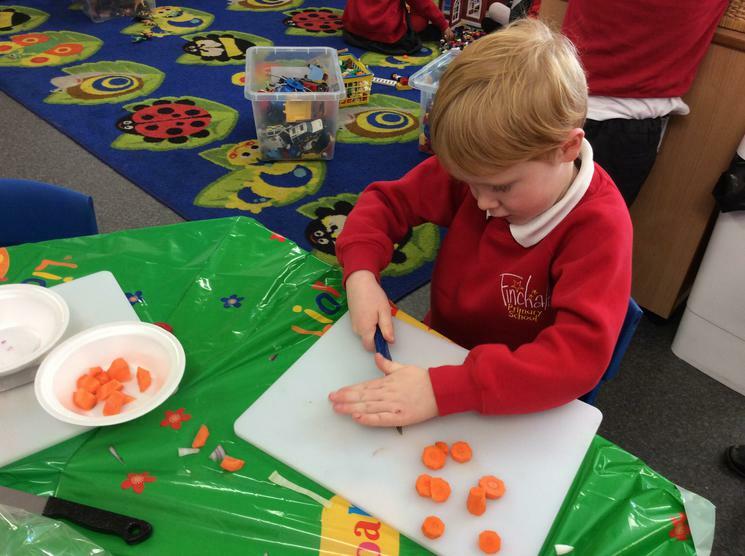 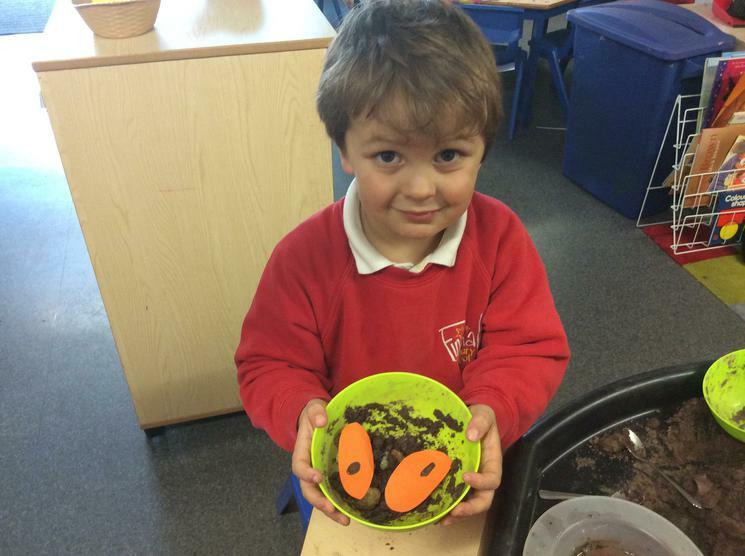 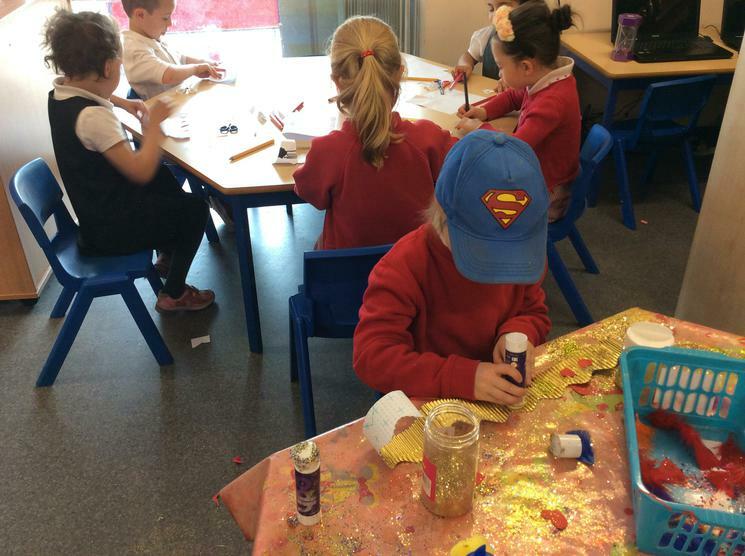 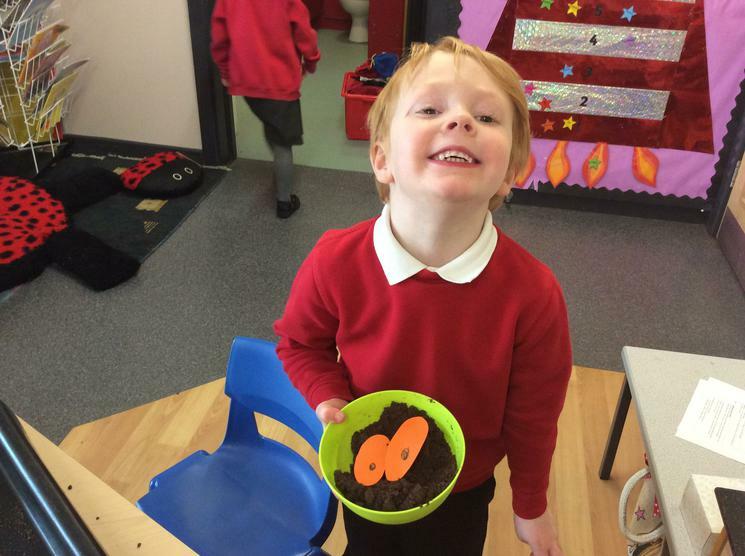 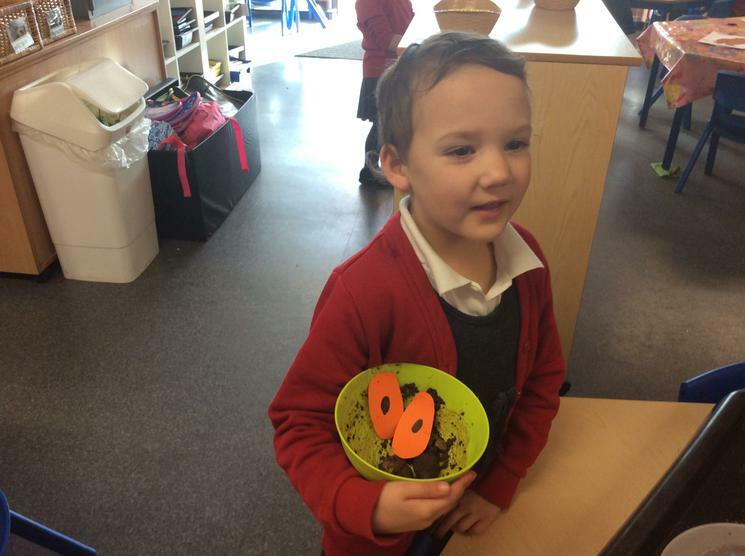 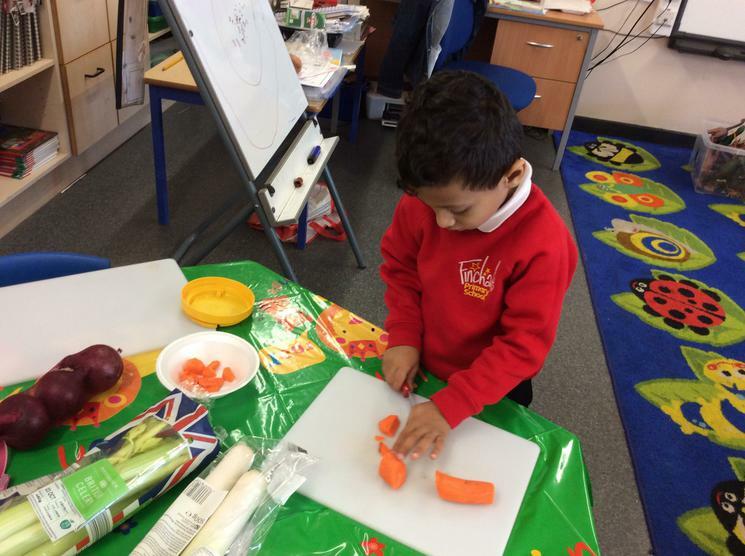 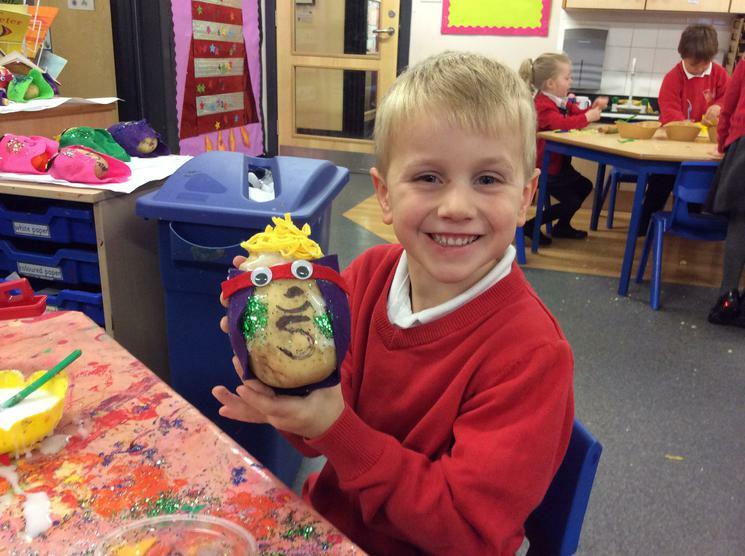 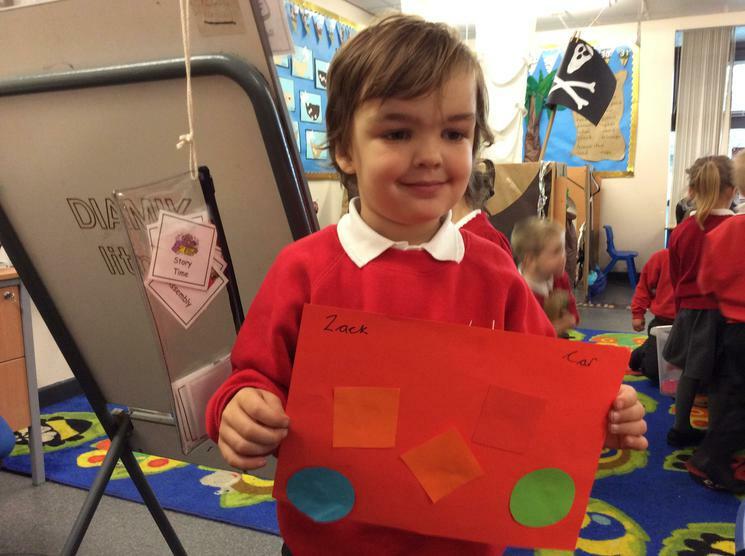 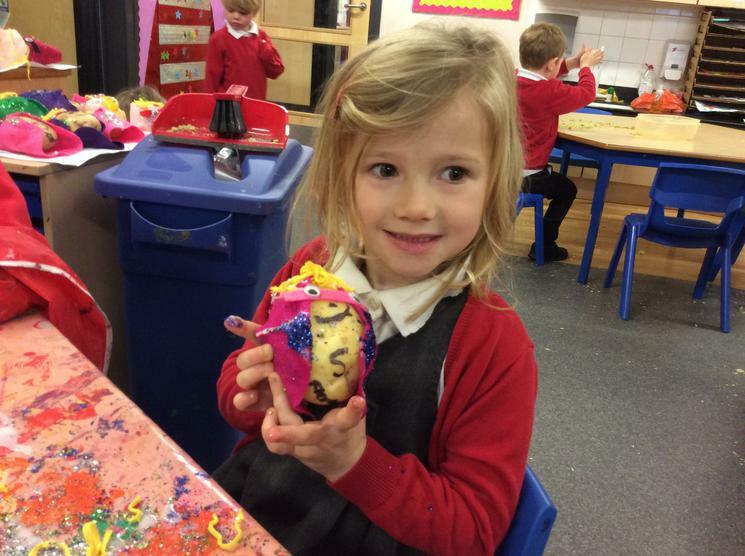 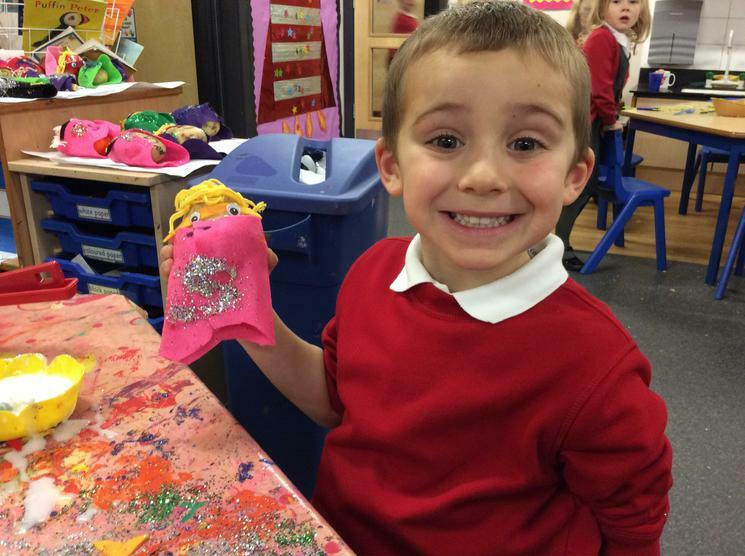 After reading ‘Supertato’ stories, we made our own ‘Superveggies’. 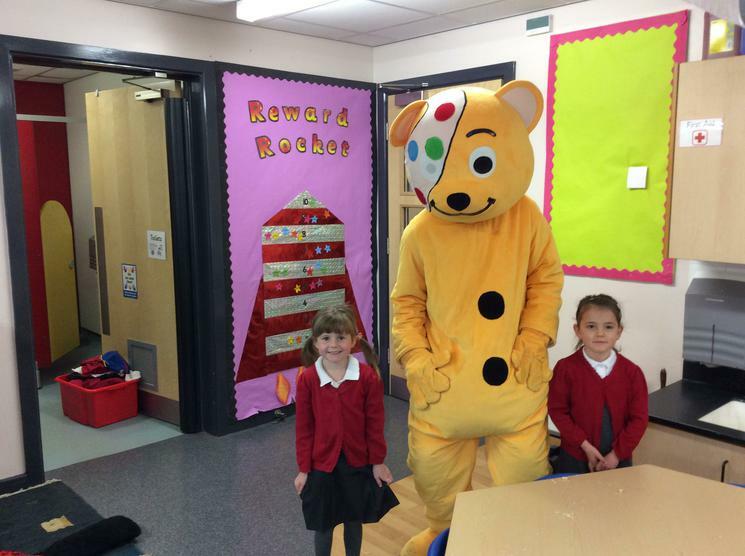 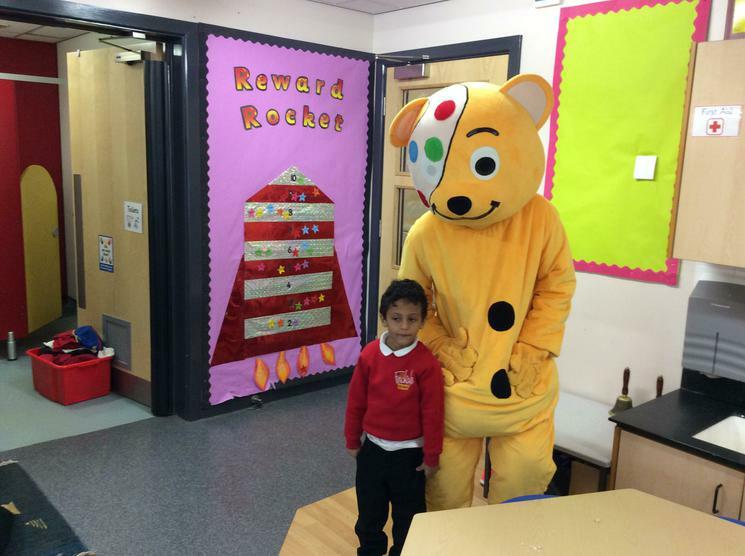 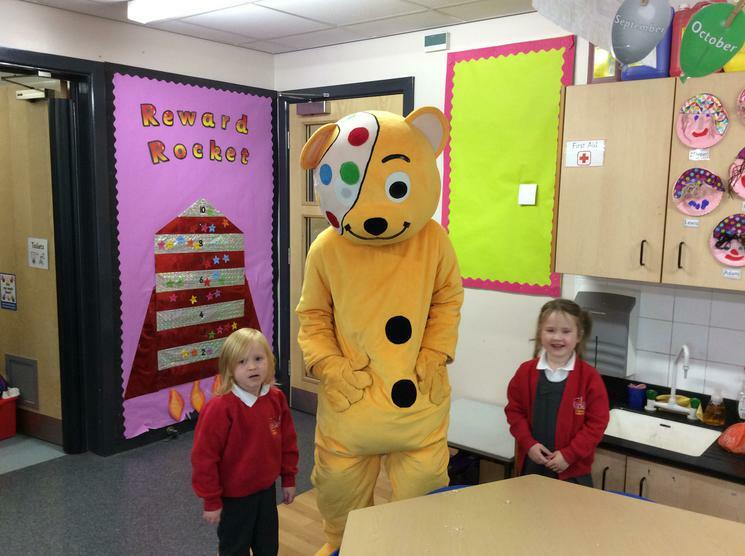 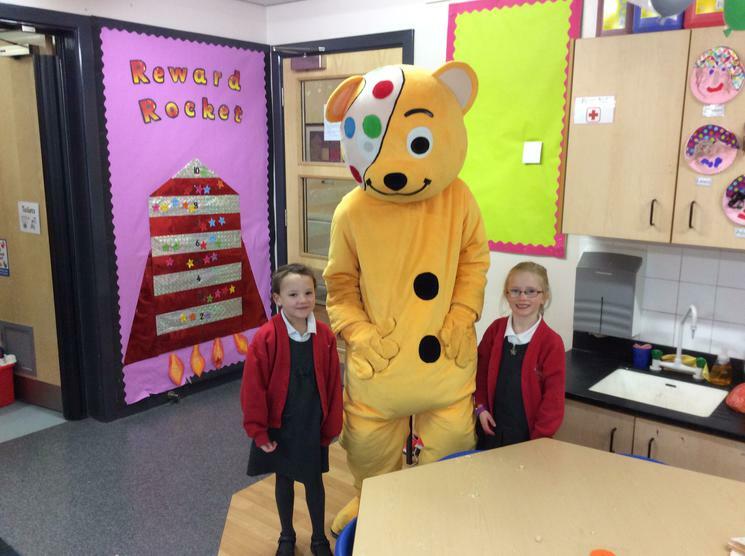 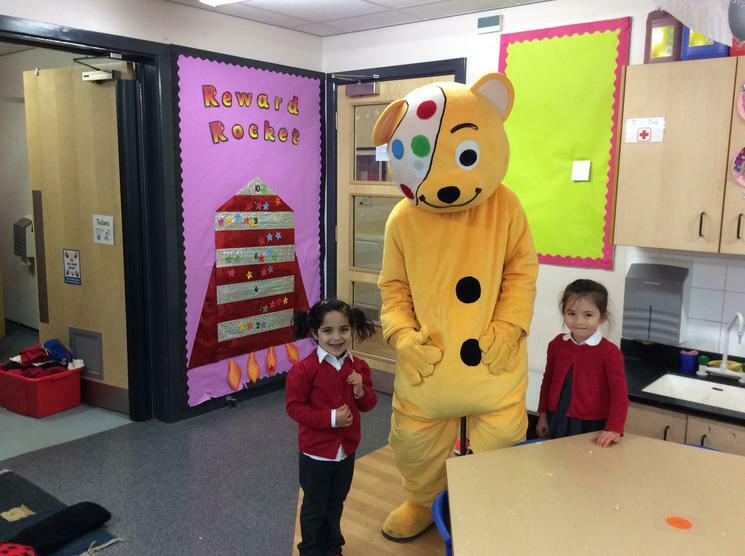 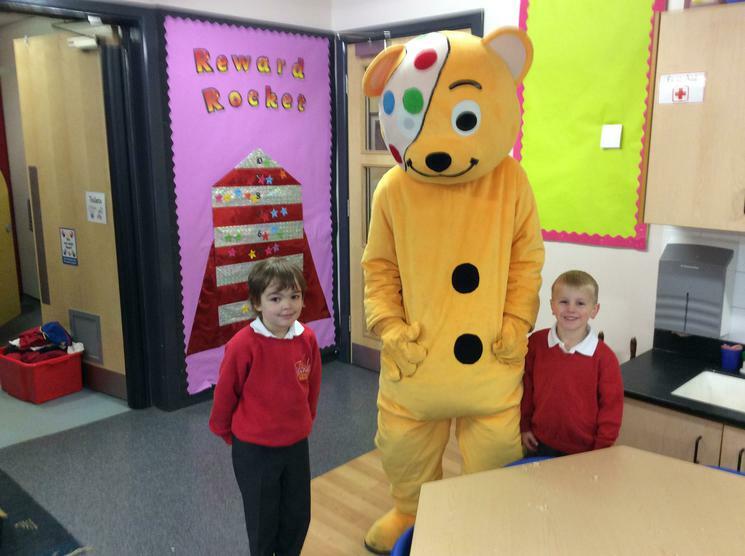 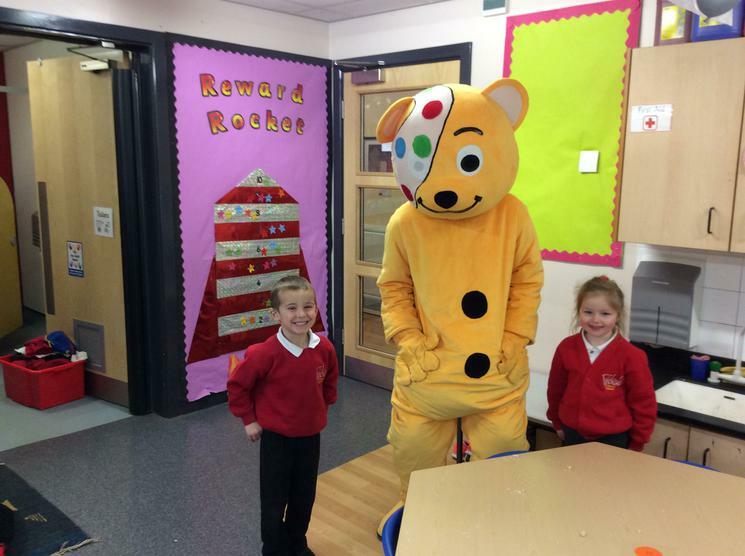 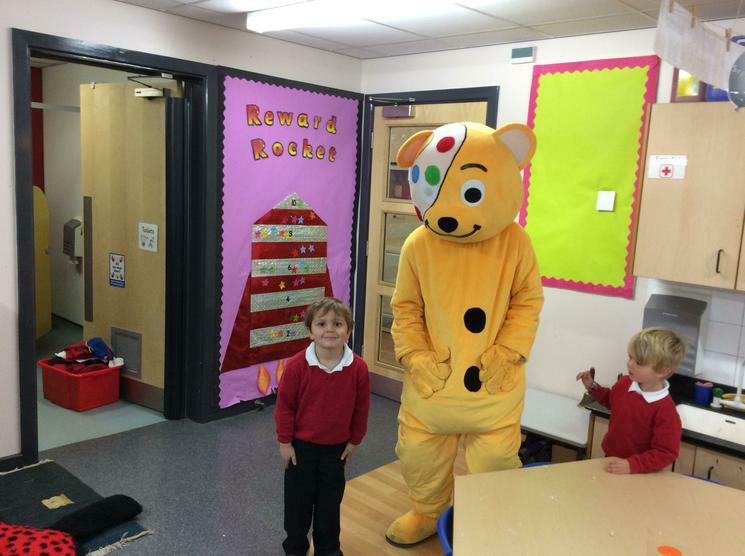 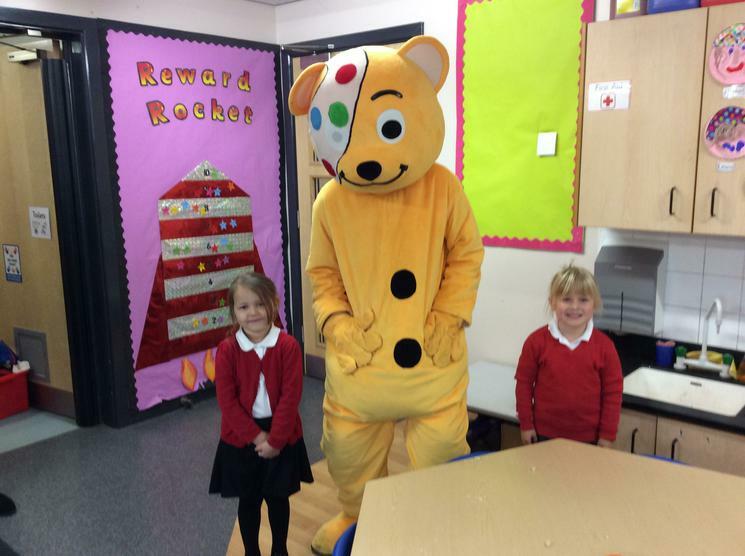 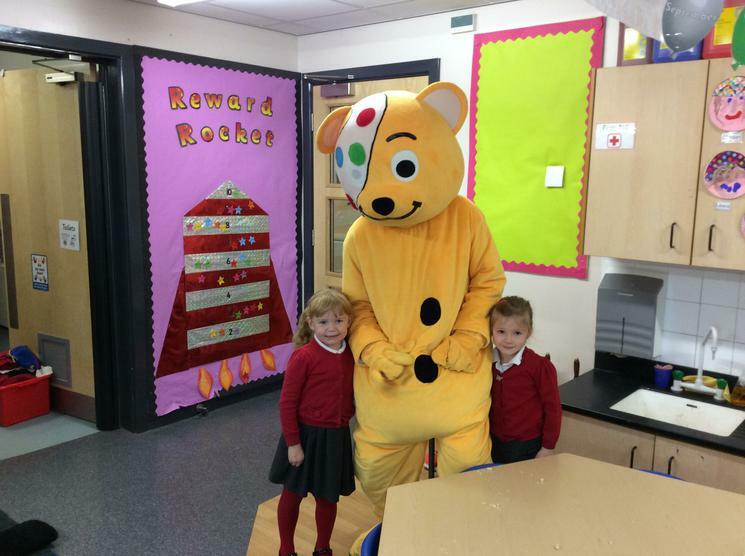 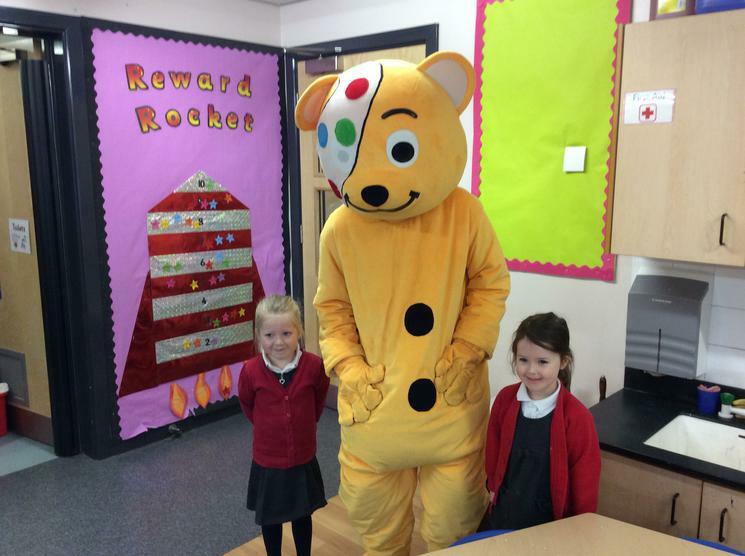 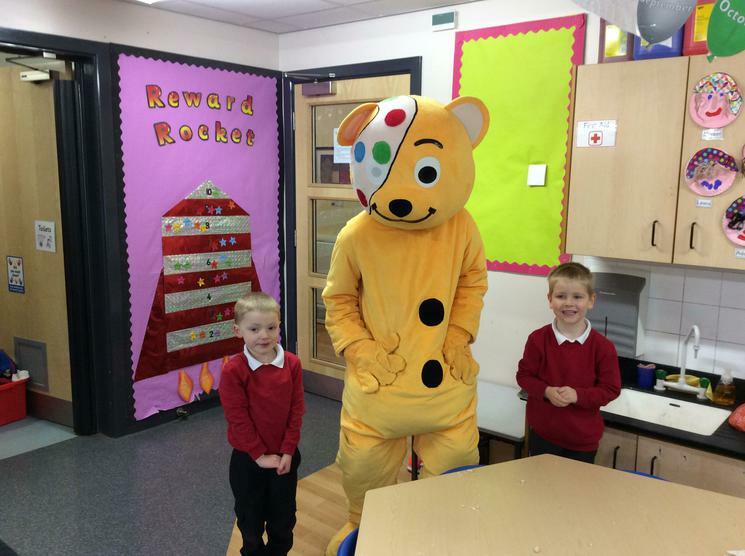 Pudsey Bear came to visit us in school! 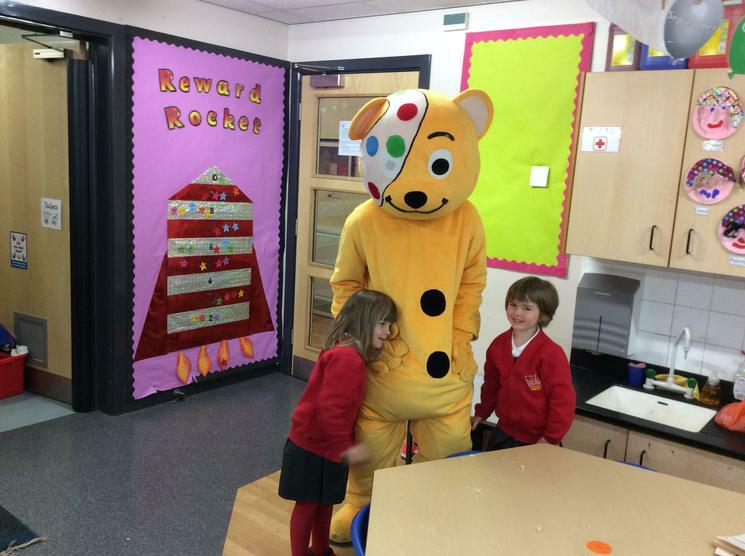 We came to school dressed in spots and/or pyjamas to raise money for Children in Need. 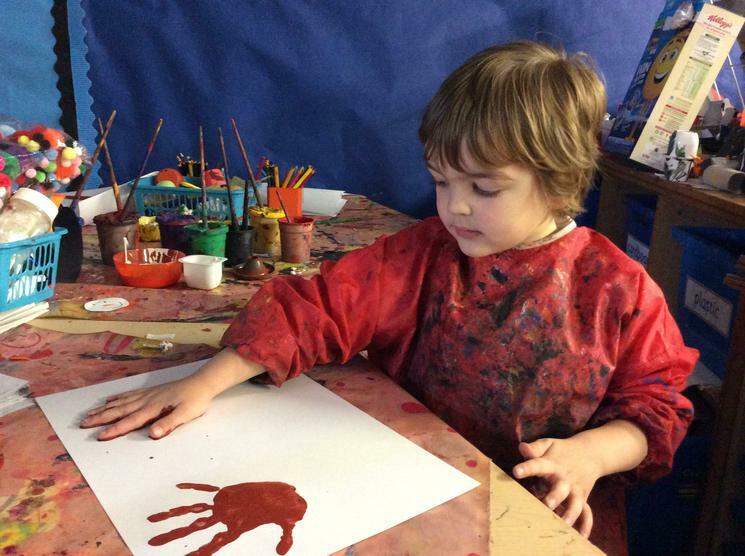 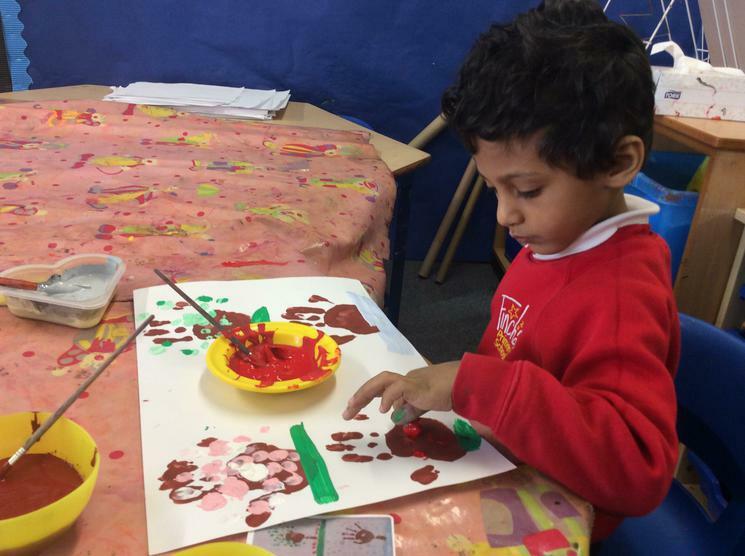 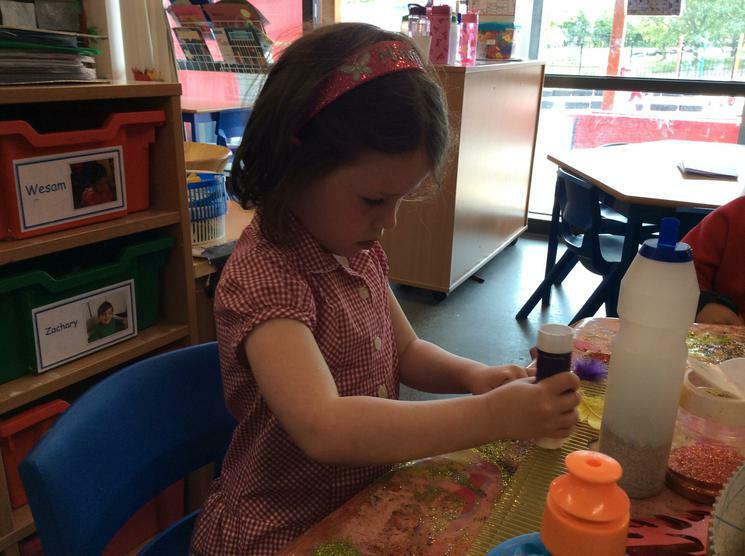 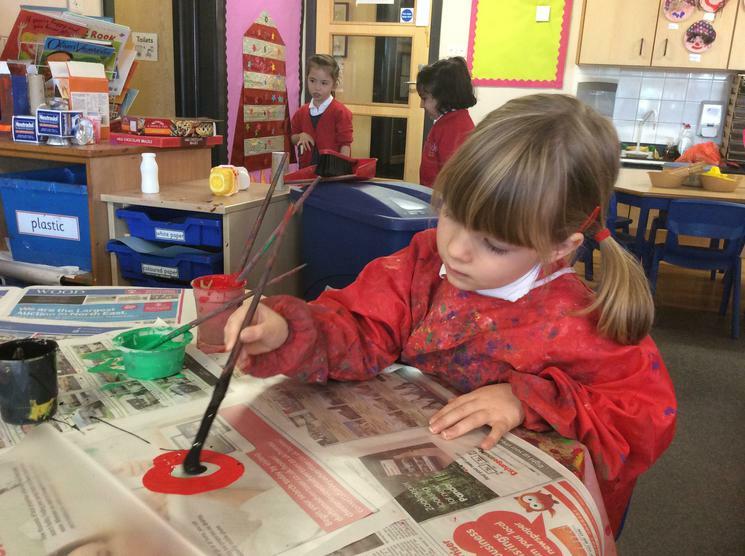 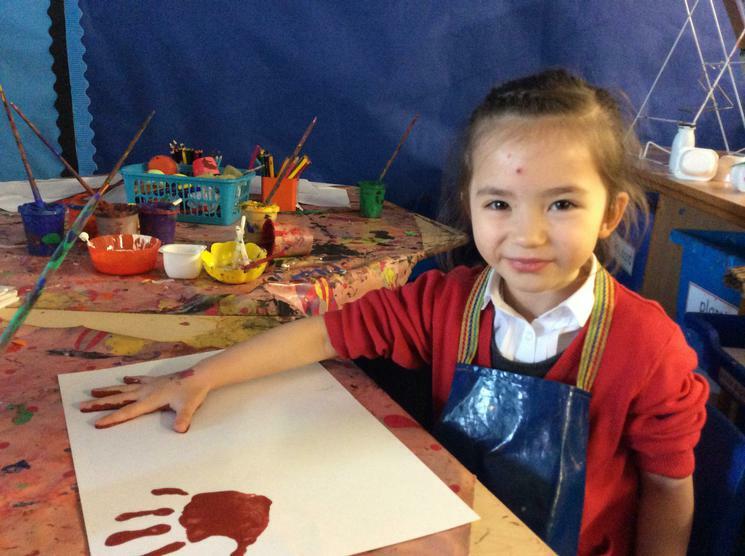 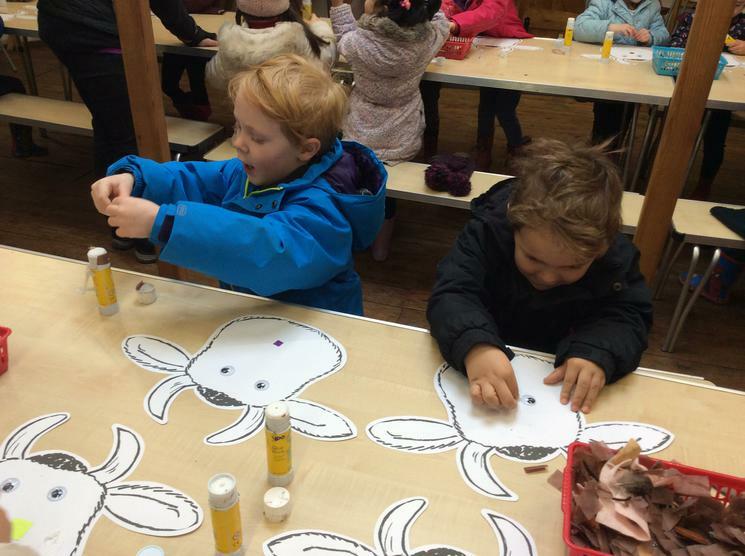 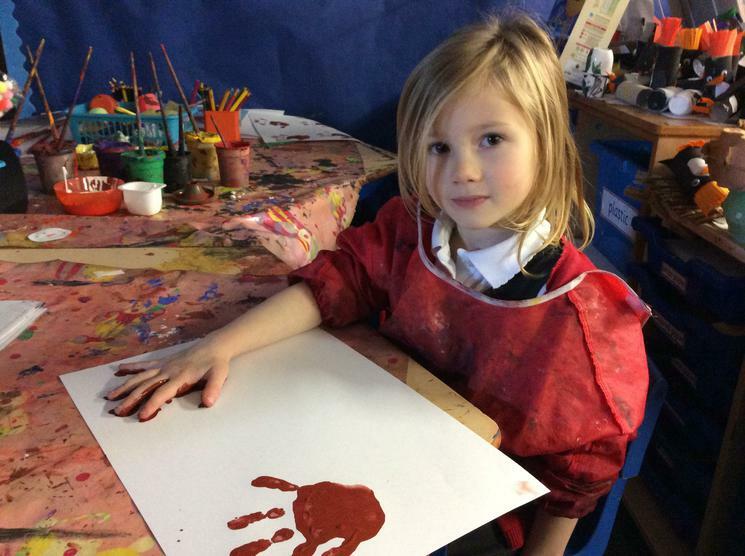 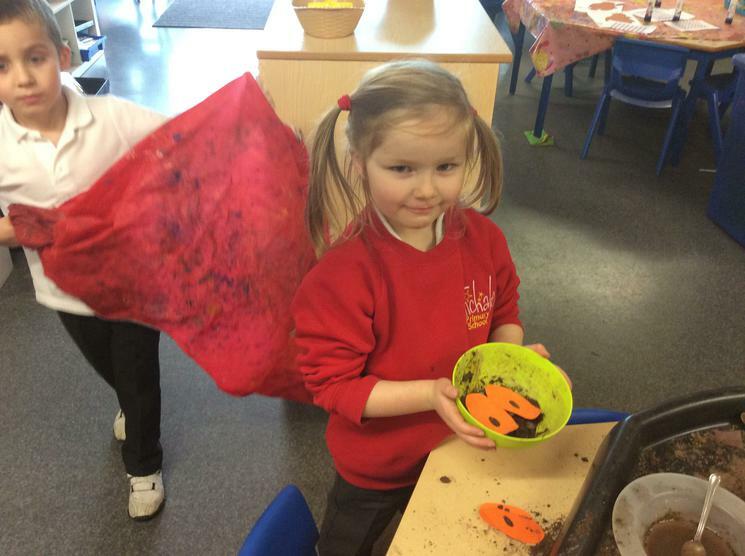 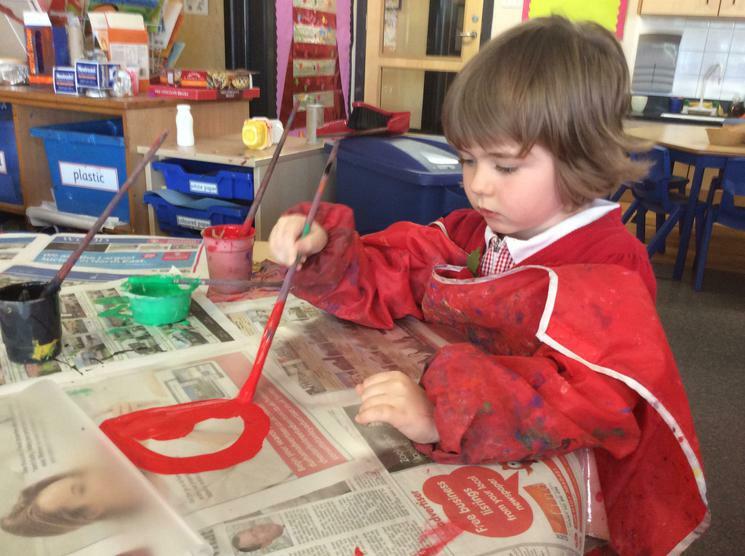 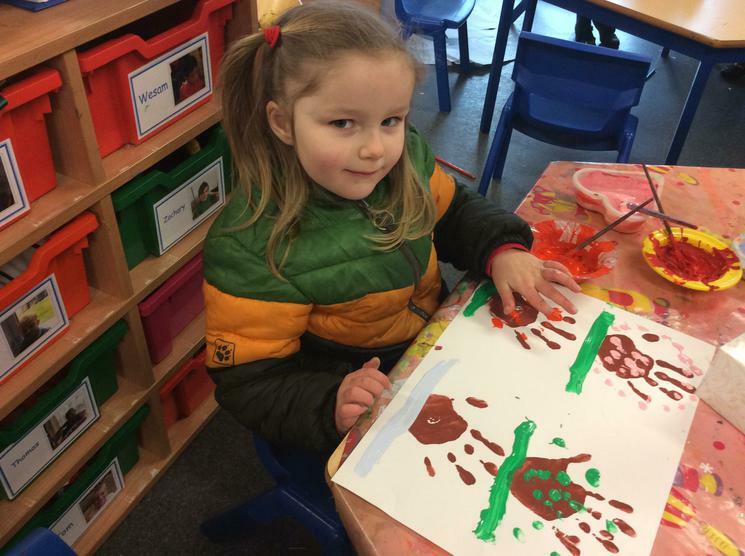 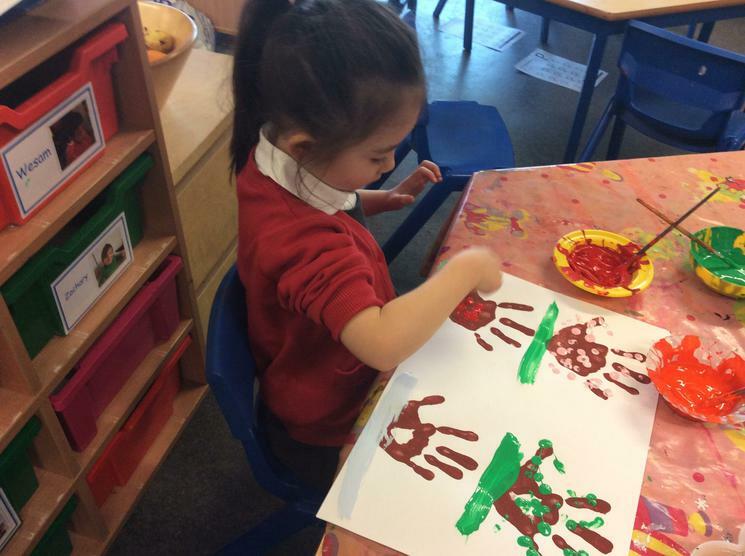 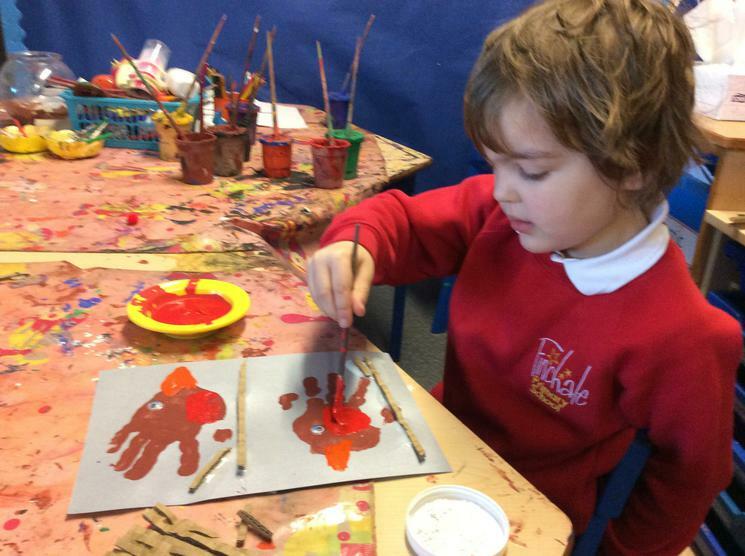 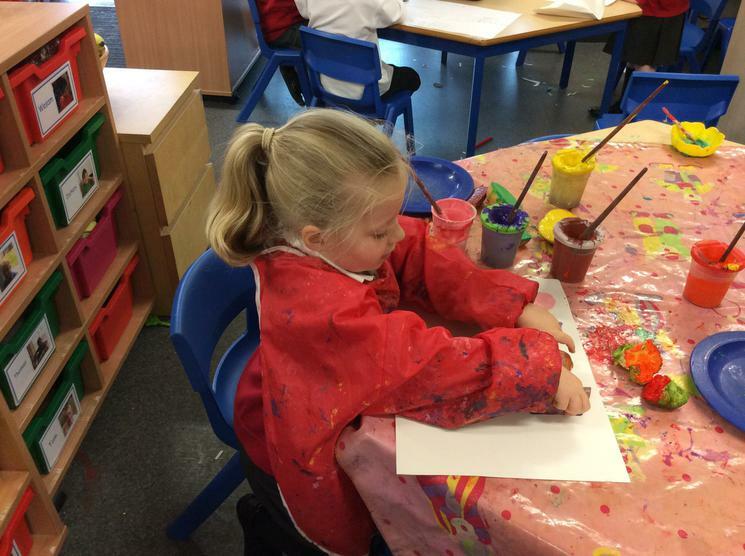 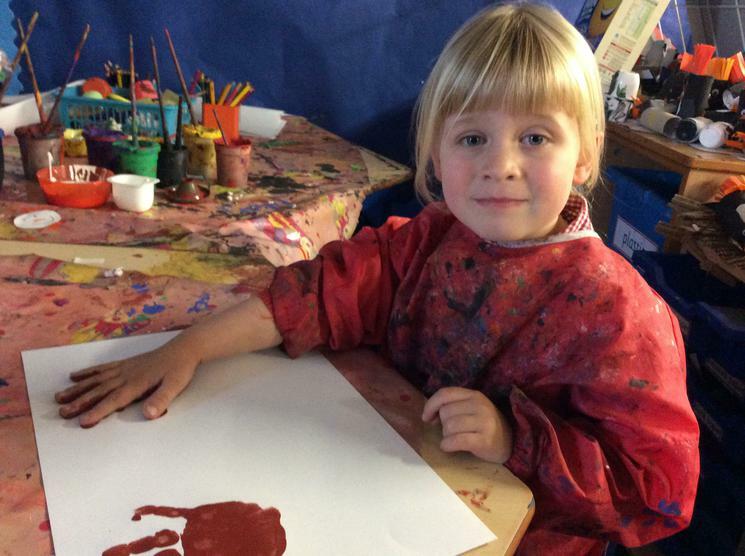 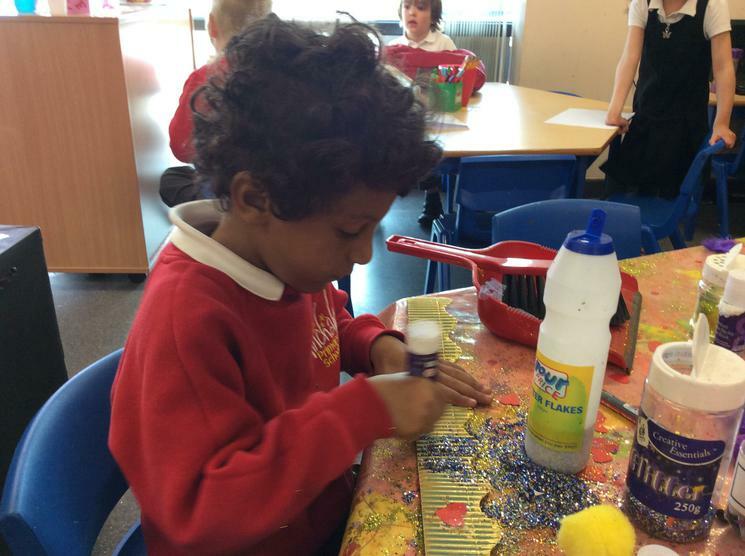 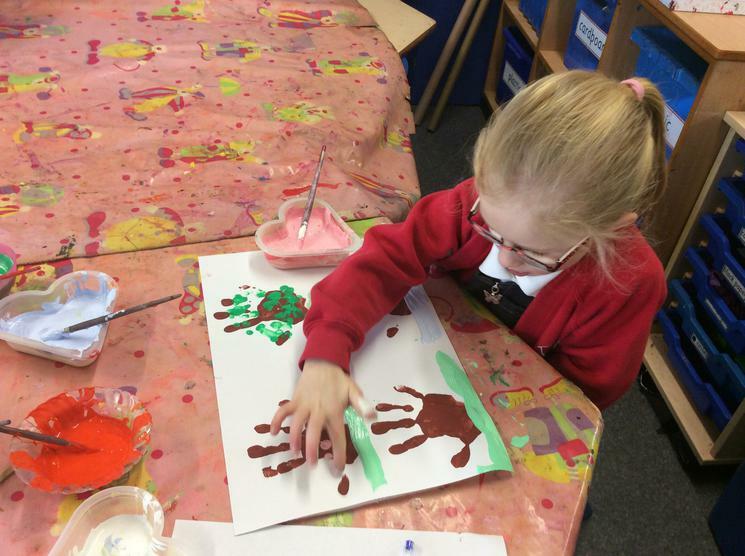 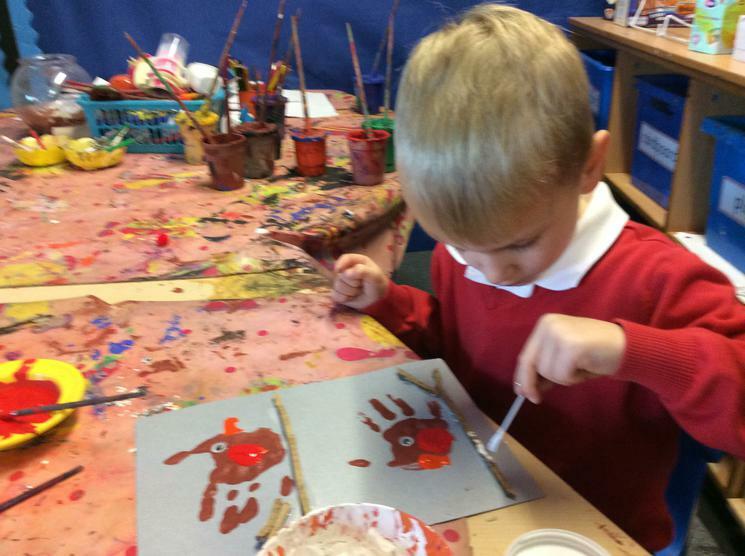 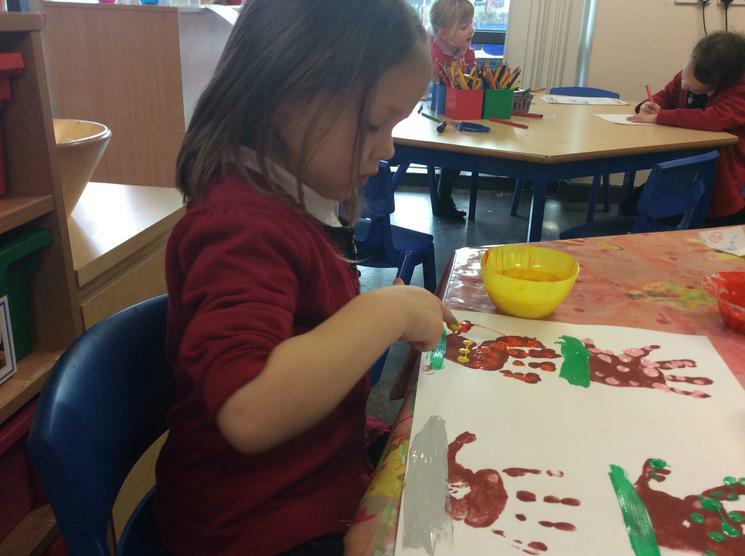 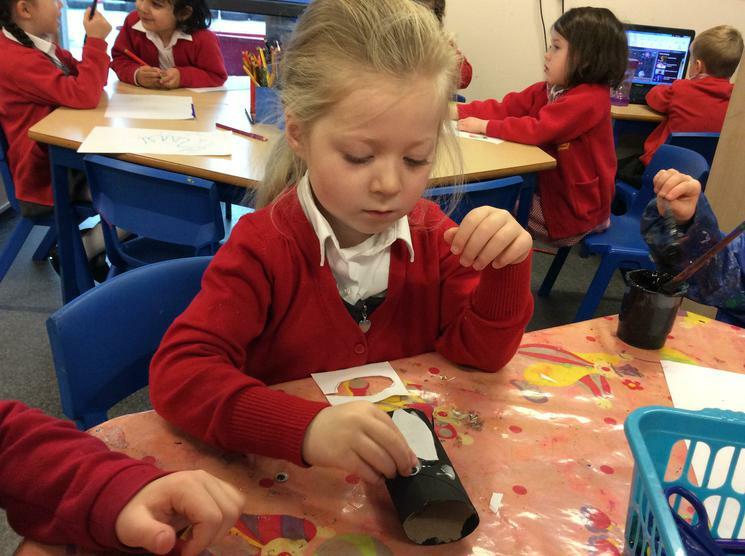 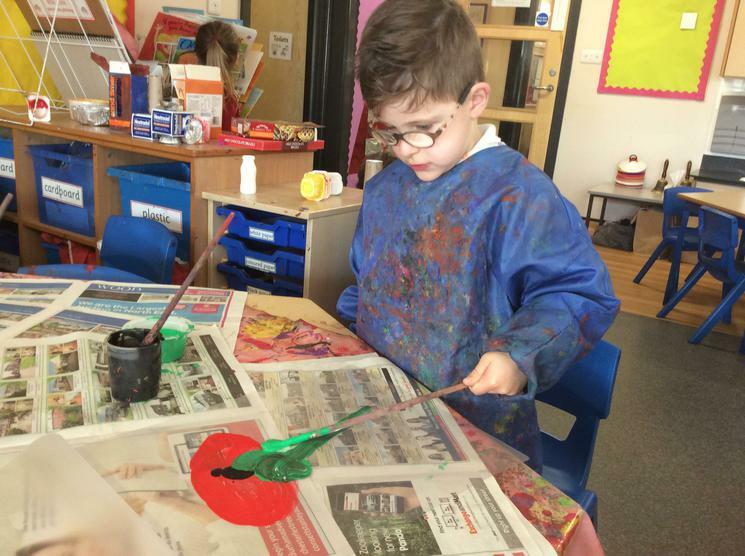 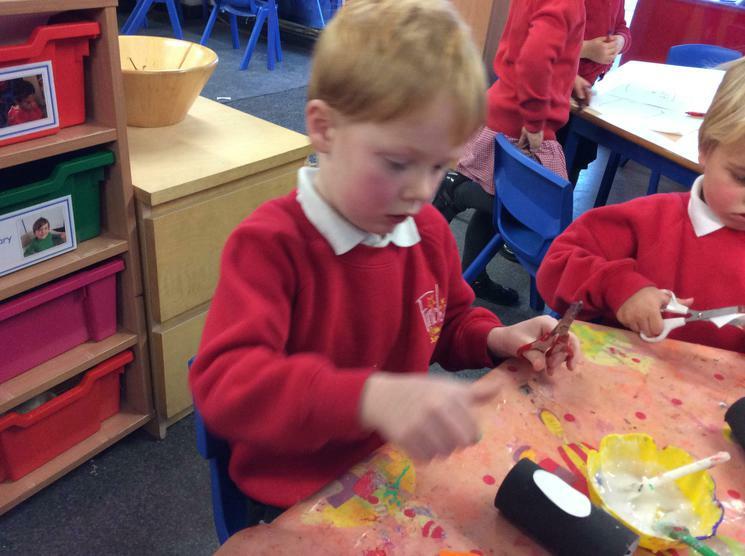 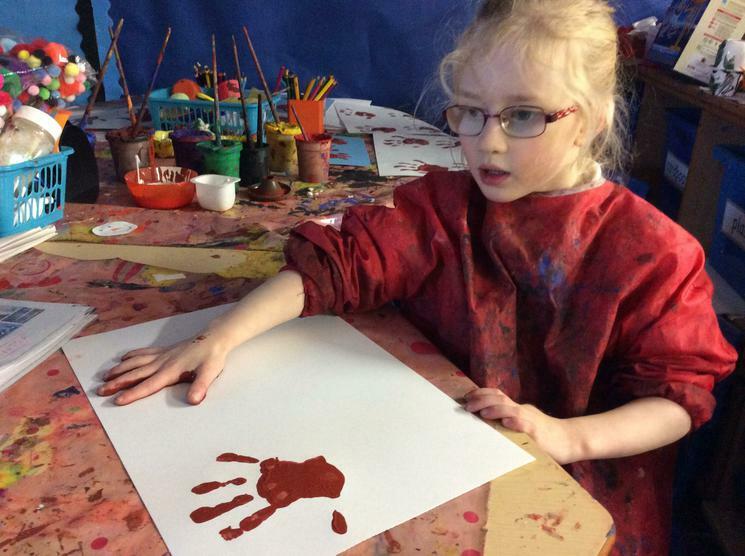 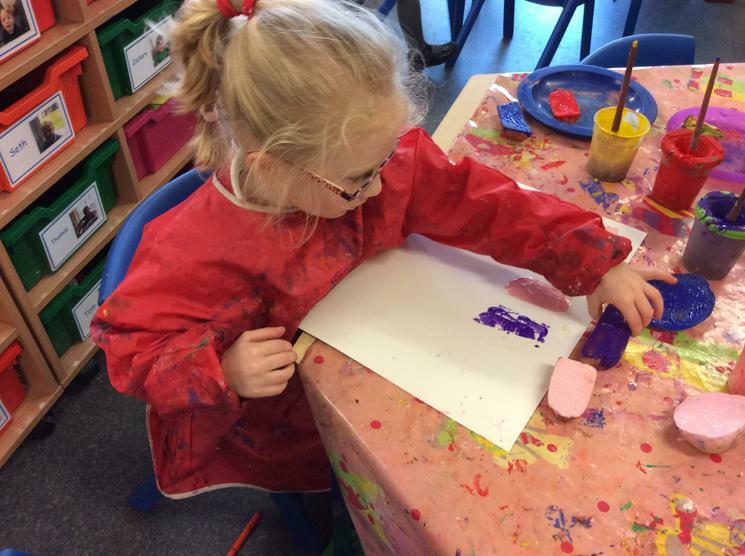 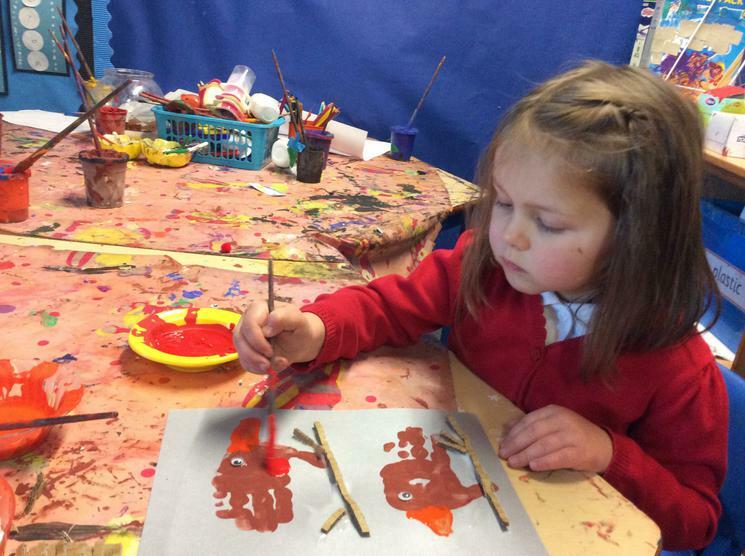 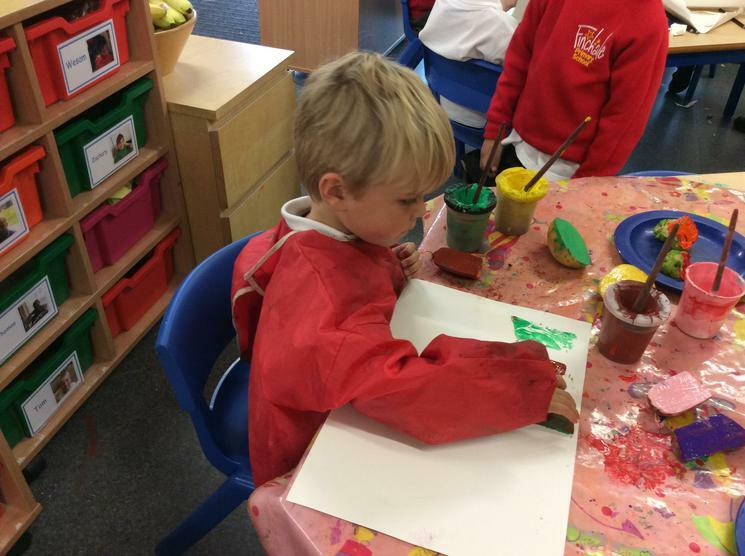 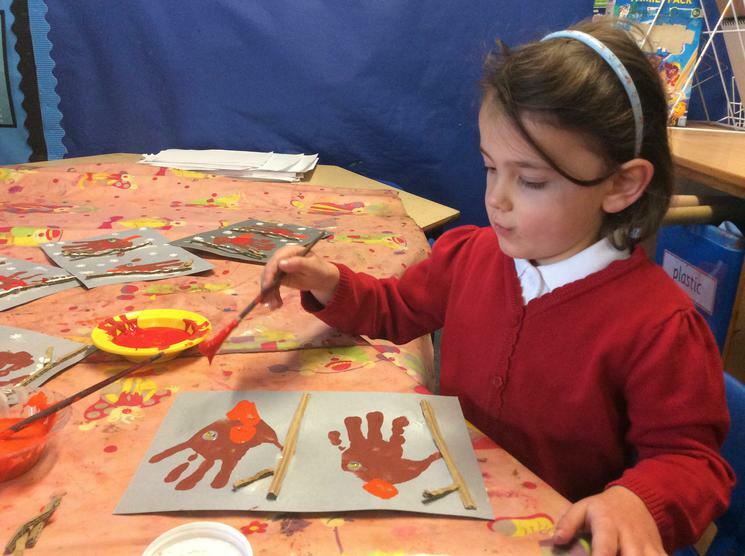 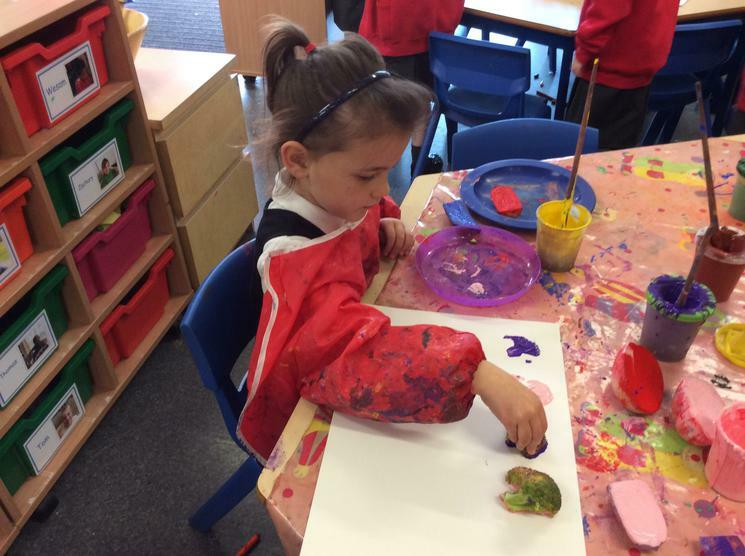 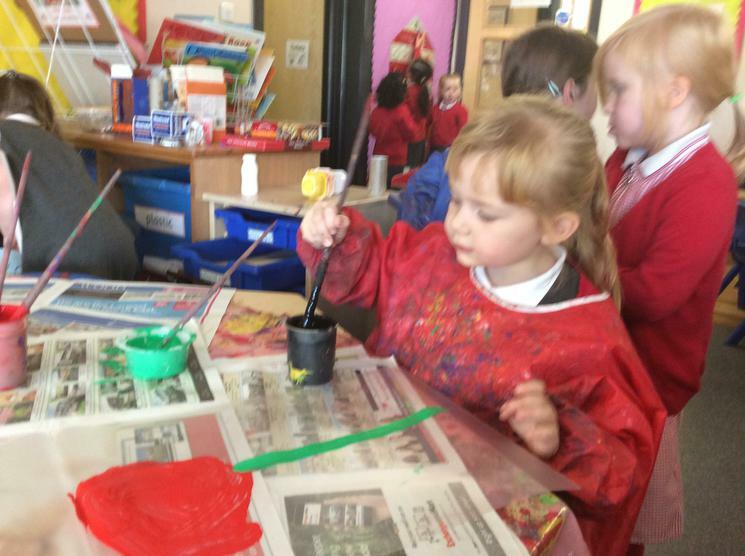 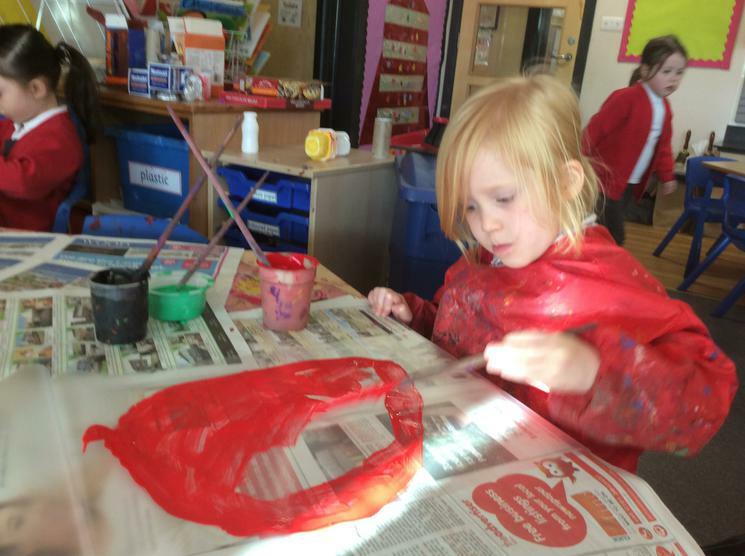 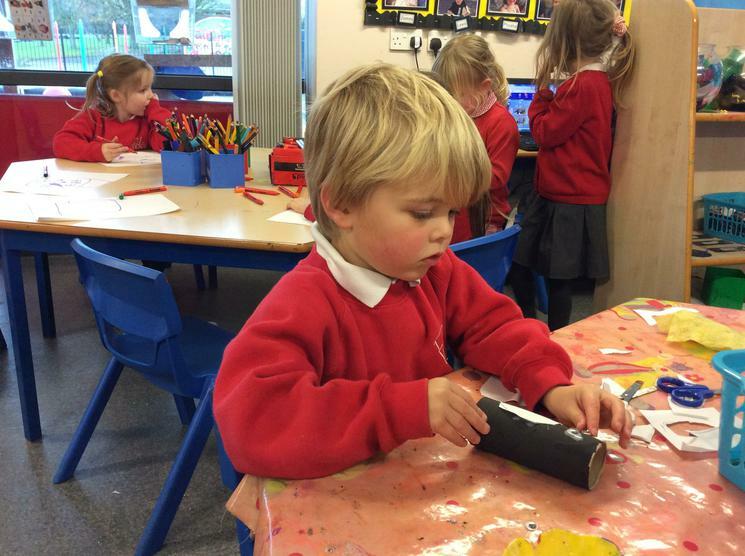 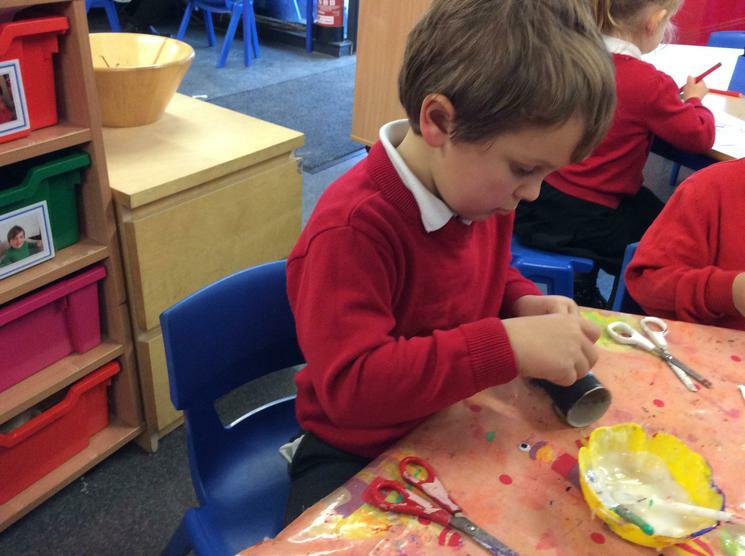 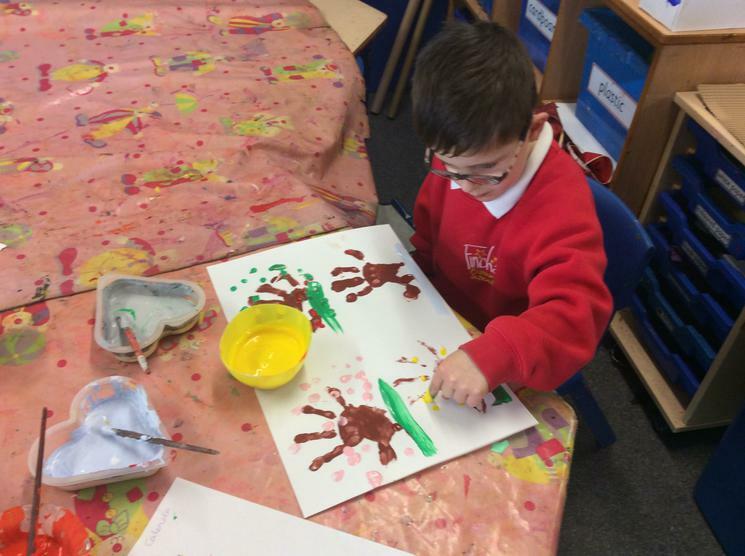 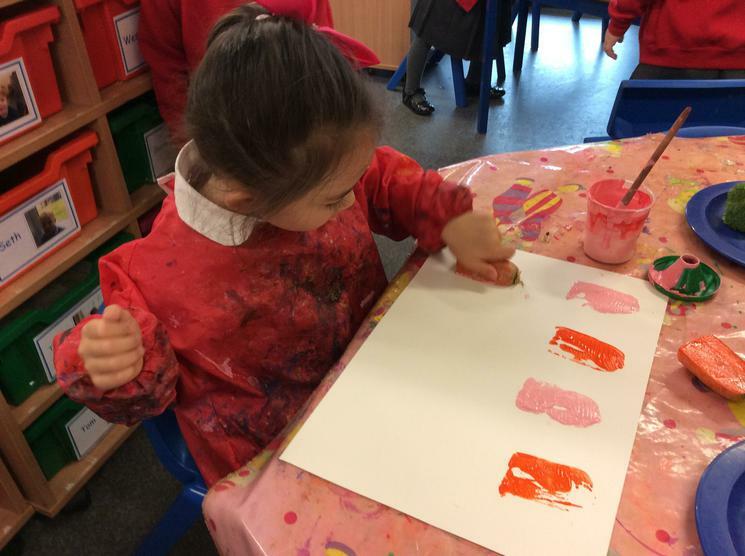 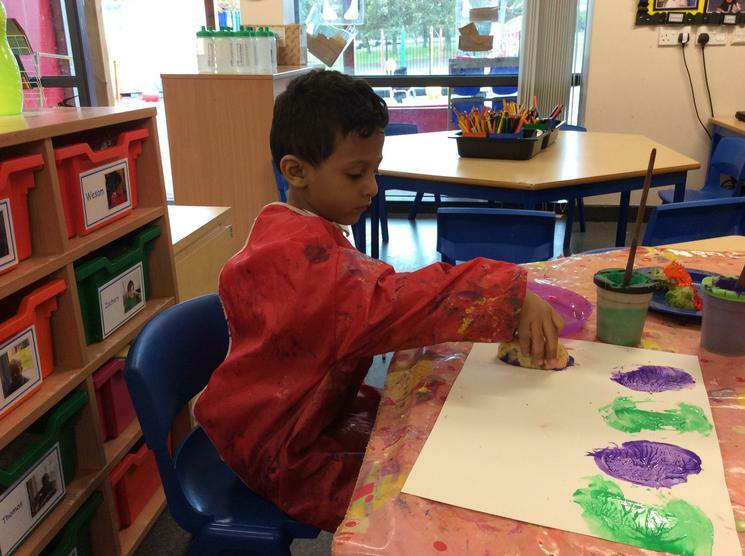 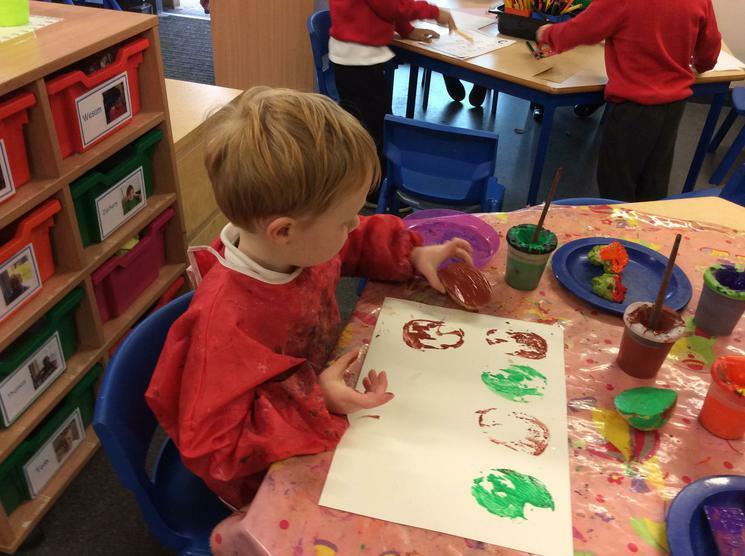 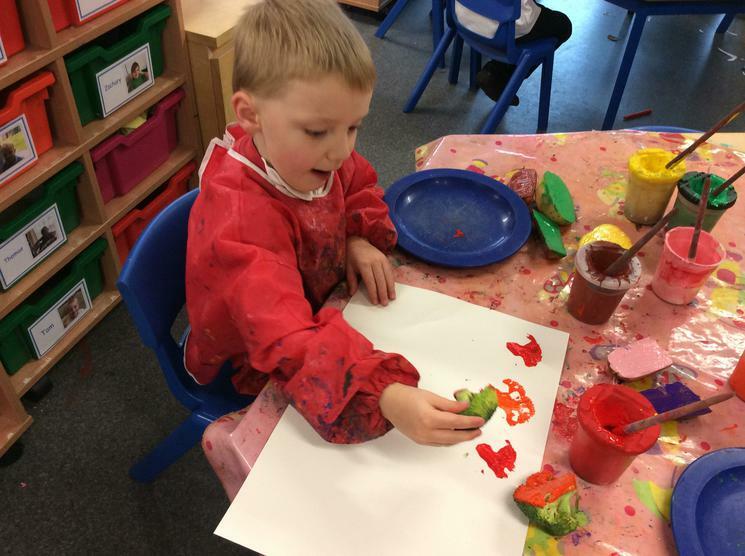 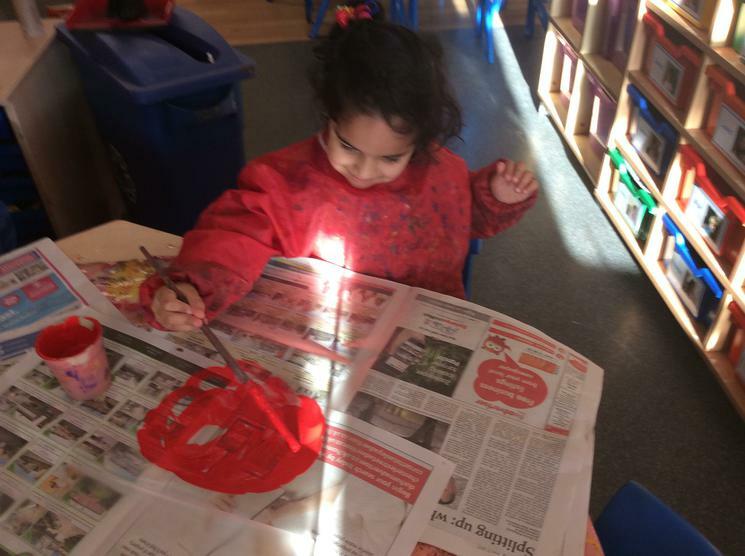 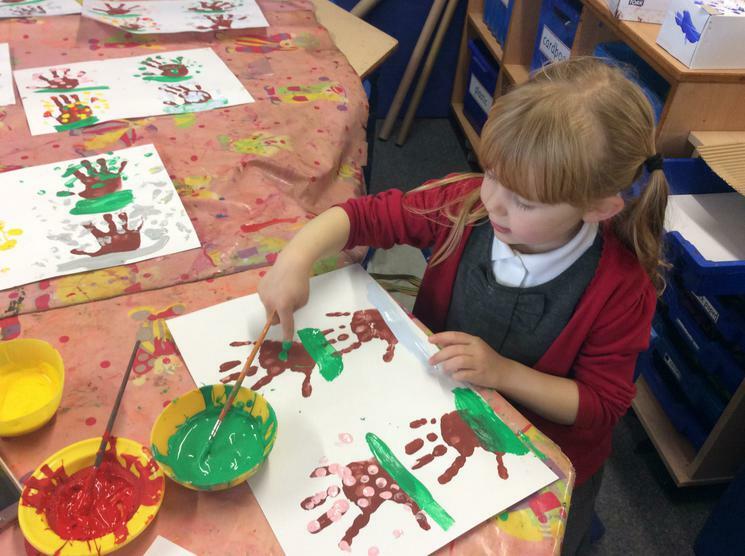 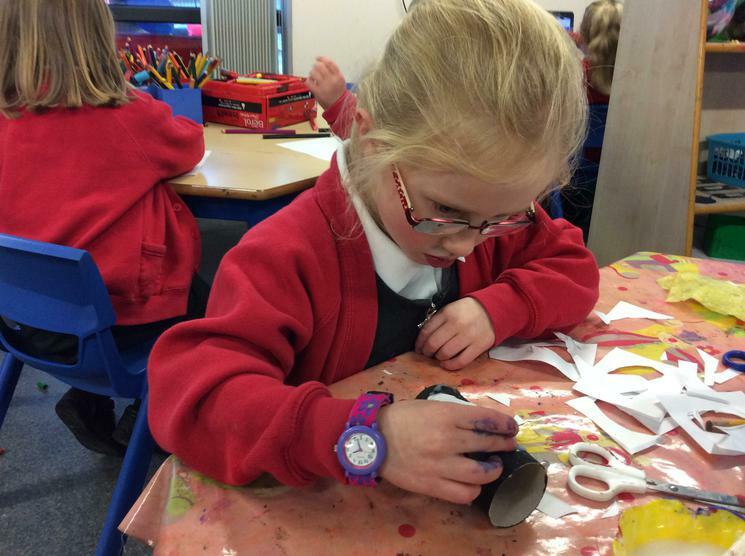 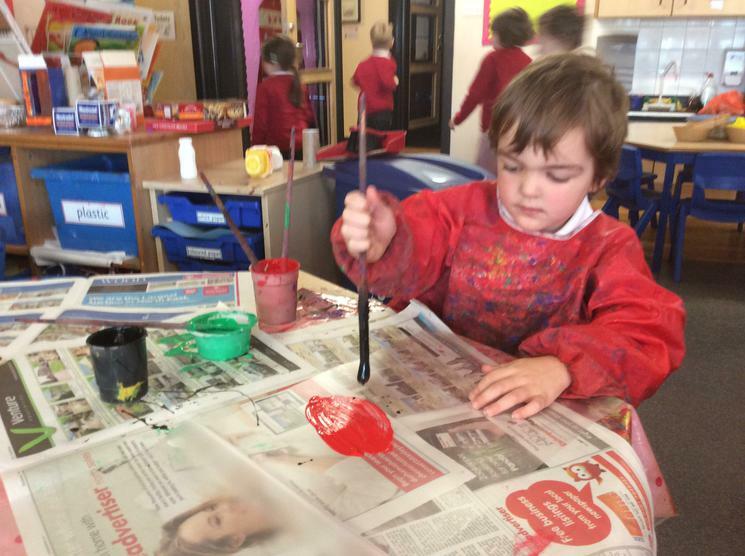 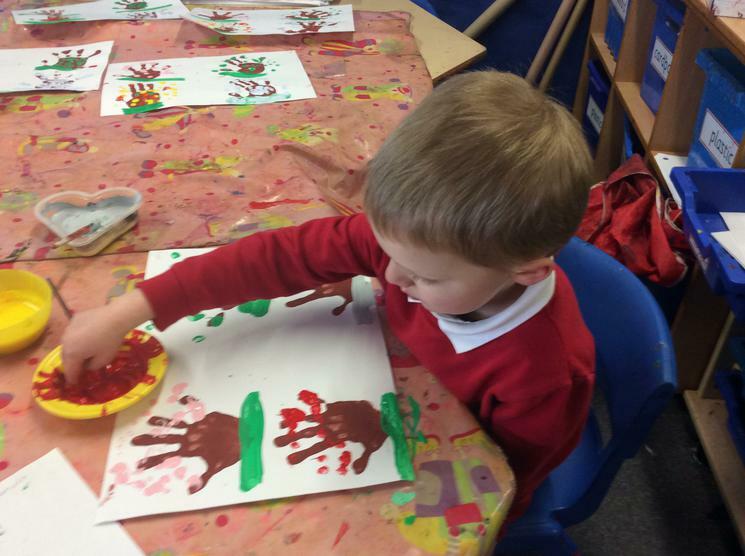 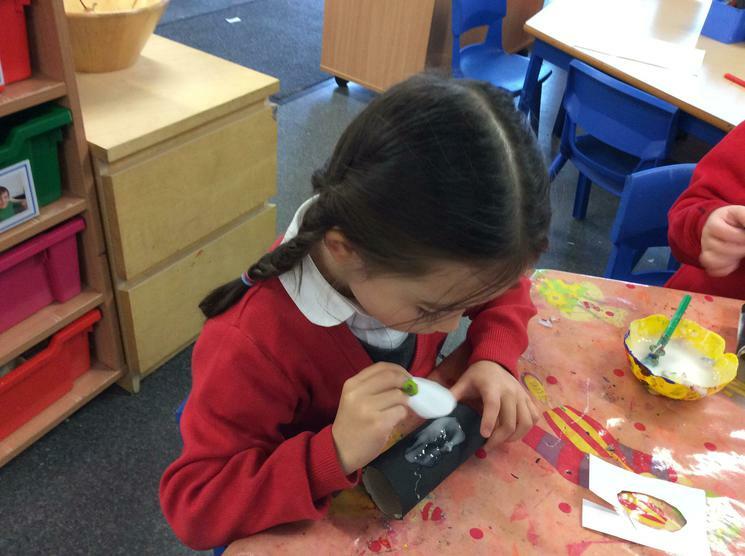 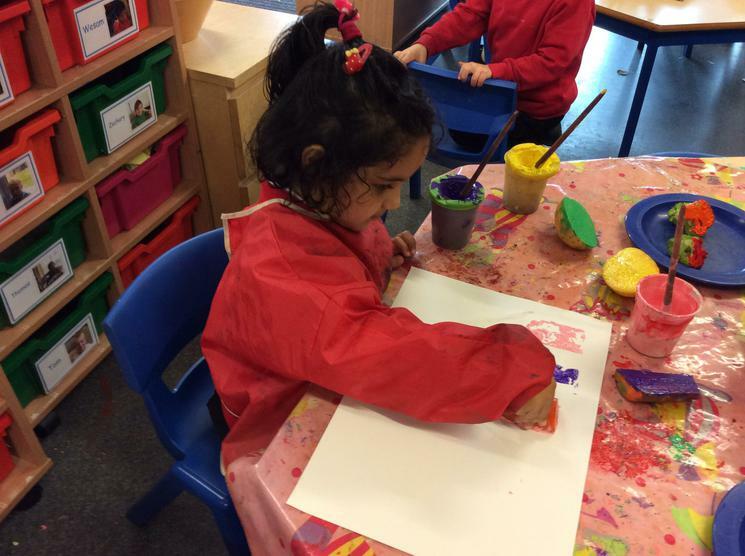 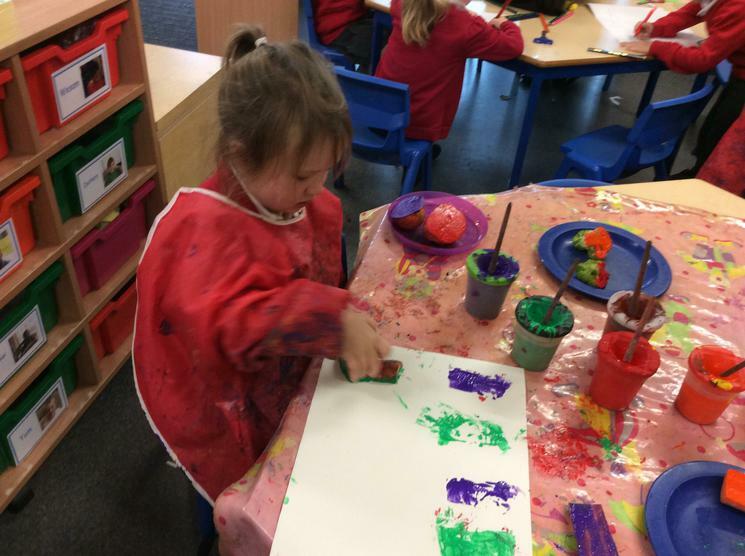 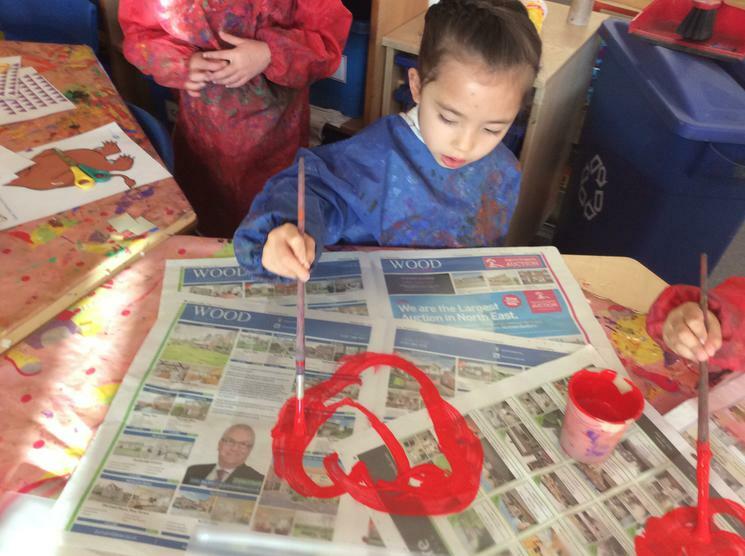 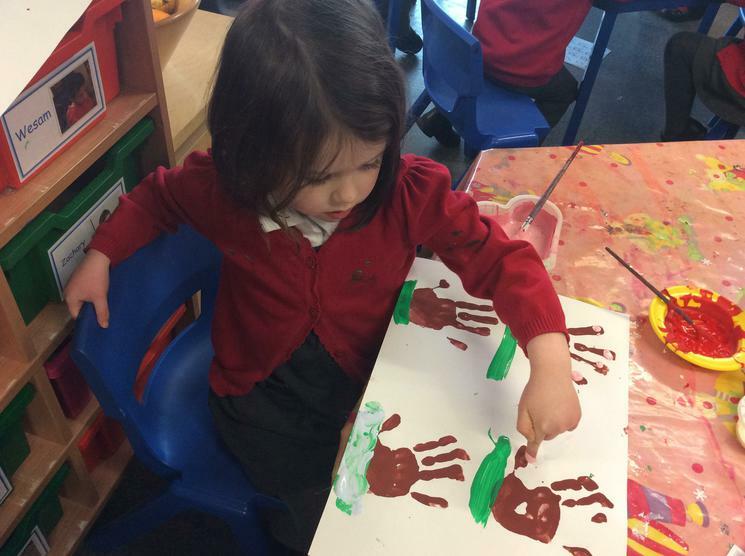 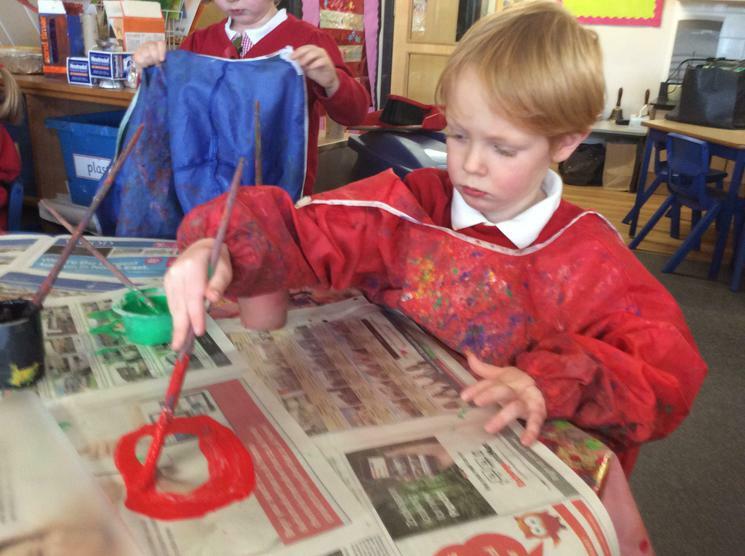 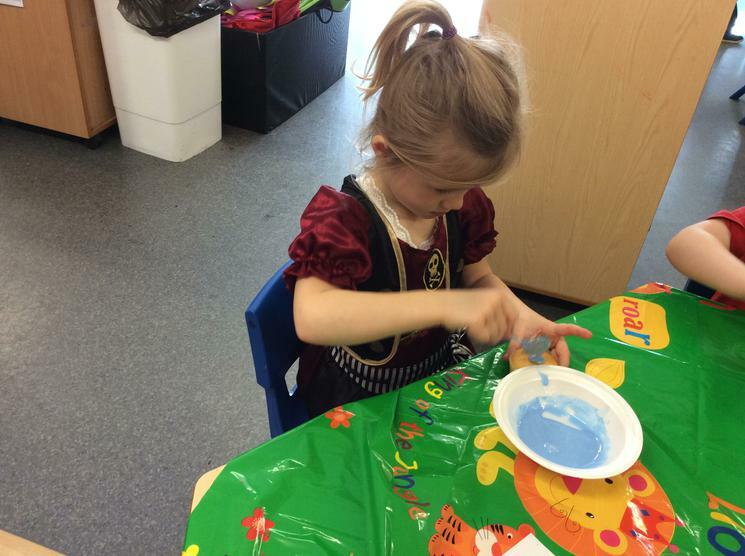 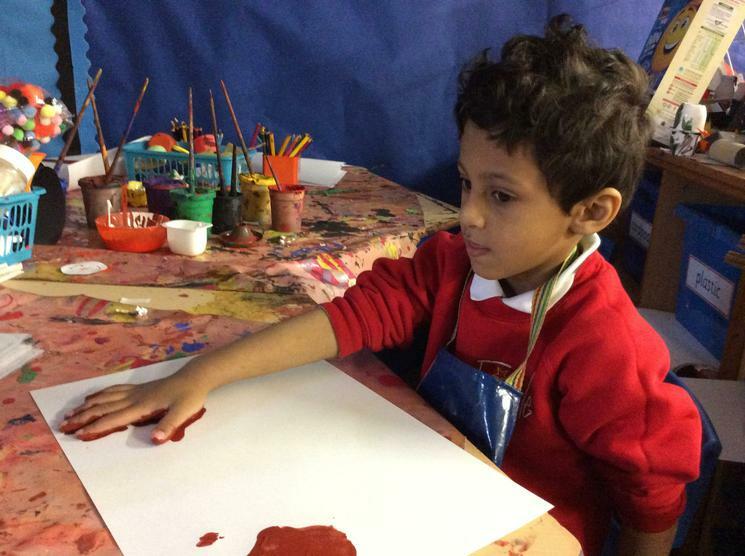 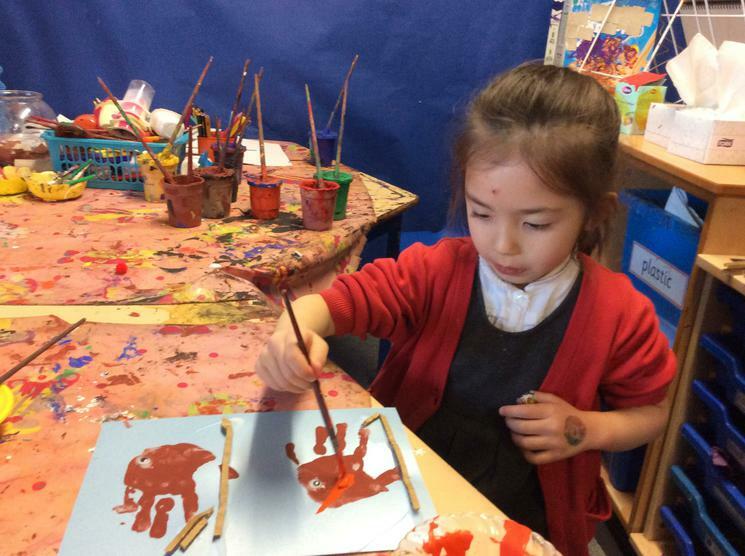 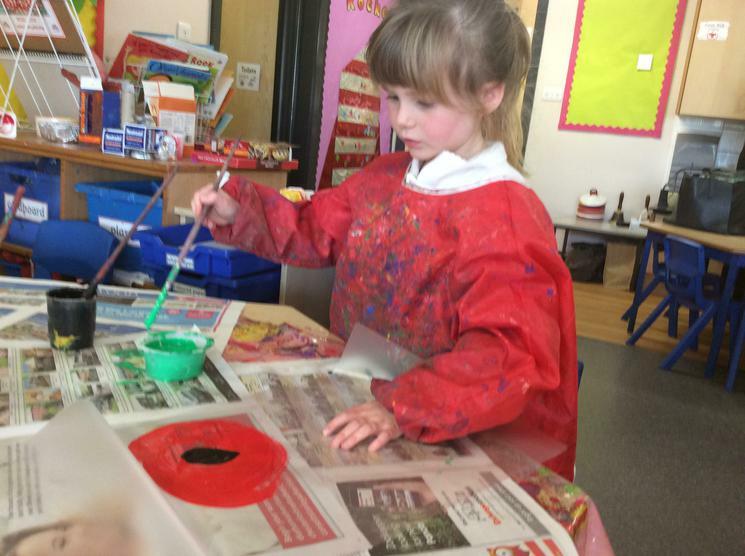 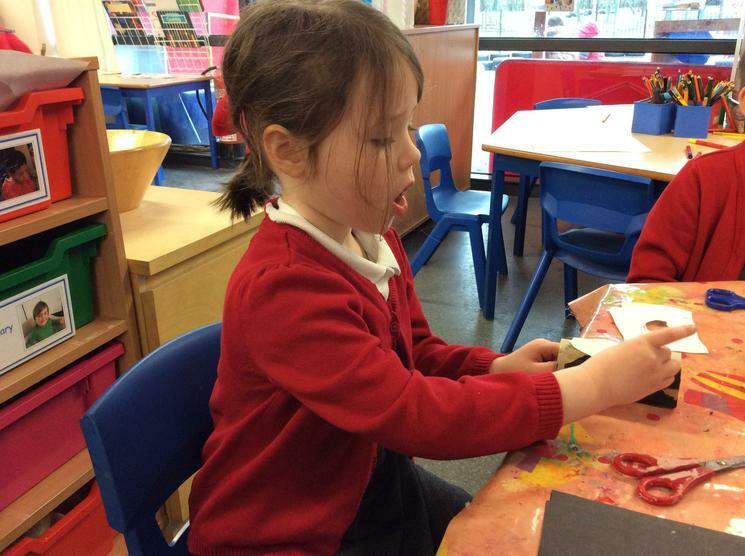 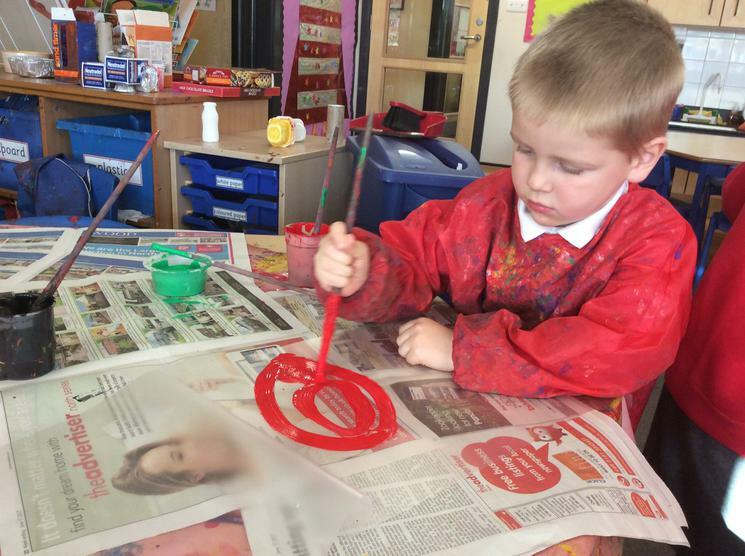 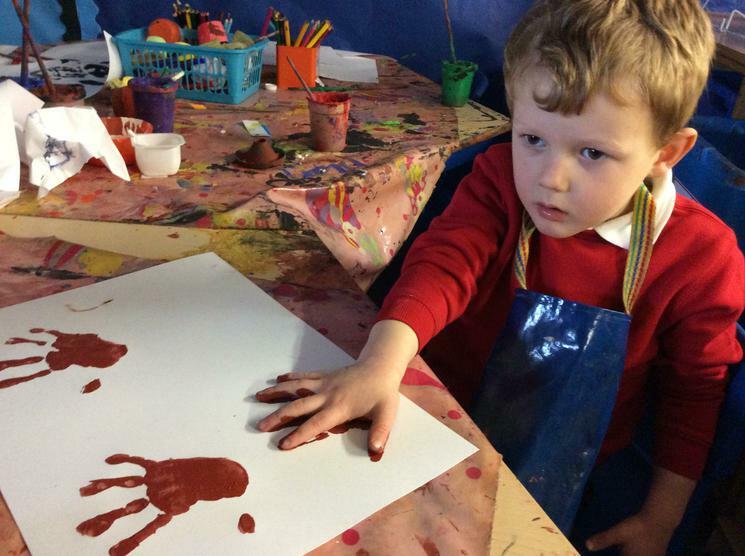 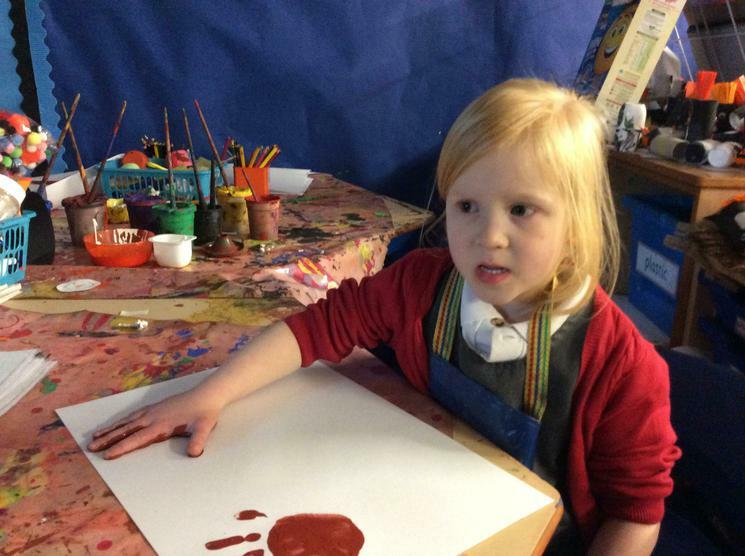 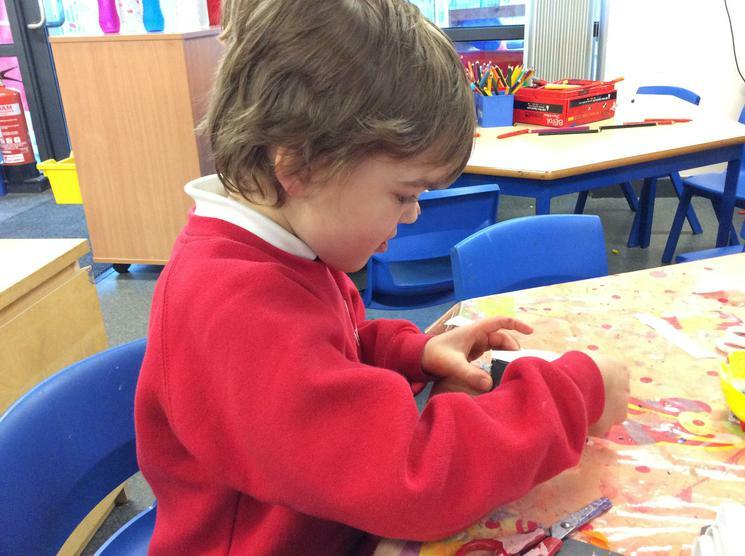 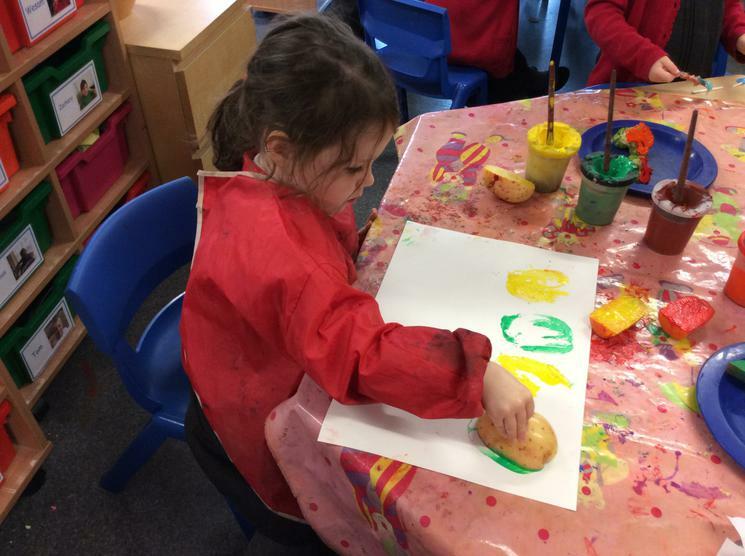 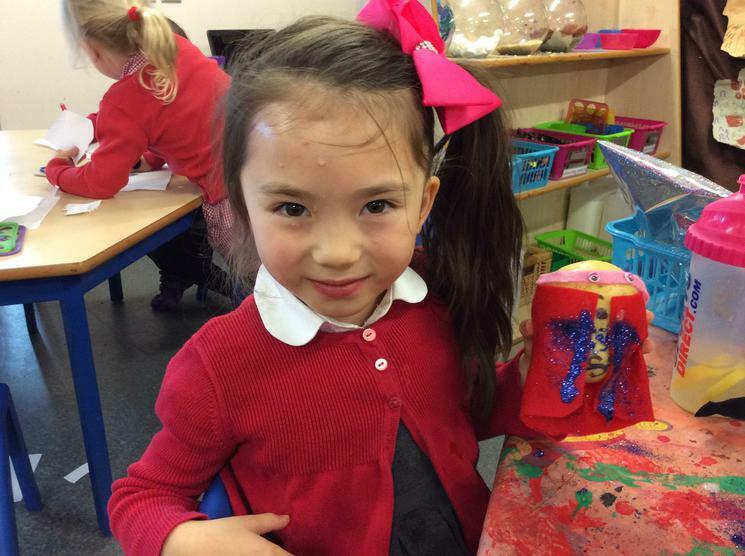 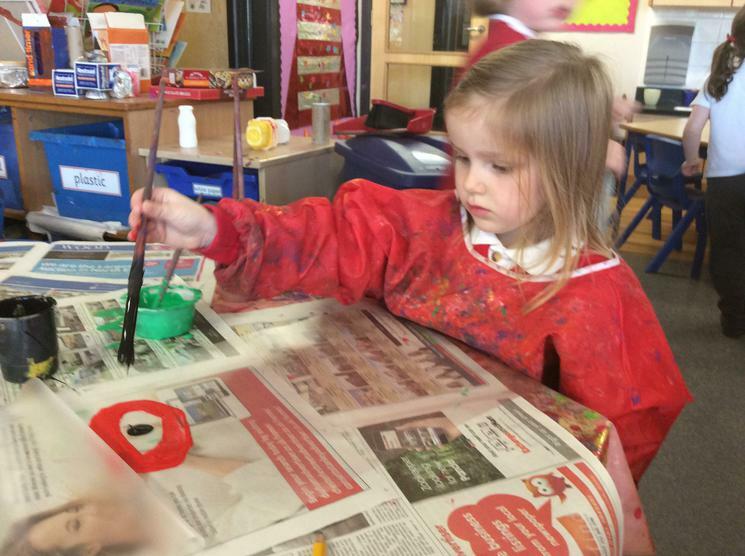 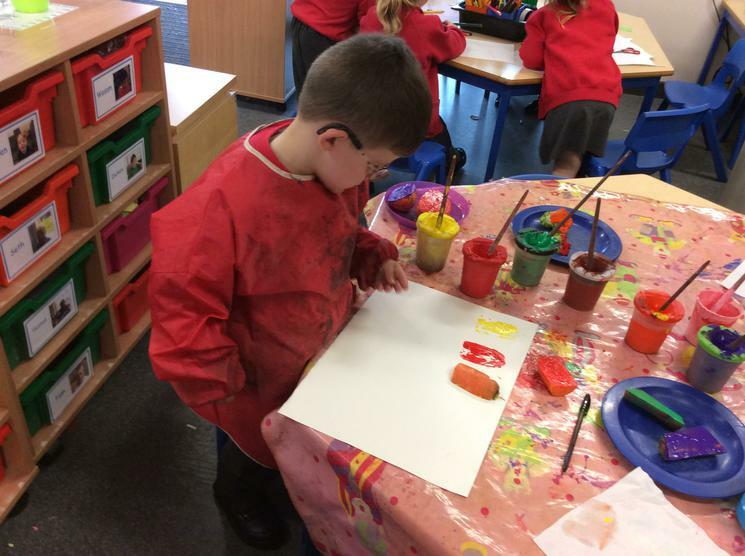 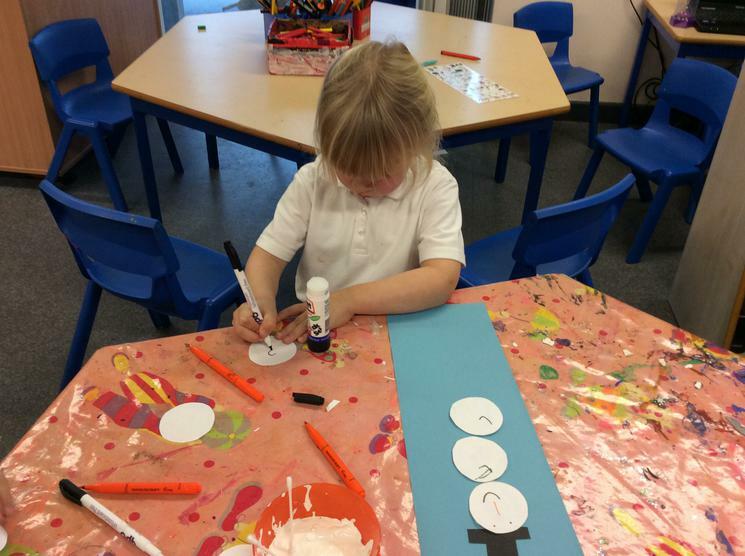 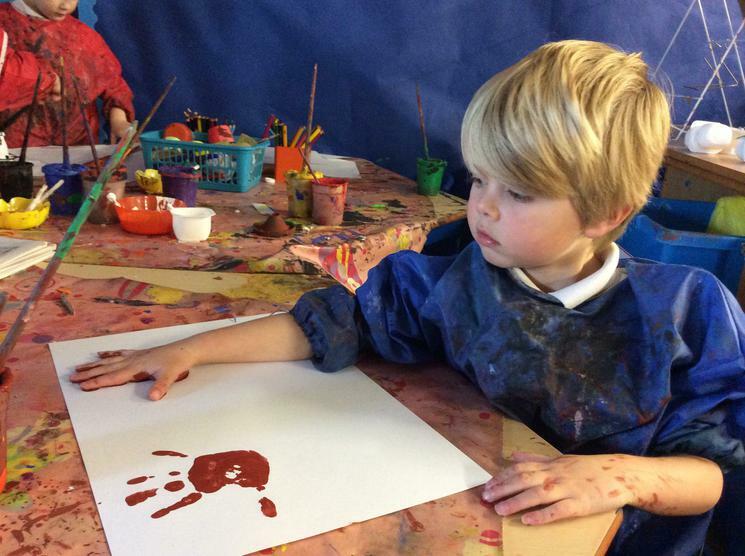 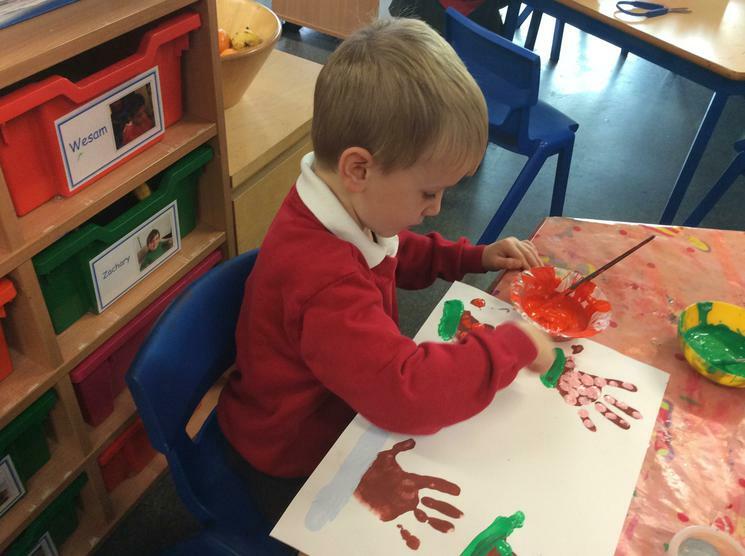 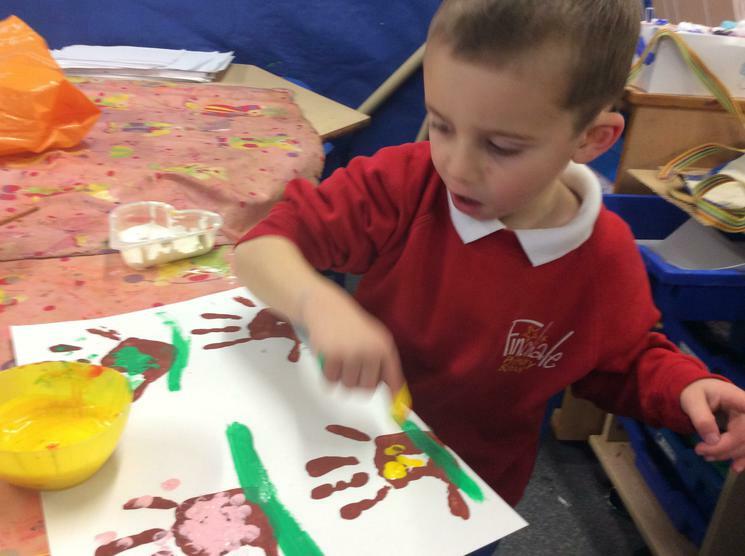 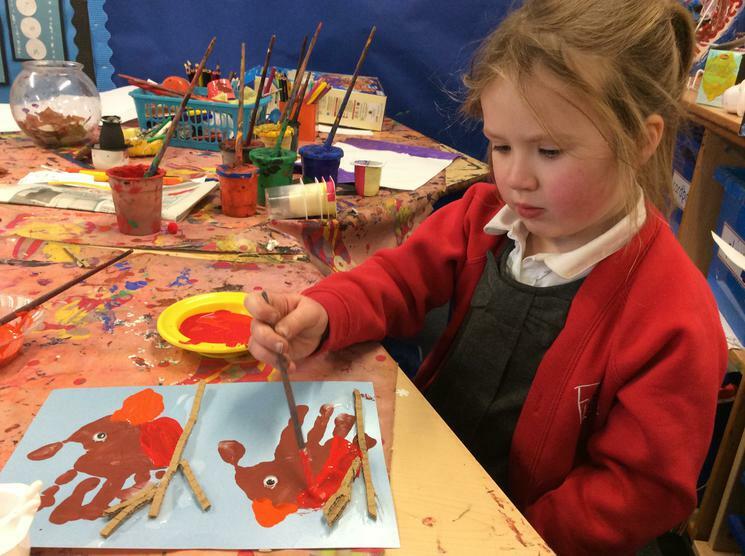 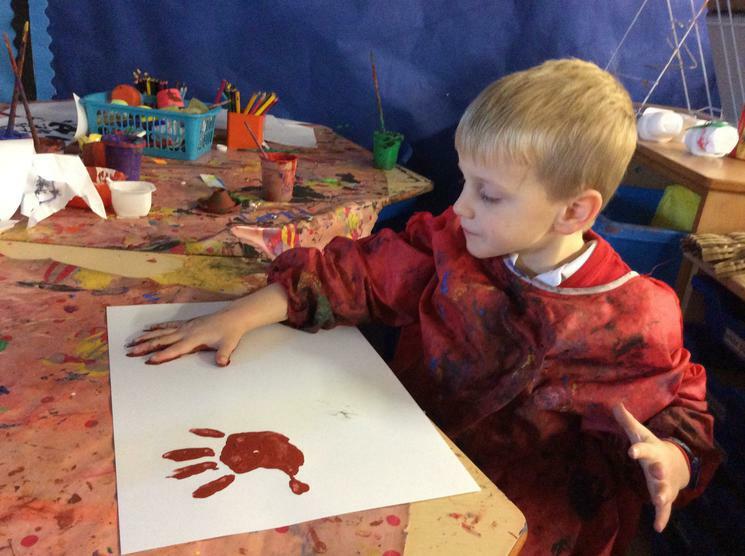 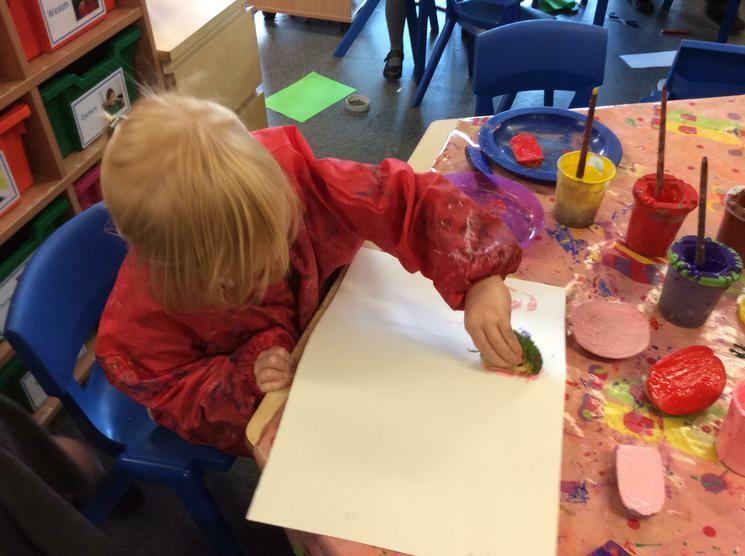 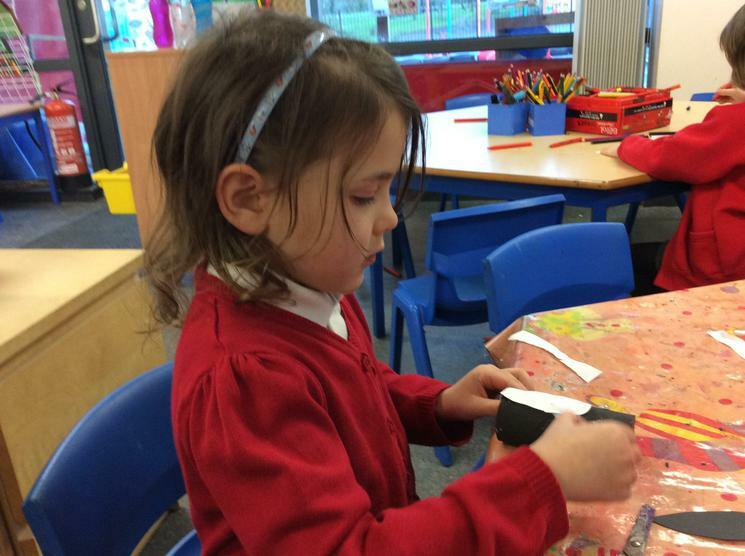 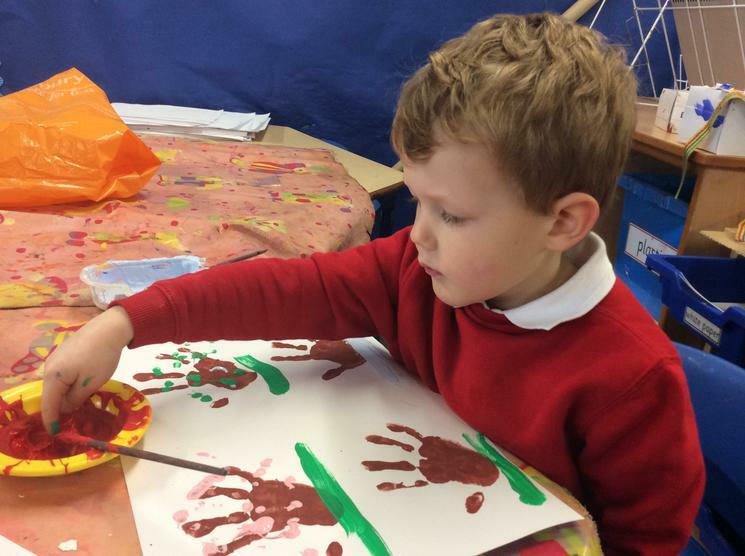 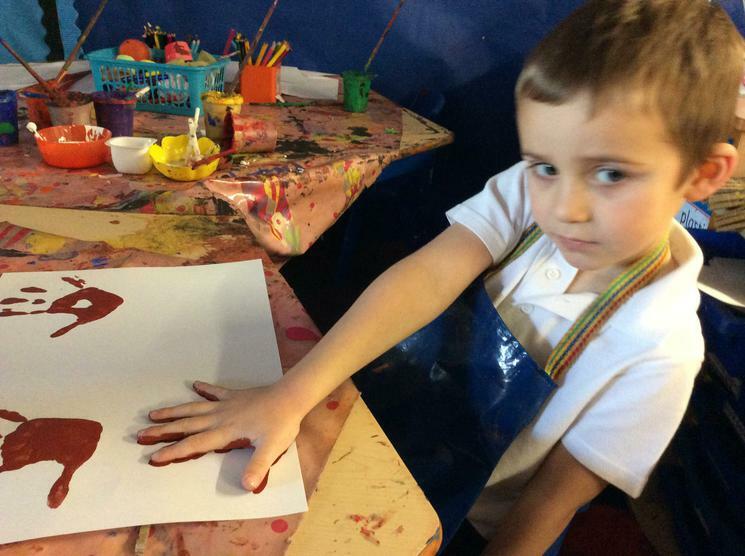 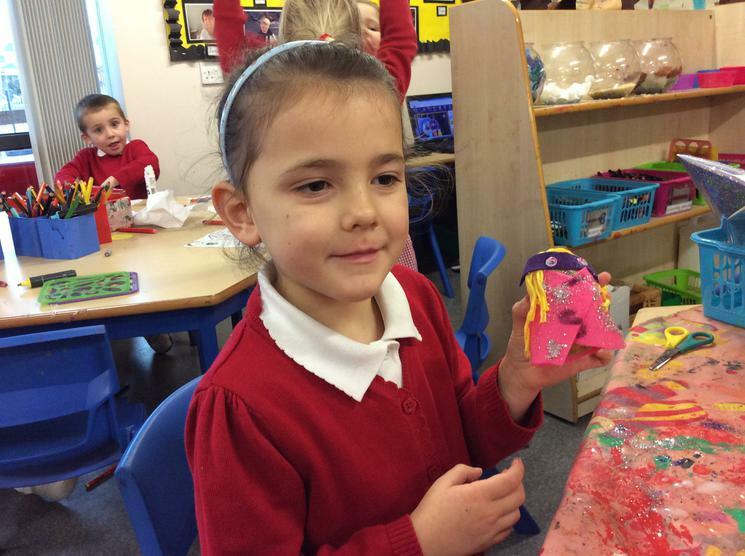 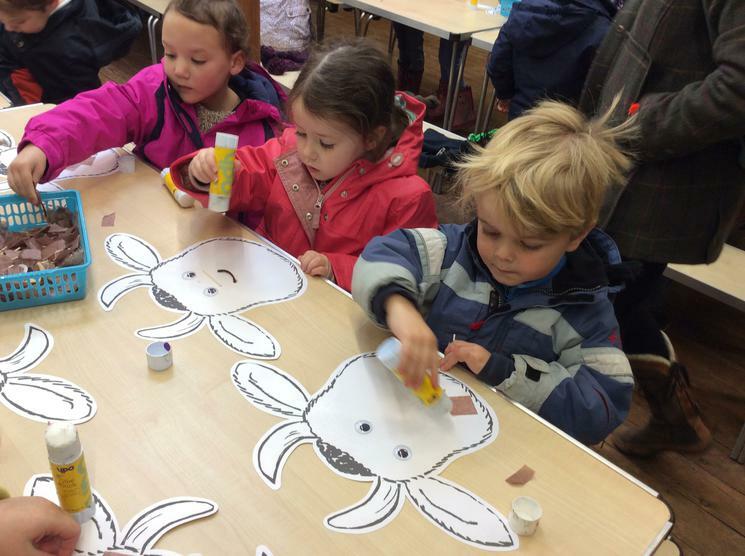 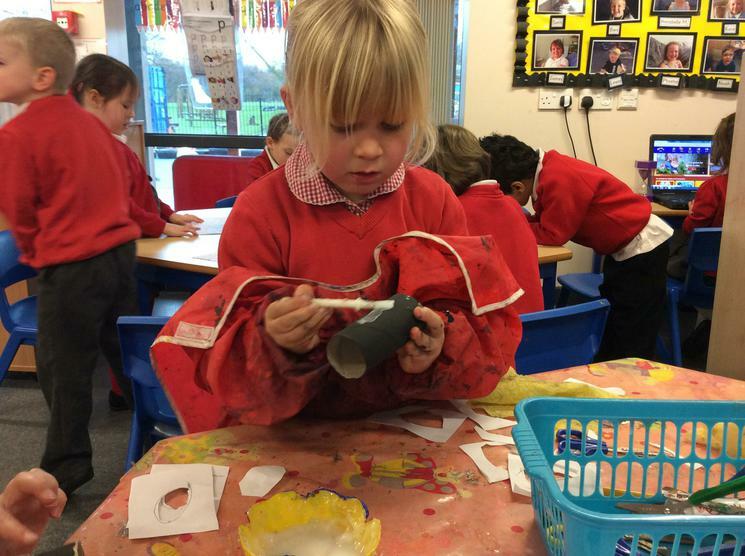 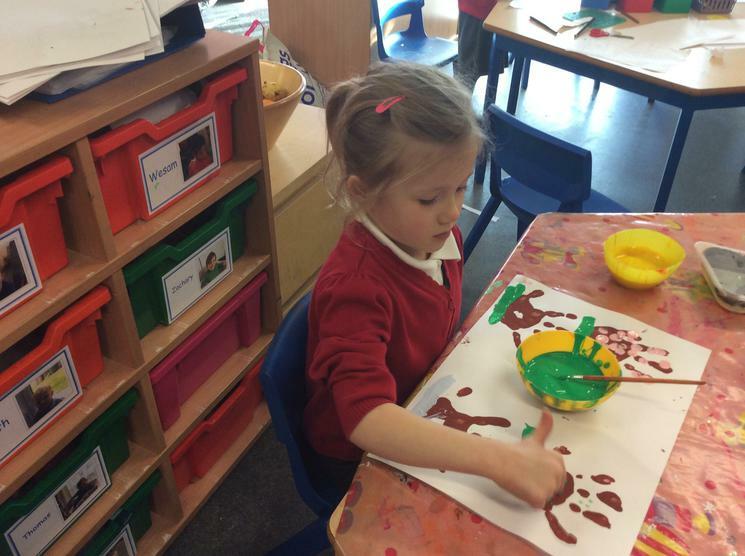 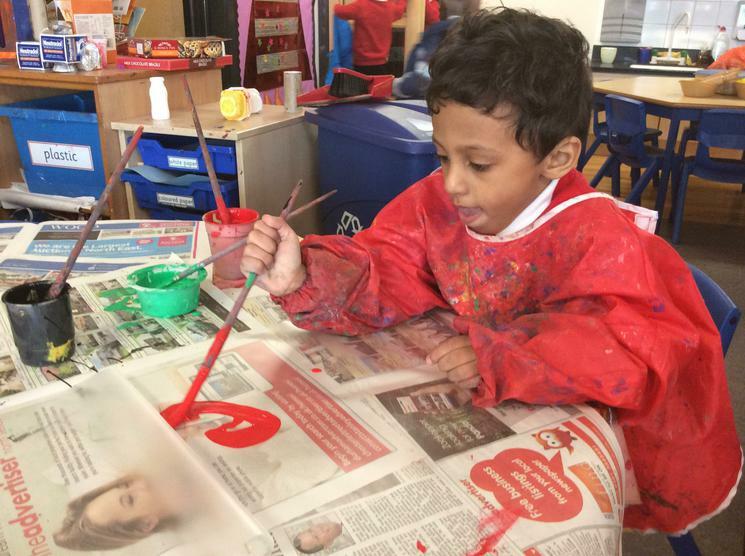 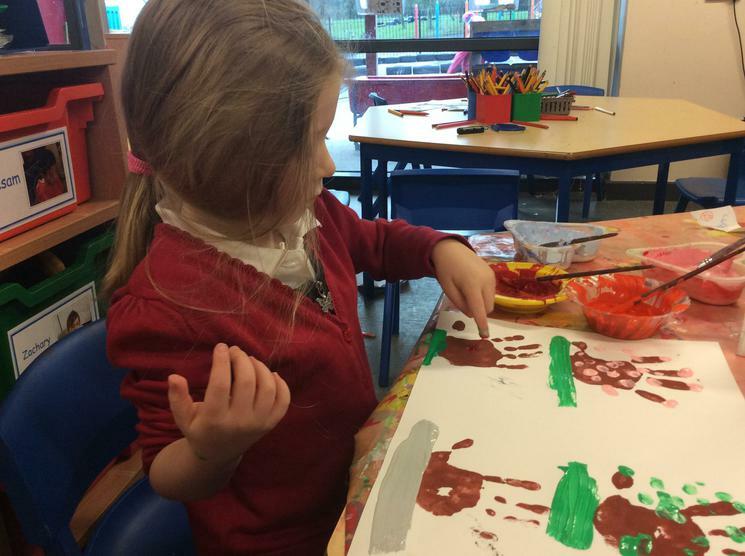 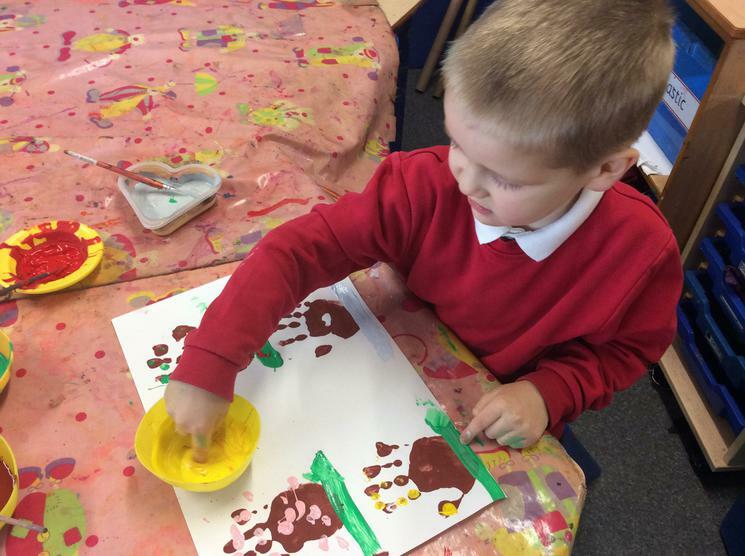 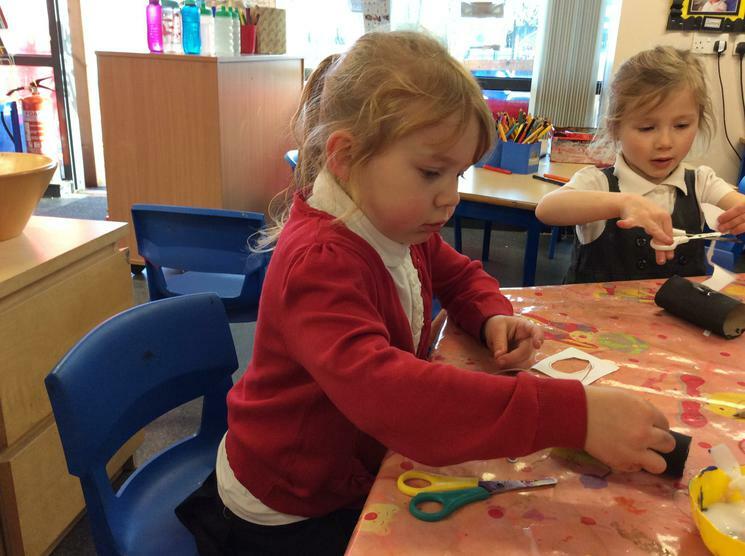 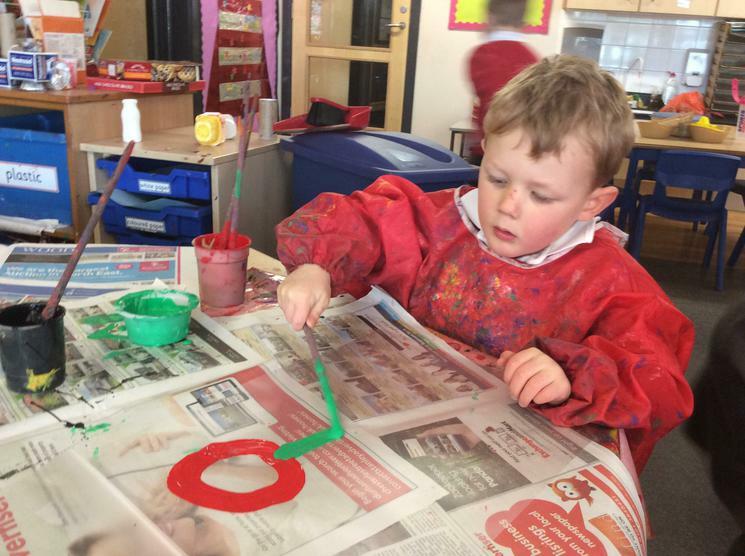 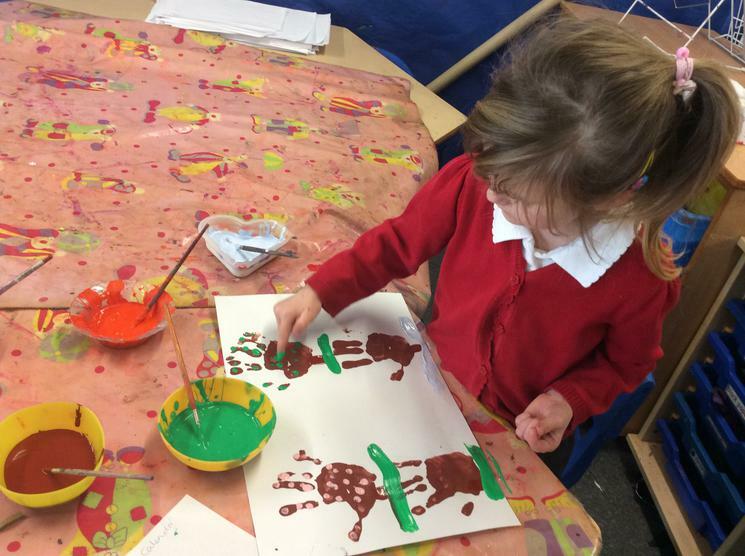 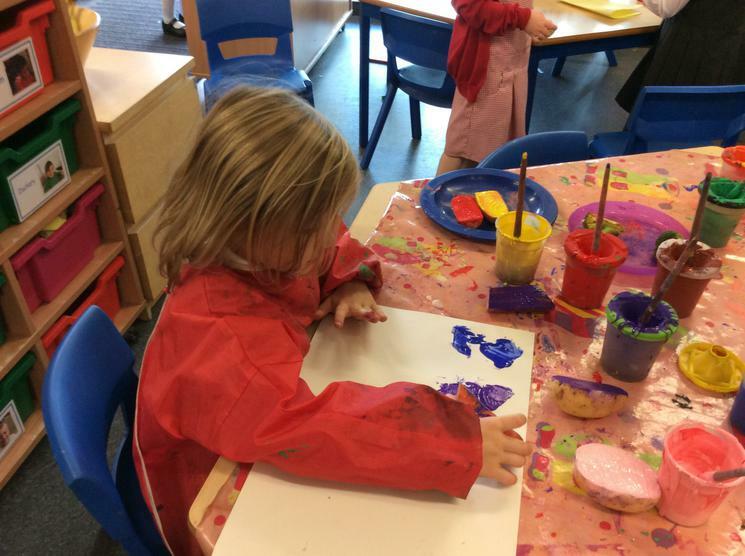 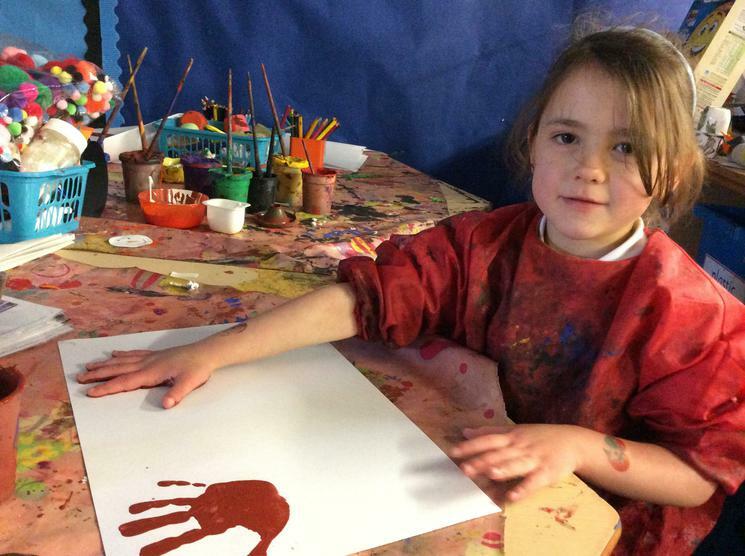 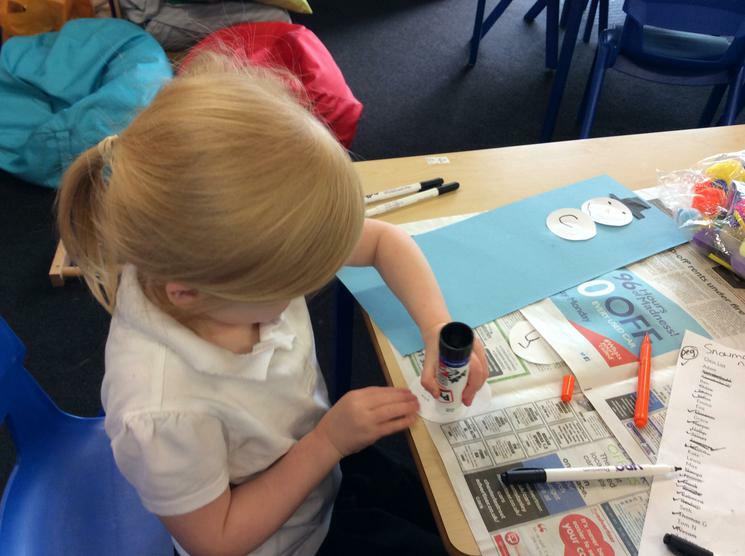 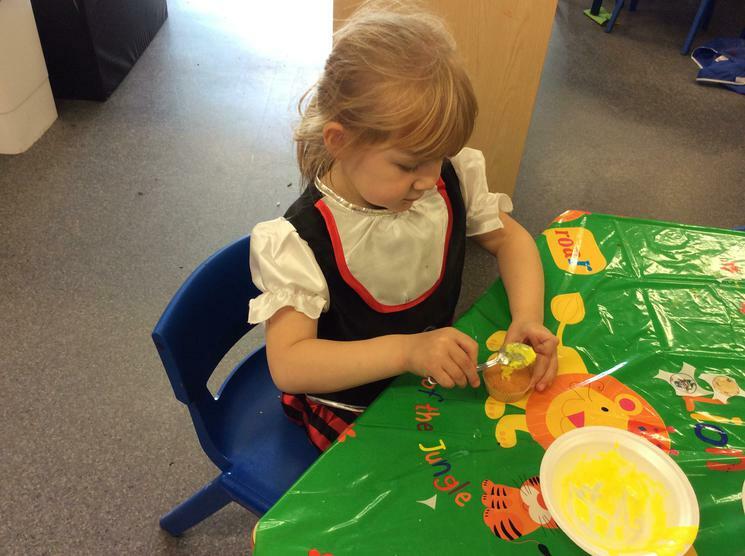 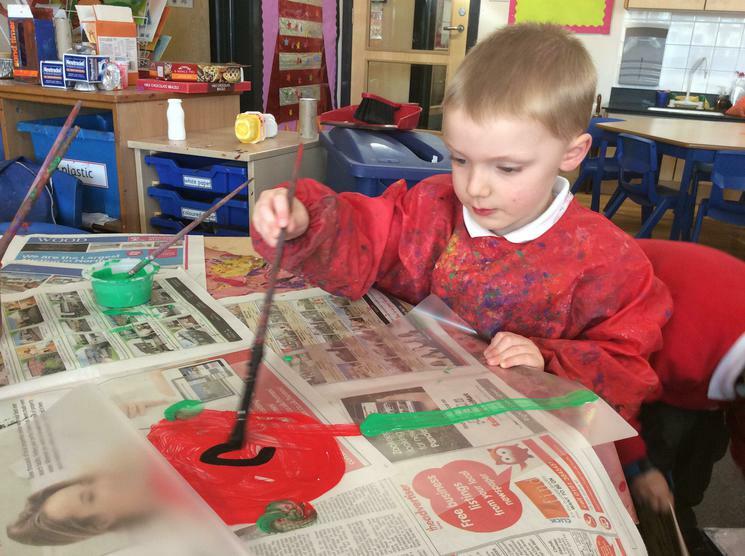 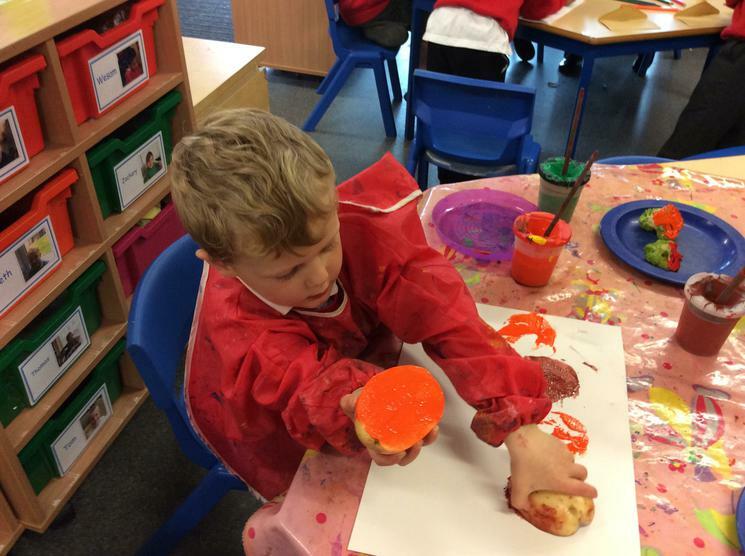 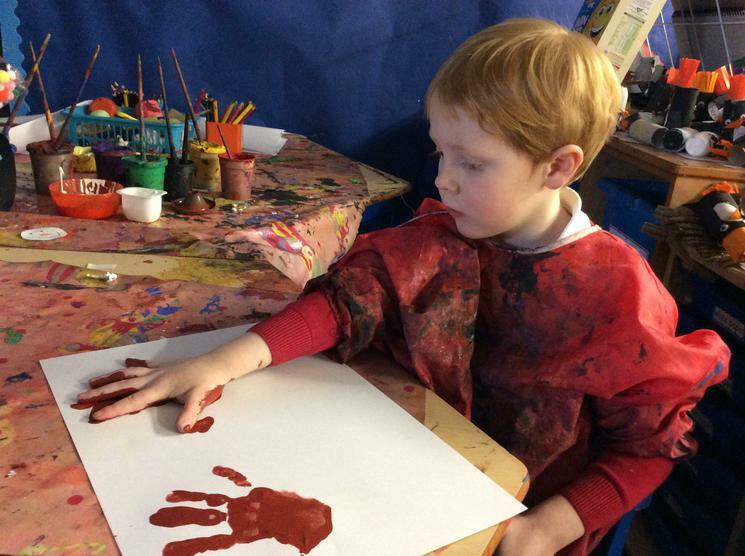 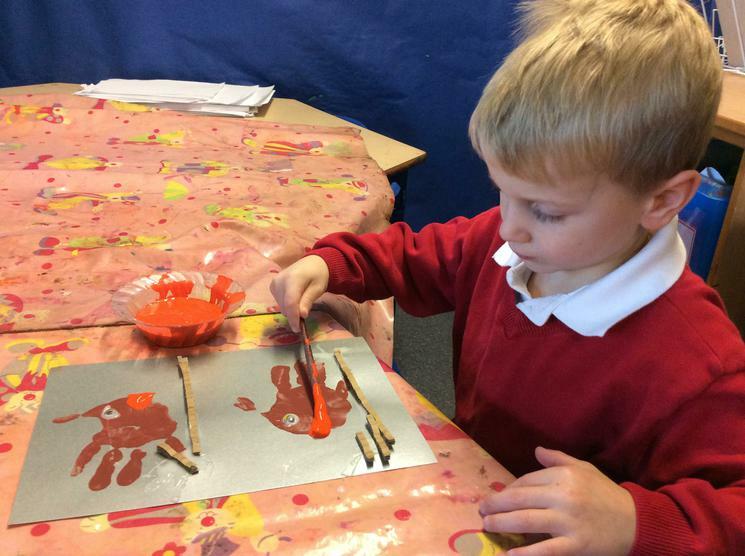 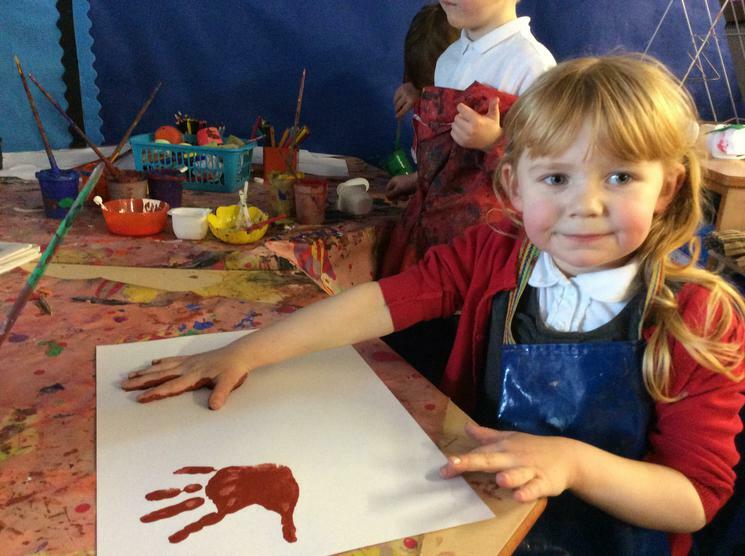 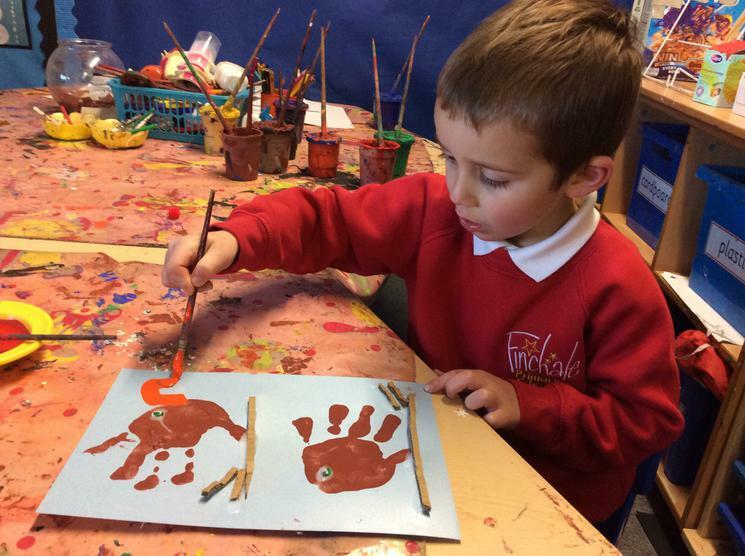 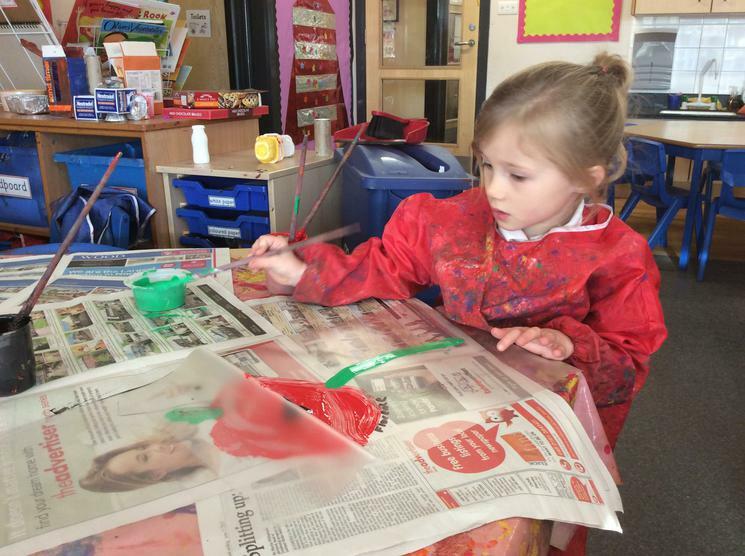 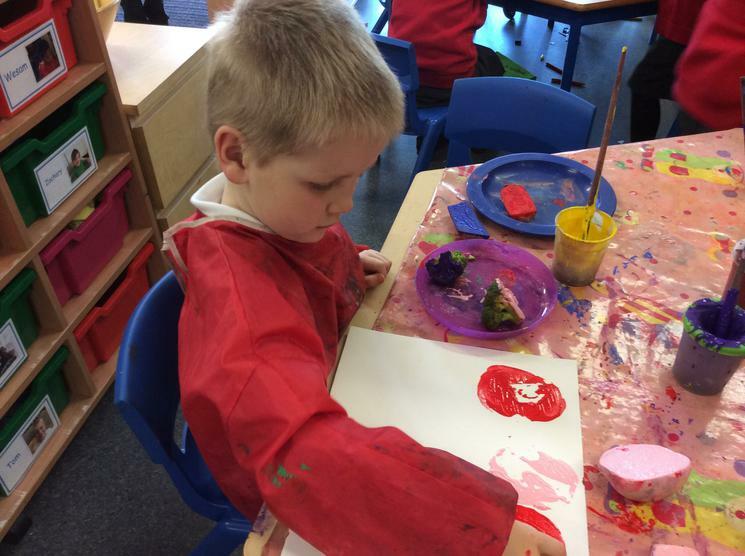 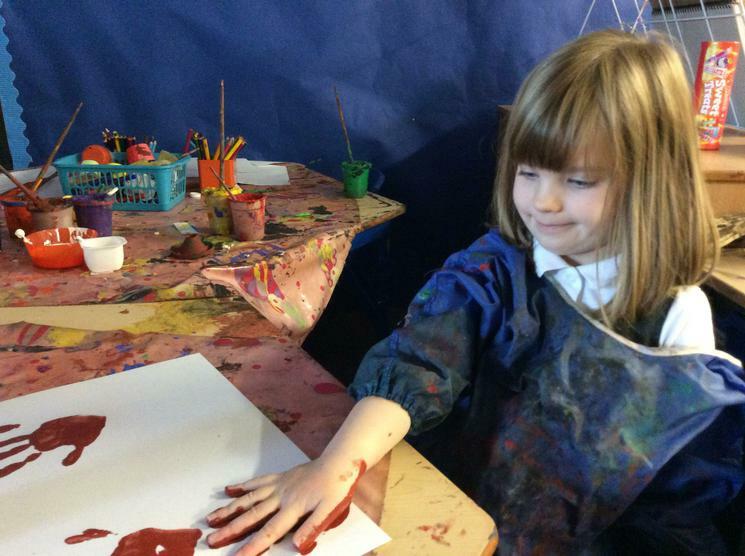 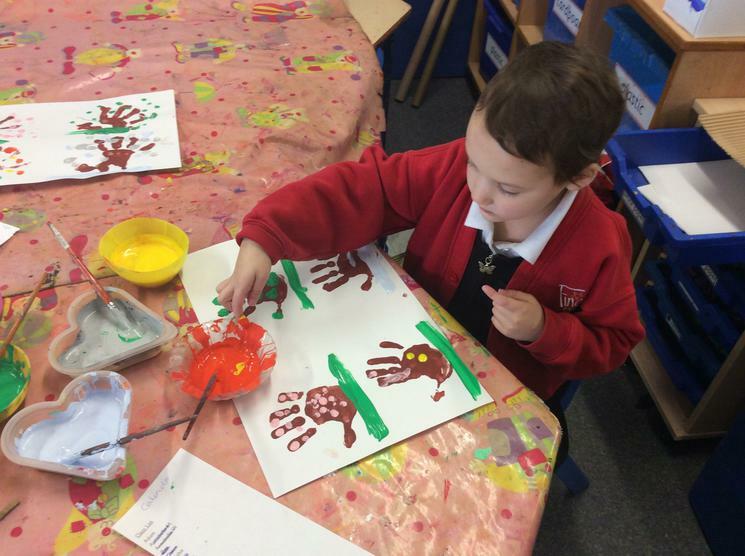 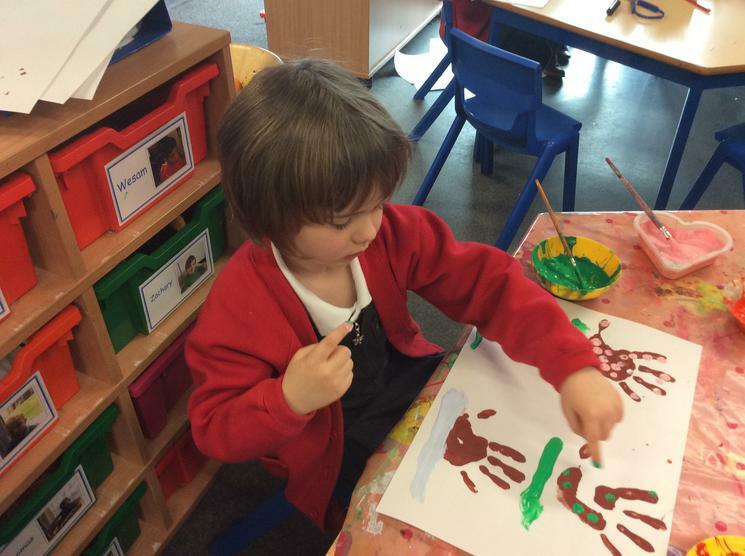 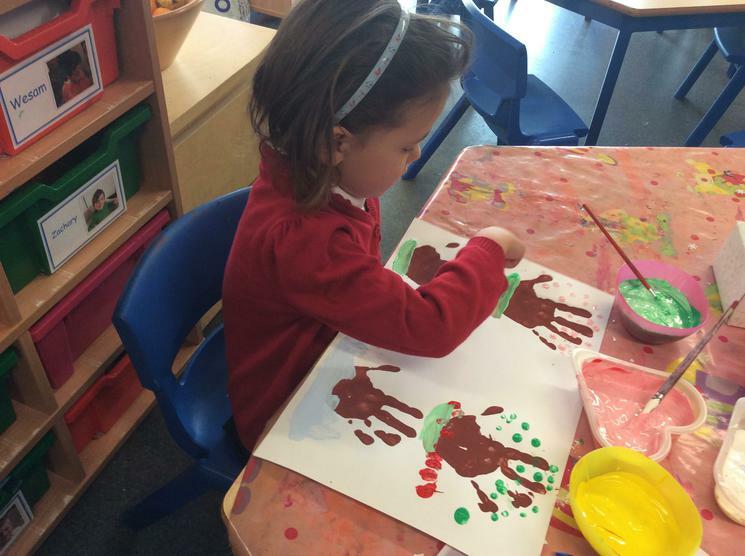 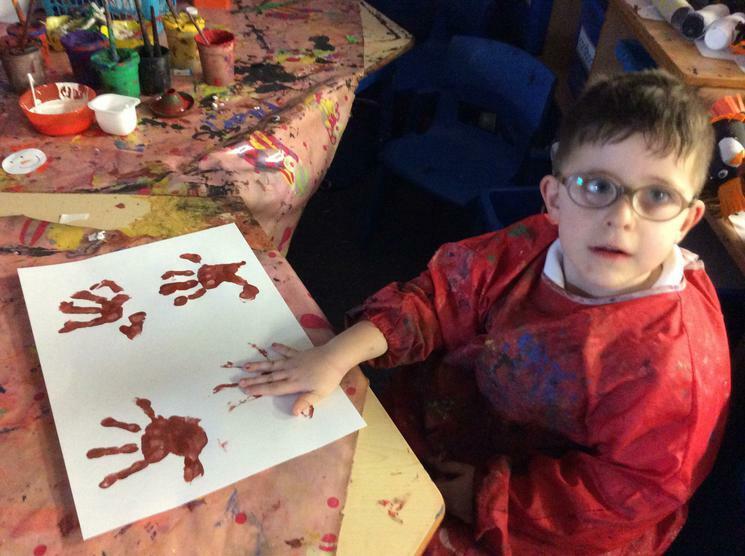 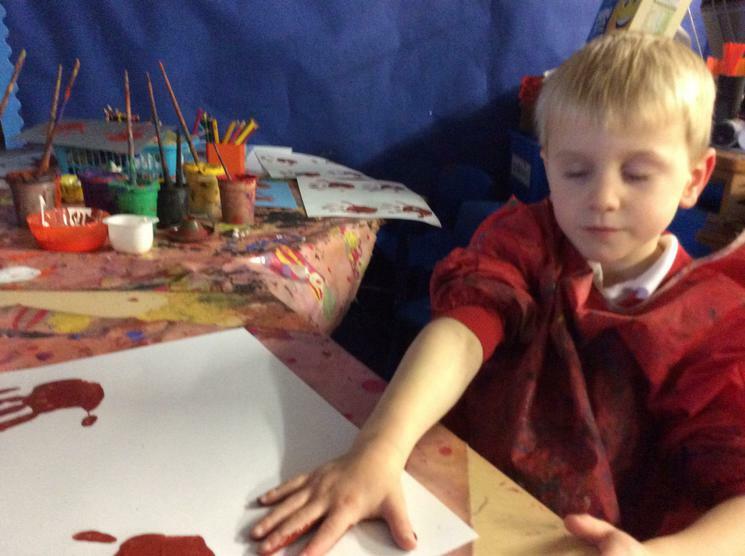 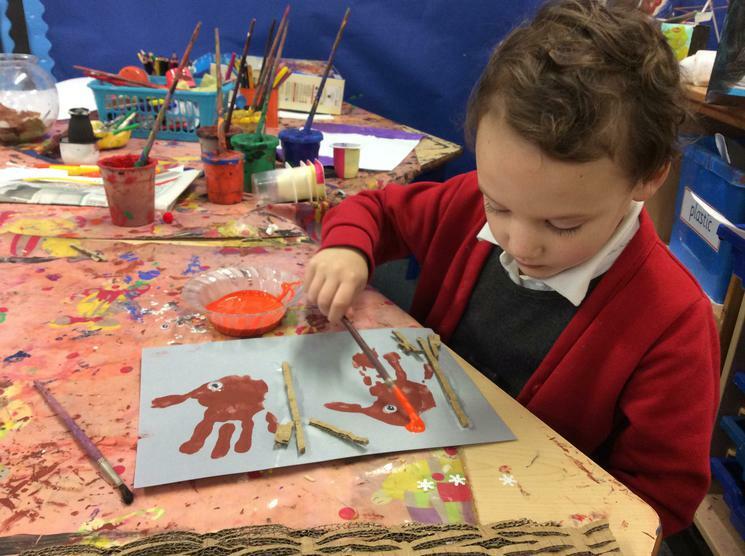 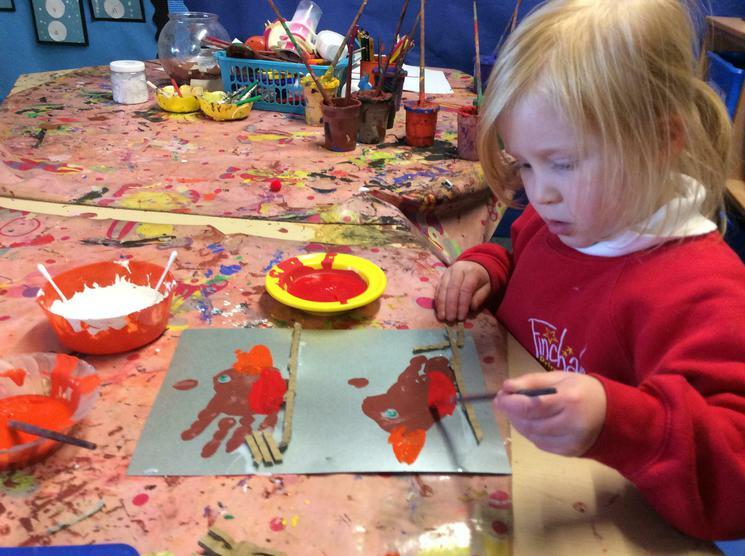 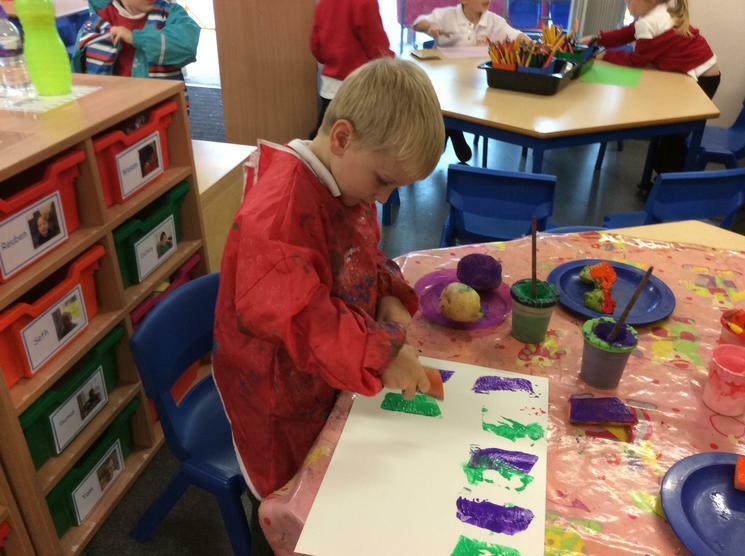 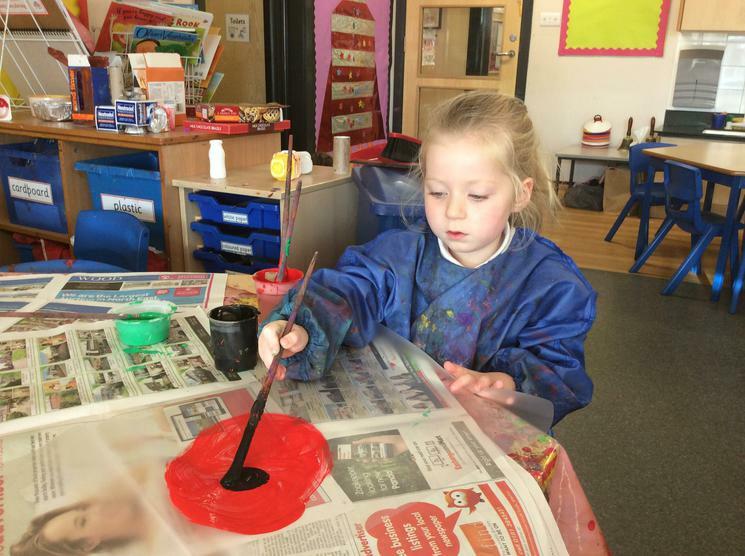 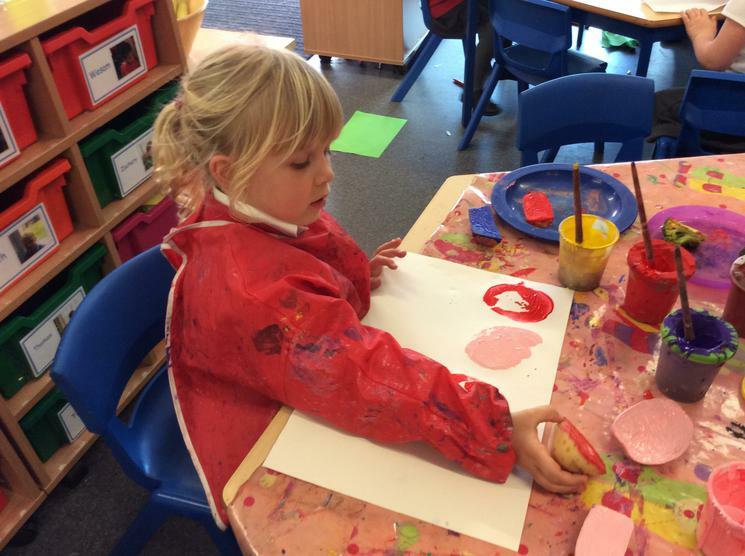 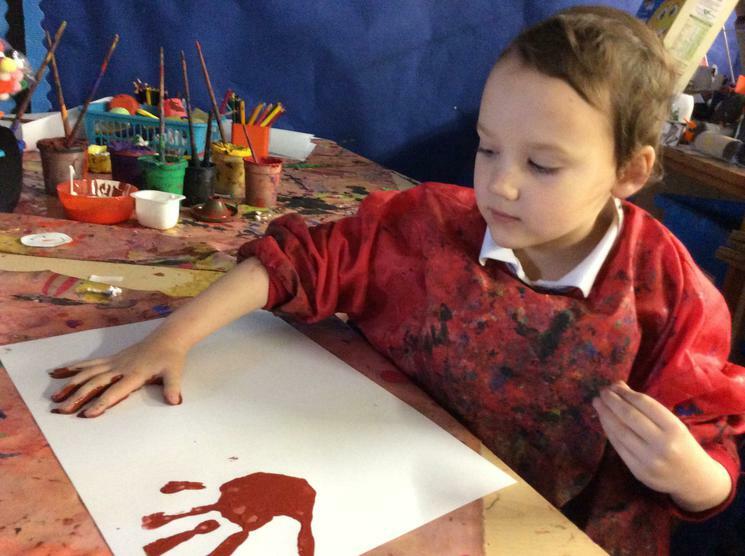 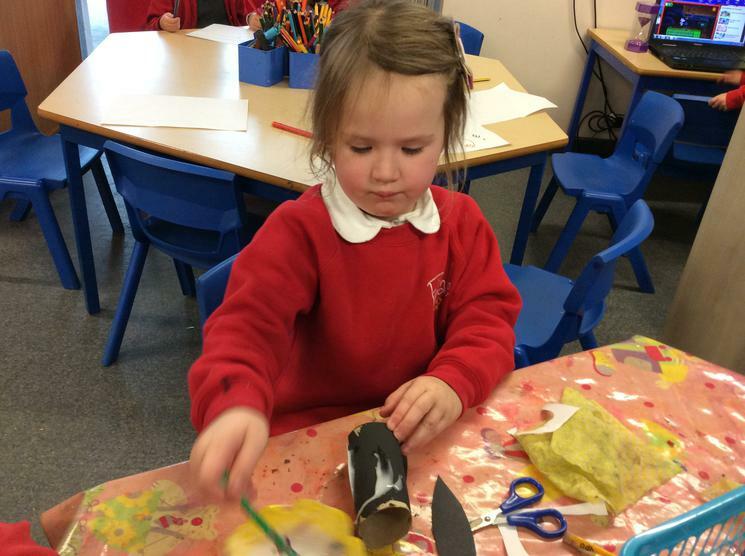 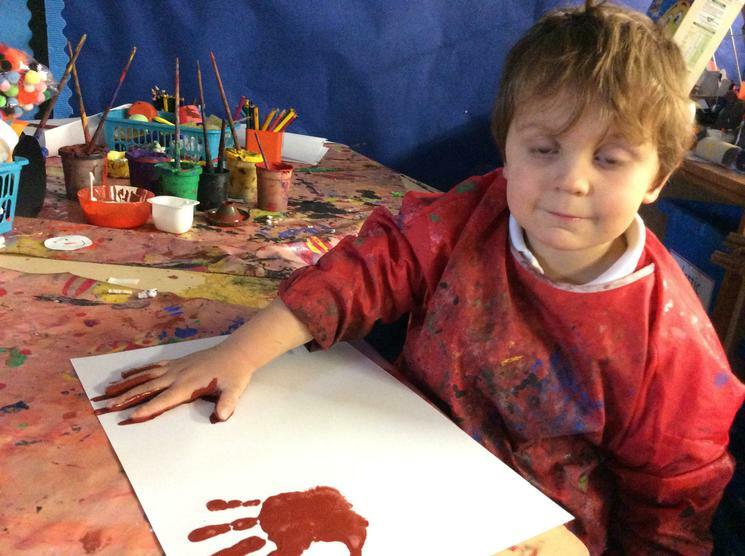 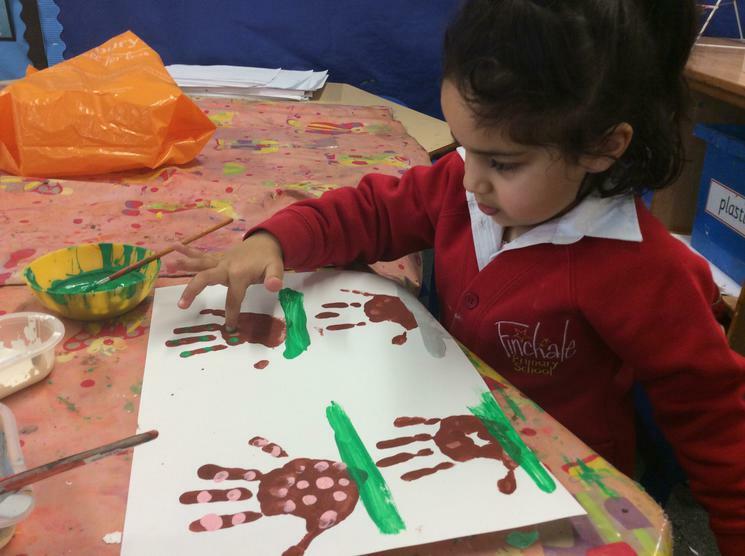 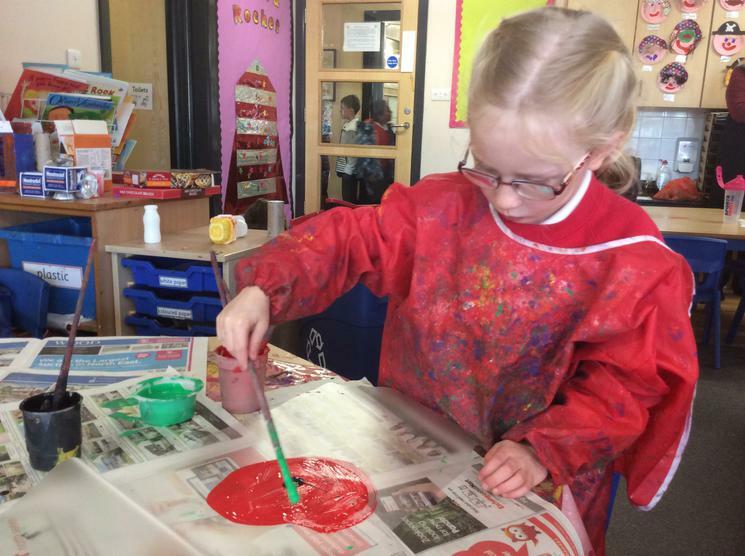 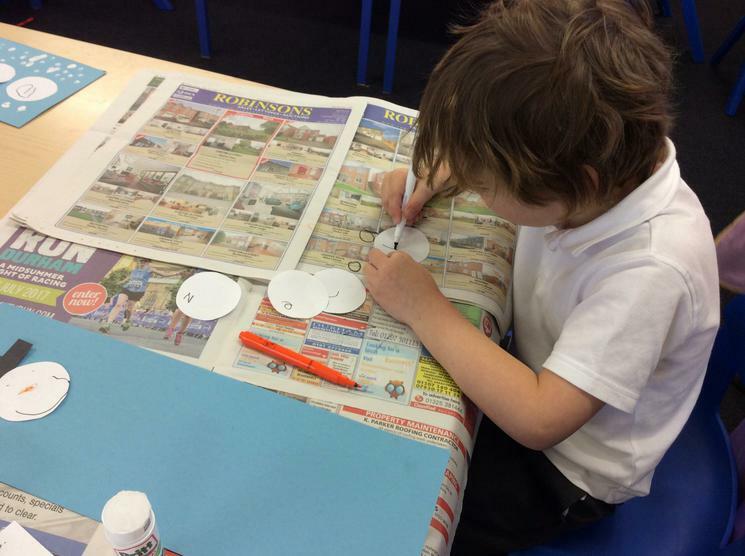 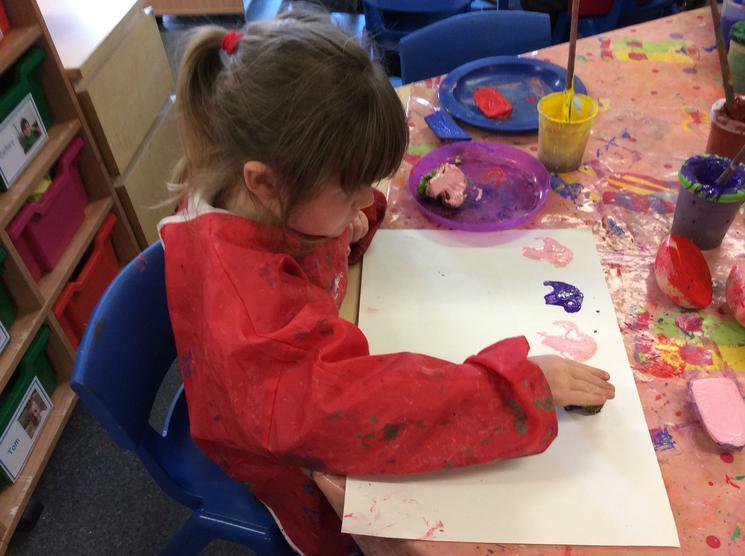 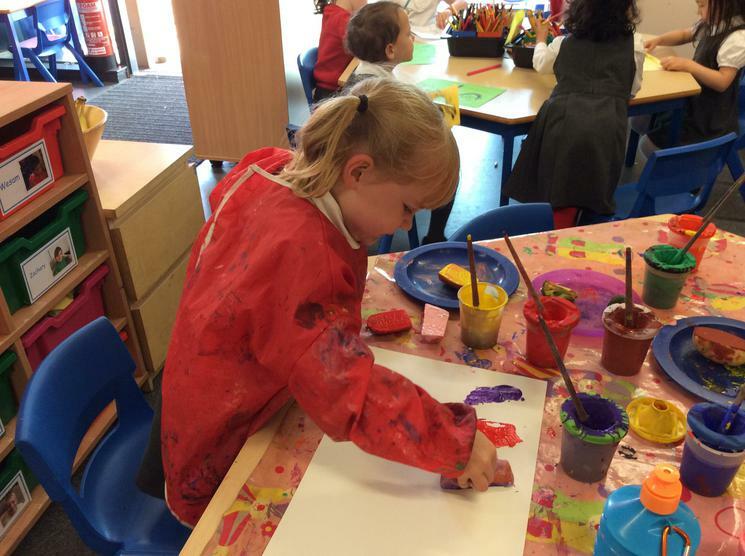 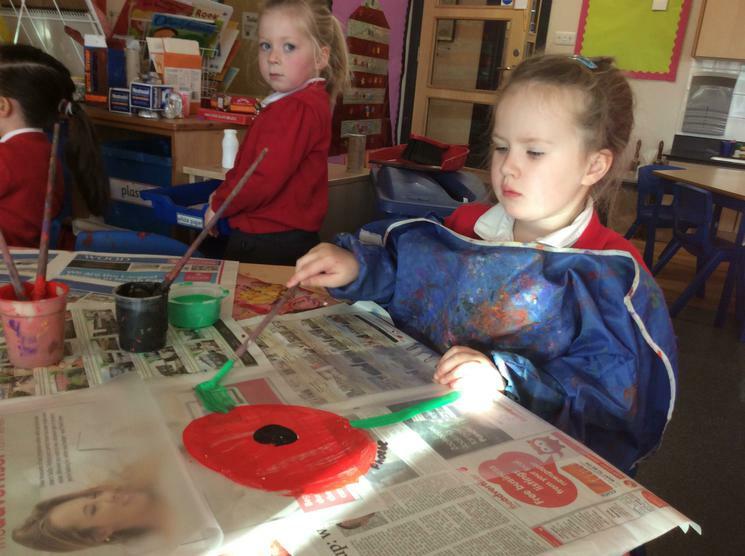 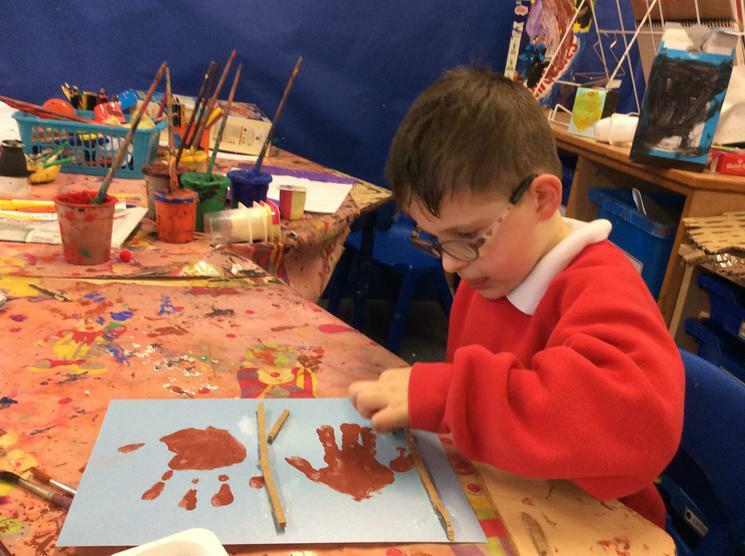 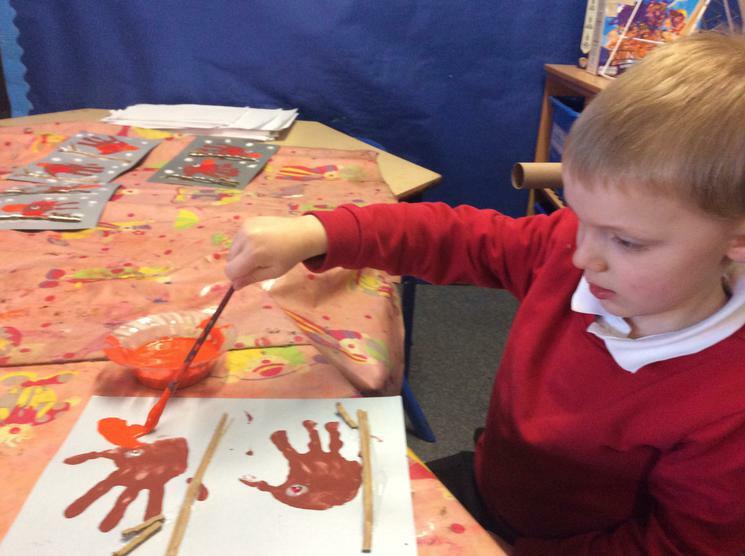 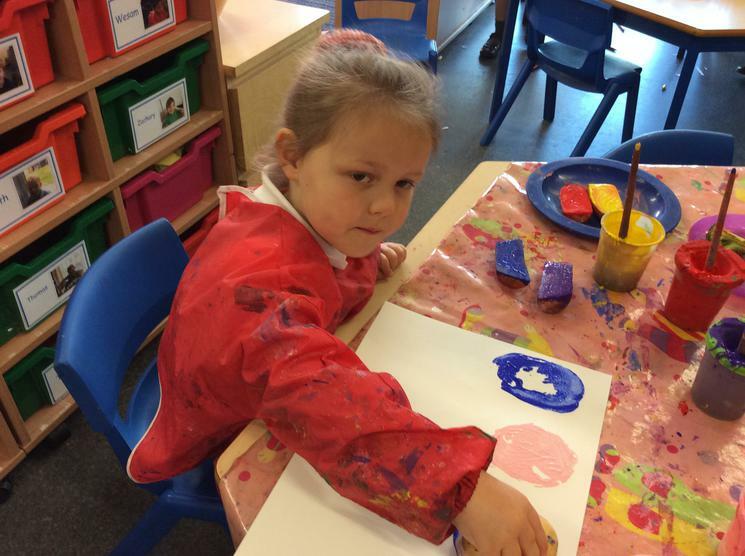 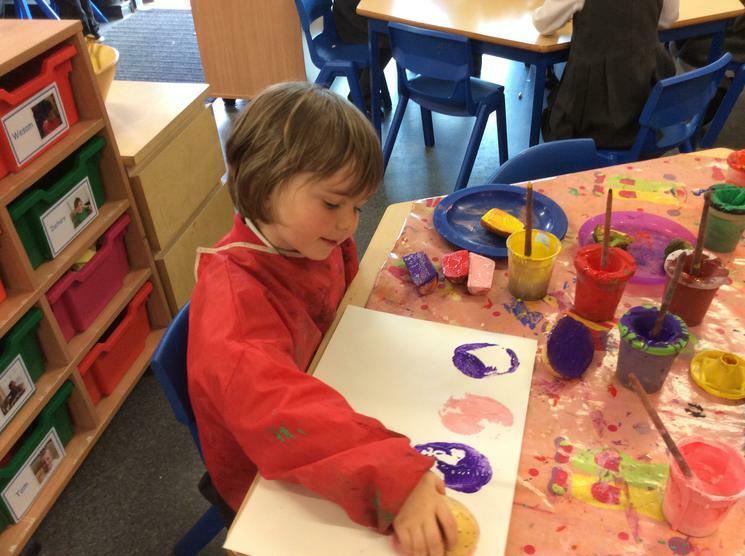 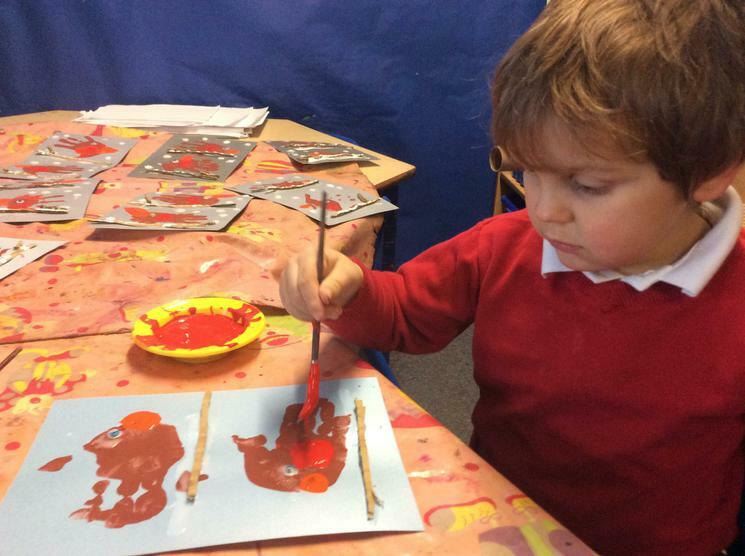 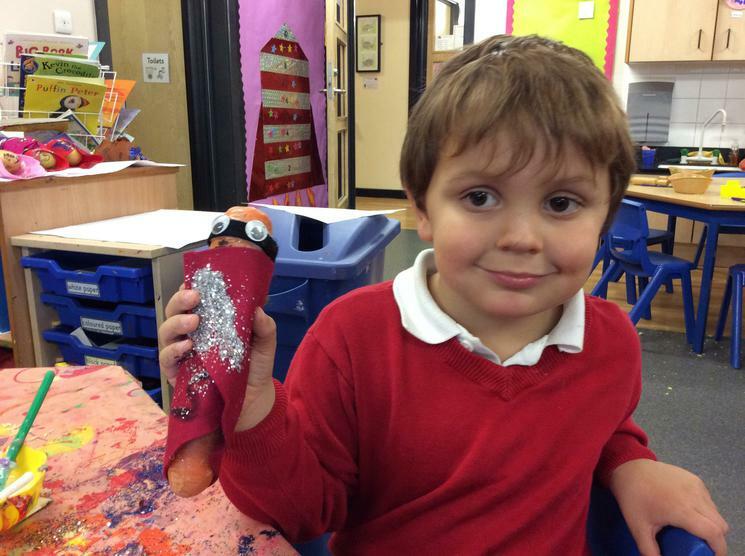 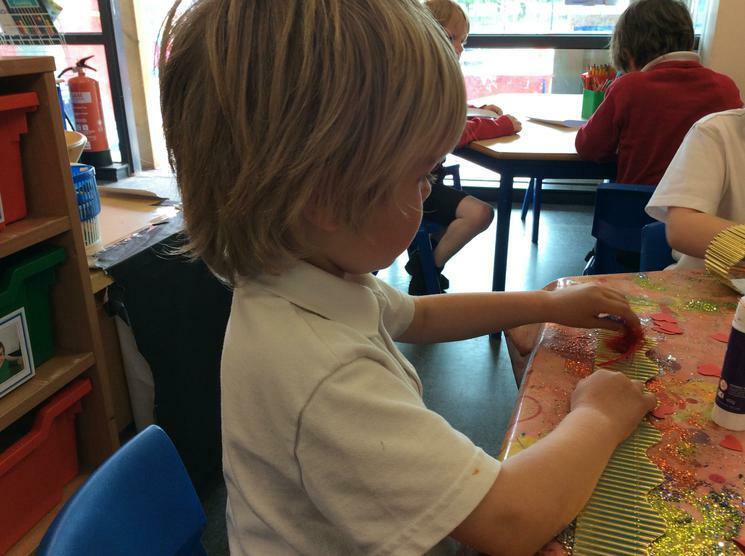 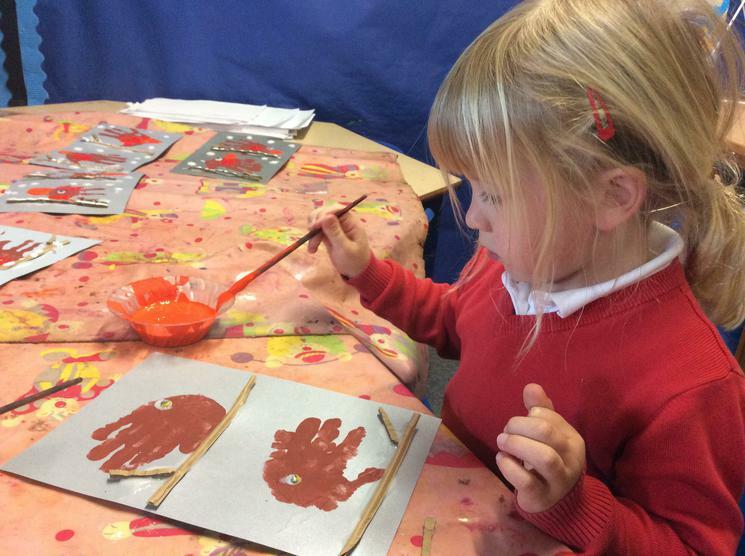 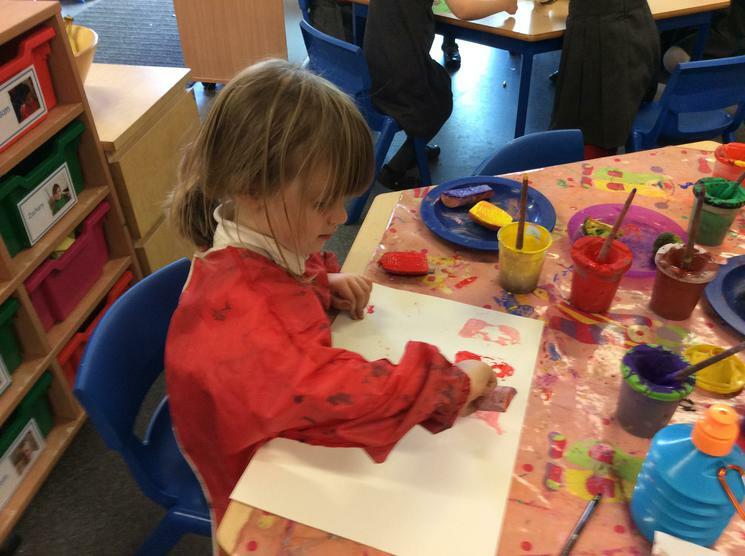 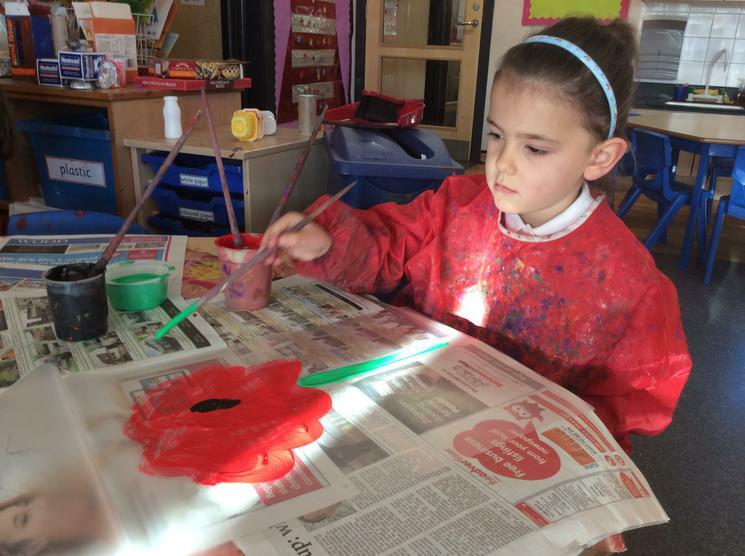 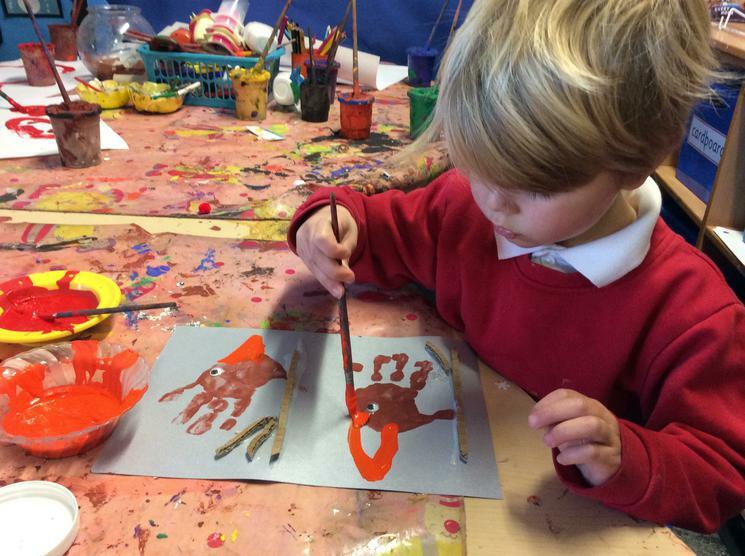 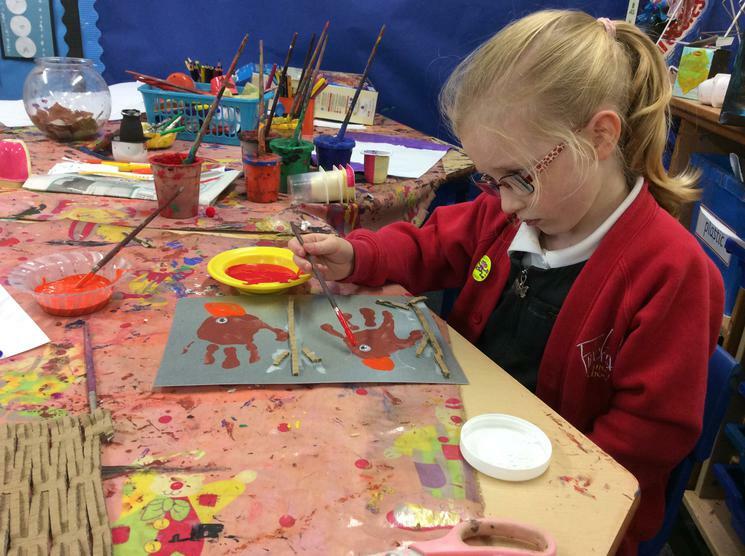 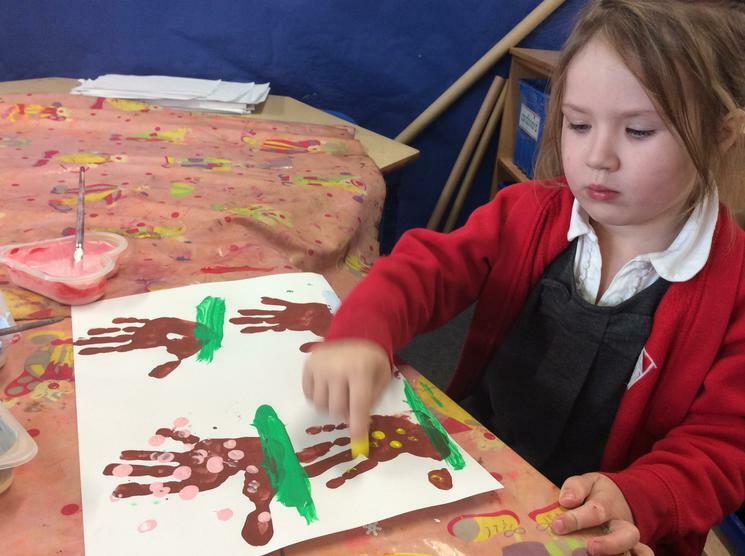 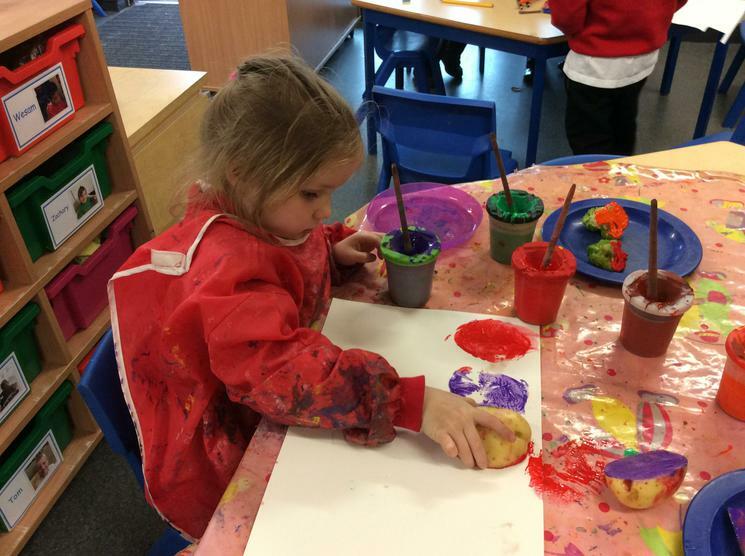 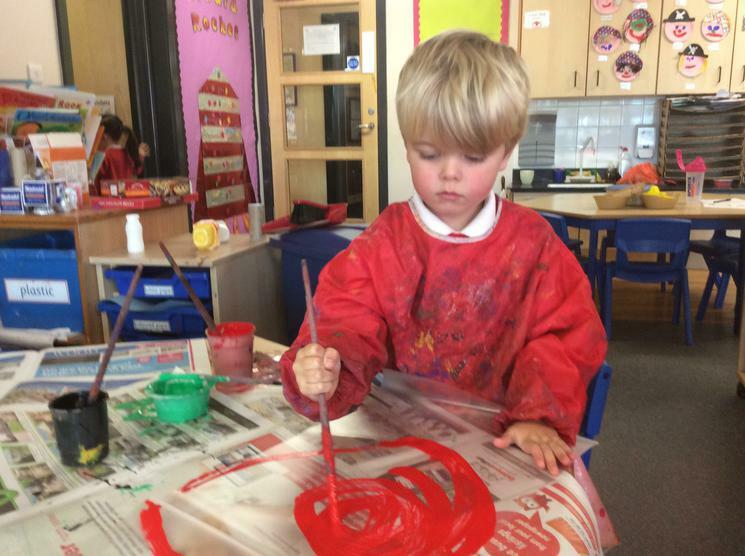 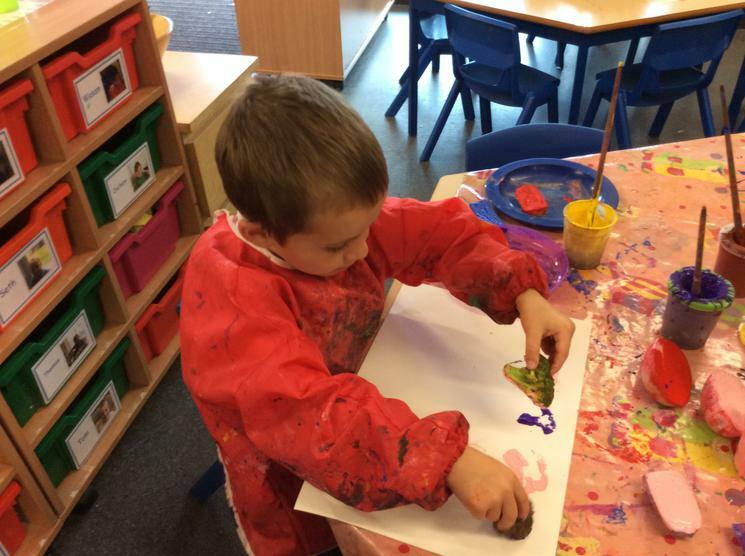 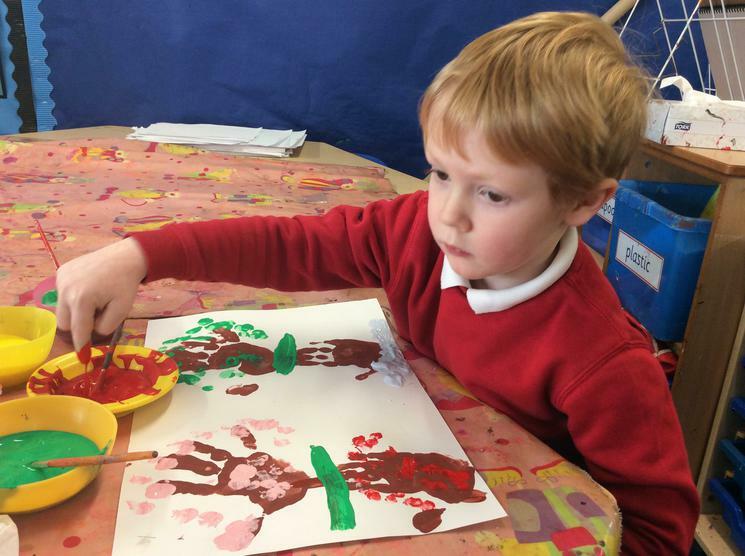 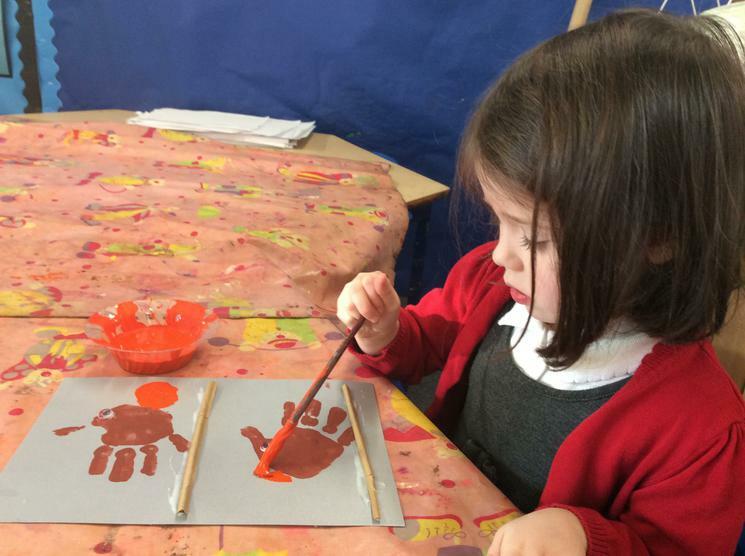 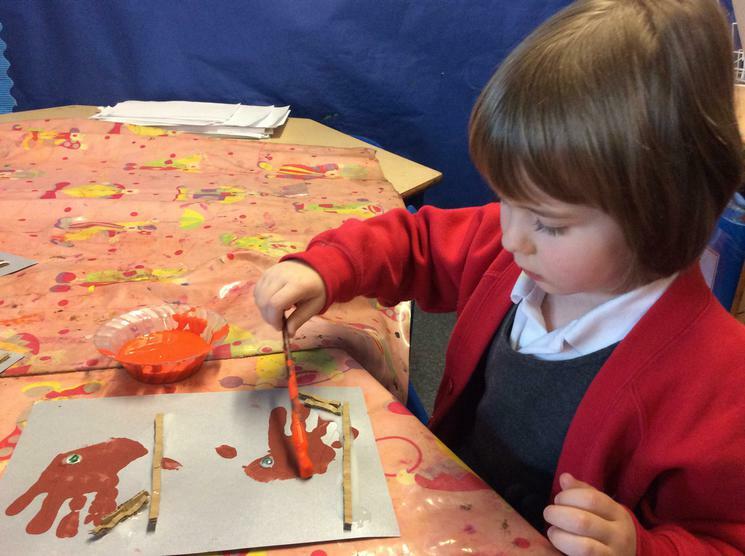 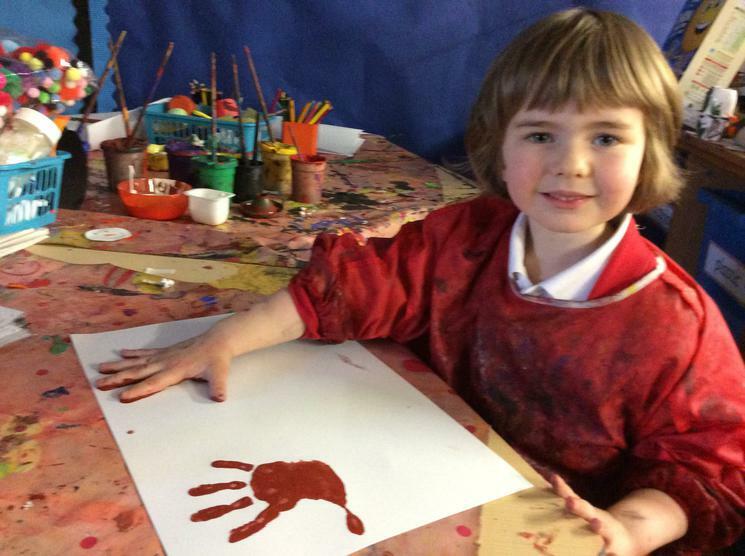 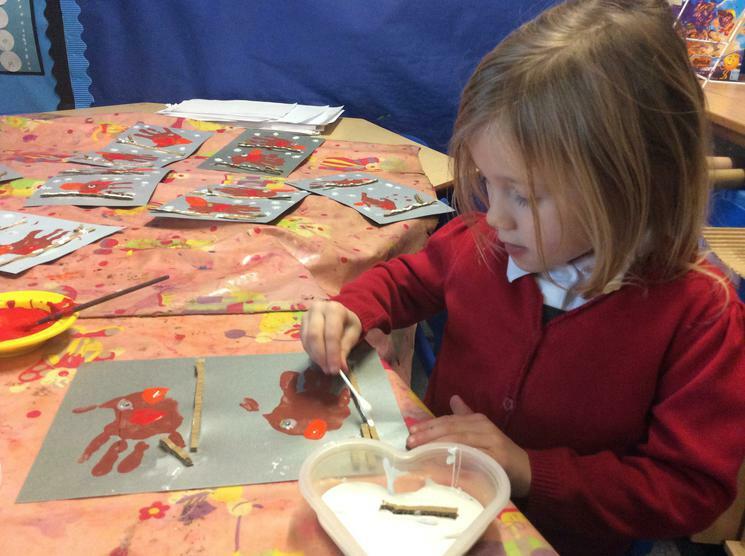 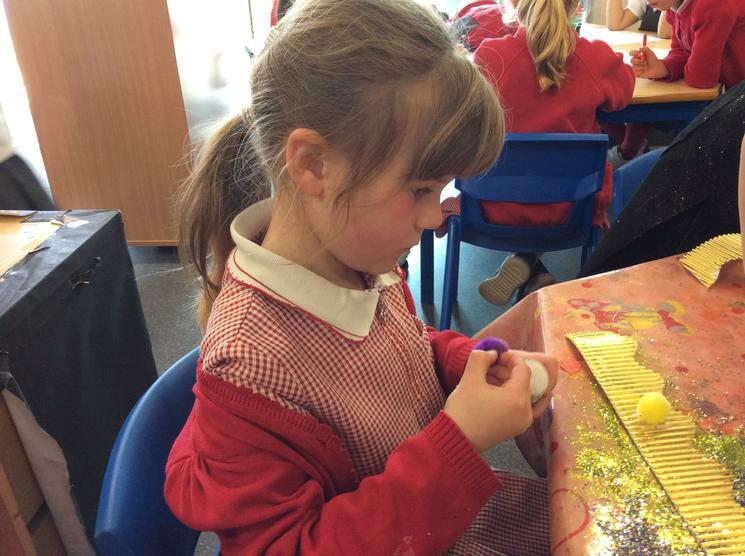 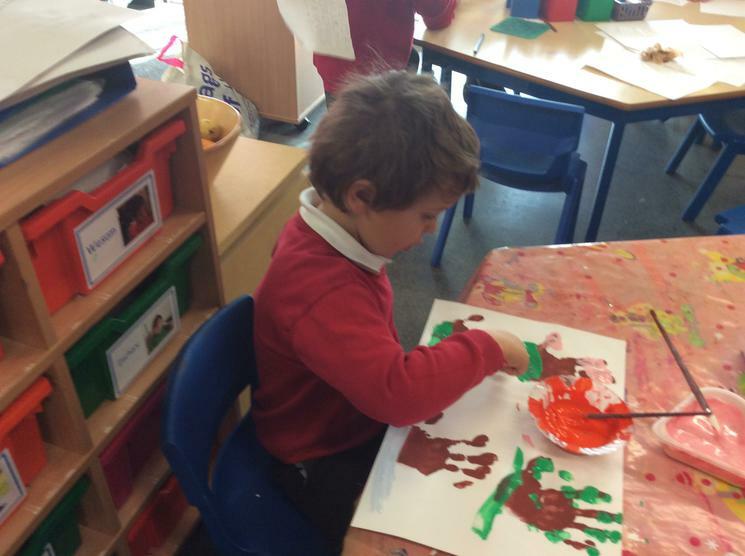 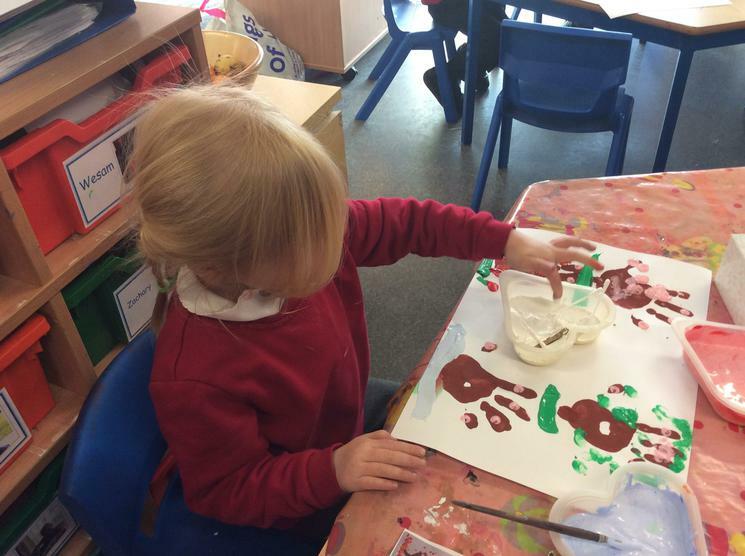 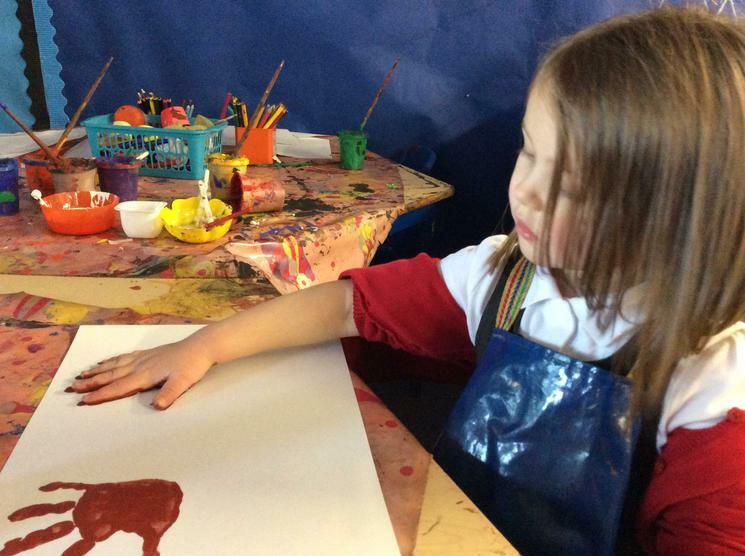 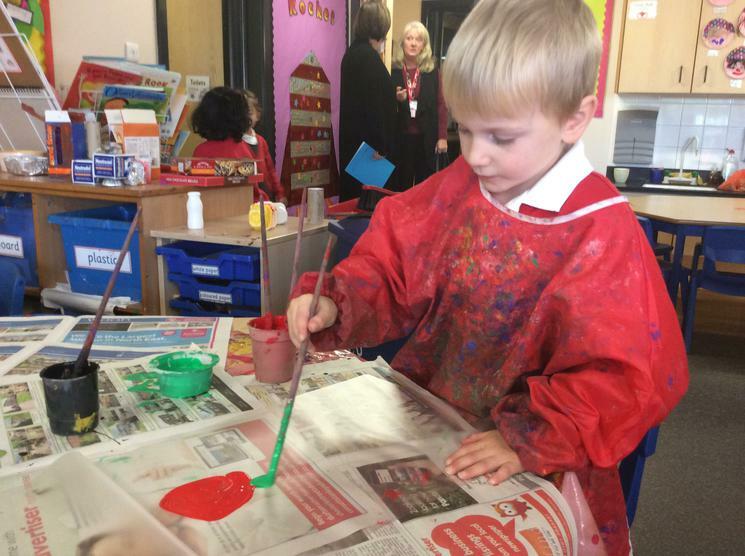 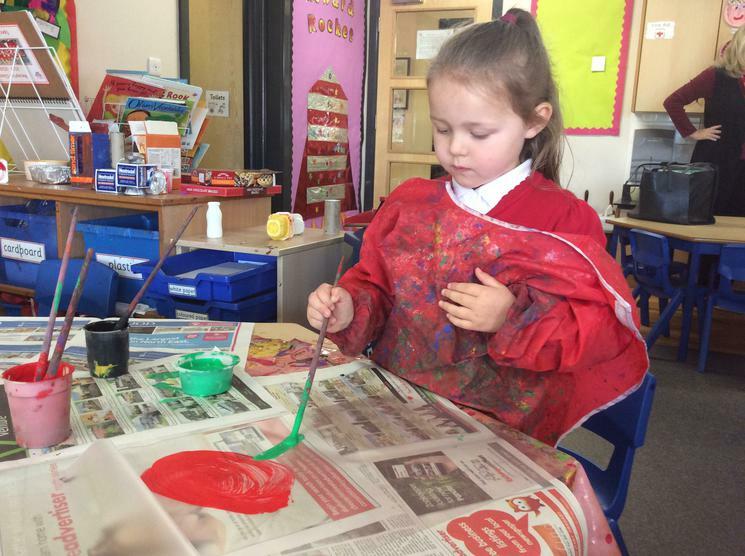 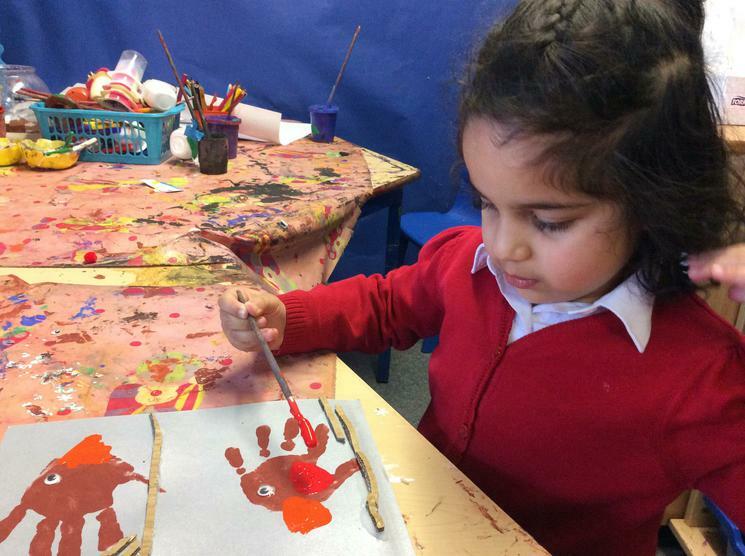 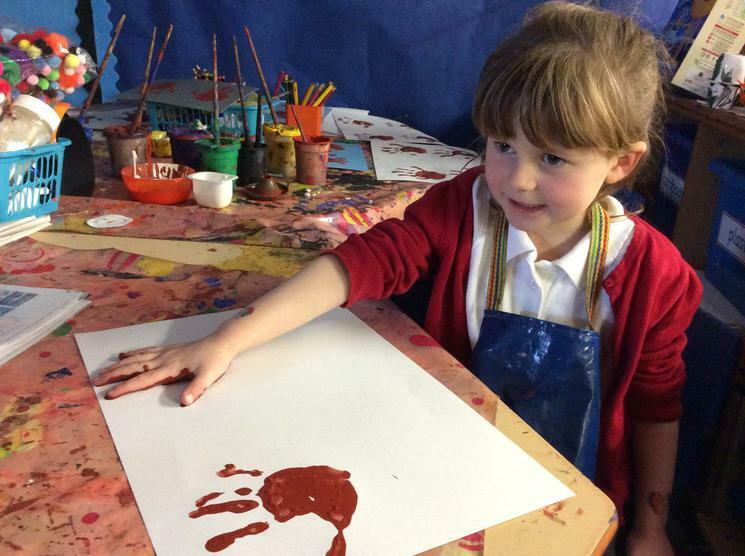 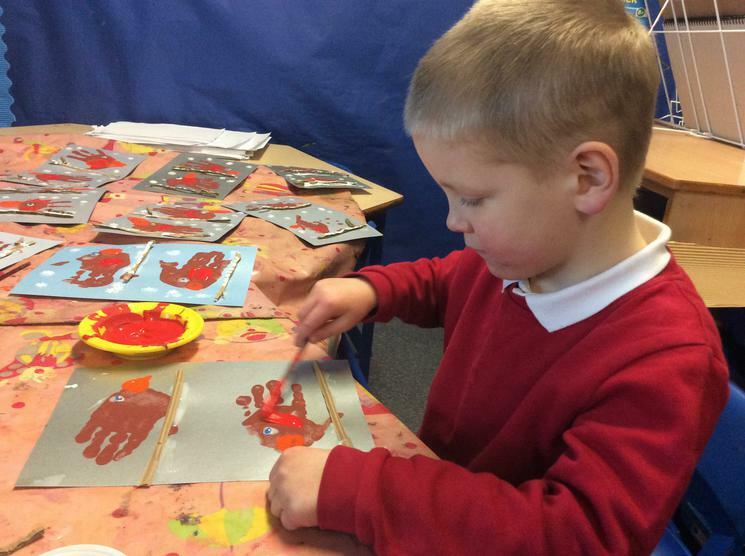 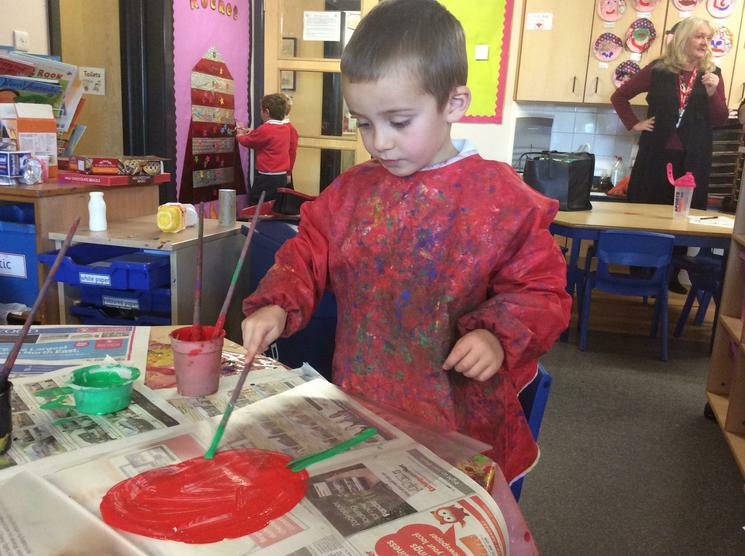 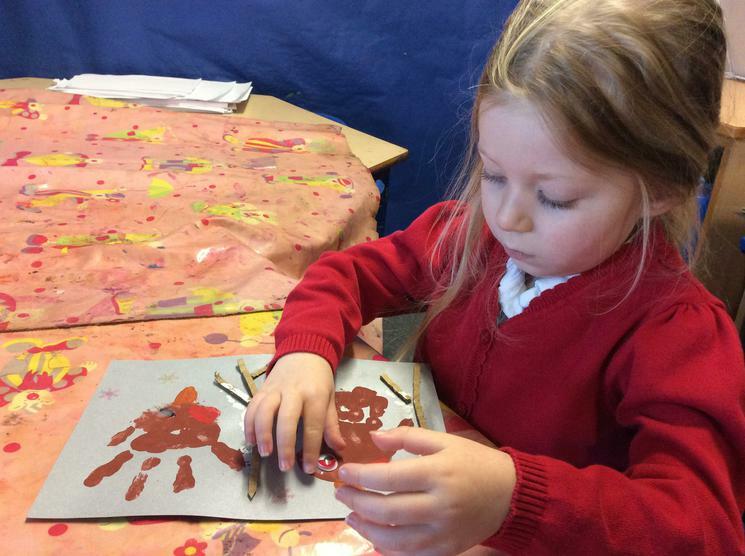 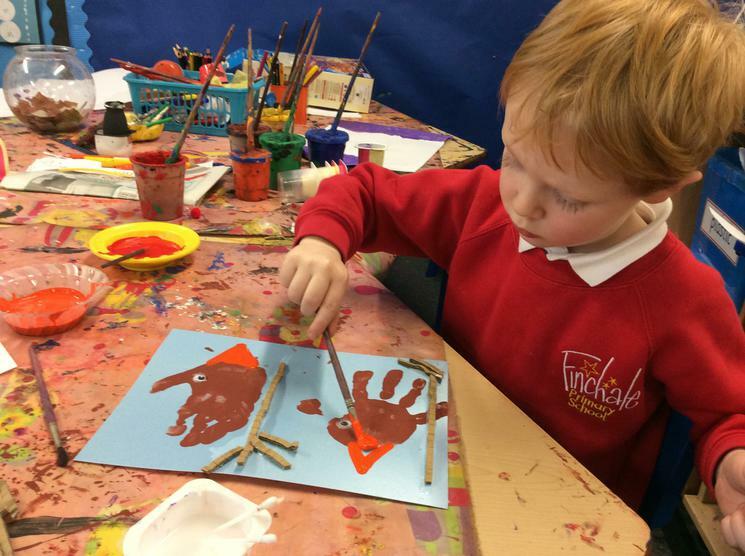 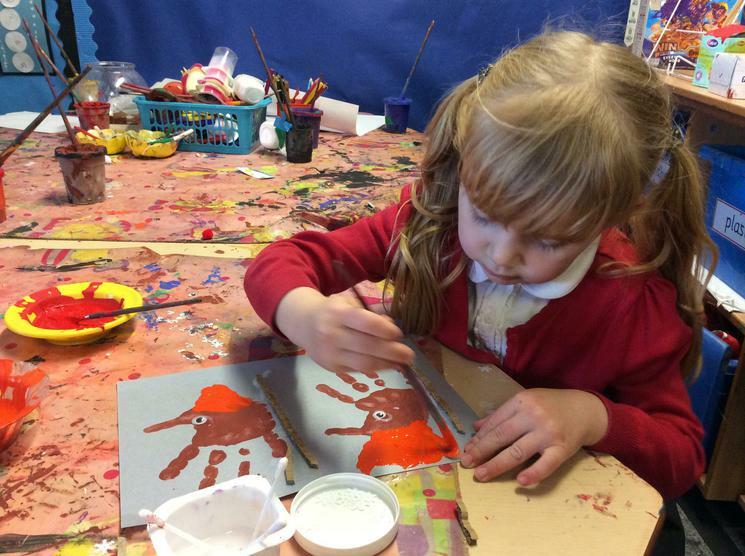 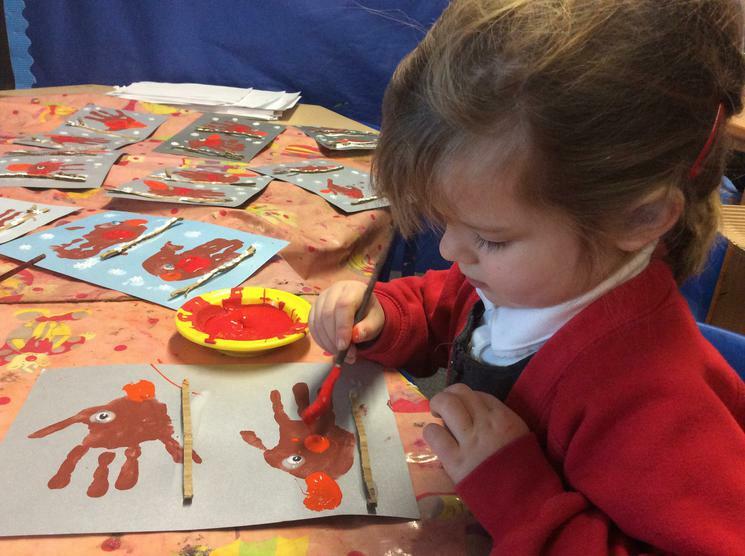 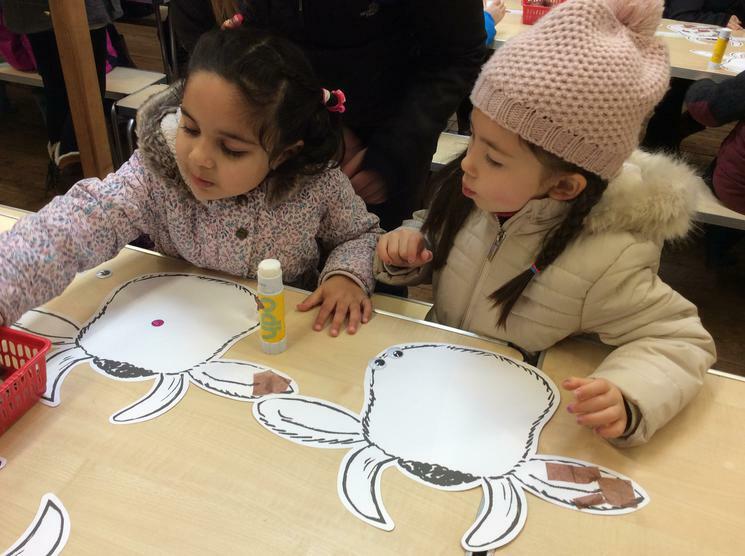 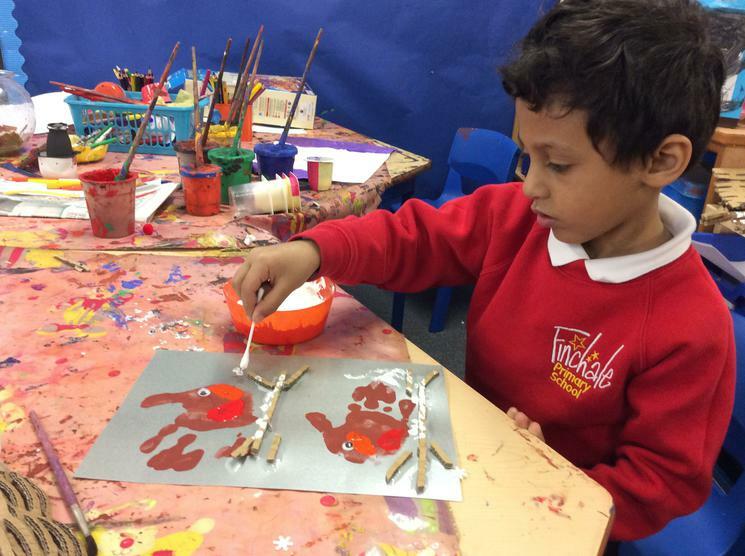 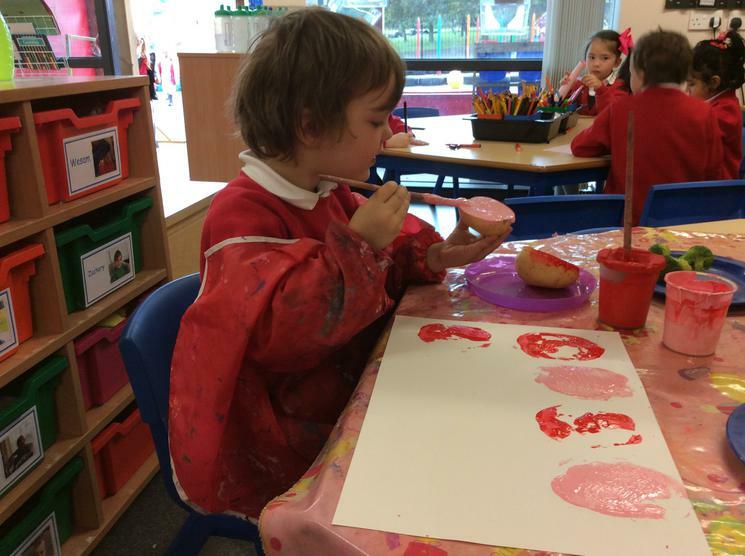 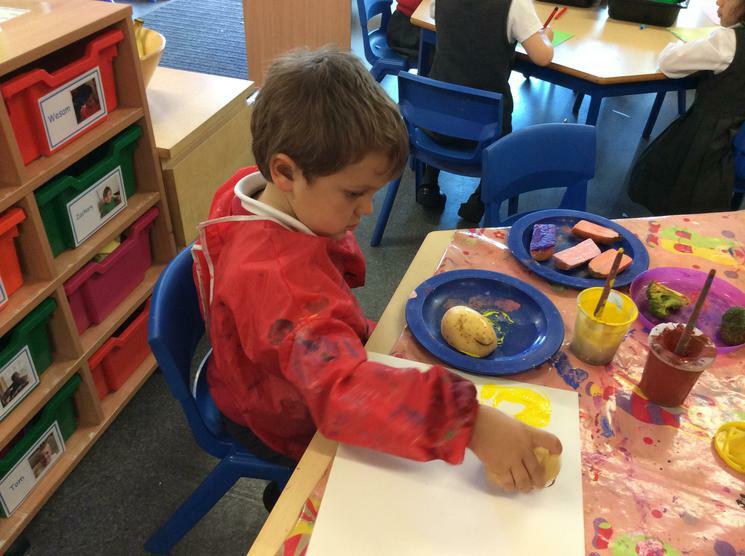 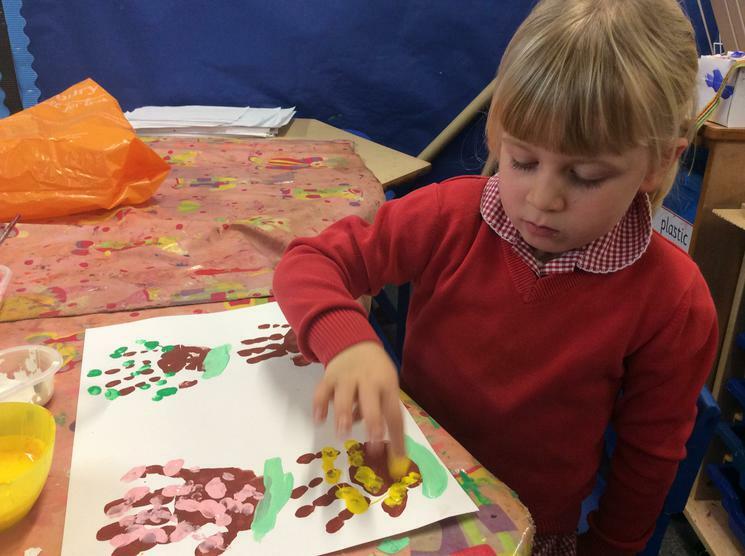 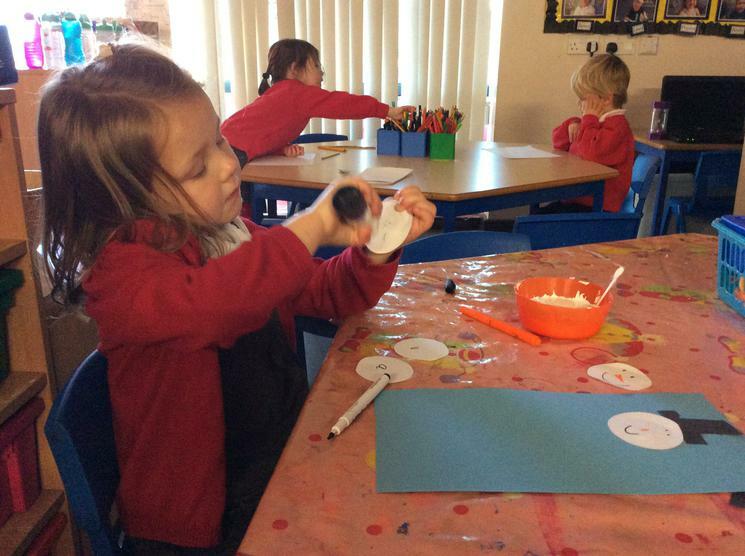 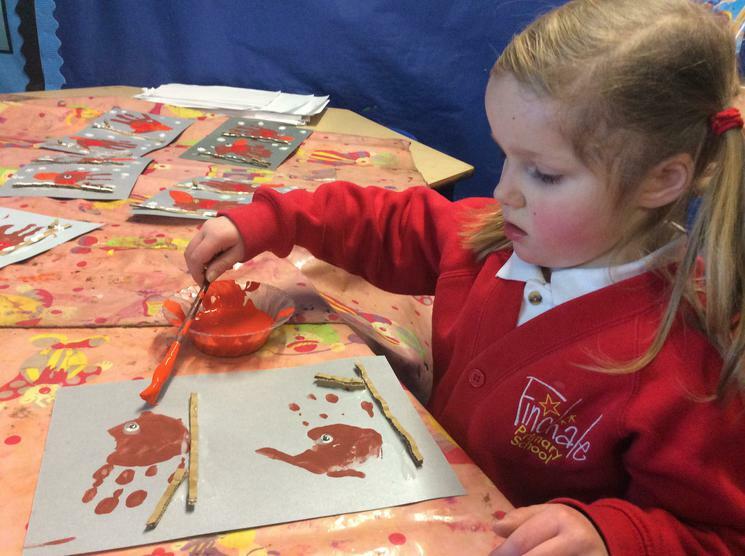 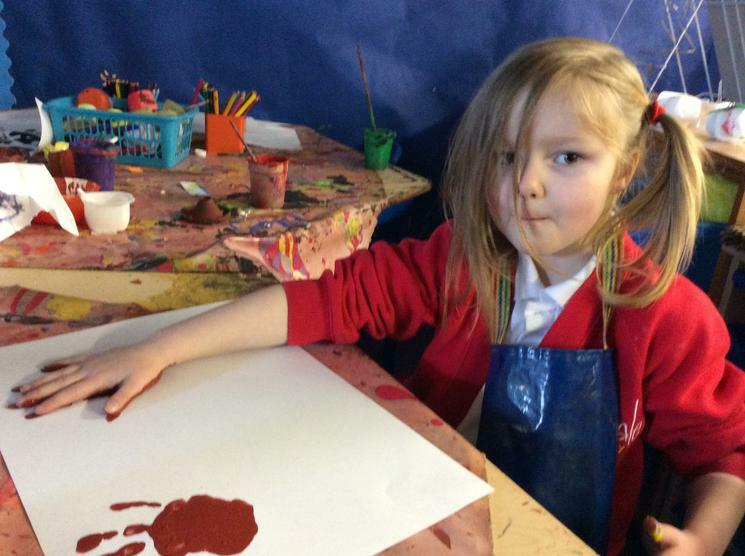 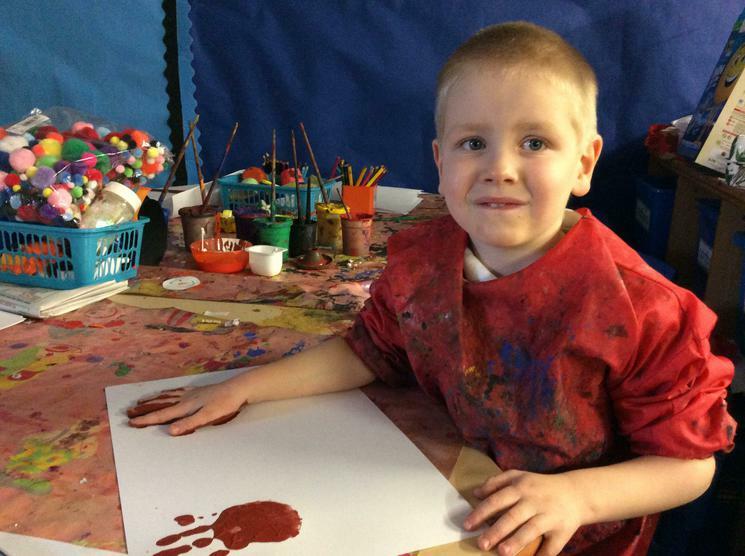 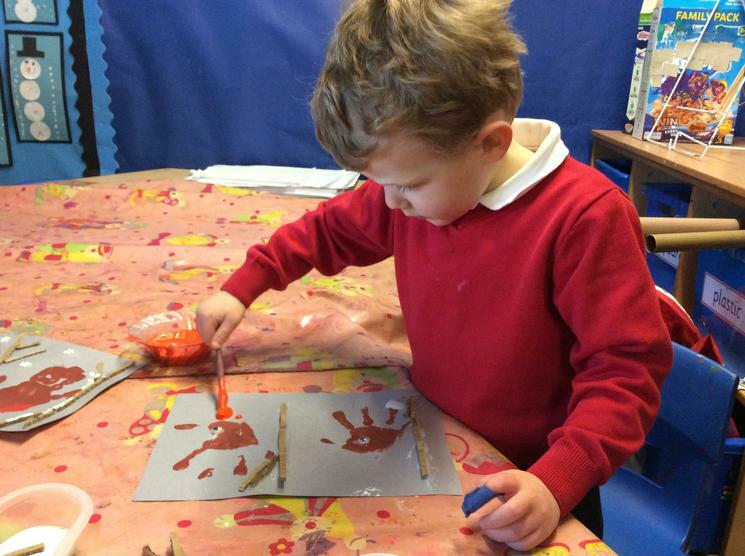 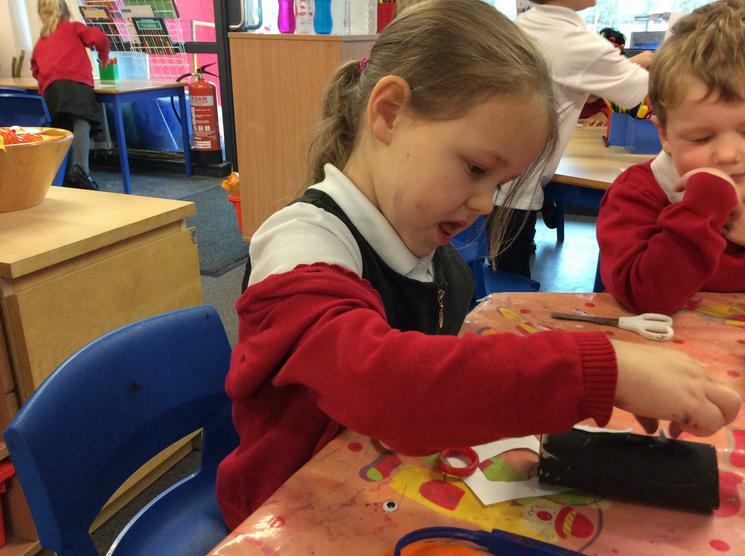 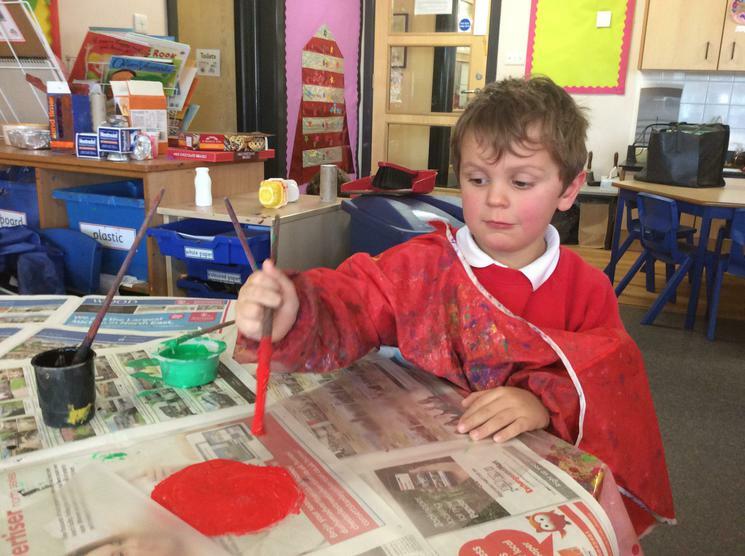 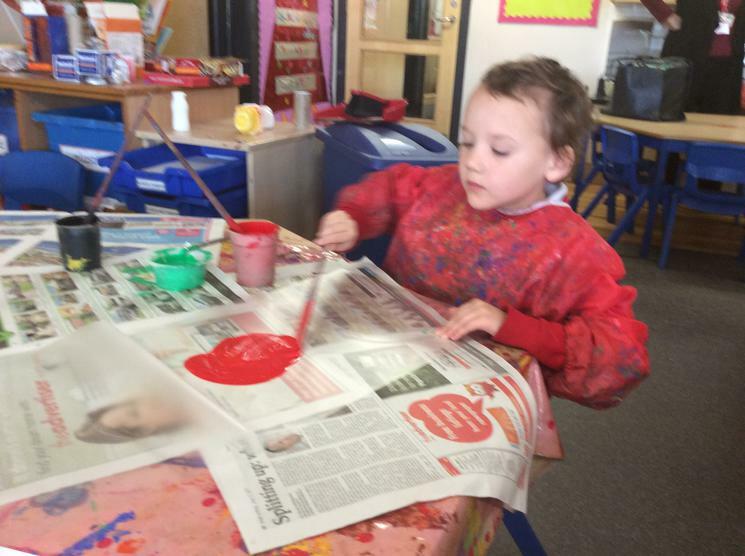 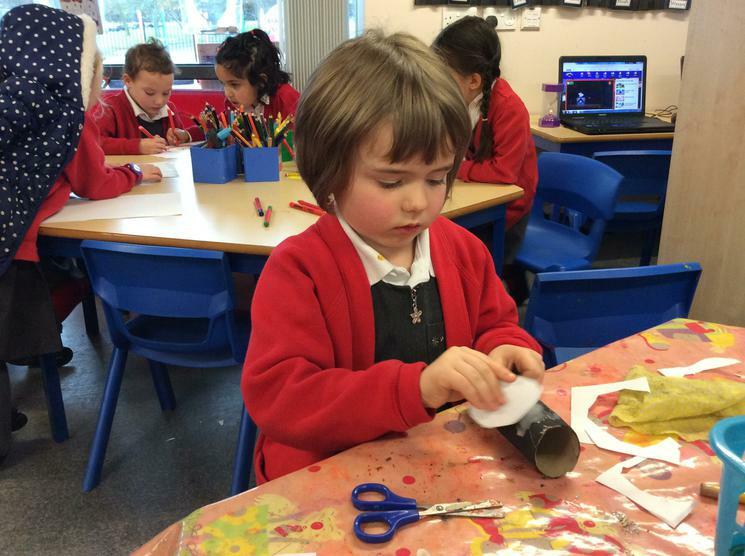 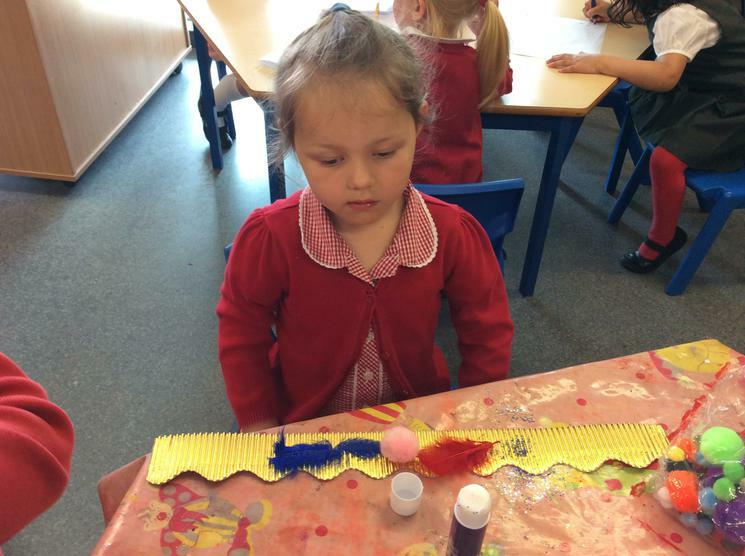 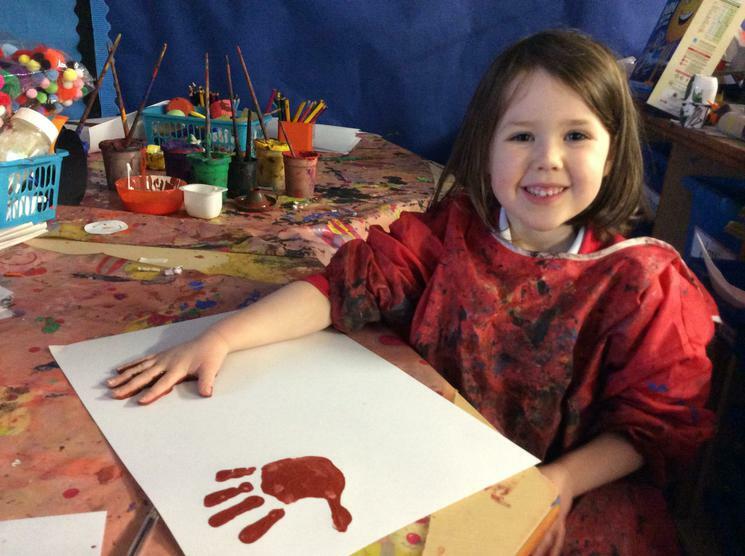 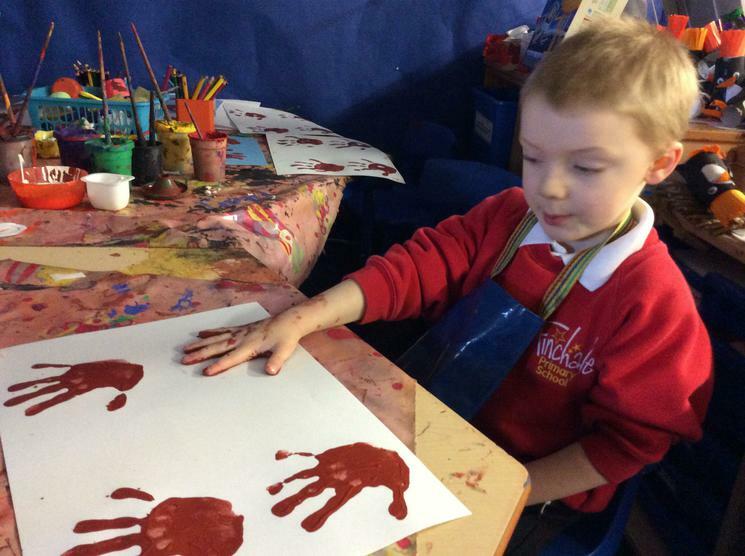 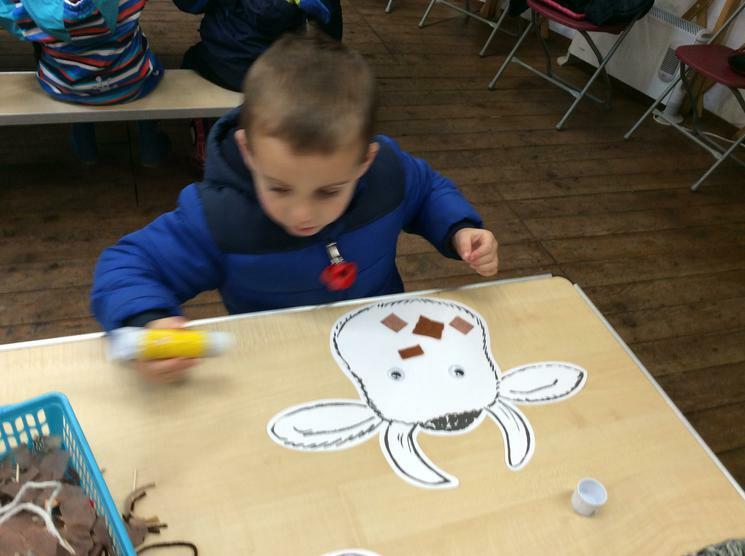 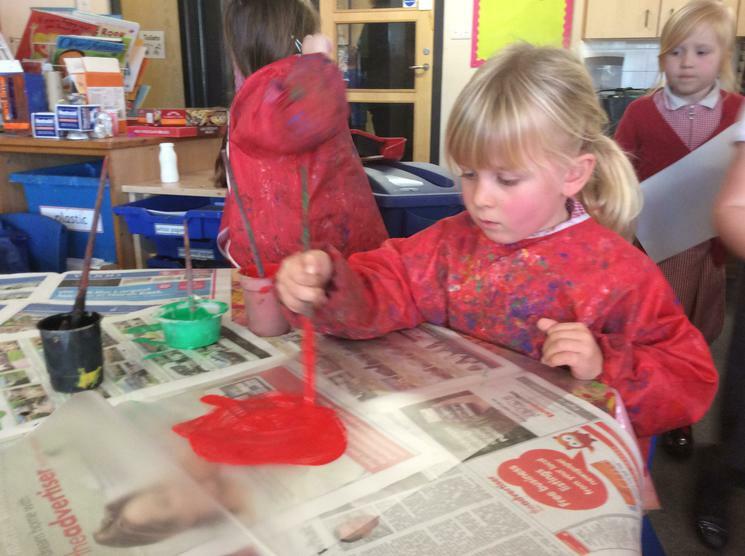 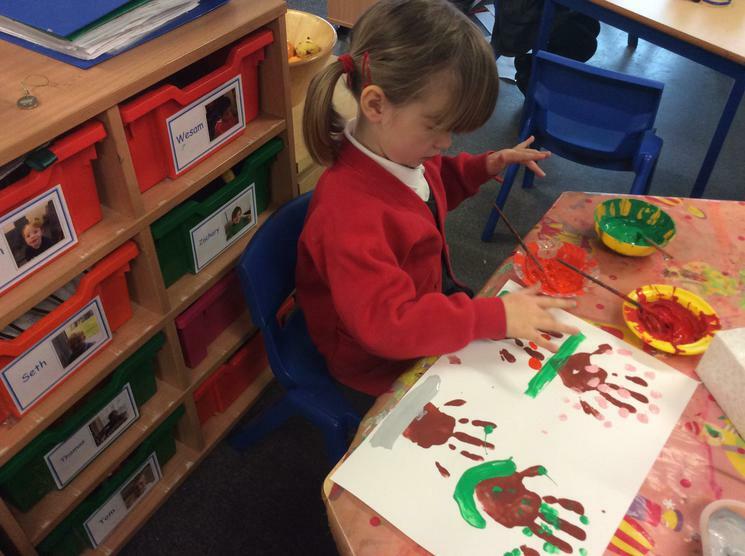 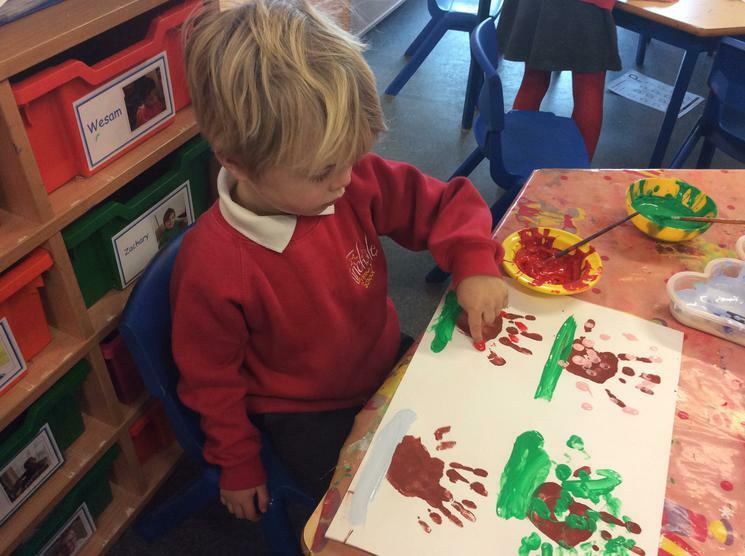 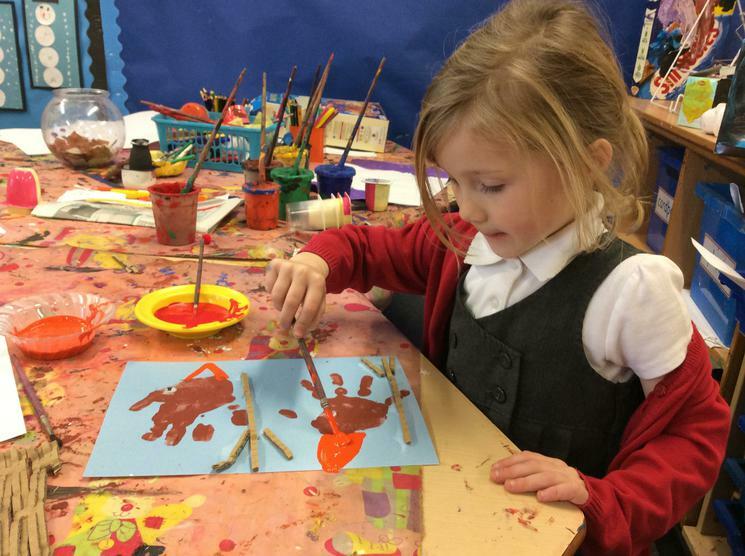 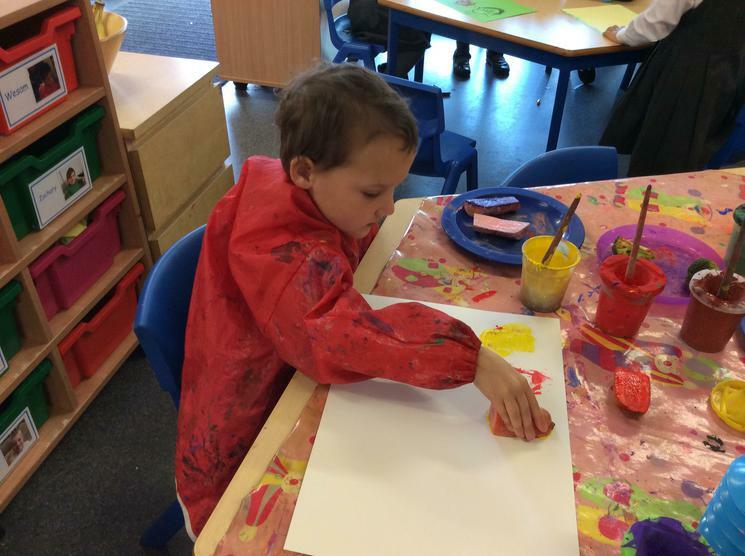 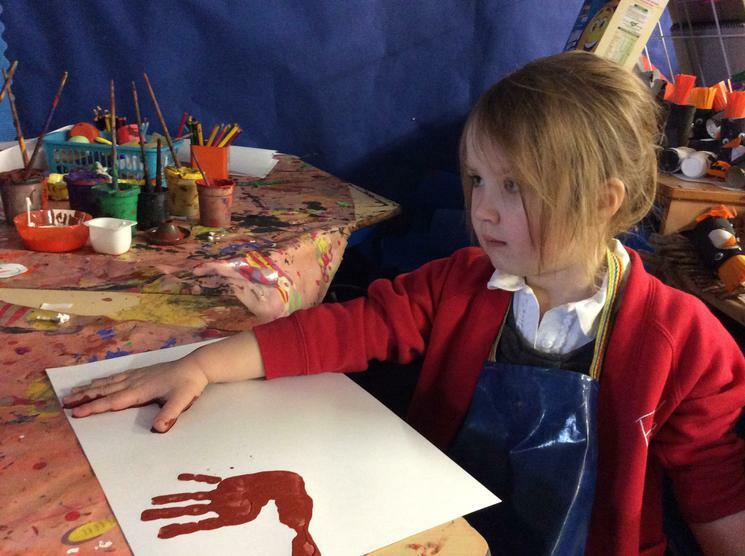 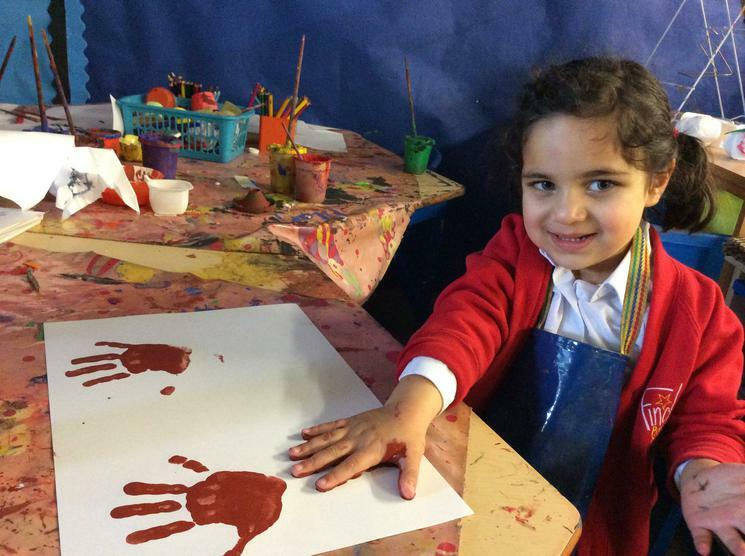 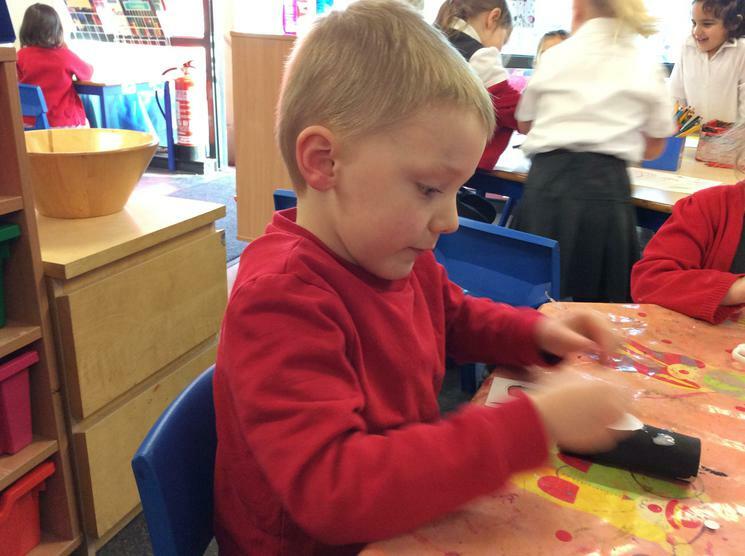 On Remembrance Day we painted a poppy each. 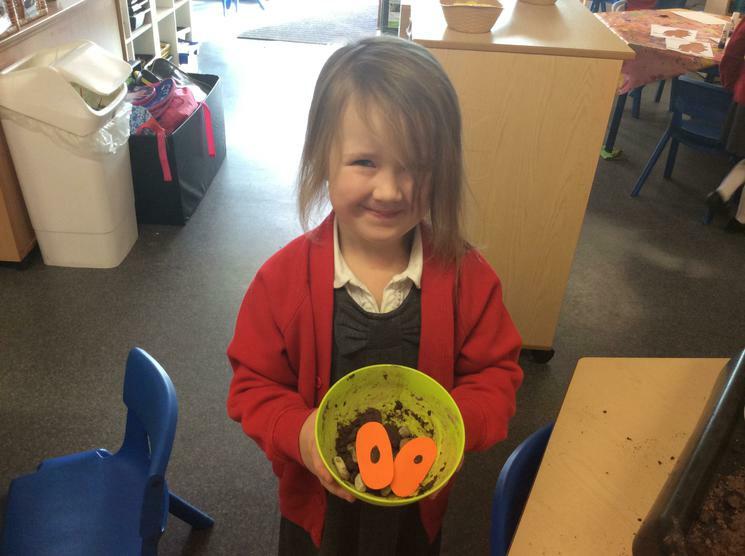 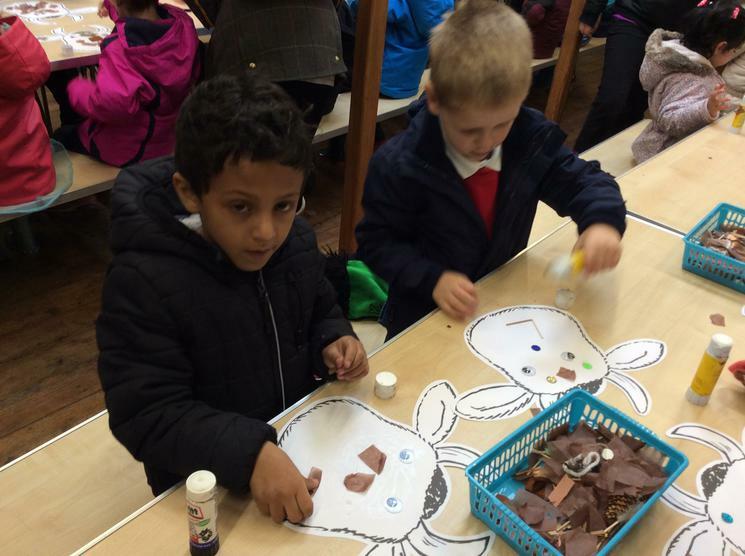 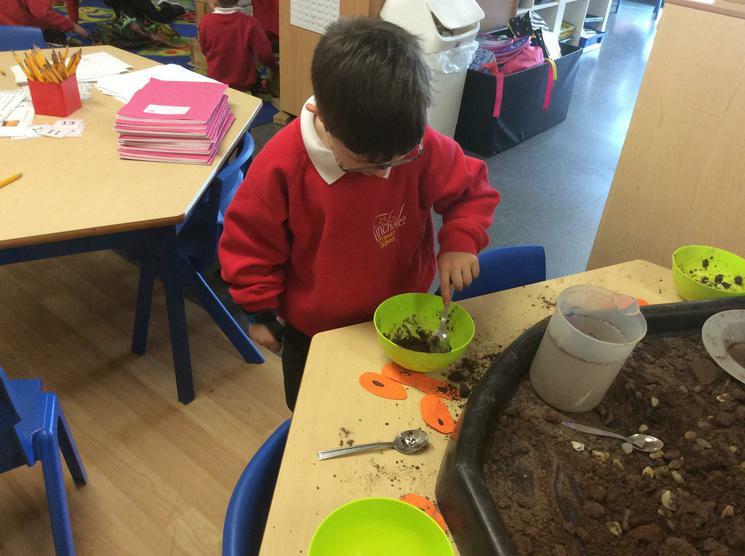 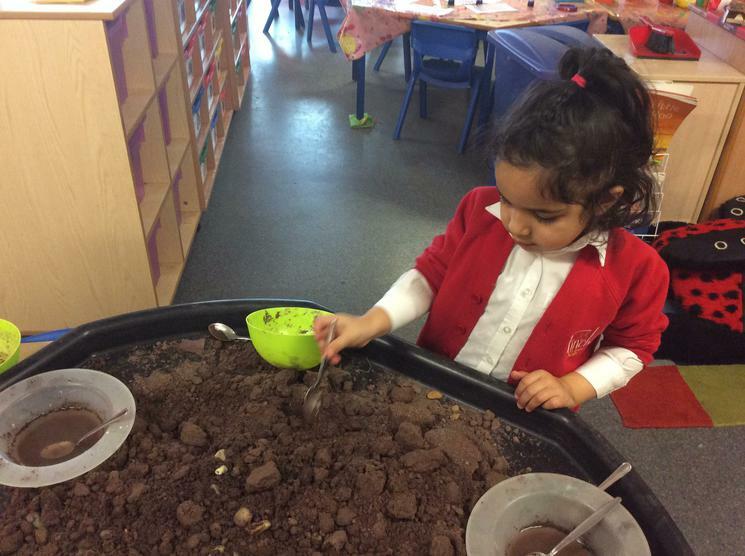 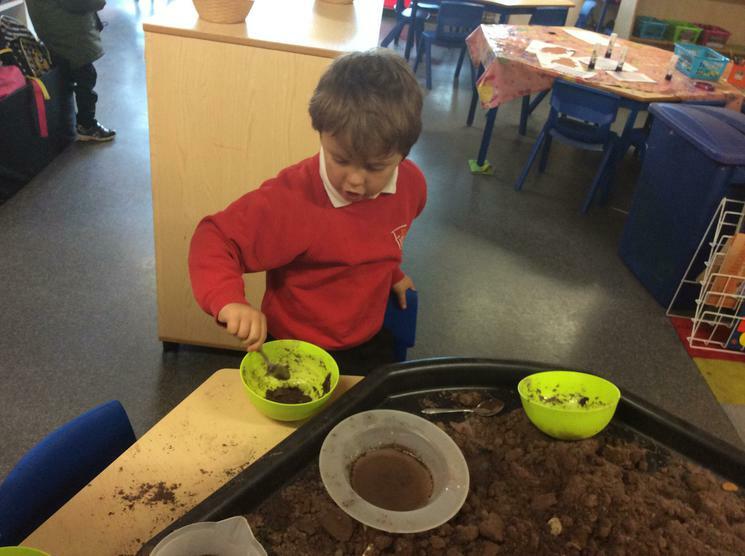 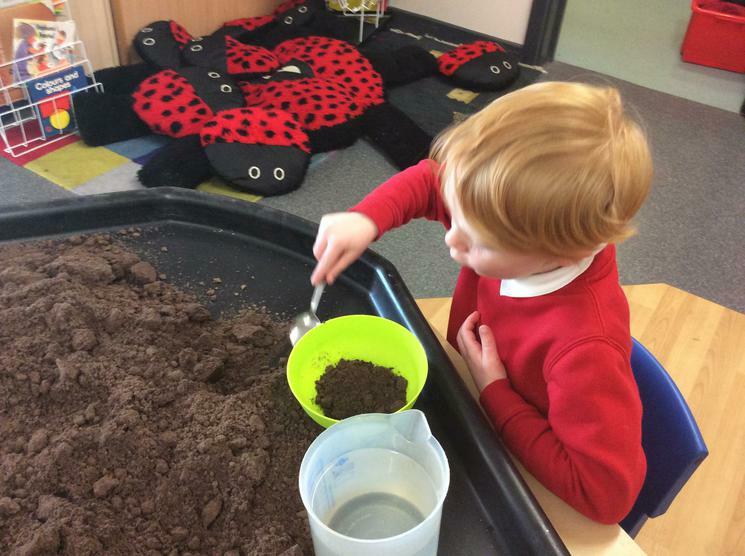 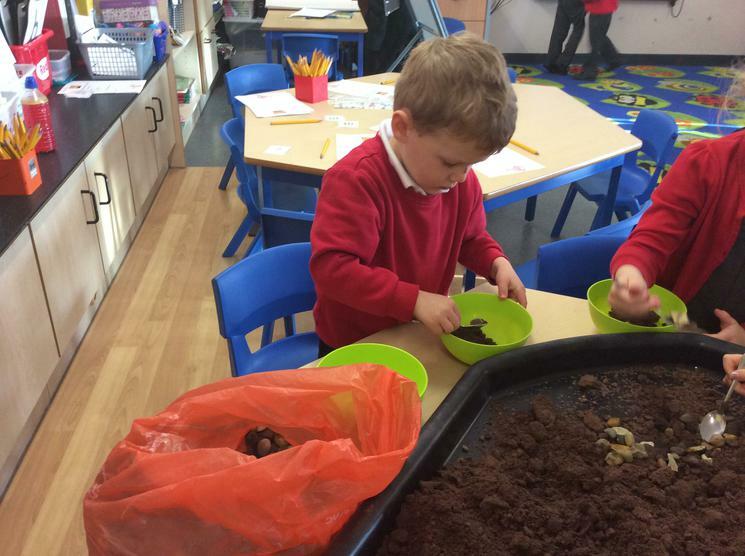 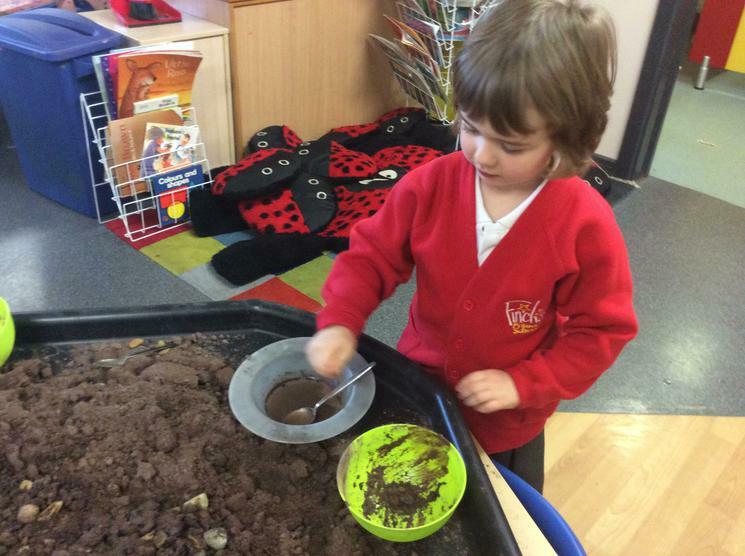 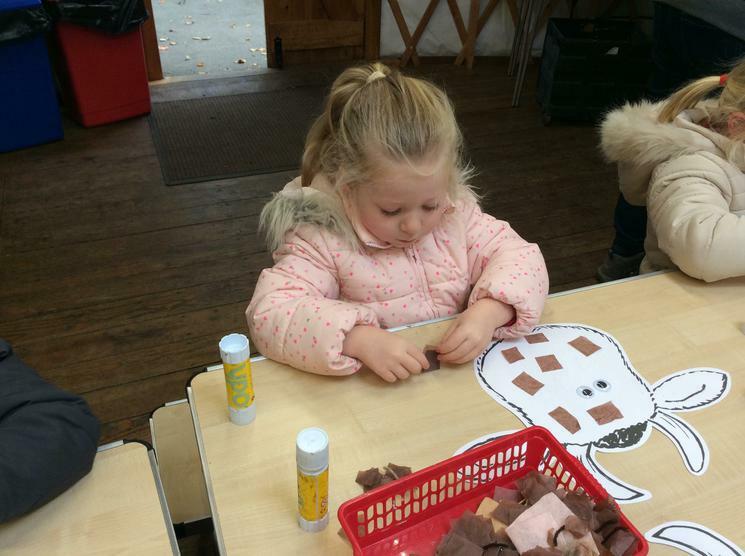 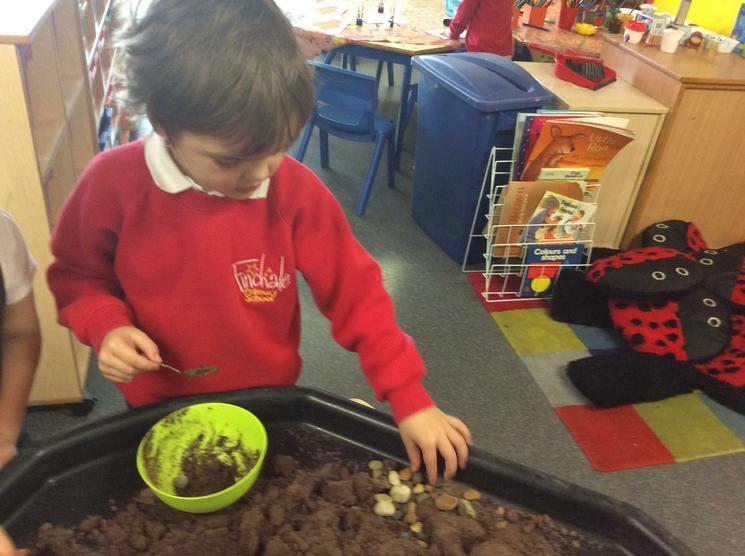 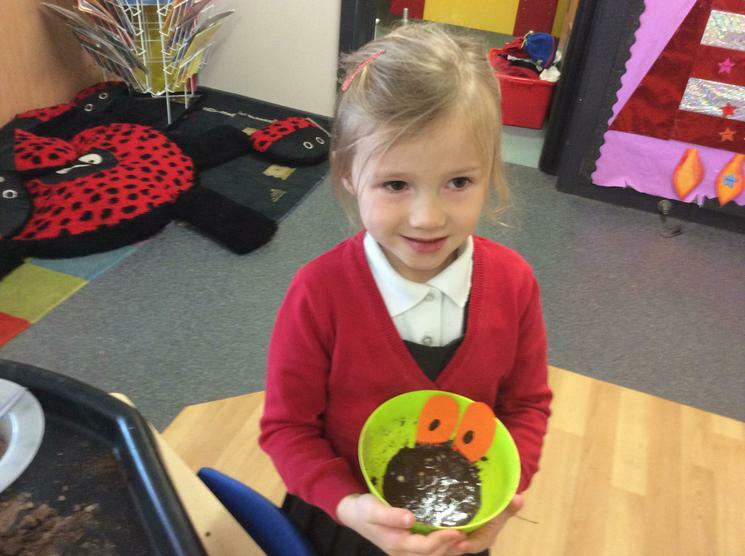 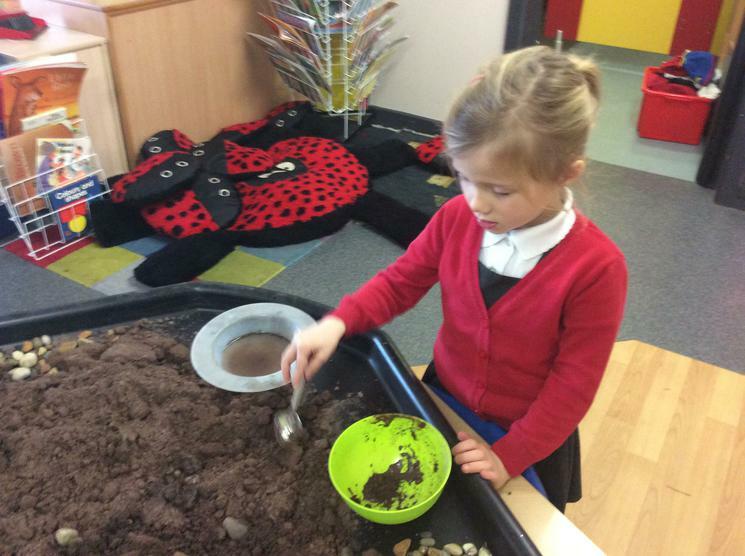 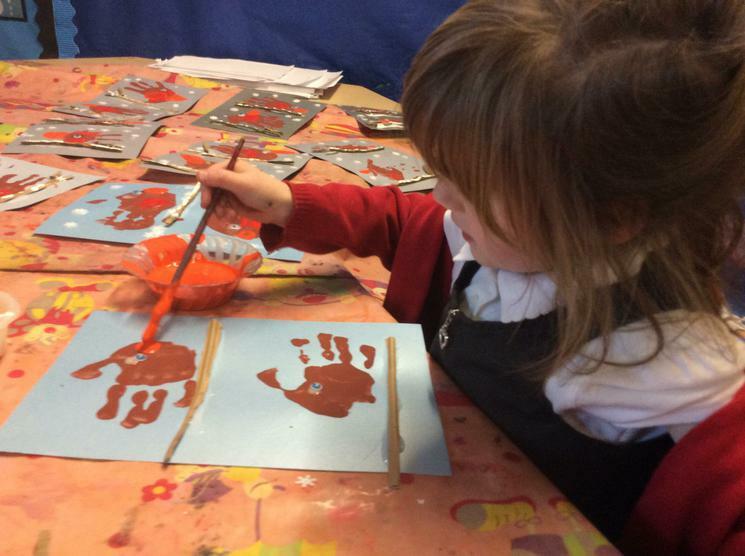 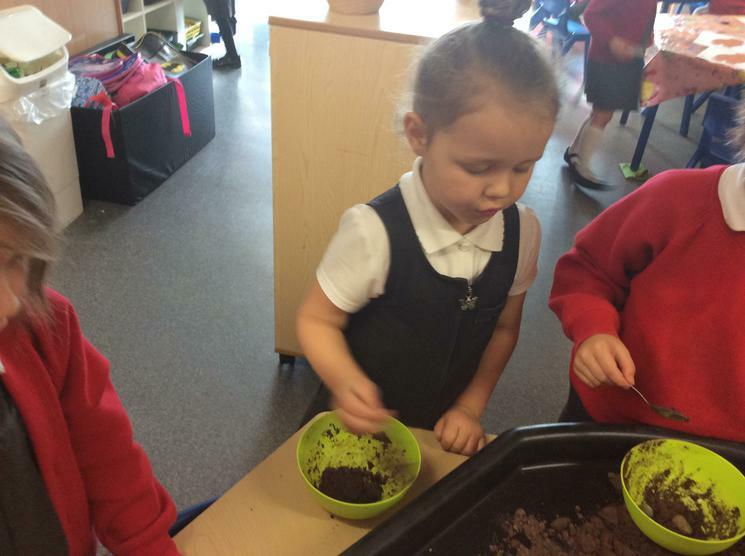 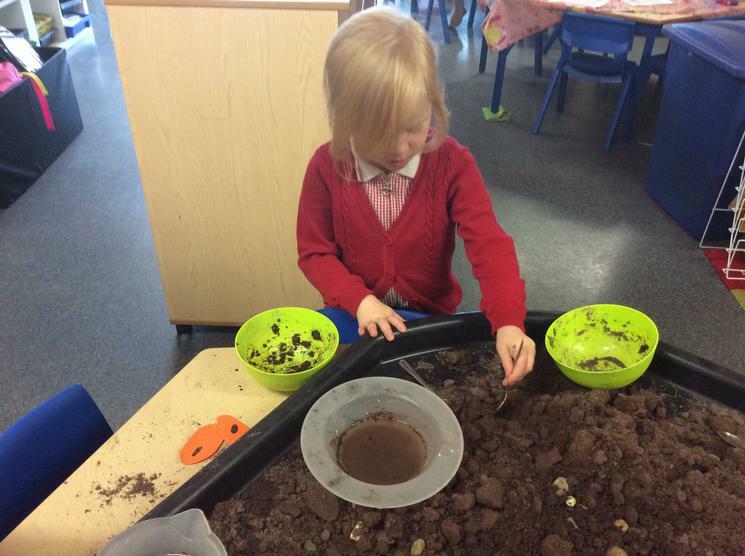 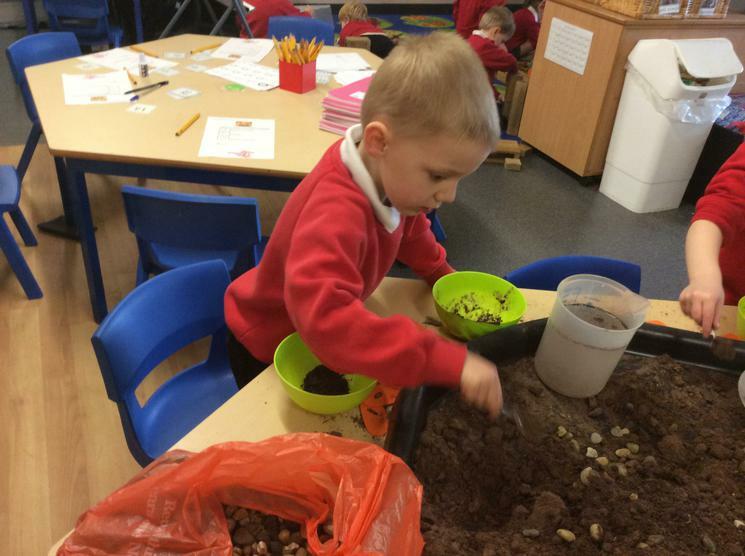 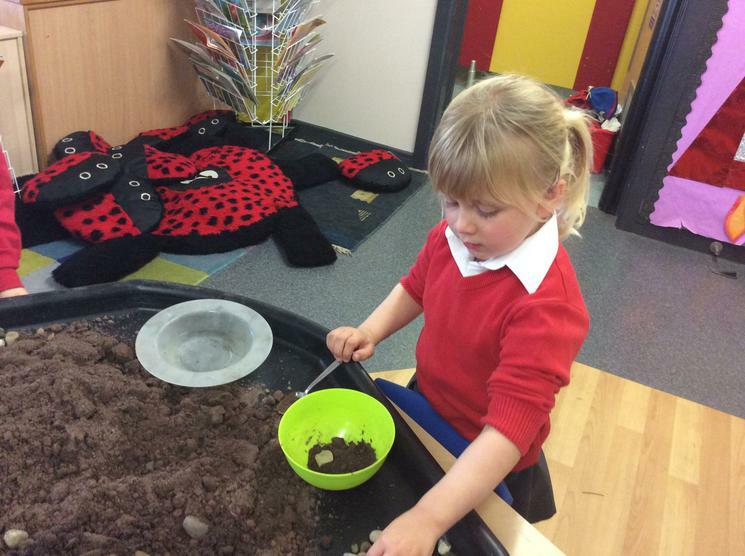 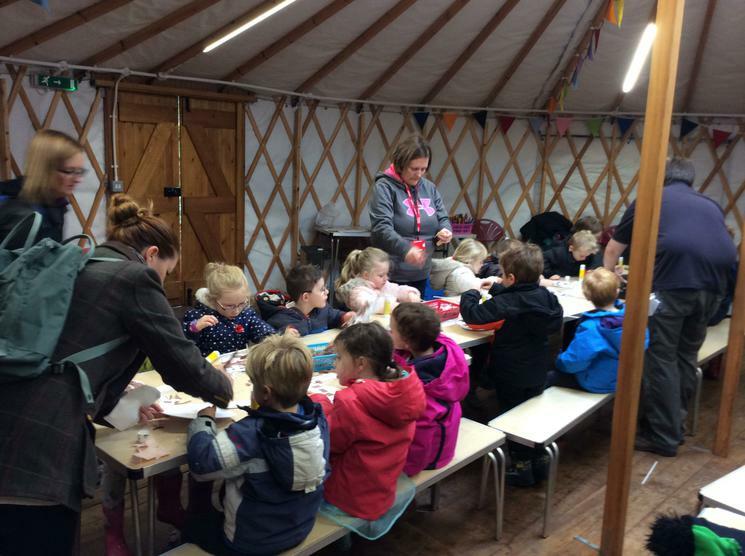 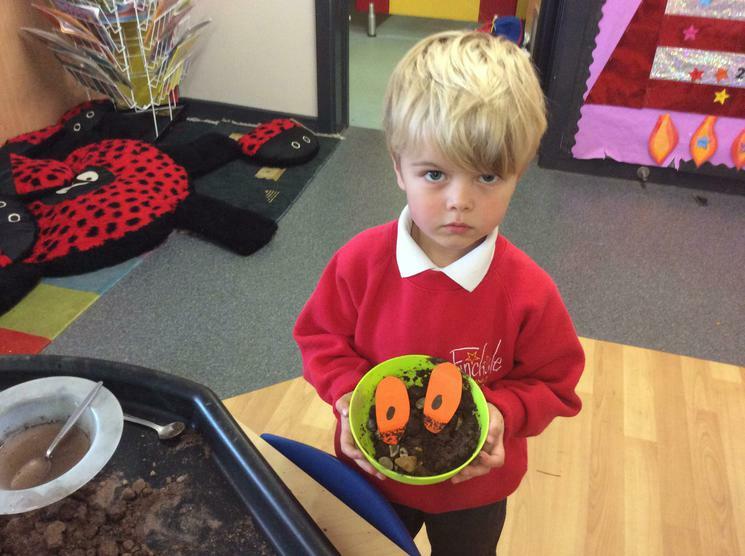 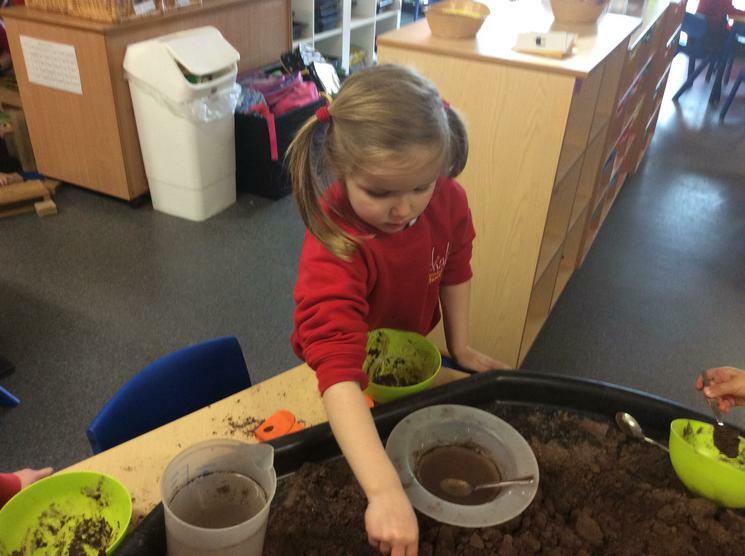 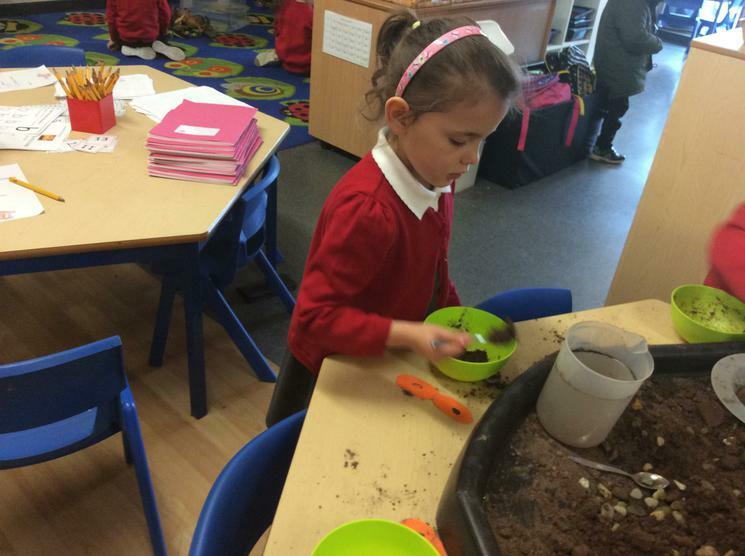 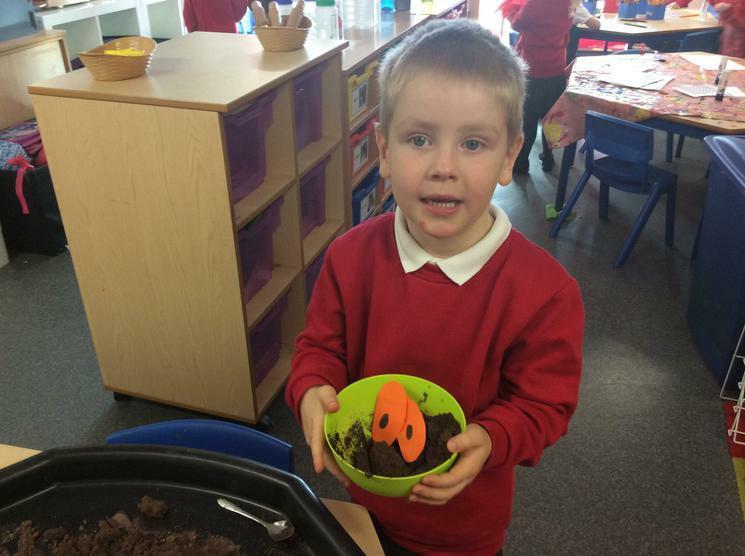 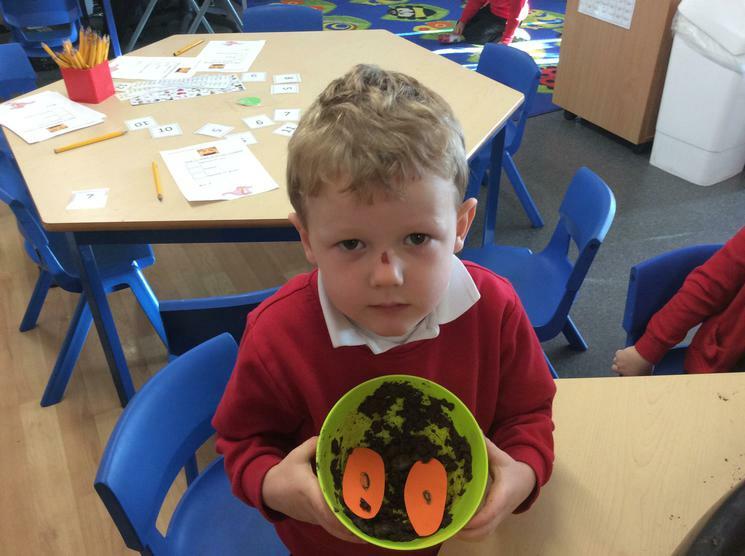 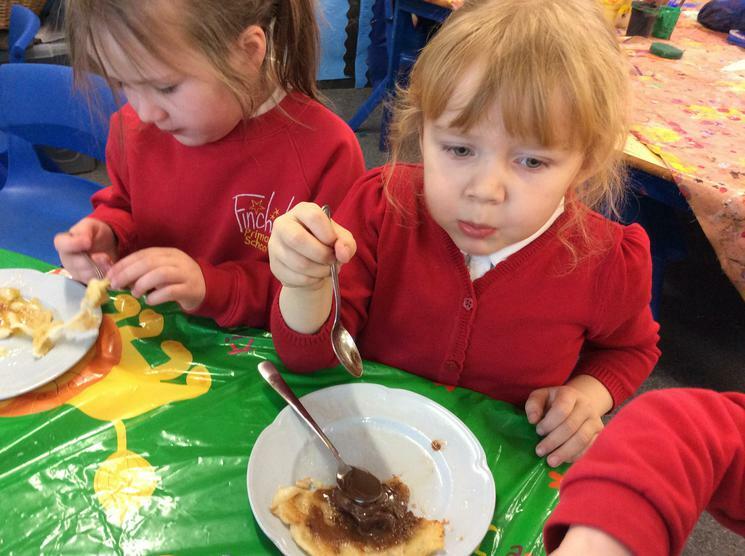 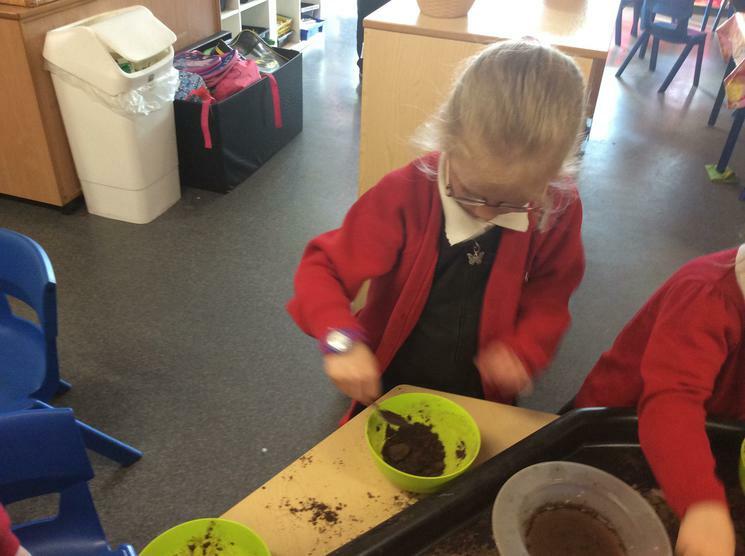 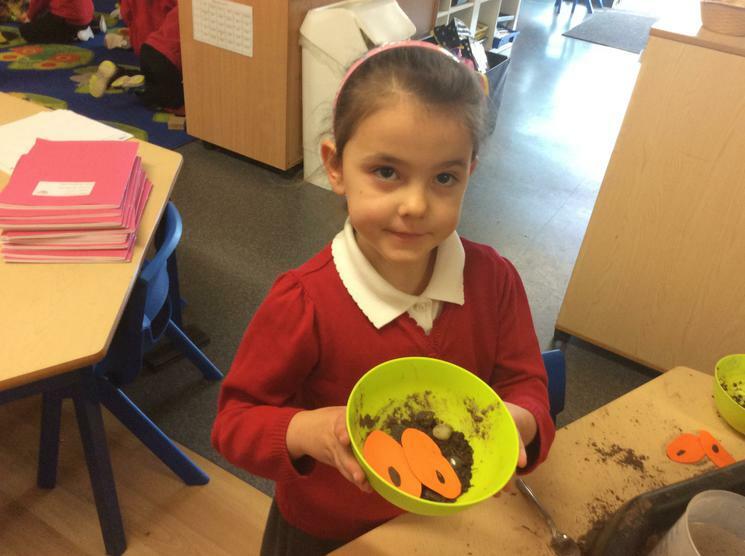 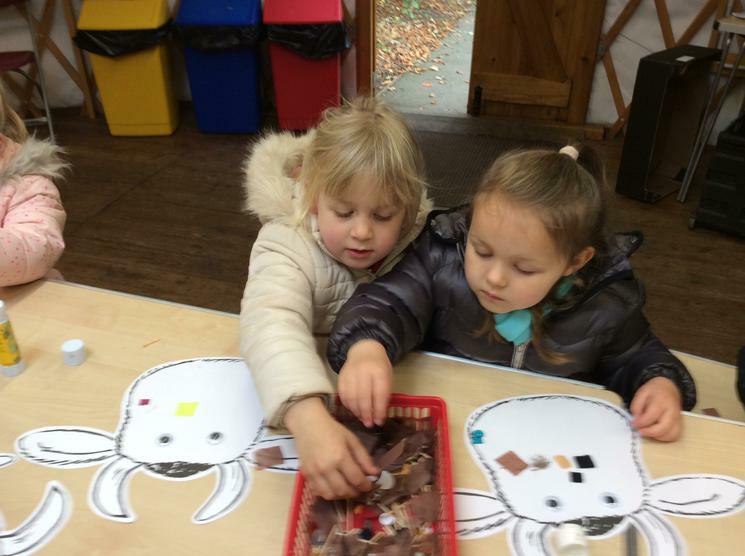 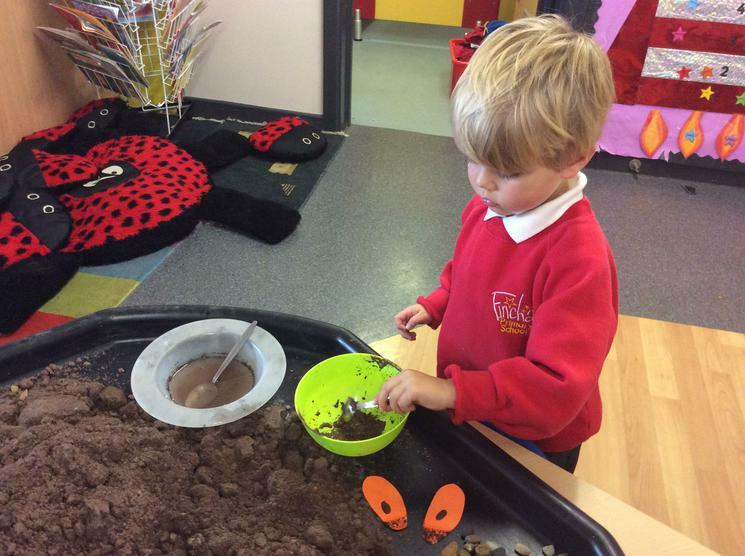 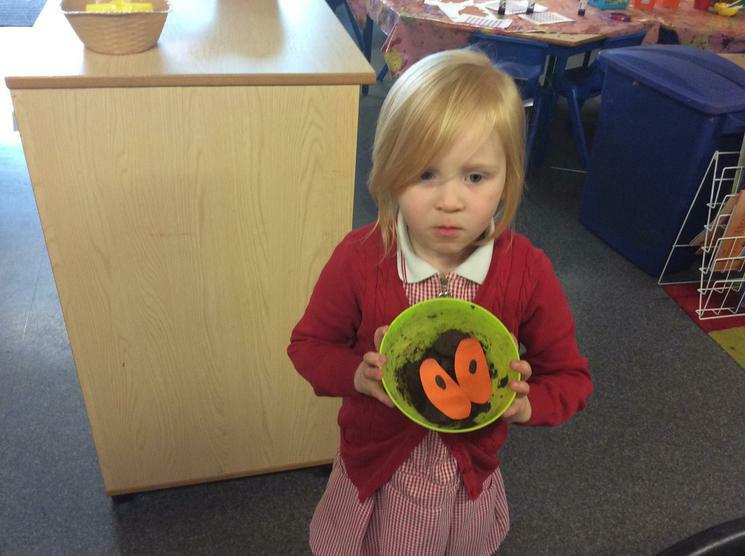 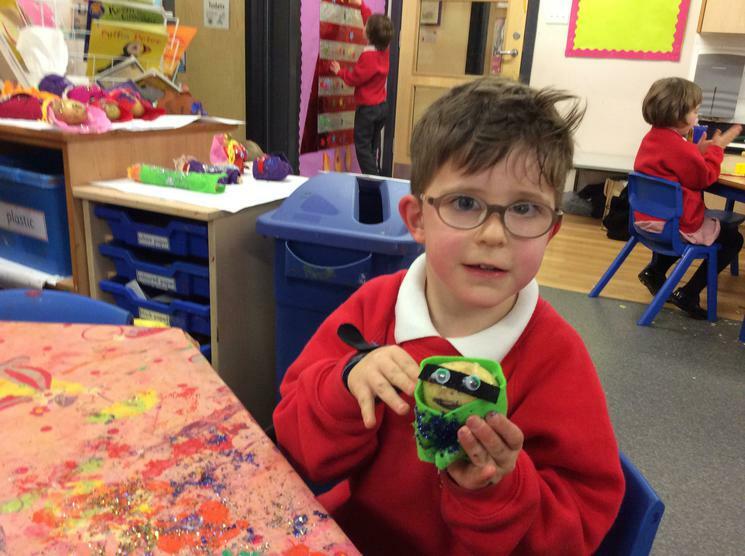 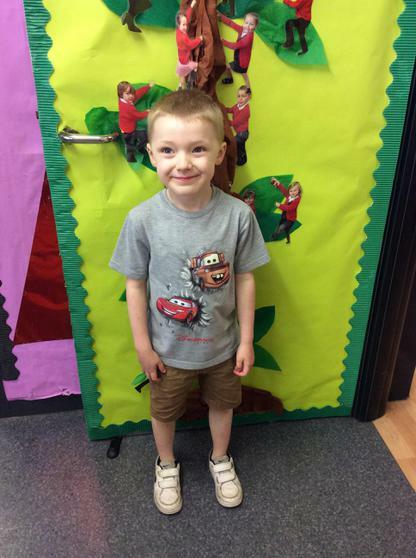 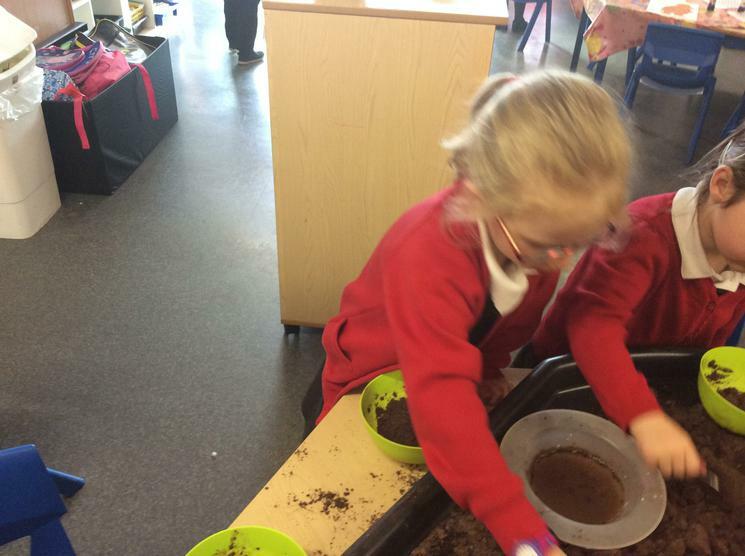 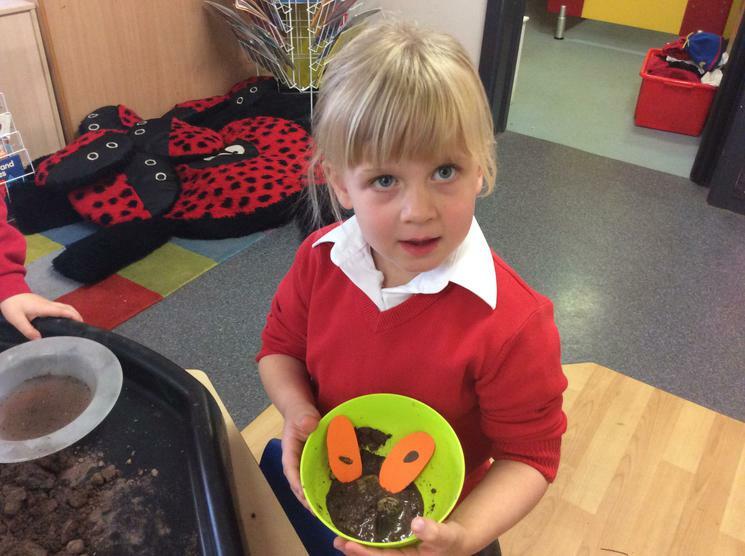 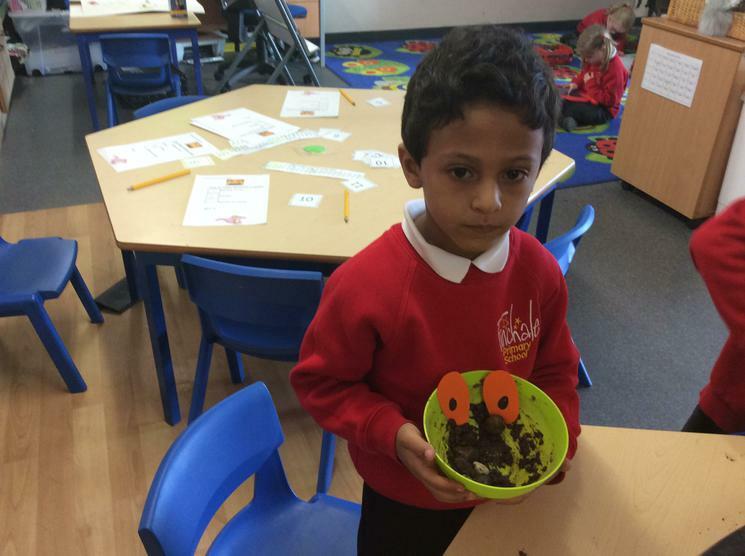 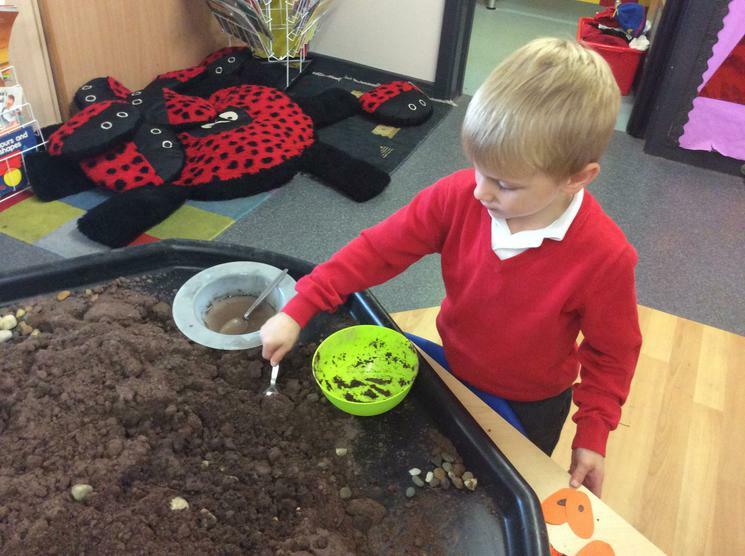 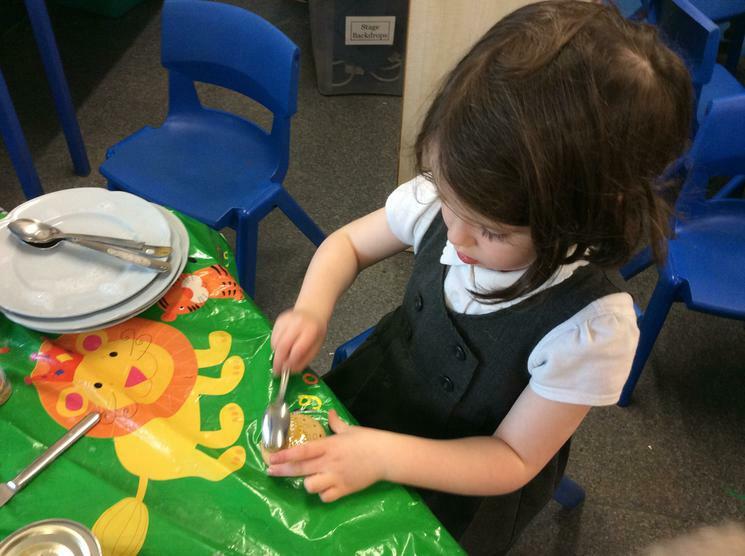 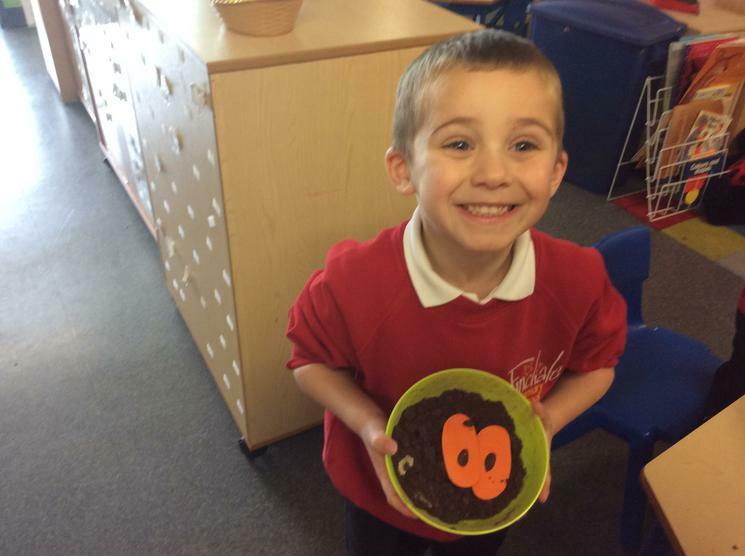 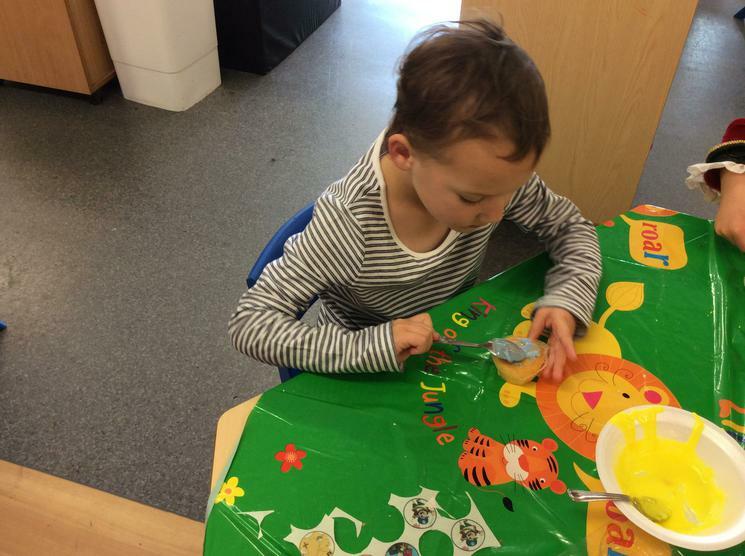 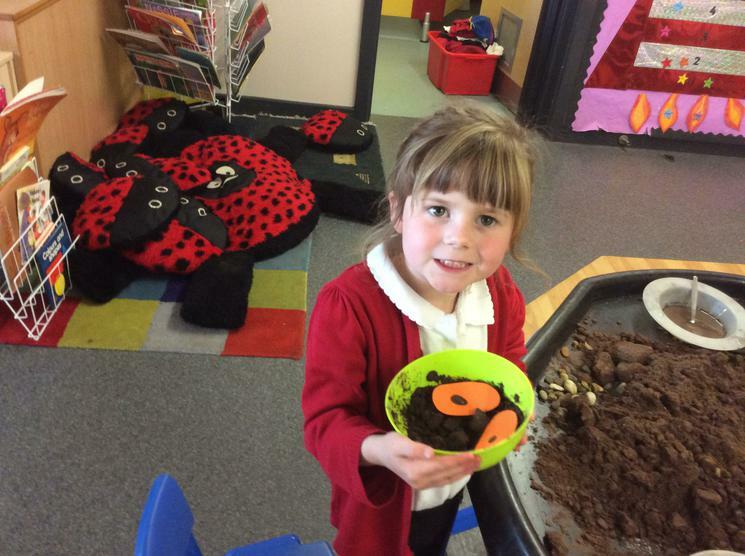 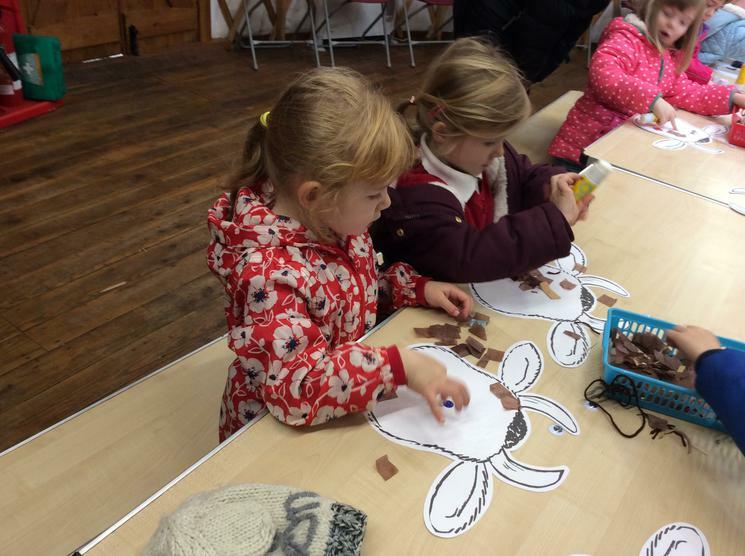 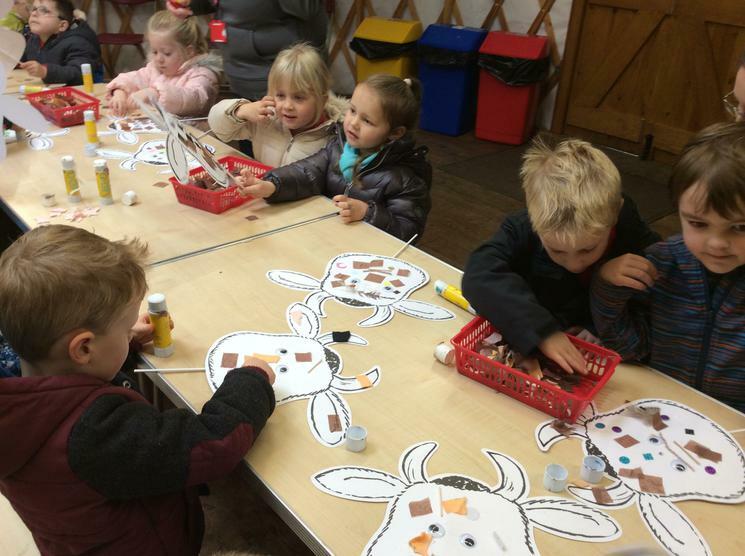 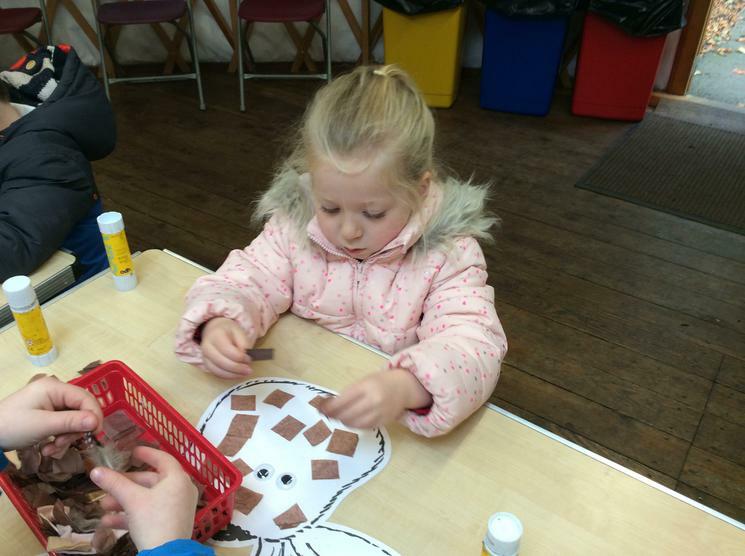 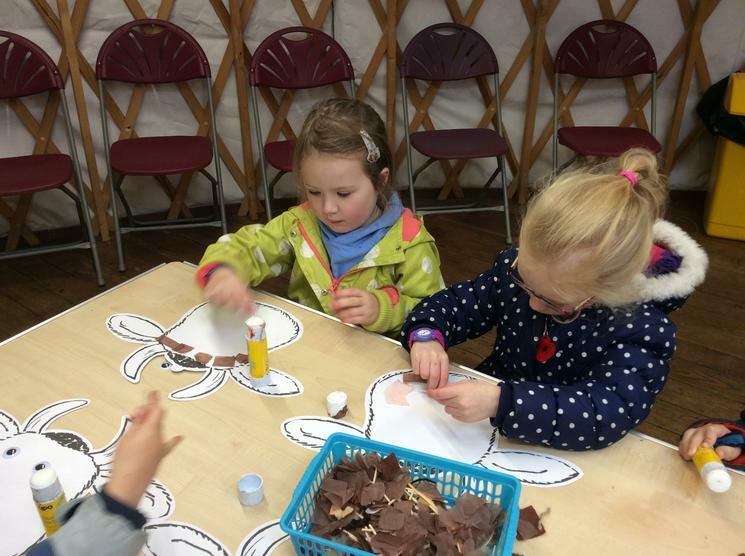 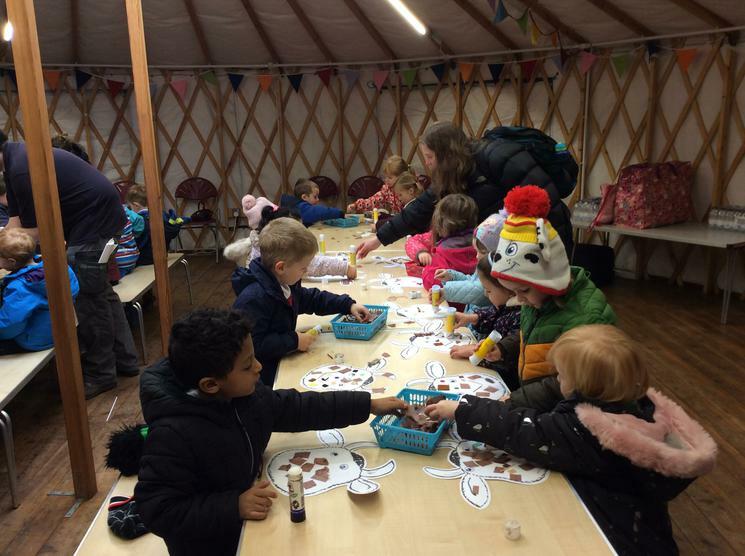 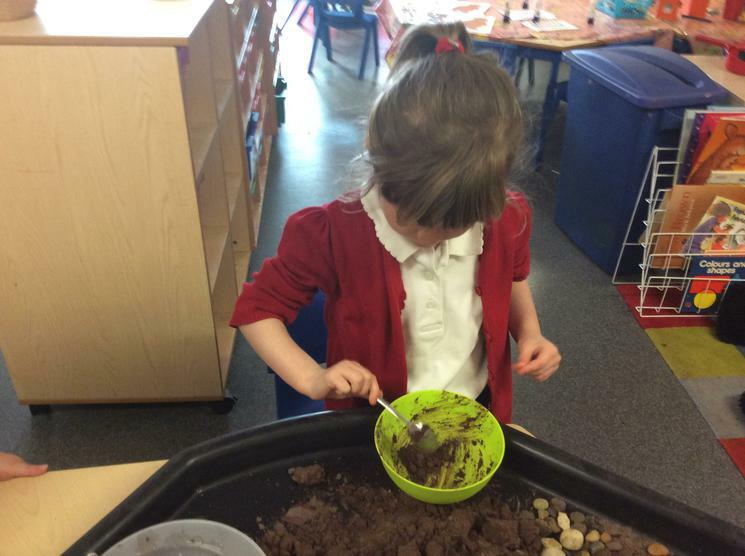 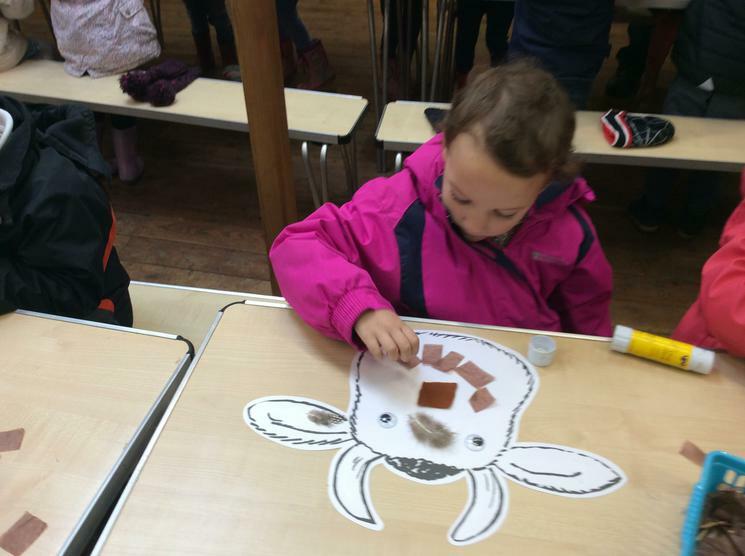 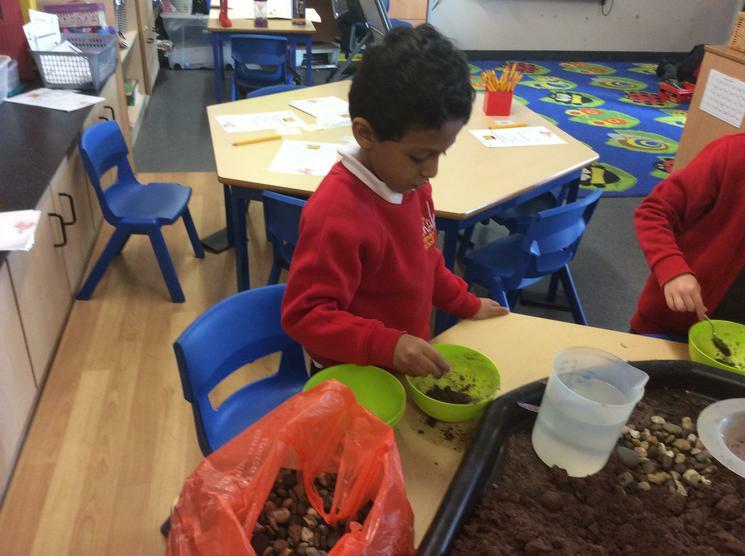 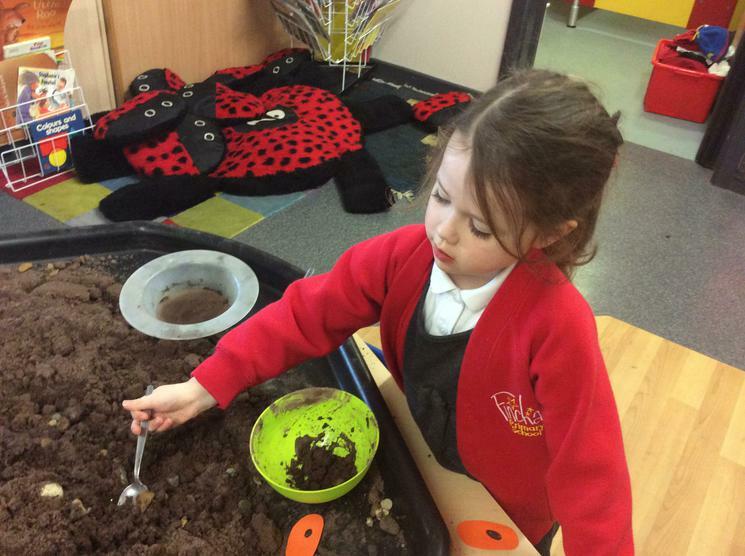 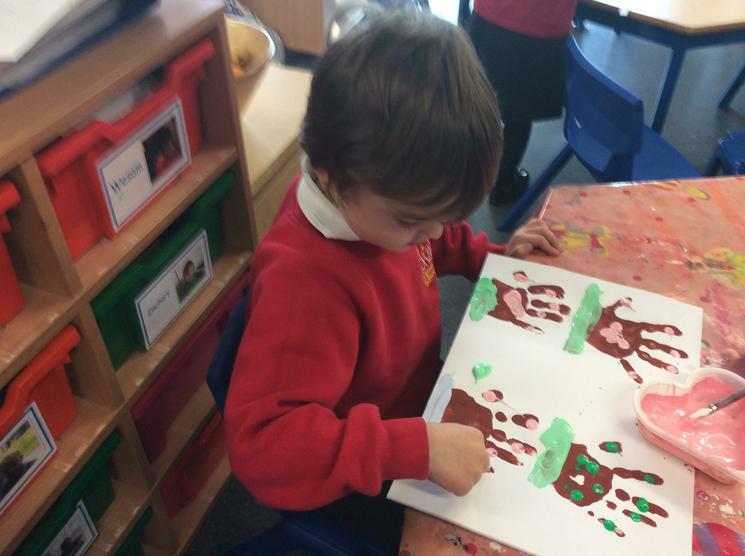 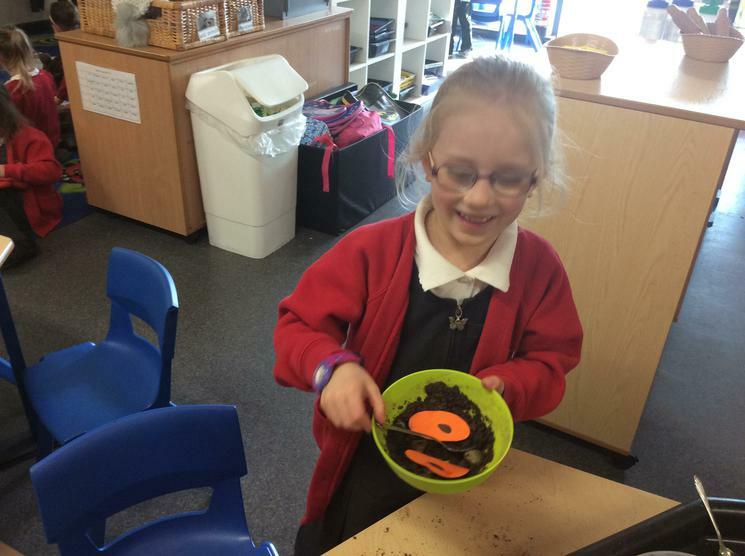 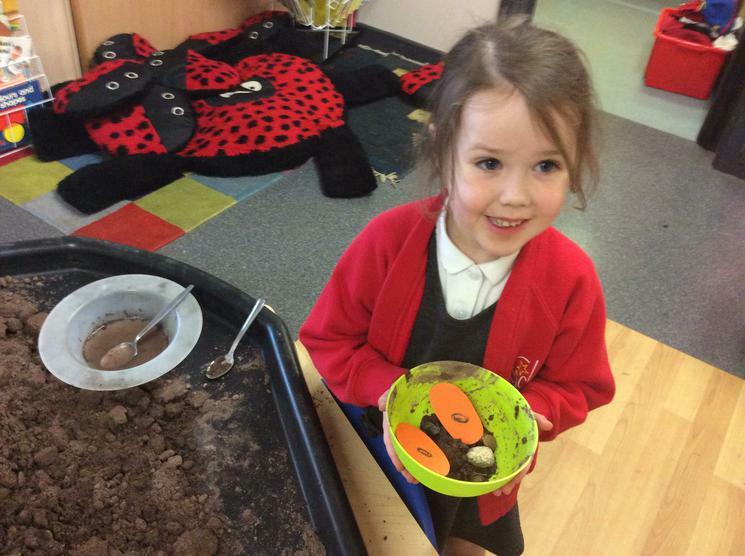 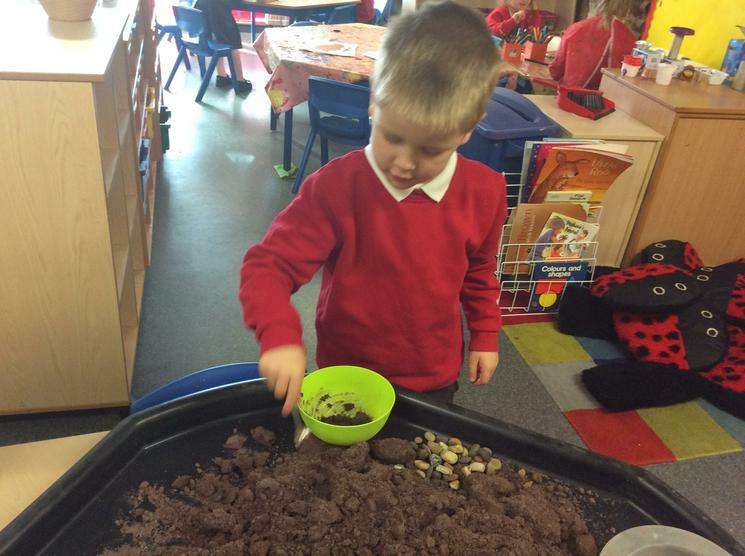 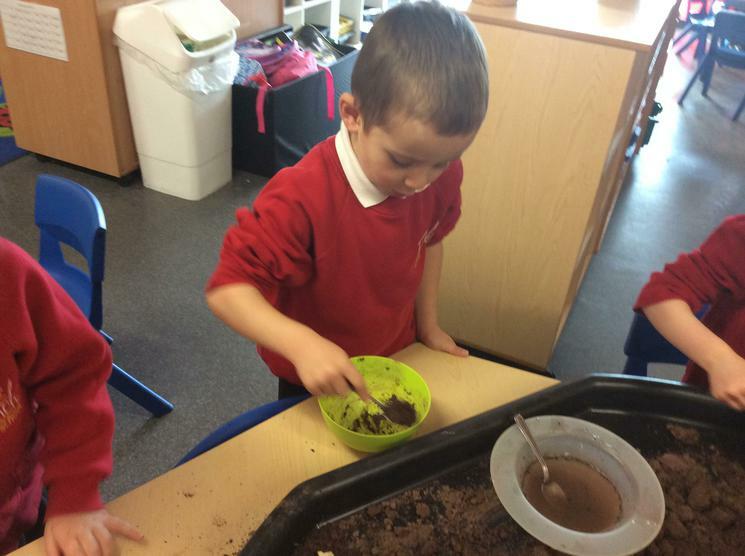 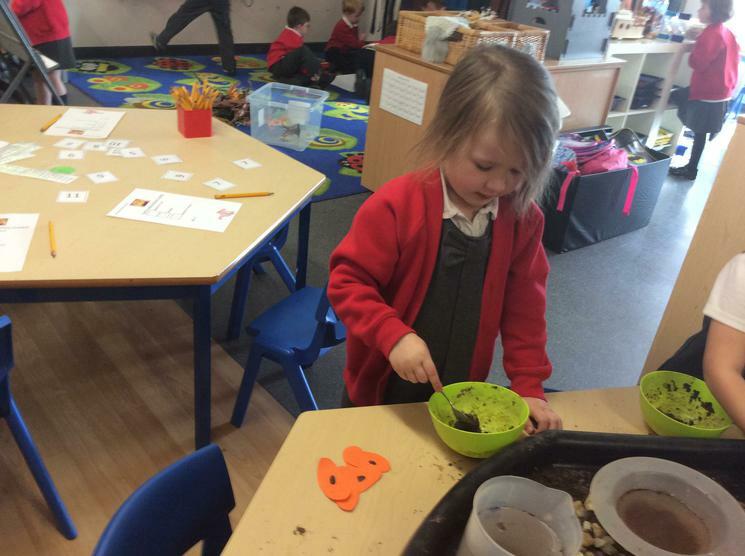 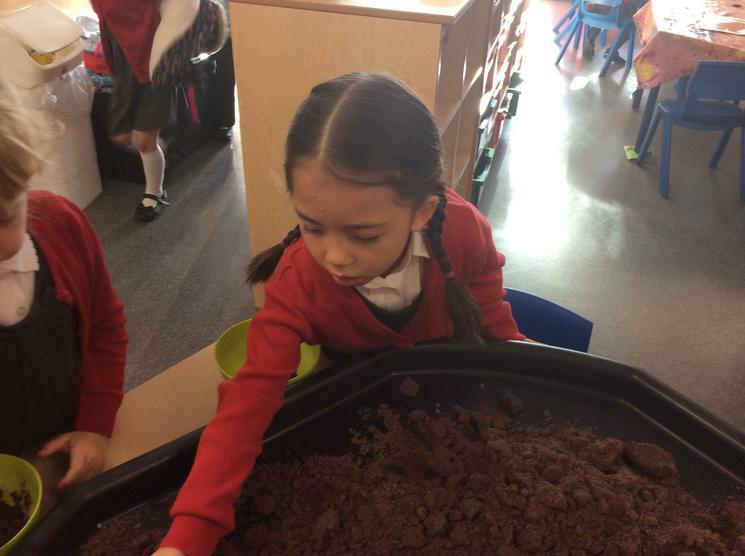 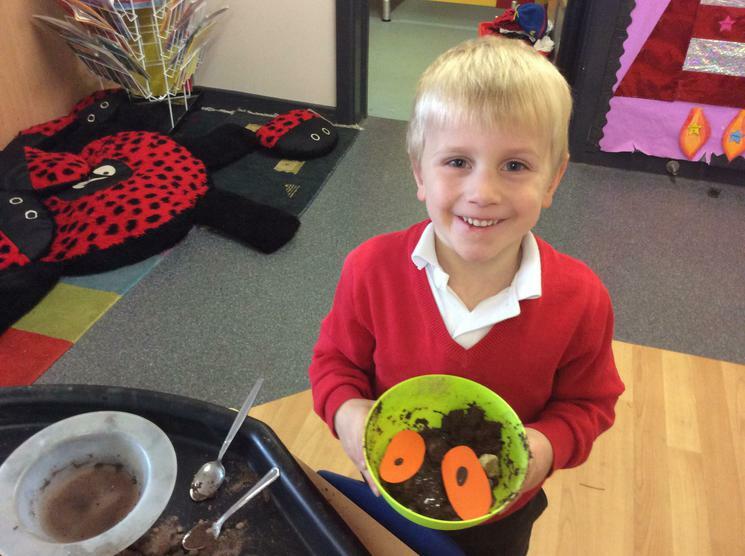 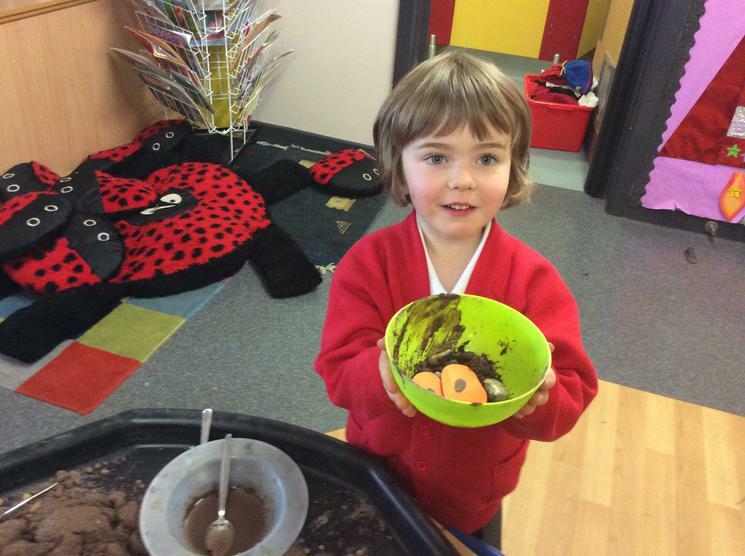 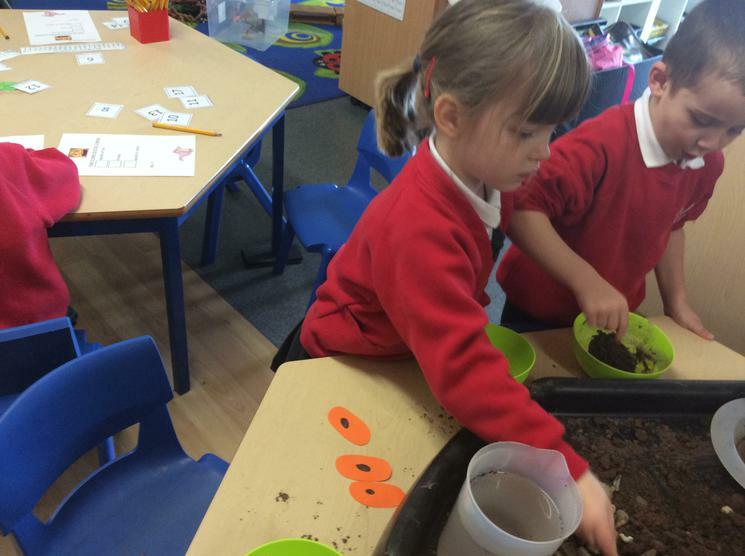 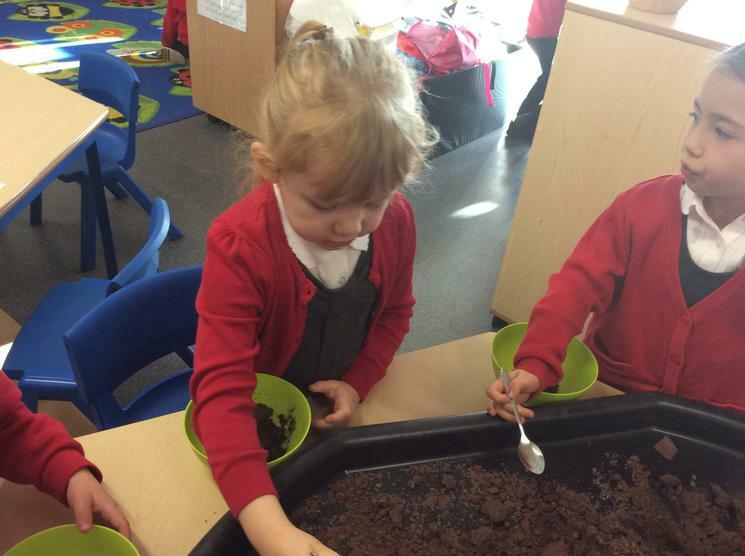 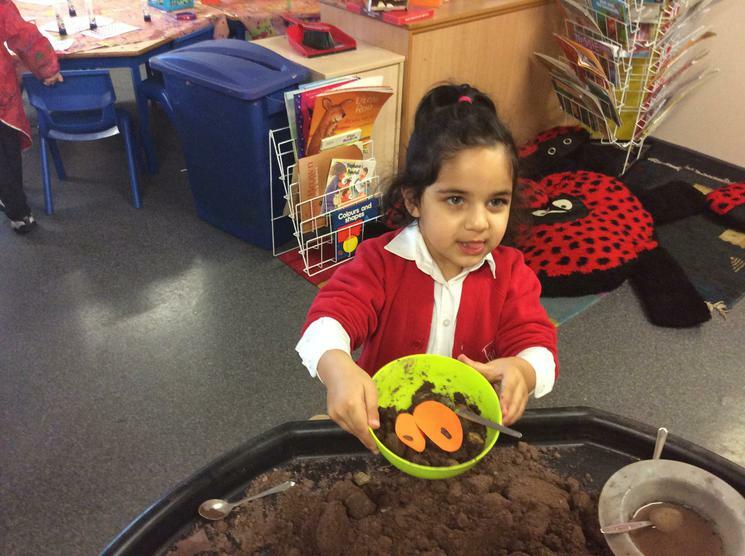 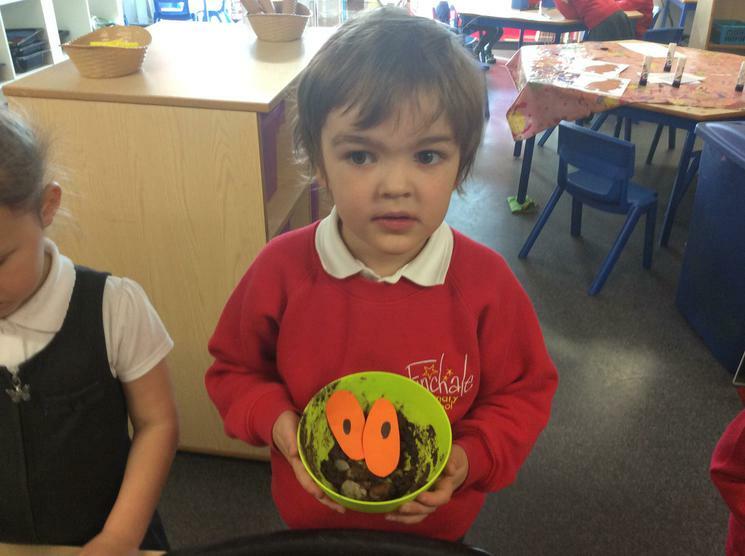 After our visit to Hardwick Park we designed our own Gruffalo Crumble. 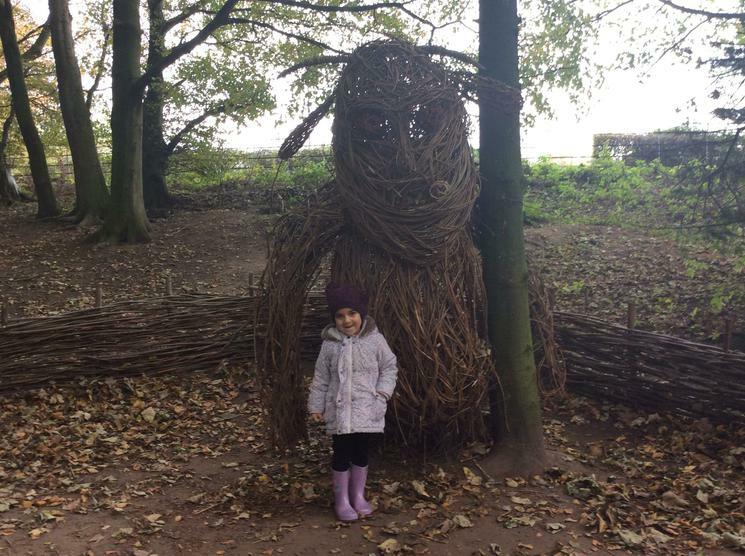 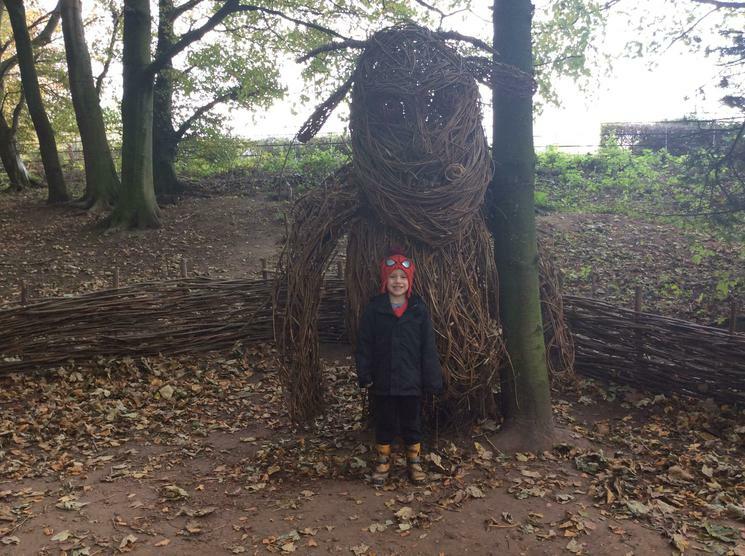 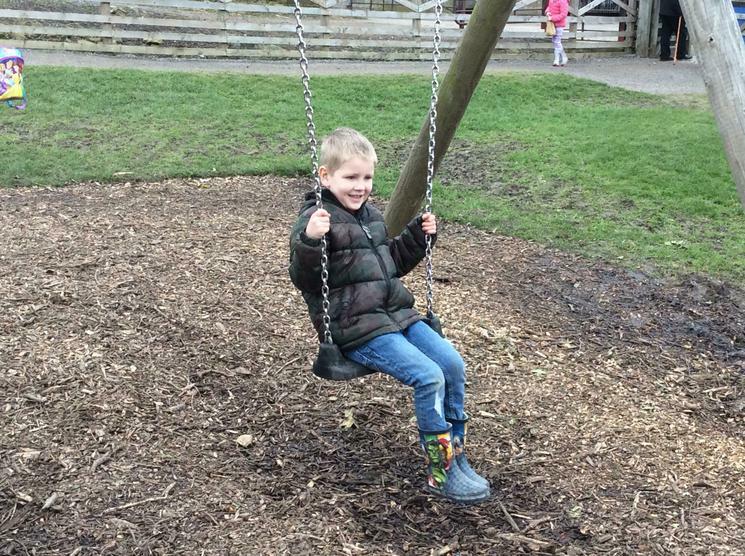 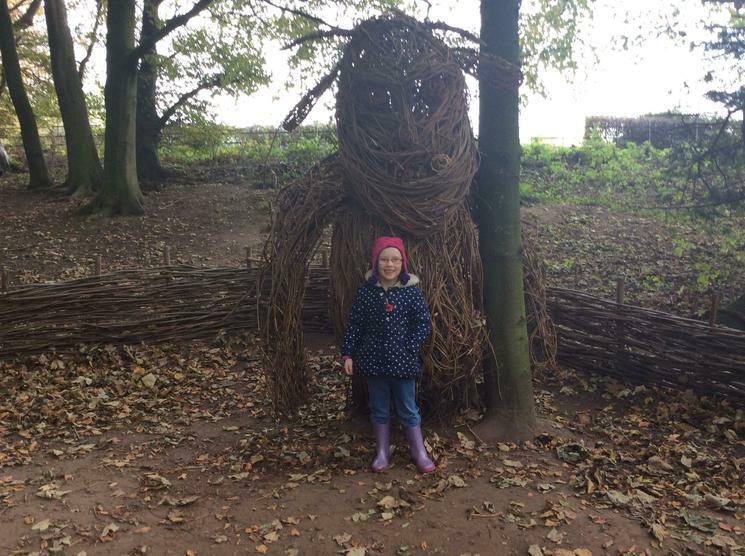 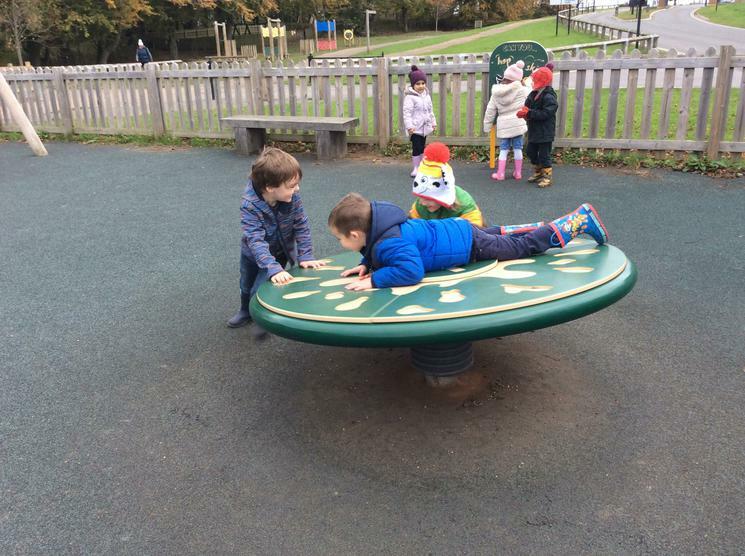 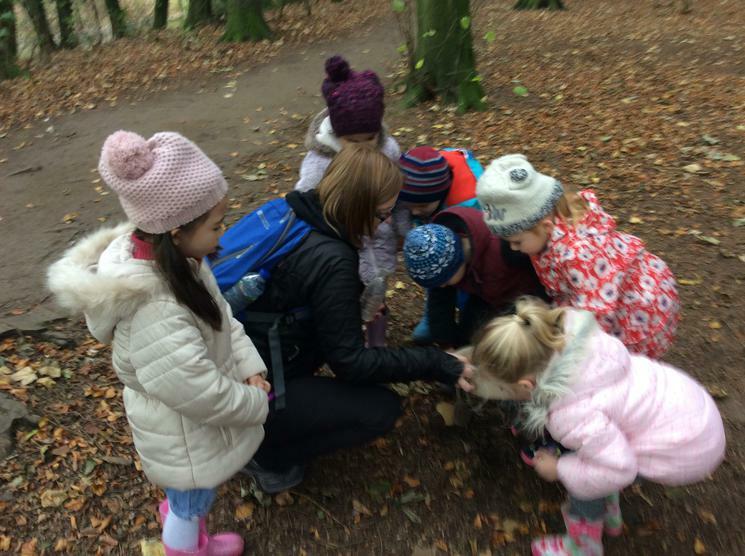 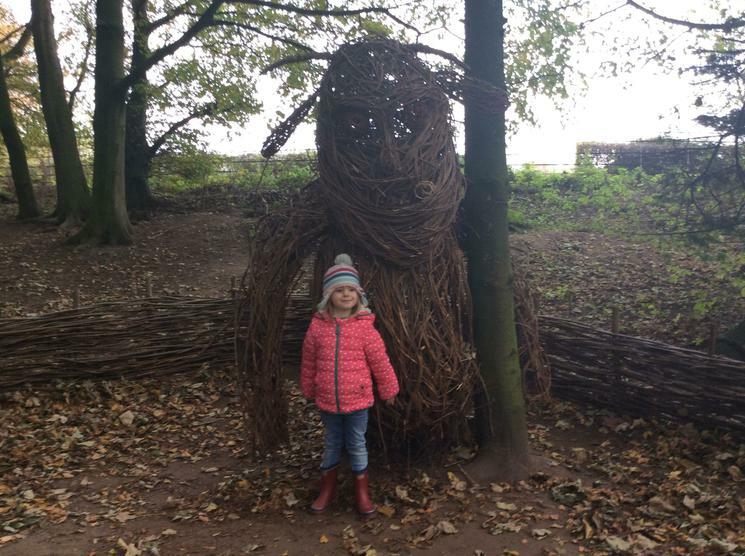 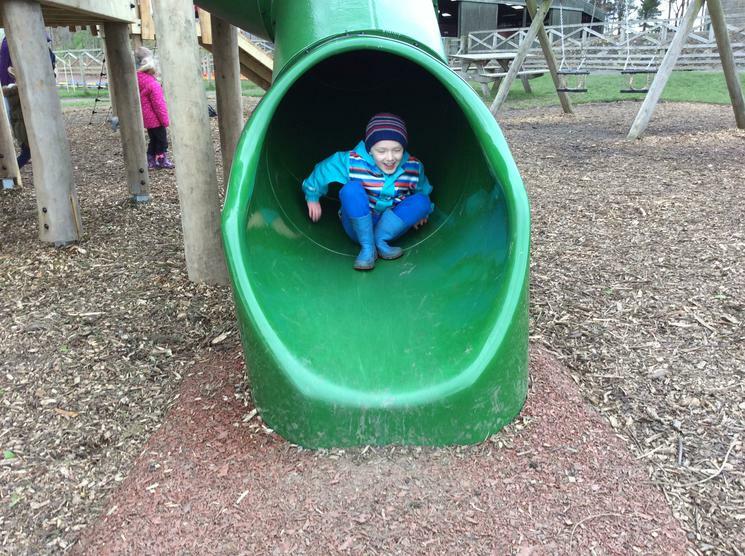 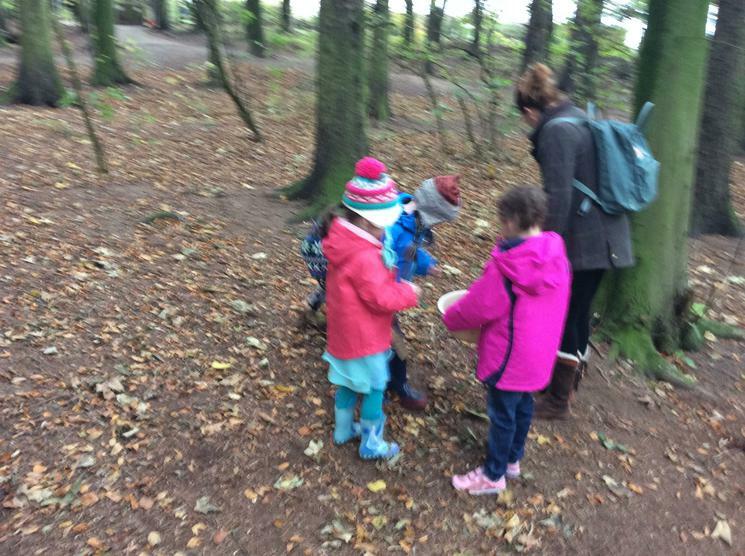 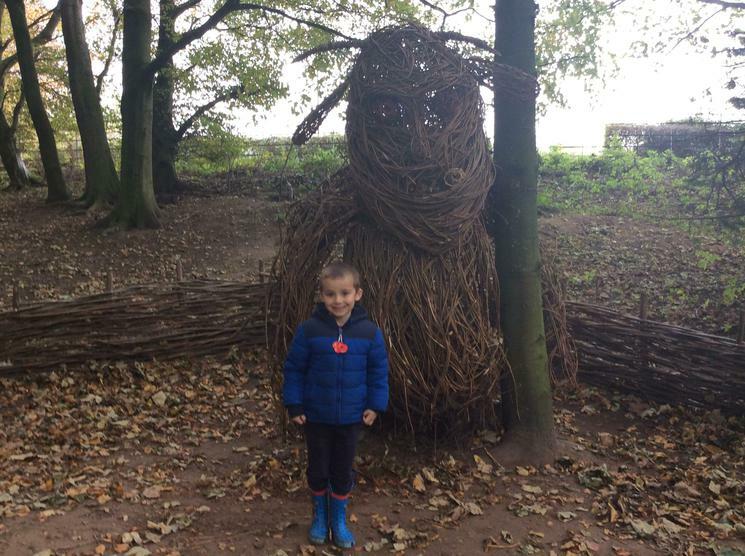 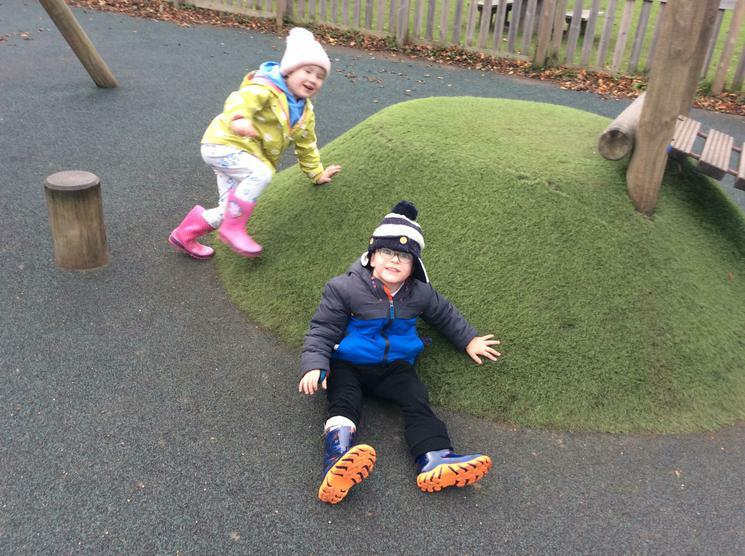 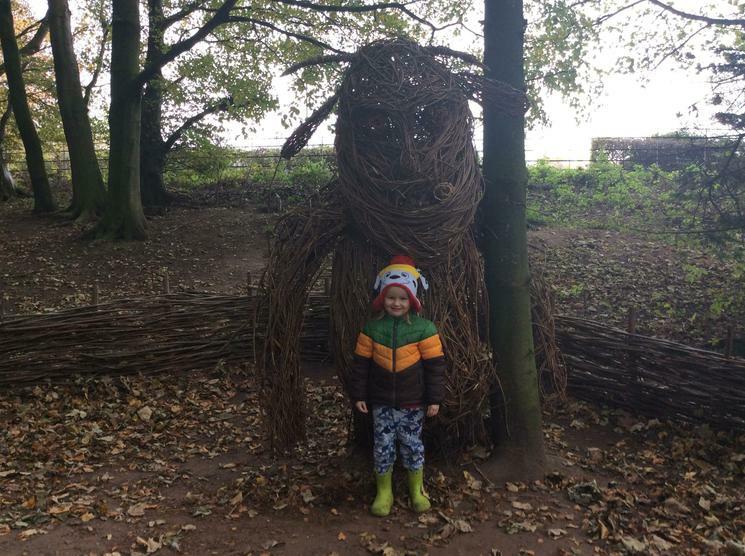 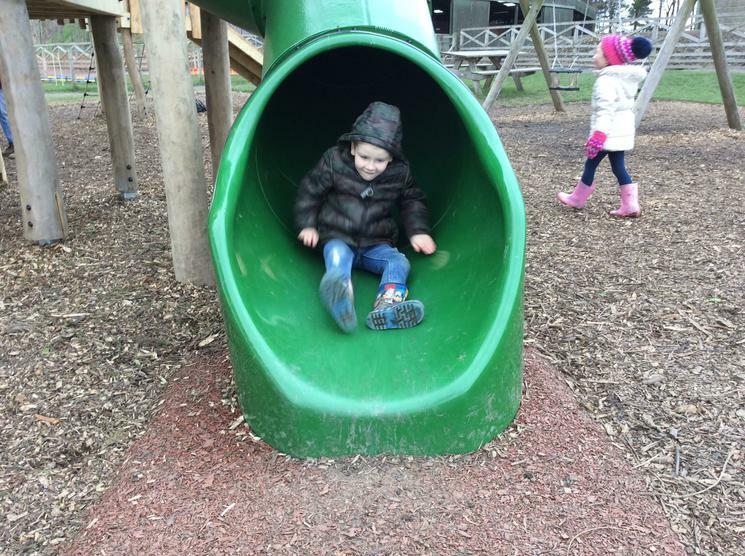 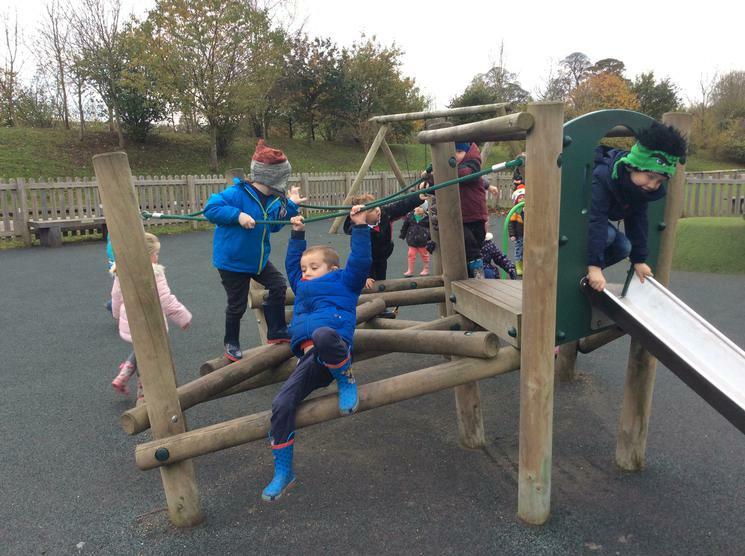 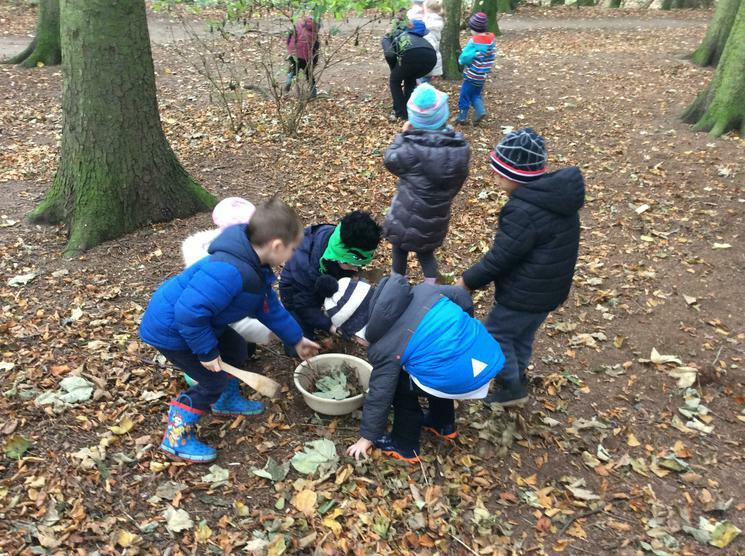 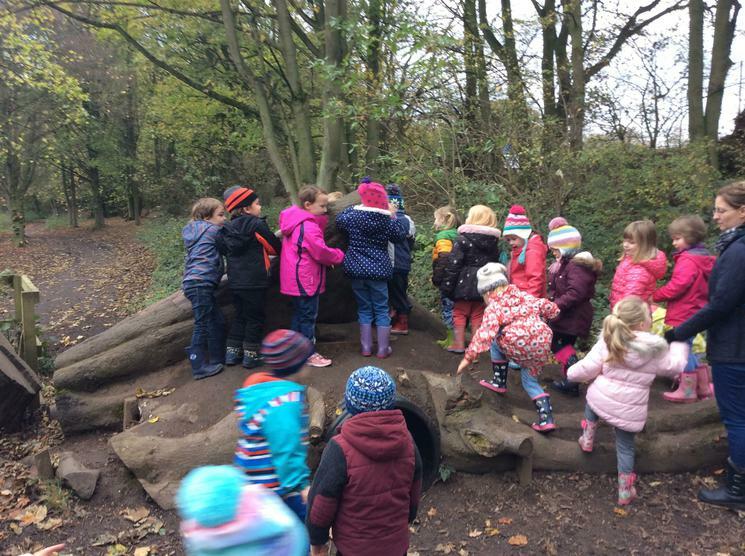 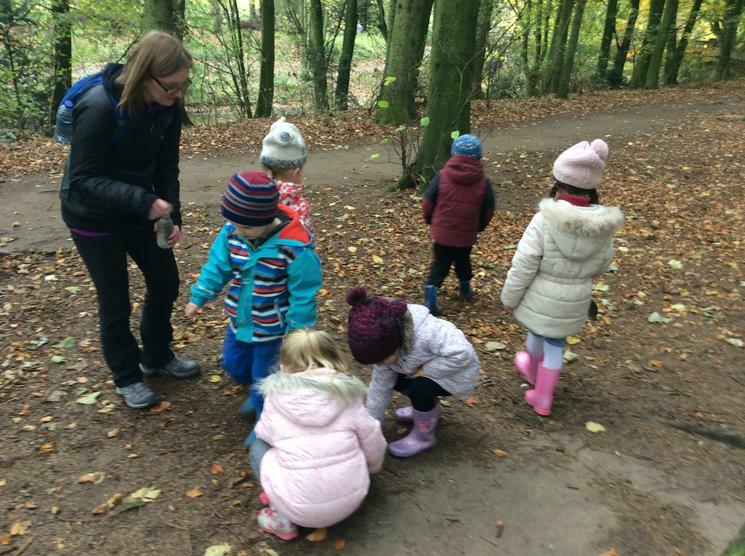 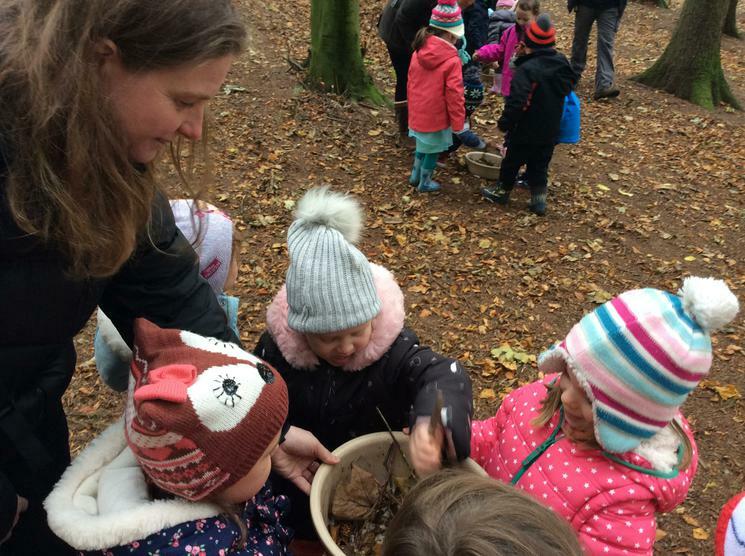 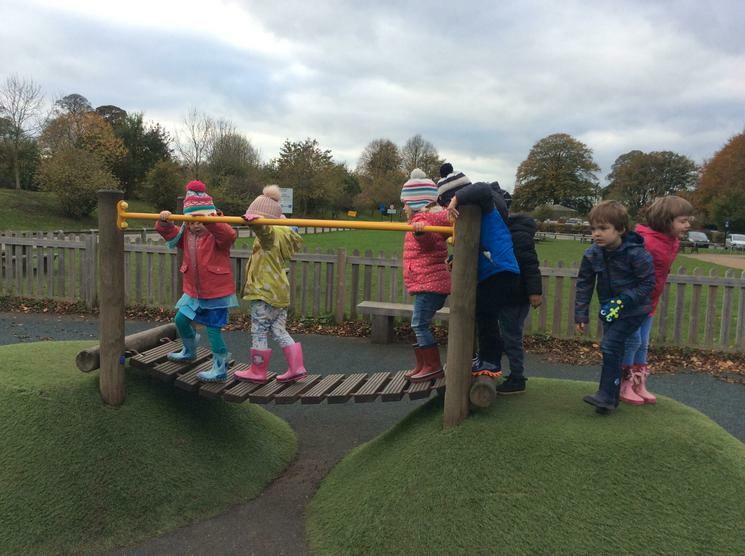 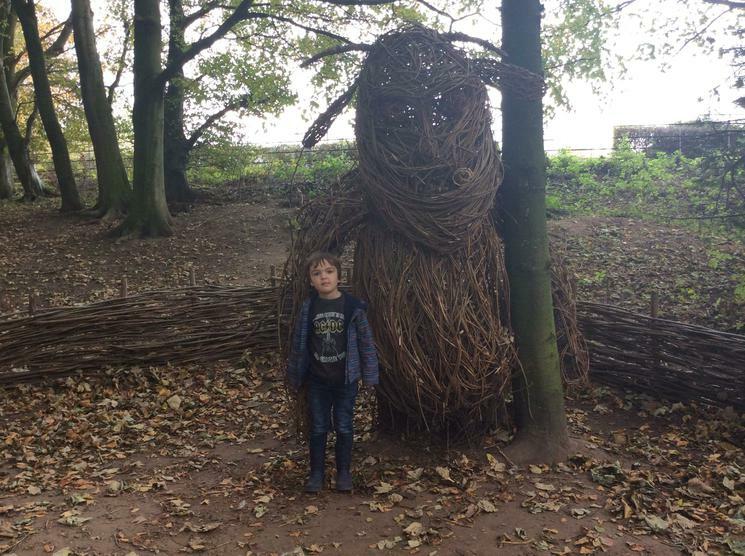 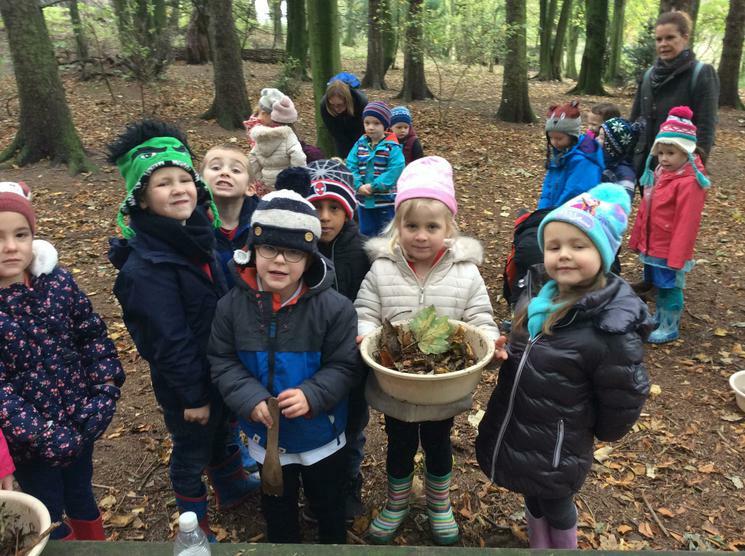 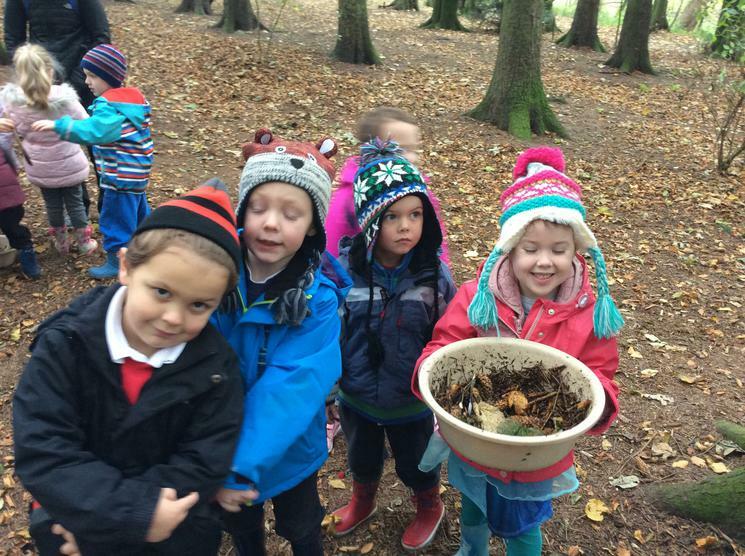 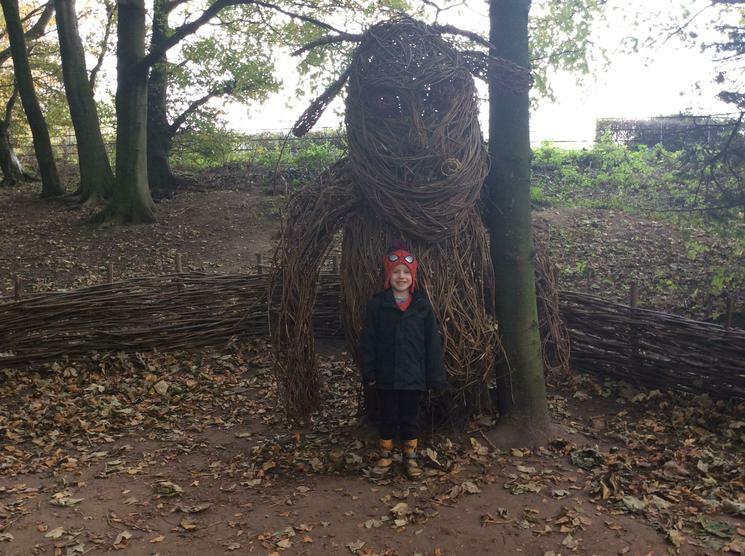 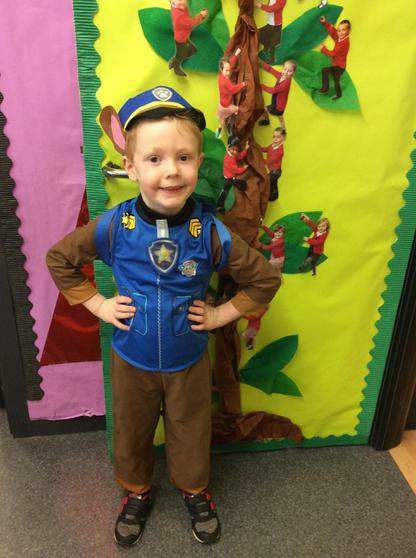 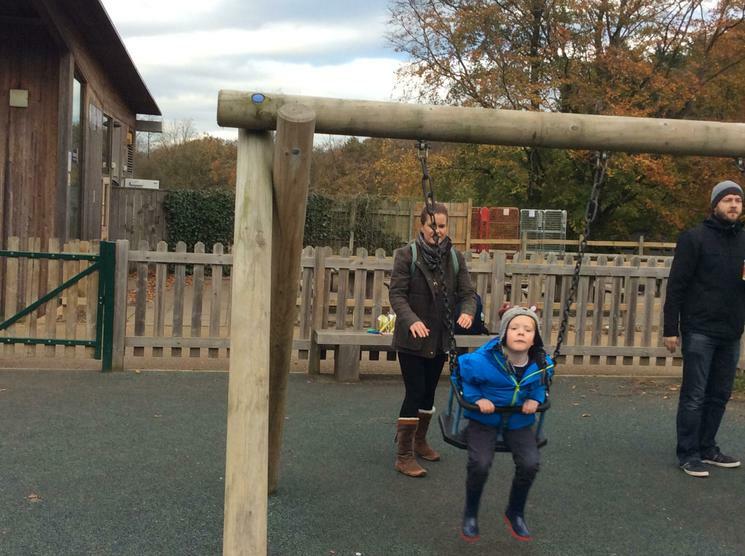 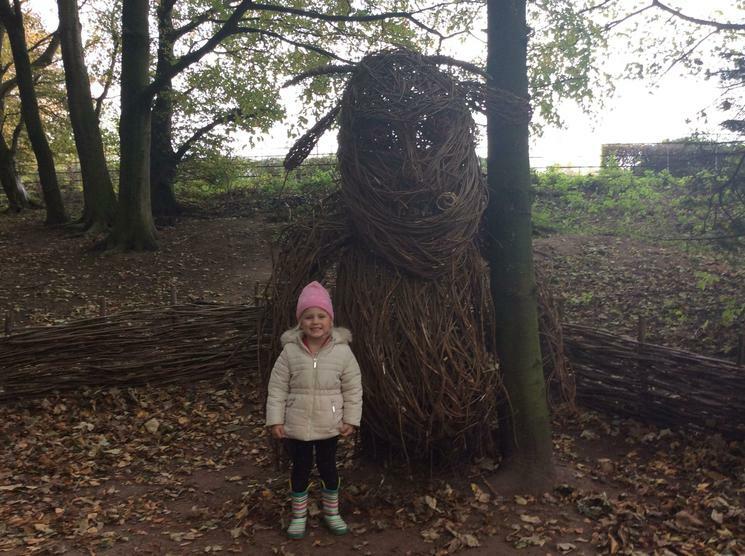 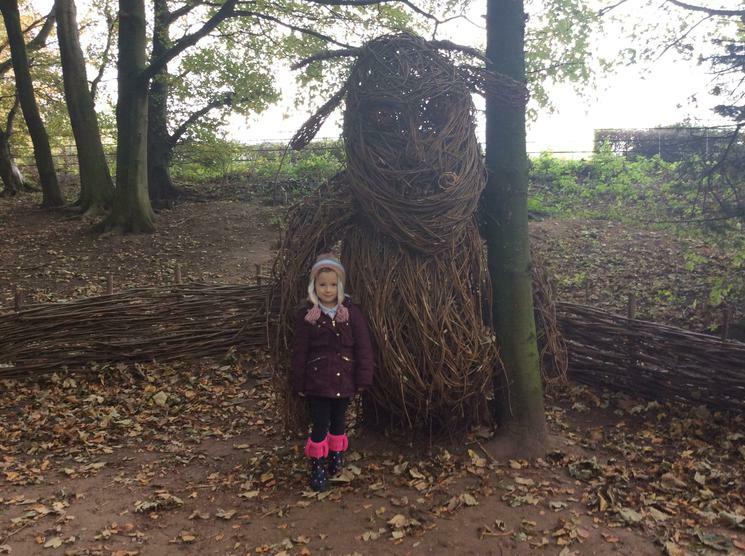 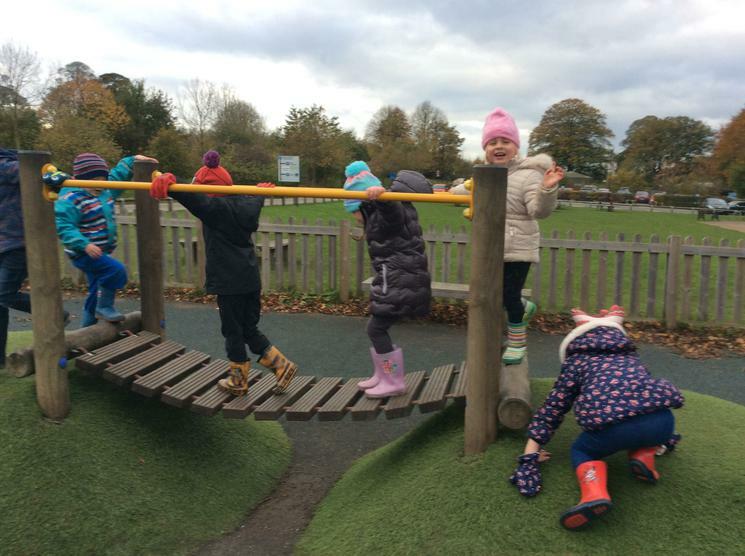 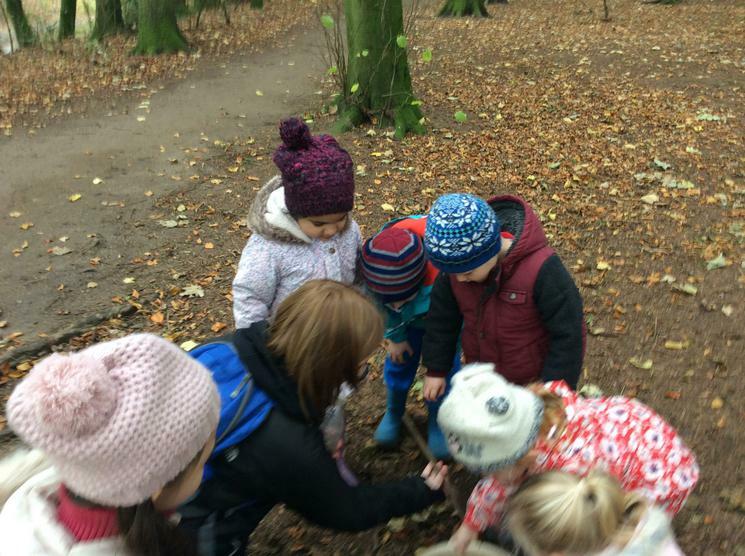 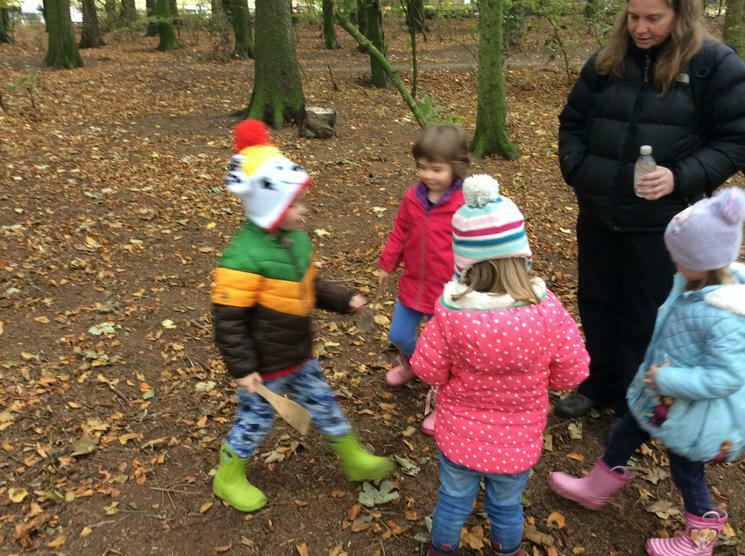 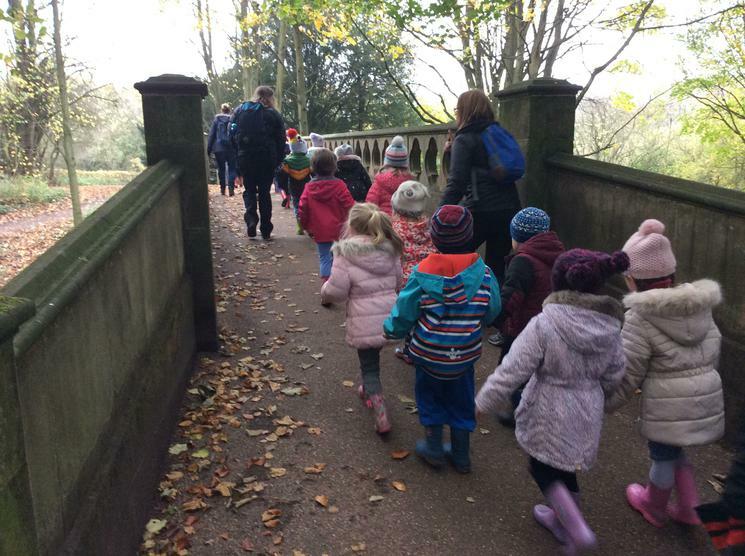 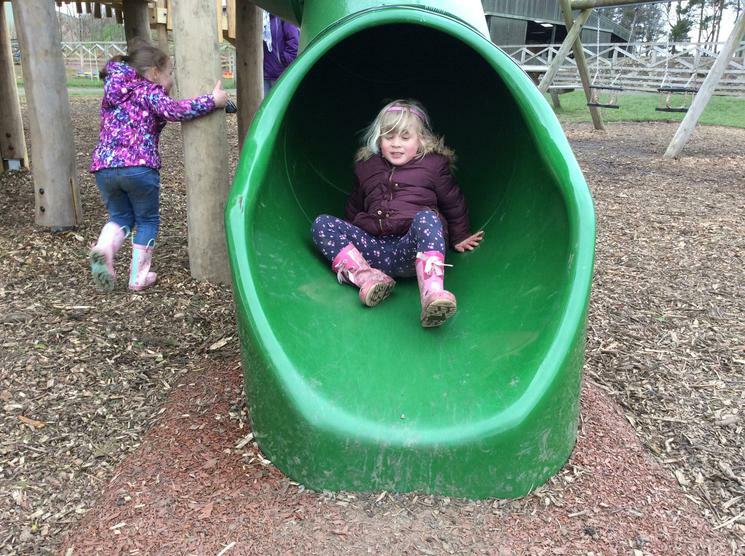 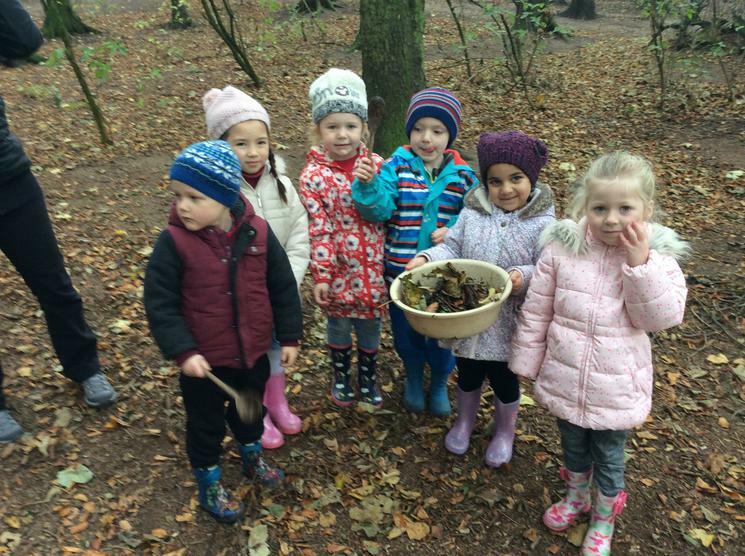 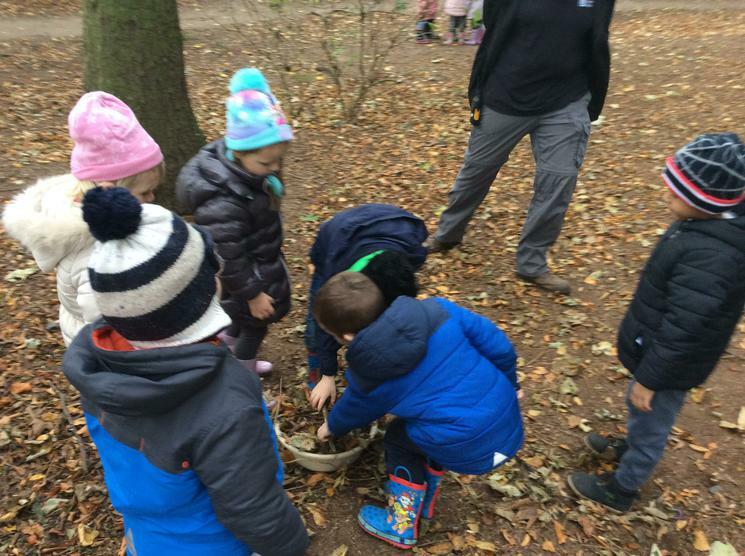 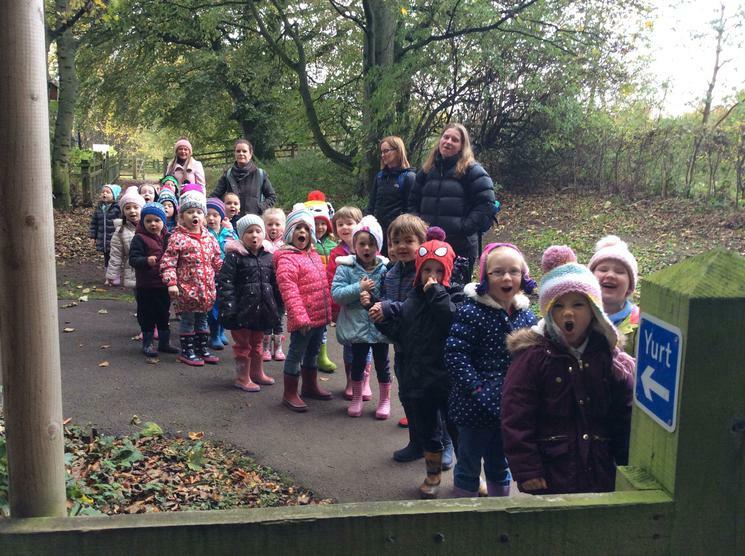 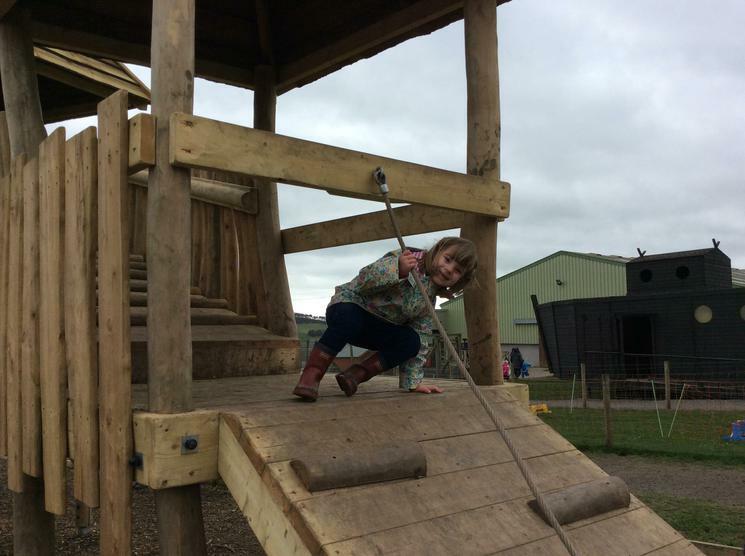 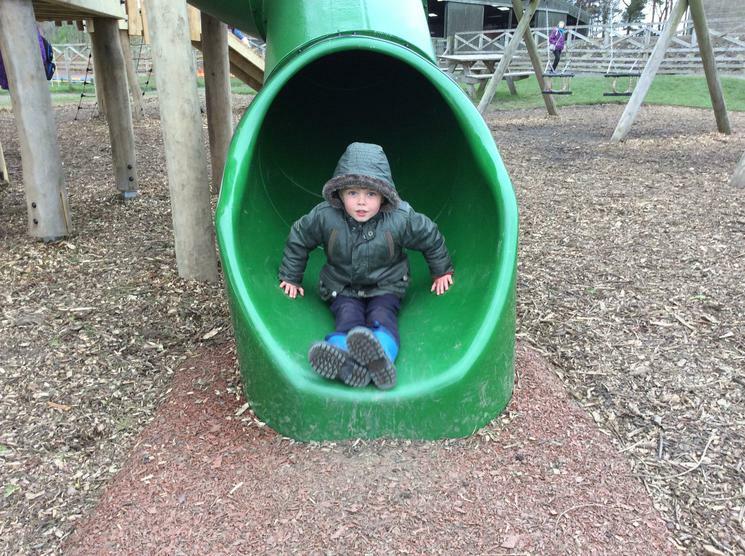 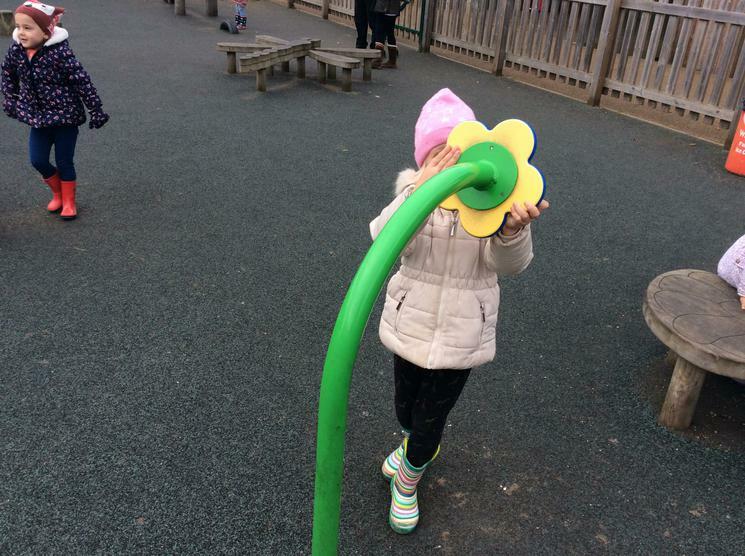 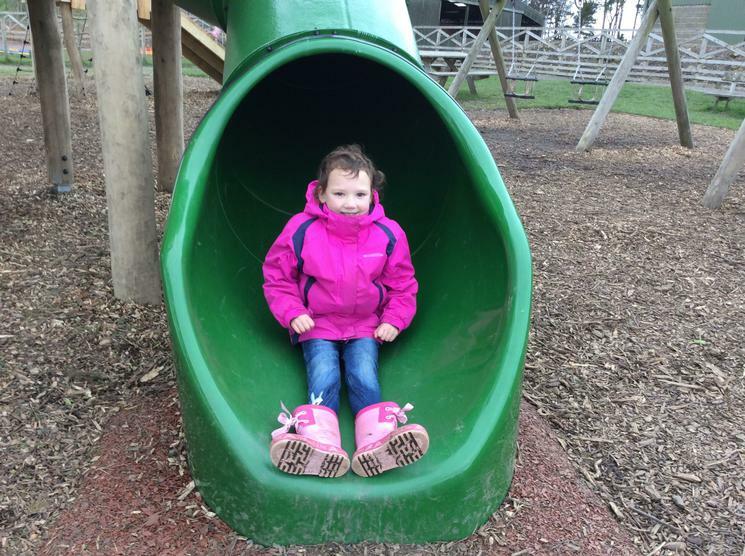 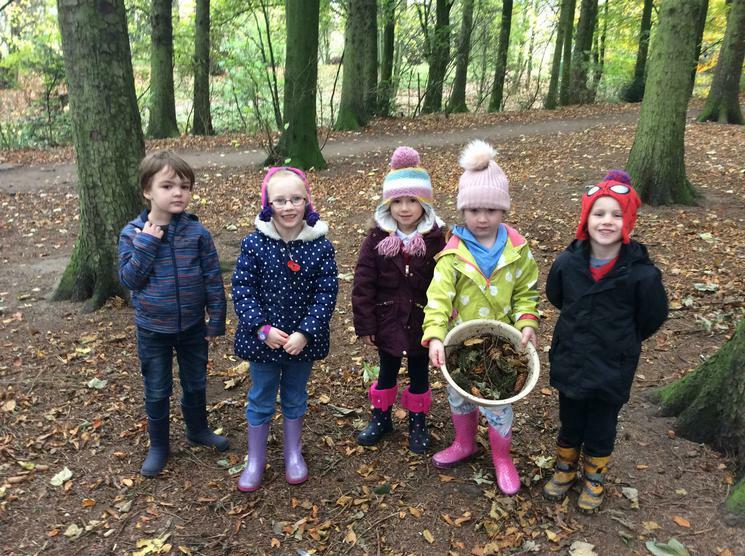 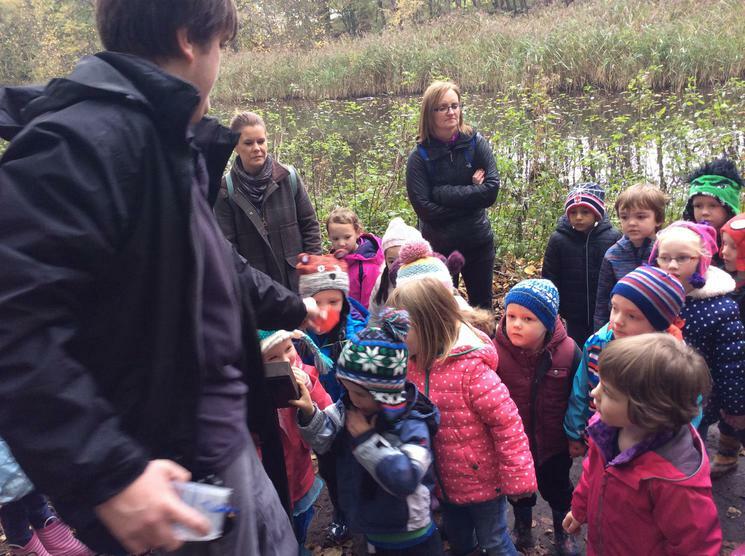 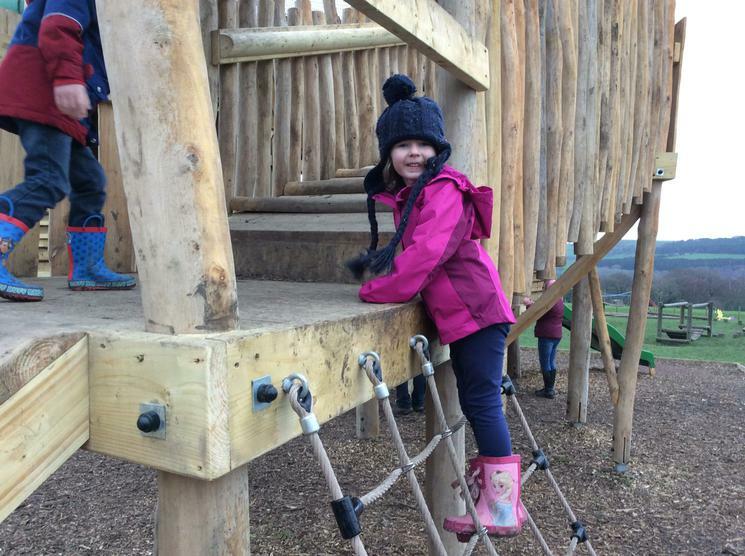 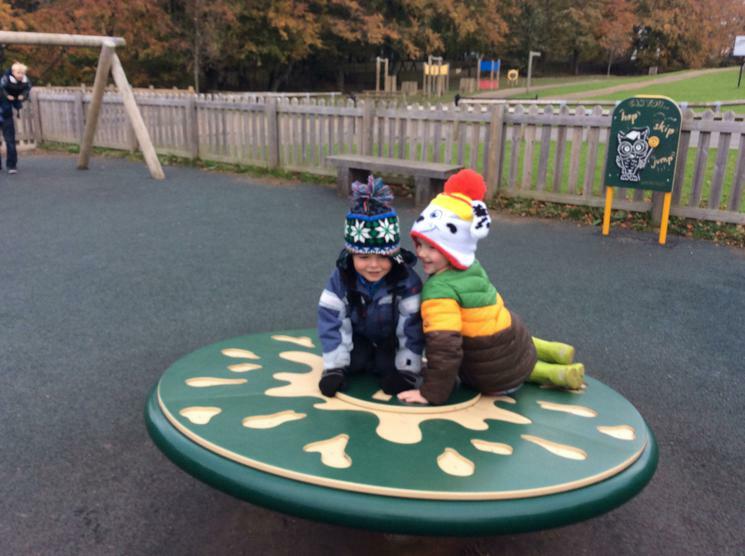 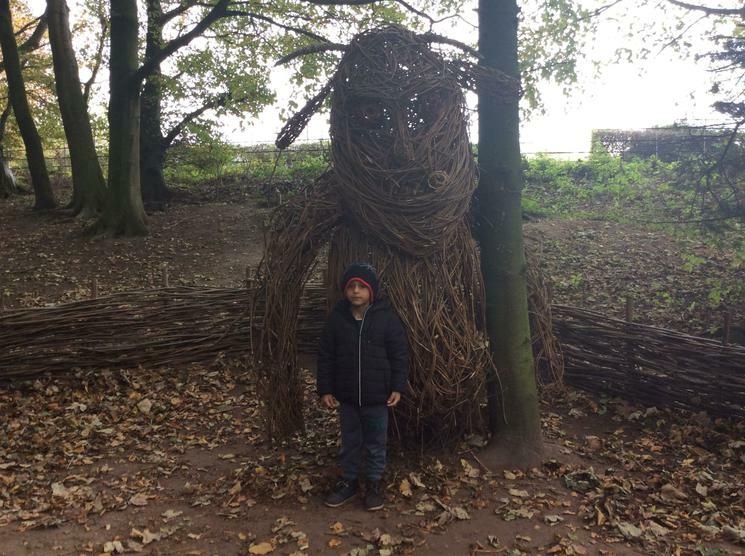 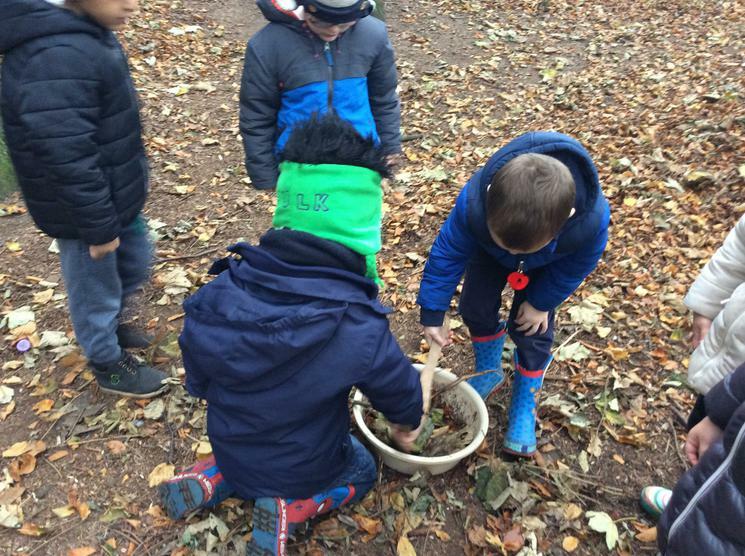 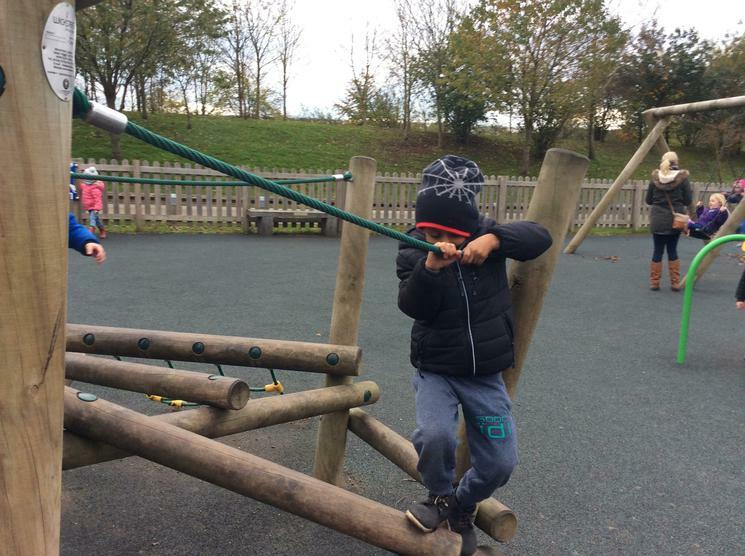 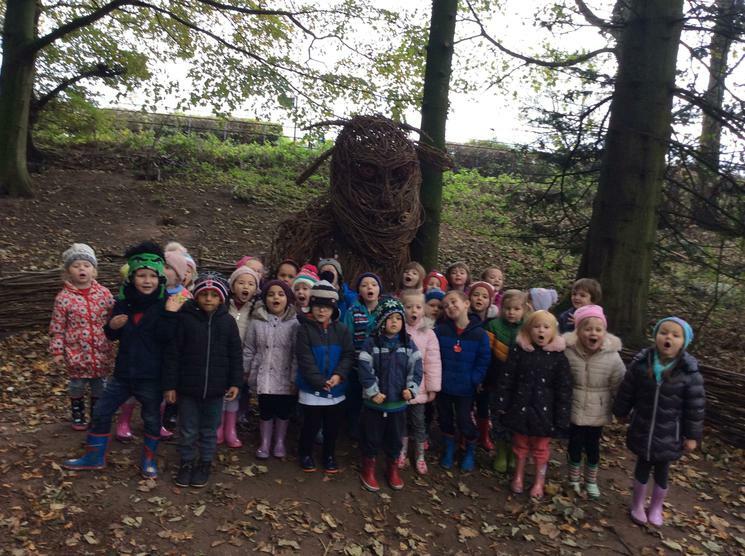 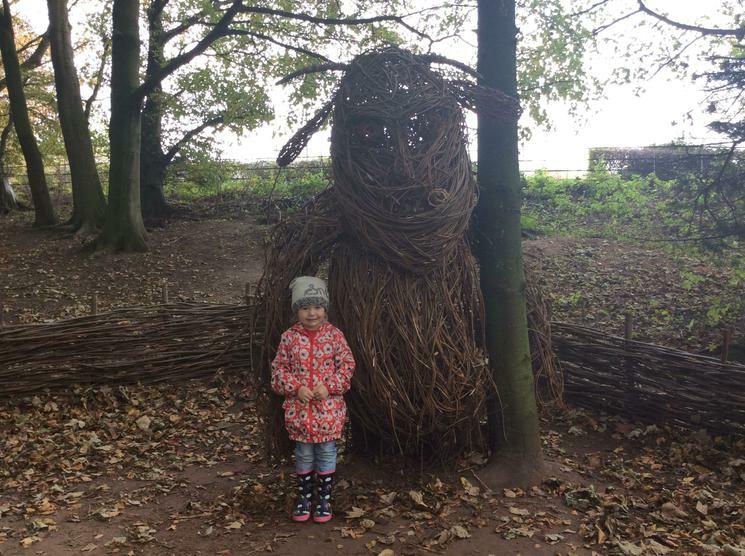 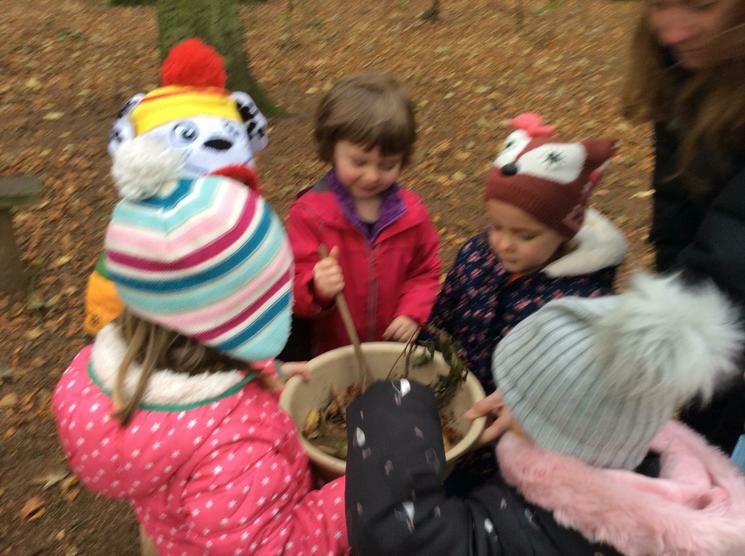 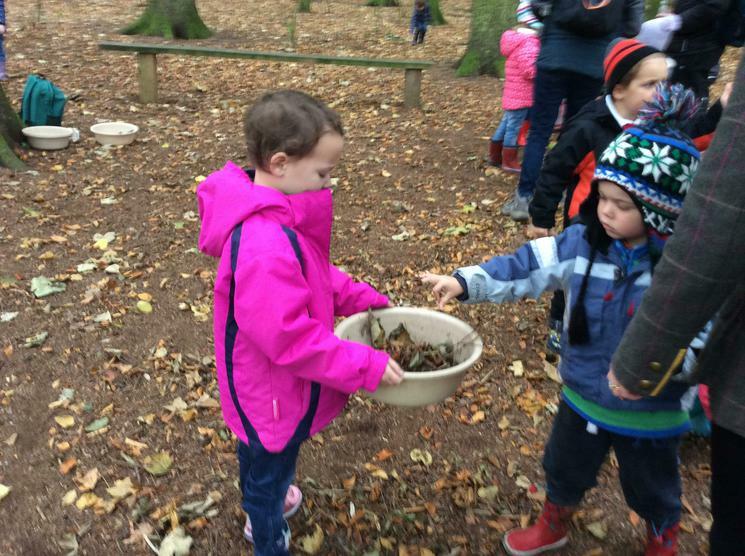 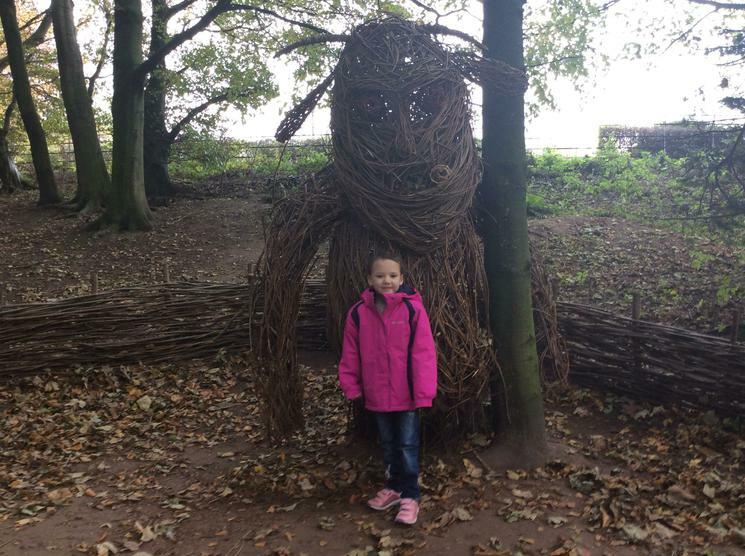 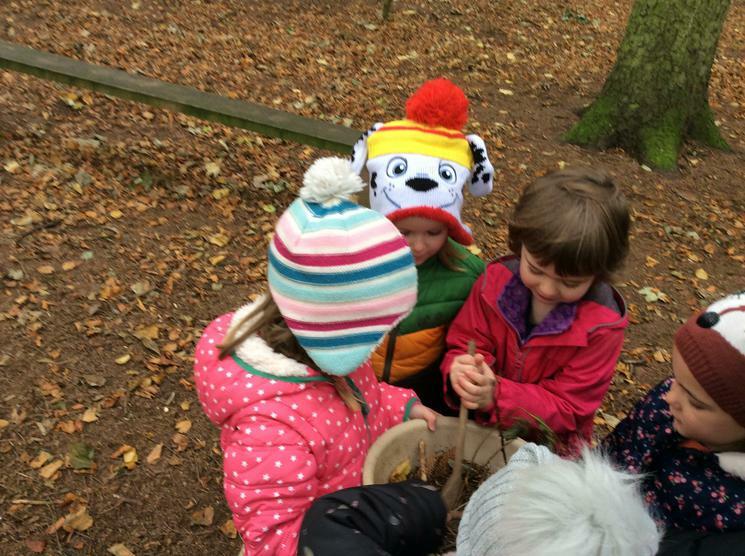 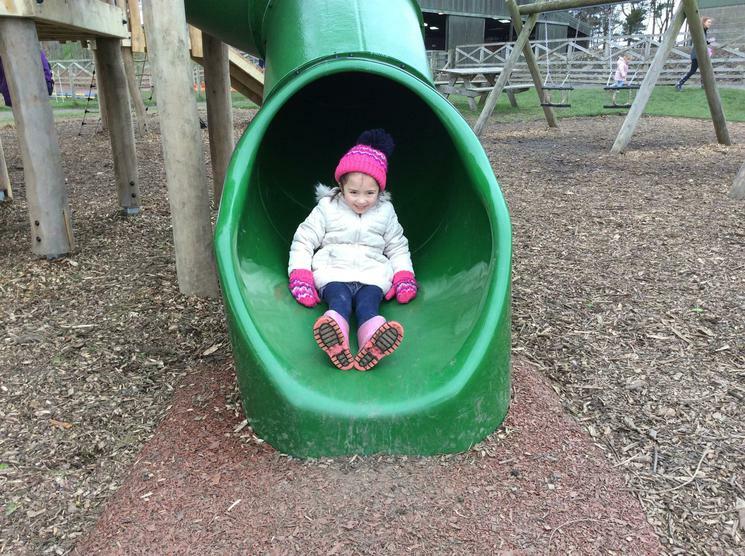 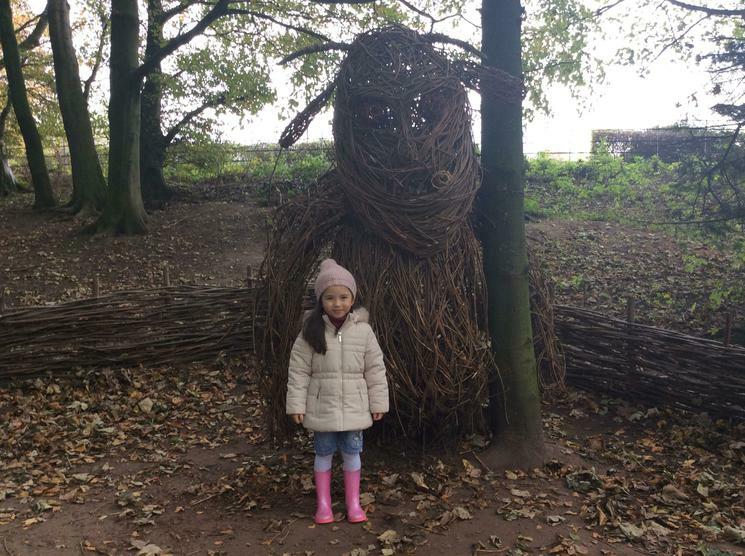 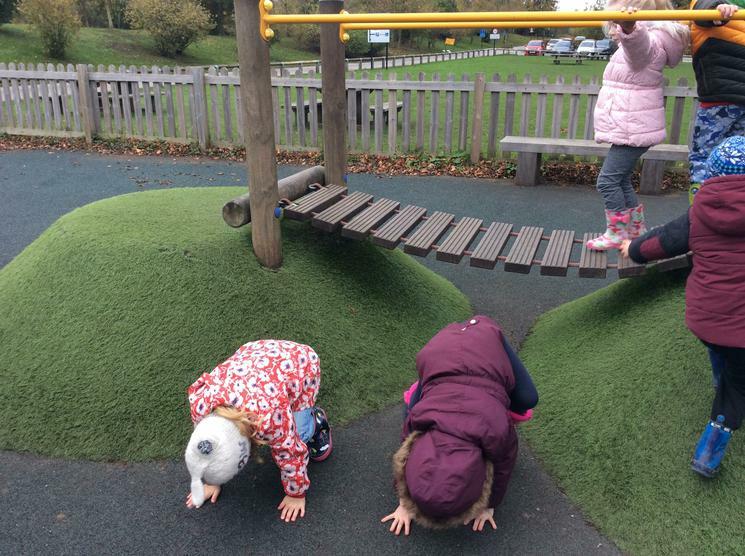 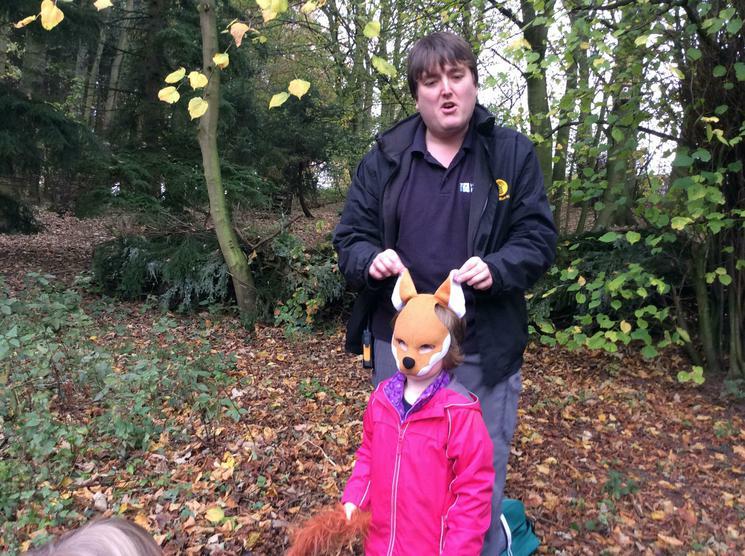 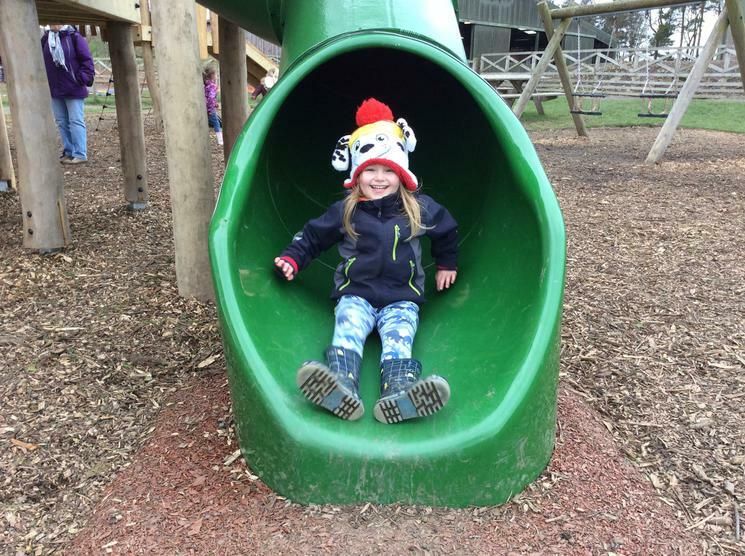 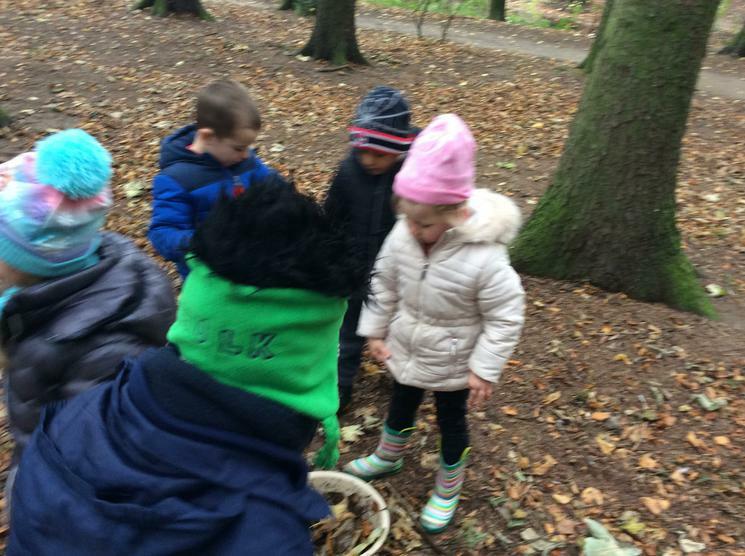 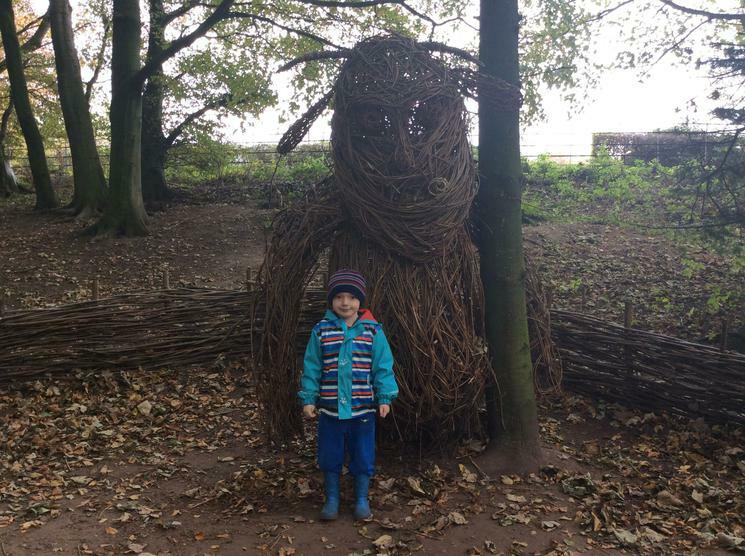 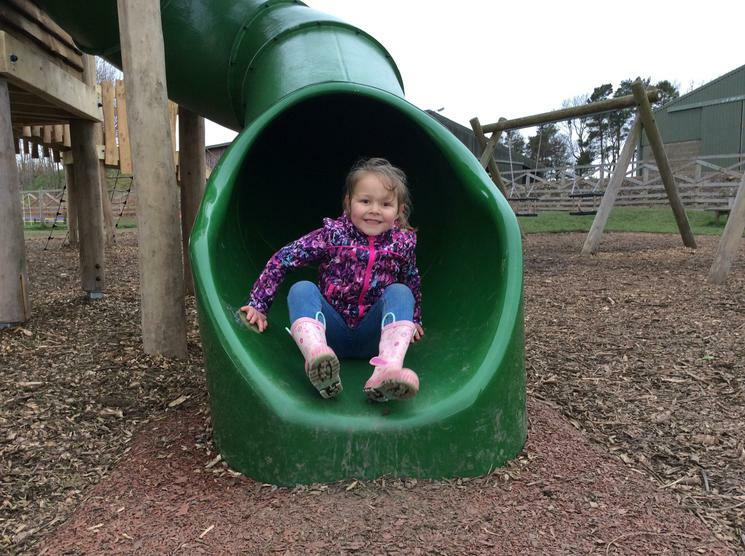 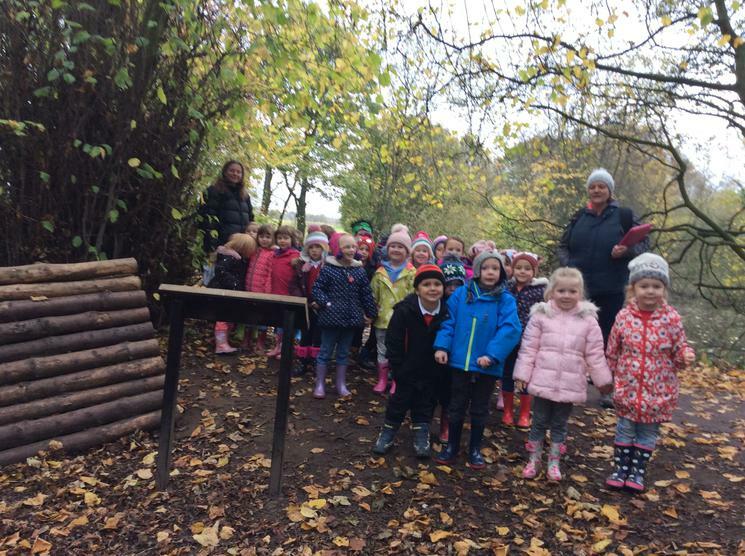 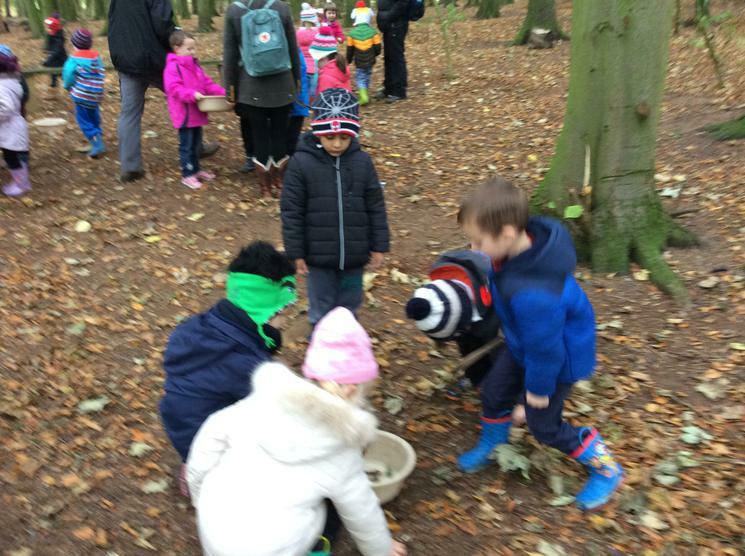 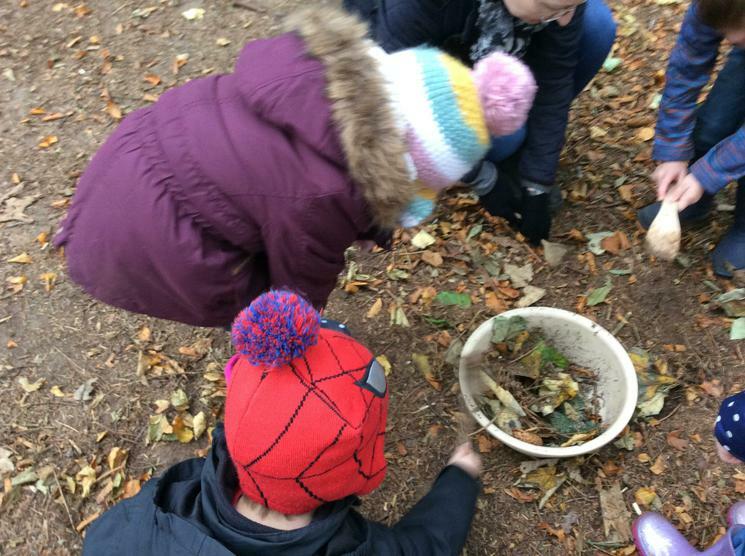 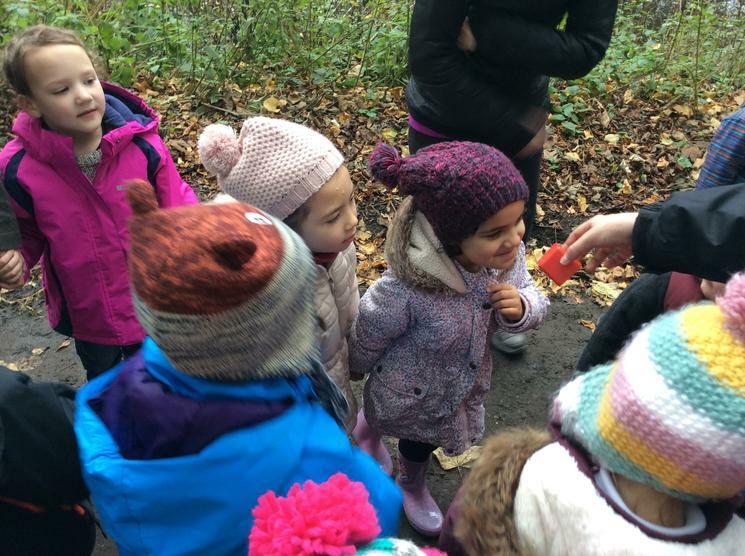 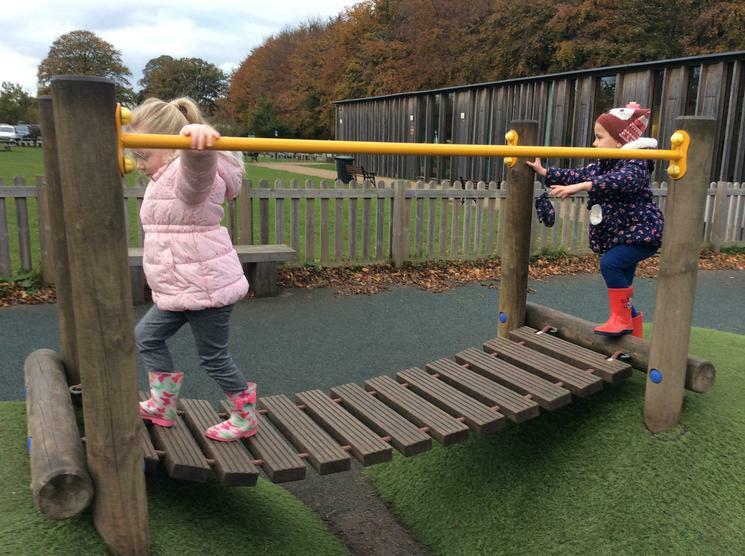 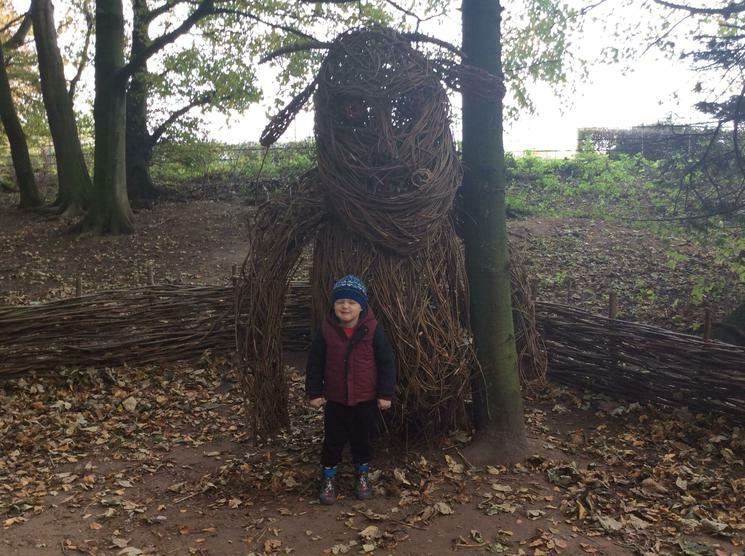 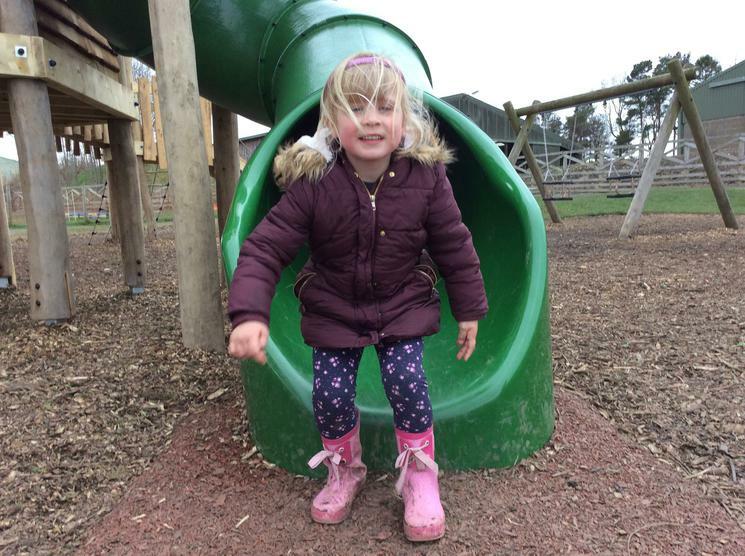 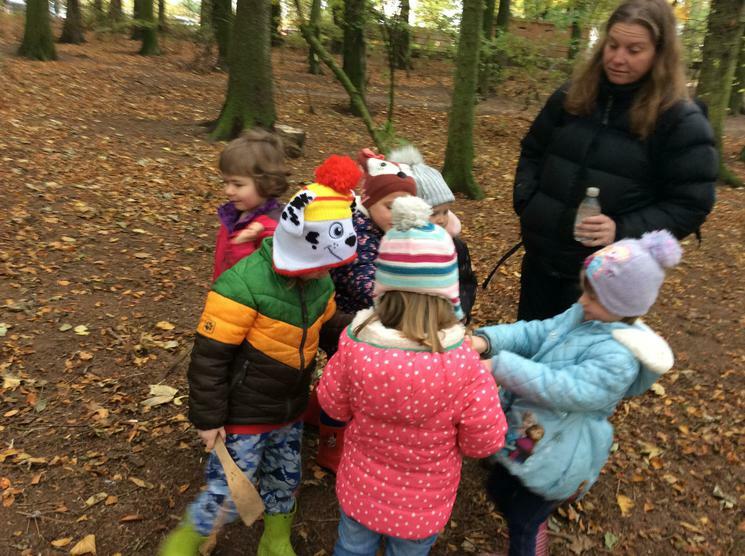 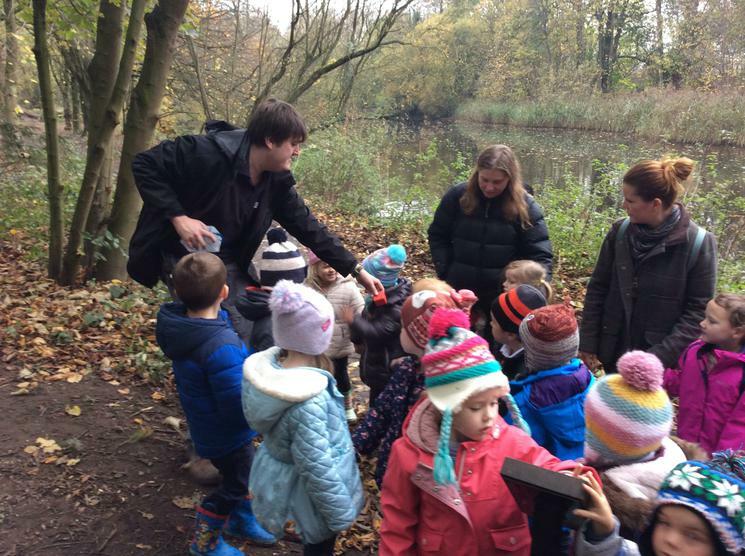 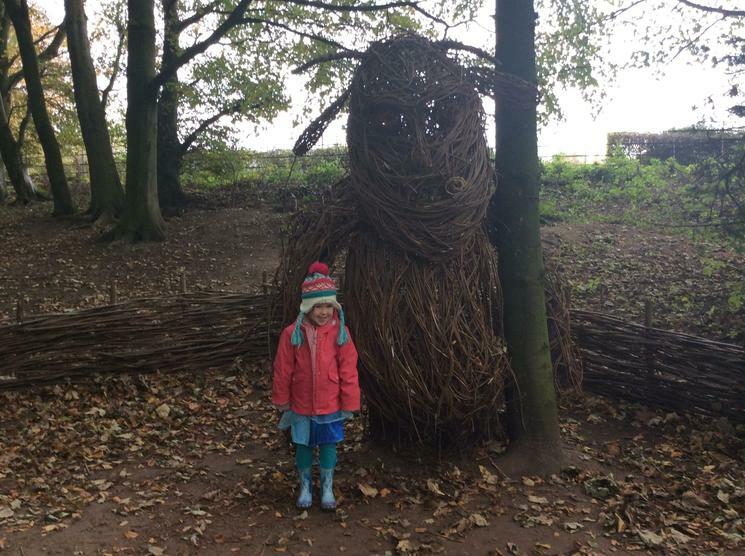 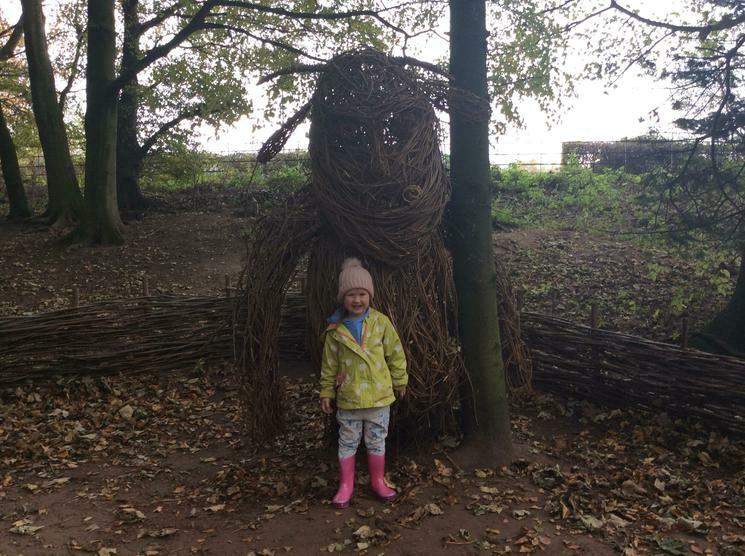 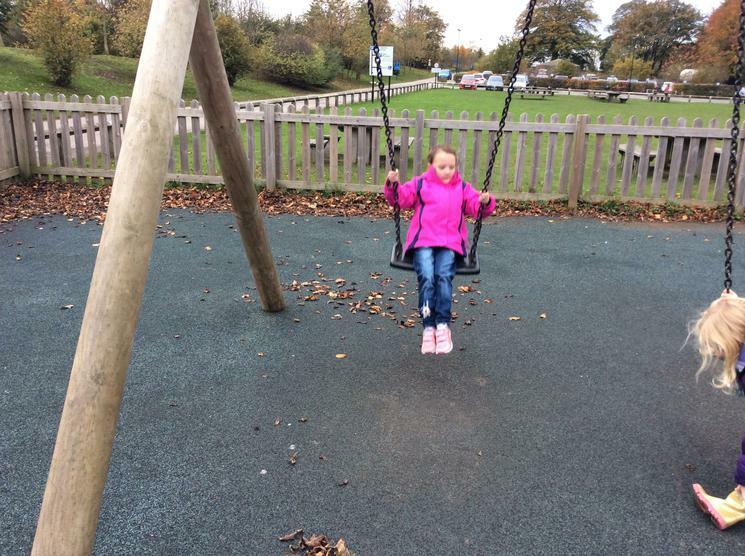 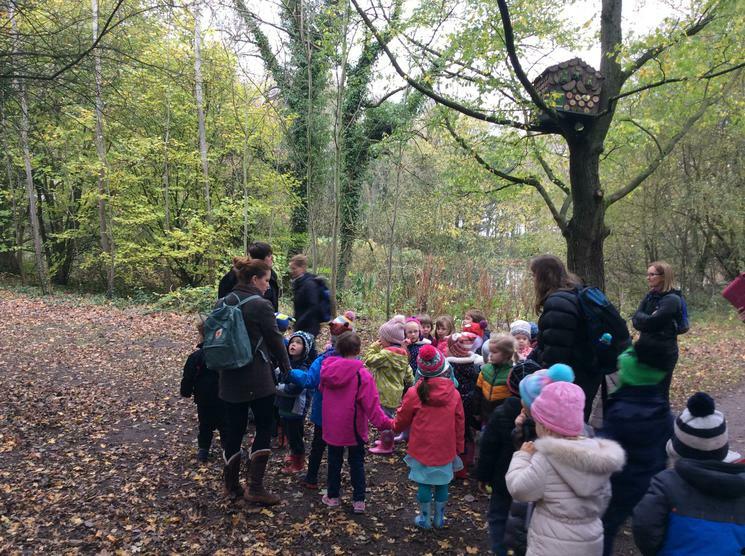 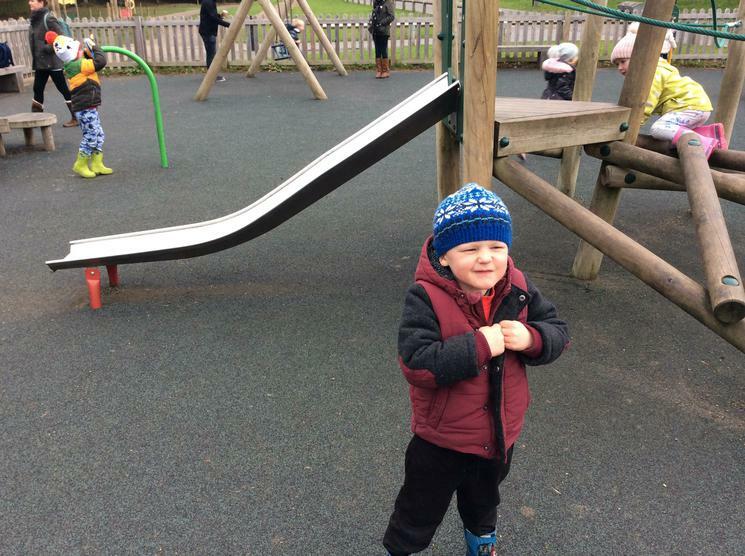 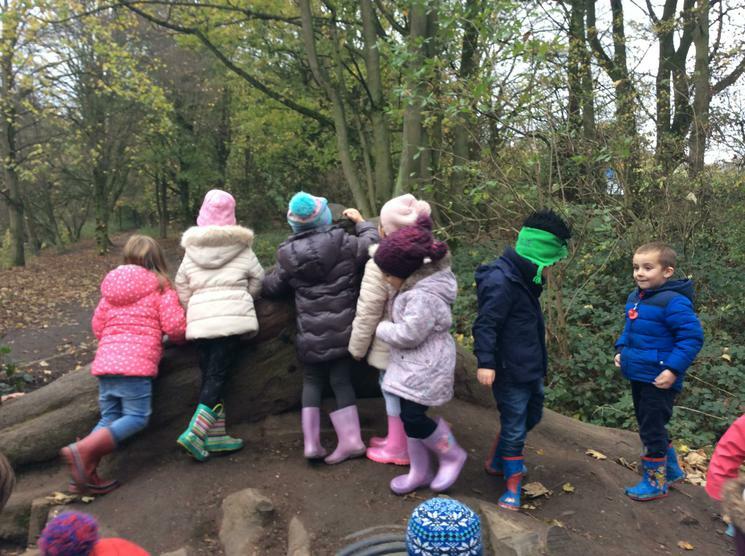 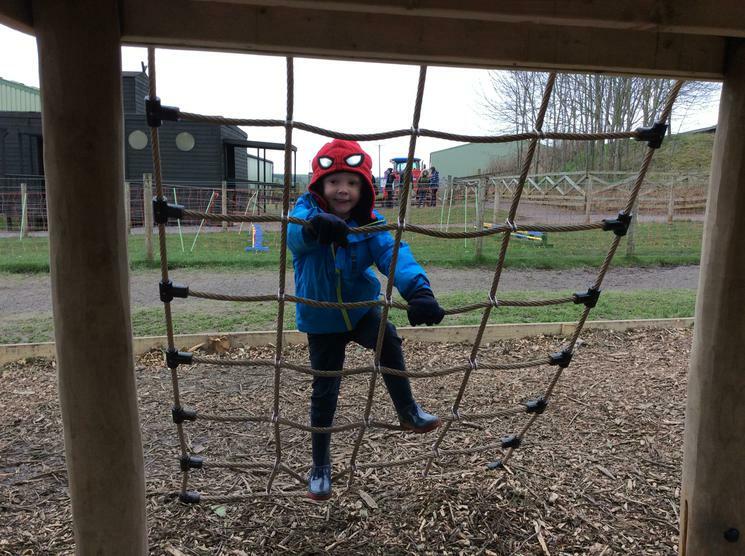 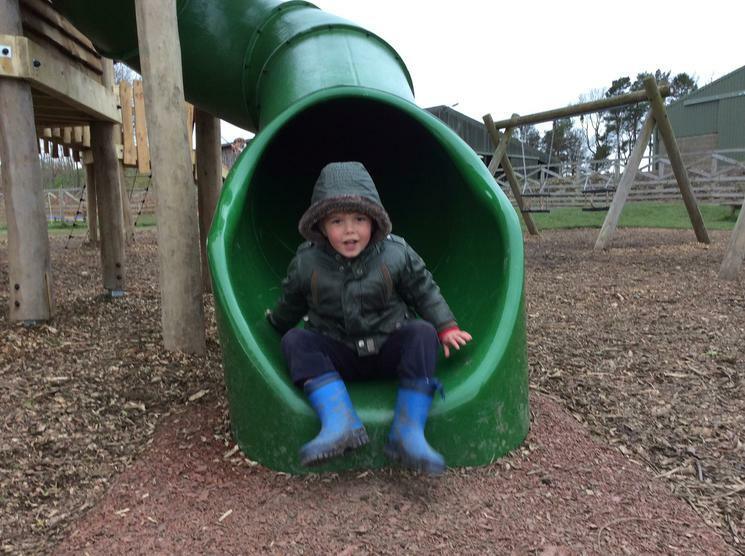 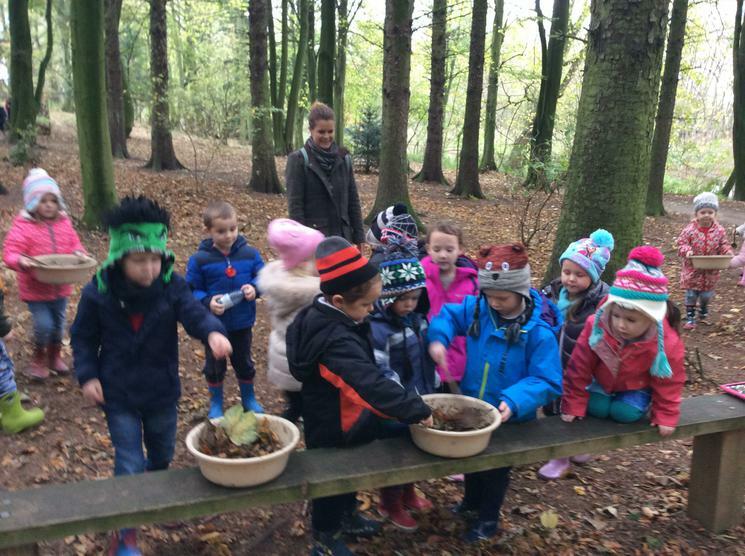 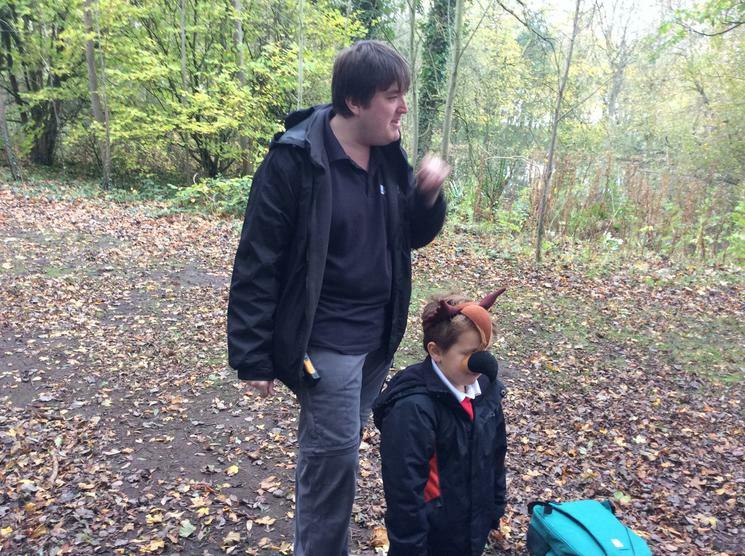 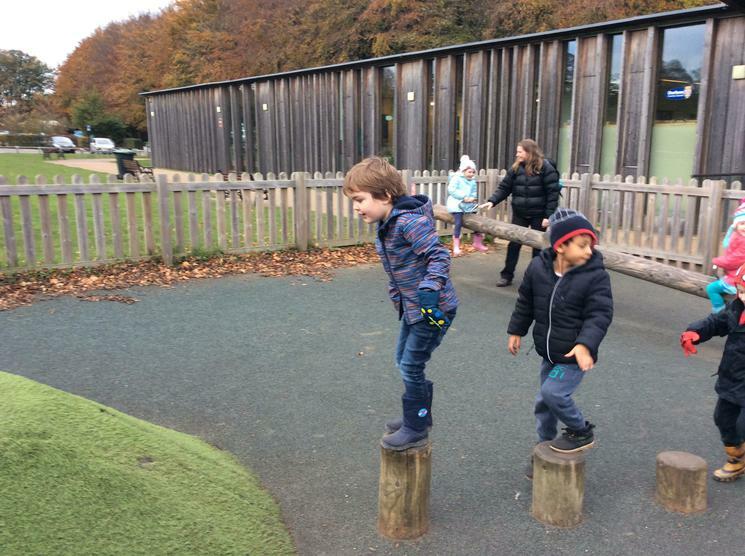 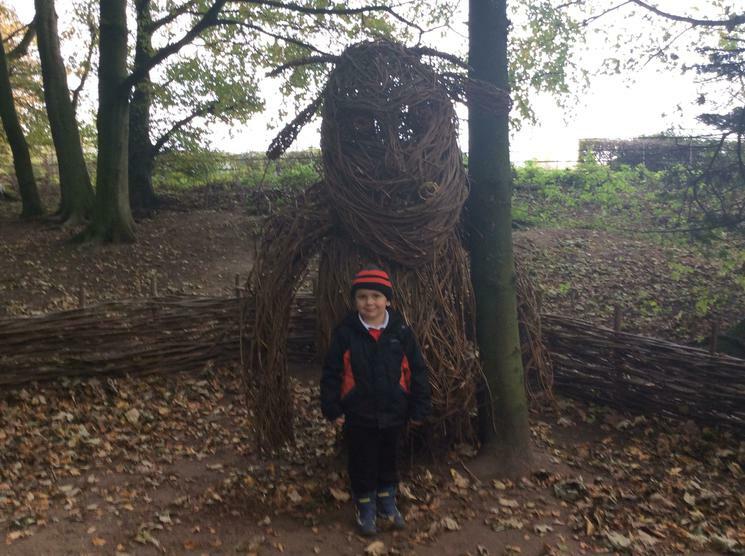 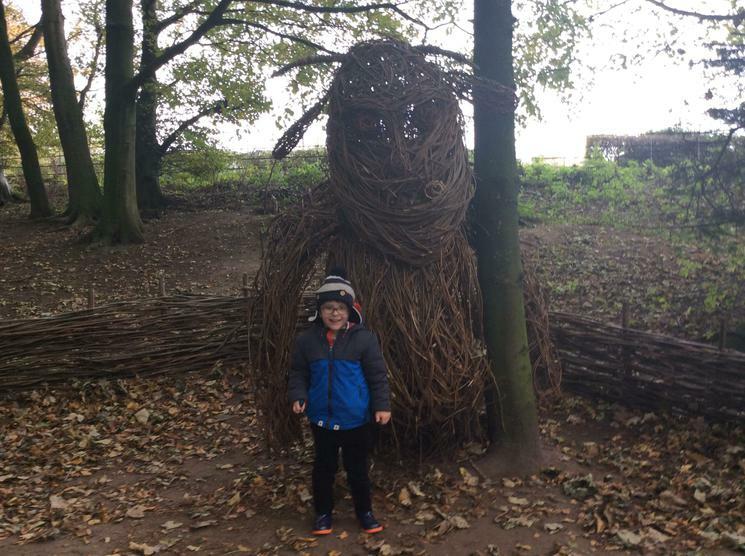 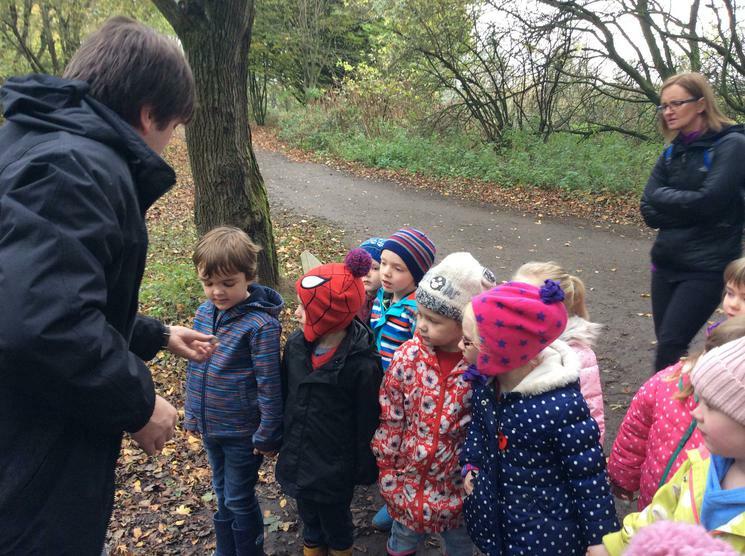 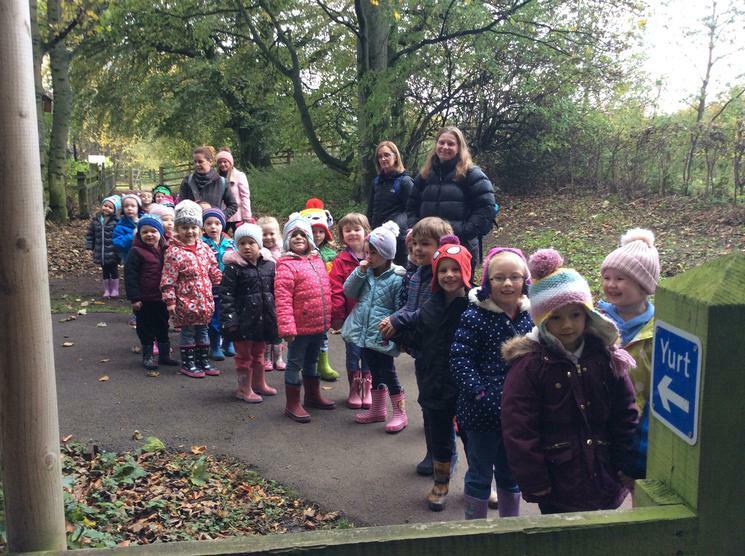 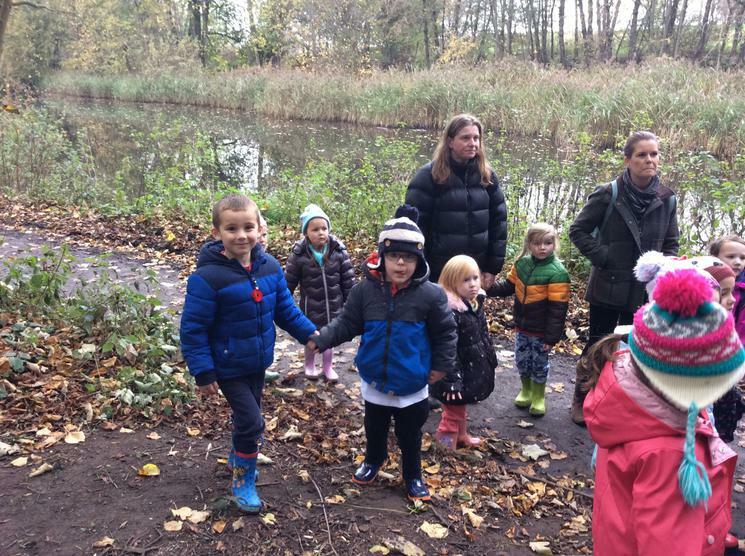 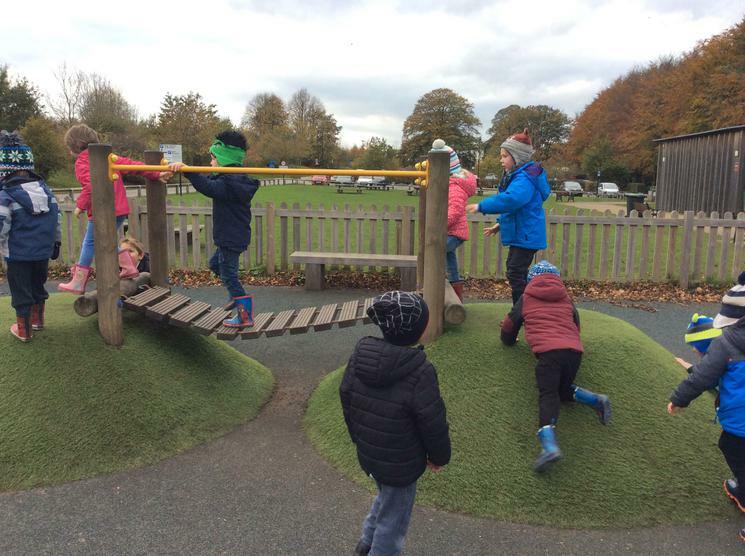 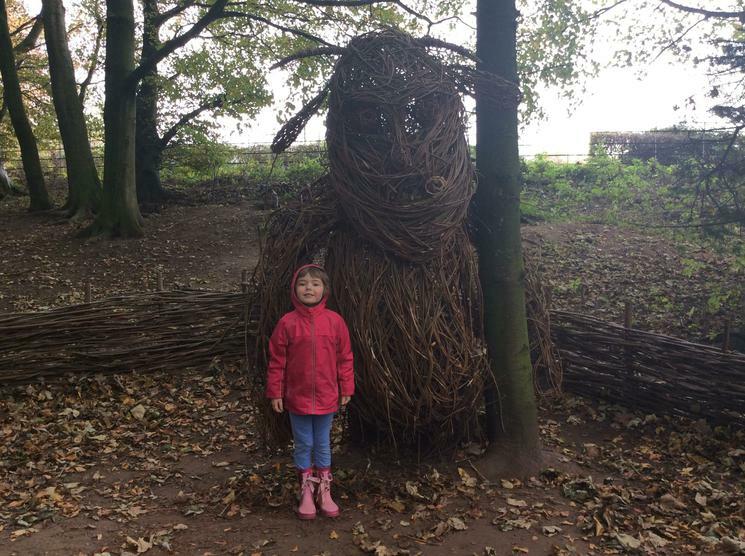 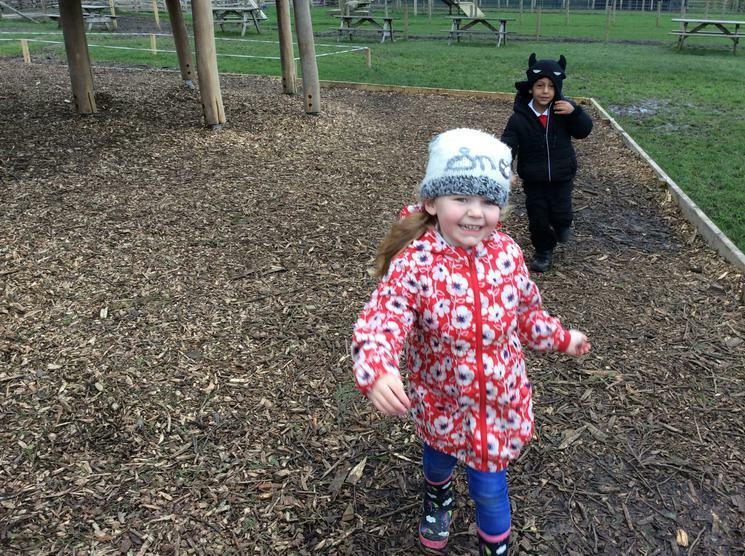 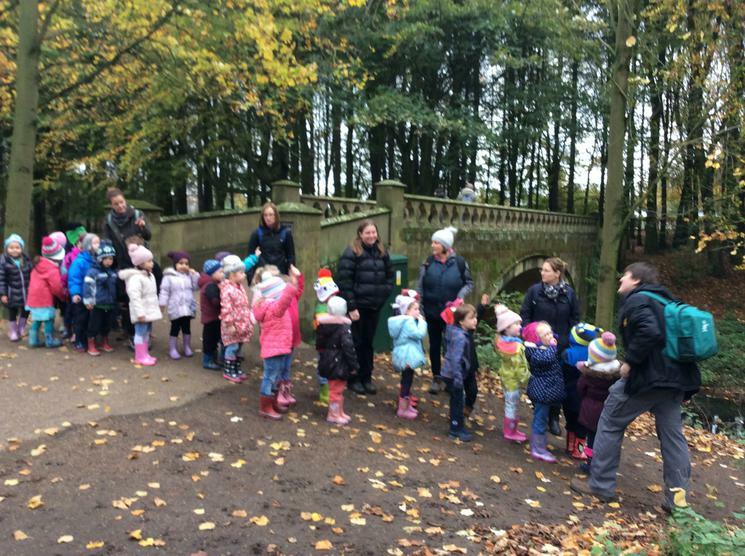 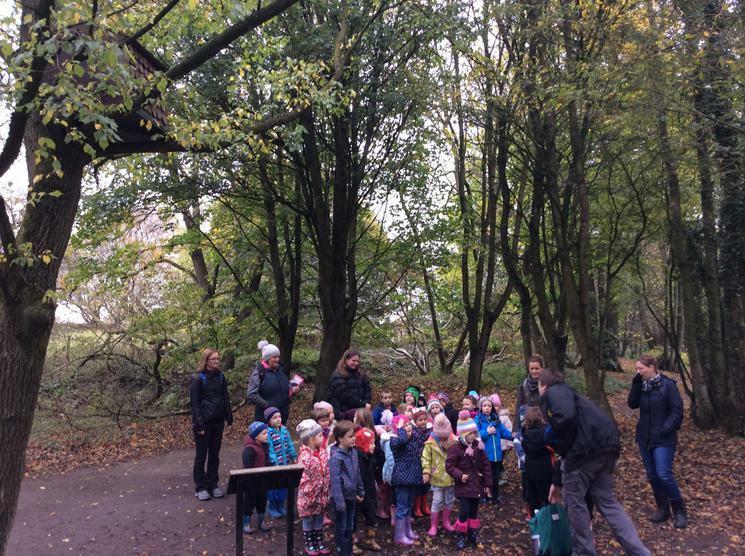 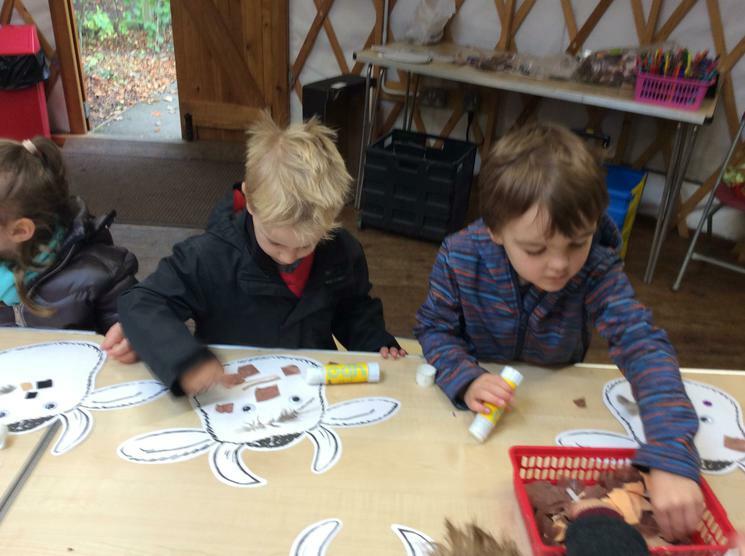 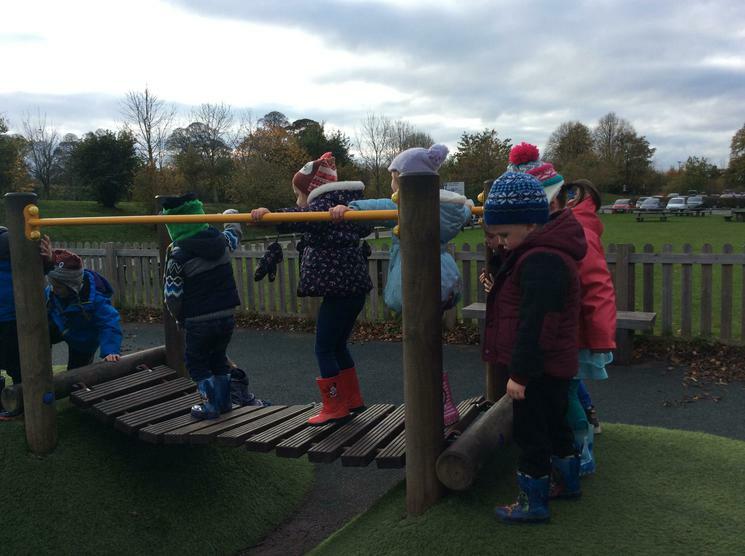 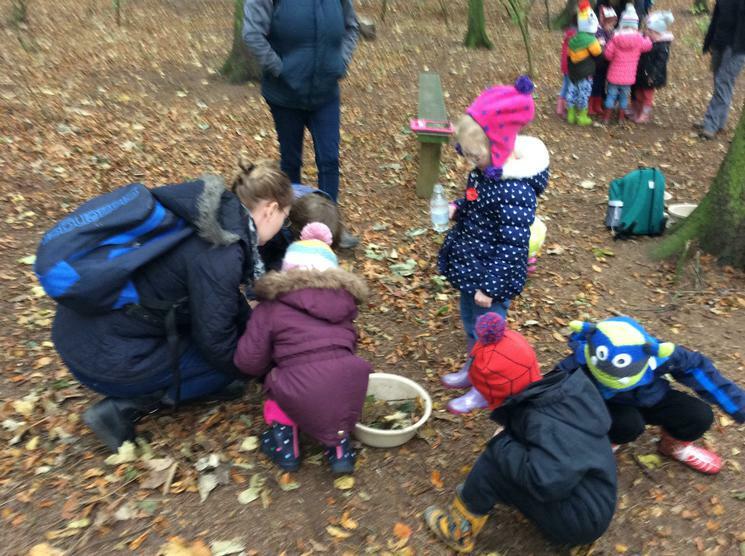 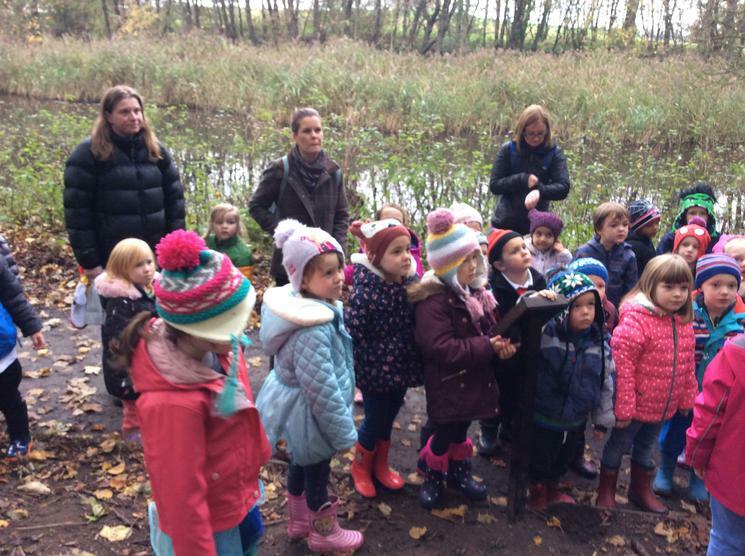 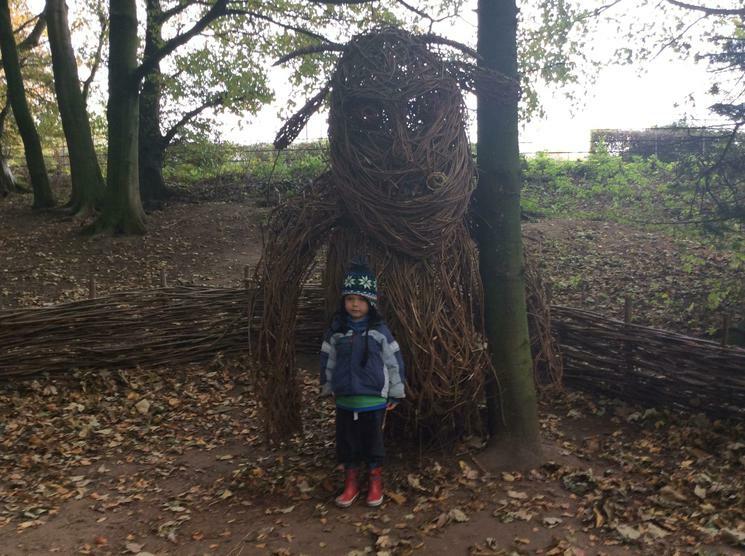 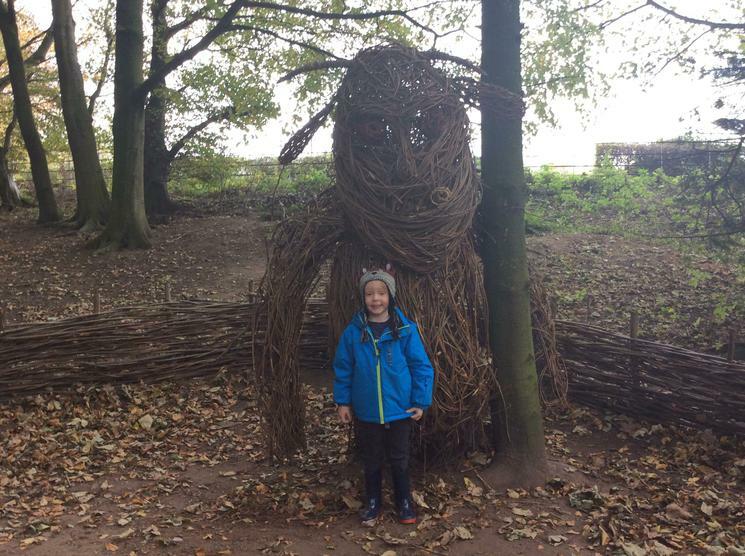 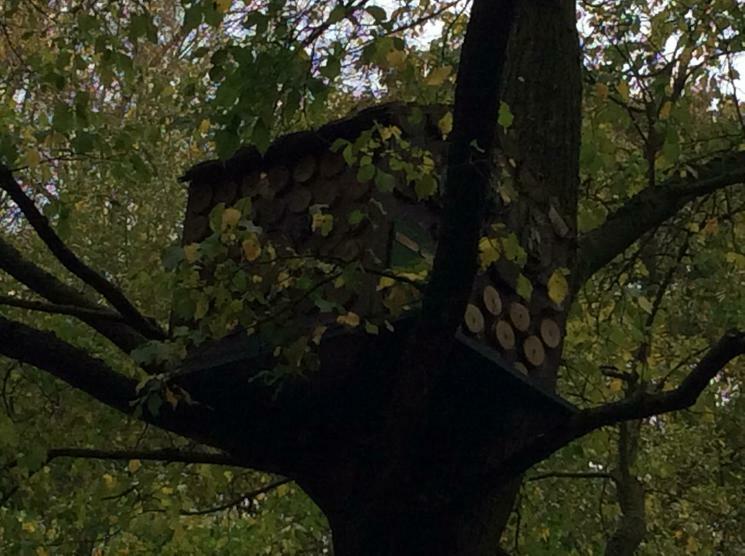 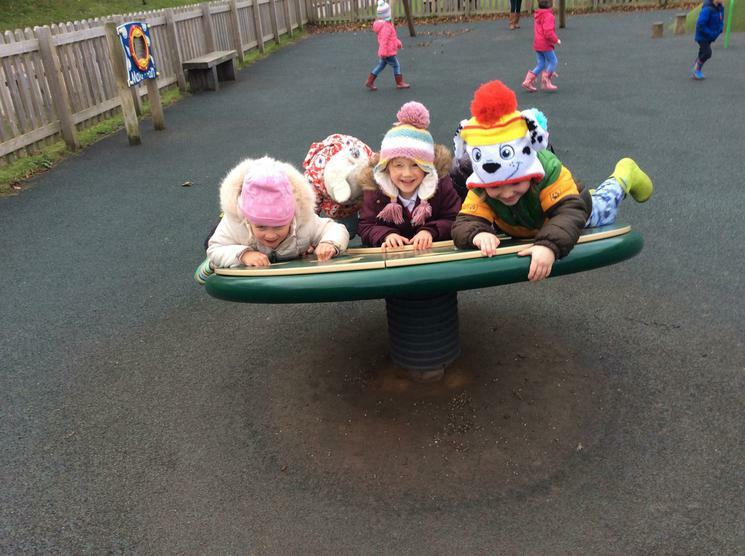 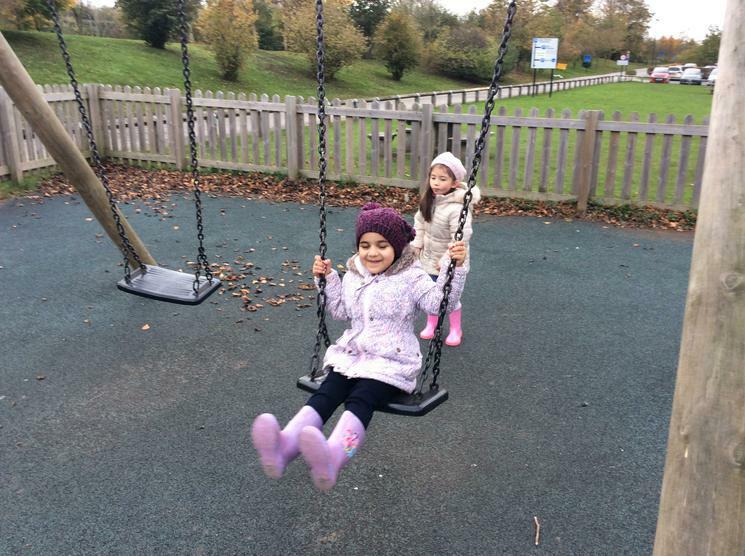 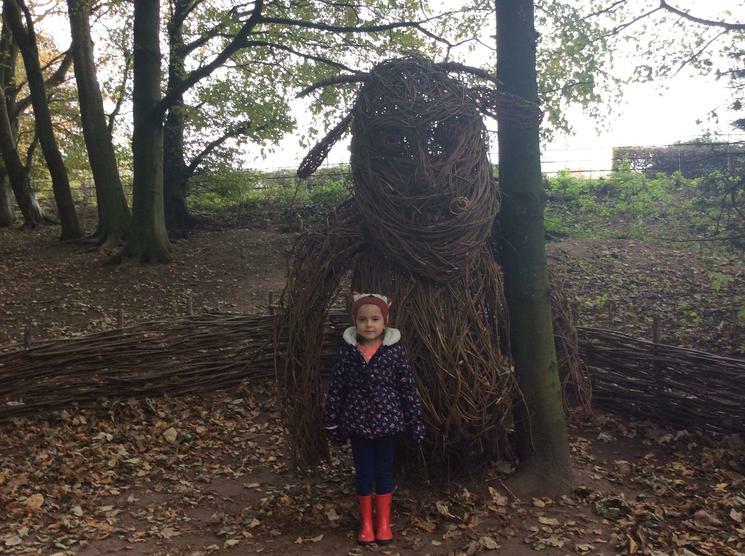 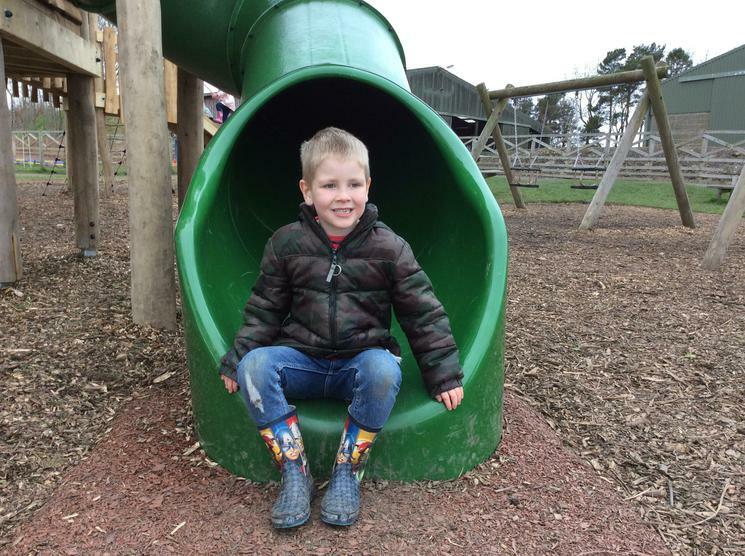 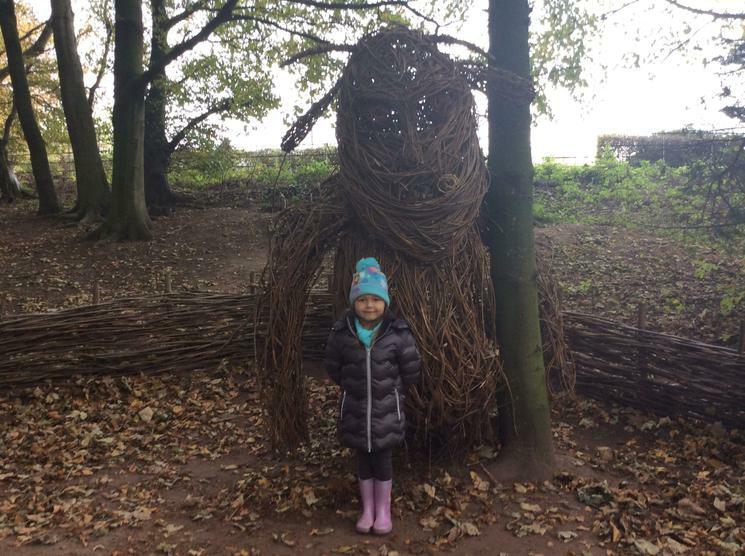 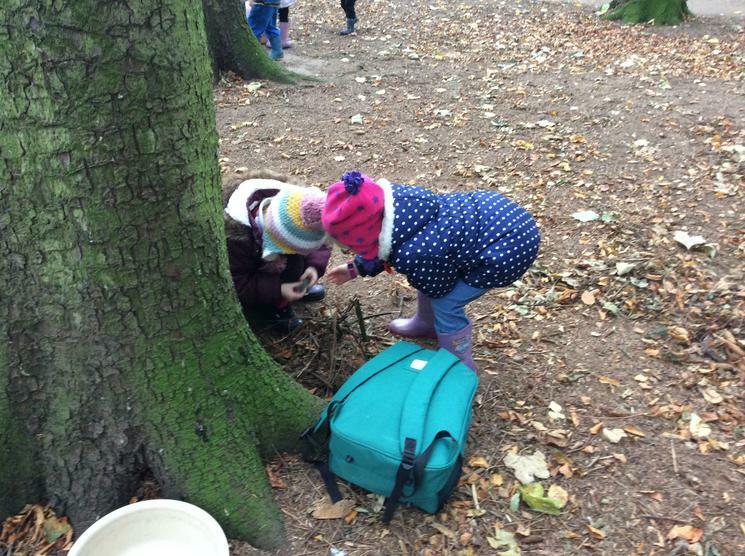 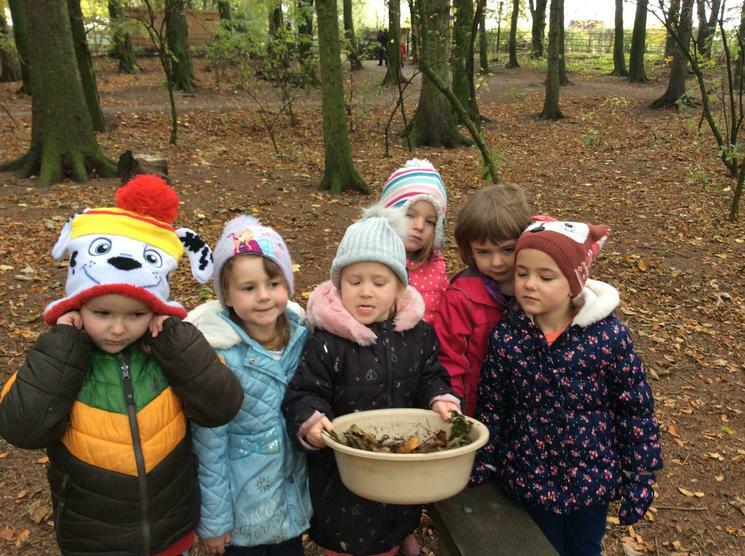 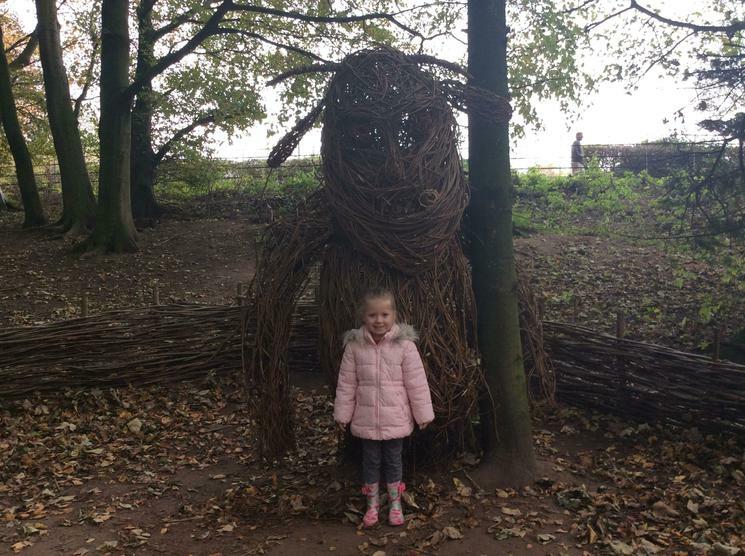 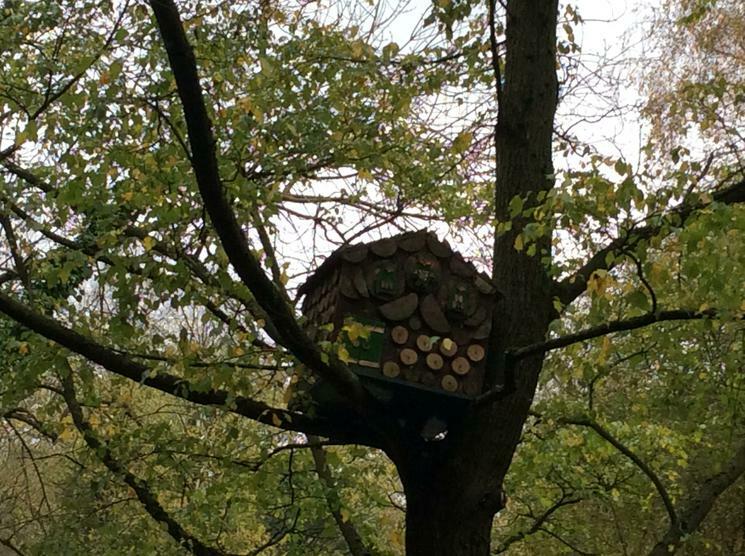 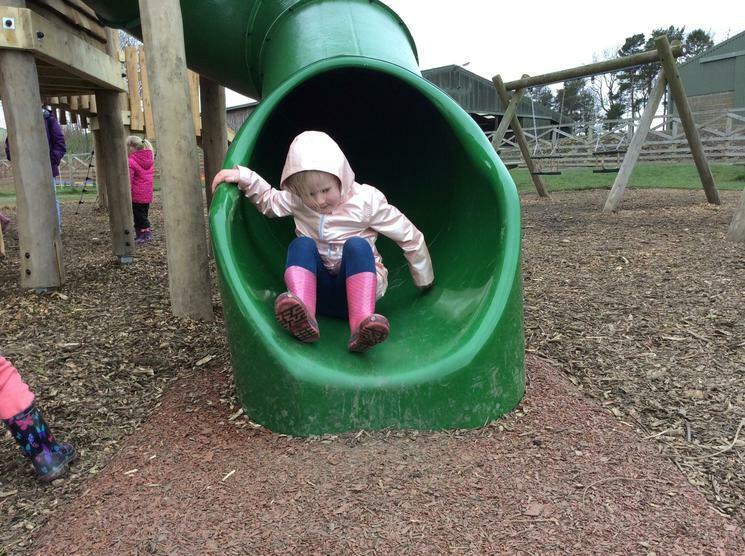 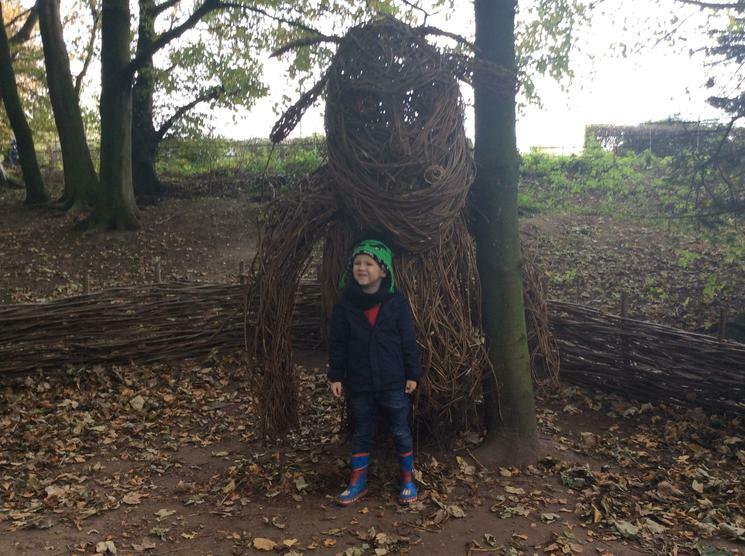 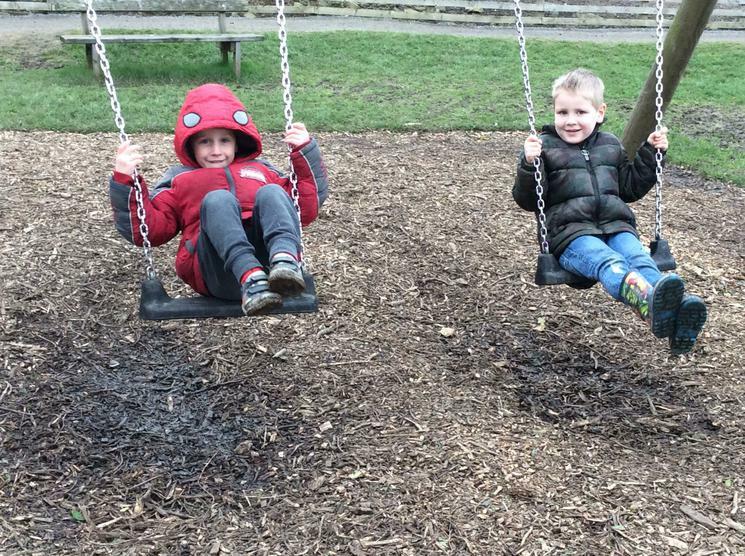 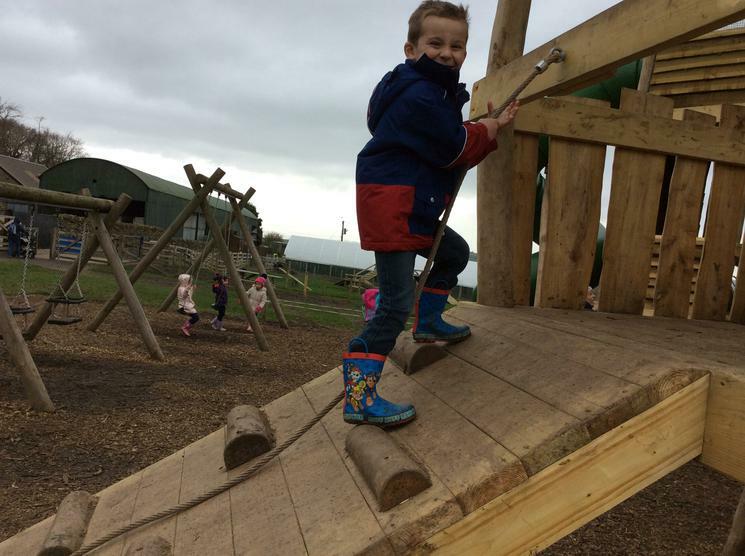 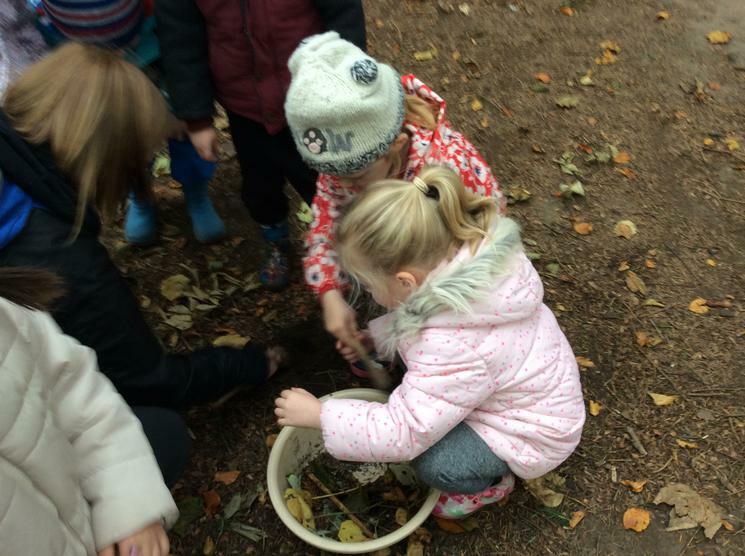 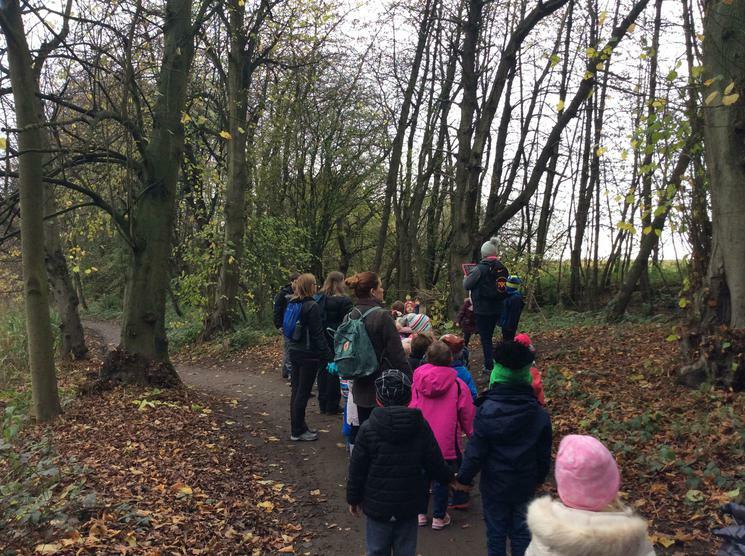 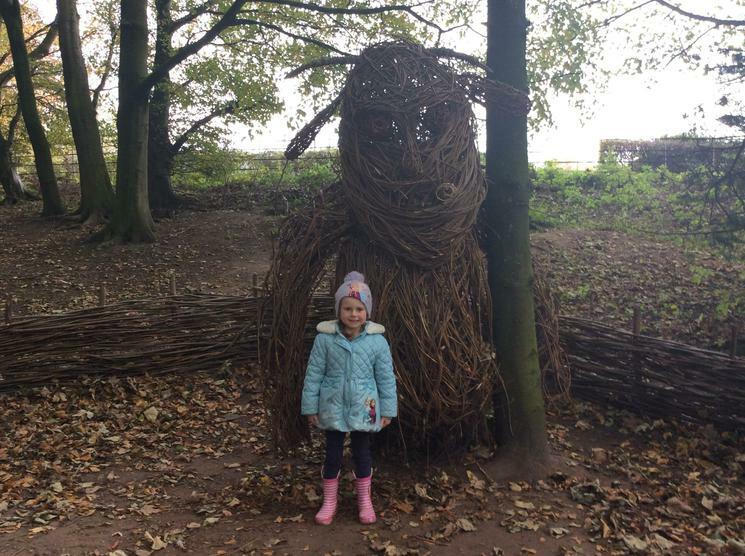 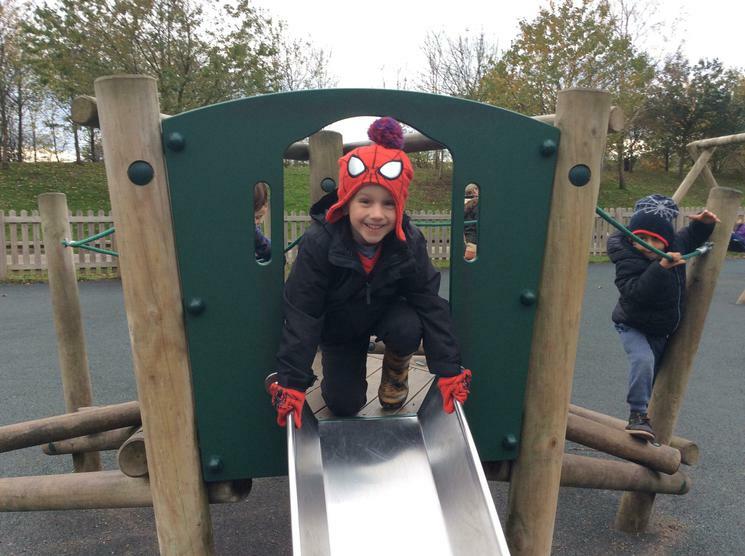 We went to Hardwick Park and took part in a 'Gruffalo Hunt'. 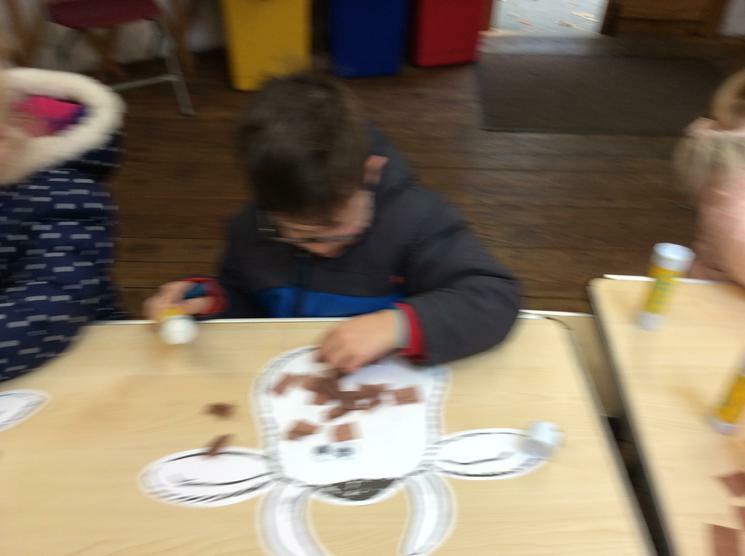 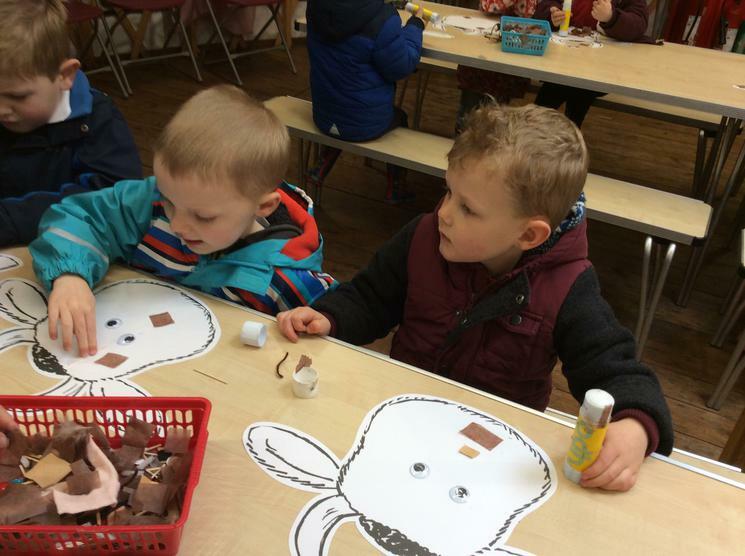 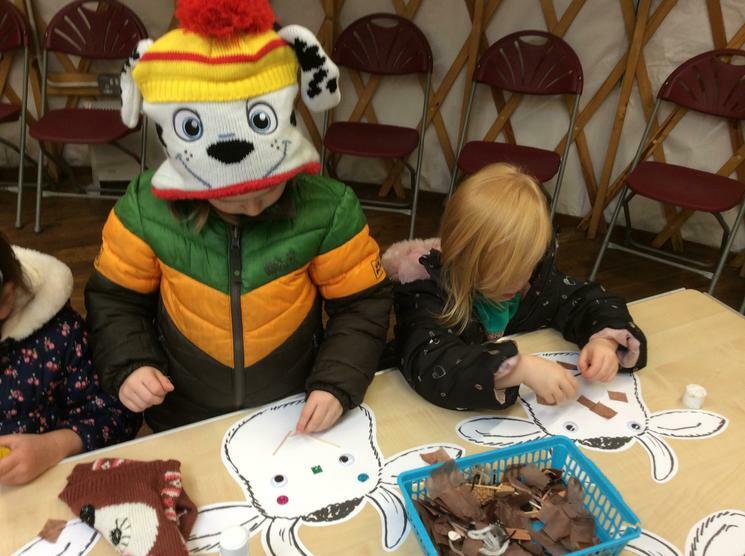 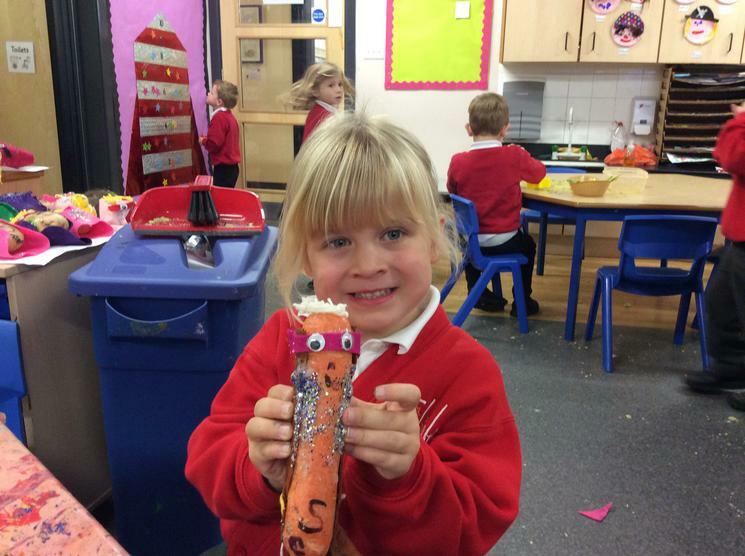 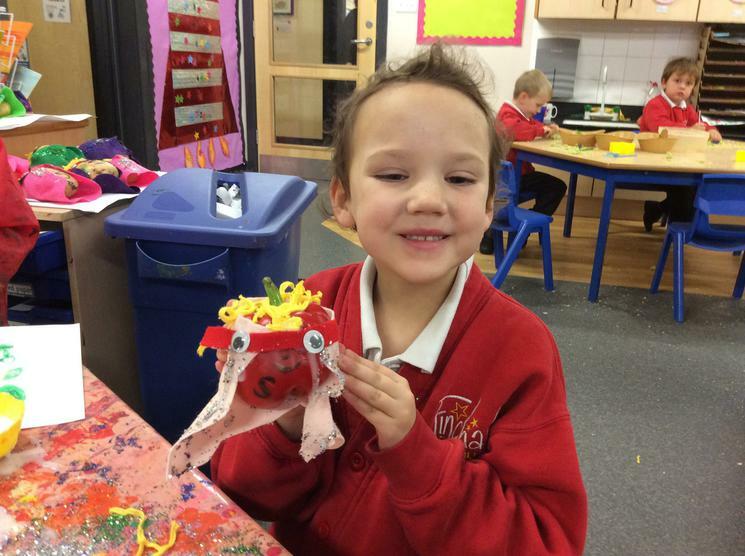 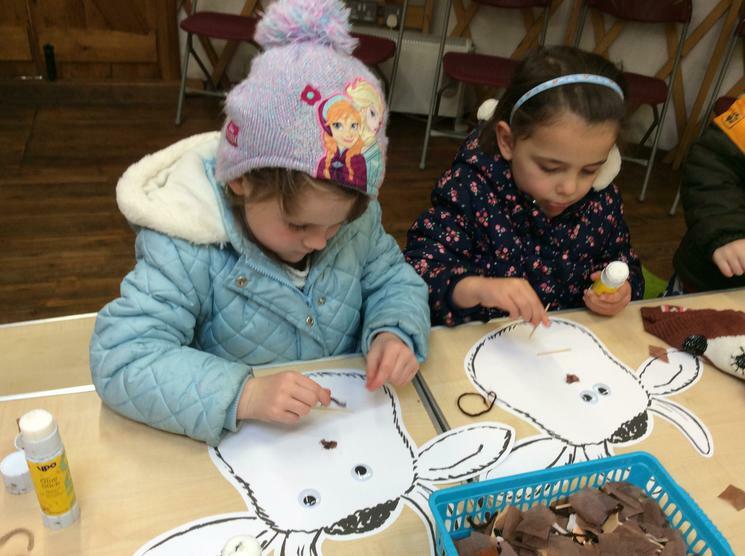 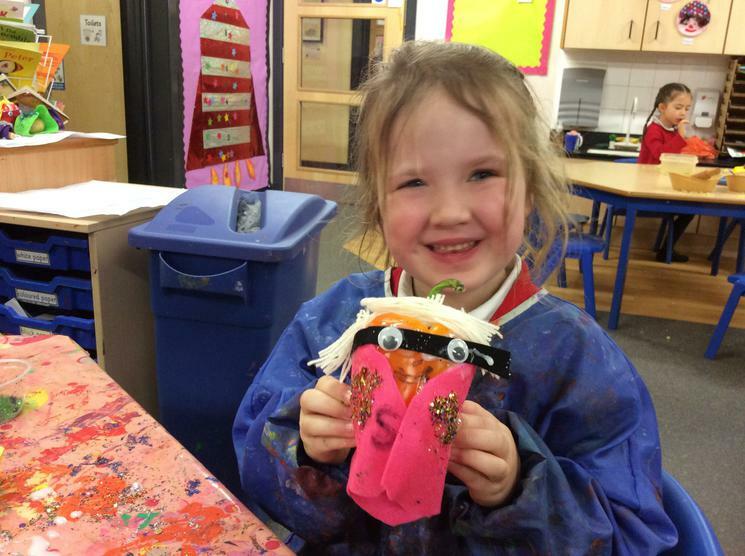 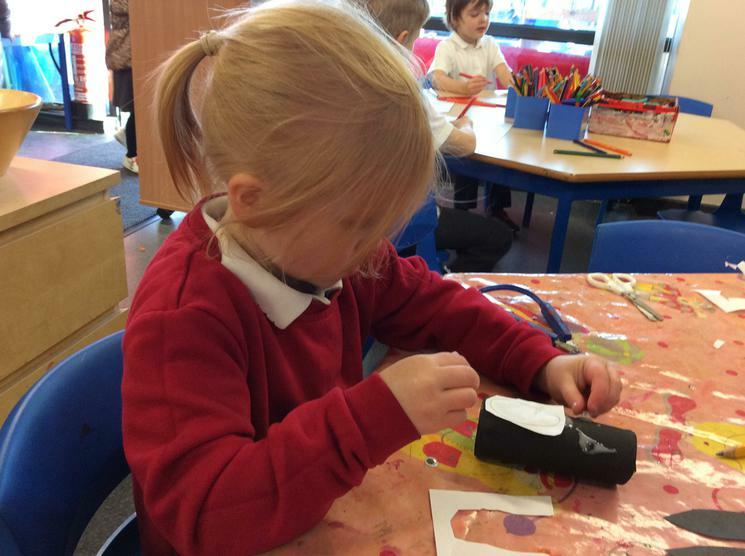 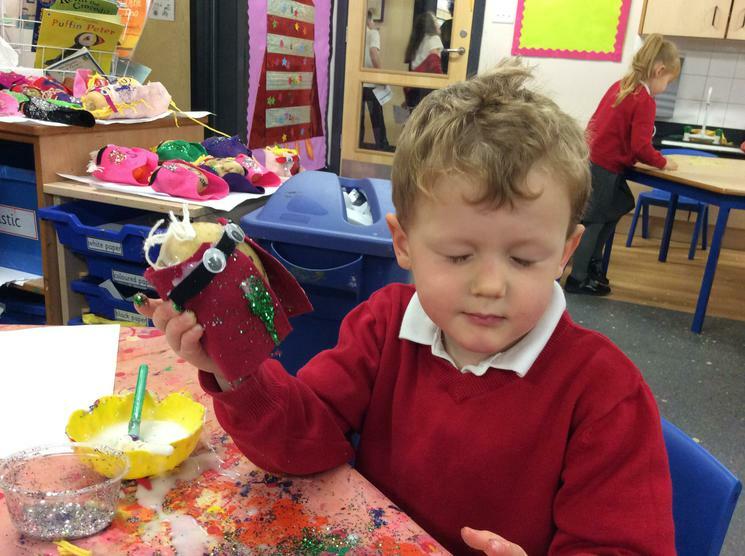 We made a Gruffalo mask. 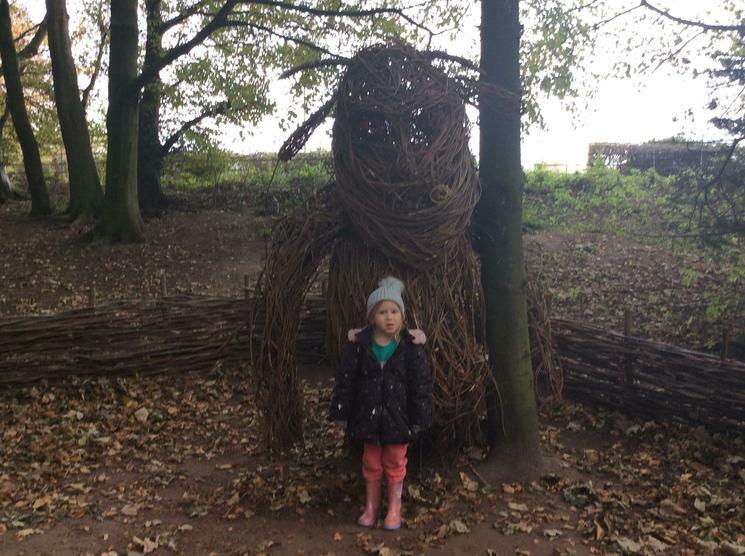 We were brave enough to have a photograph taken with the Gruffalo. 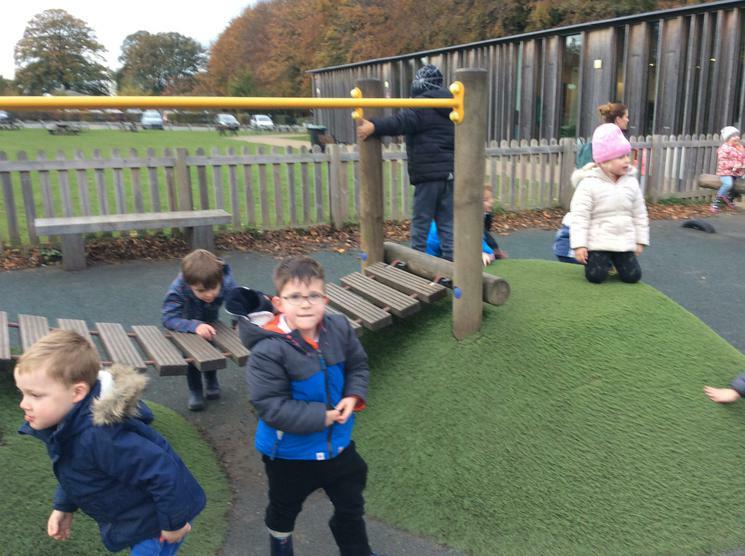 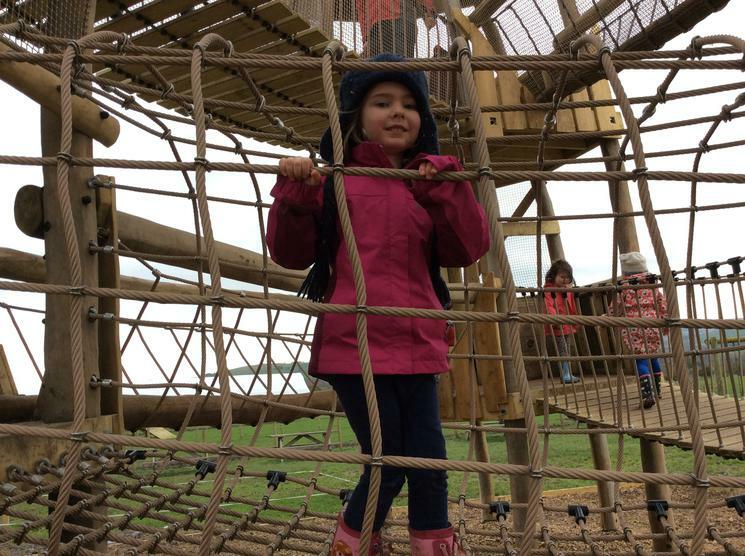 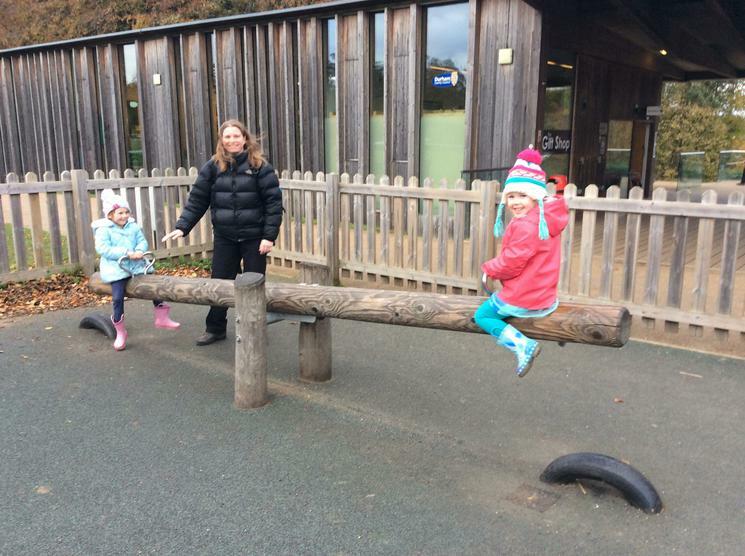 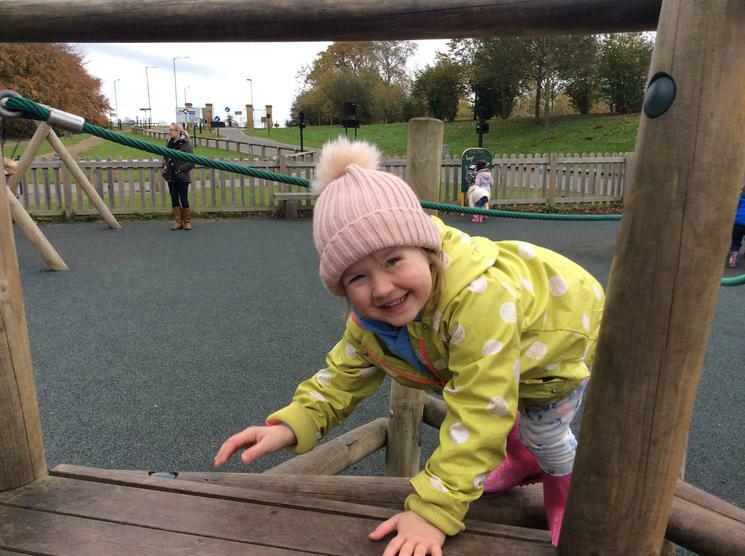 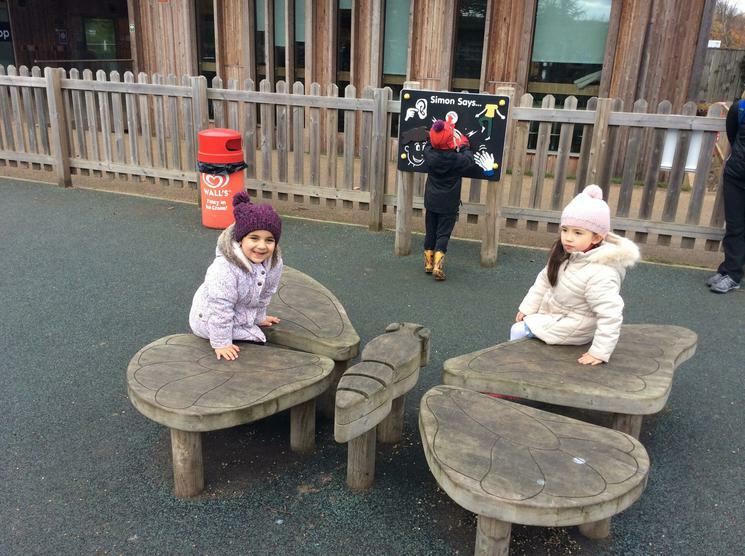 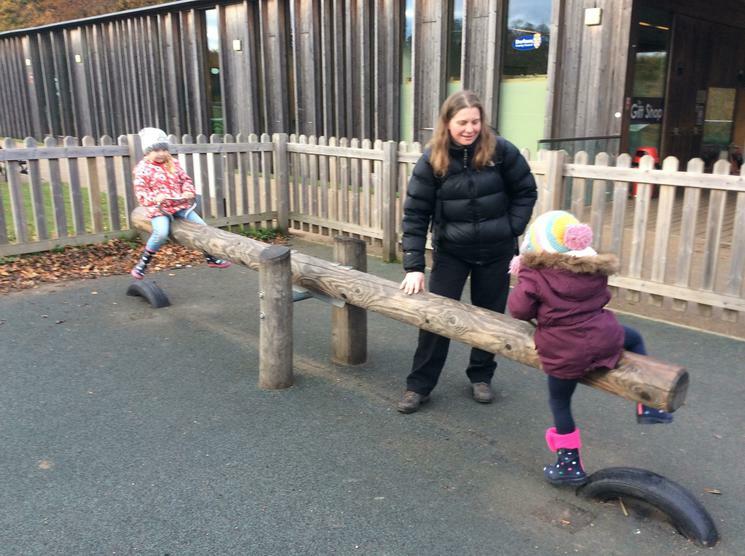 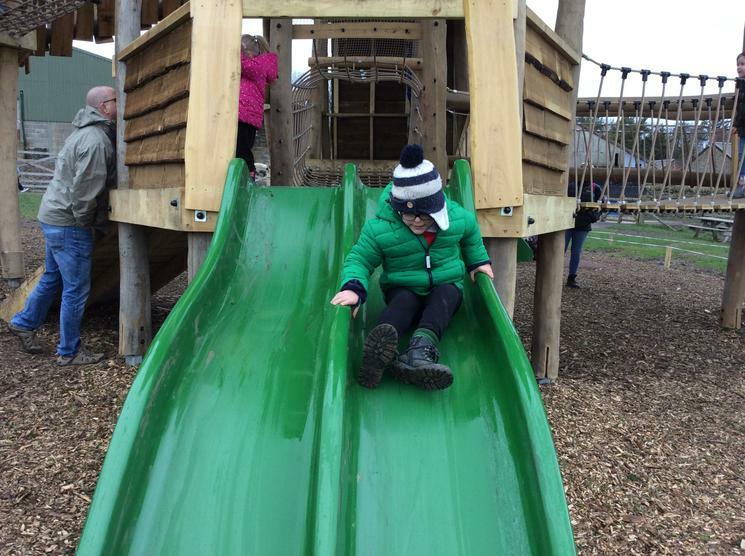 We also enjoyed some time in the play area. 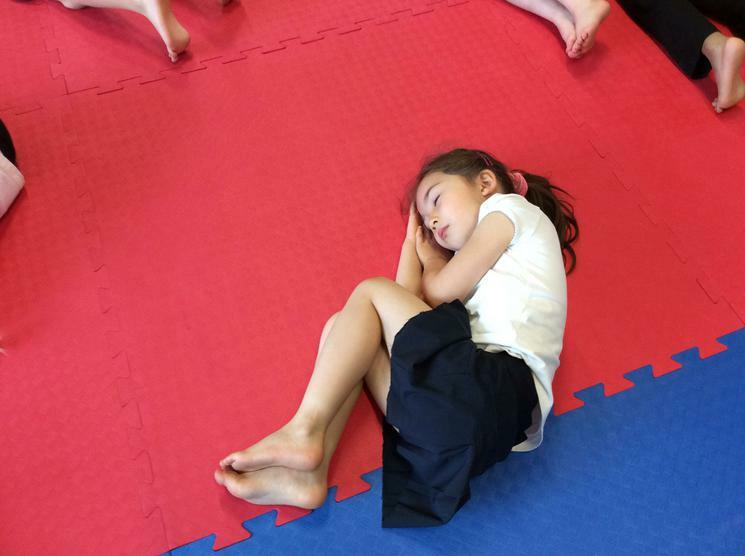 Some of us were so tired we needed a snooze! 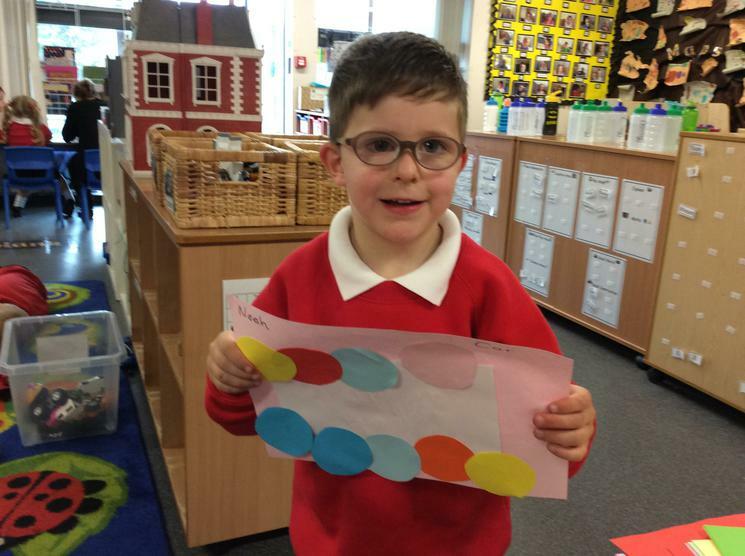 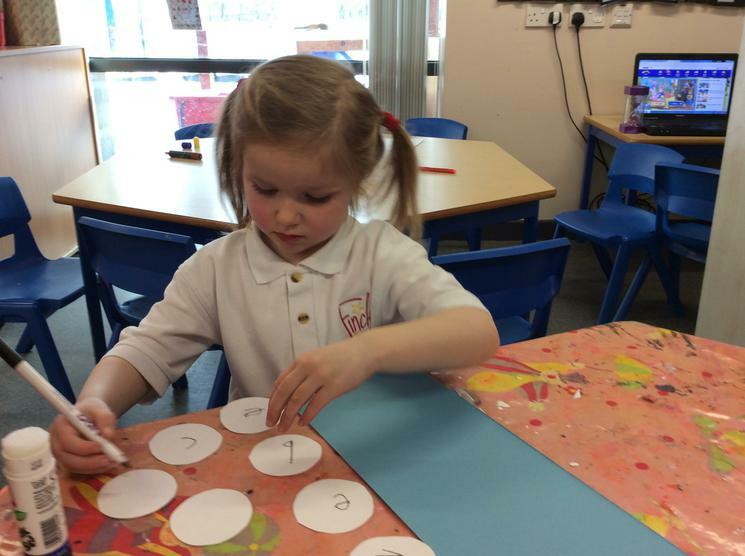 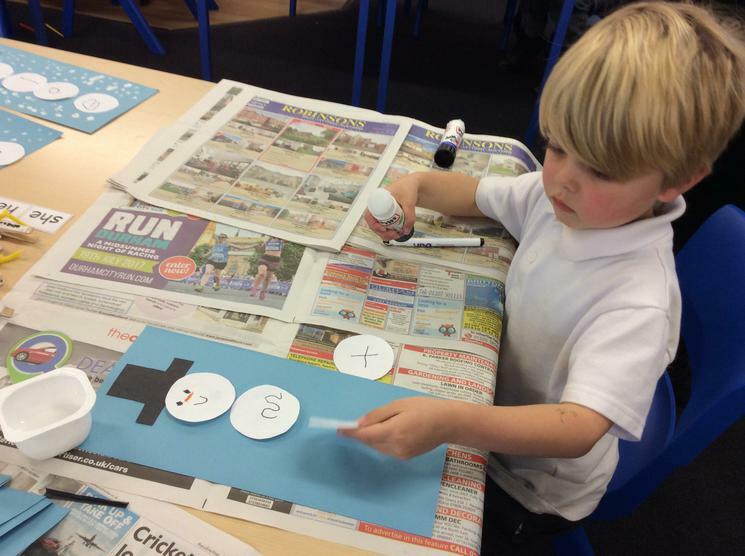 We enjoyed 'Marvellous Maths' day. 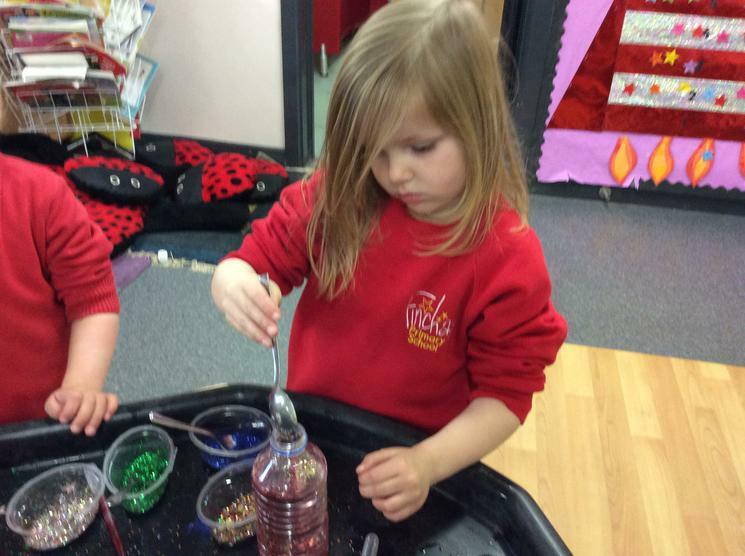 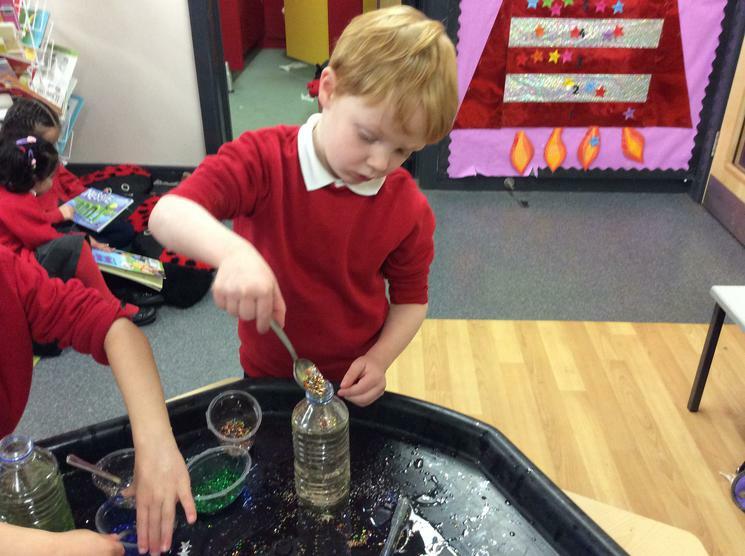 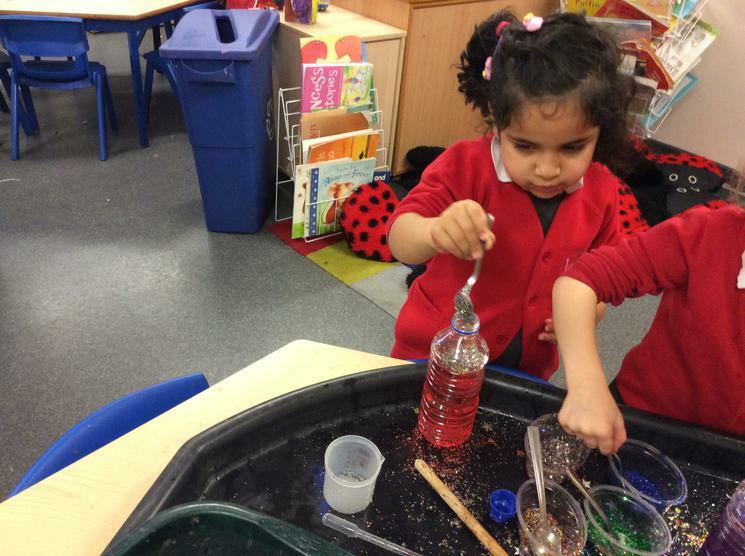 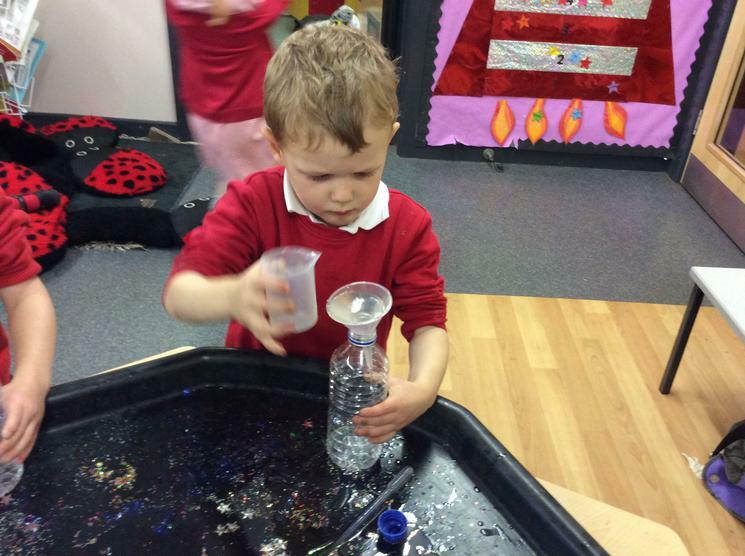 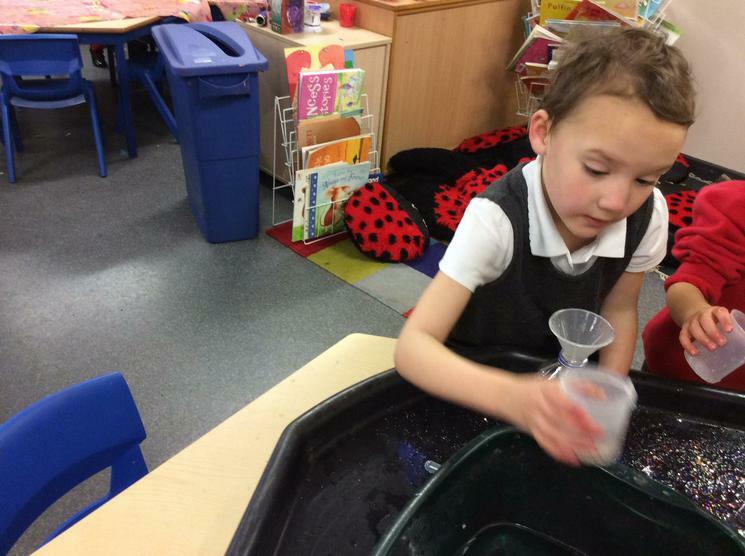 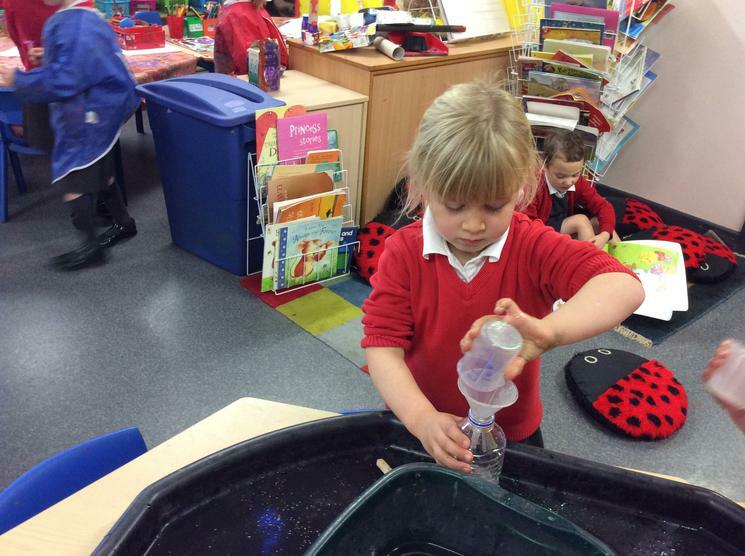 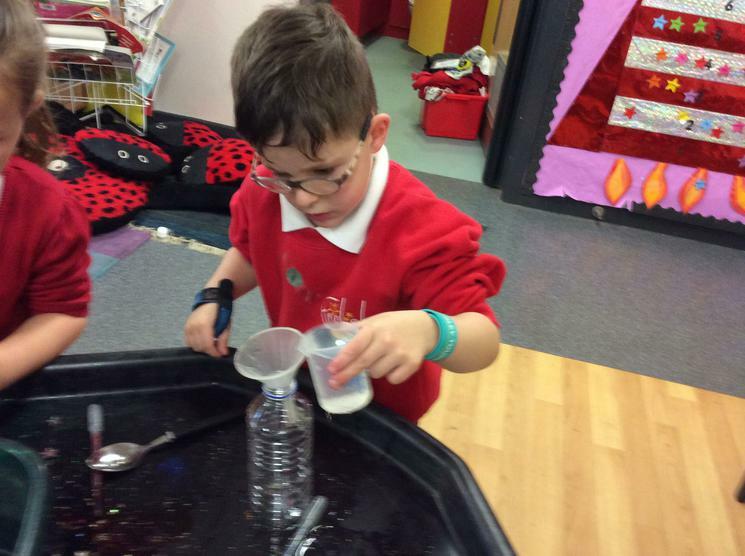 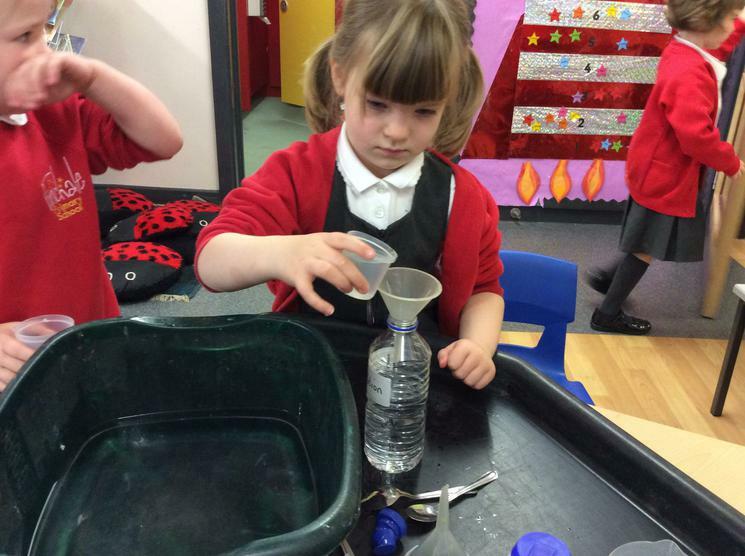 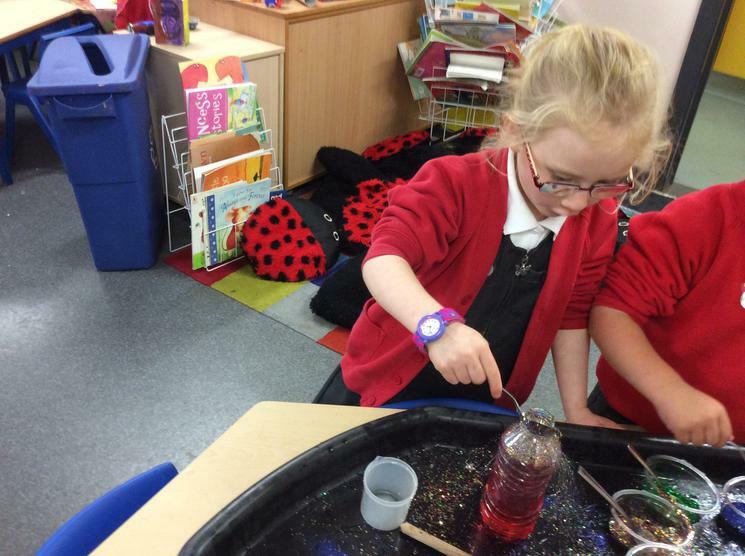 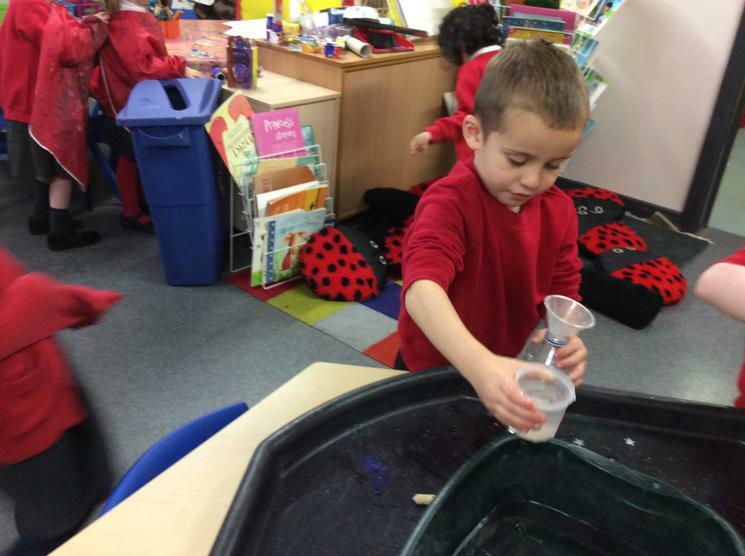 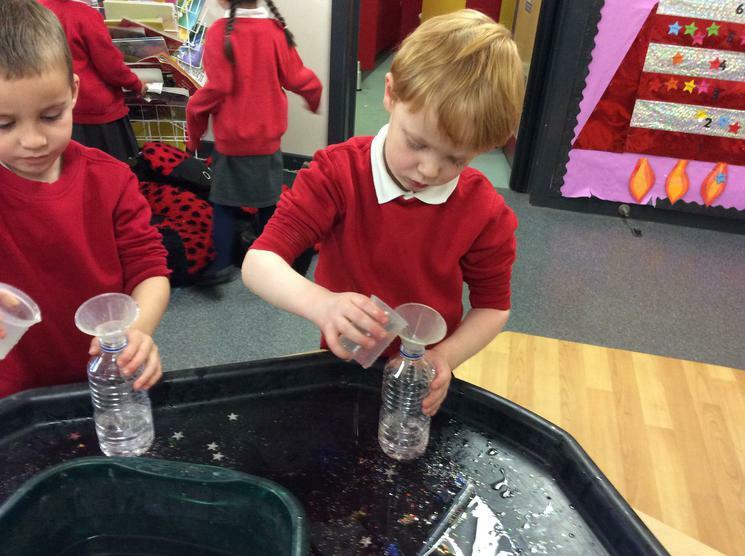 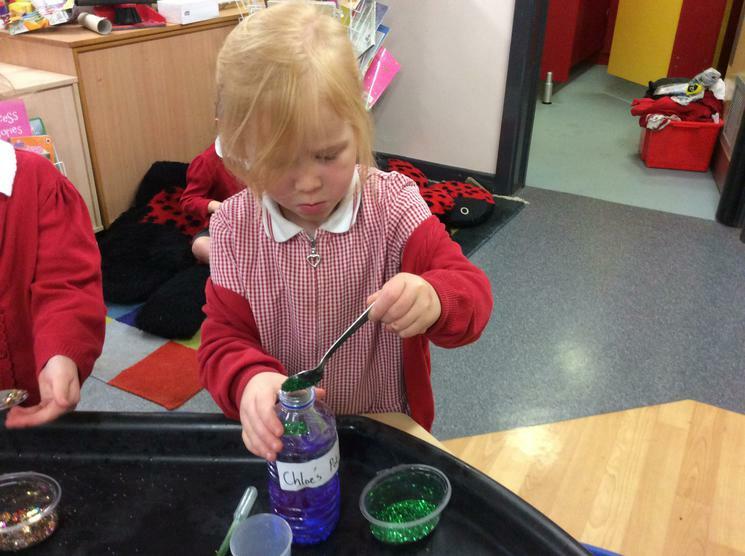 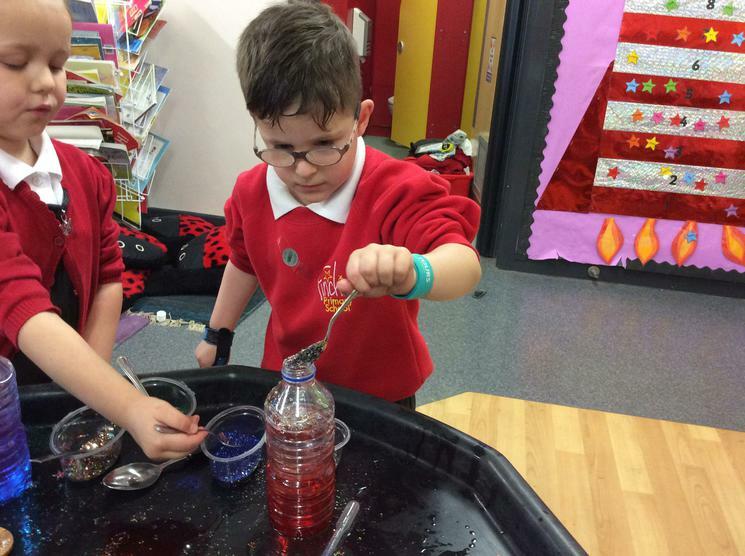 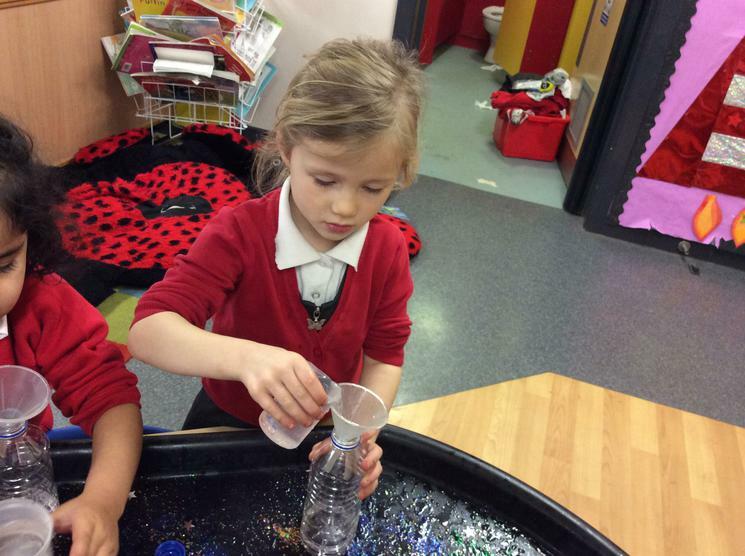 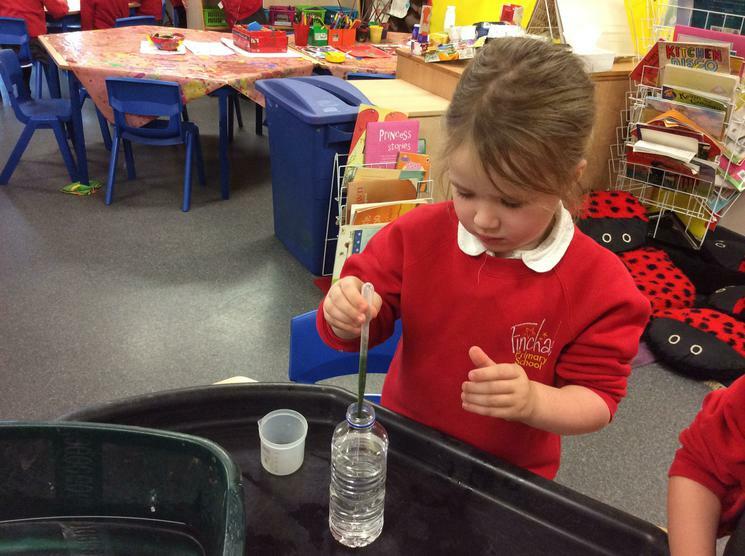 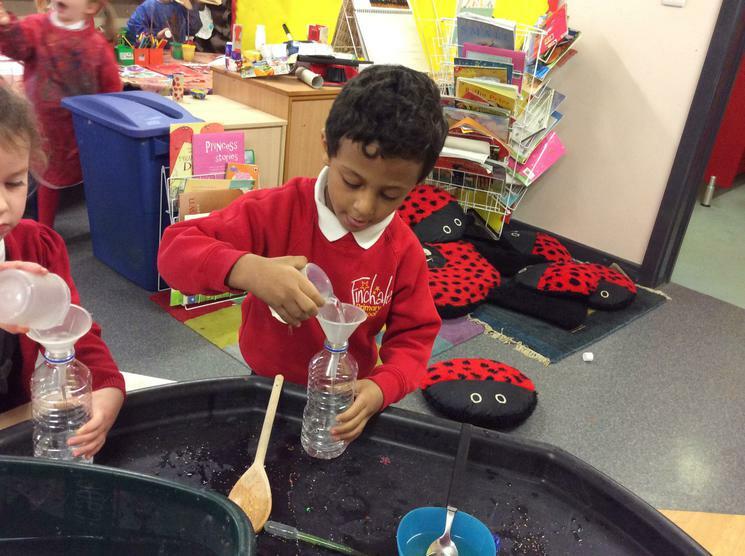 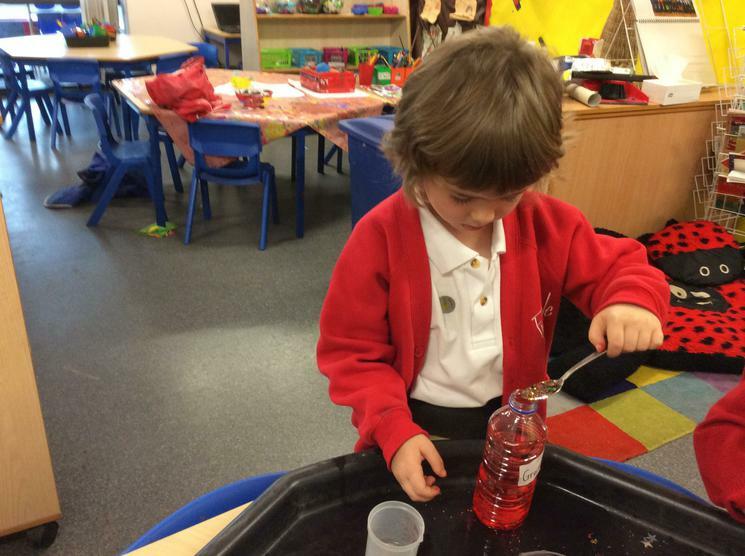 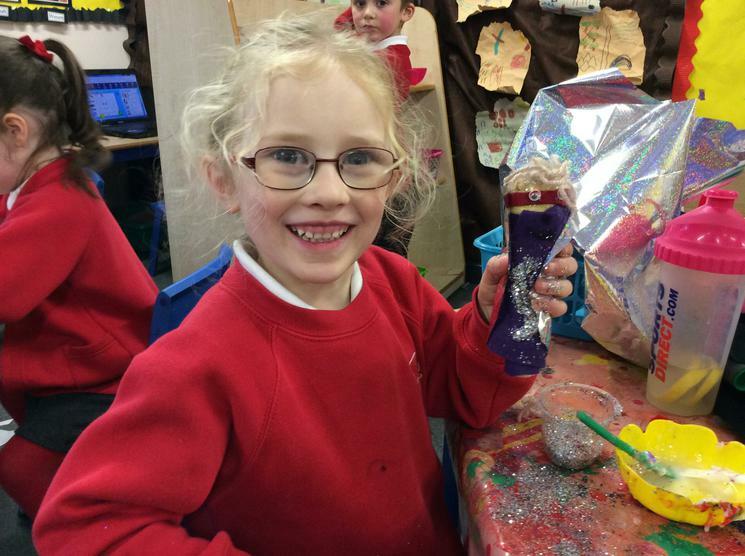 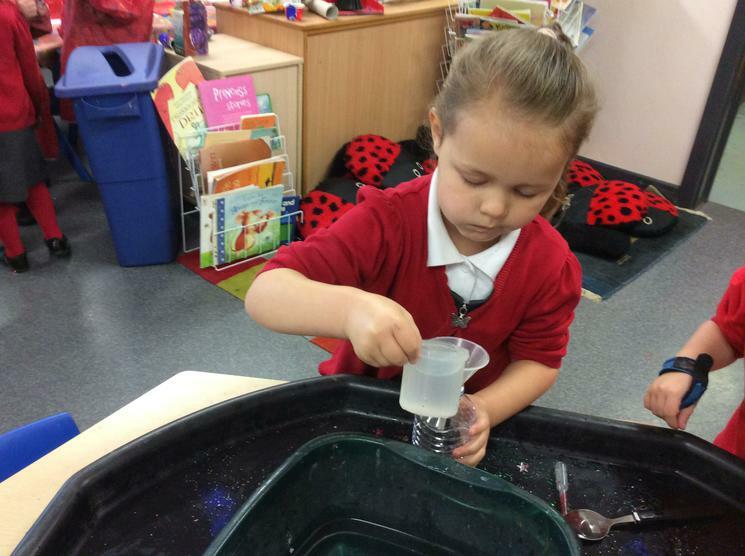 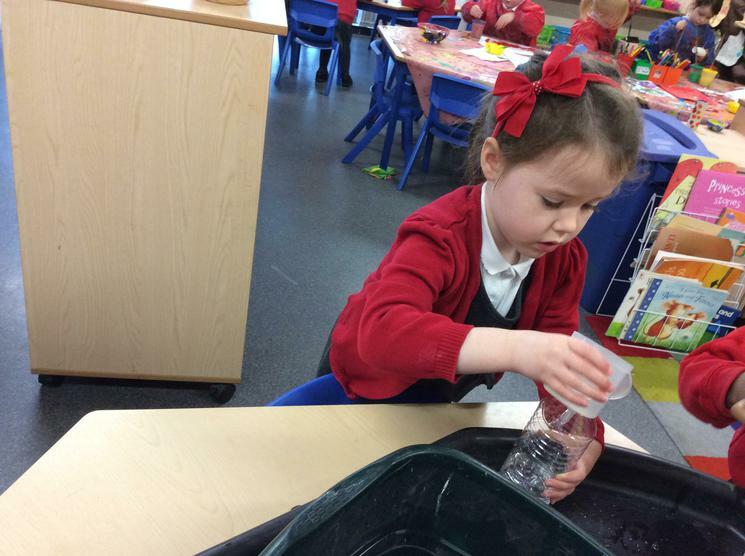 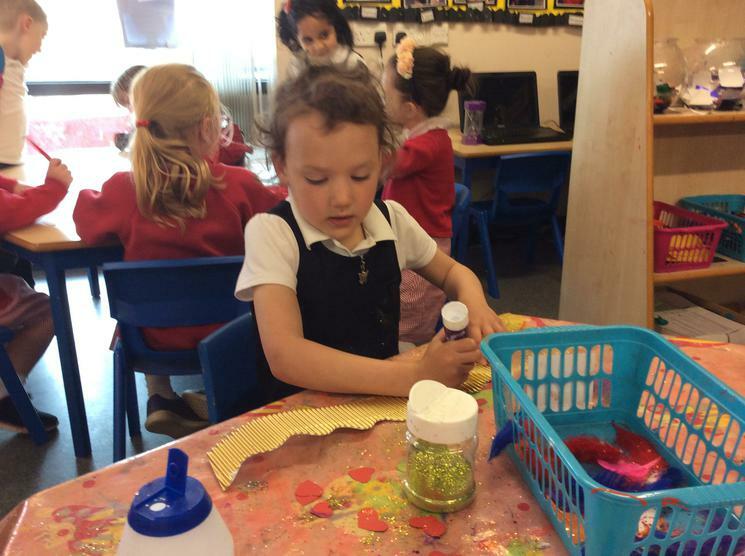 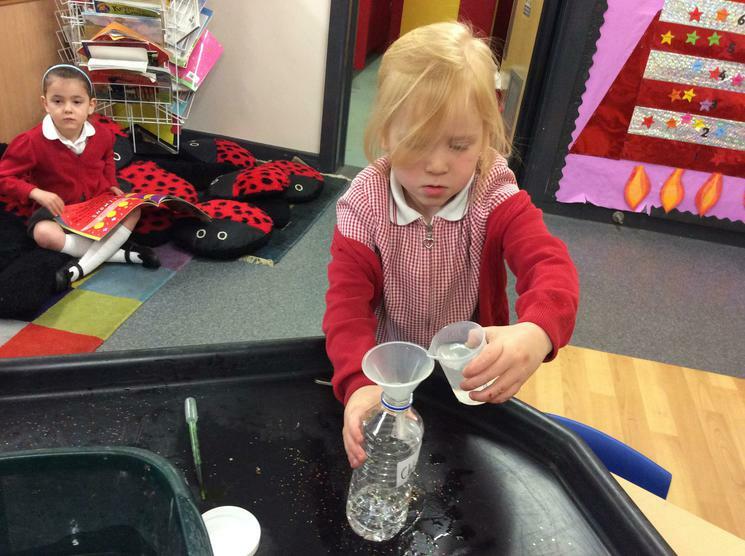 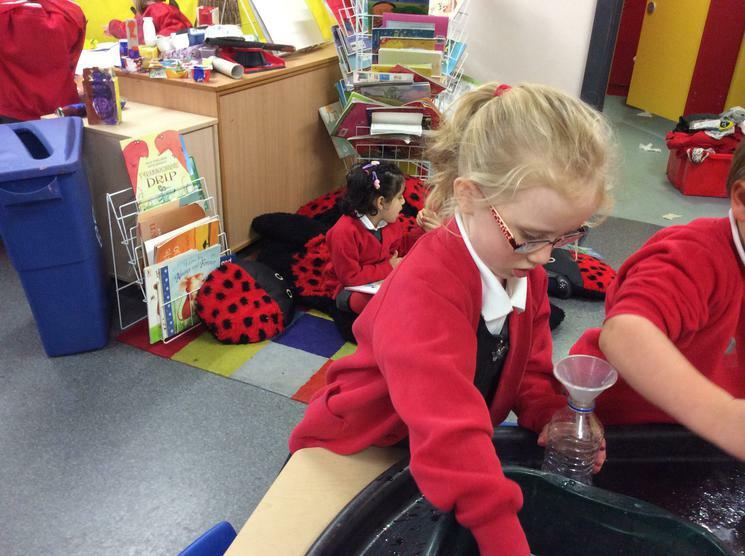 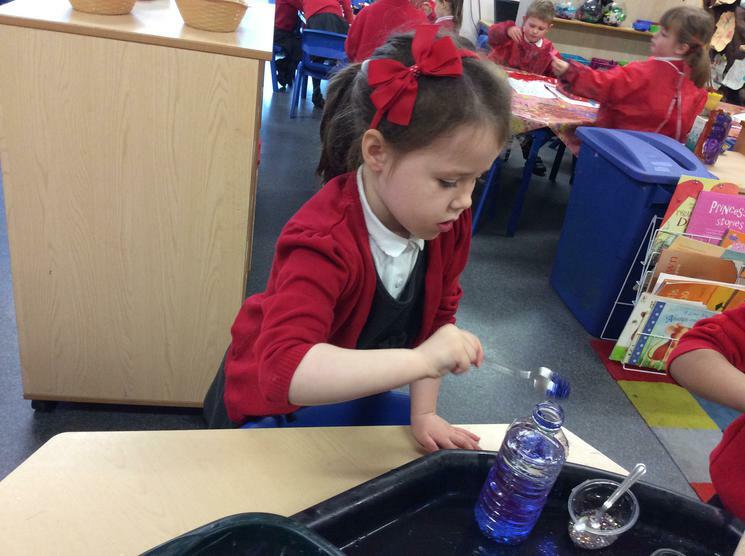 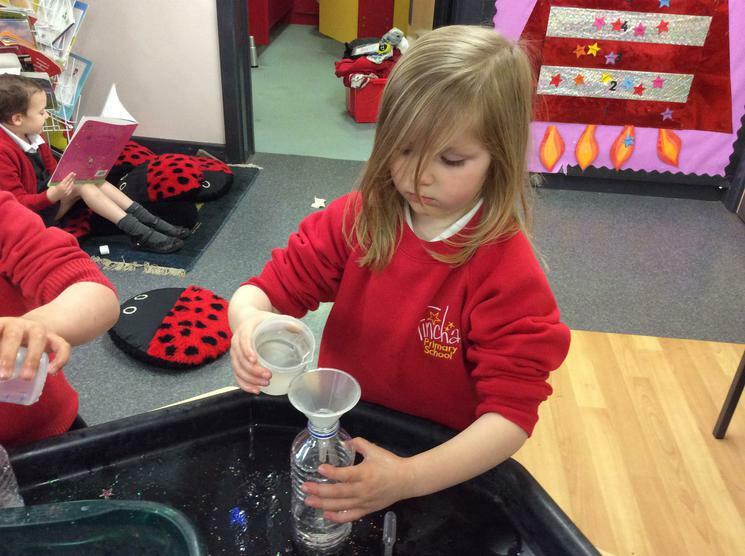 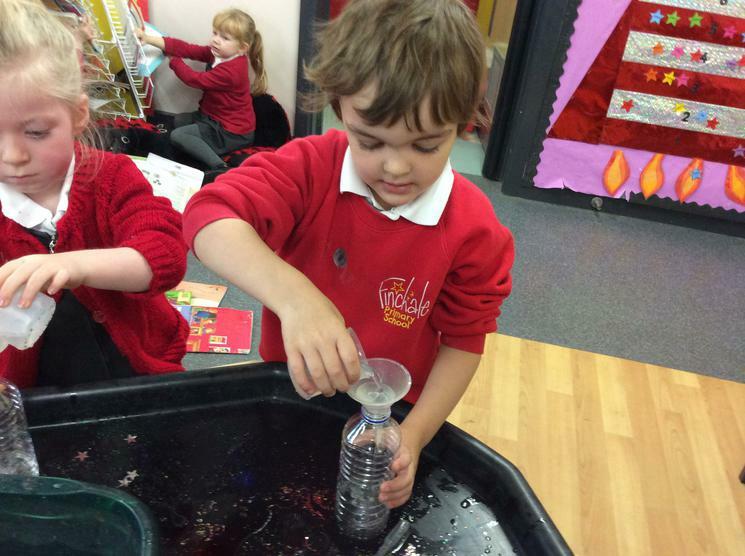 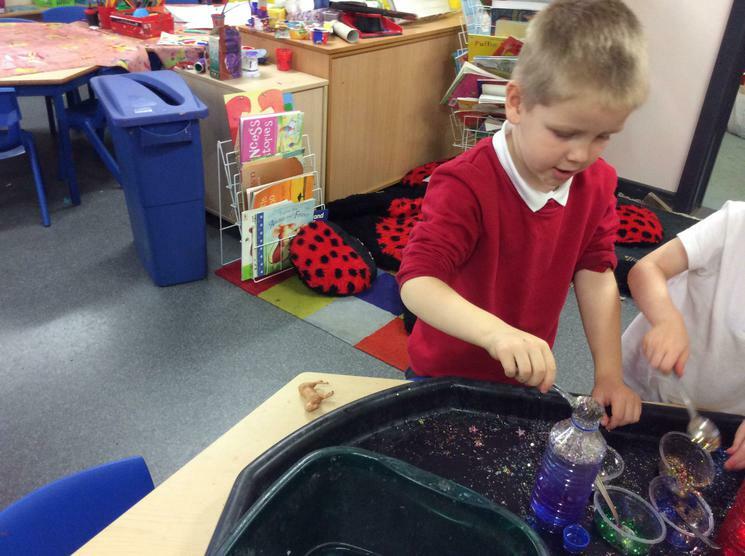 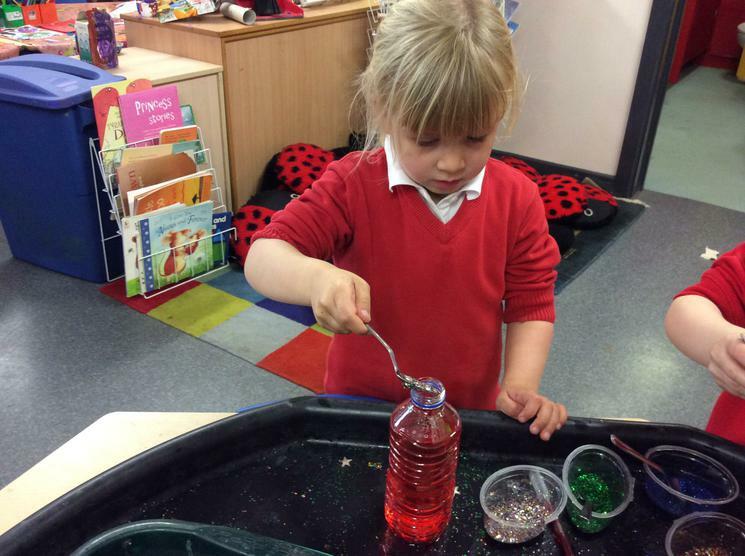 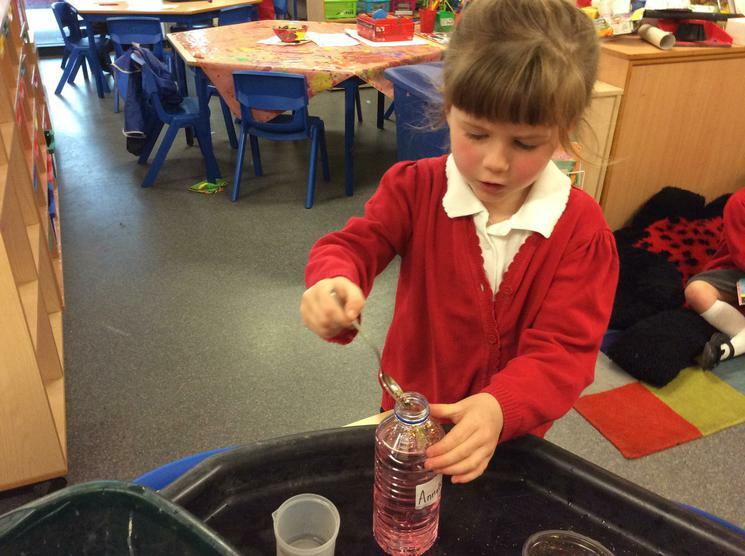 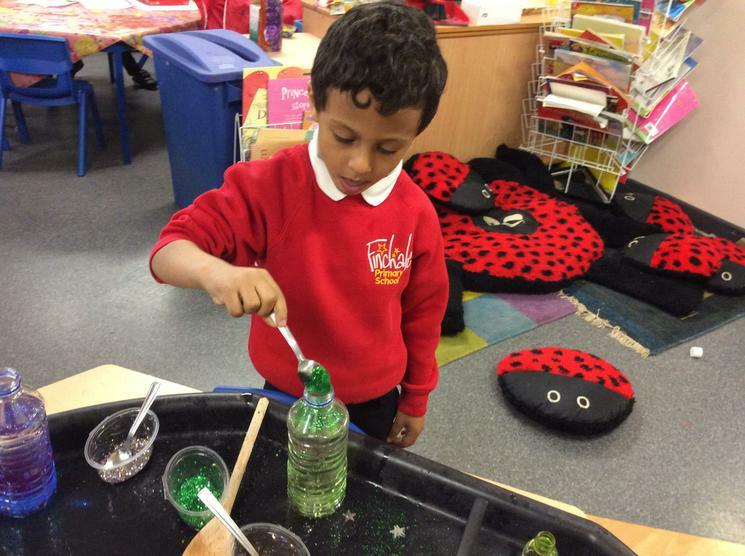 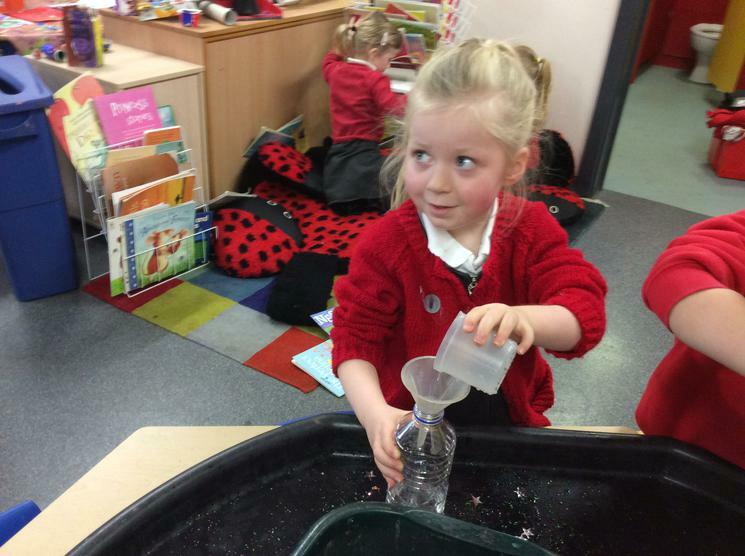 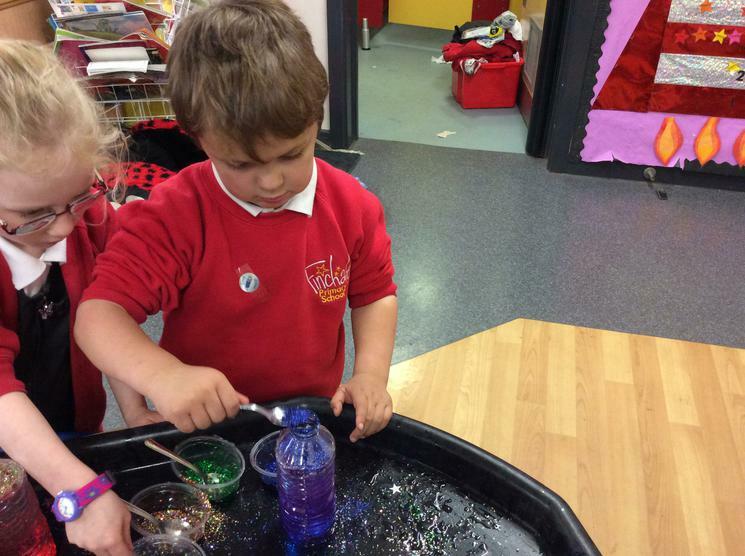 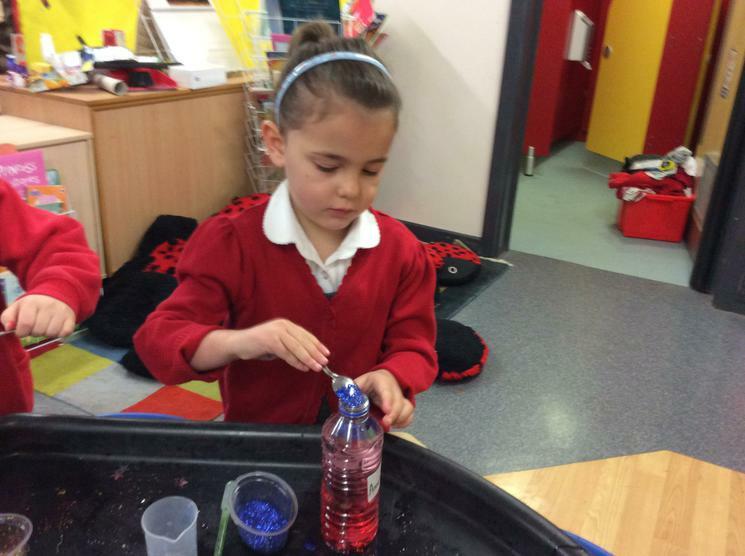 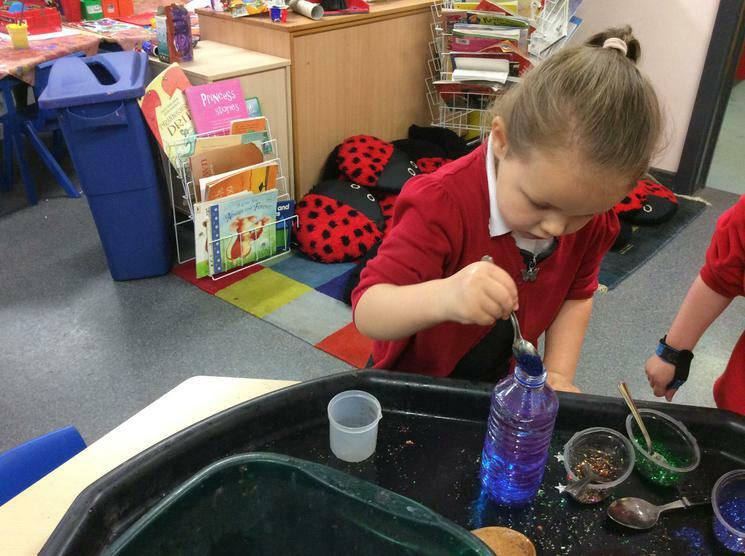 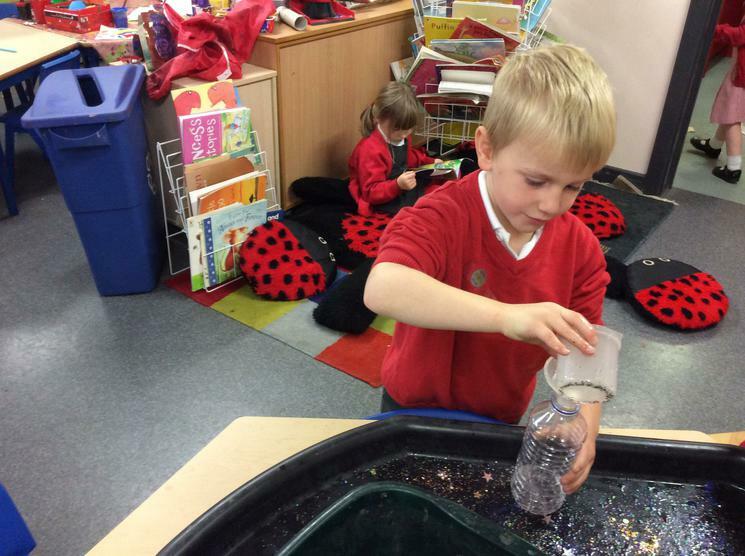 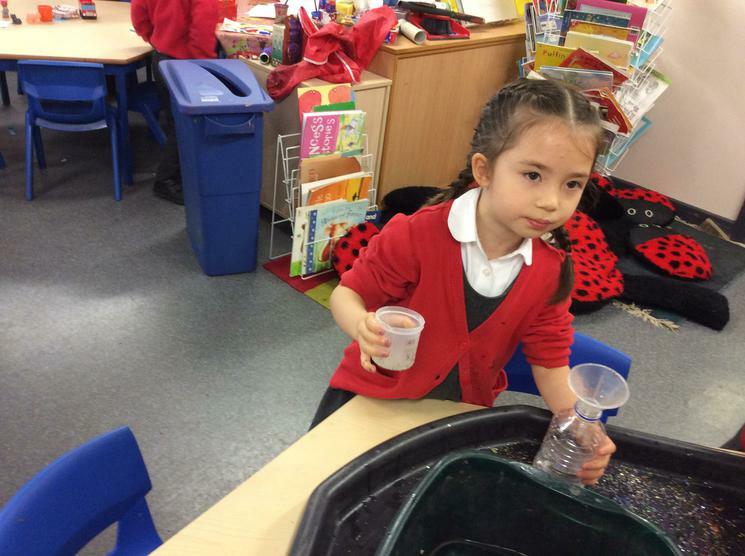 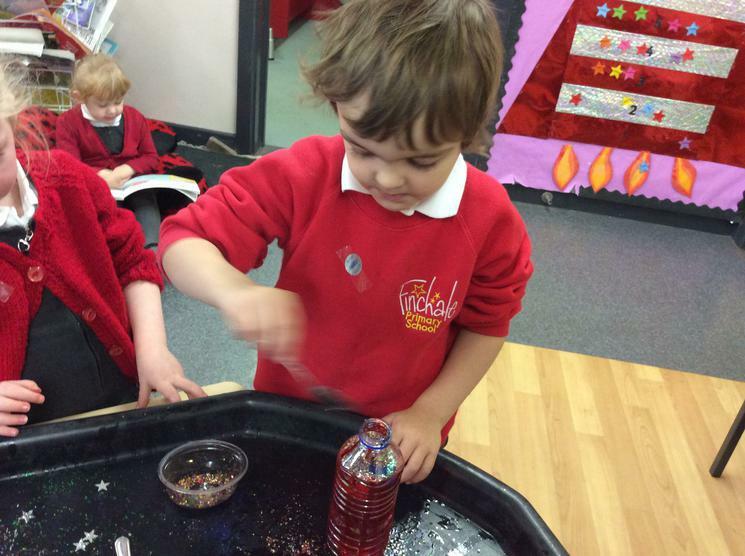 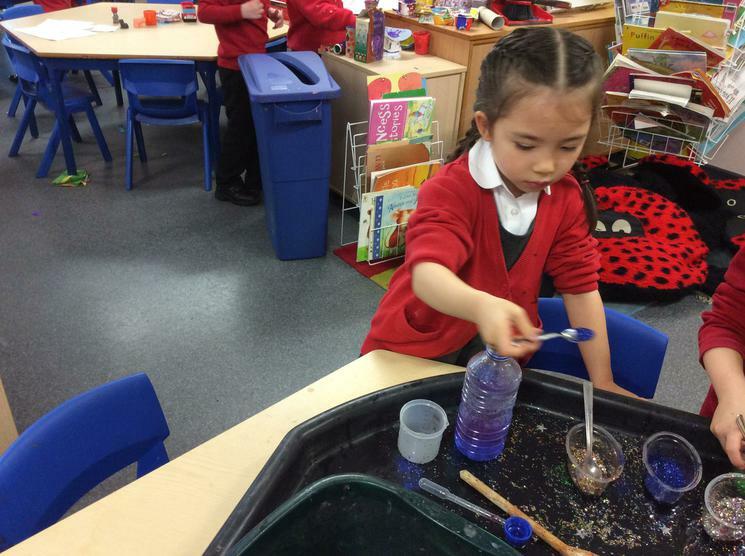 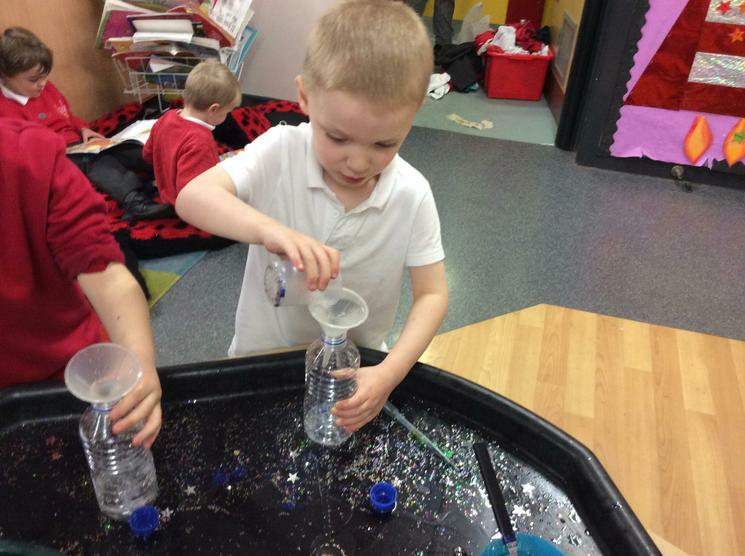 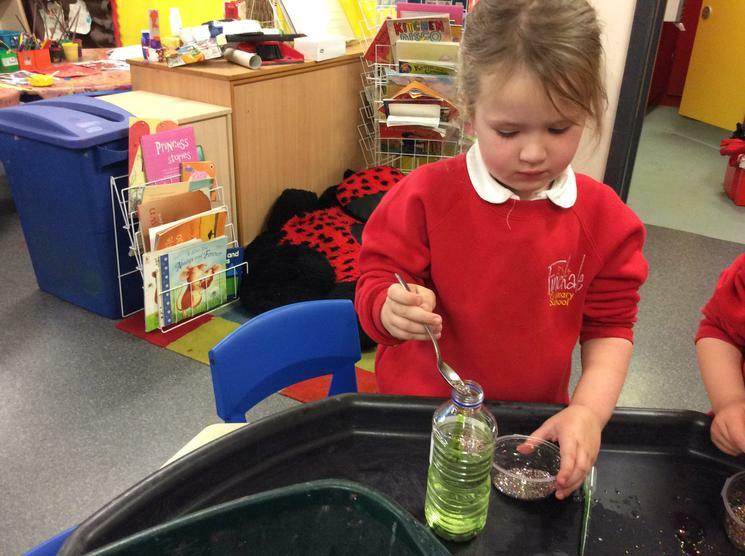 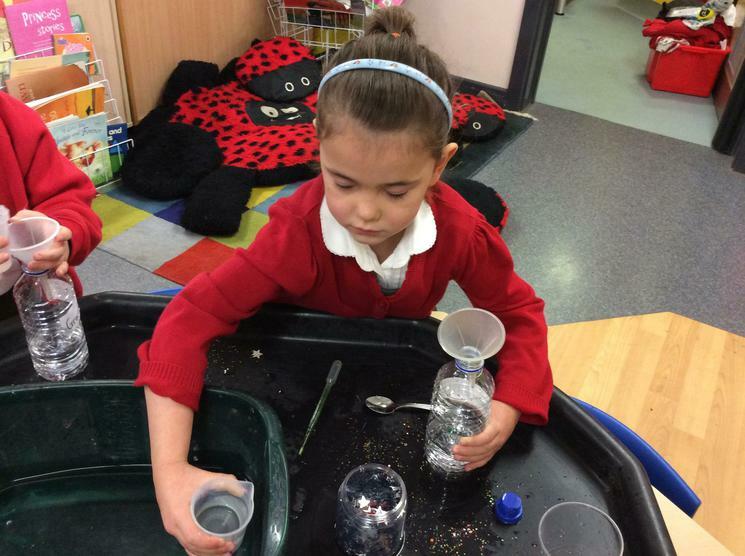 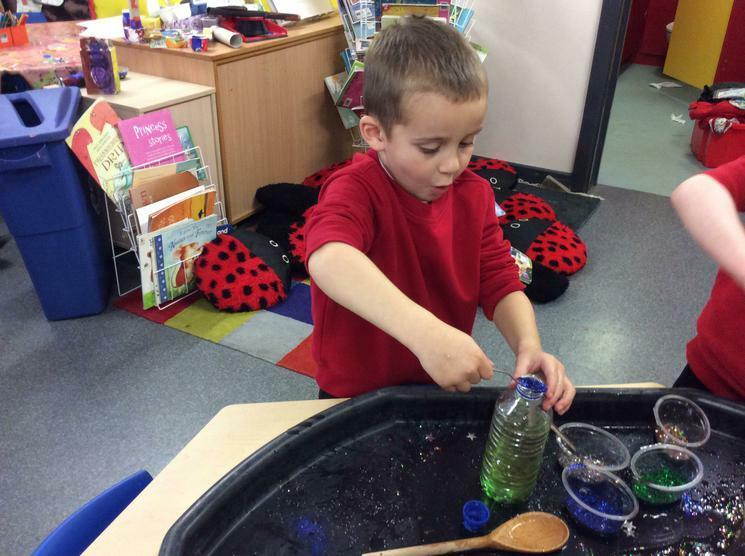 We created our own potions. 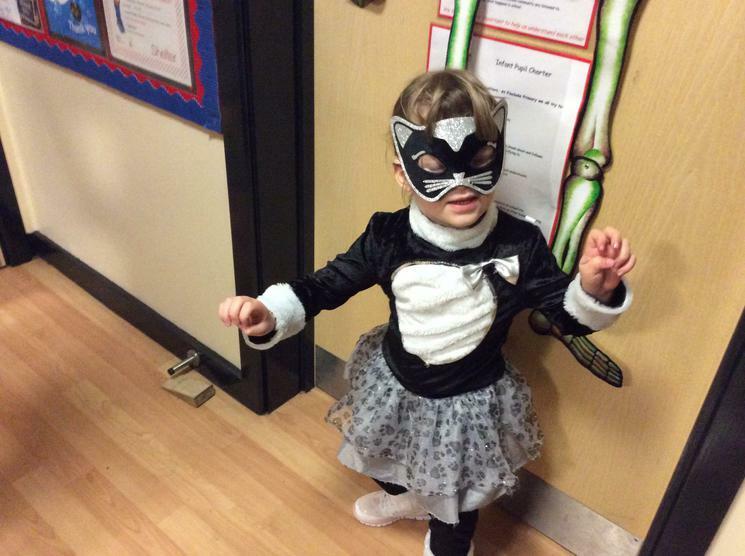 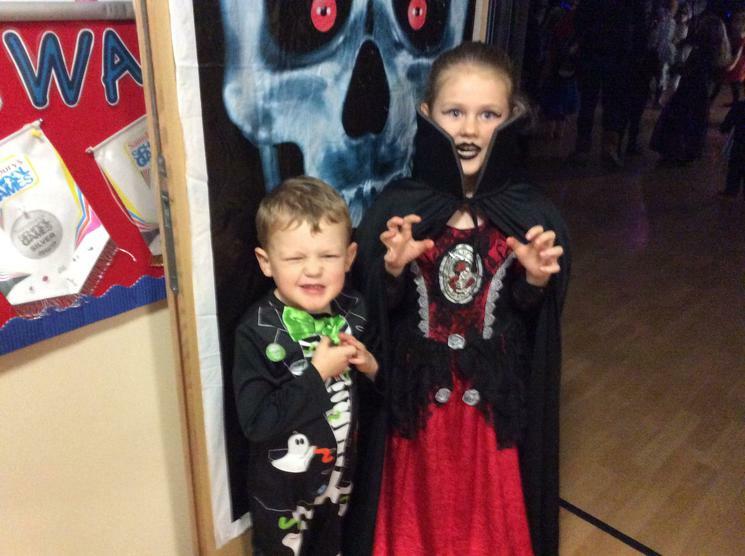 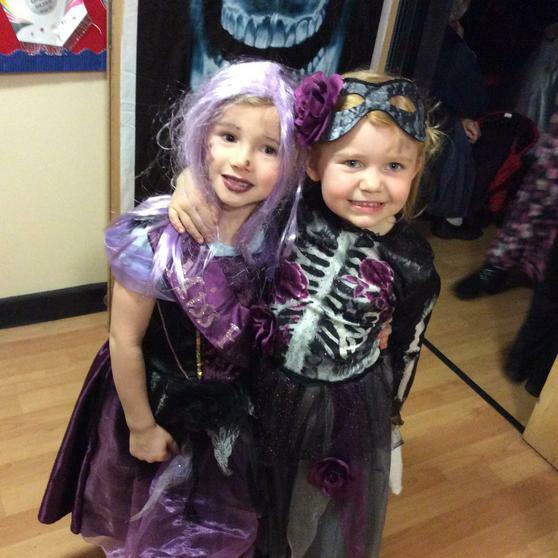 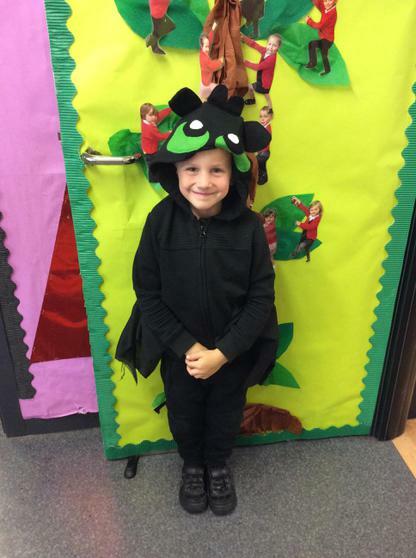 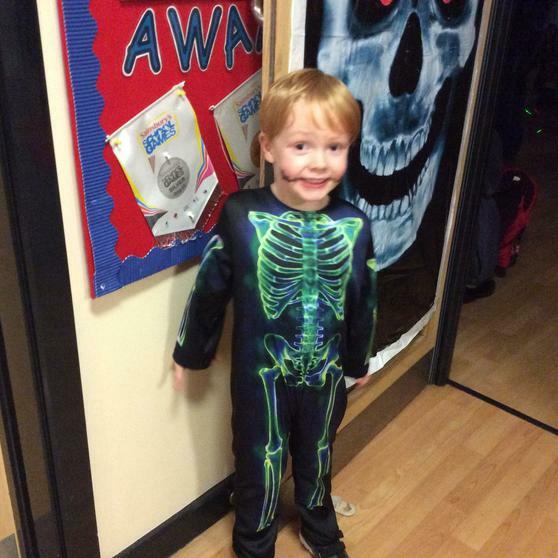 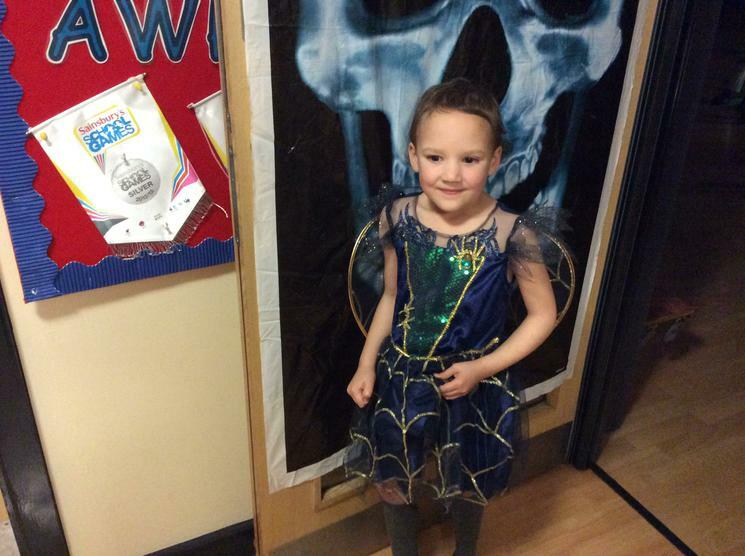 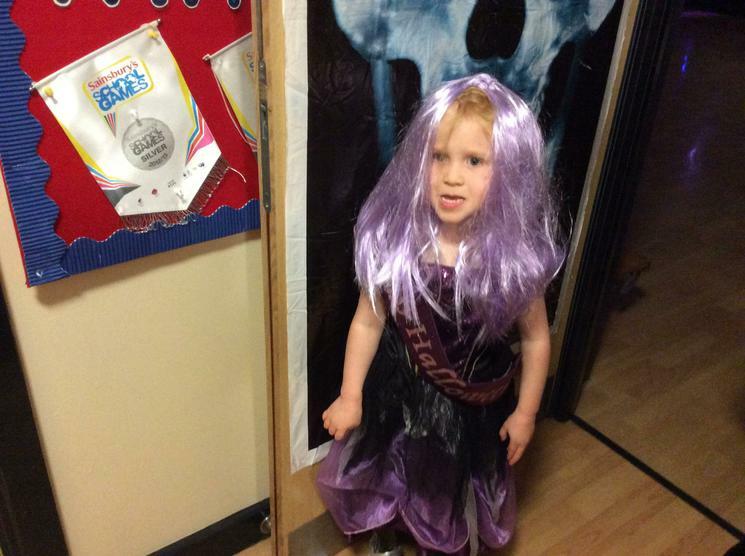 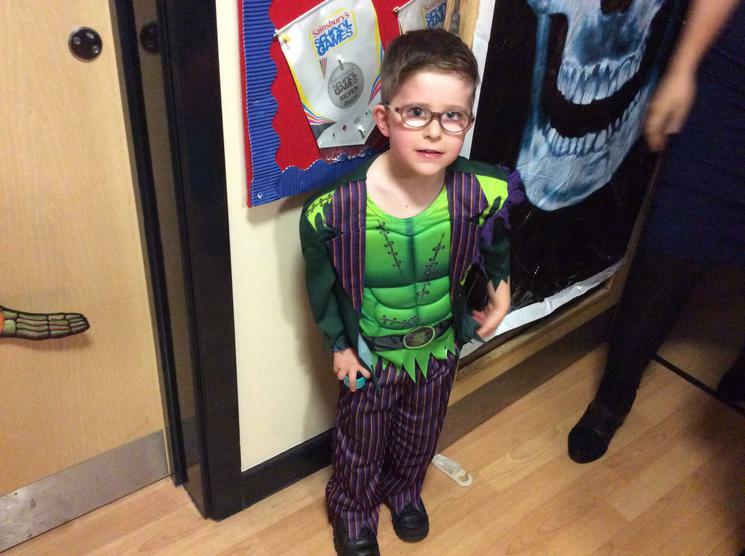 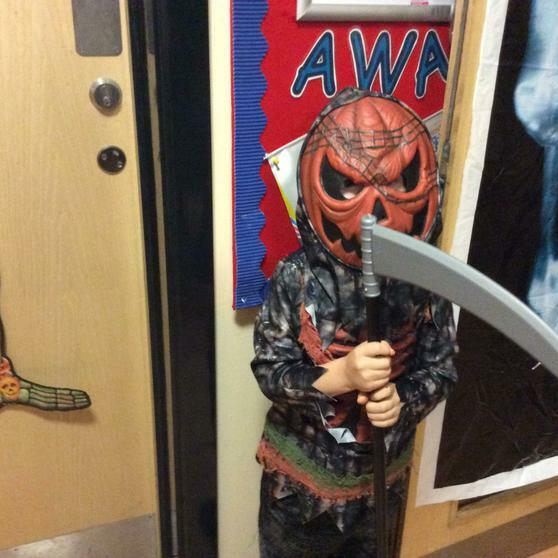 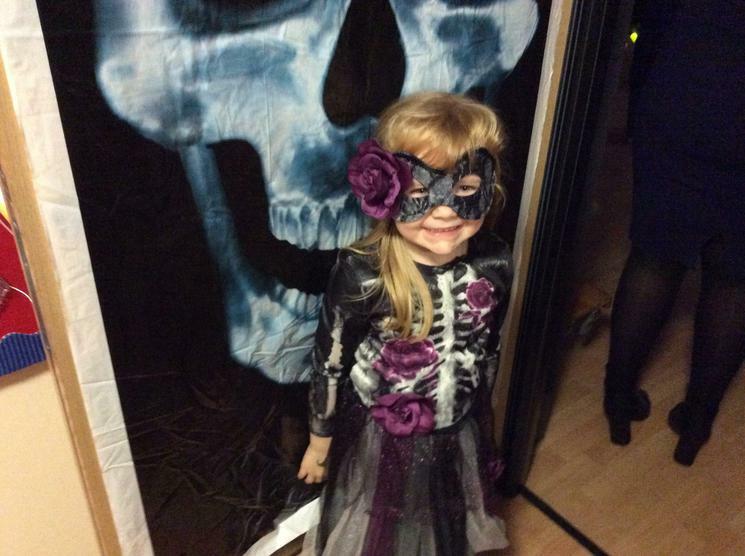 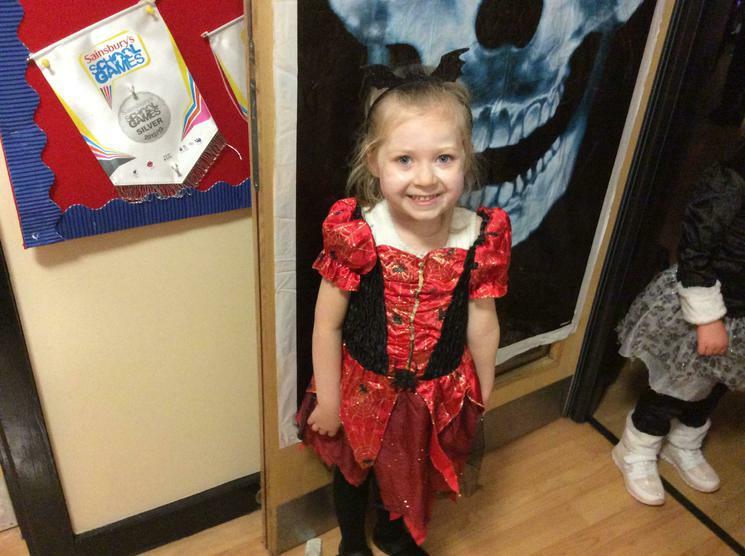 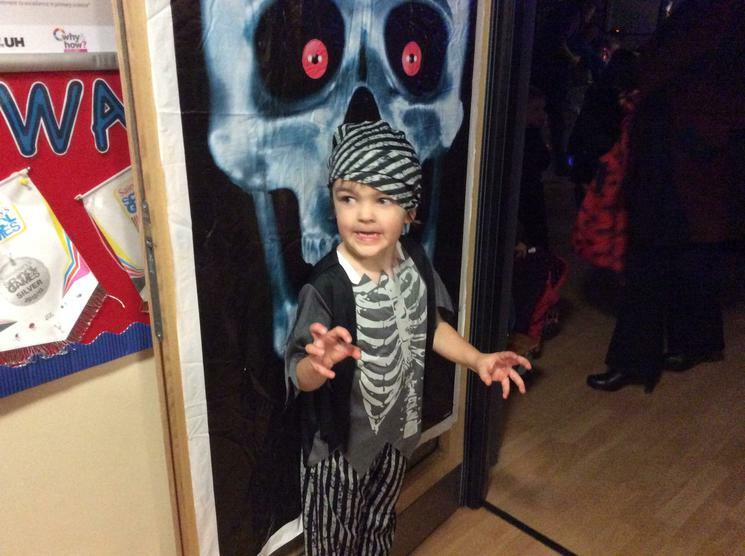 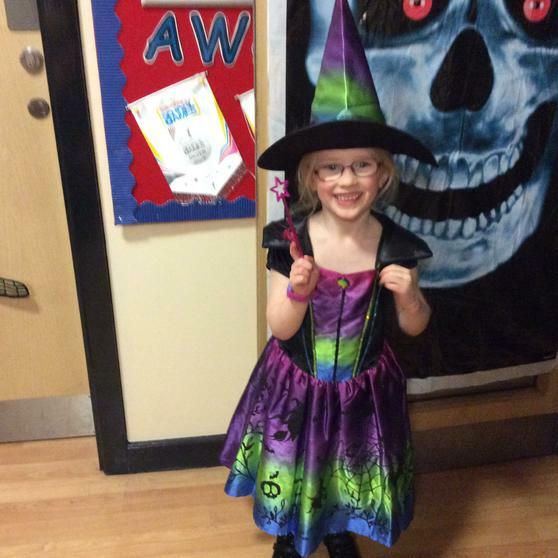 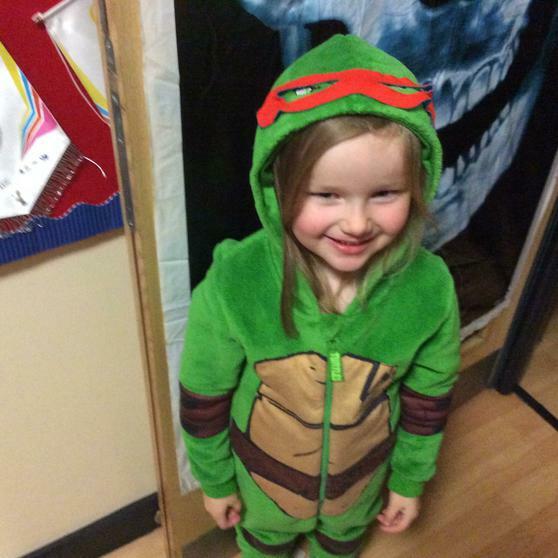 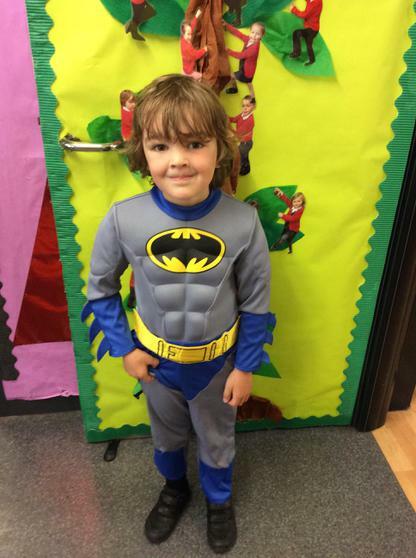 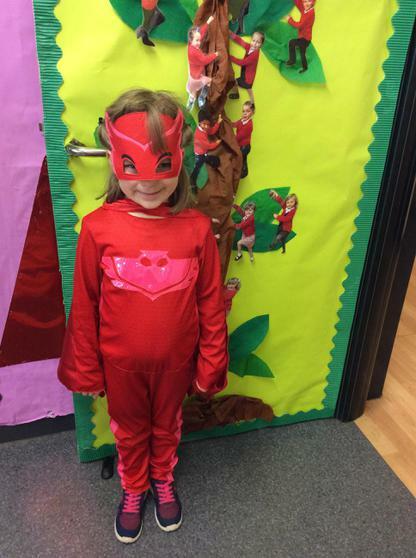 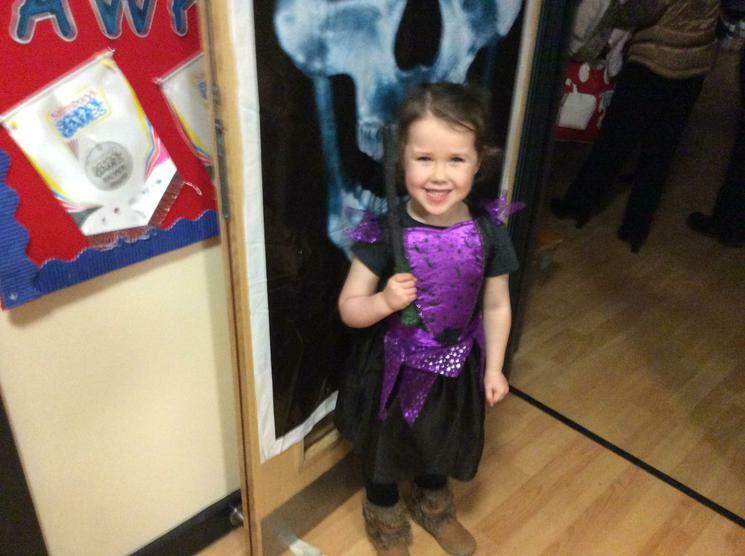 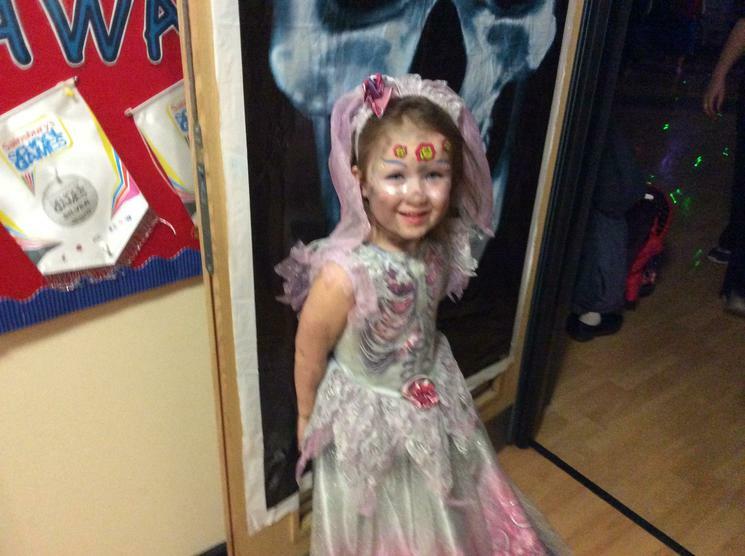 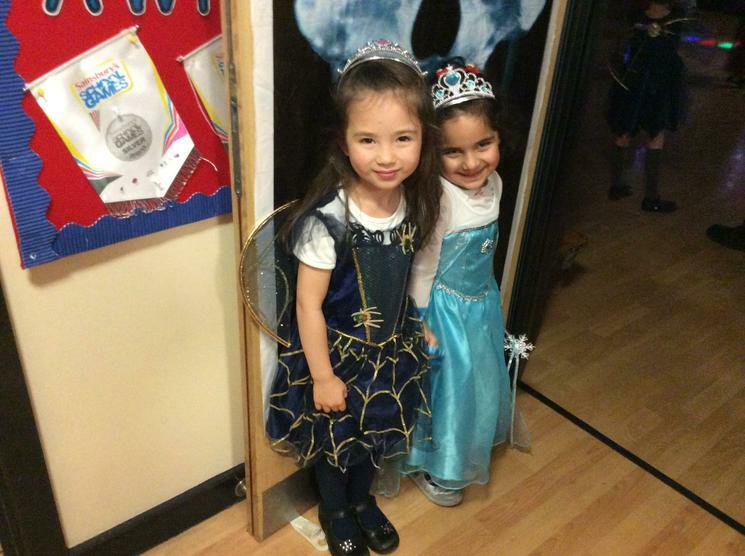 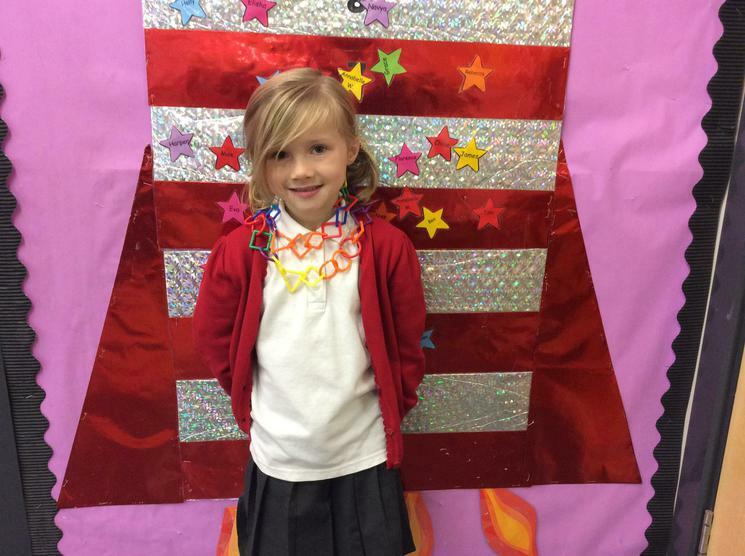 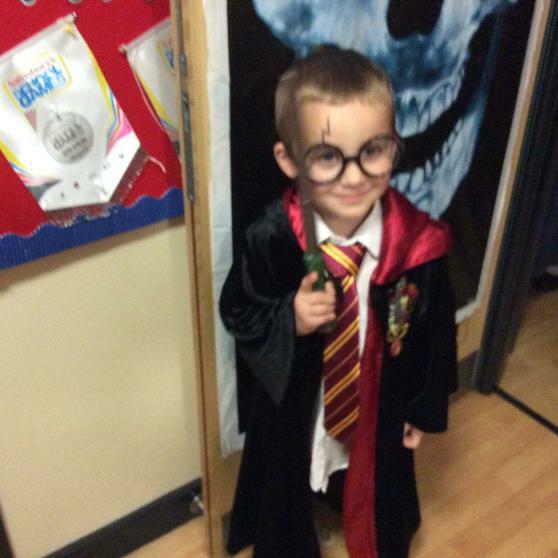 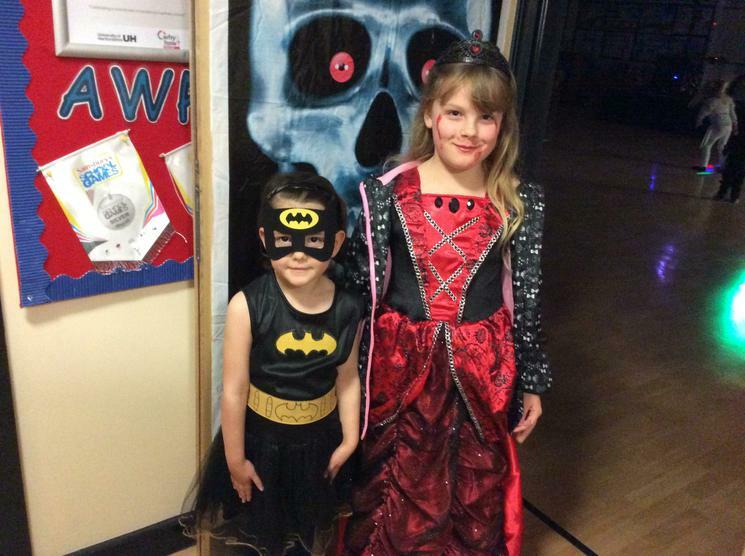 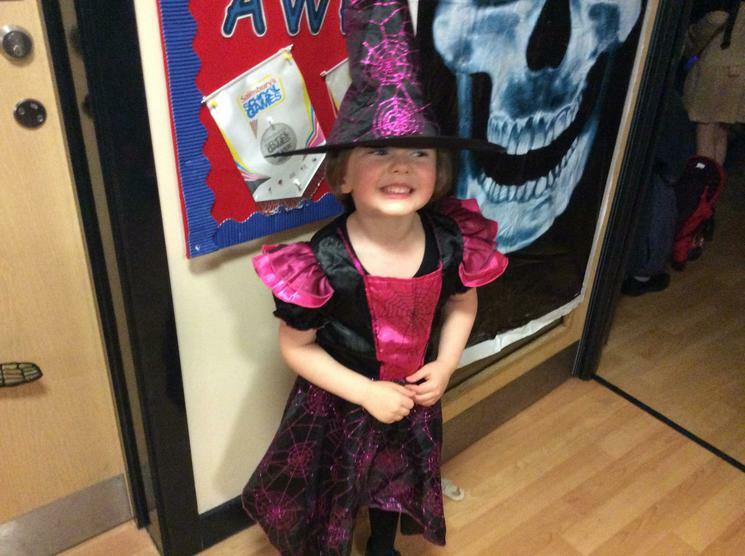 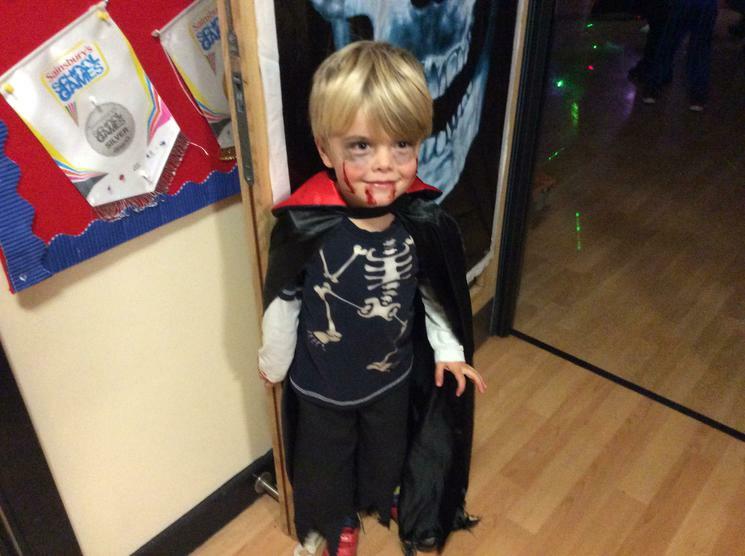 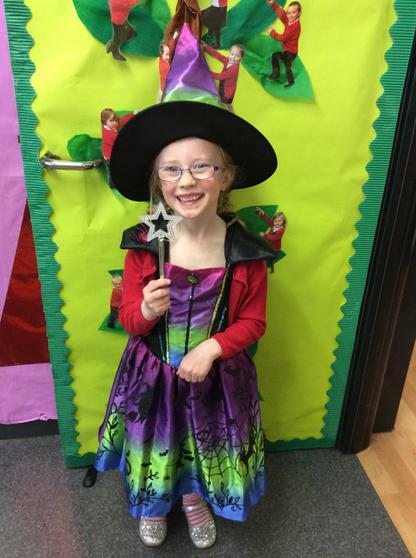 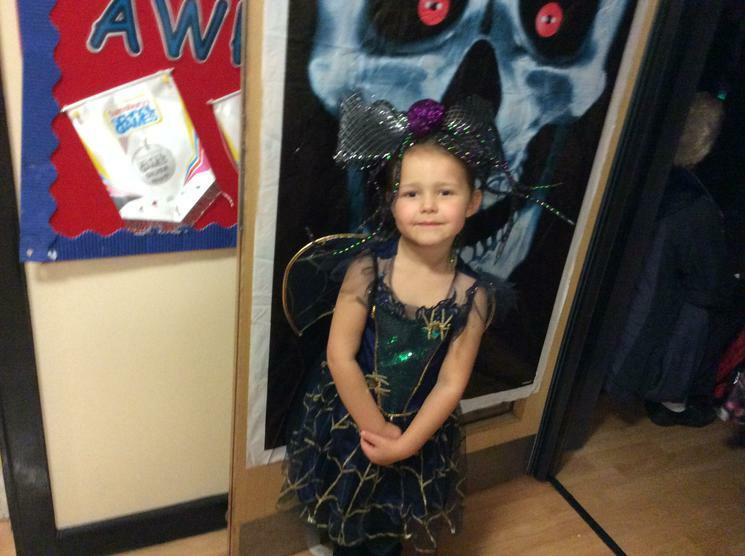 Some of us enjoyed our first PTA Hallowe'en disco. 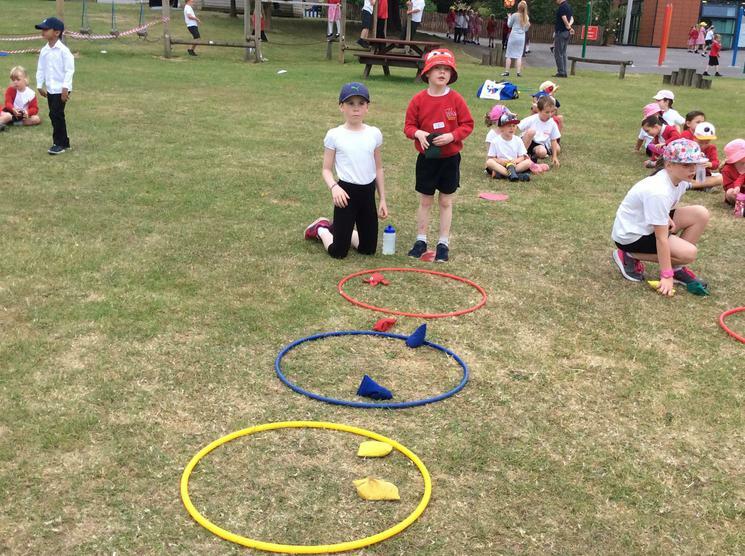 Do you recognise us? 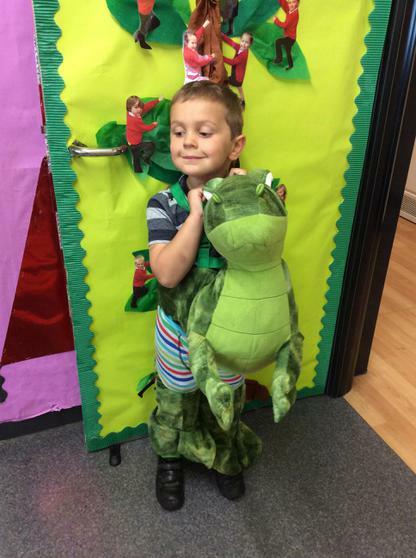 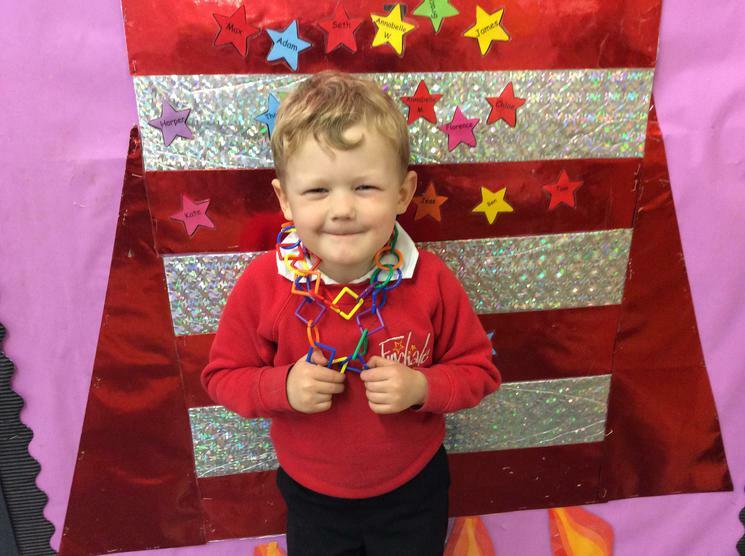 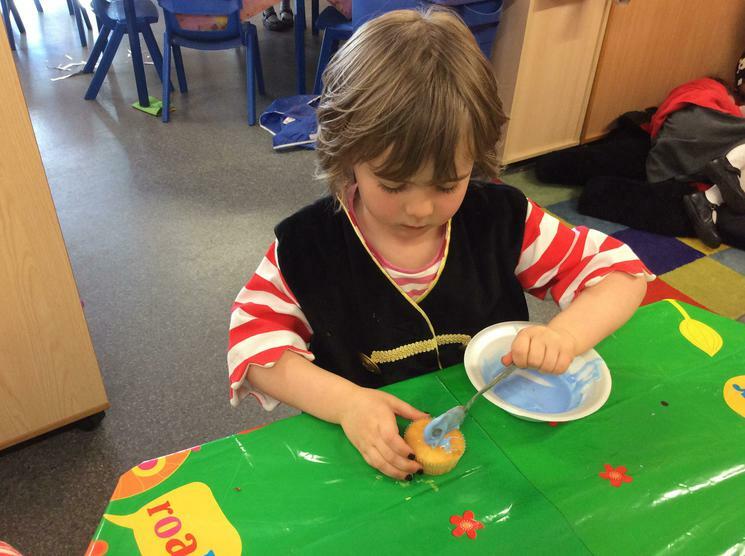 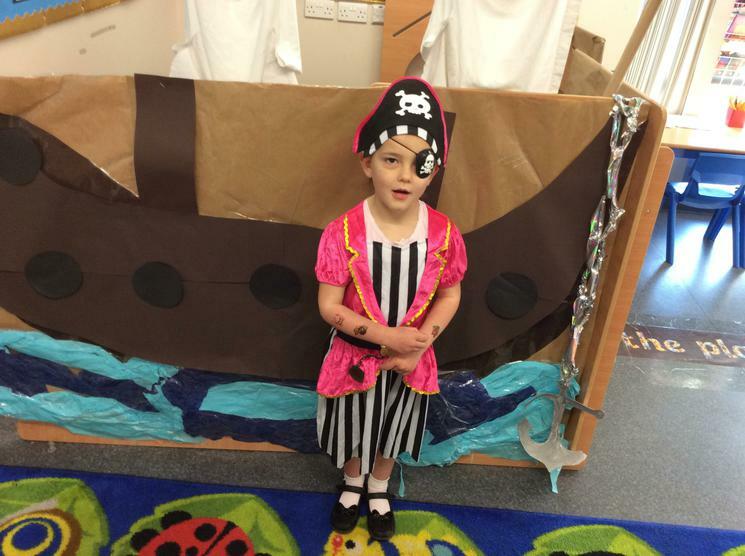 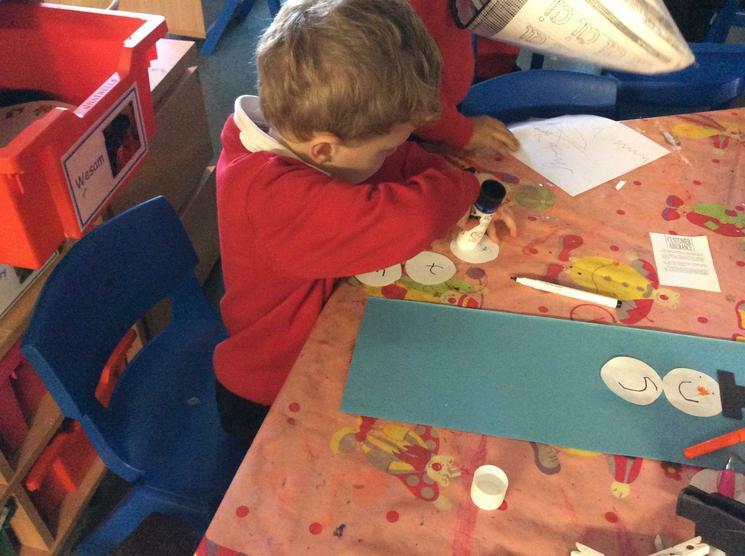 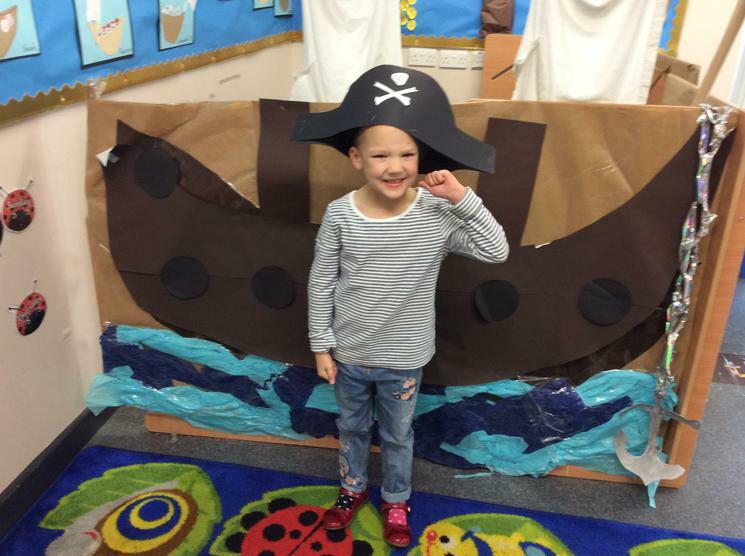 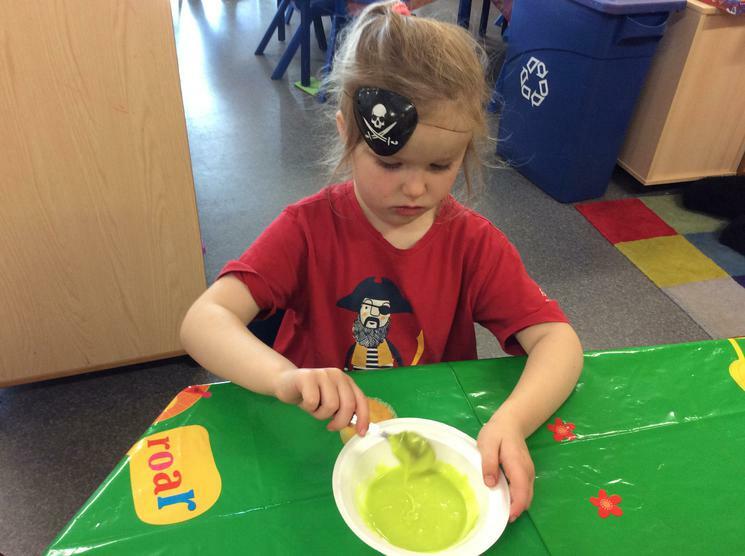 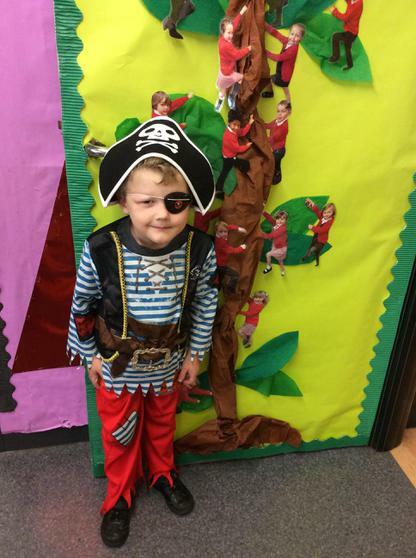 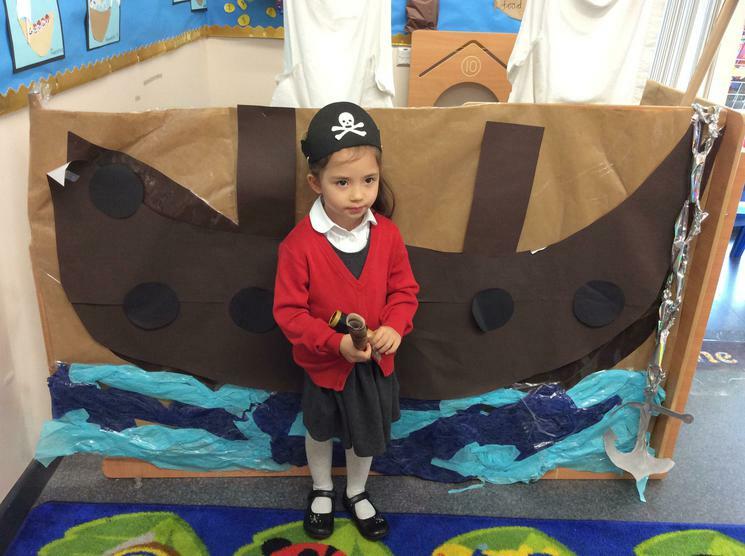 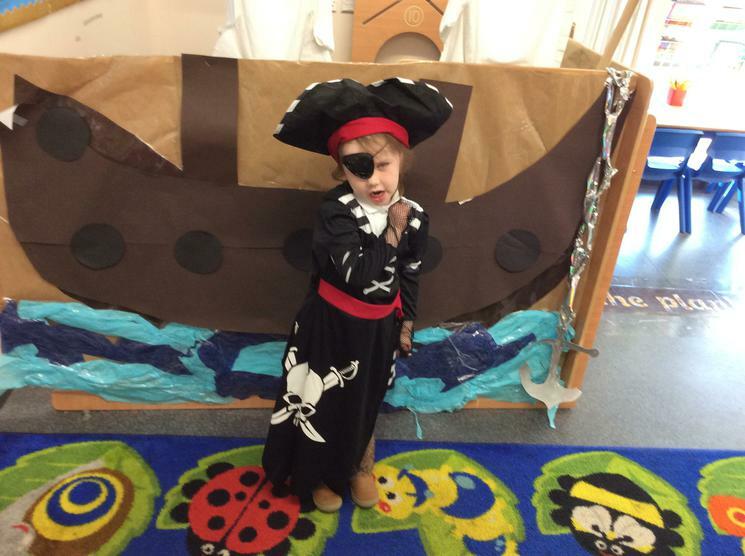 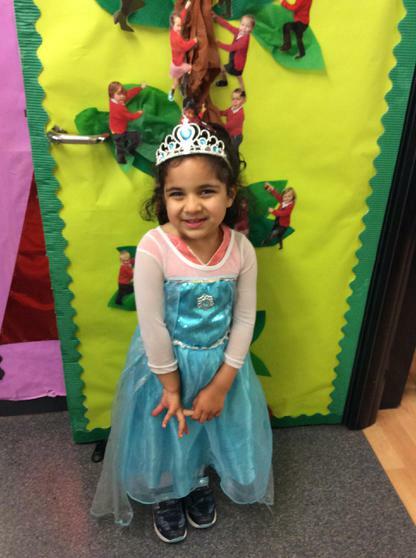 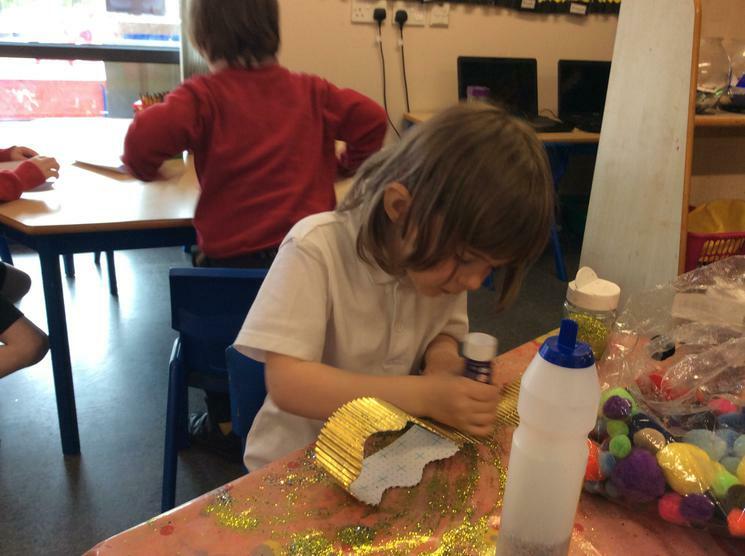 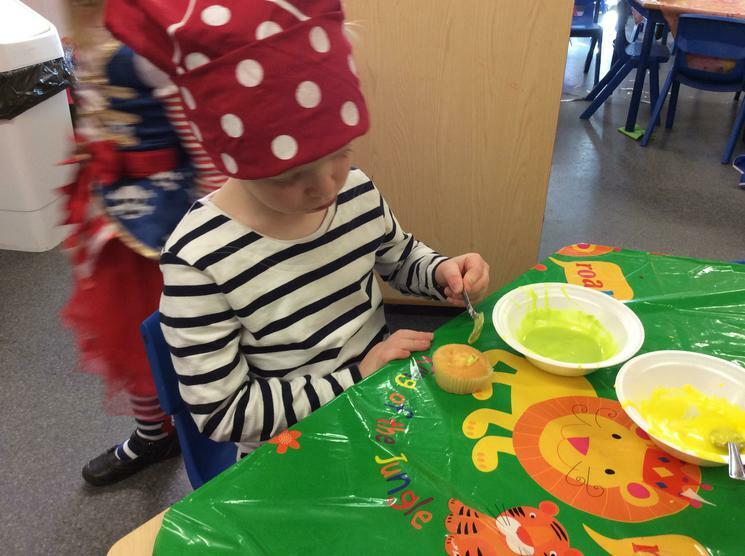 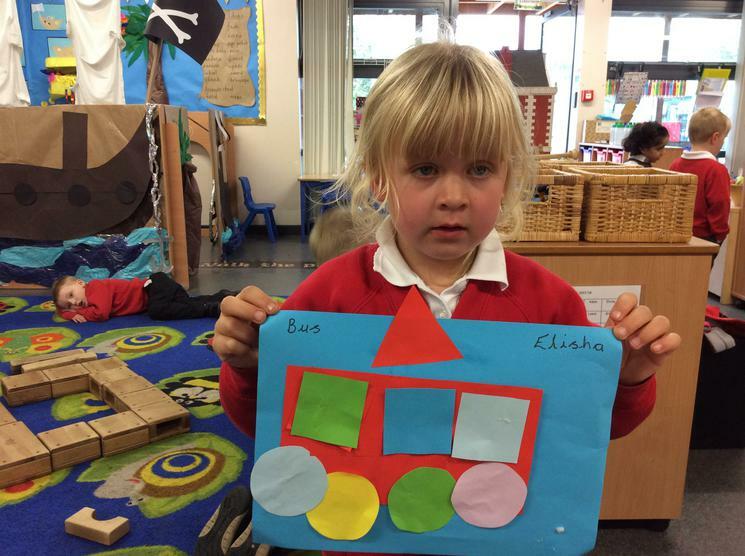 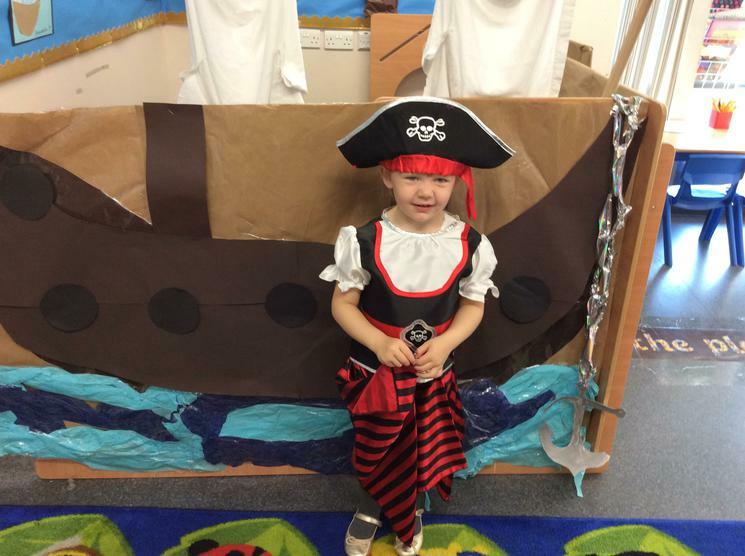 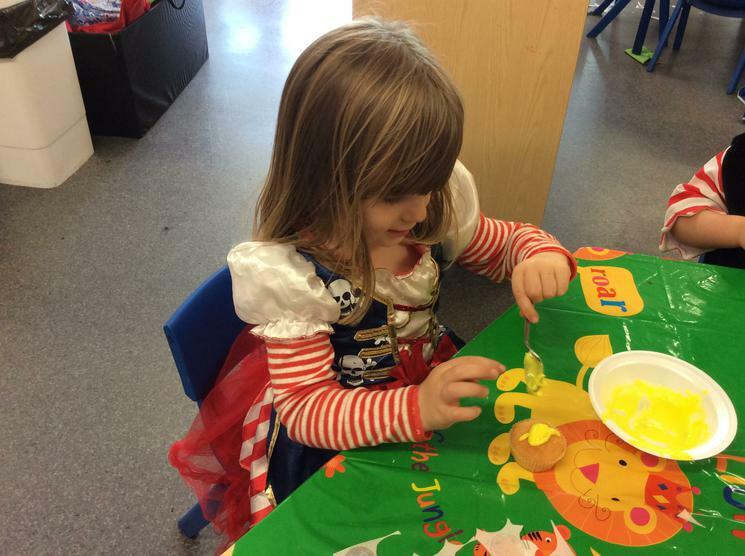 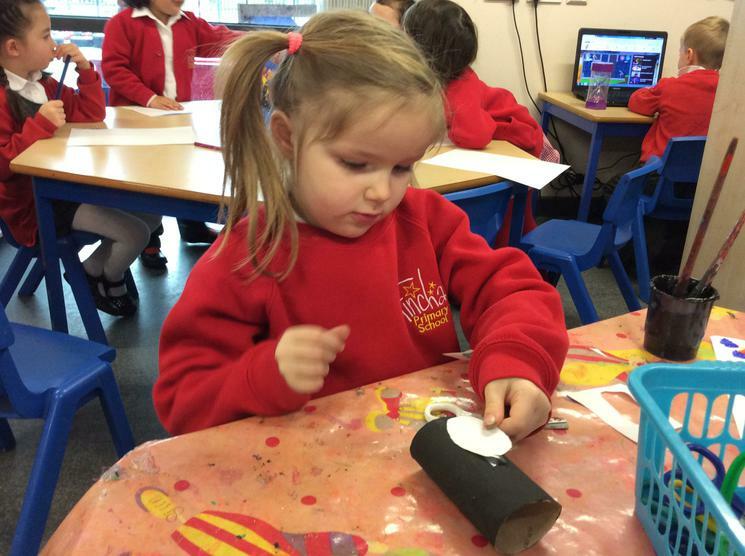 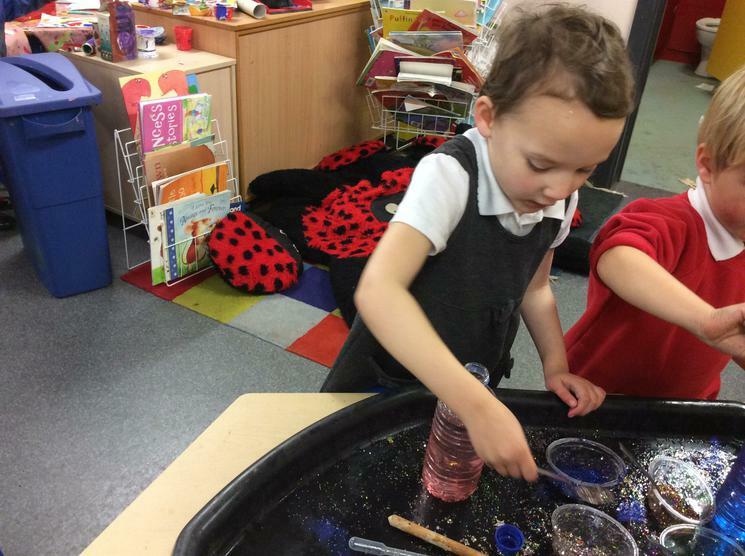 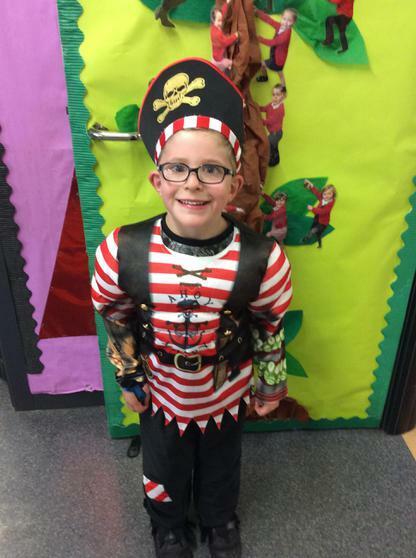 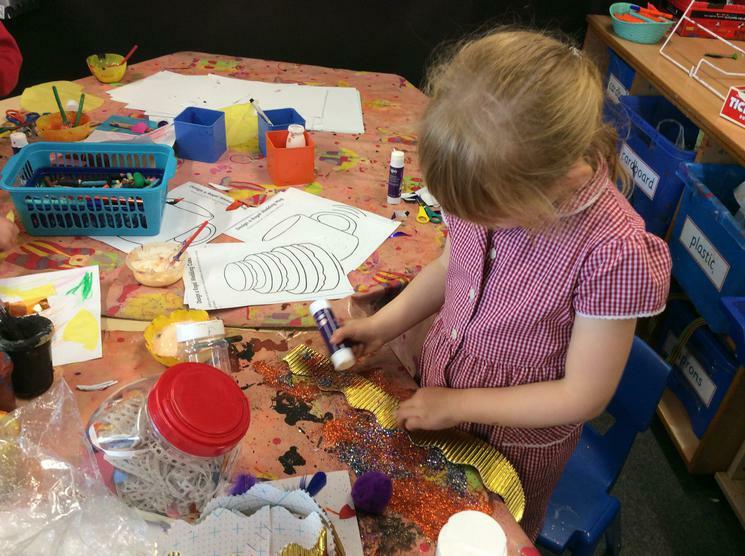 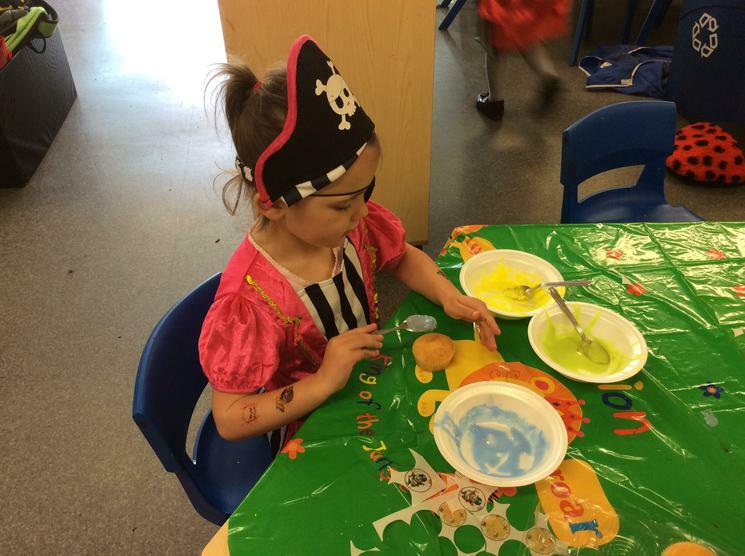 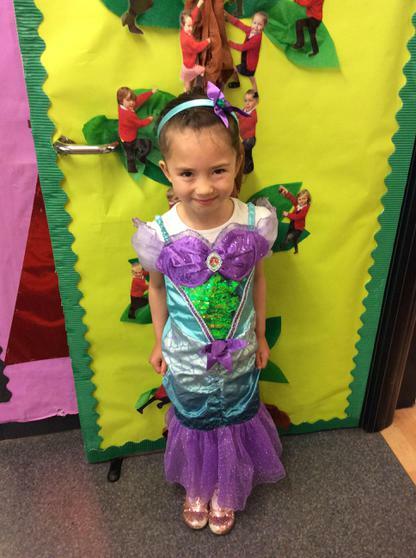 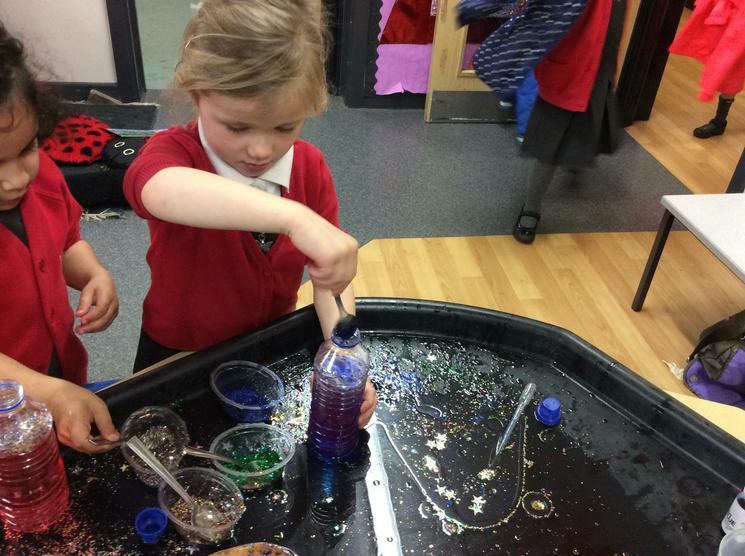 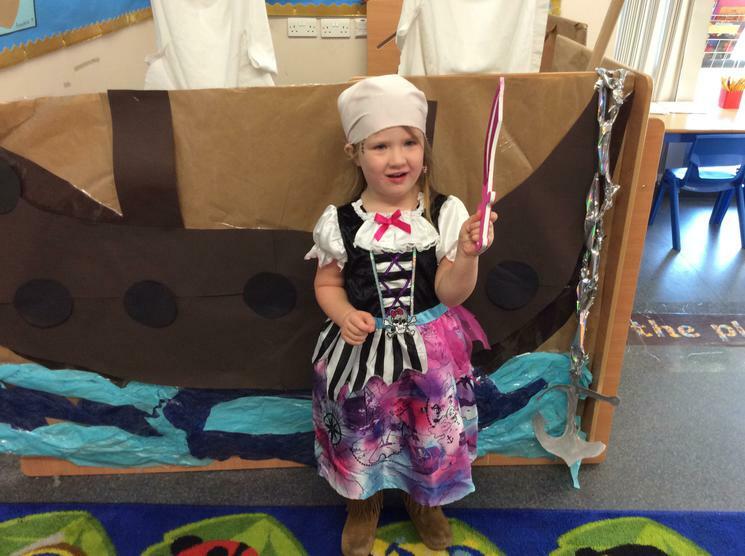 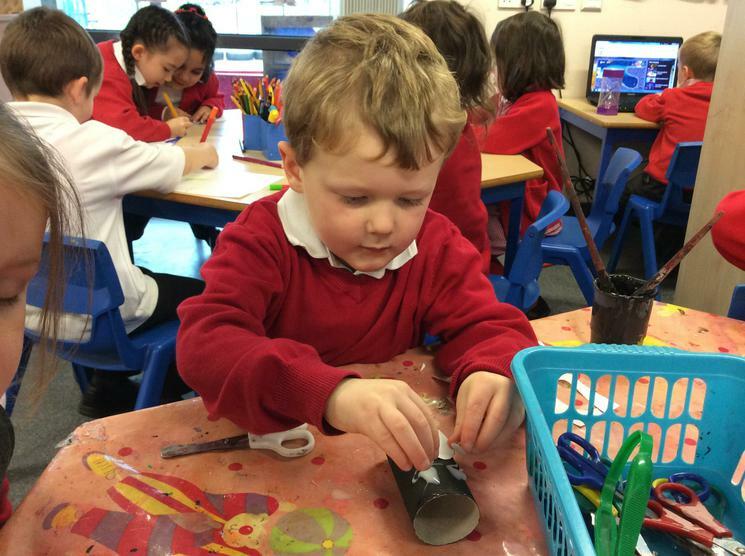 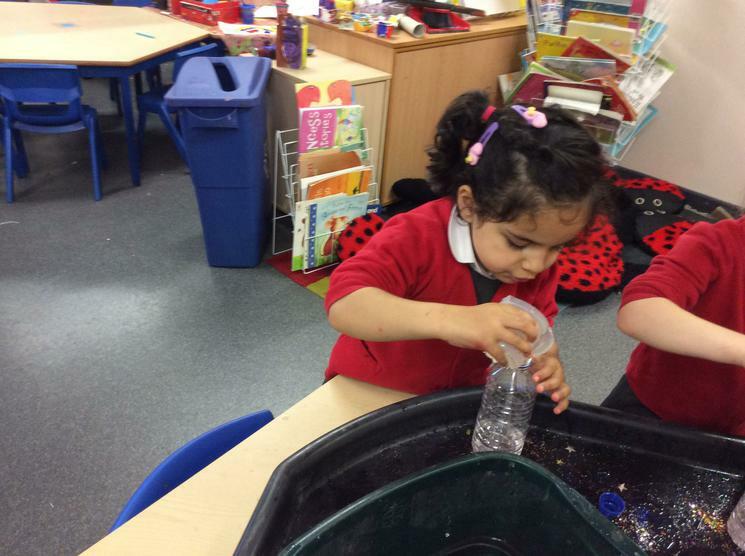 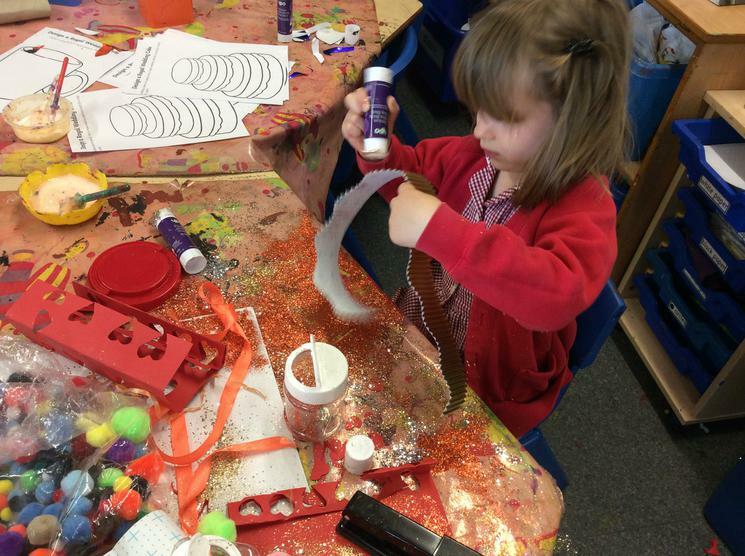 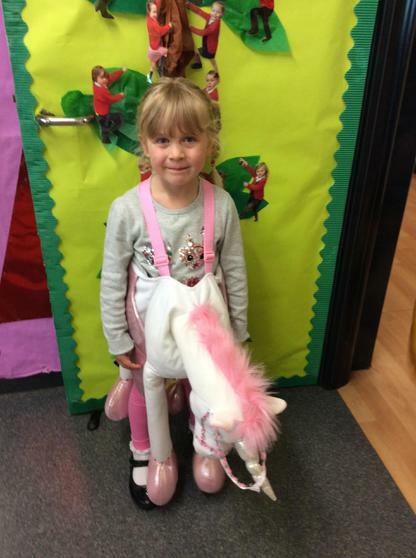 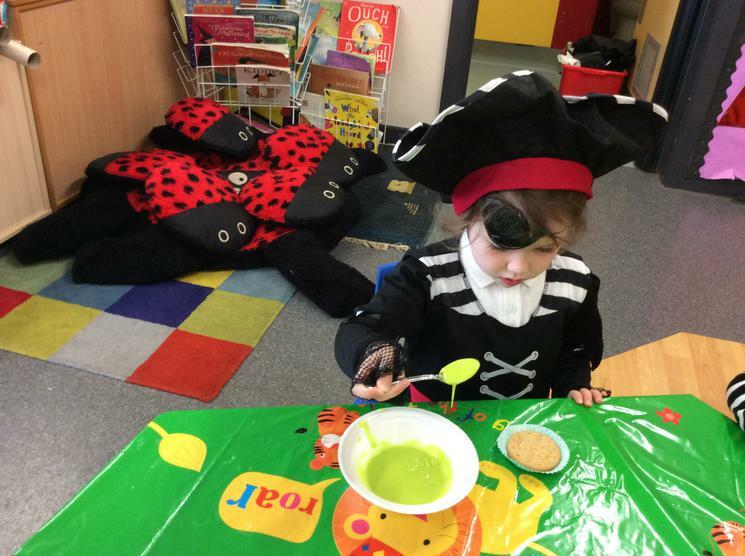 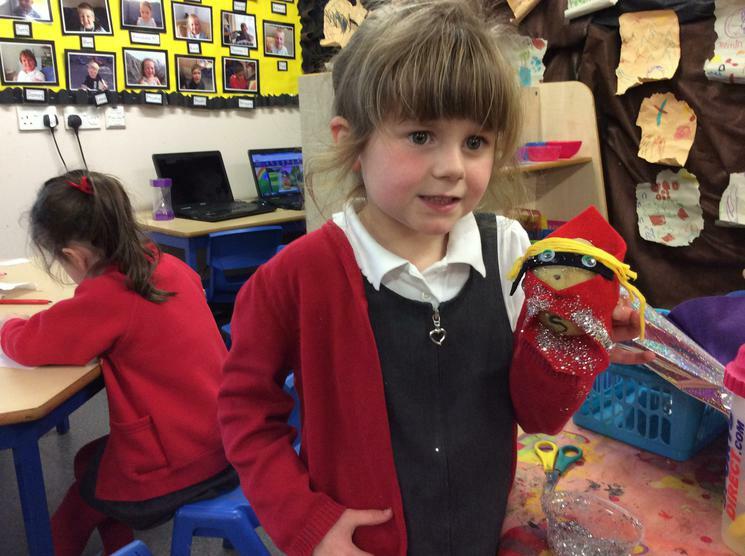 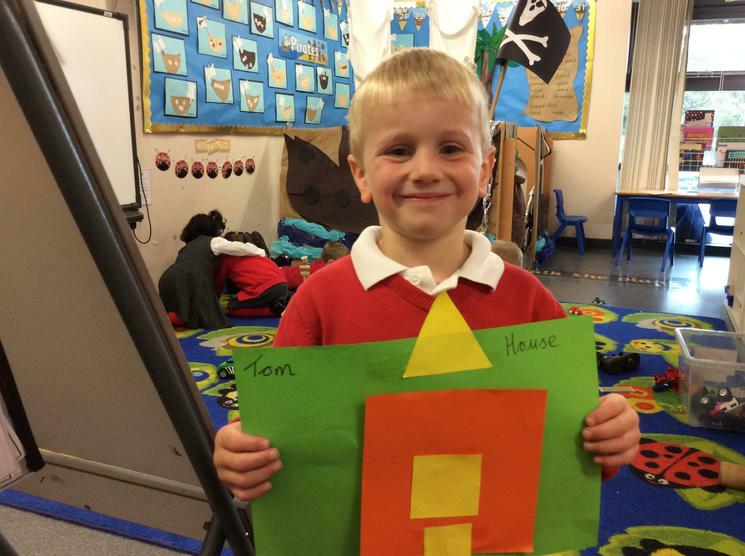 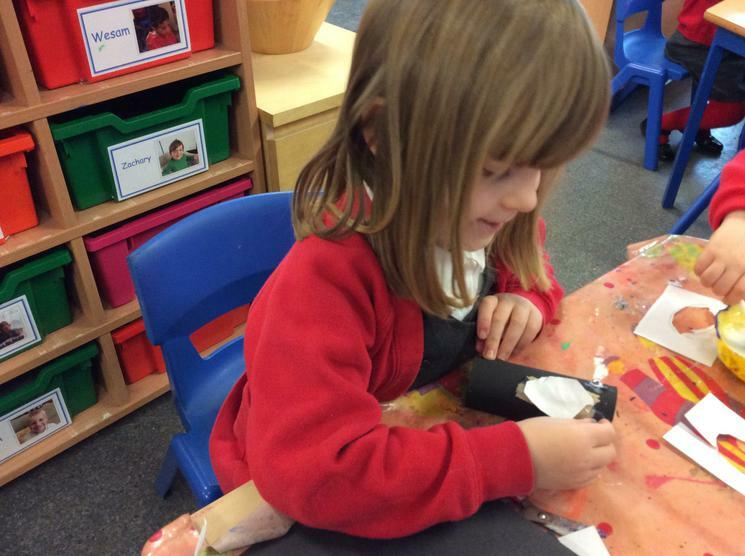 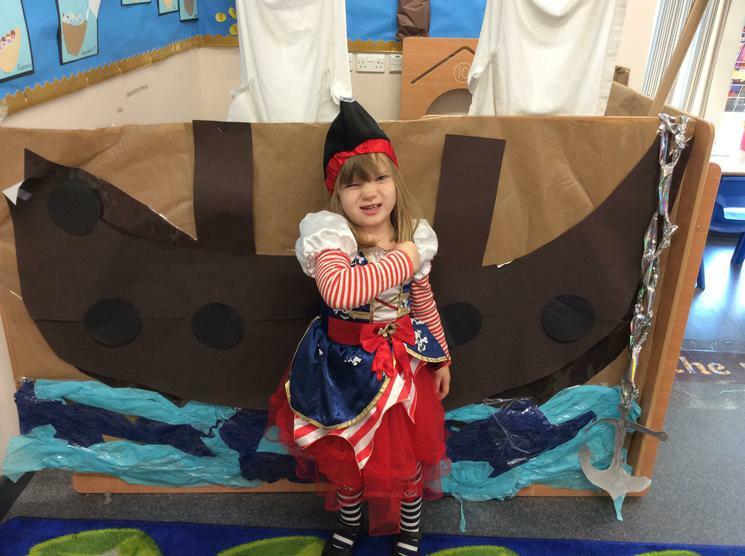 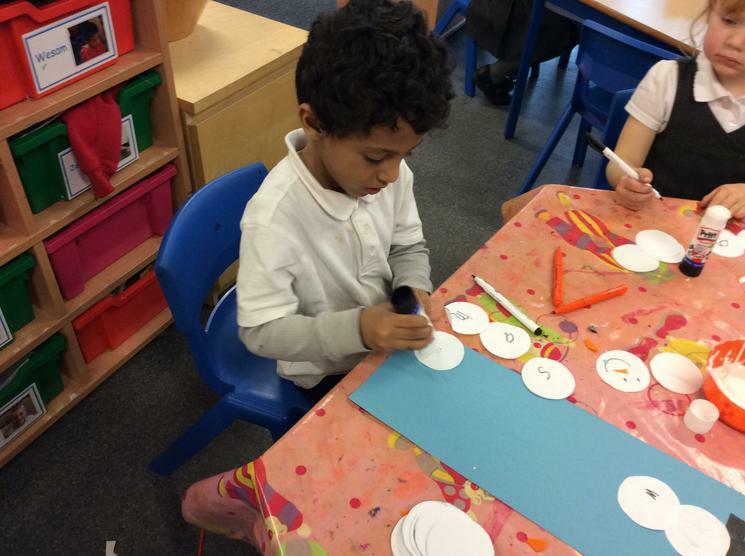 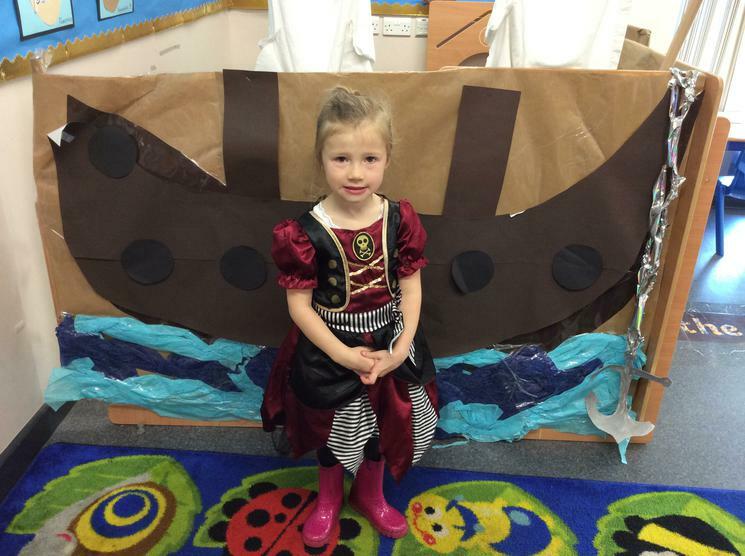 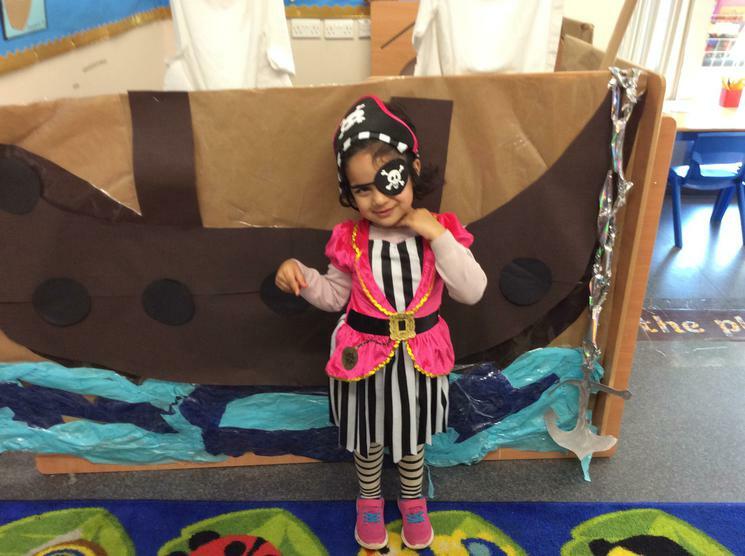 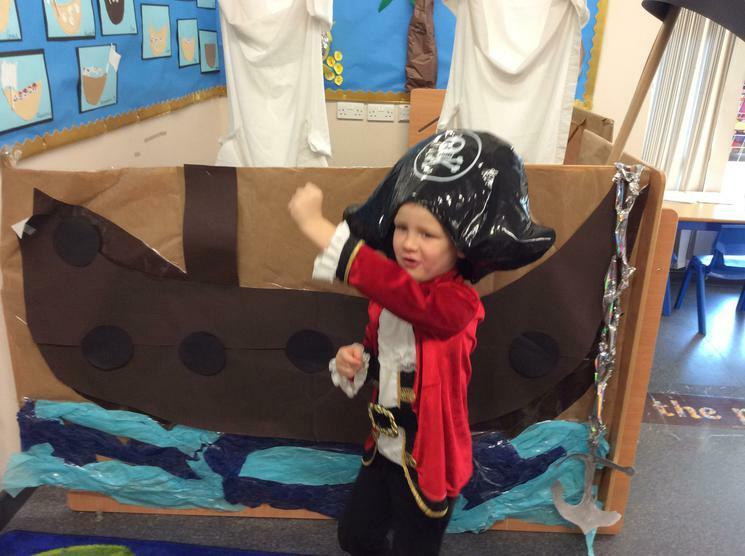 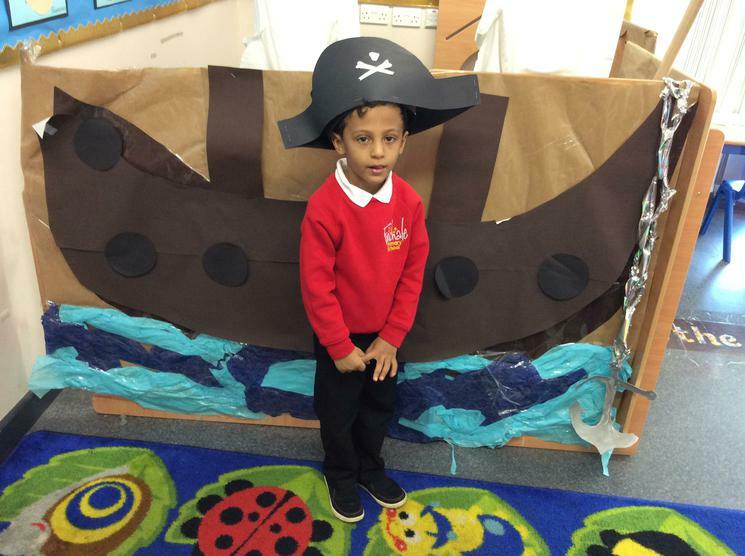 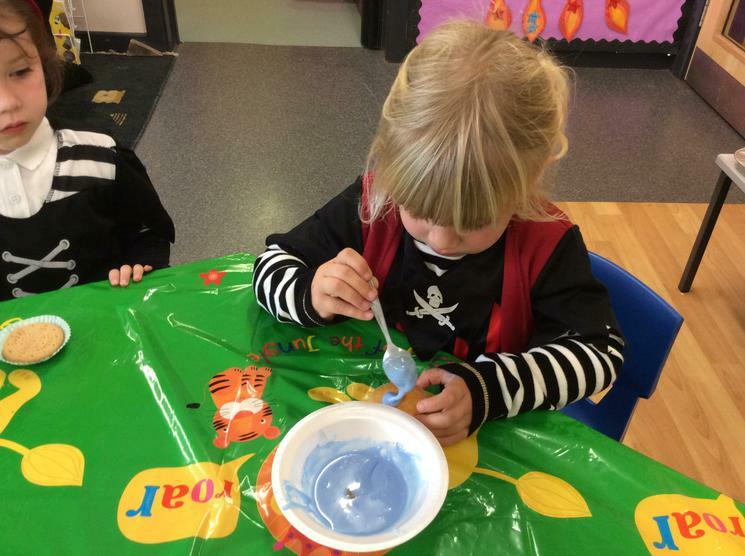 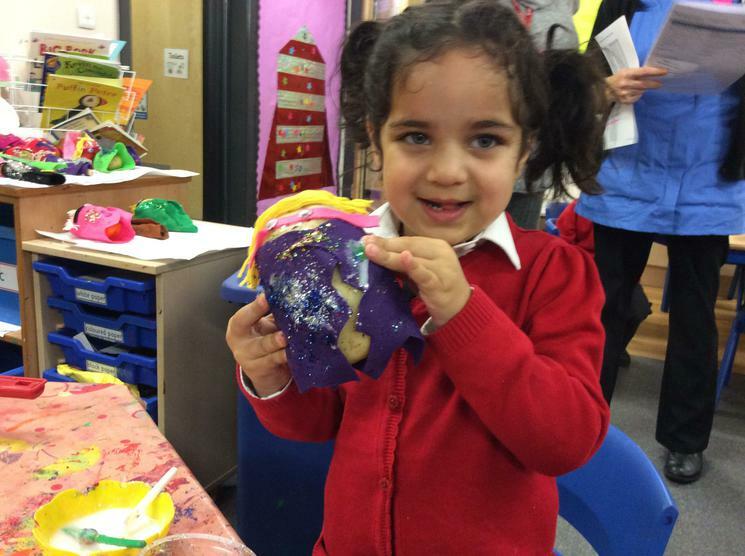 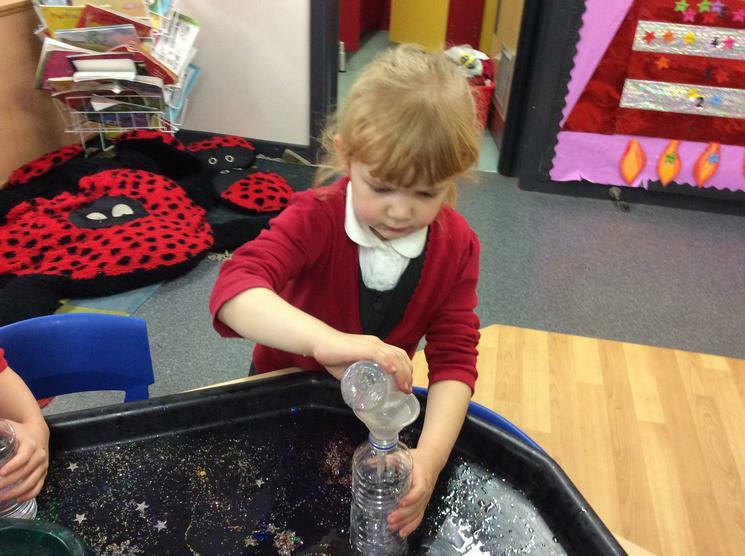 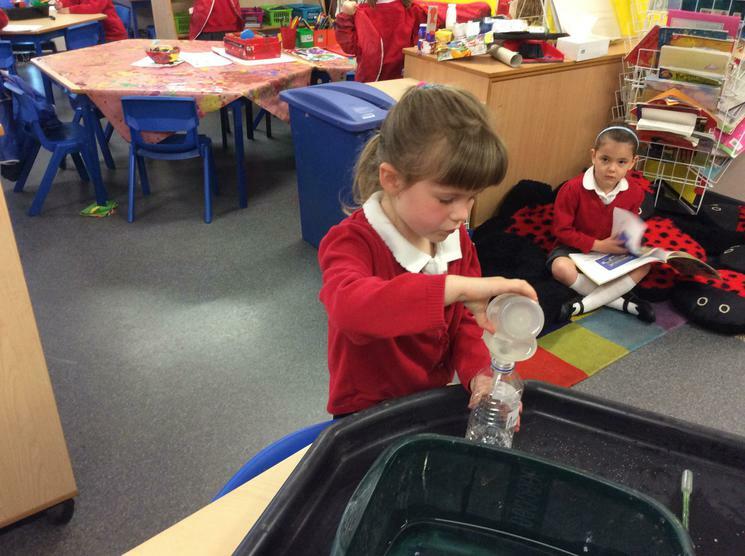 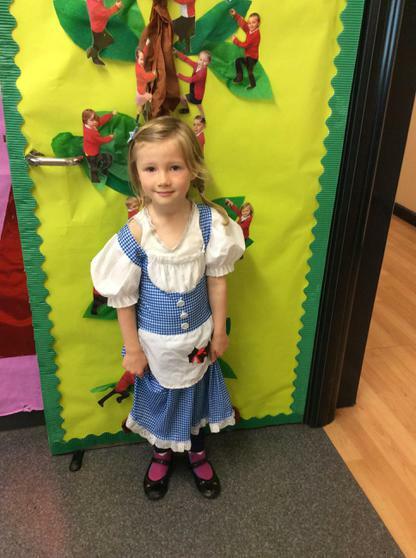 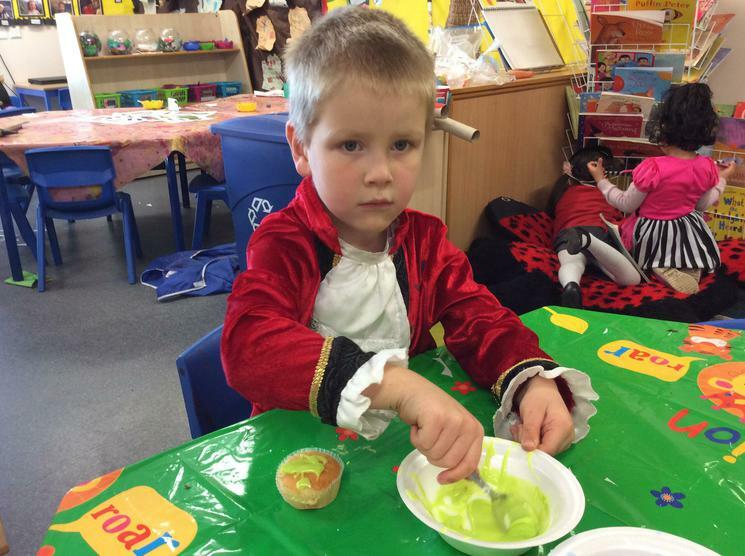 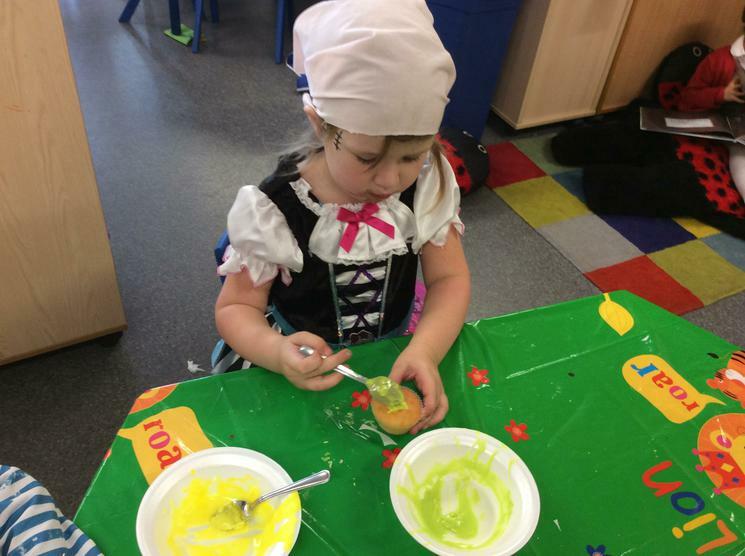 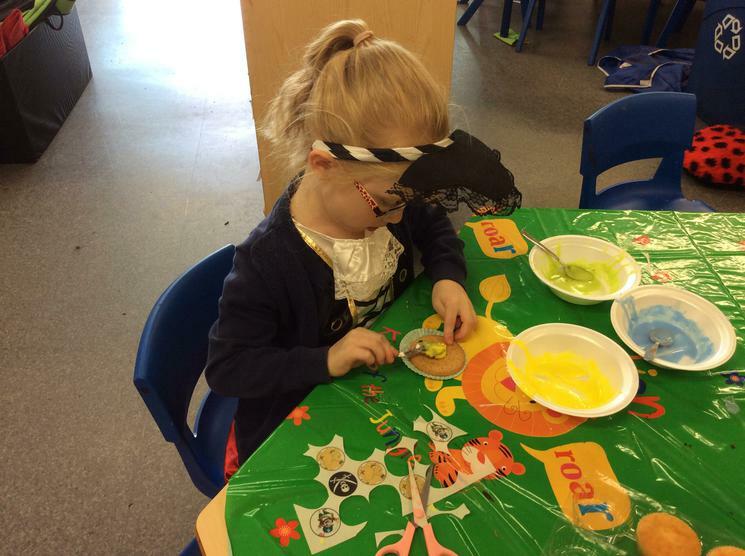 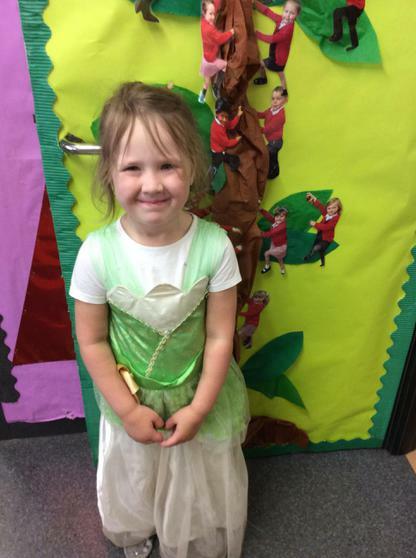 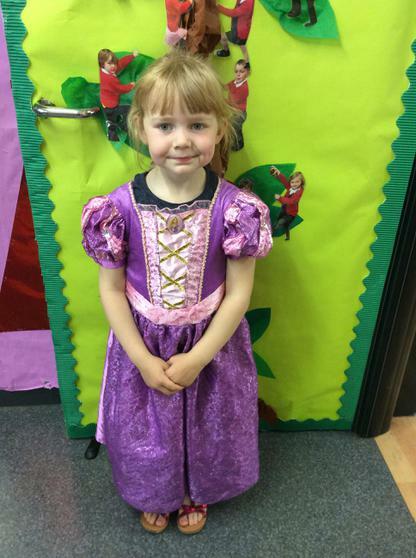 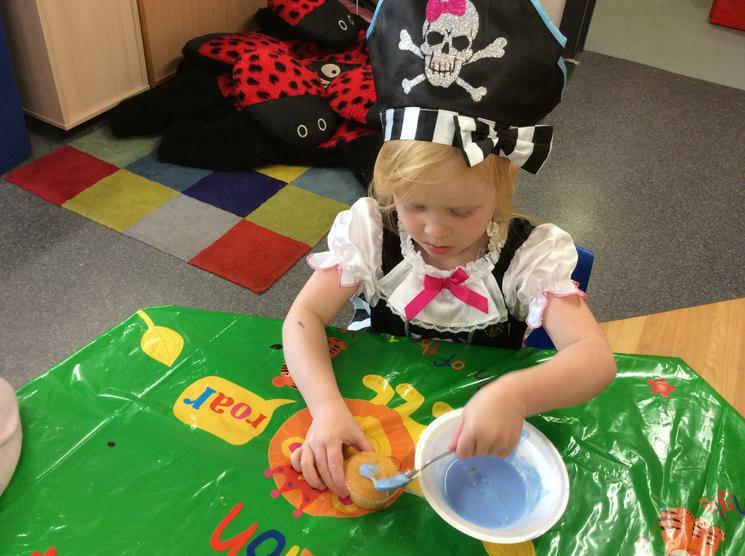 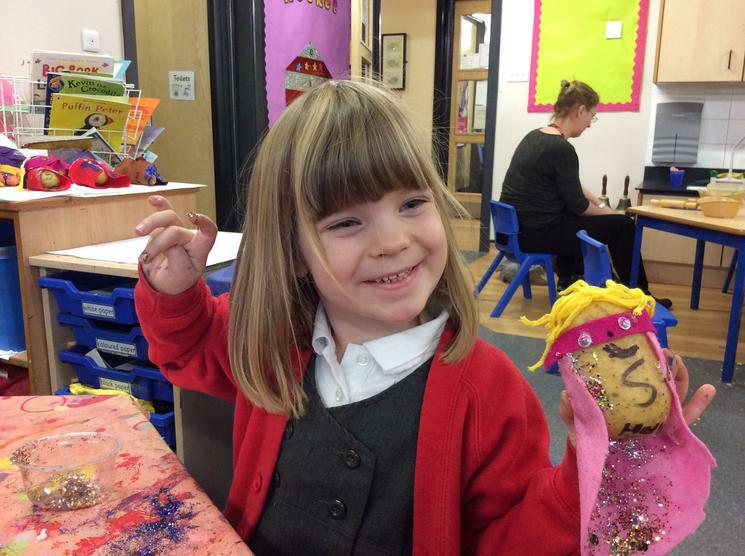 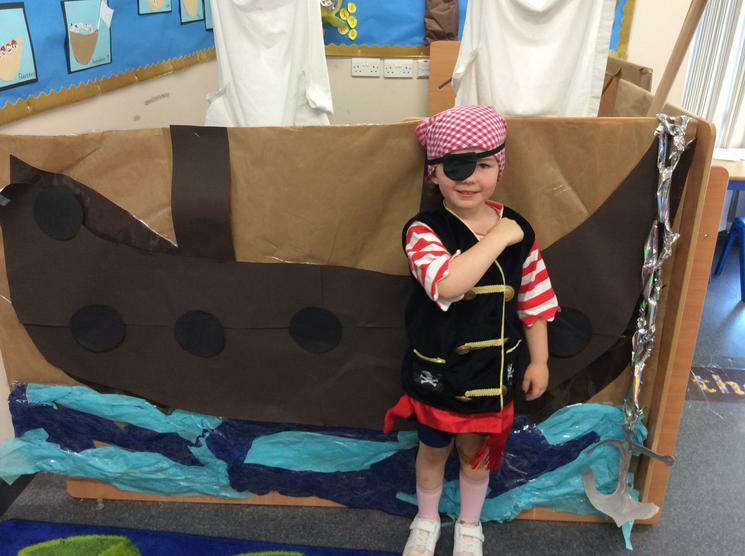 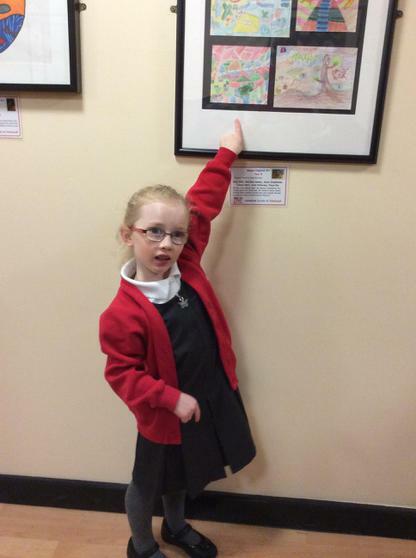 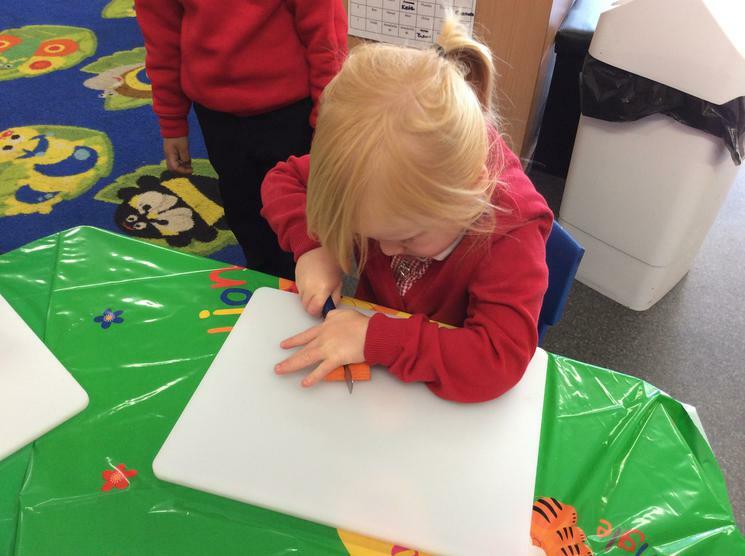 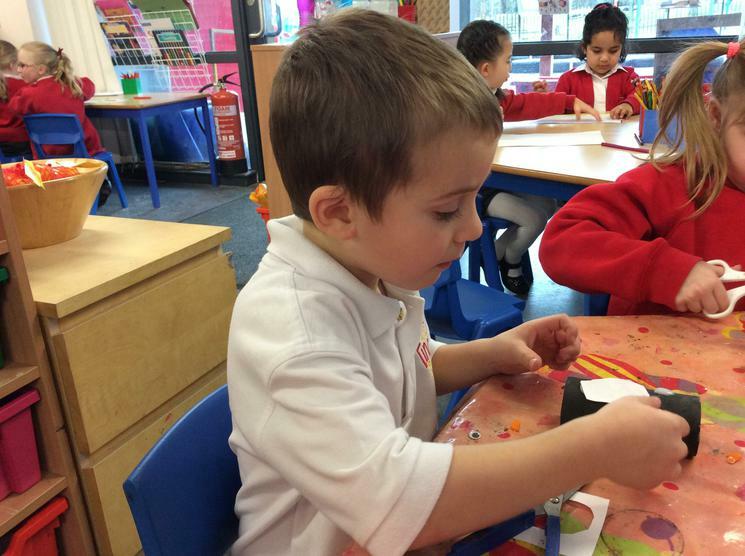 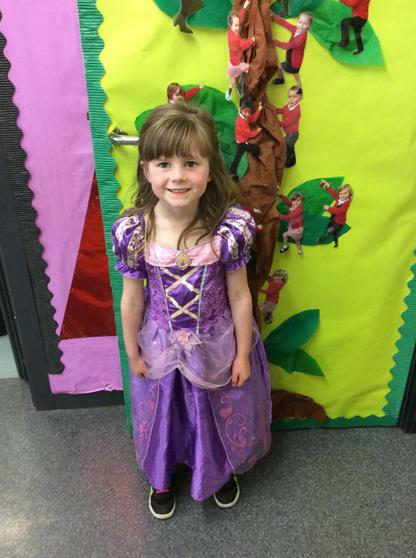 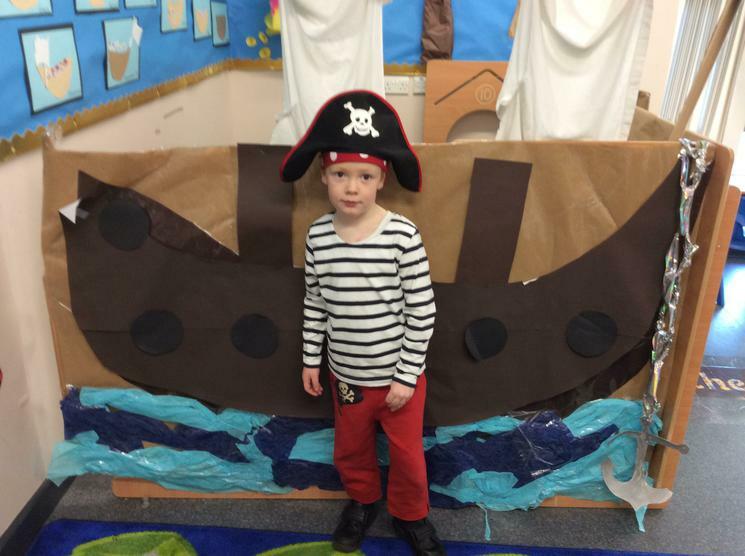 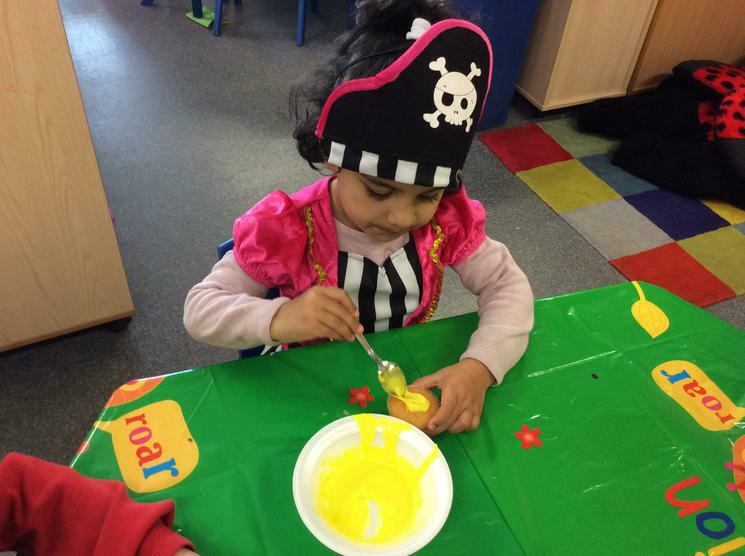 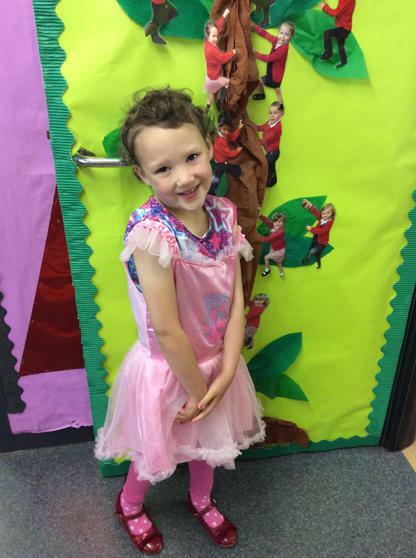 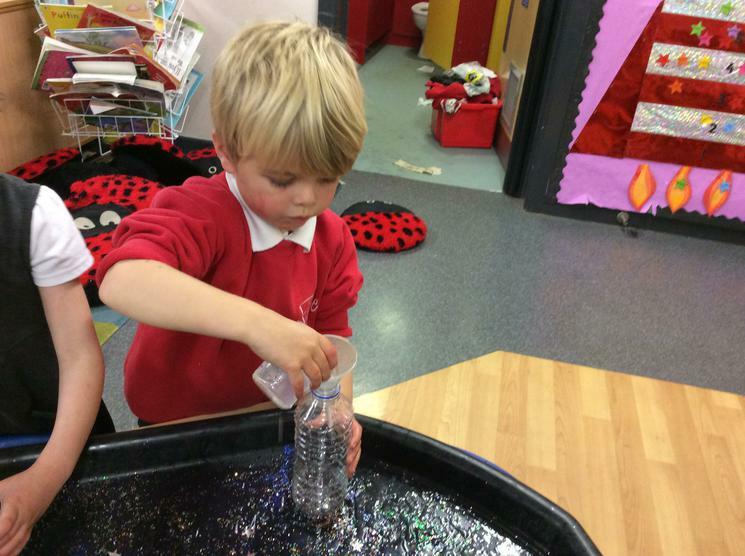 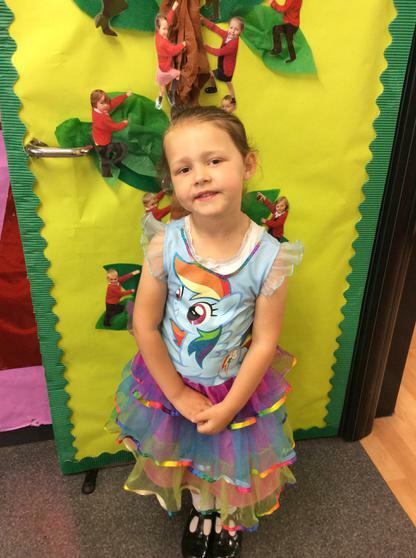 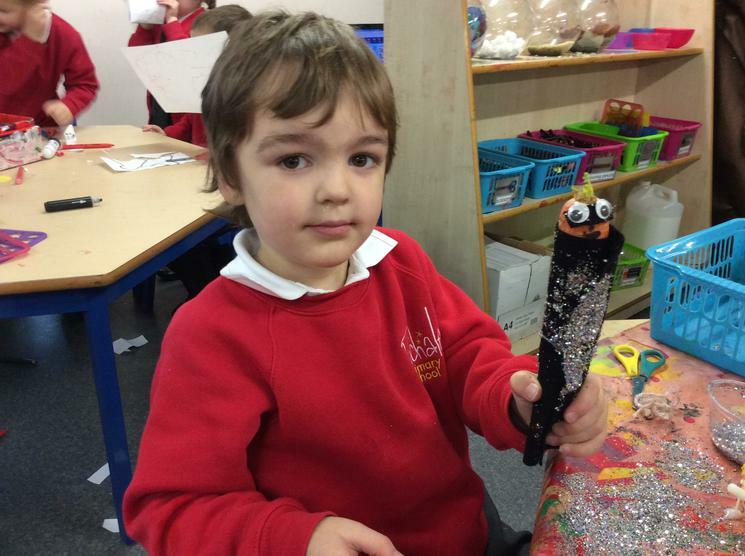 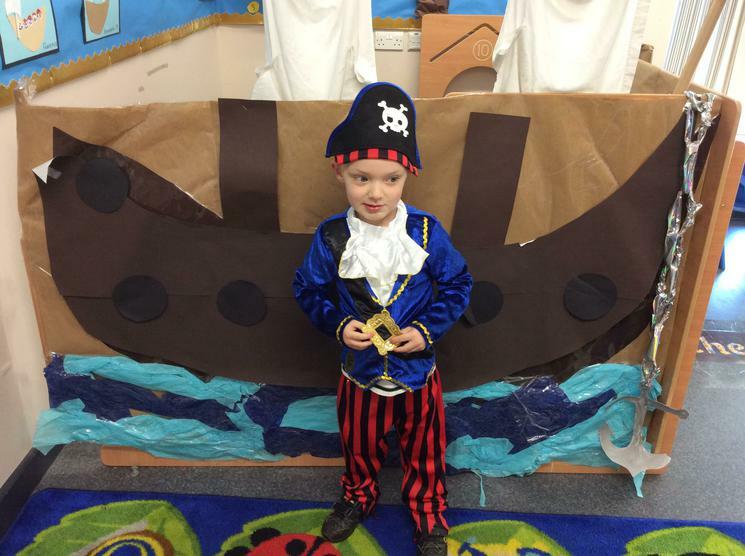 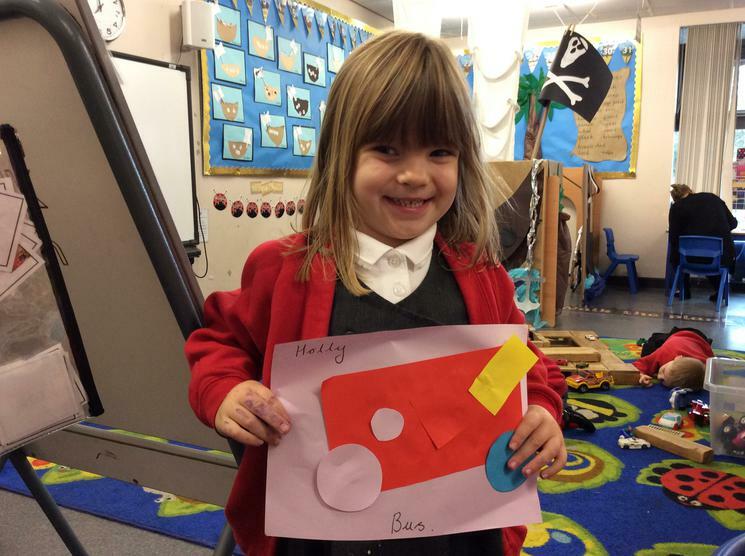 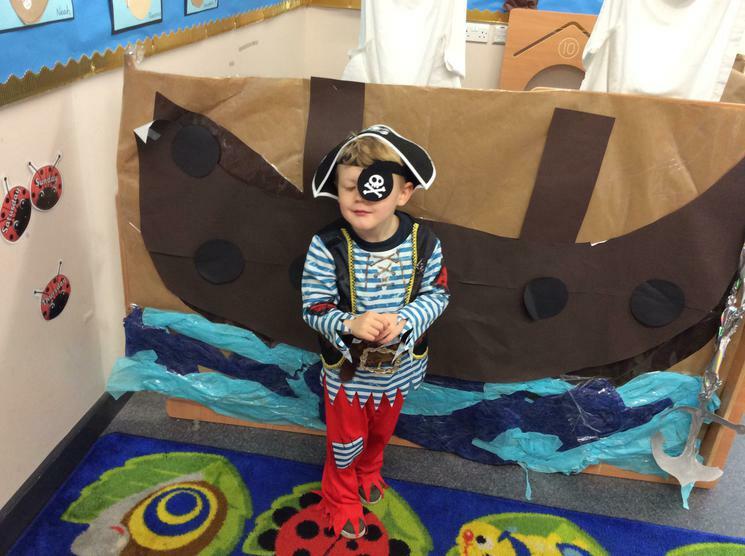 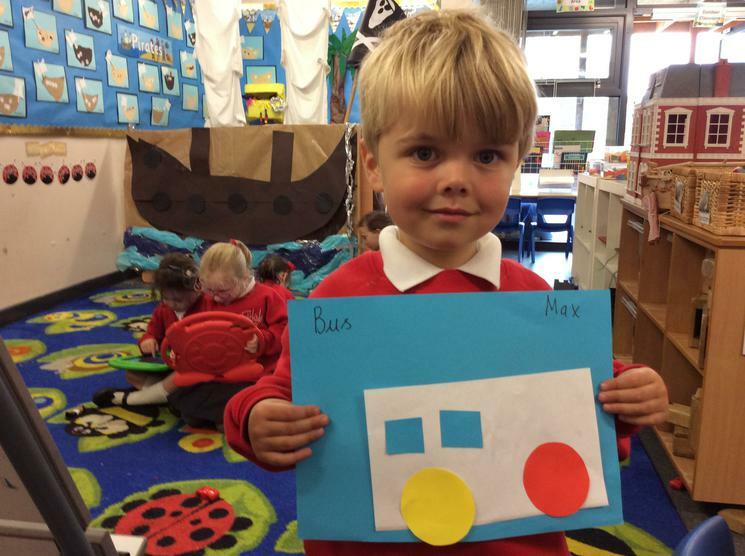 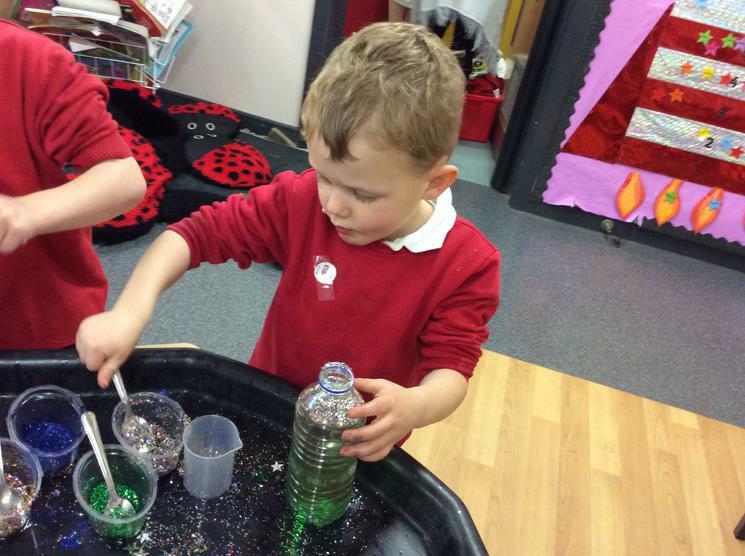 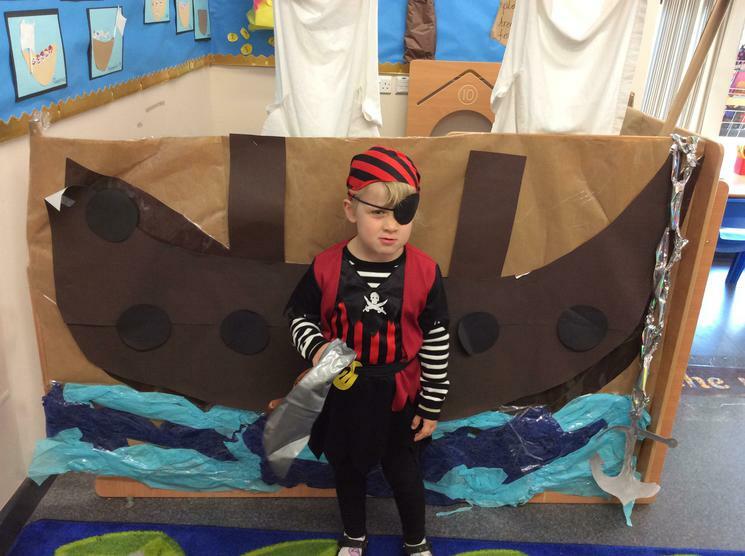 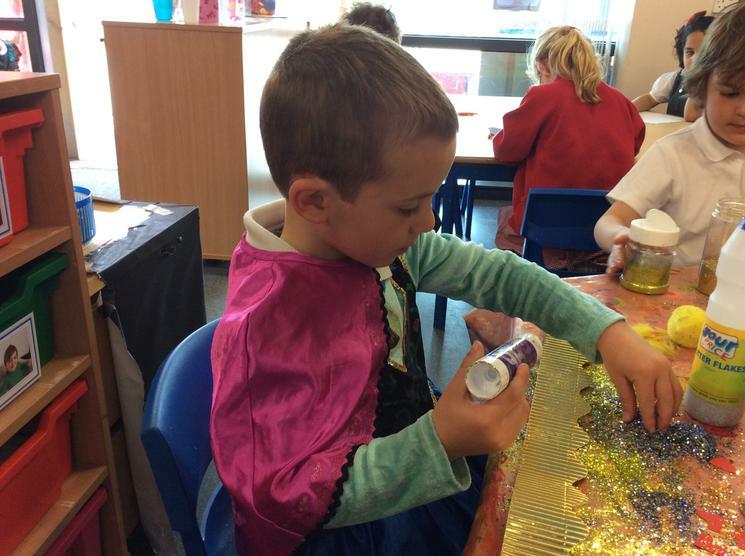 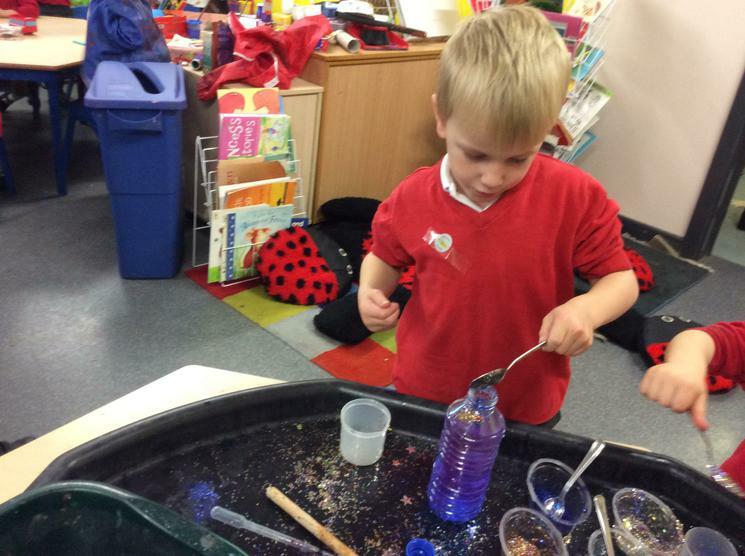 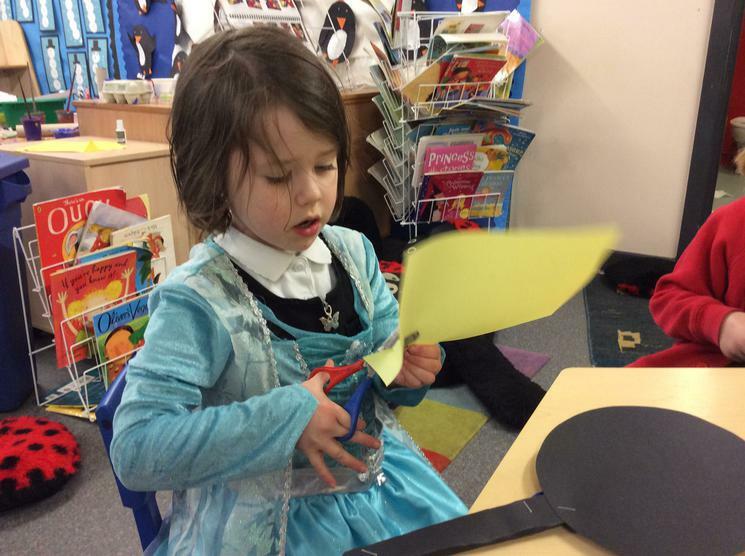 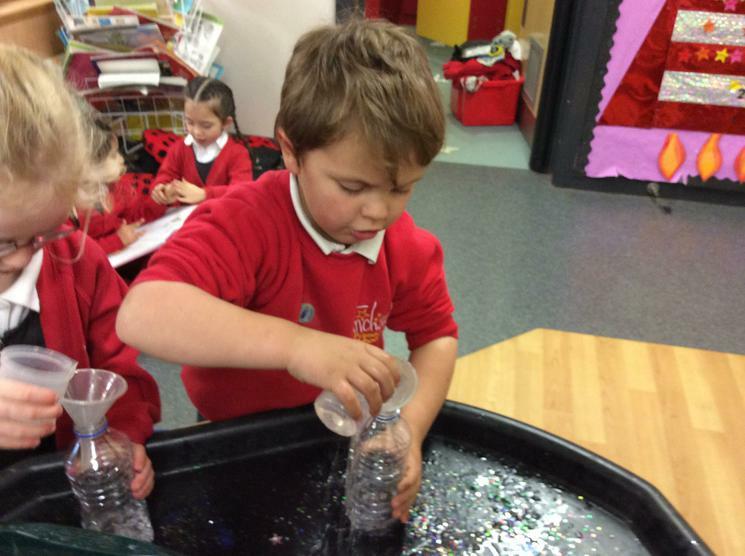 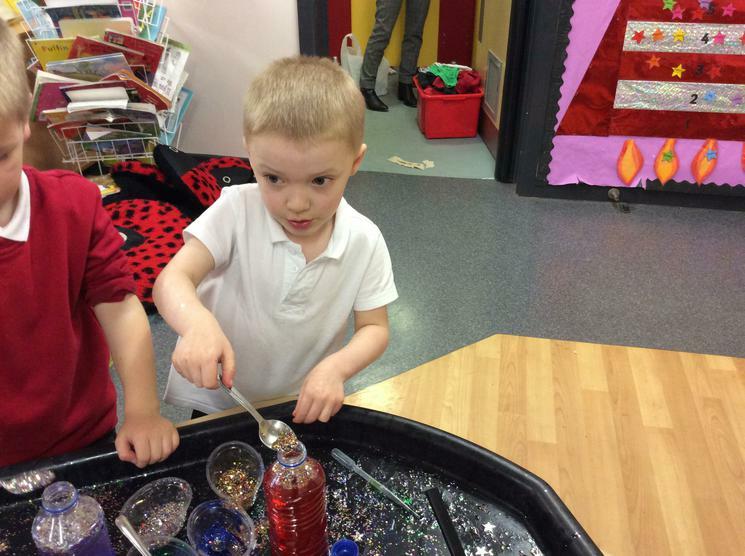 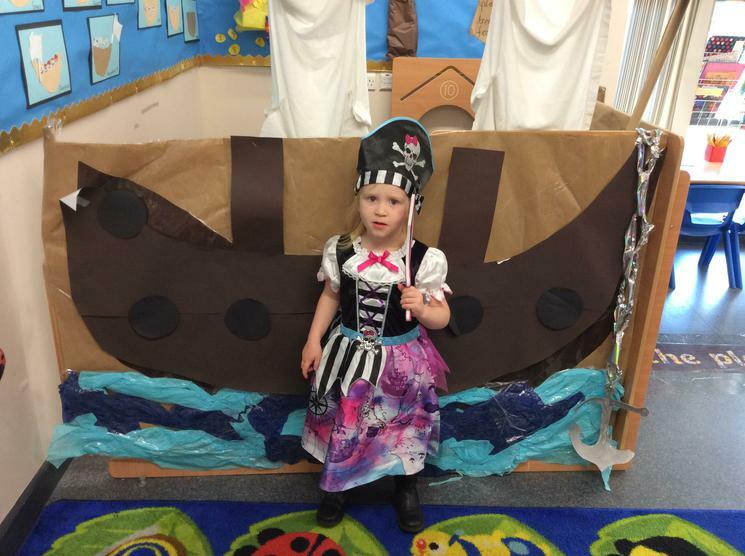 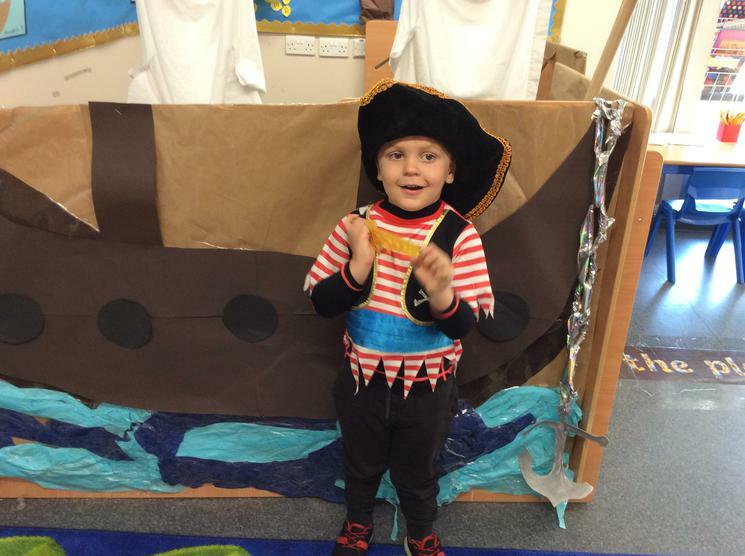 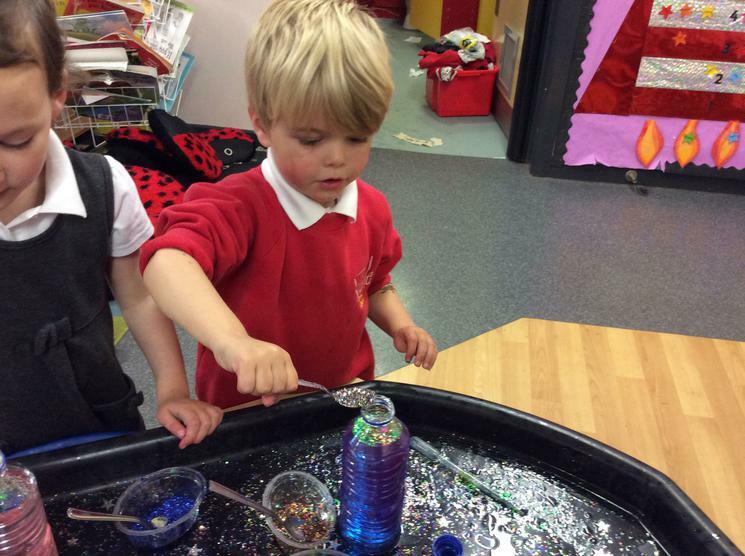 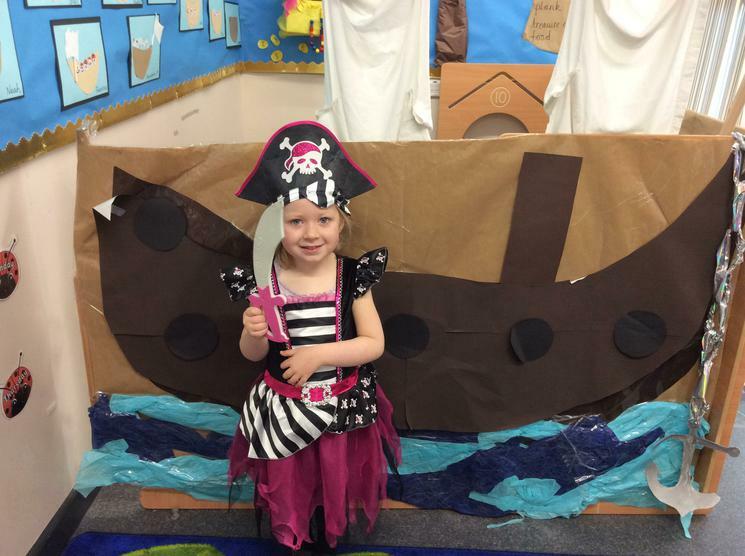 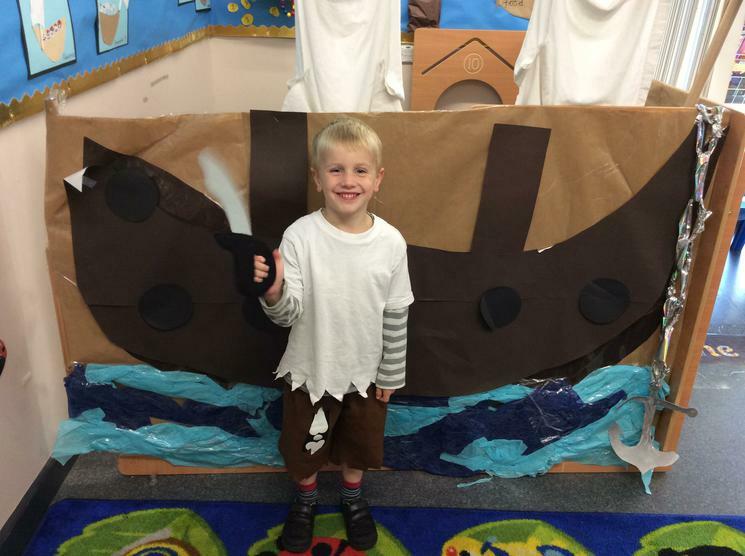 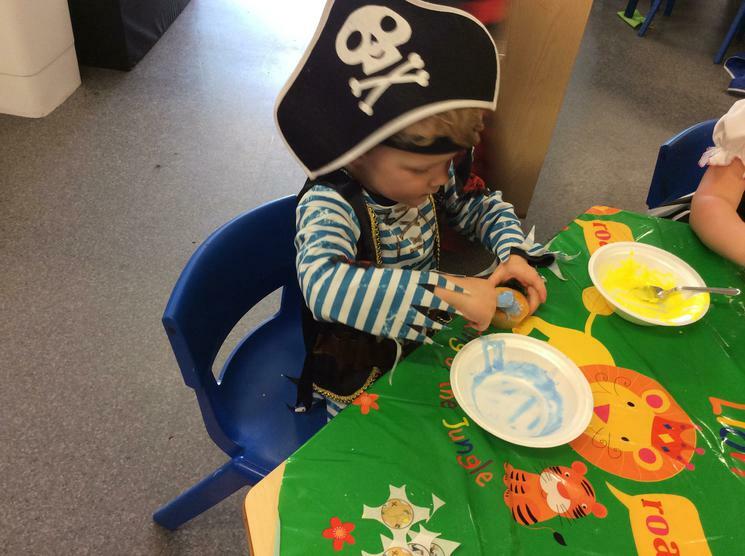 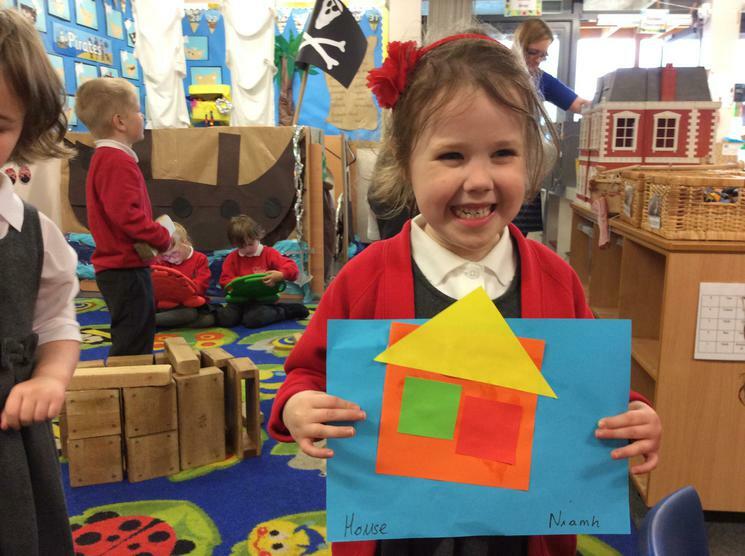 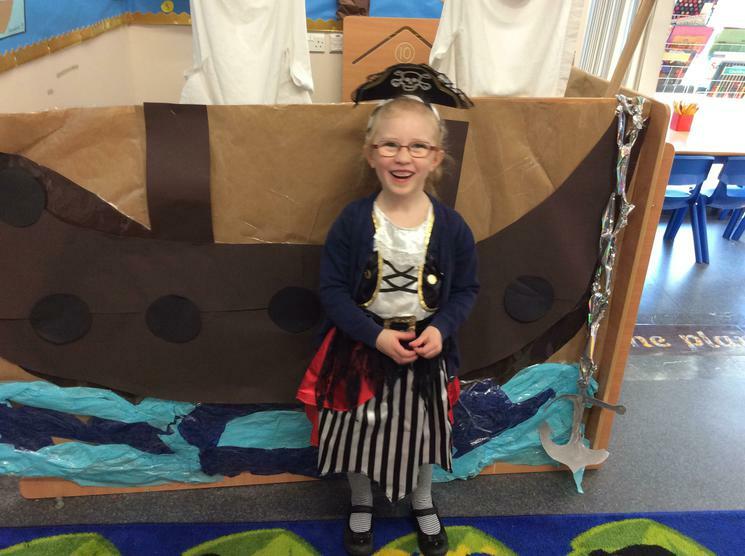 Reception Class enjoyed a pirate day to bring an end to the topic. 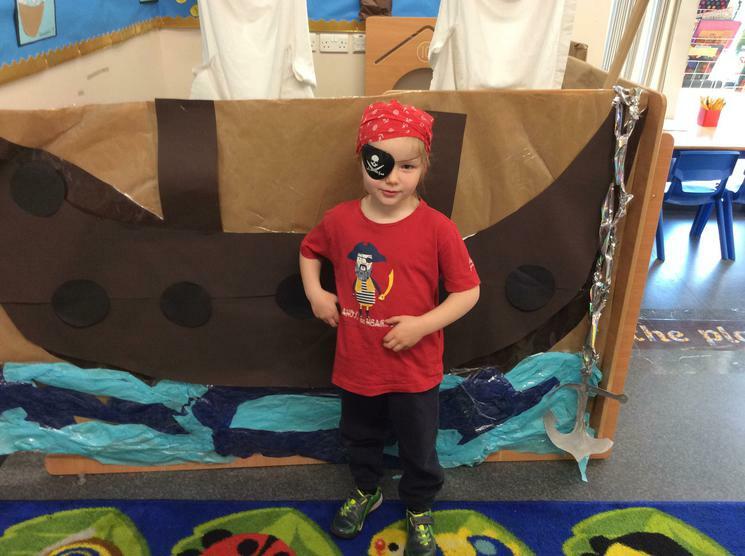 We were dressed as pirates. 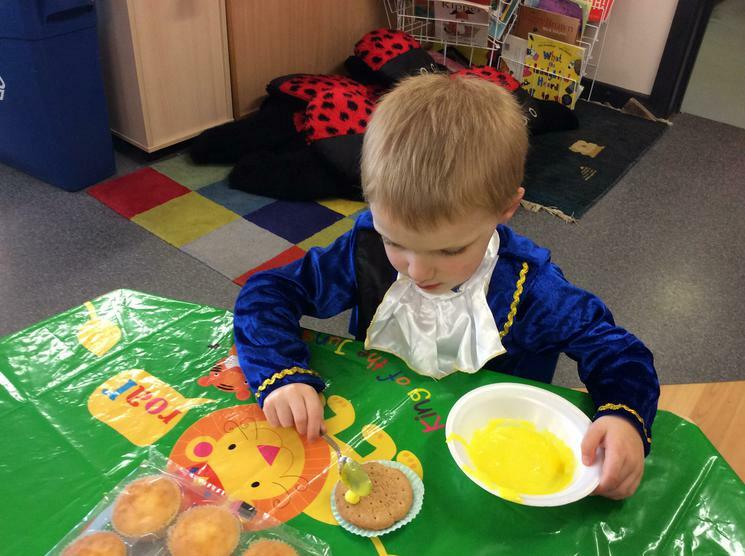 We decorated cakes and biscuits. 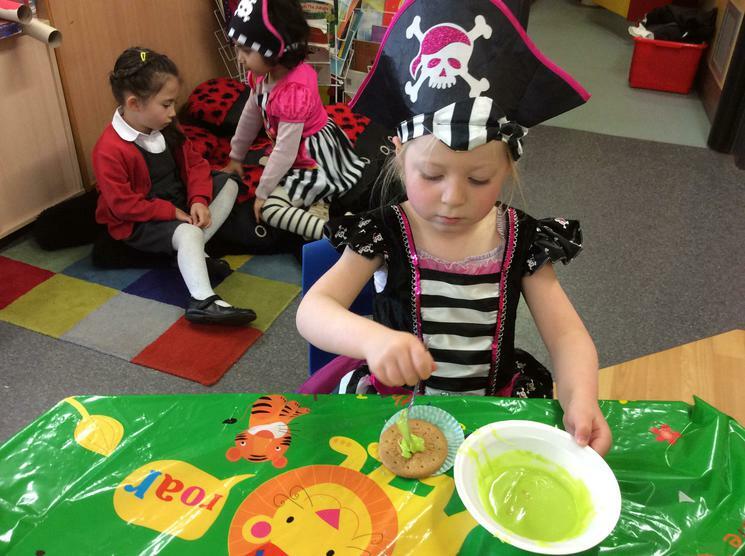 We ate our treats and drank 'pirate rum'. 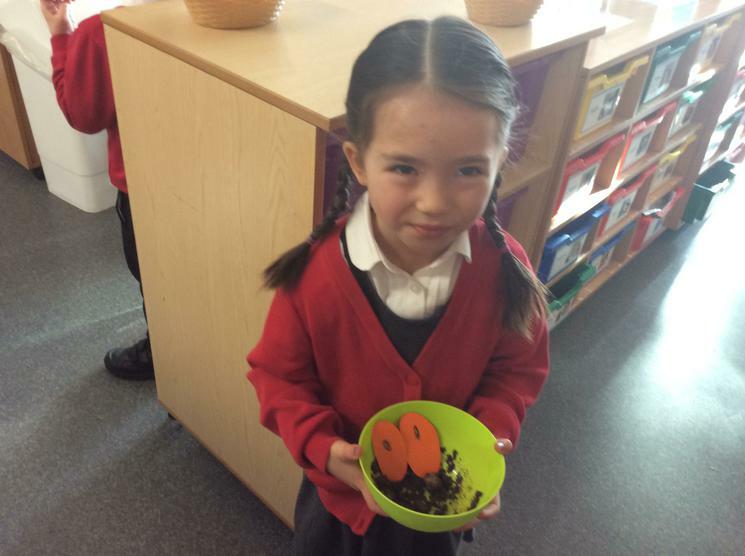 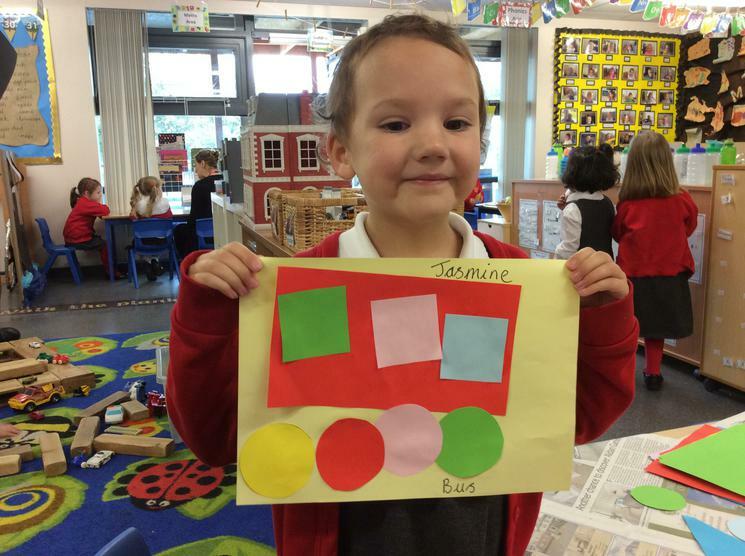 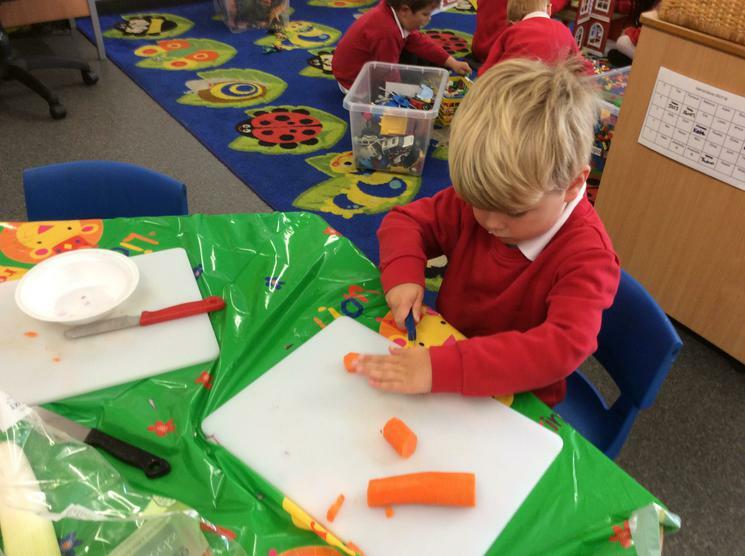 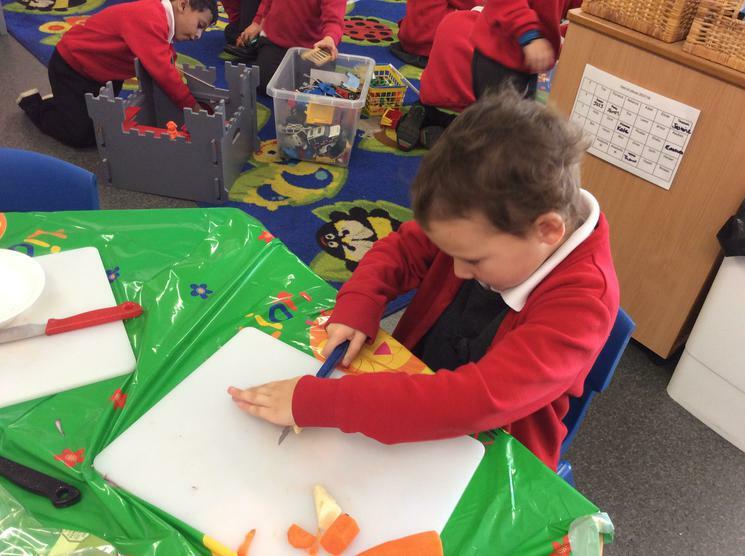 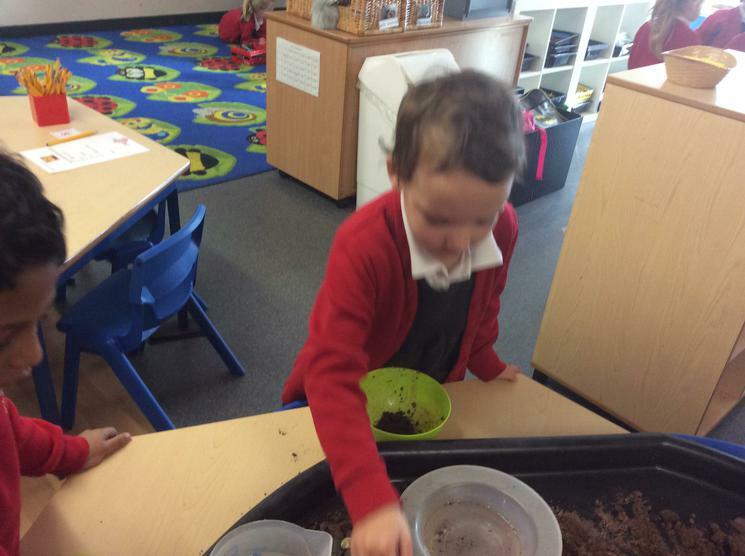 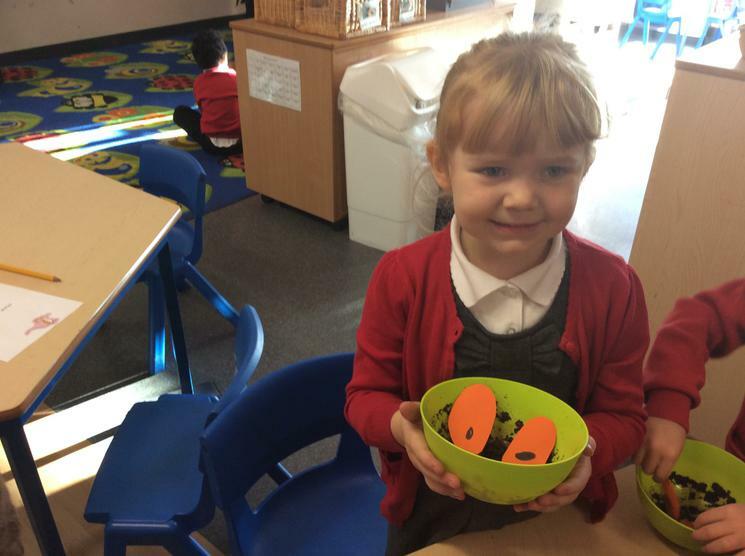 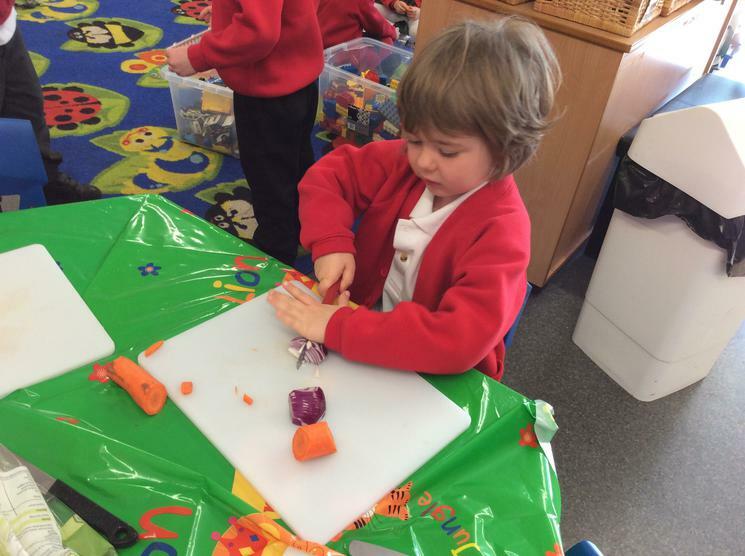 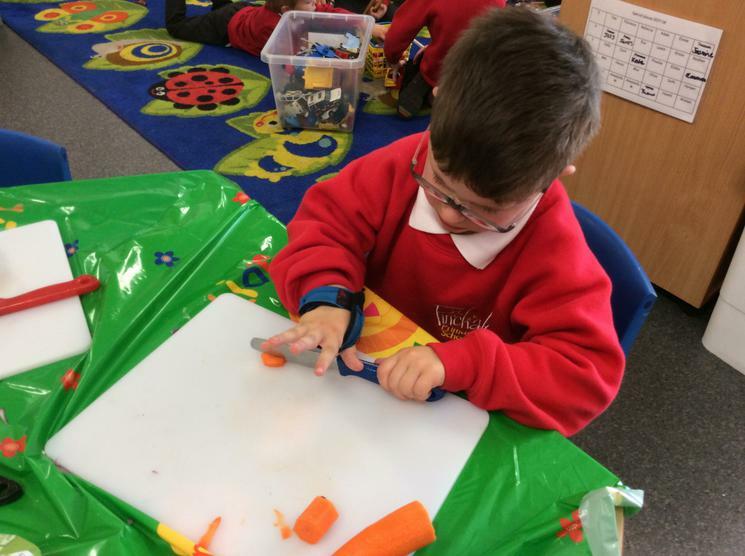 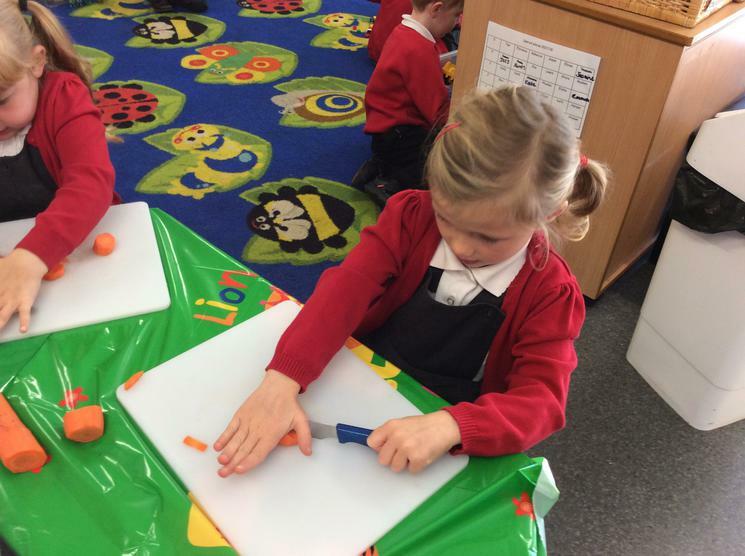 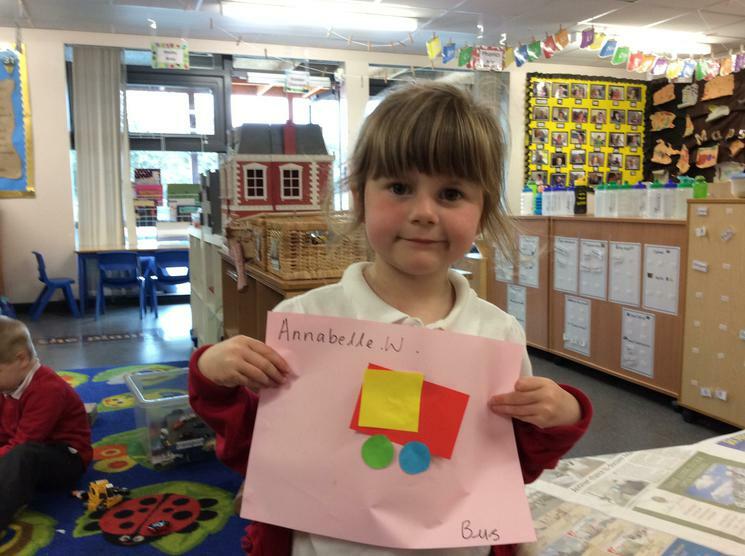 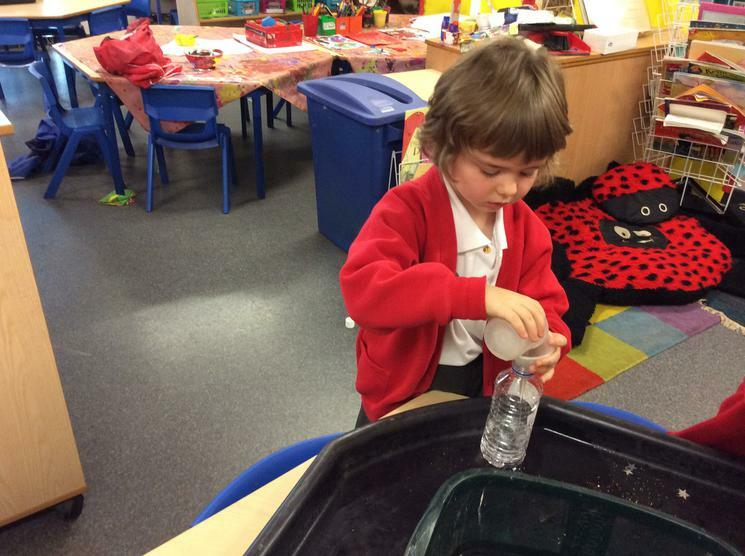 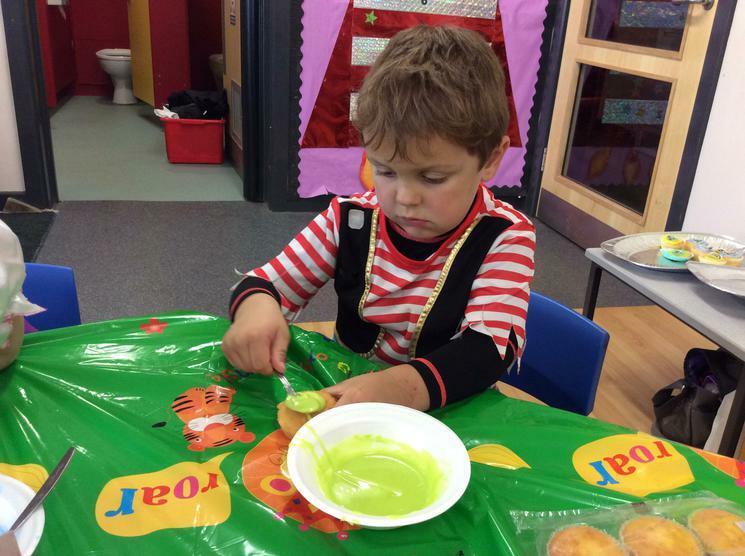 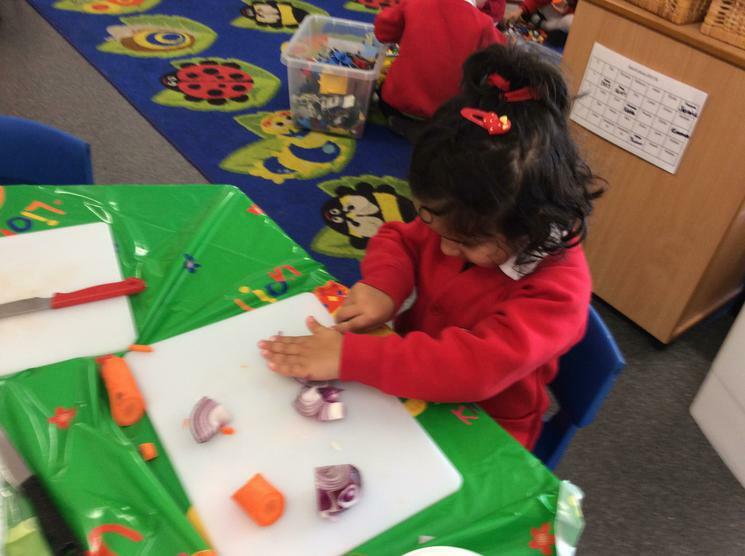 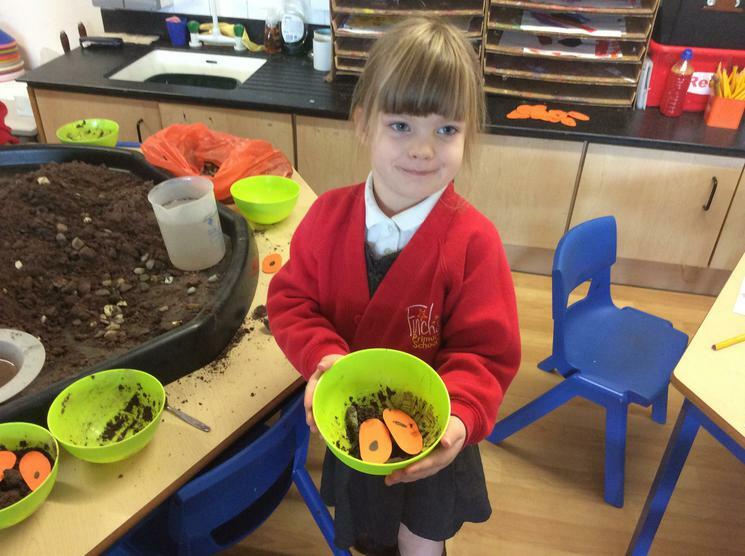 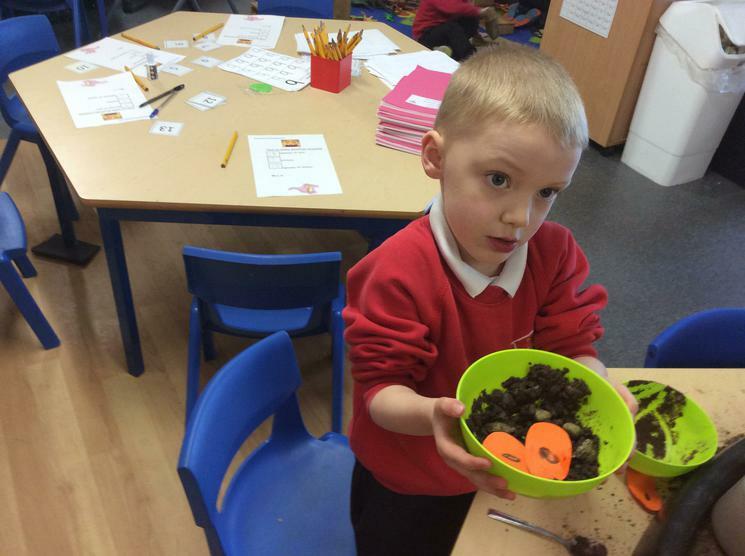 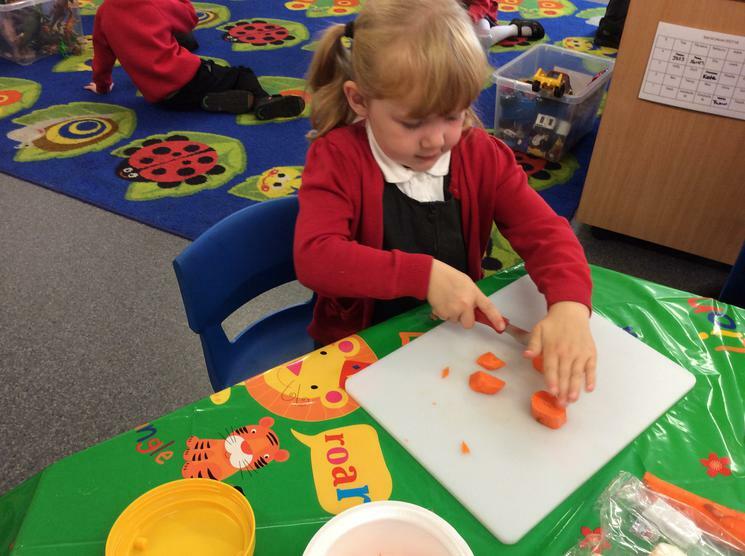 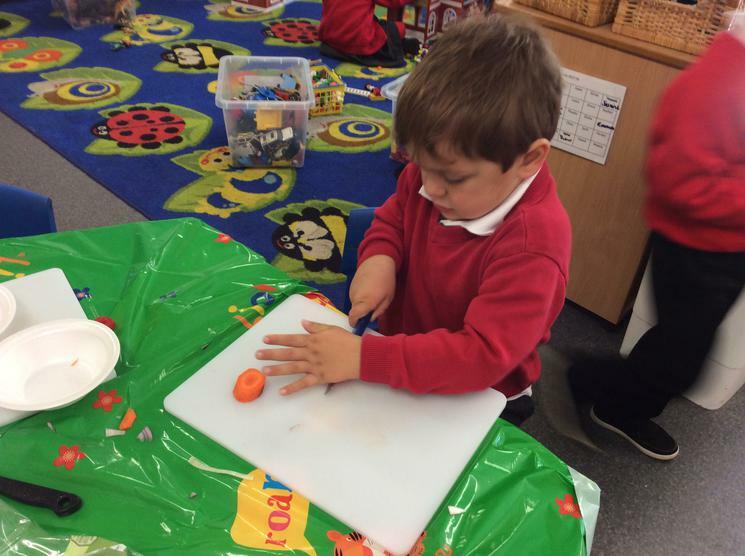 As part of our Harvest theme we have been looking at vegetables. 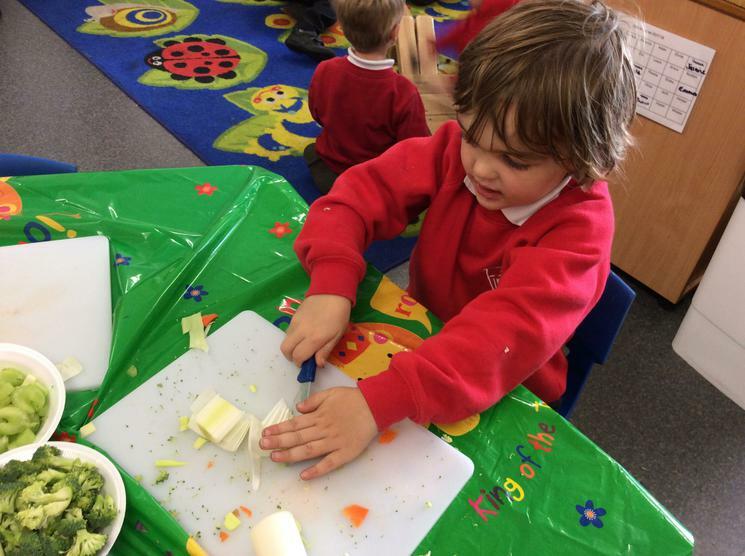 We discussed similarities and differences as well as which vegetables we like and dislike. 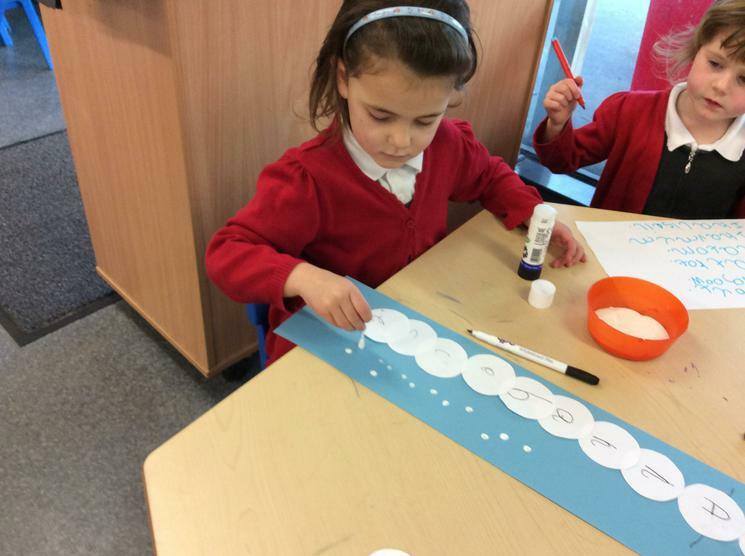 We printed a repeating pattern. 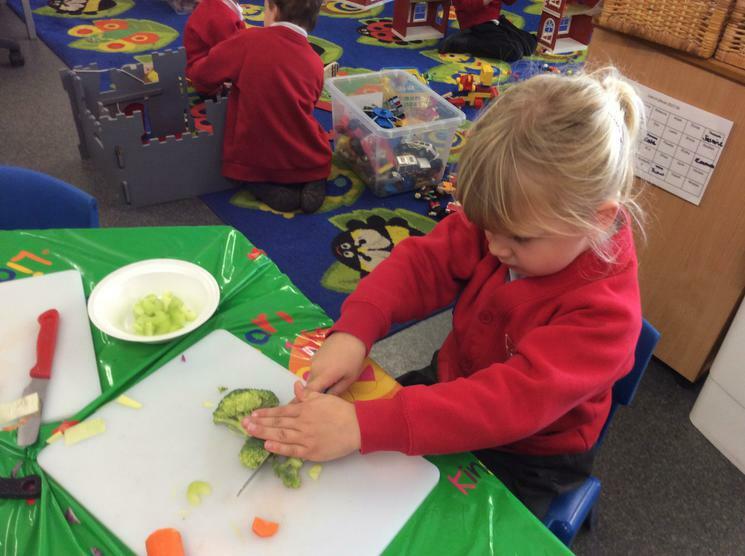 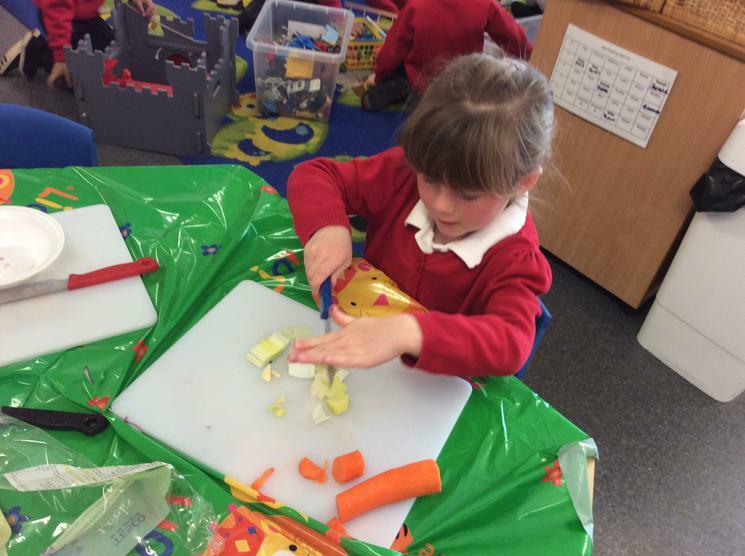 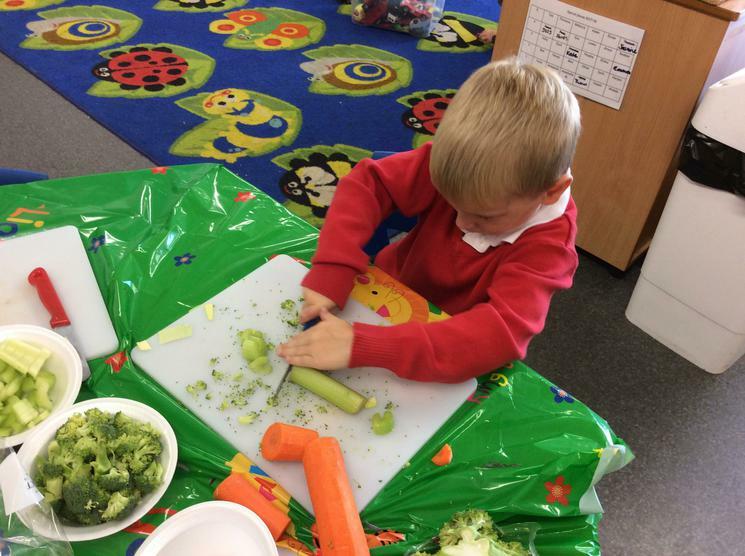 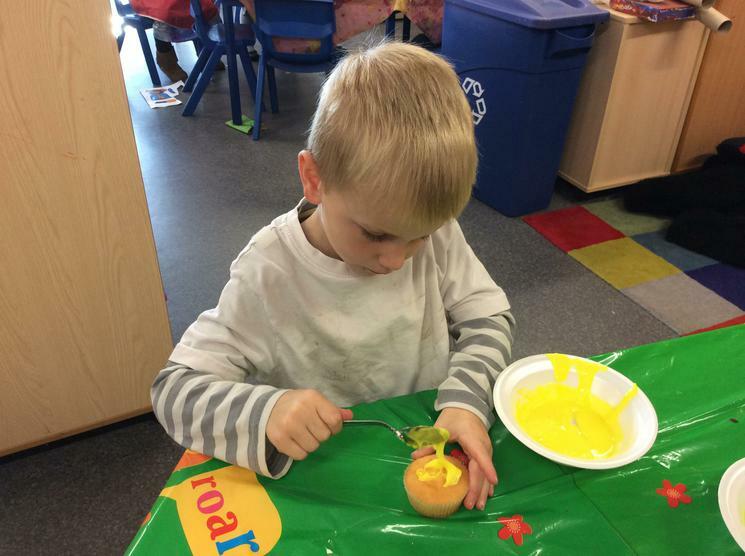 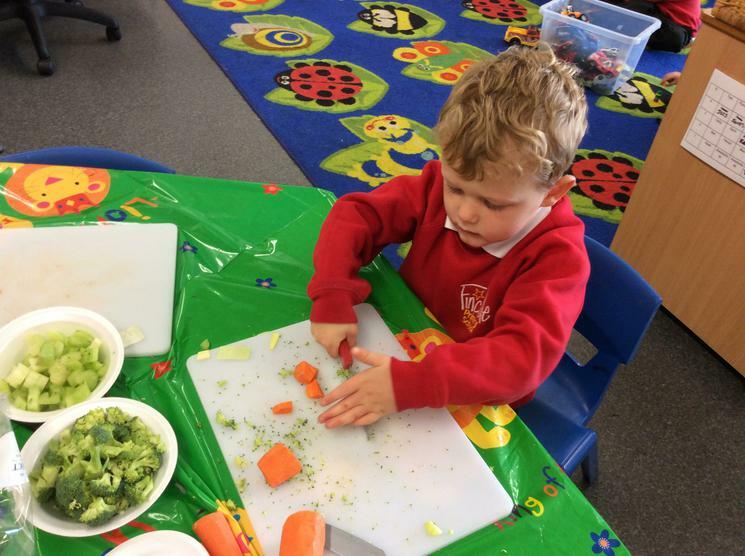 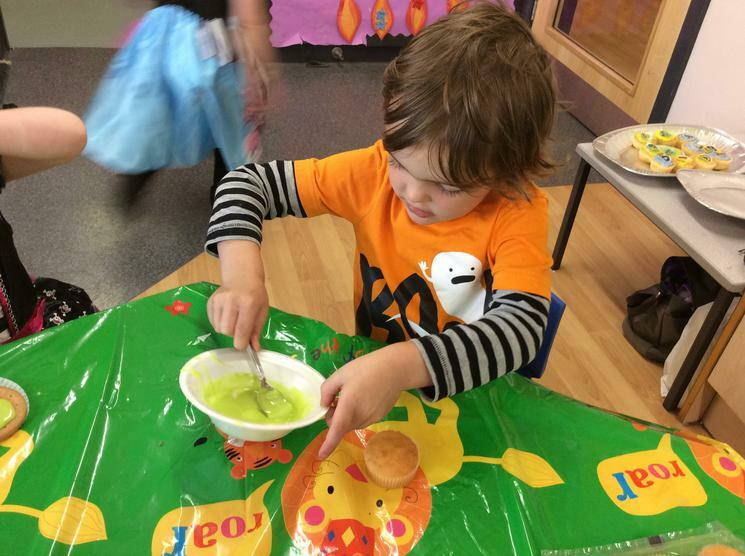 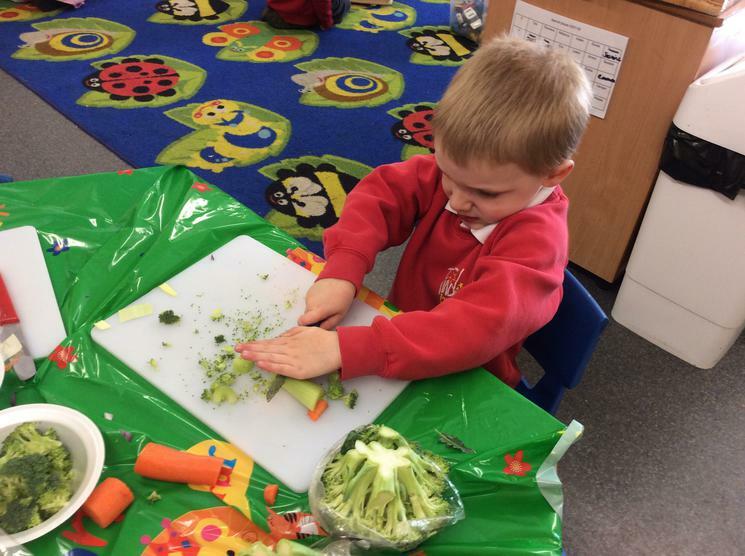 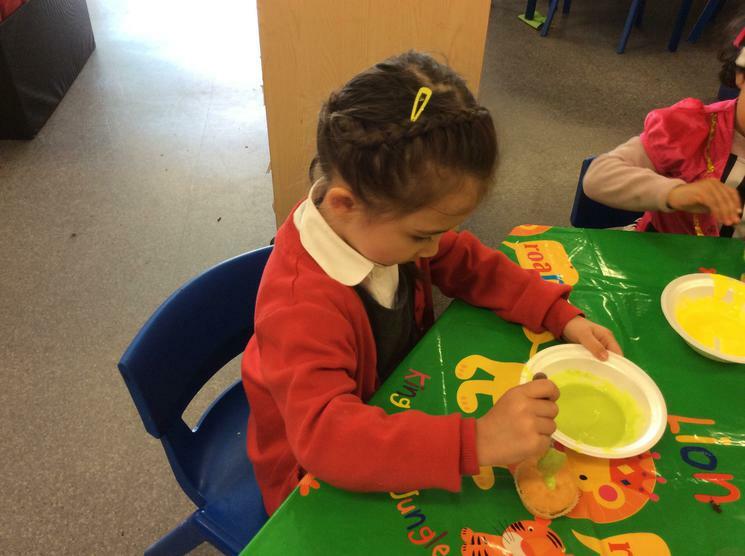 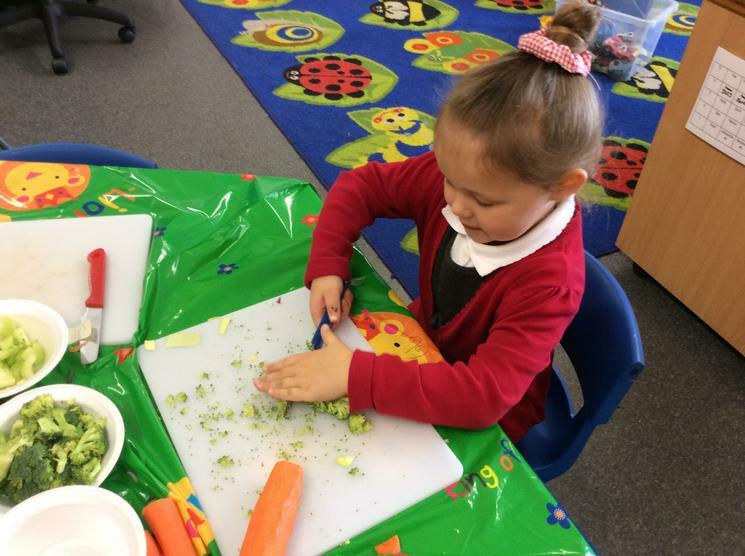 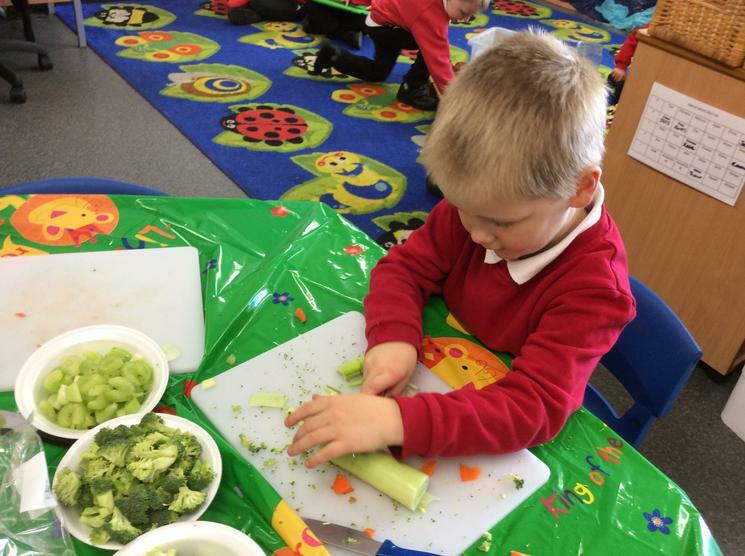 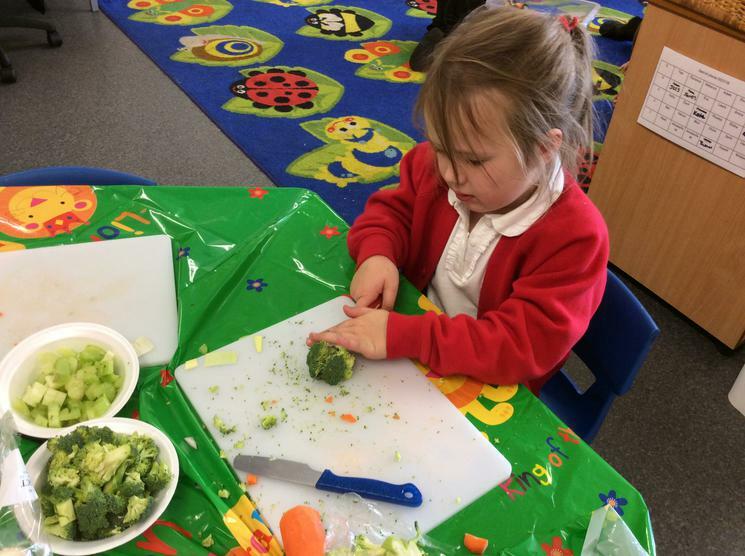 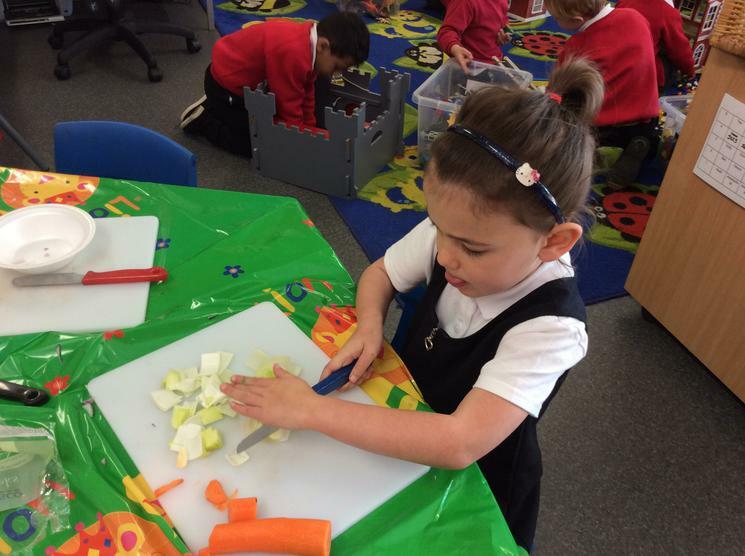 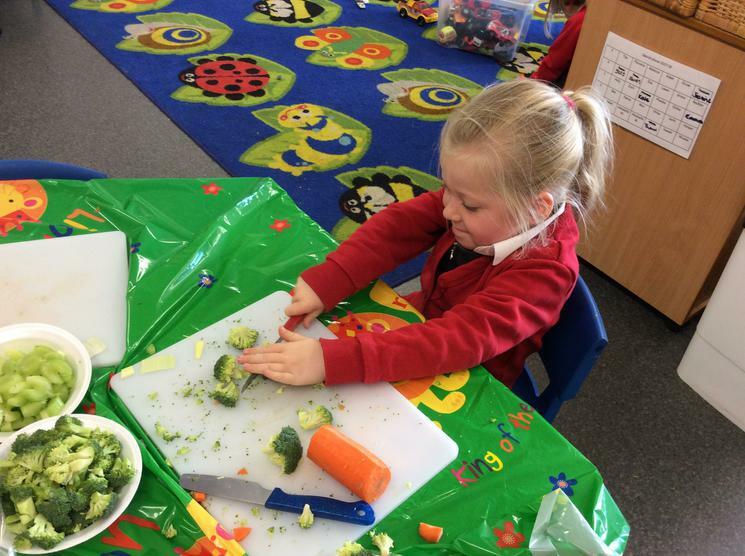 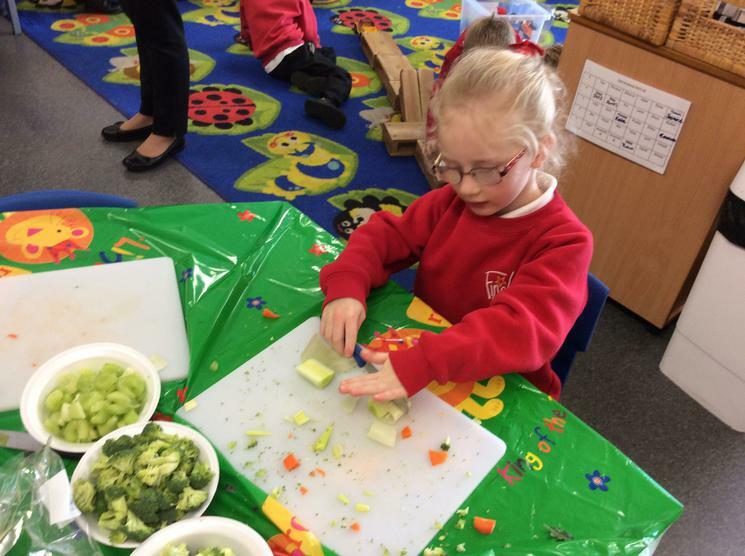 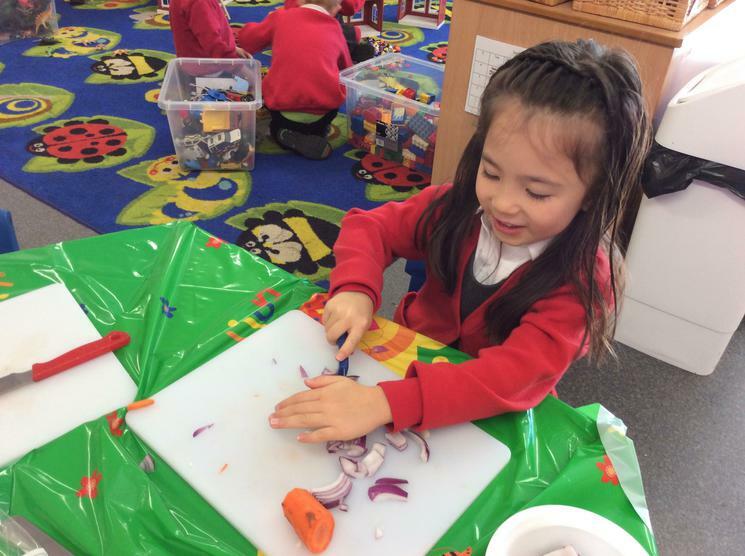 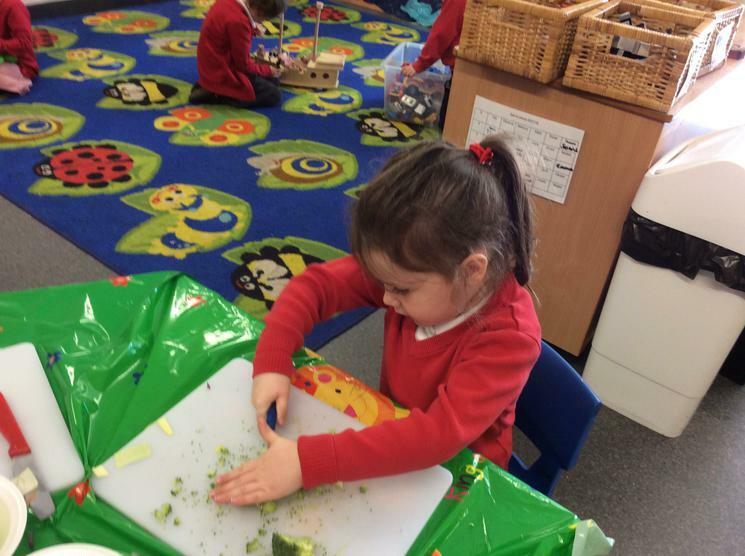 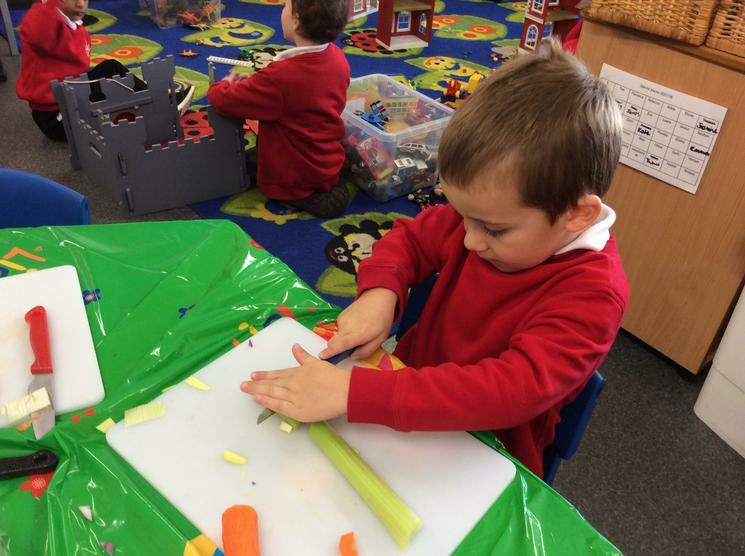 We cut vegetables and made our own soup. 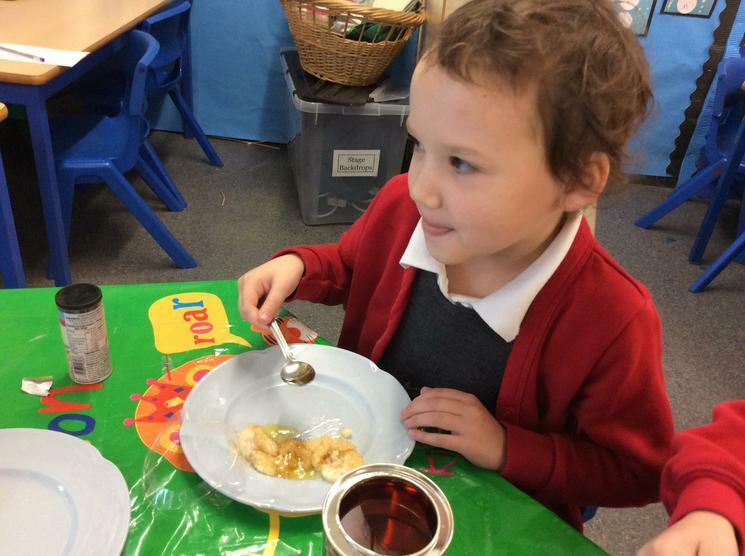 We all tried the soup. 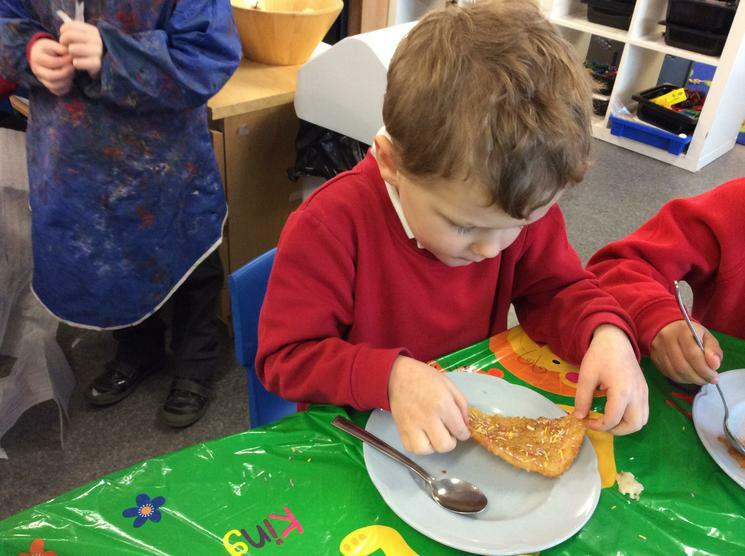 Many of us liked it, even some of us who thought we didn't like soup! 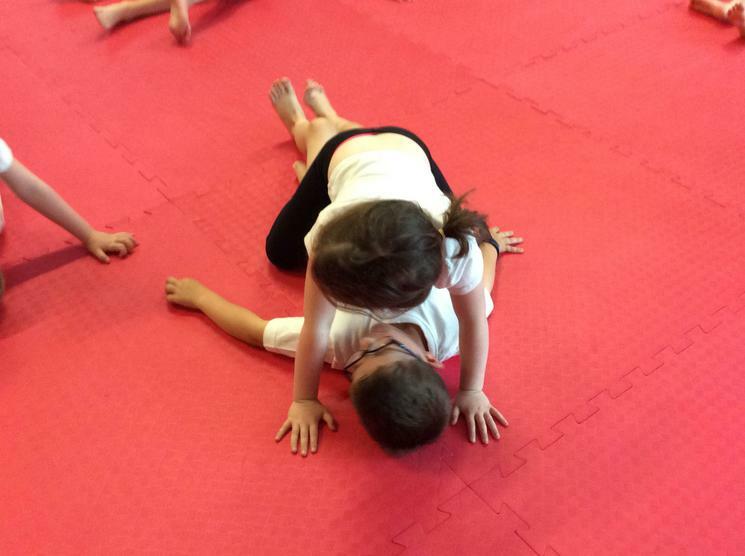 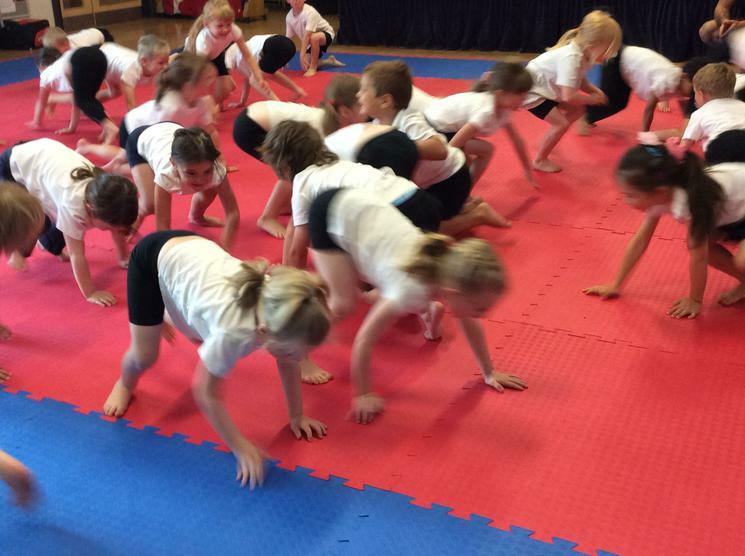 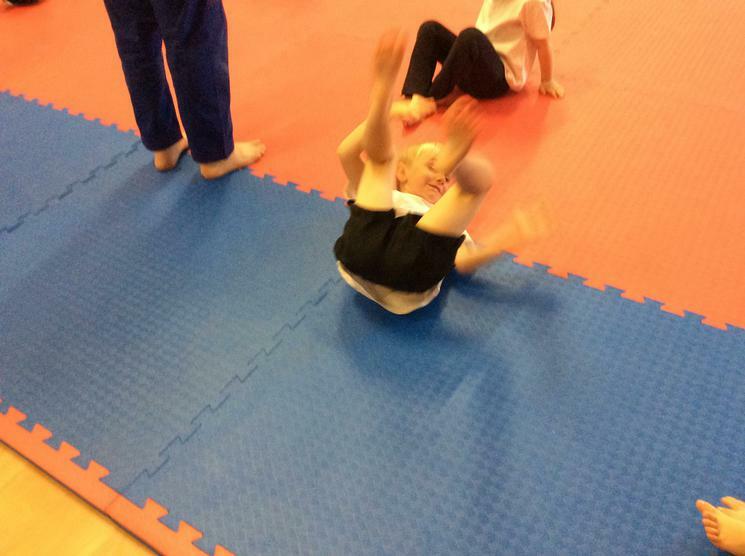 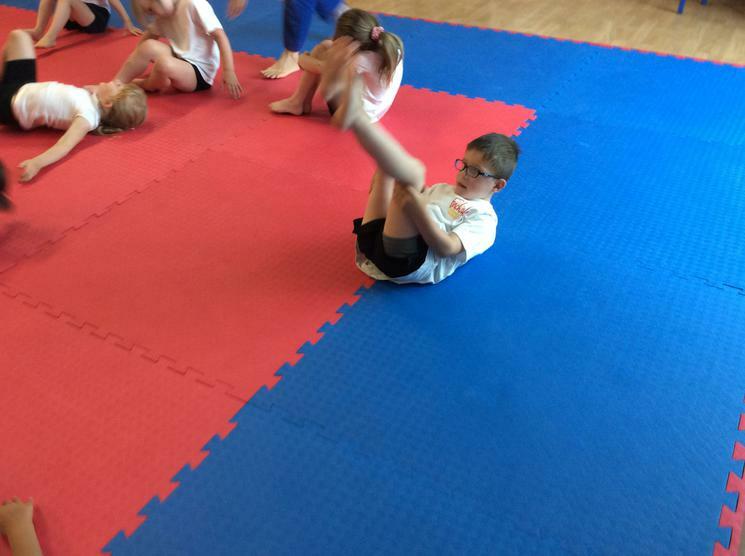 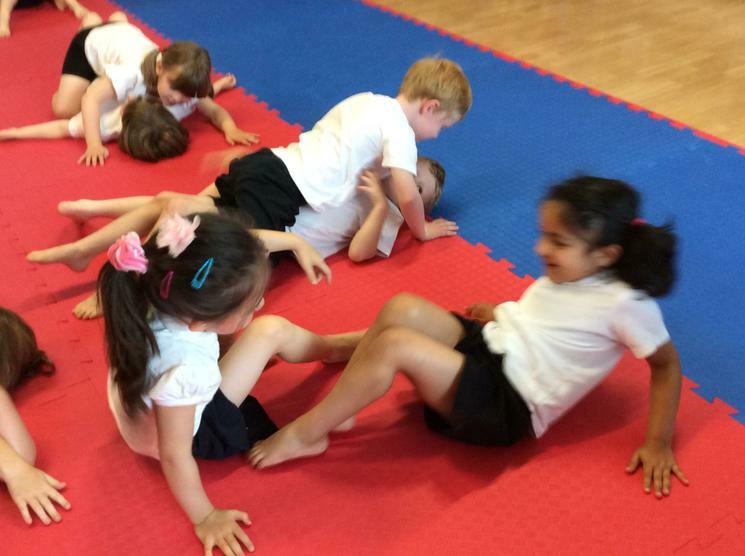 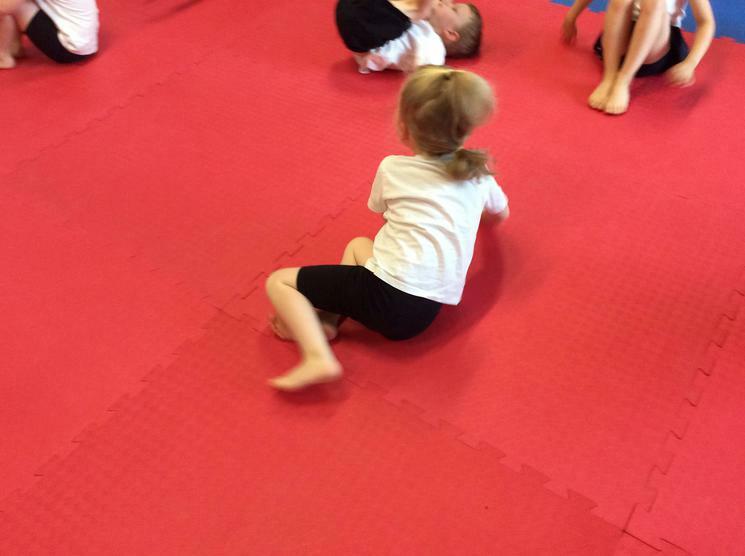 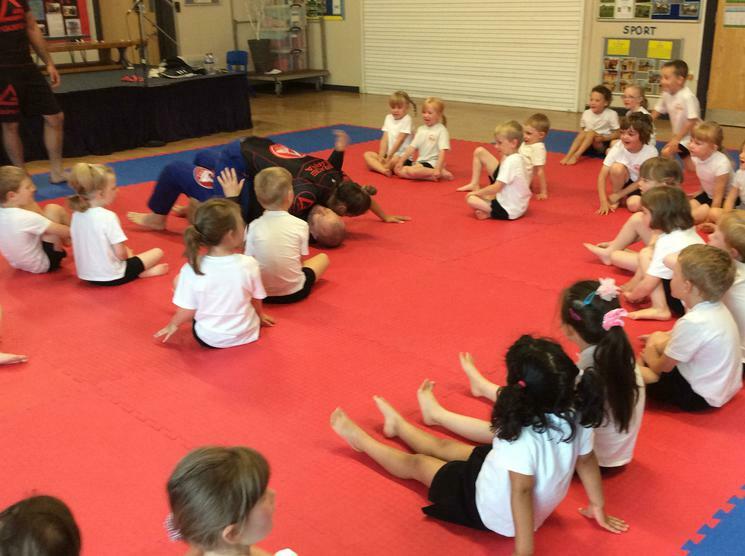 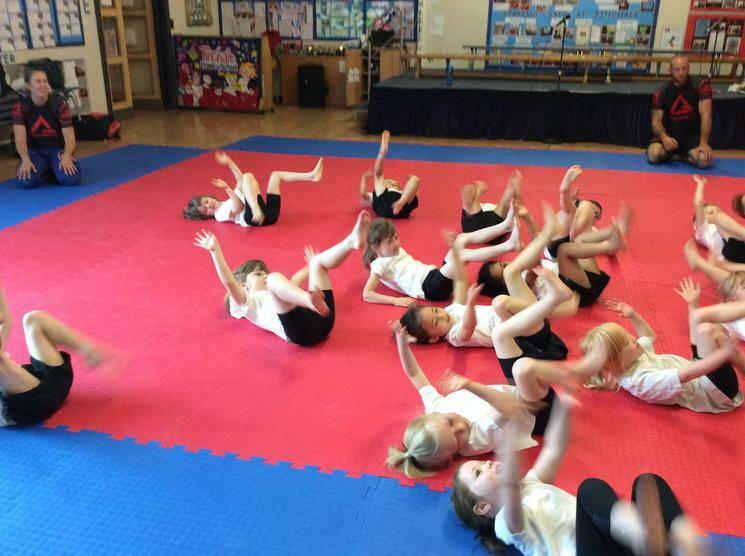 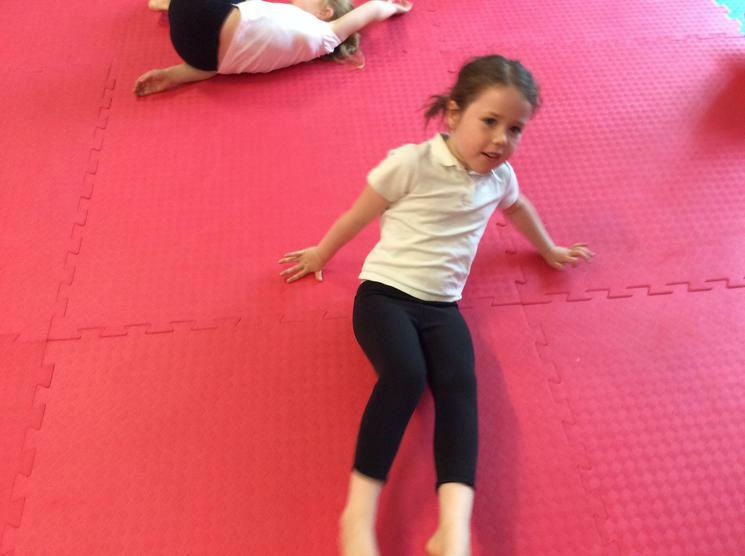 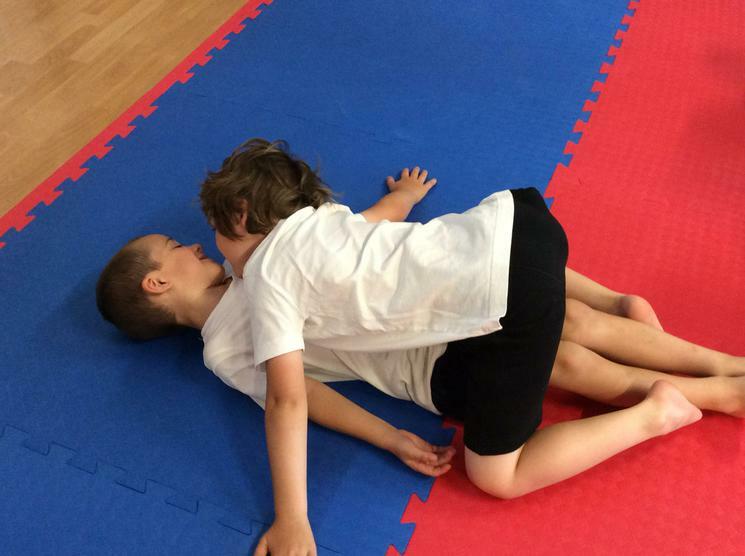 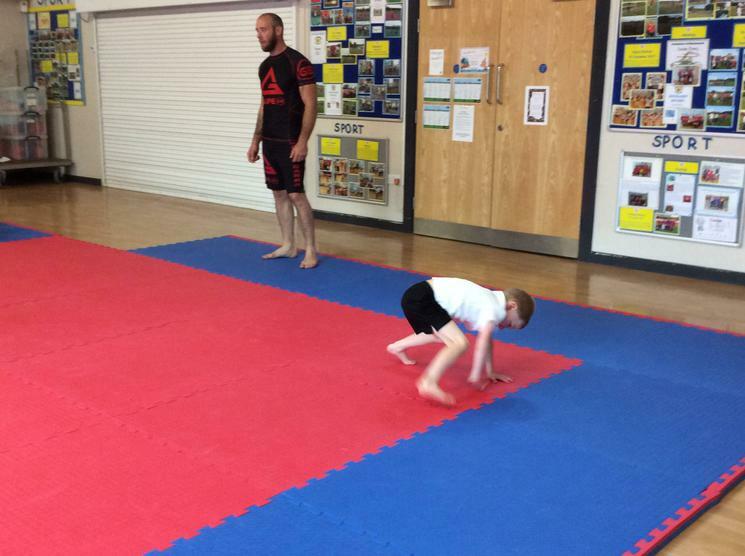 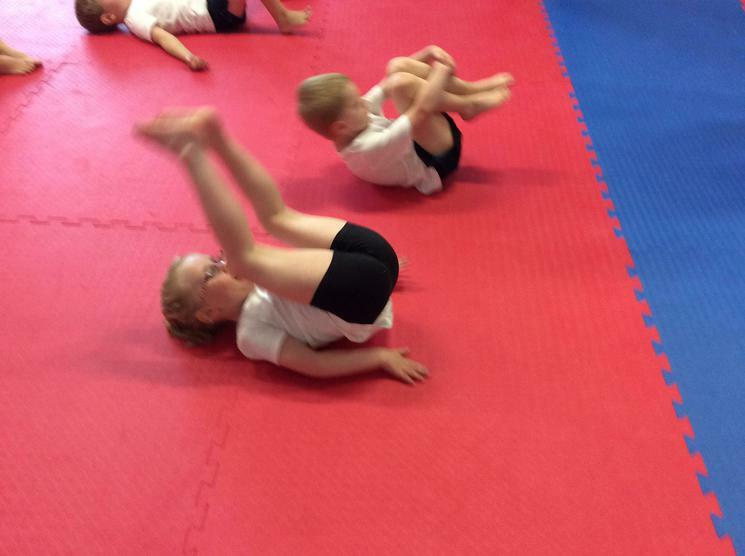 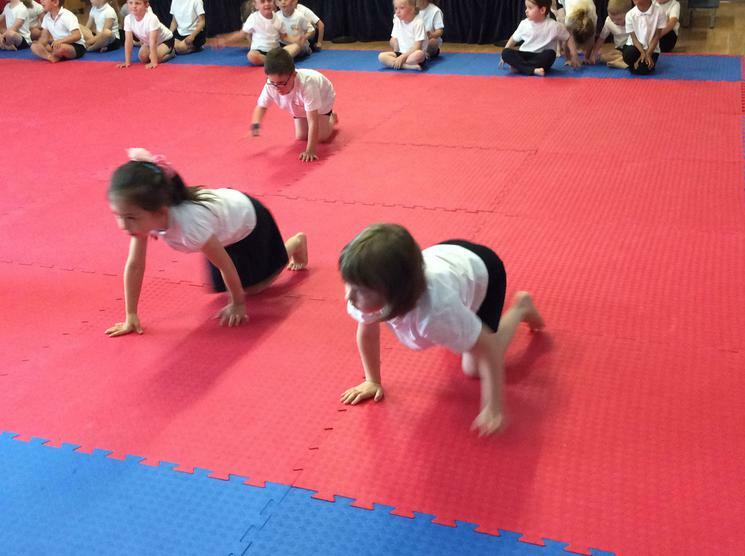 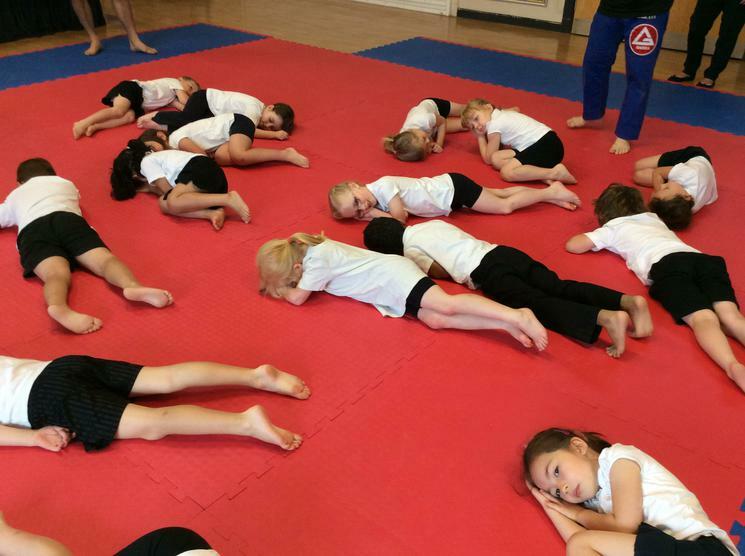 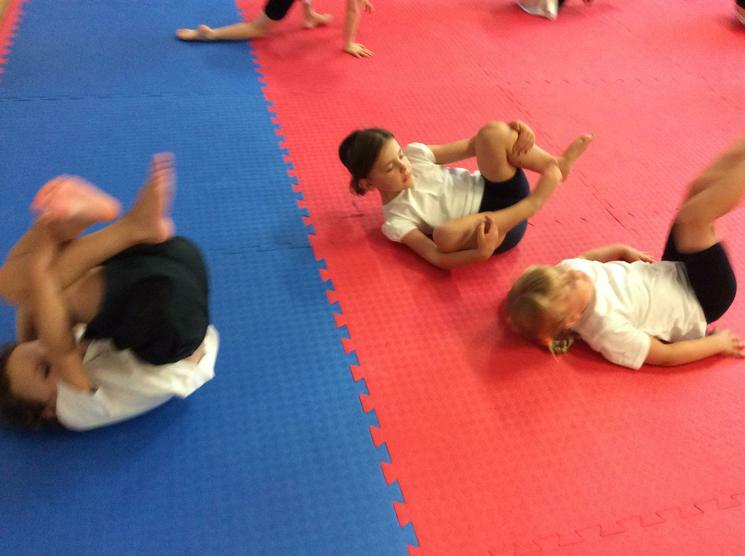 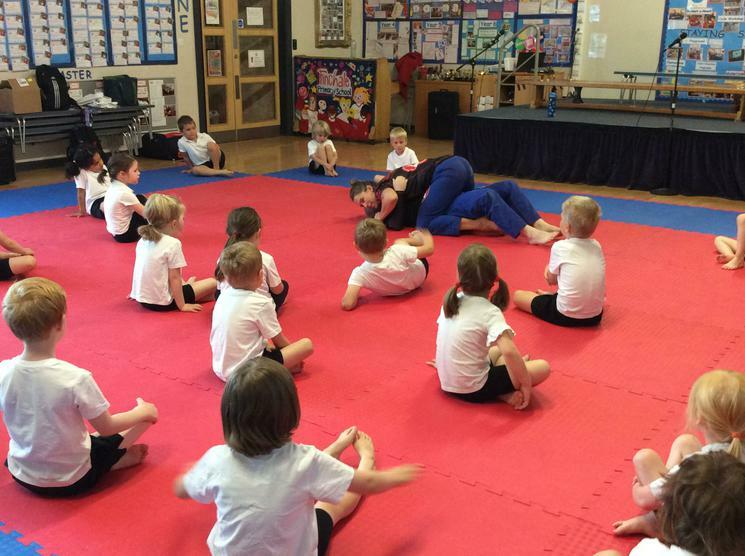 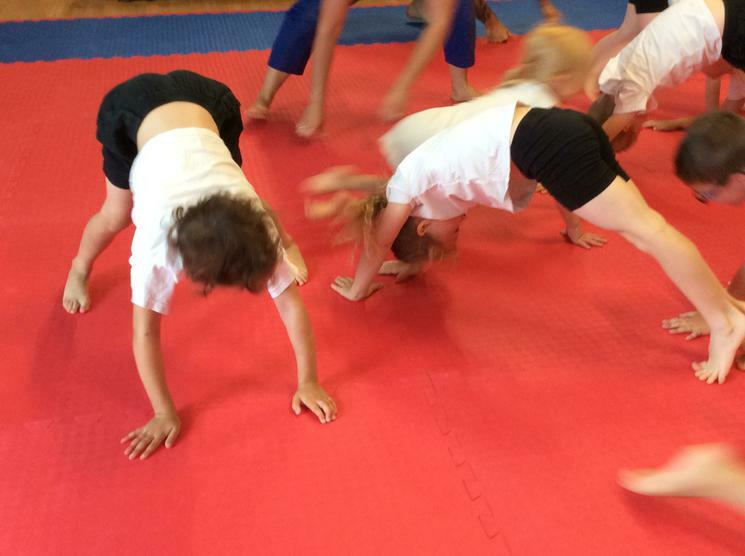 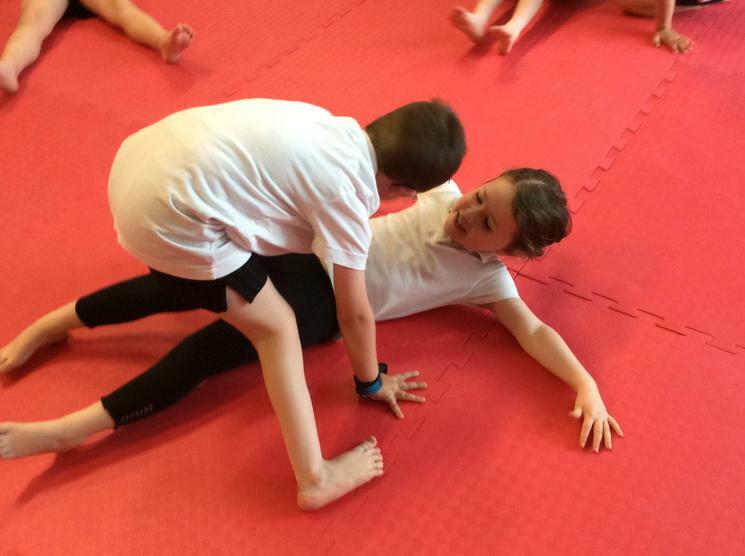 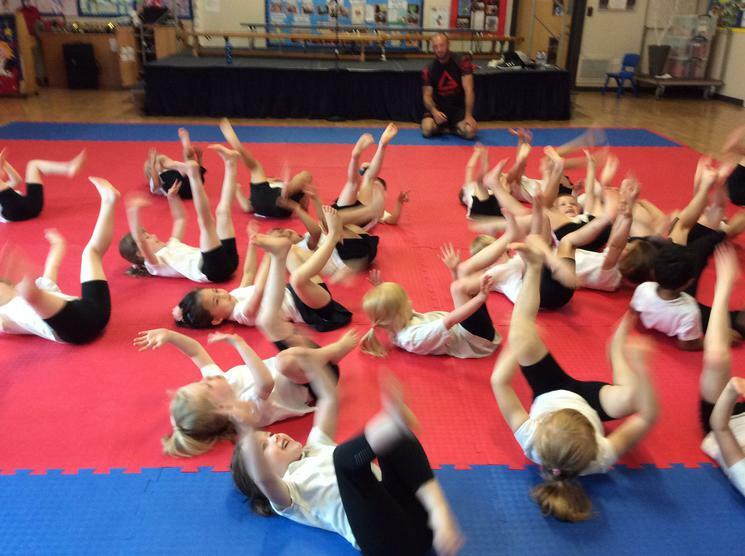 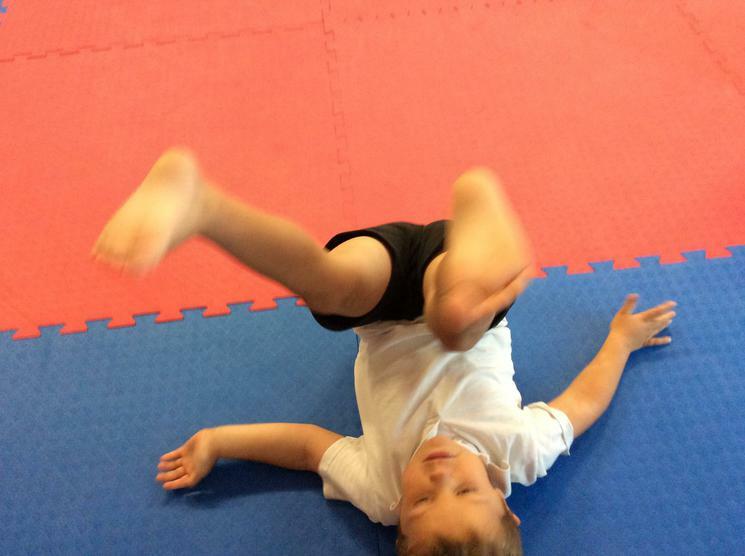 We took part in 'National Fitness Day'. 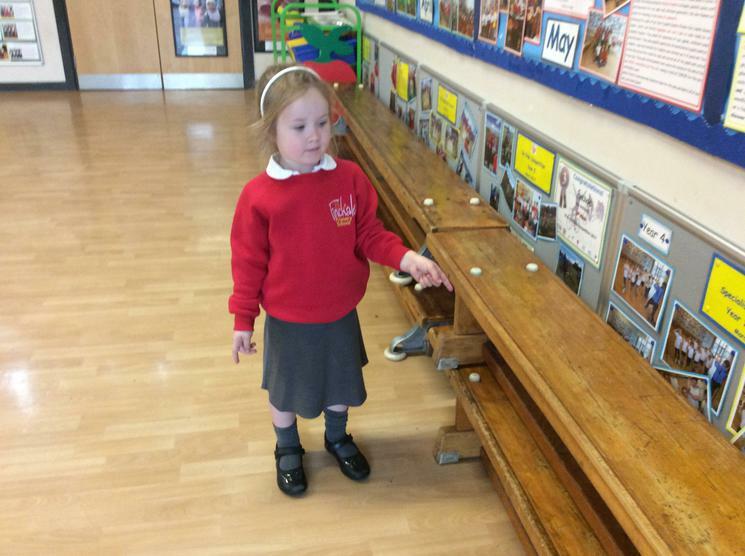 We did a selection of exercises to music which we chose ourselves. 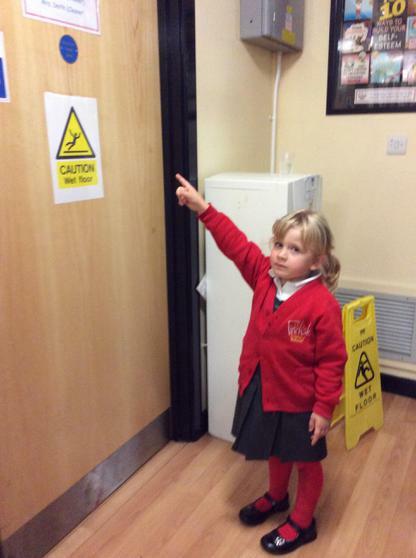 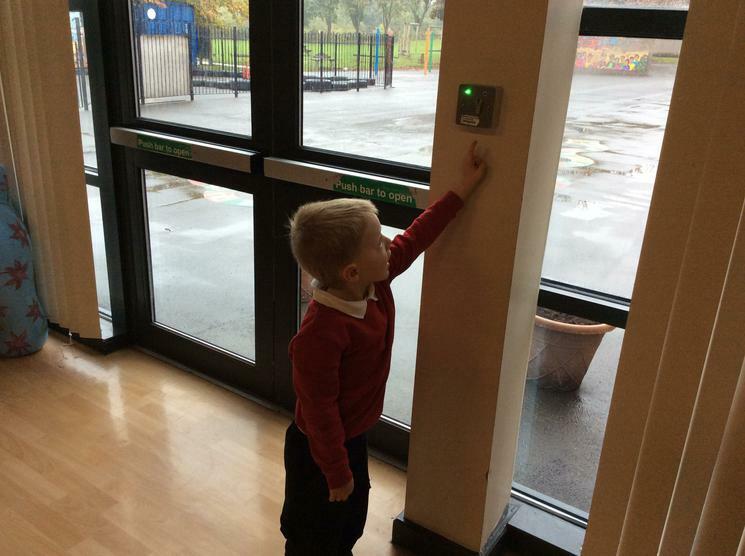 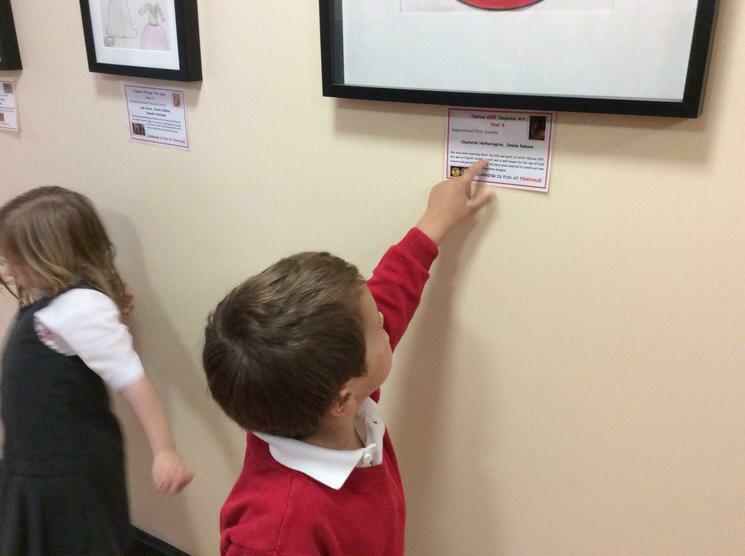 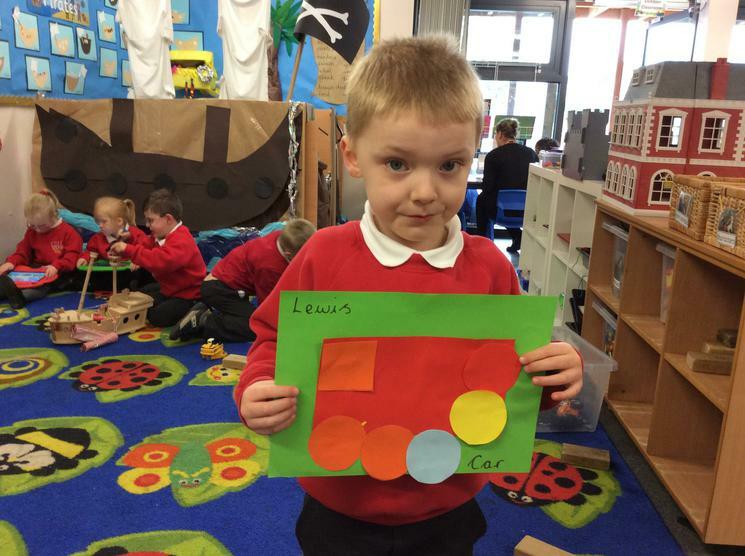 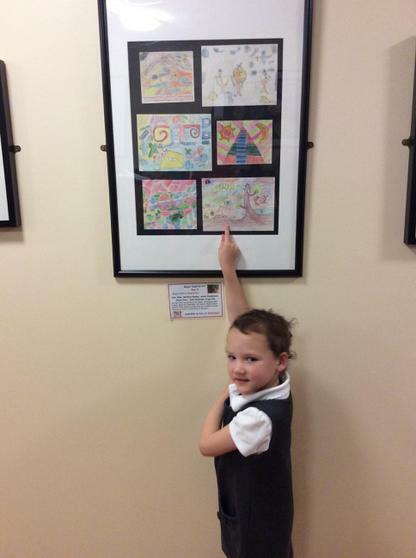 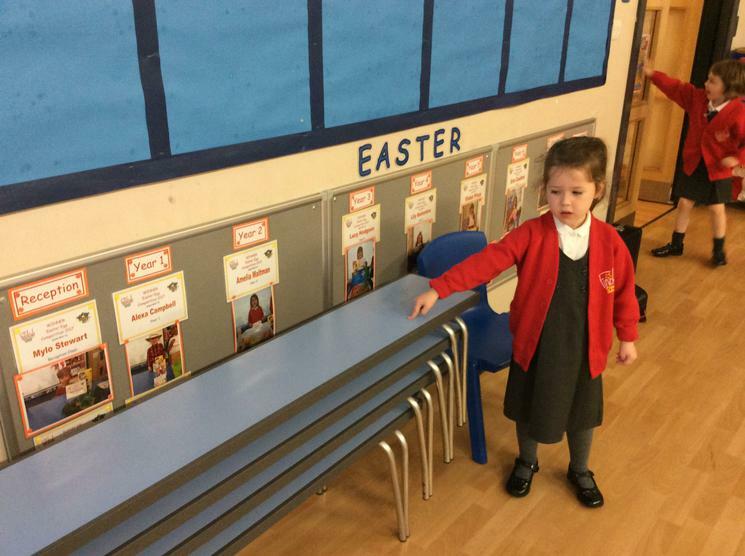 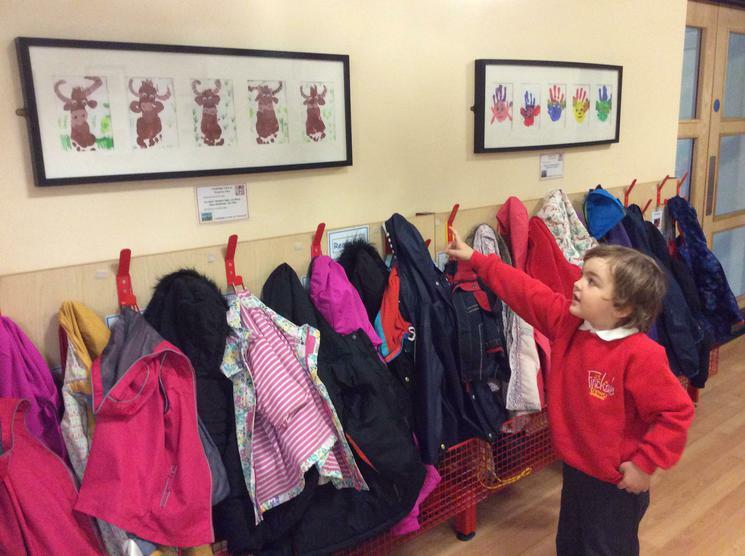 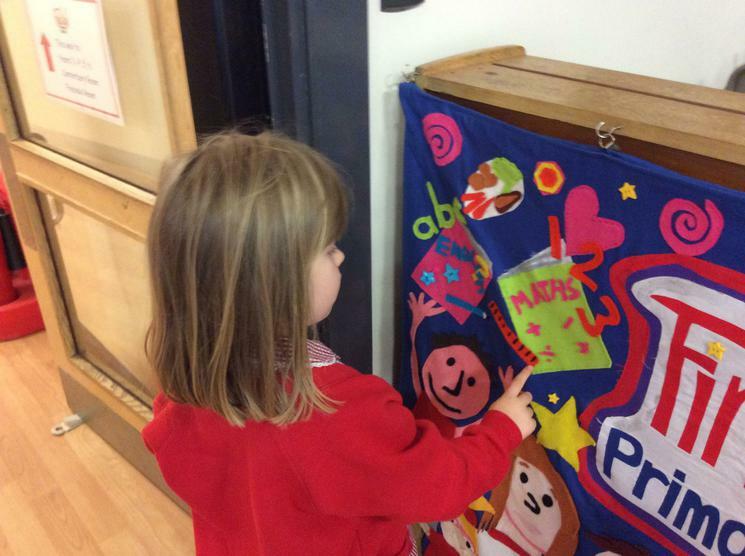 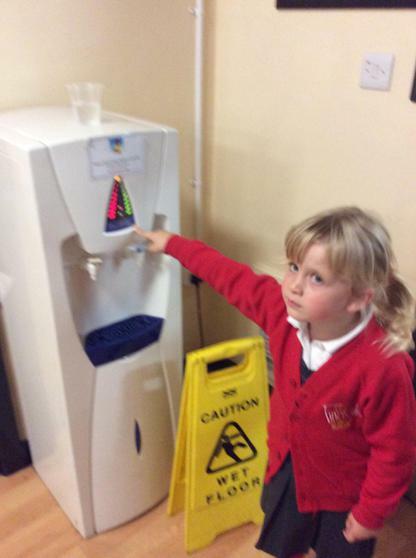 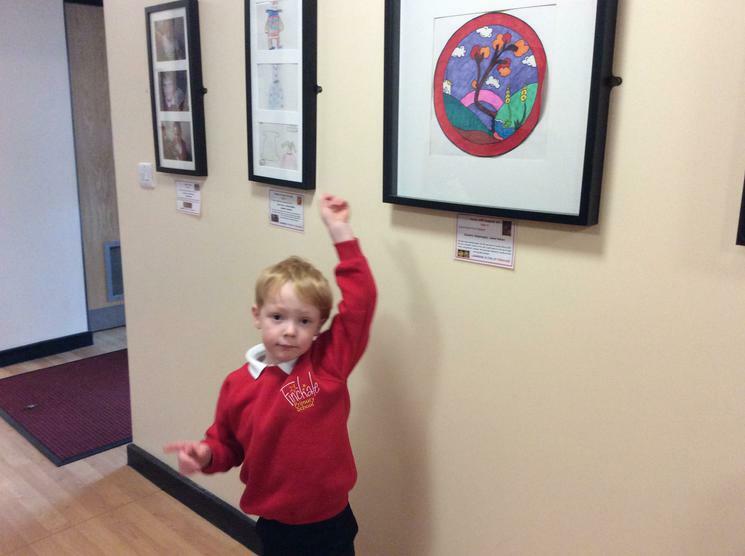 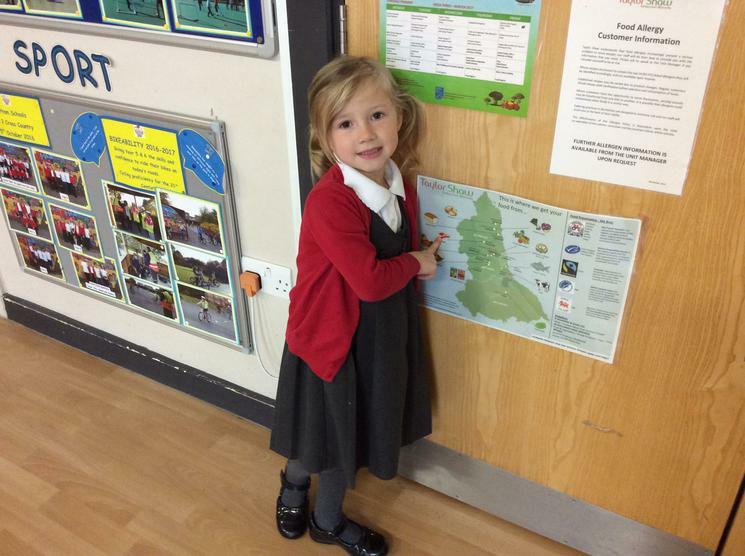 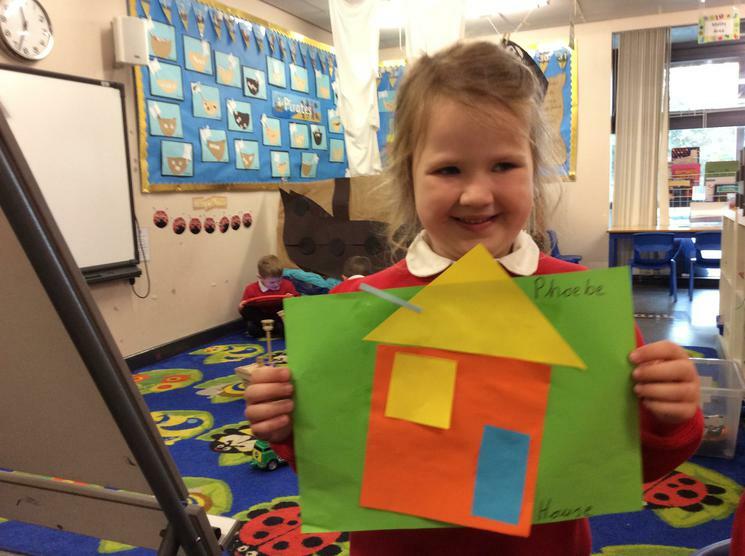 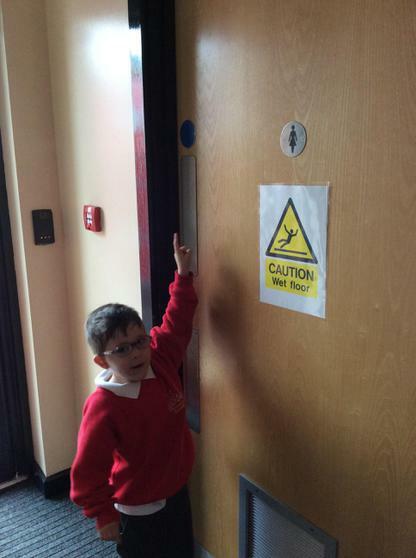 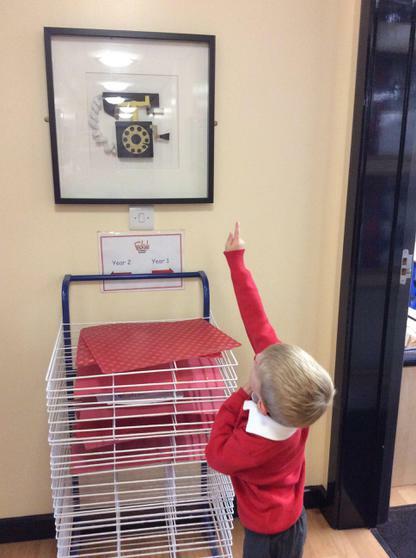 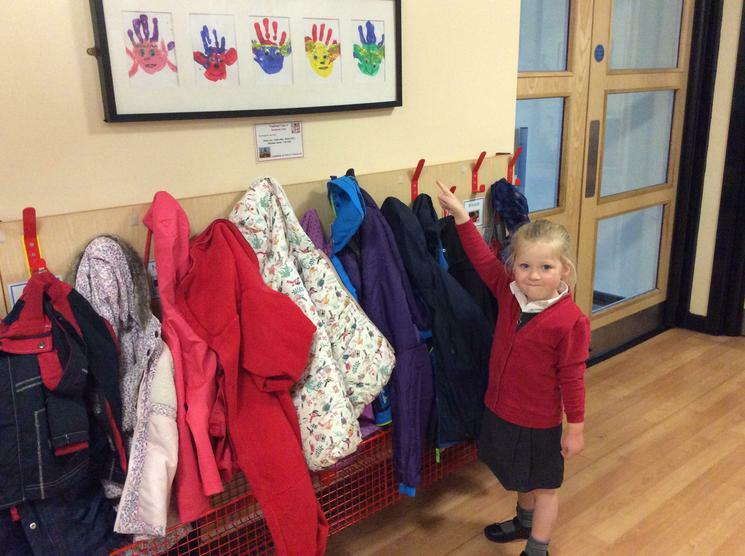 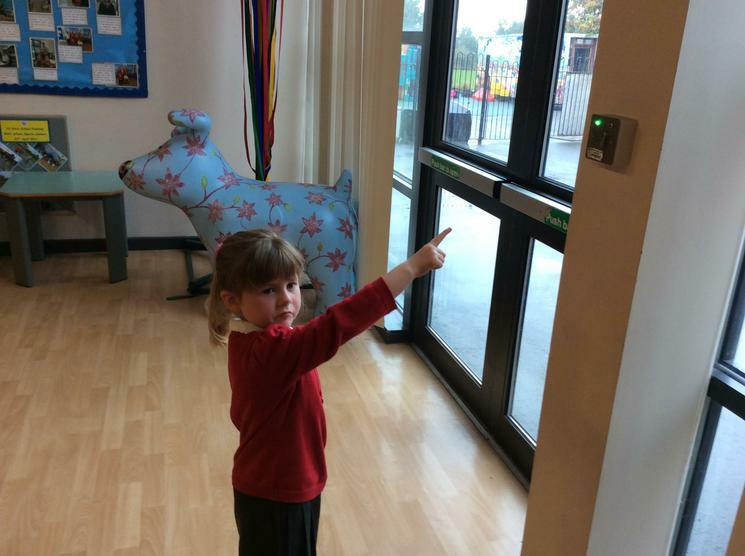 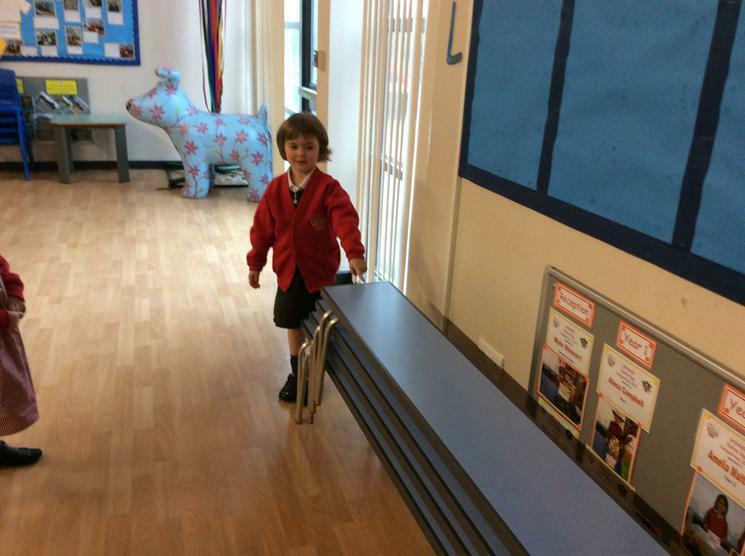 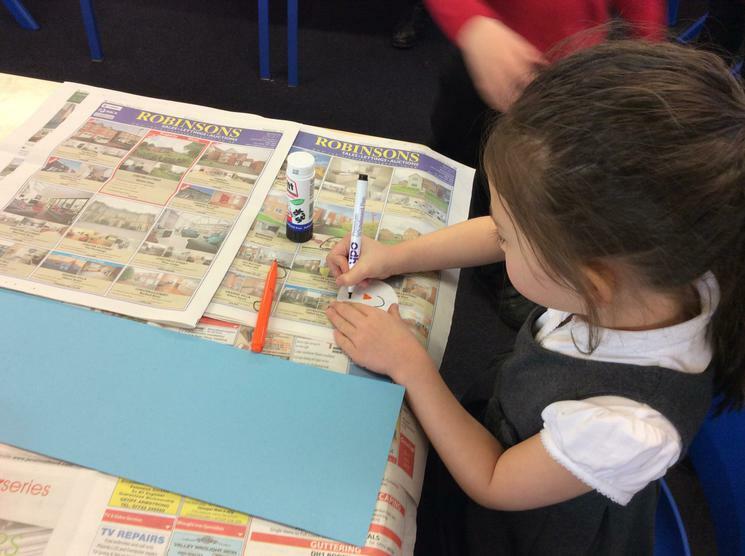 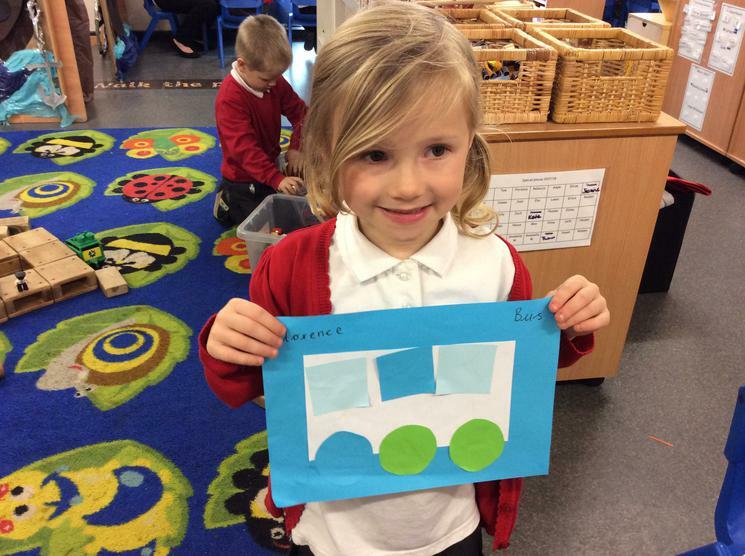 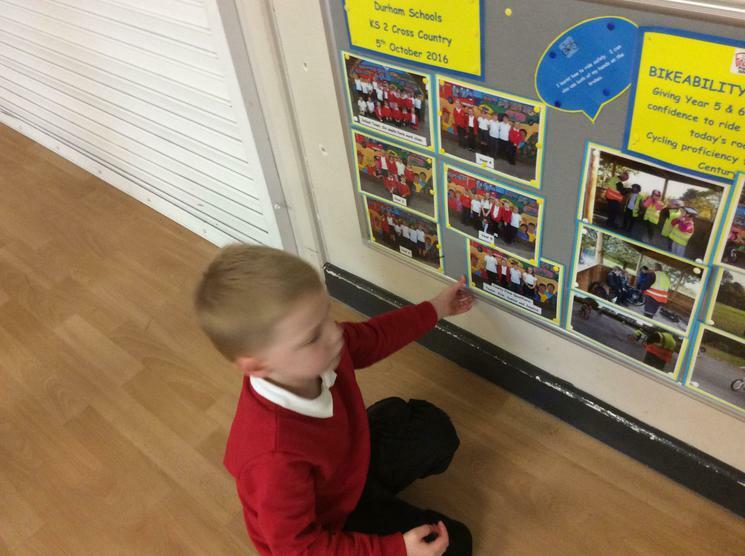 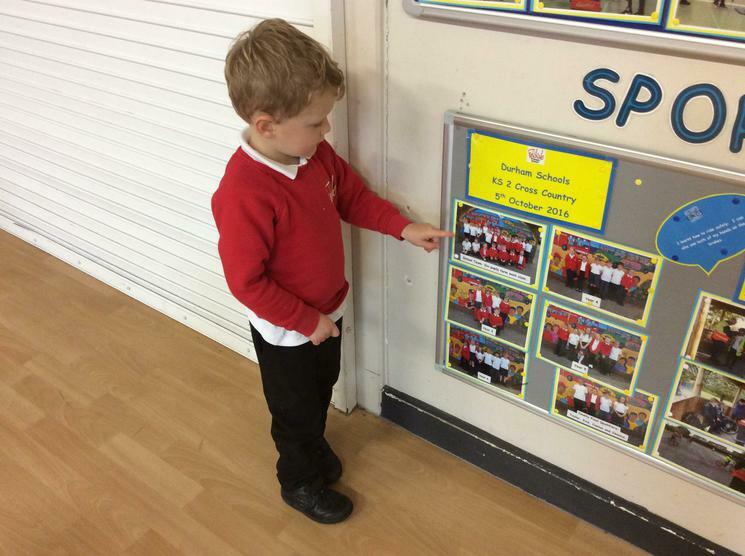 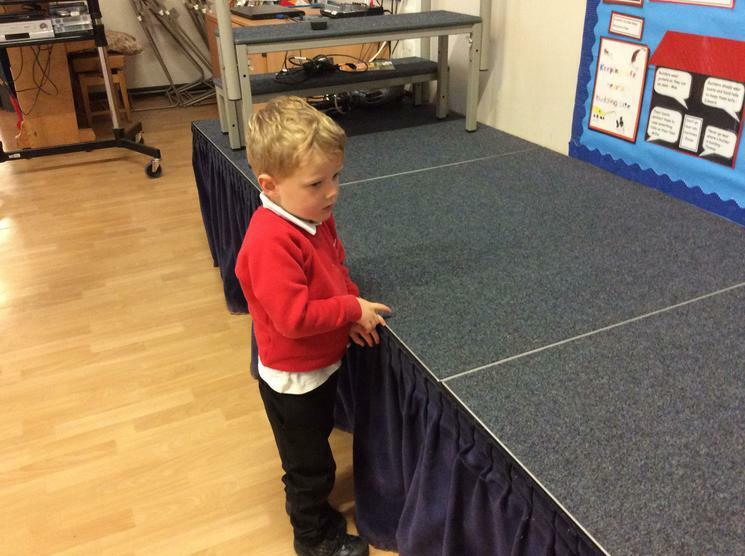 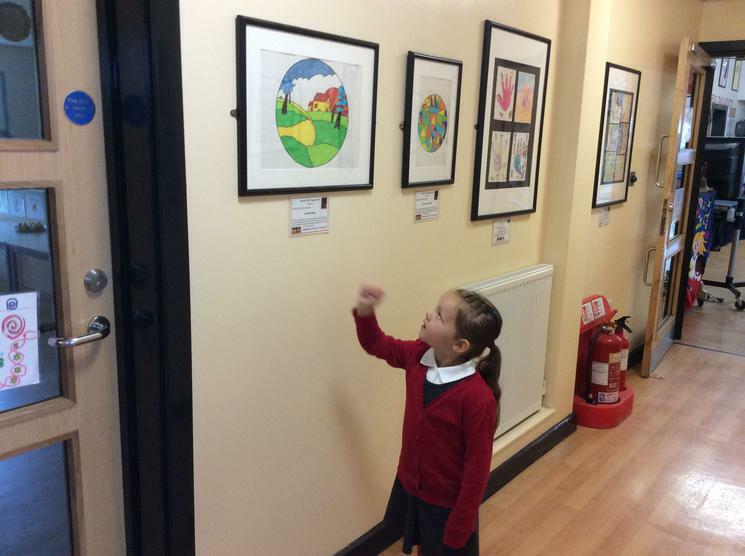 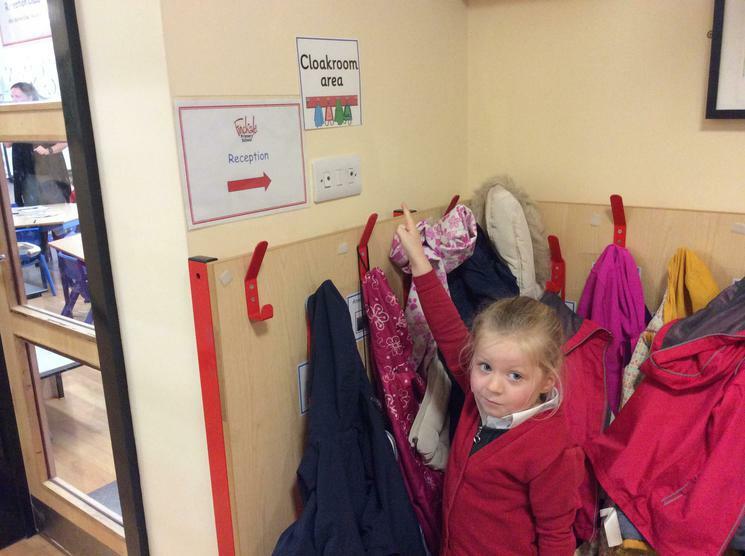 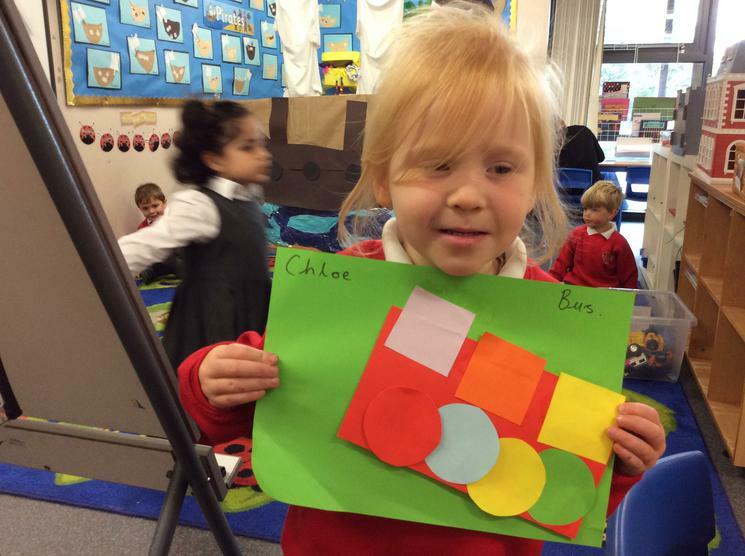 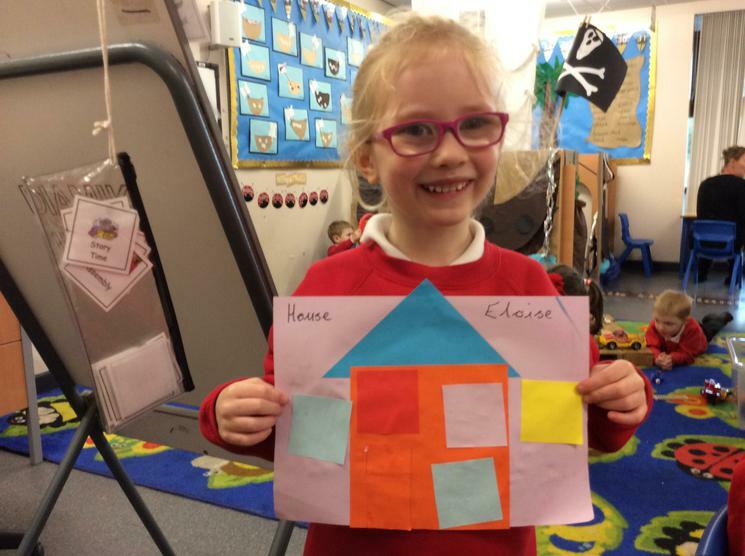 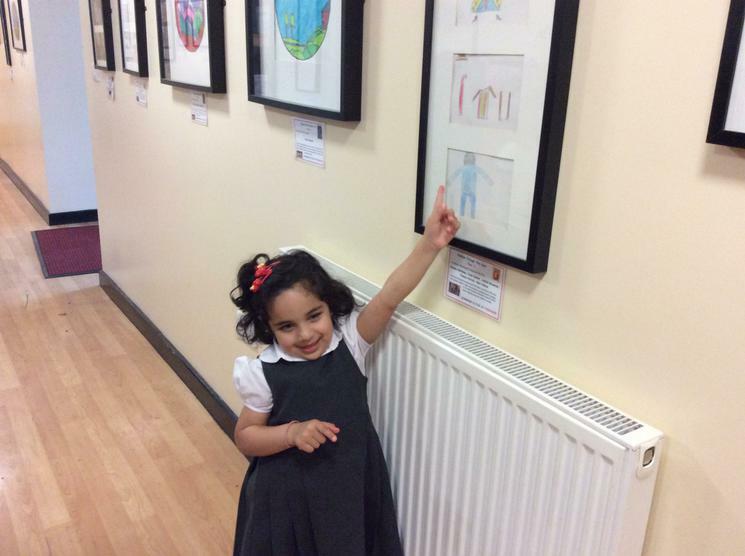 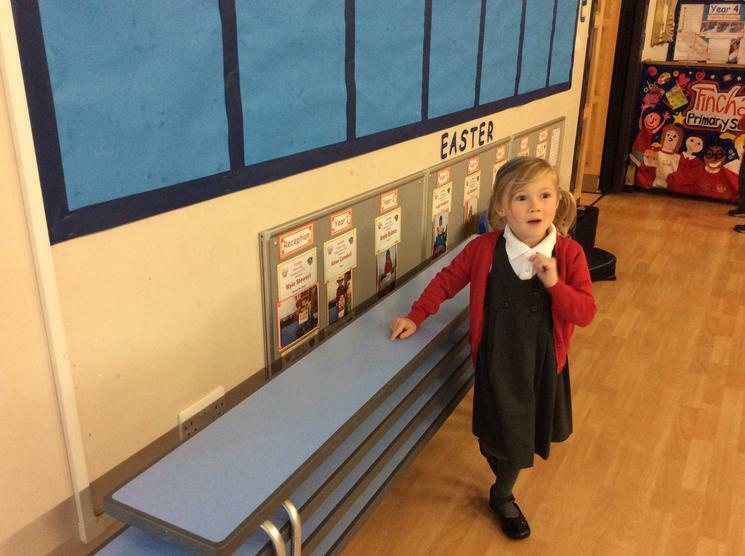 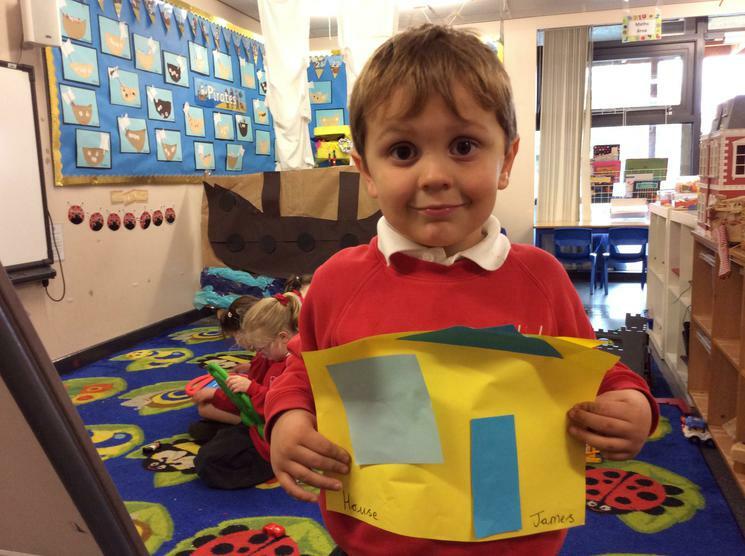 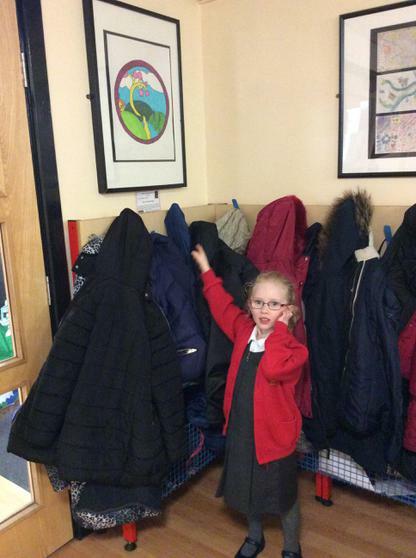 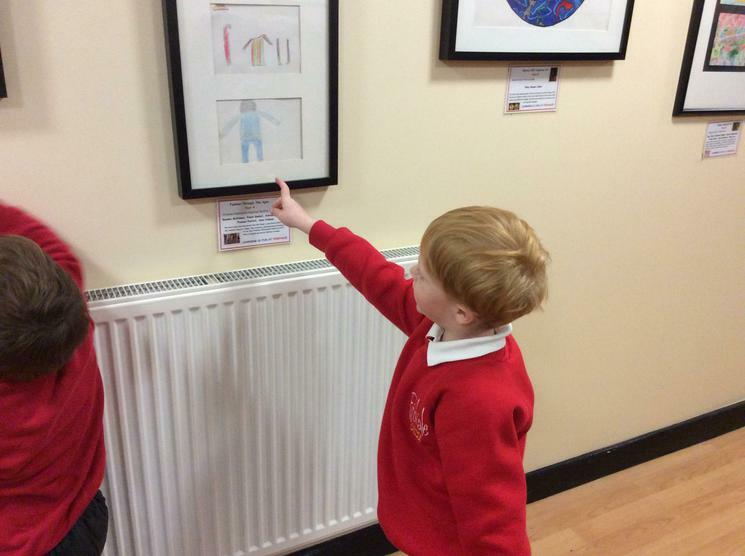 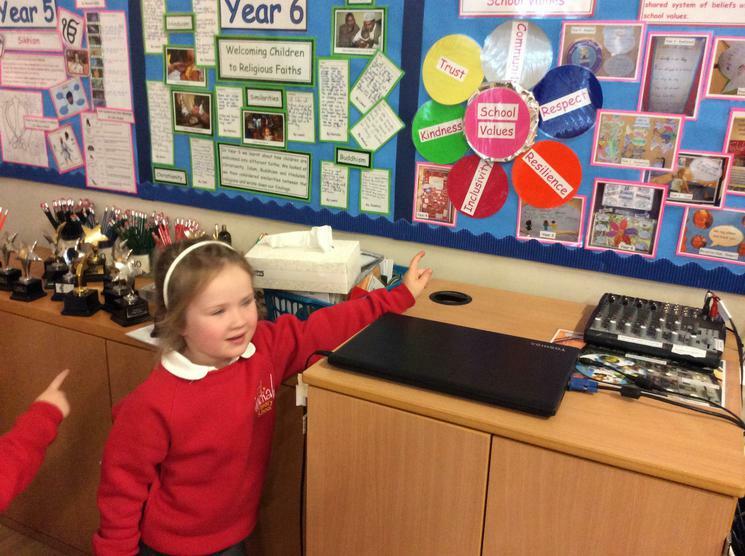 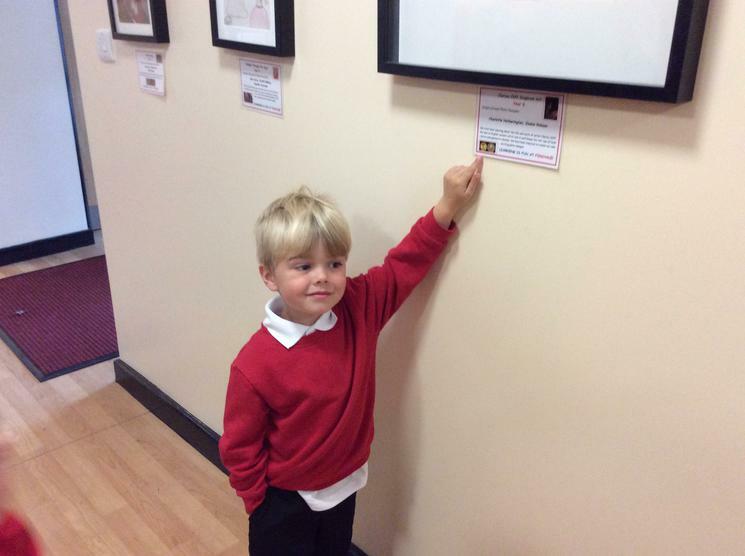 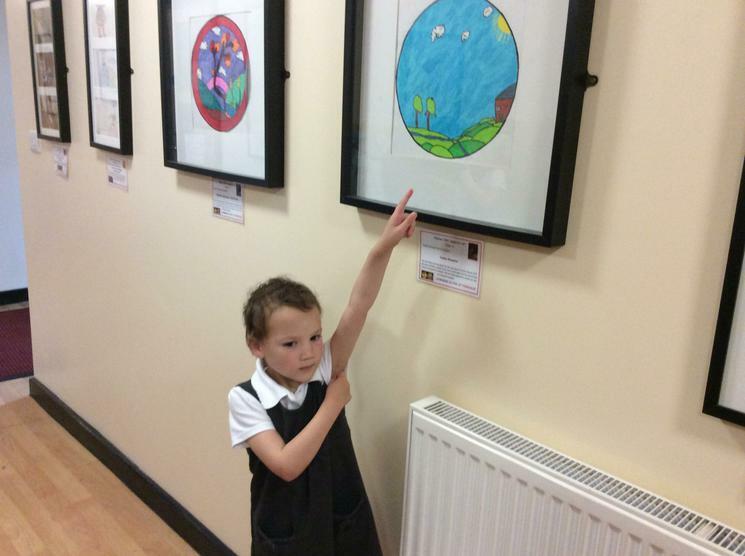 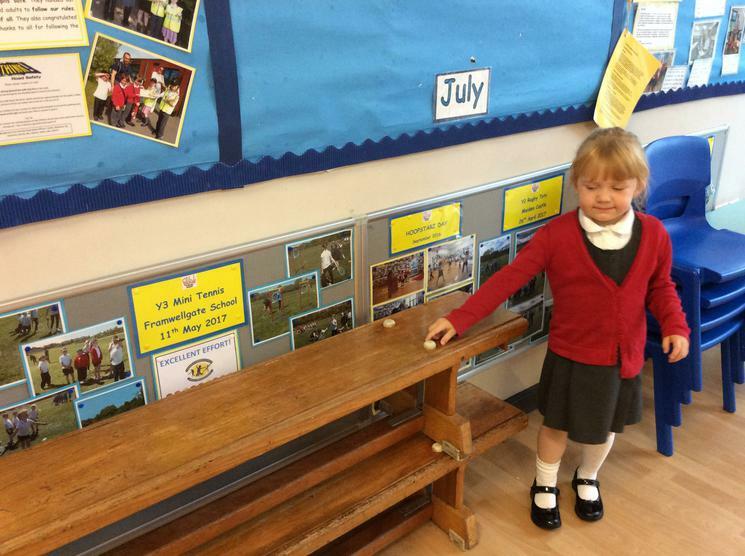 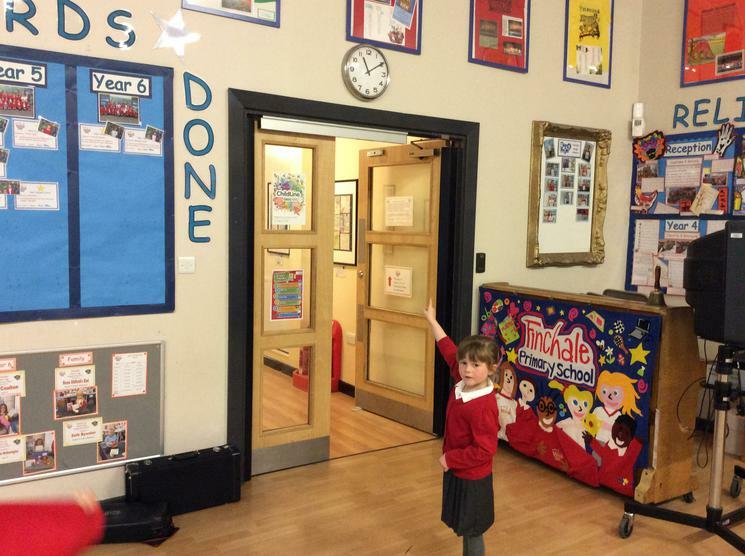 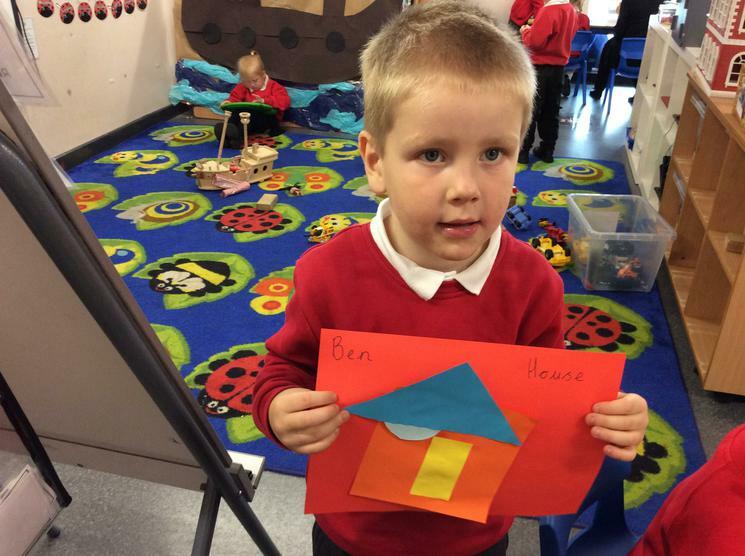 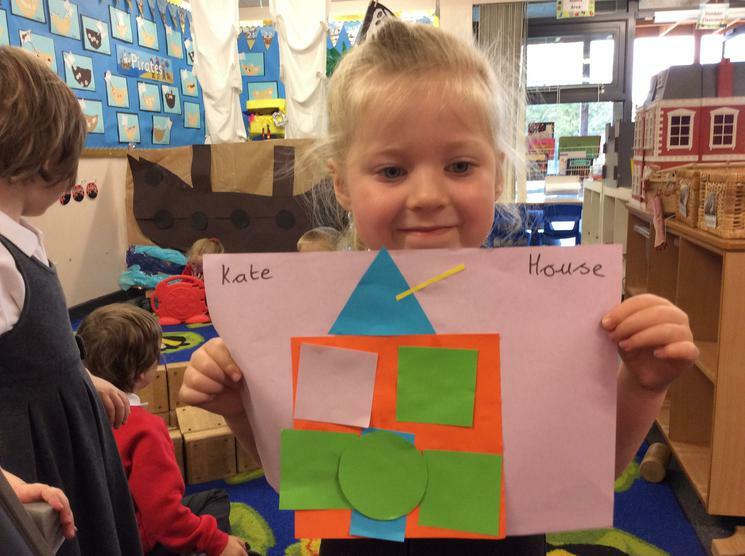 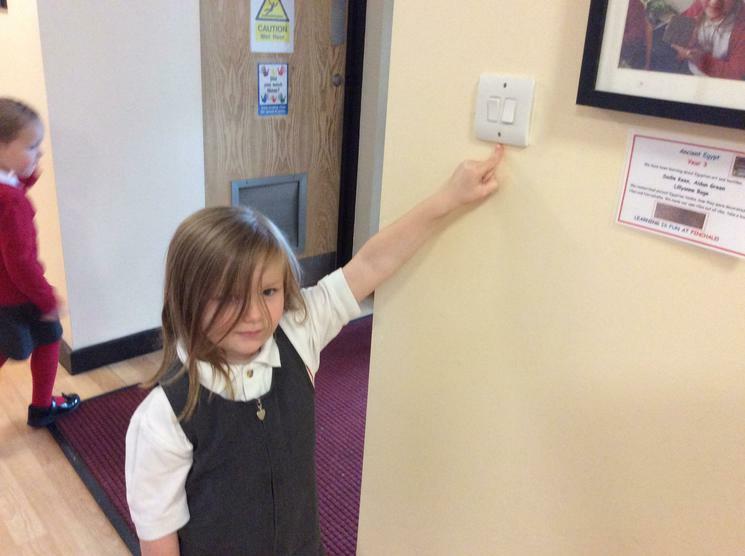 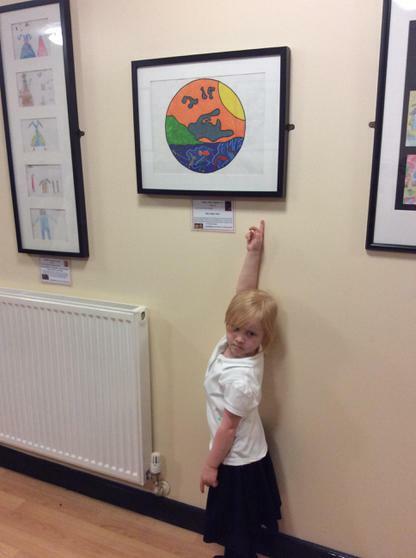 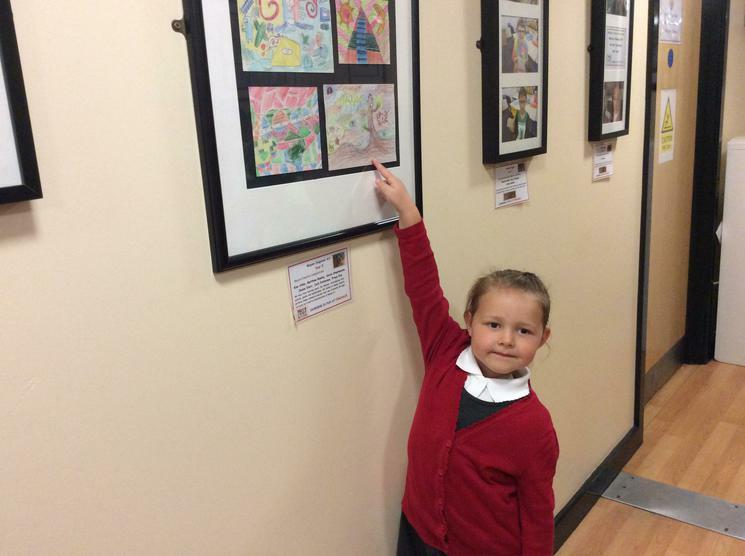 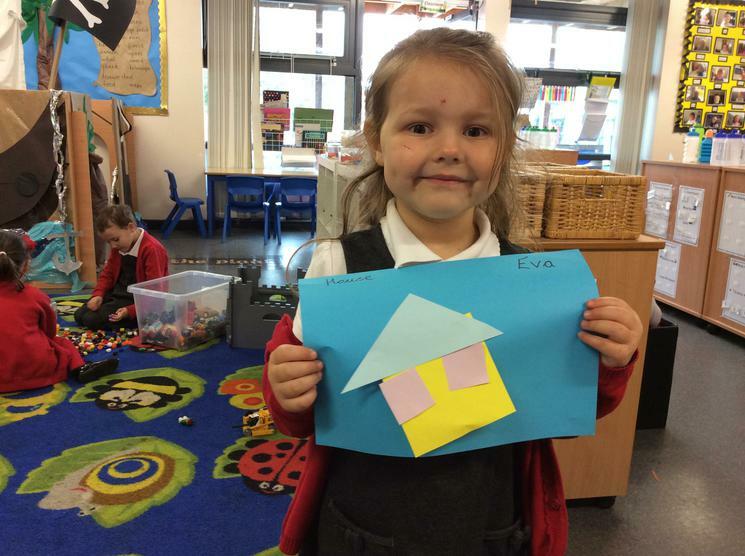 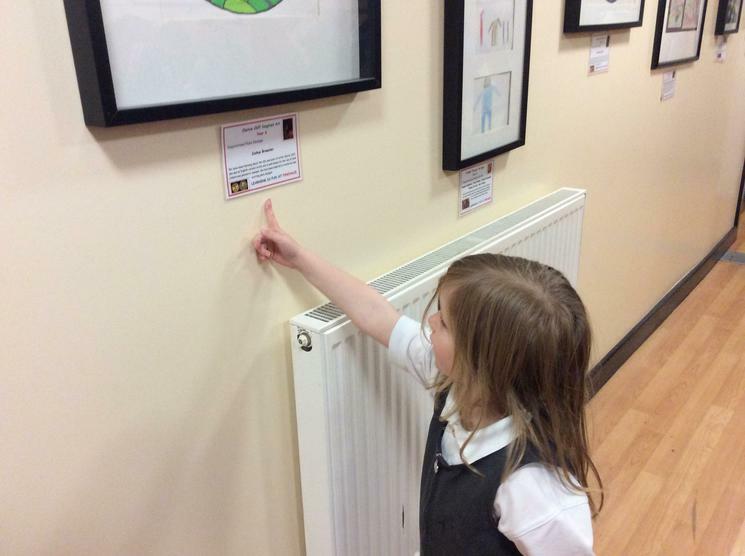 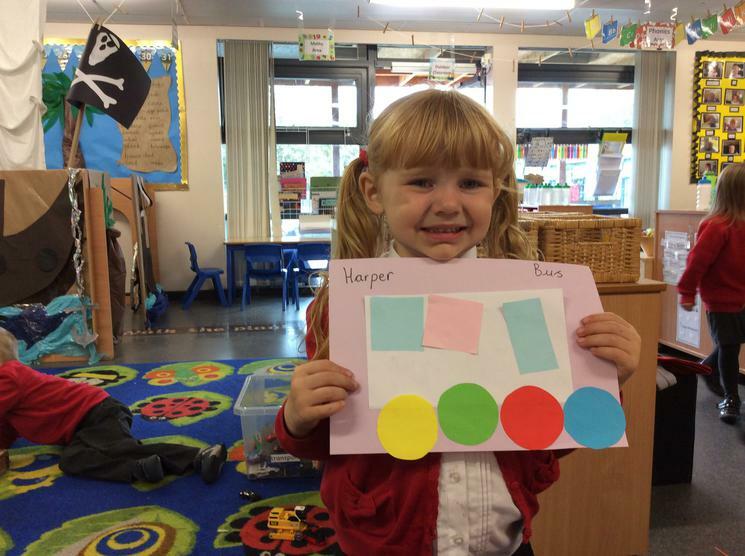 We took part in a shape hunt around school. 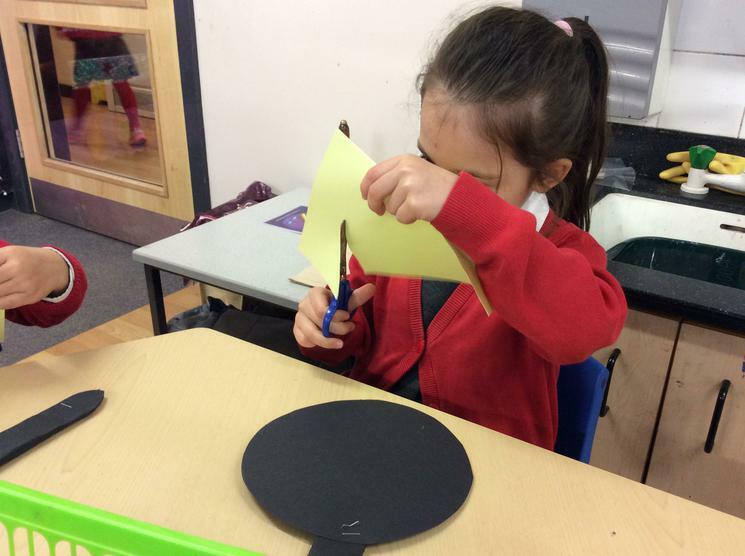 We looked for circles, triangles, squares and rectangles. 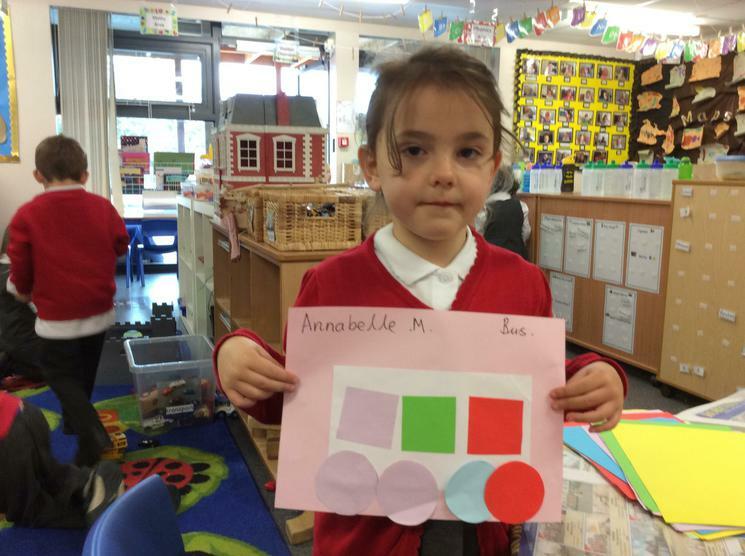 Can you see which shape we found the most of? 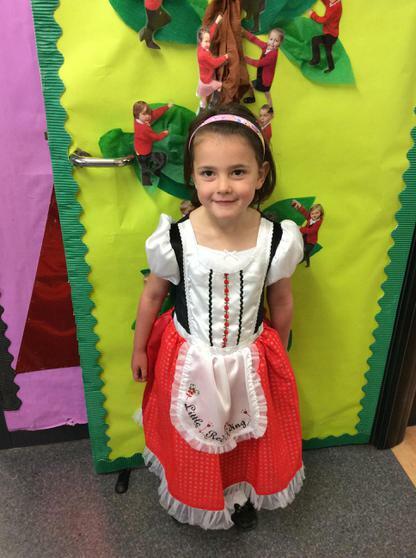 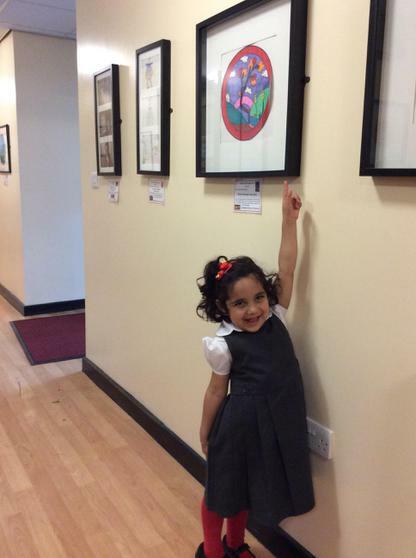 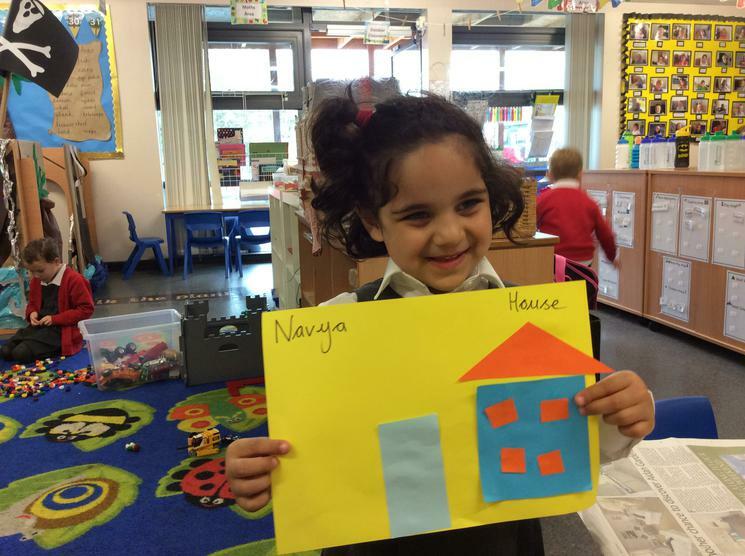 We celebrated European Day of Languages. 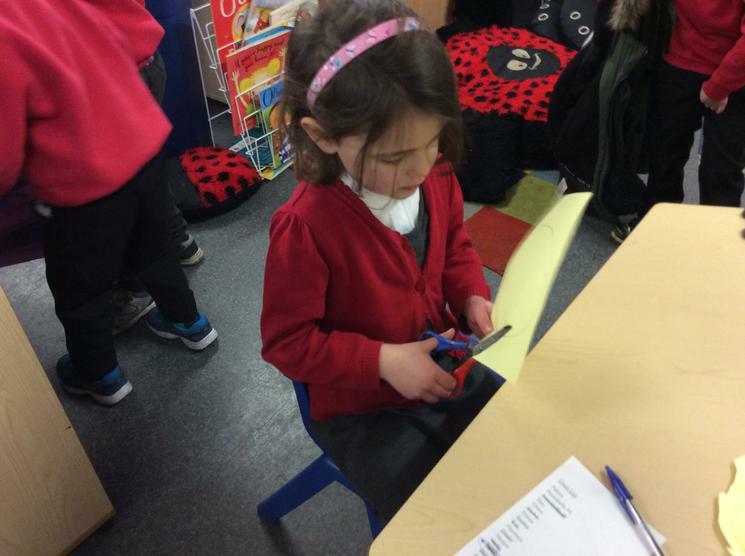 Mrs Hamill taught us some French greetings and a French song. 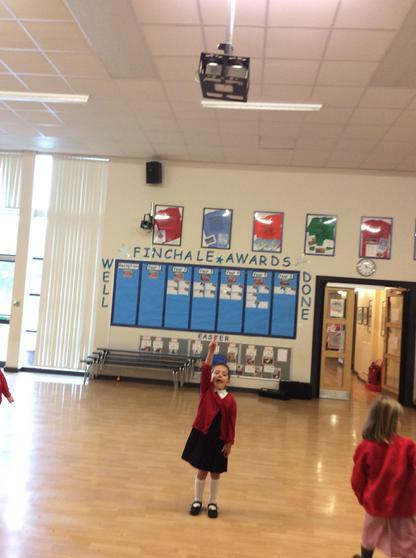 We performed 'Frere Jacques' in front of the whole school. 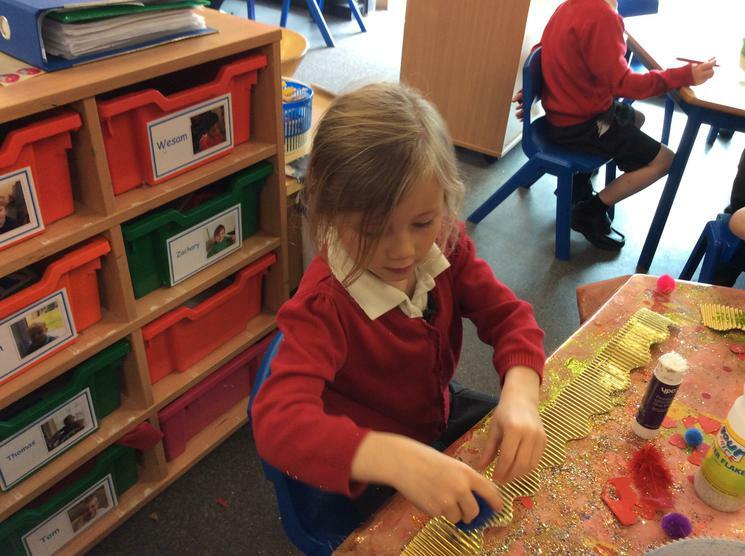 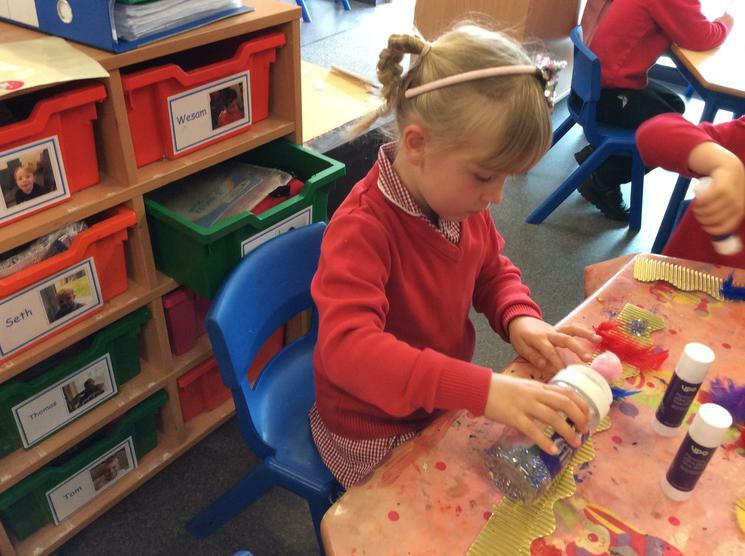 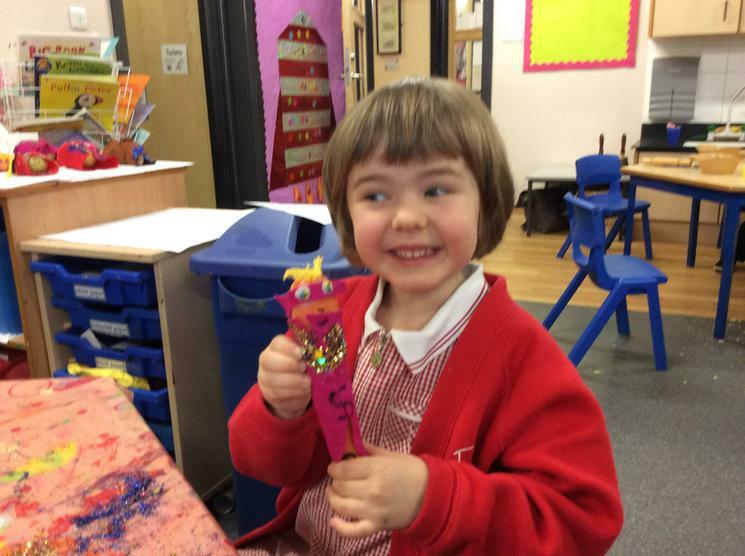 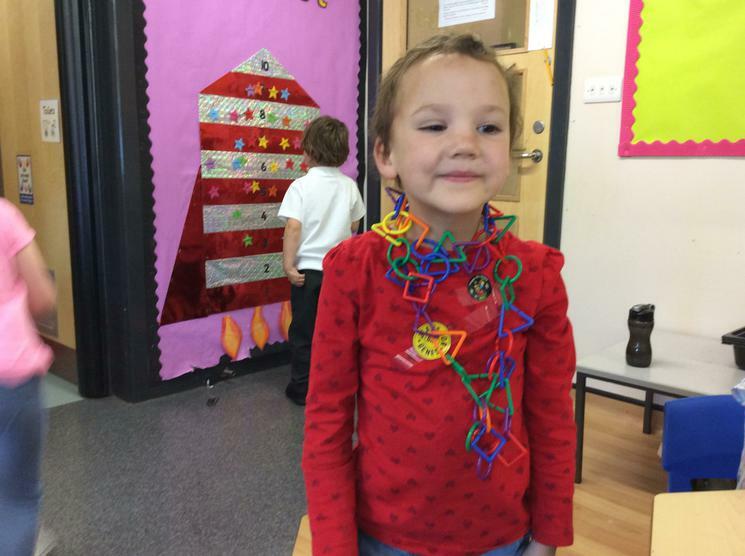 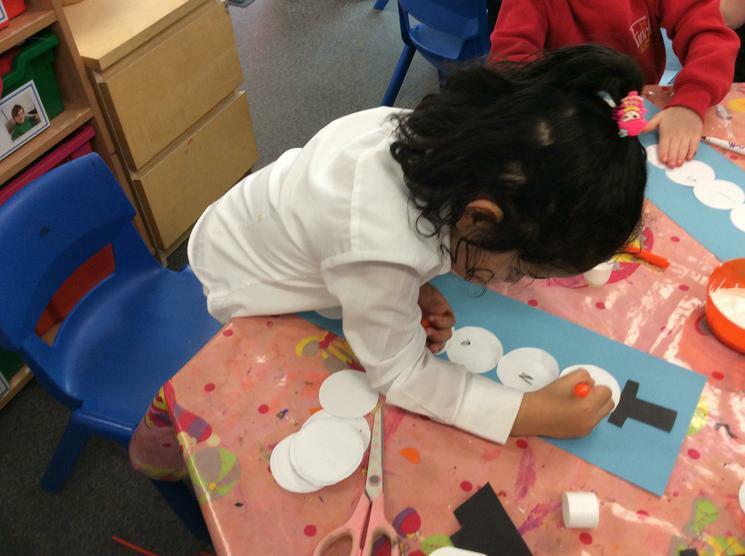 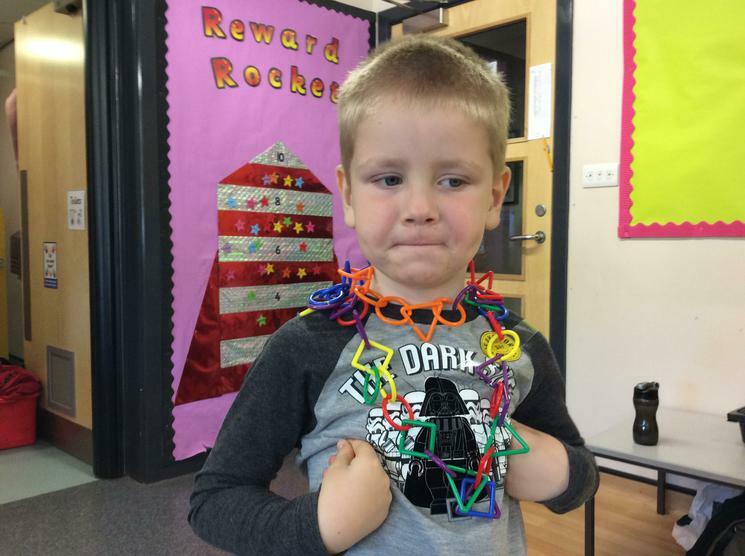 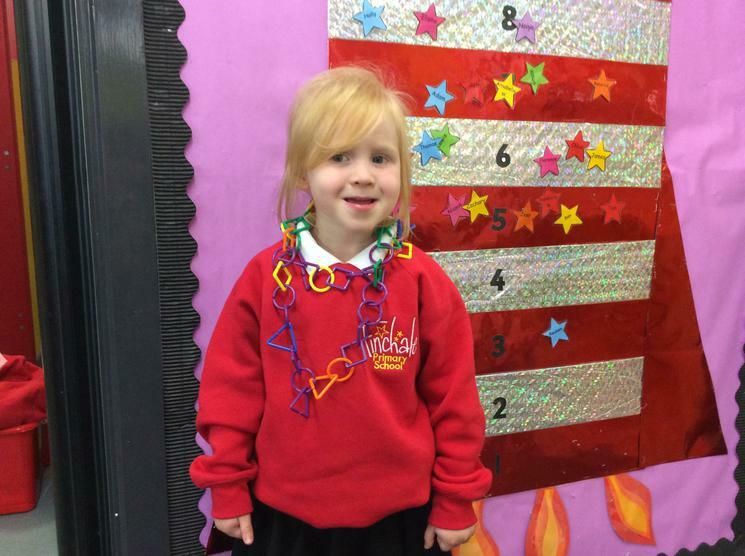 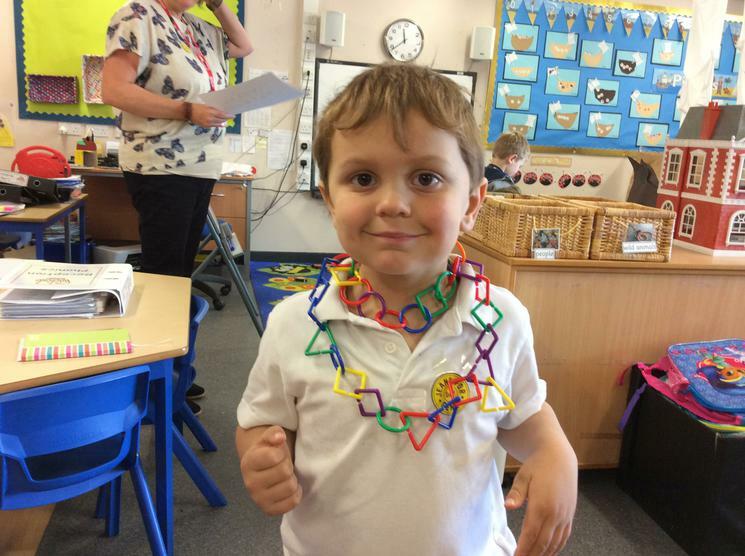 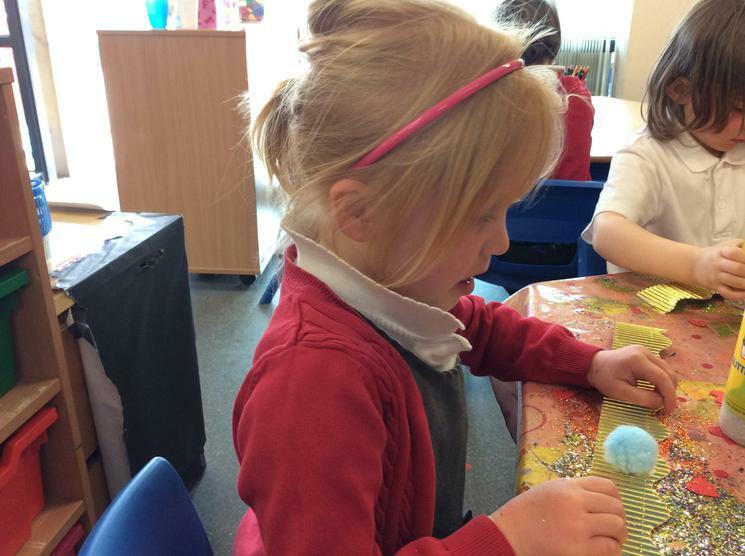 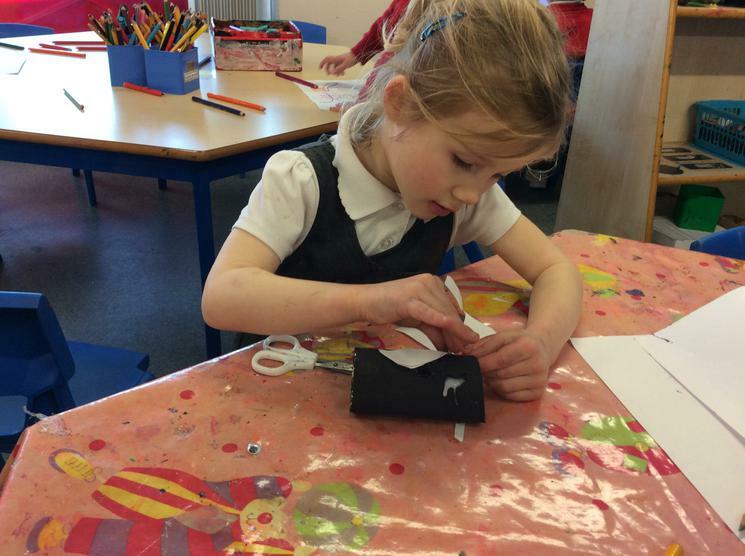 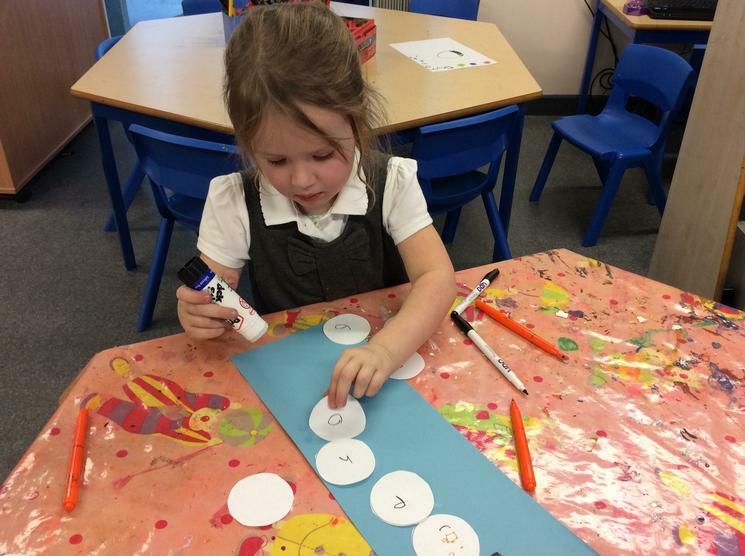 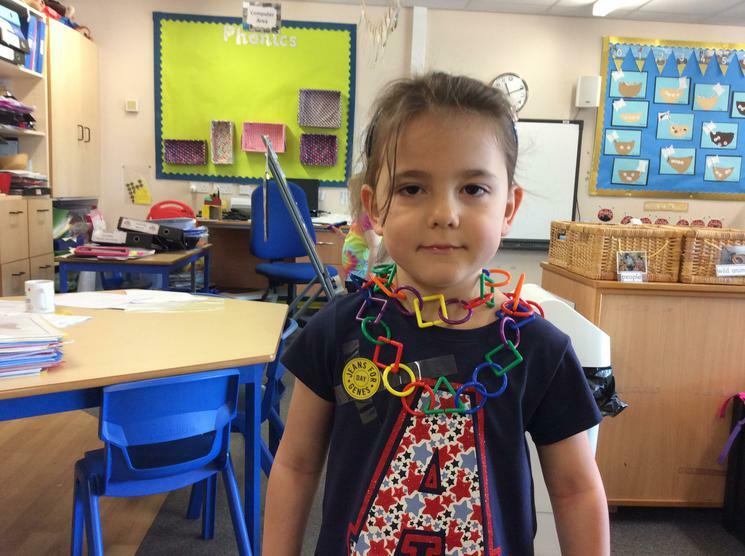 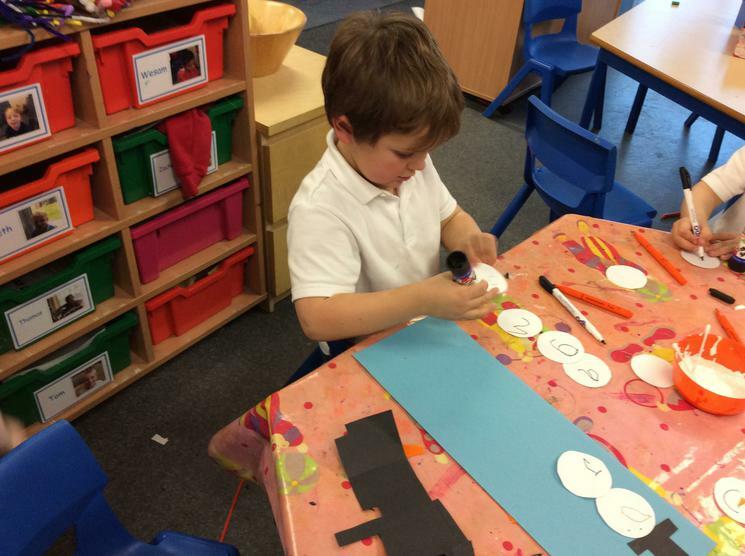 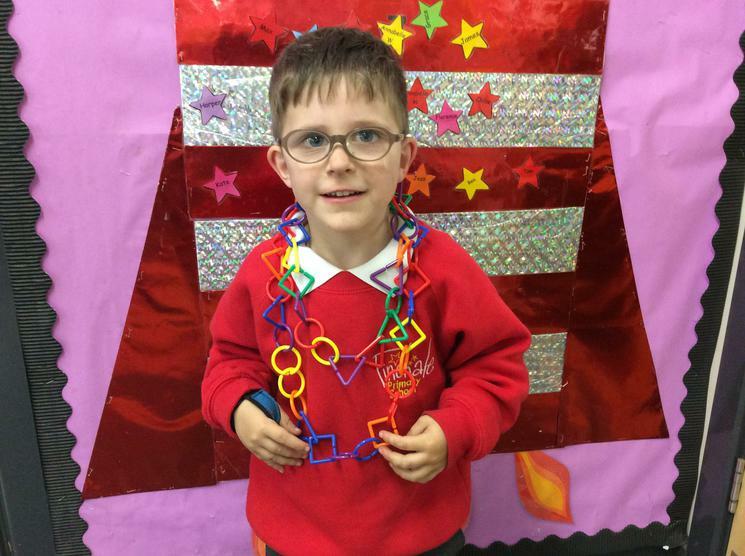 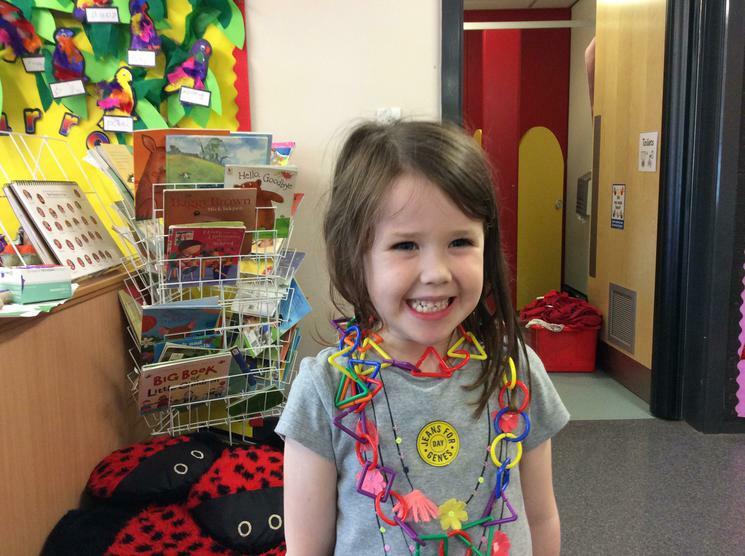 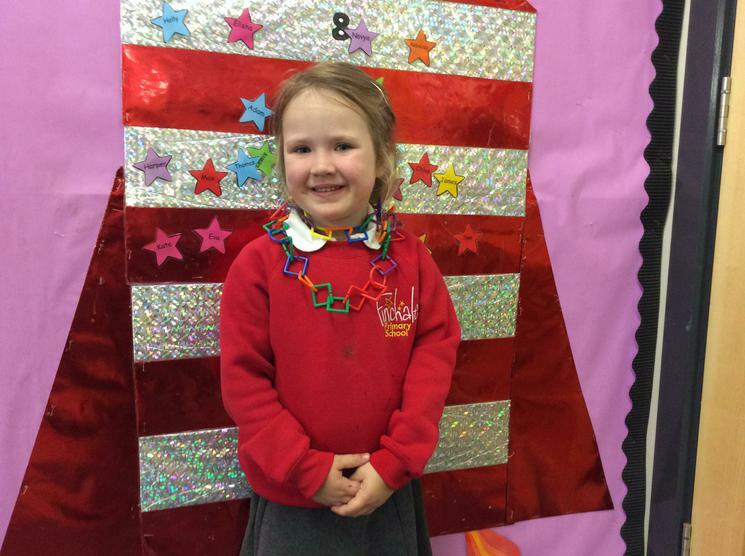 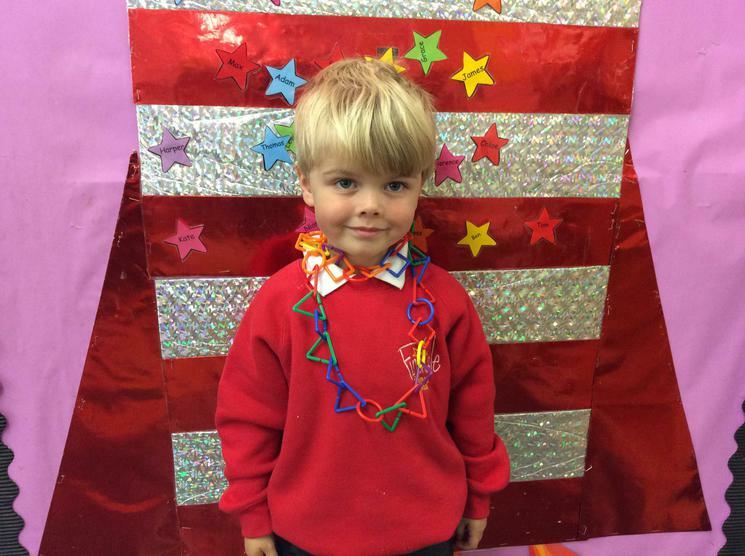 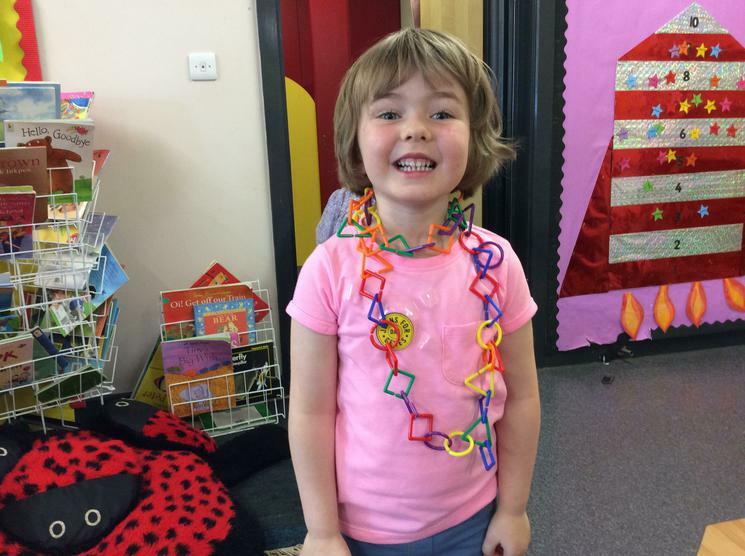 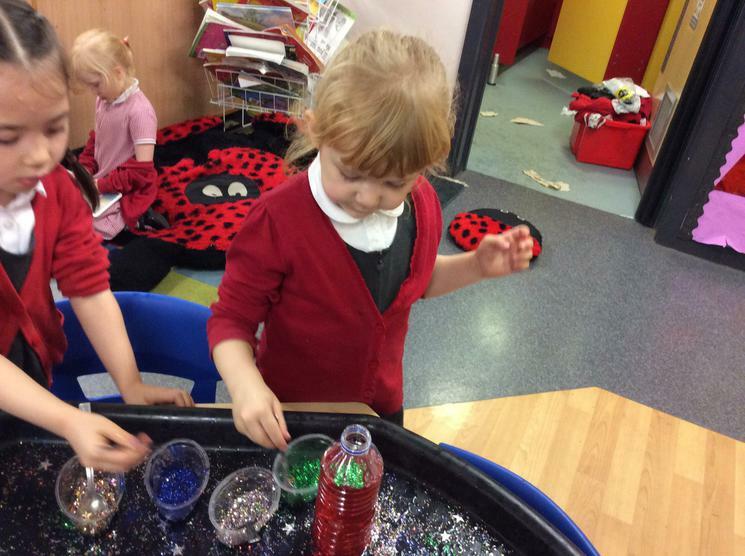 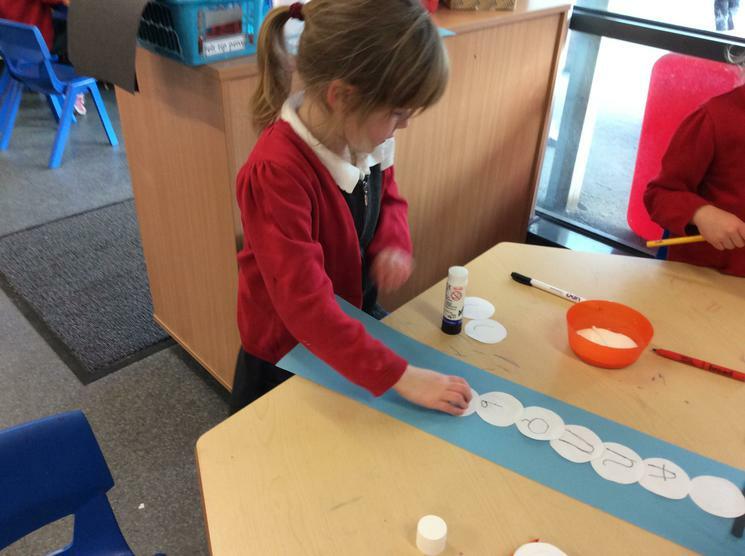 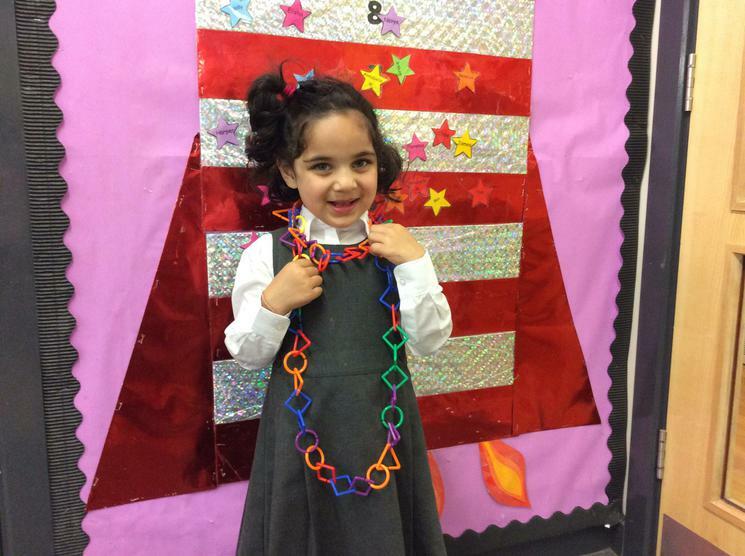 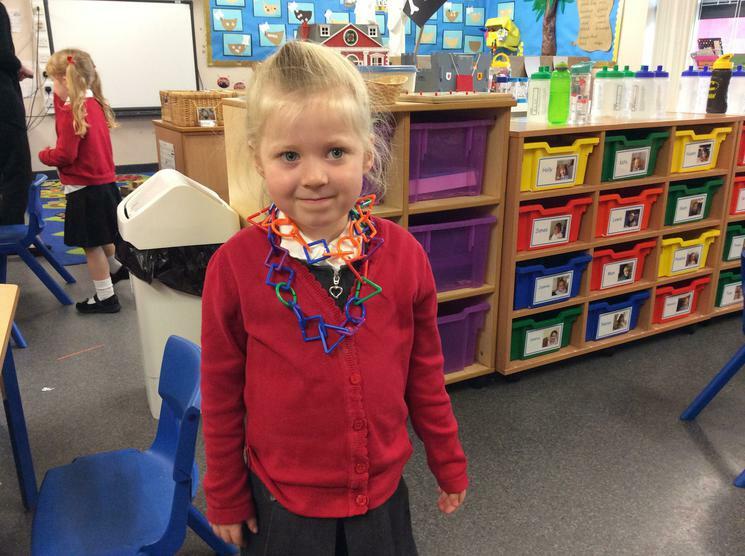 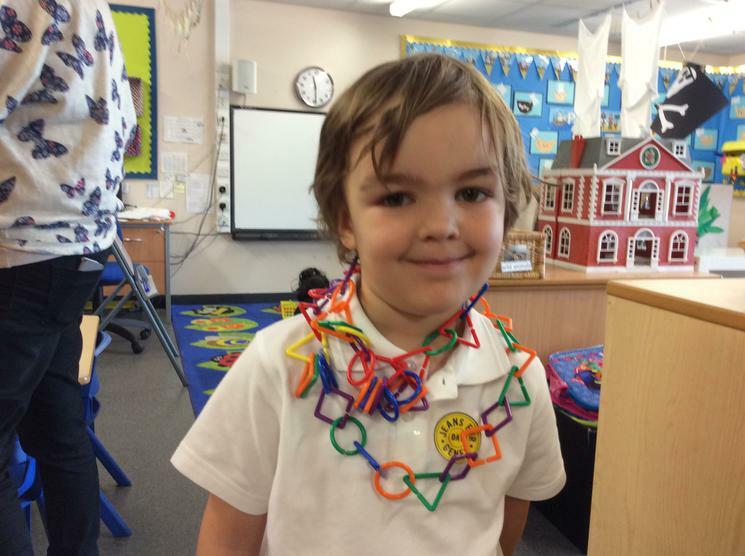 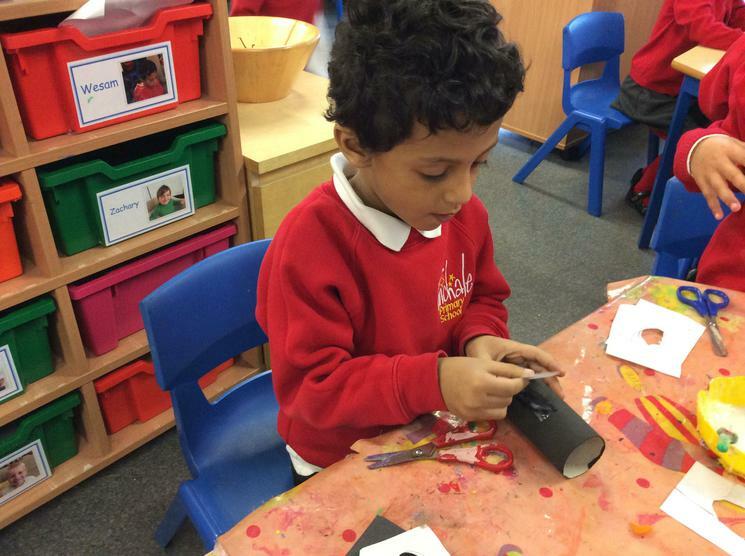 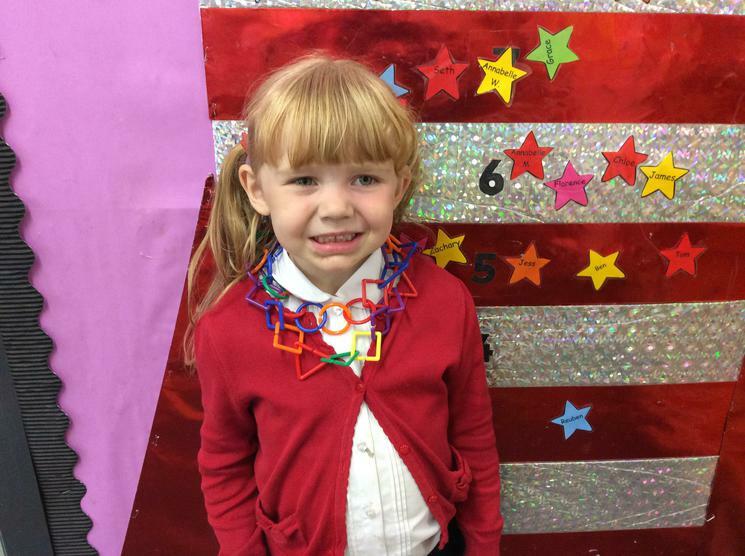 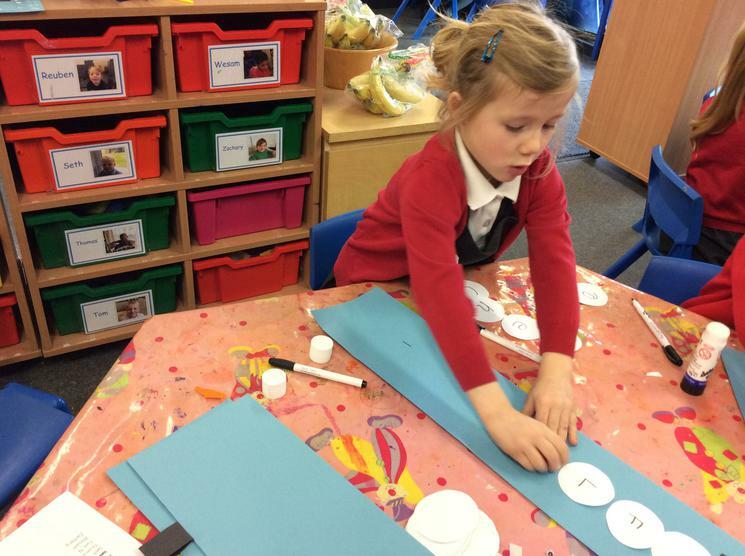 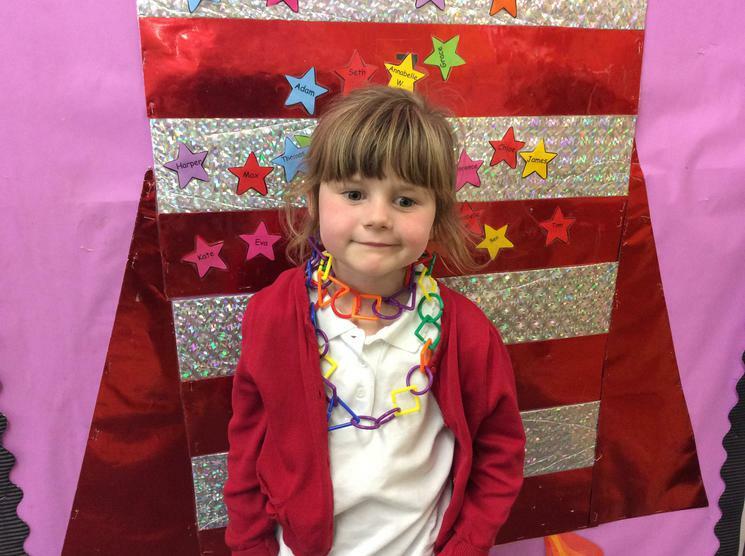 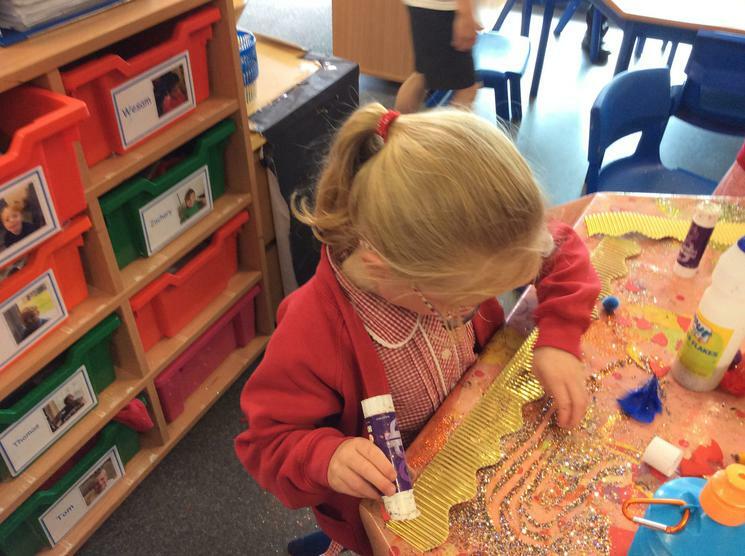 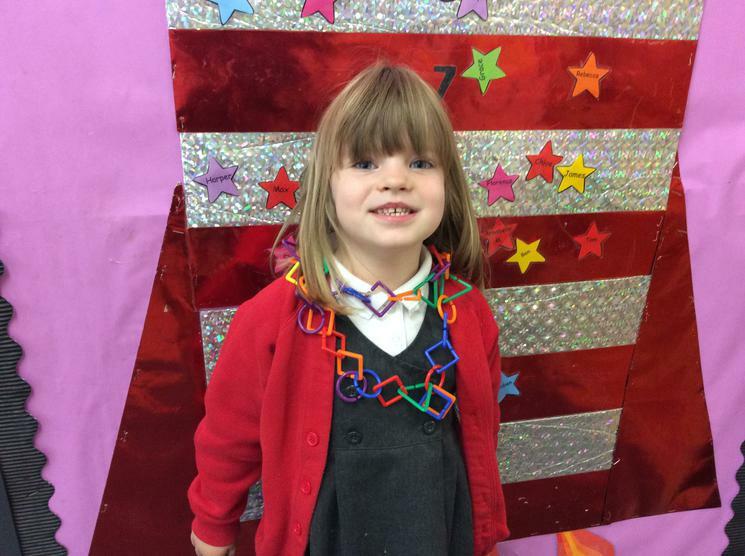 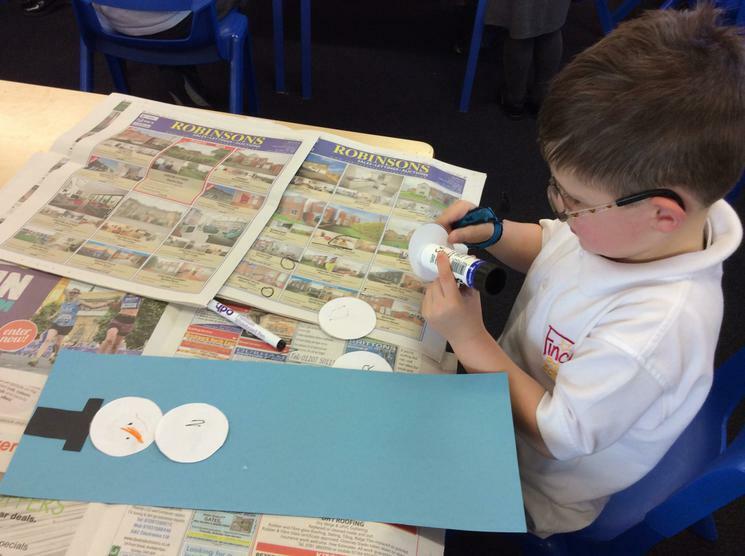 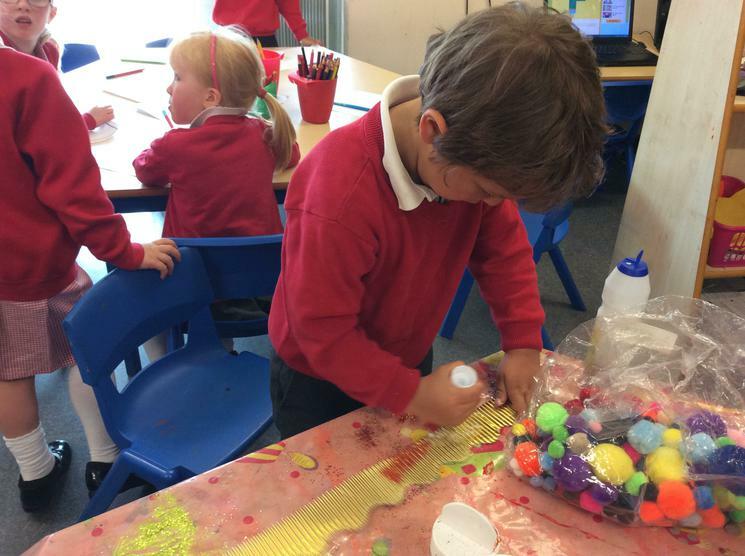 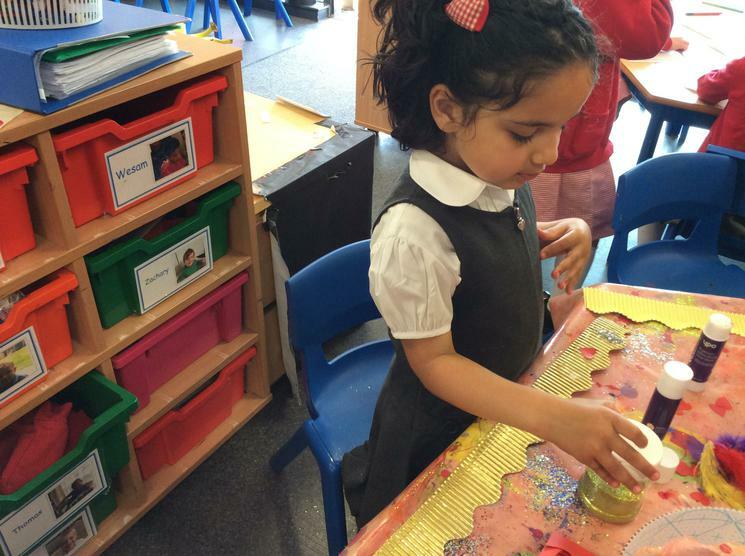 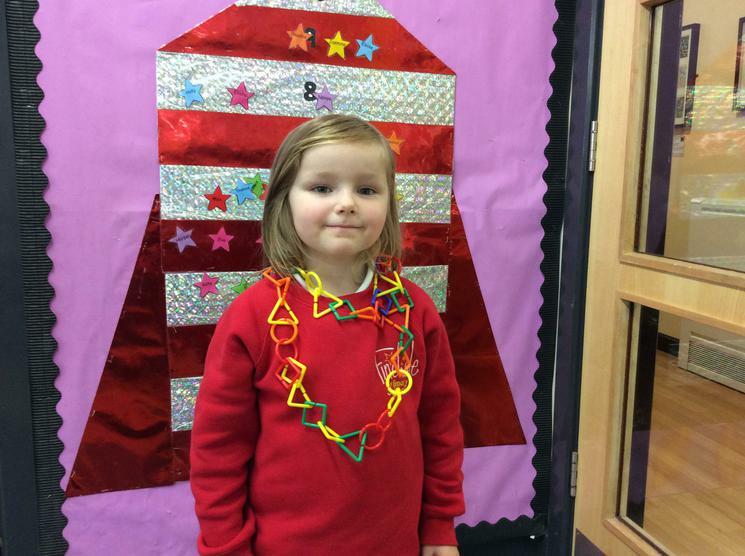 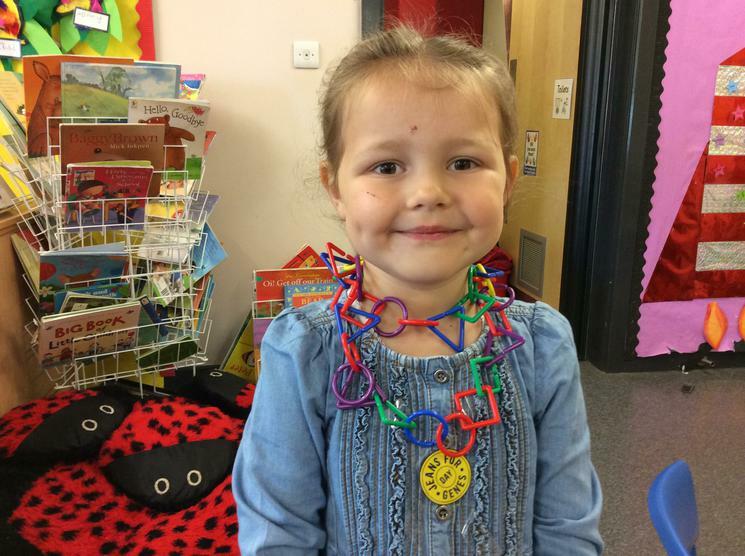 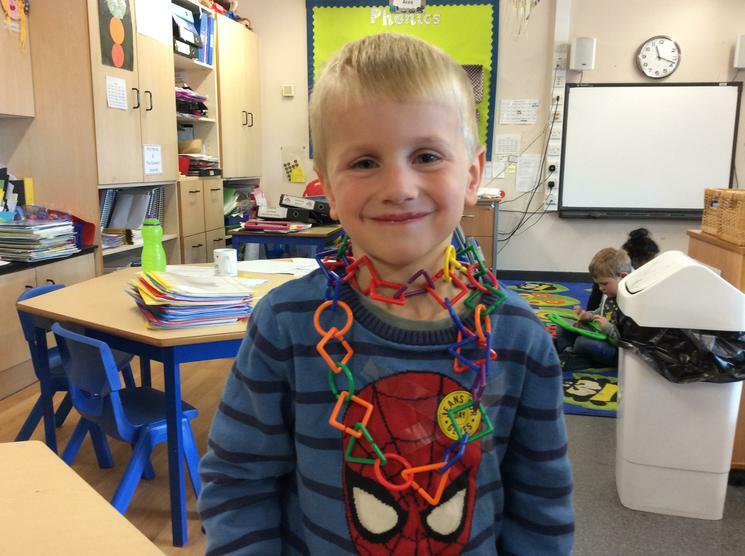 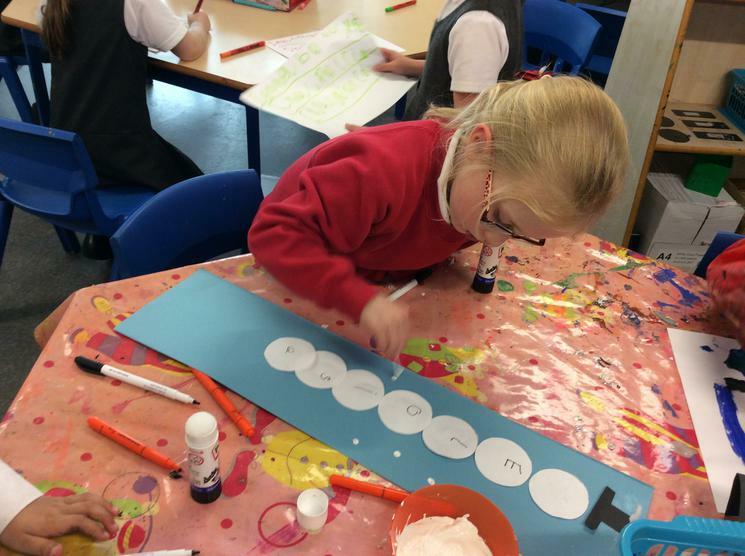 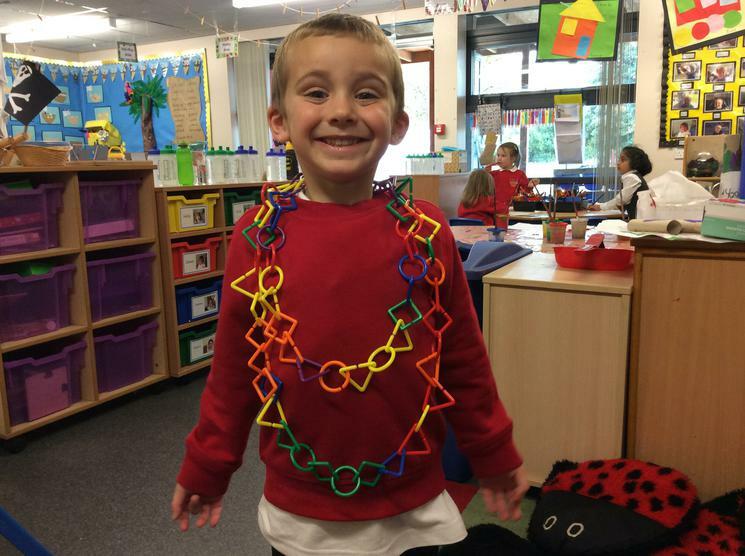 When learning about 'long' and 'short' we made necklaces for the treasure chest. 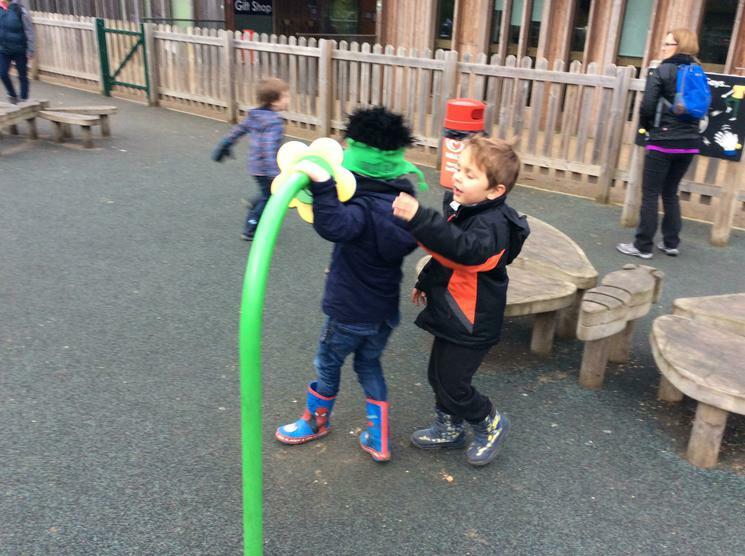 Who made the longest?